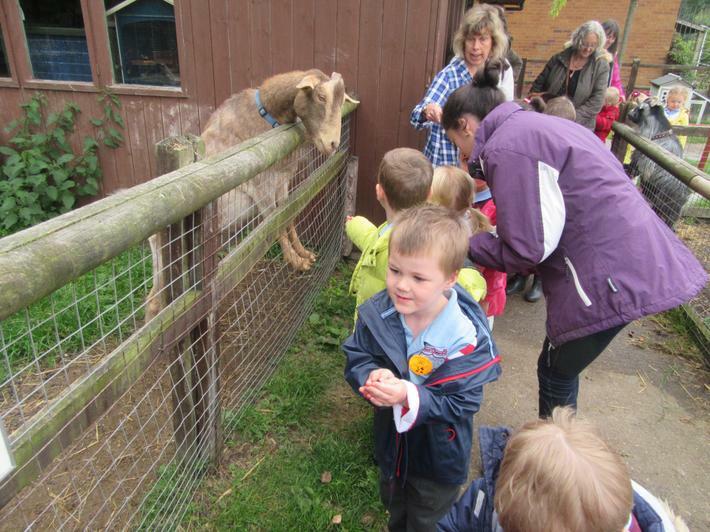 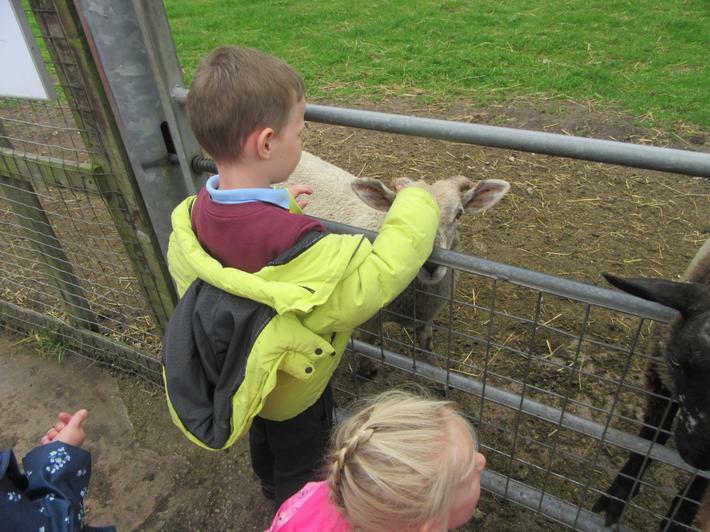 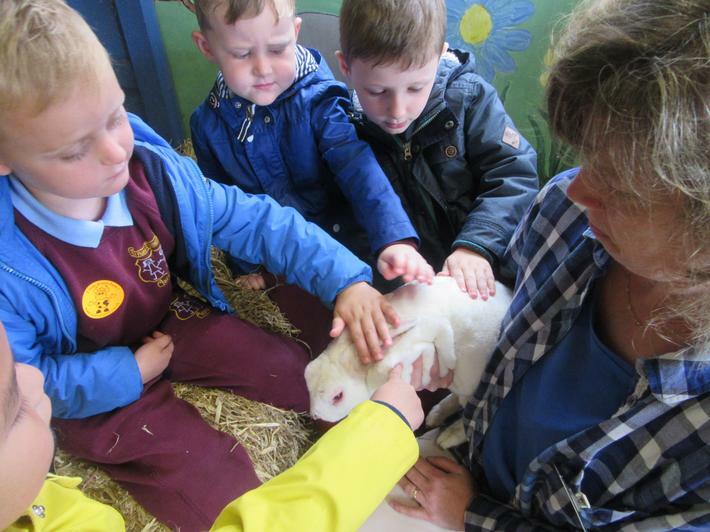 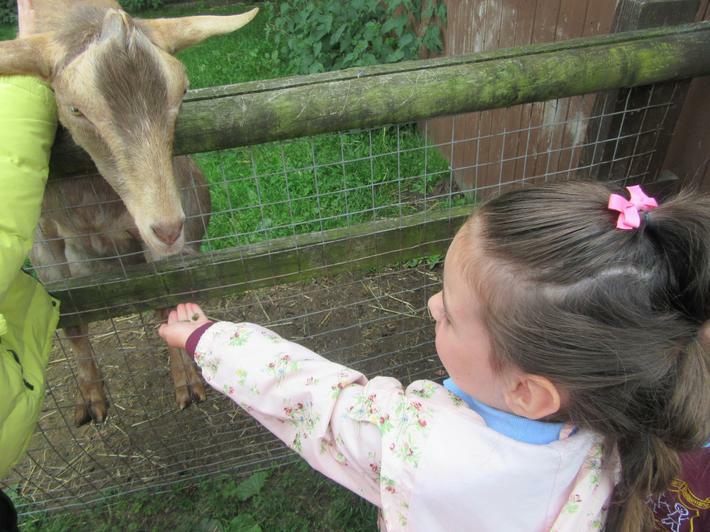 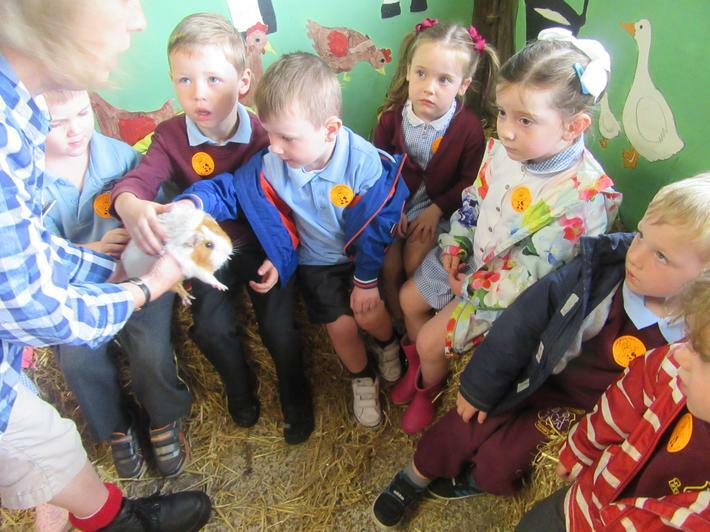 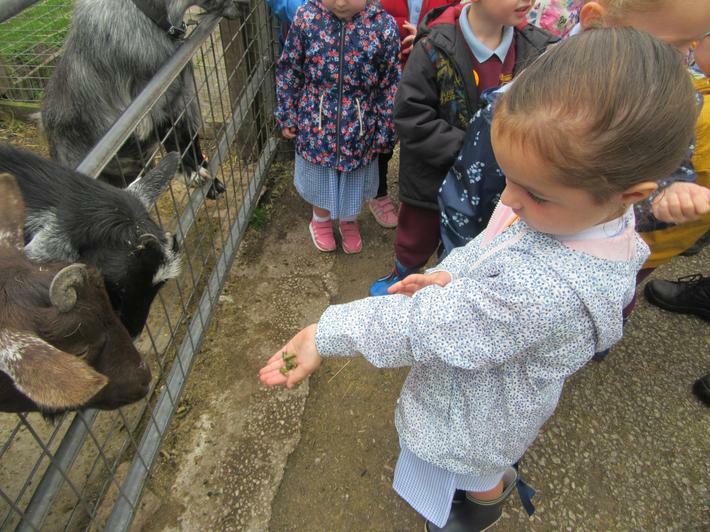 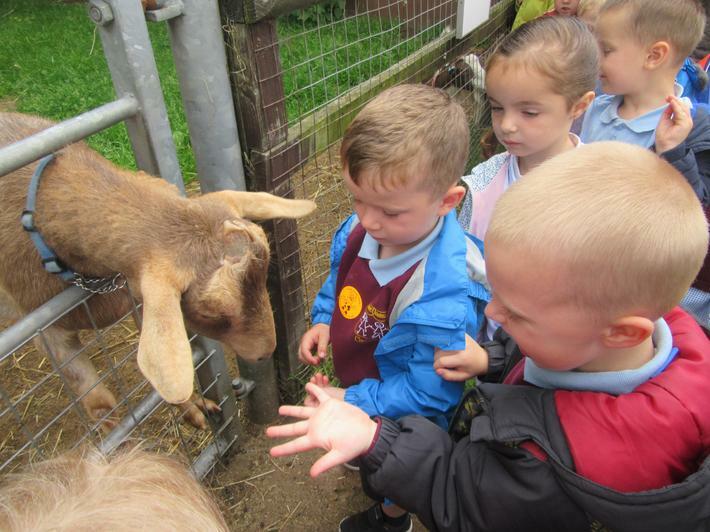 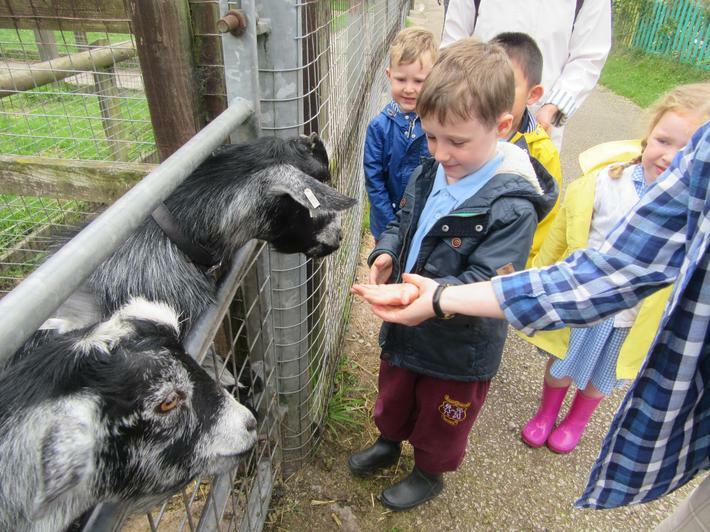 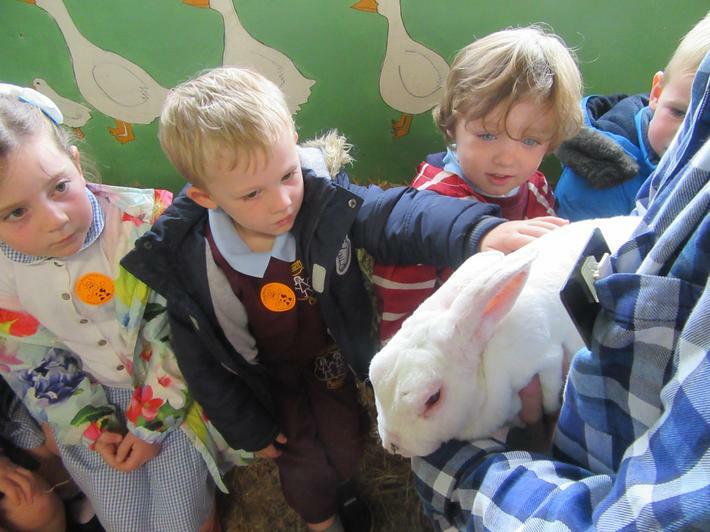 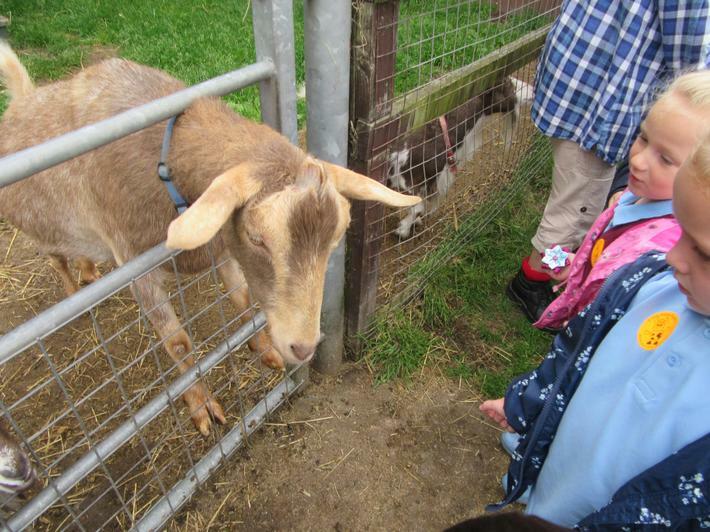 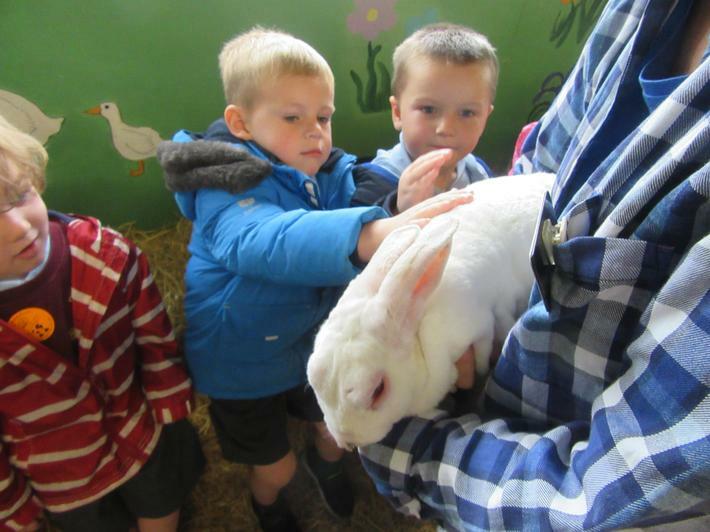 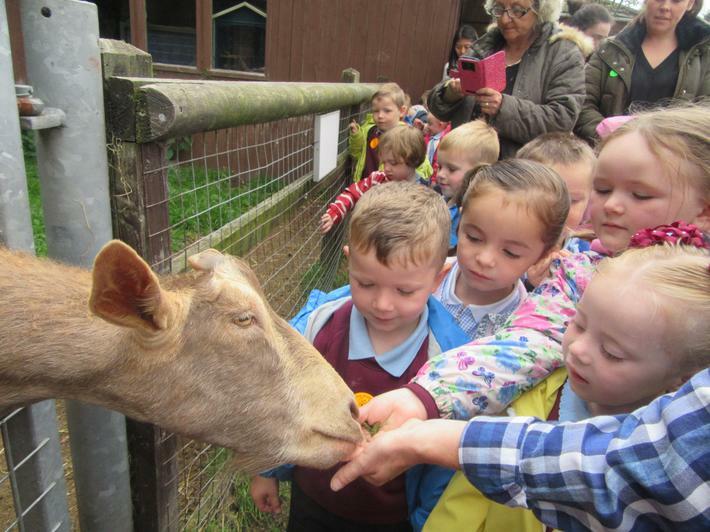 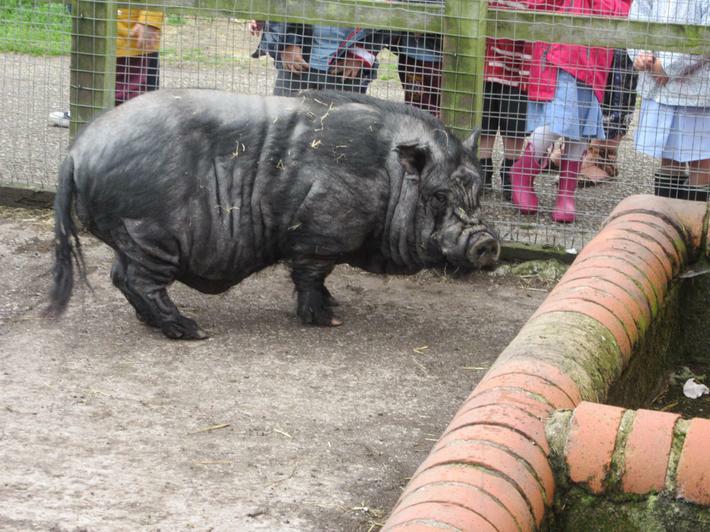 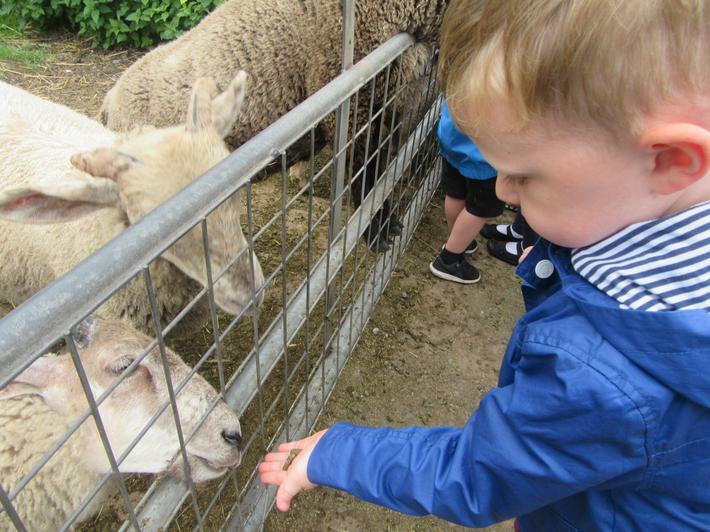 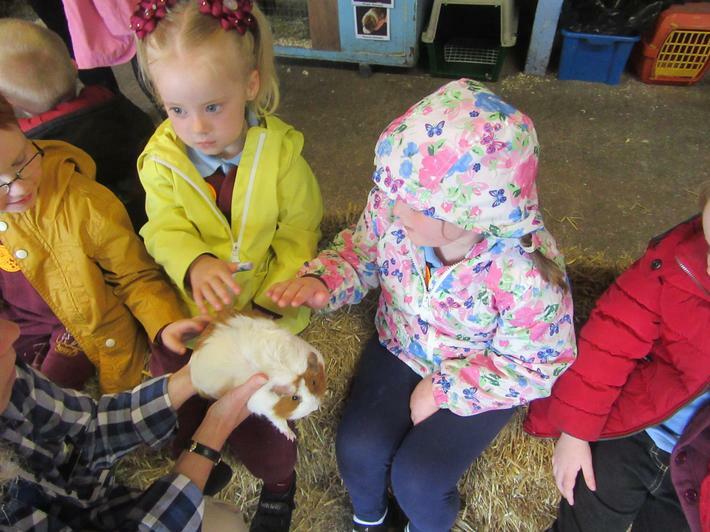 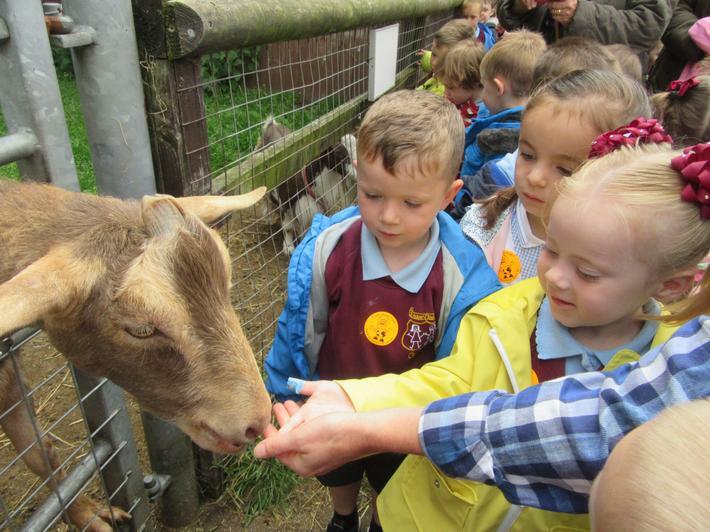 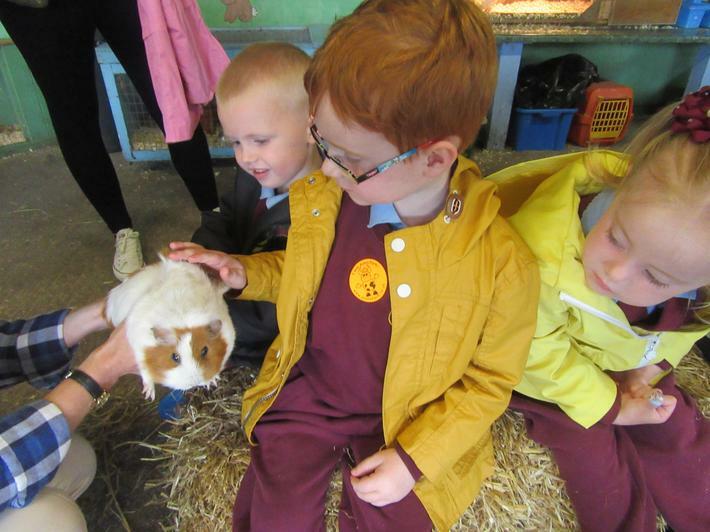 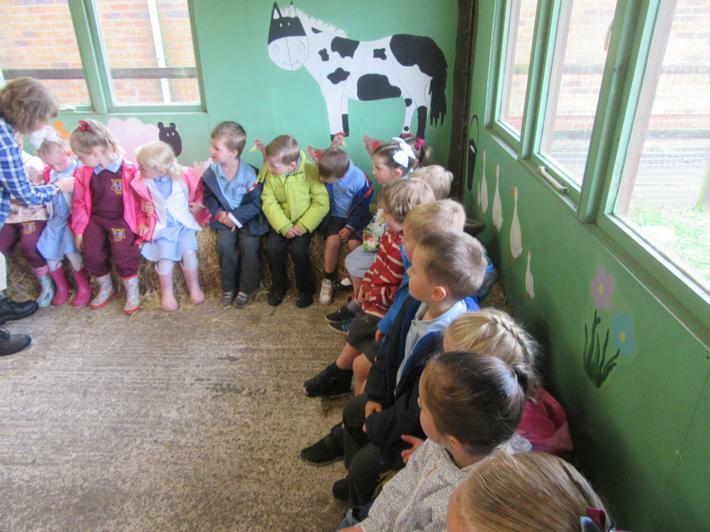 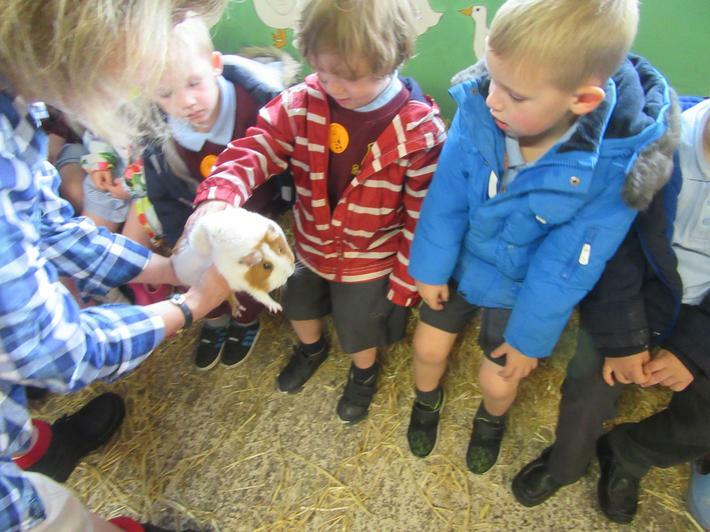 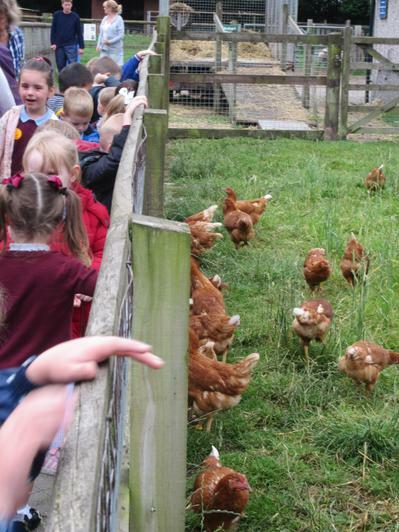 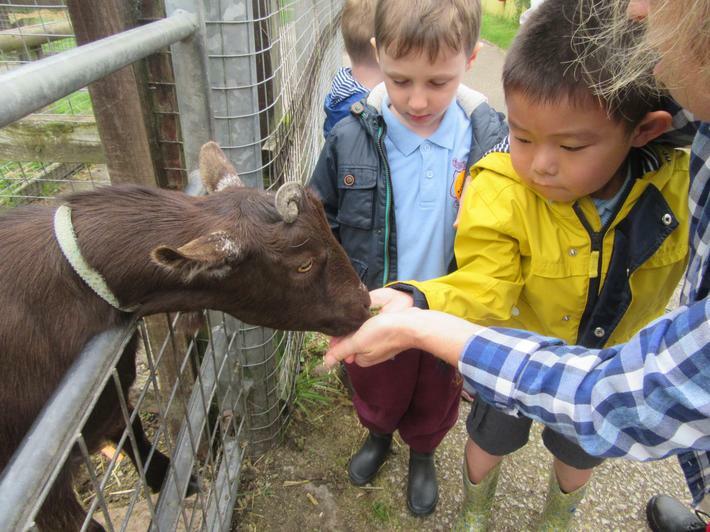 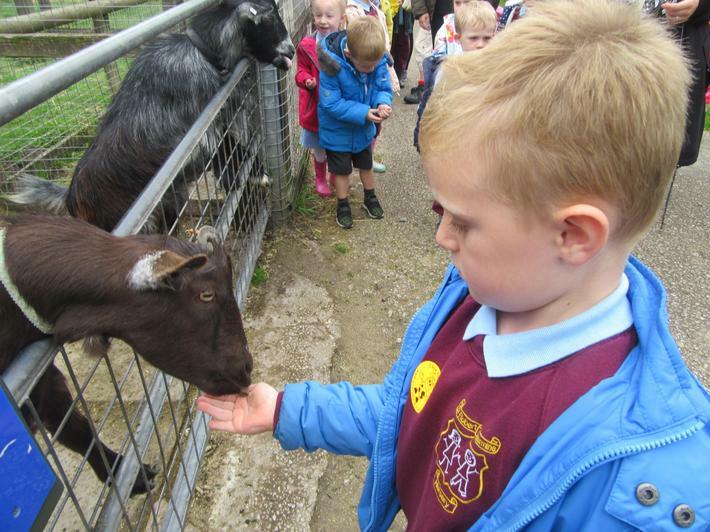 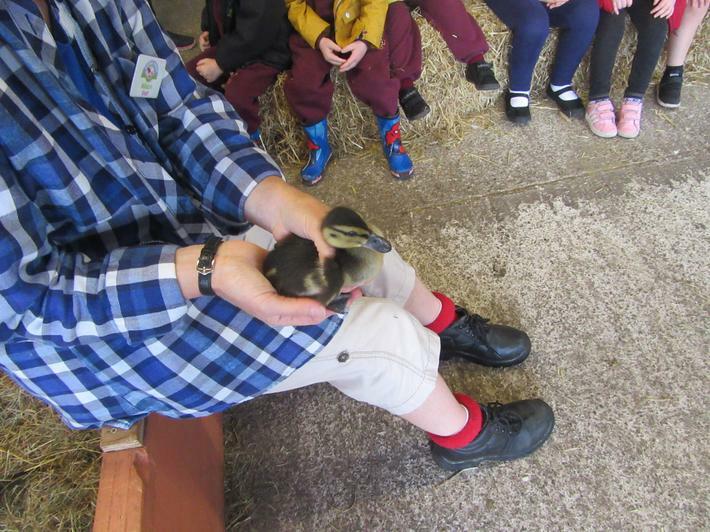 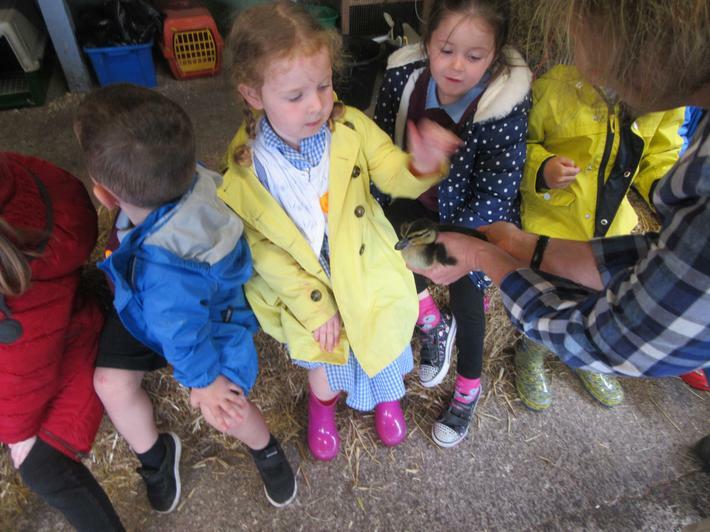 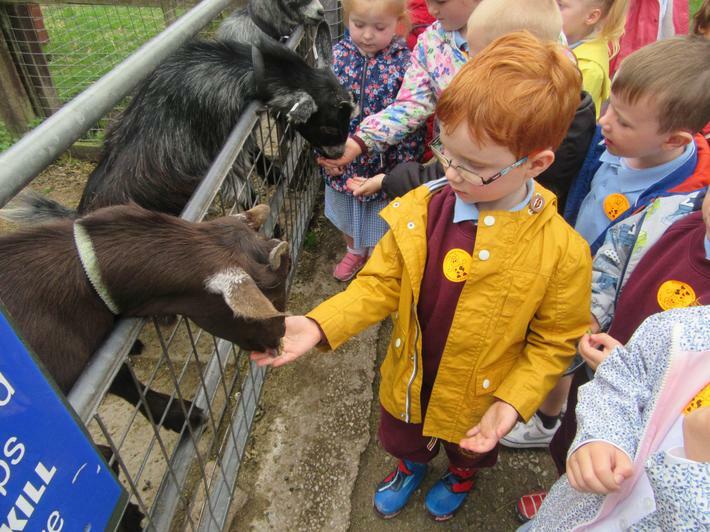 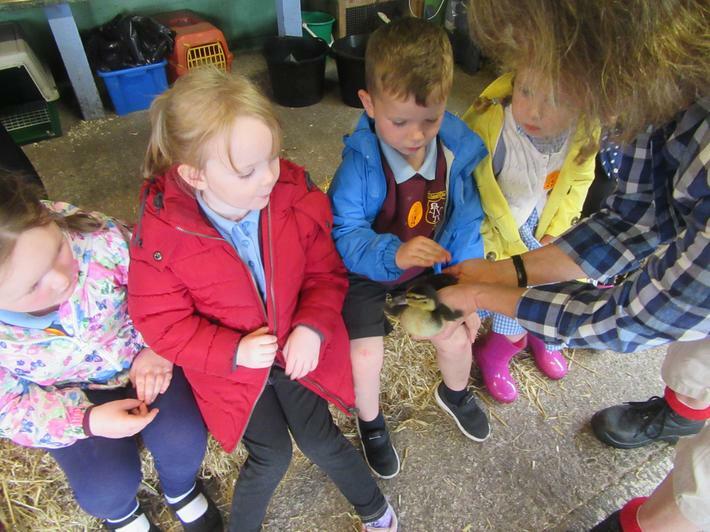 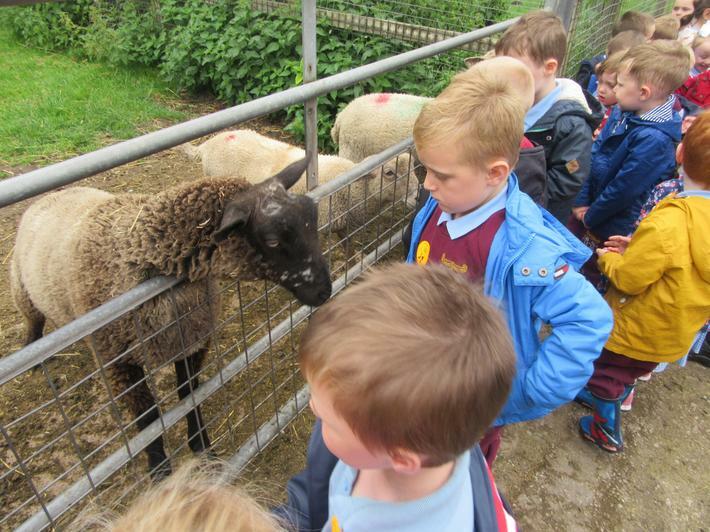 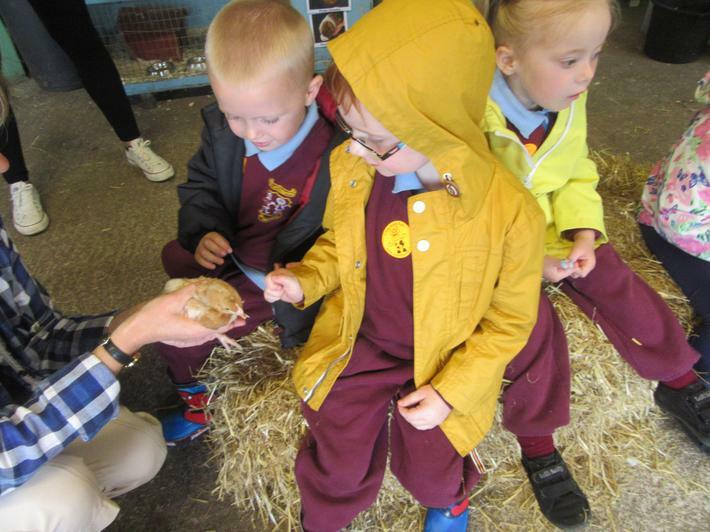 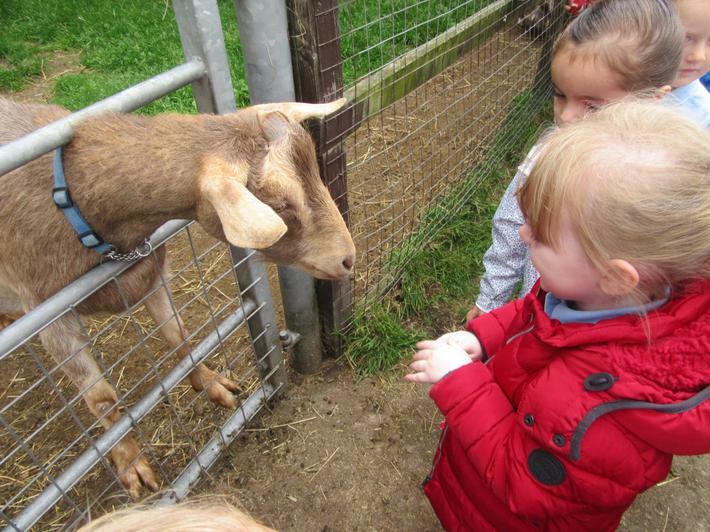 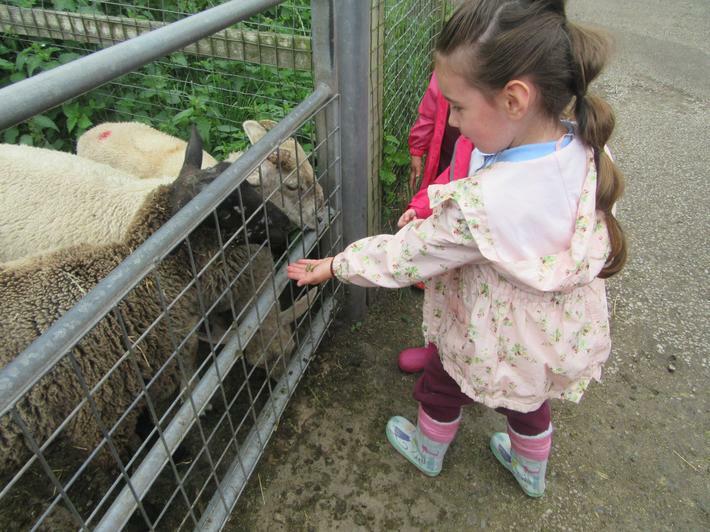 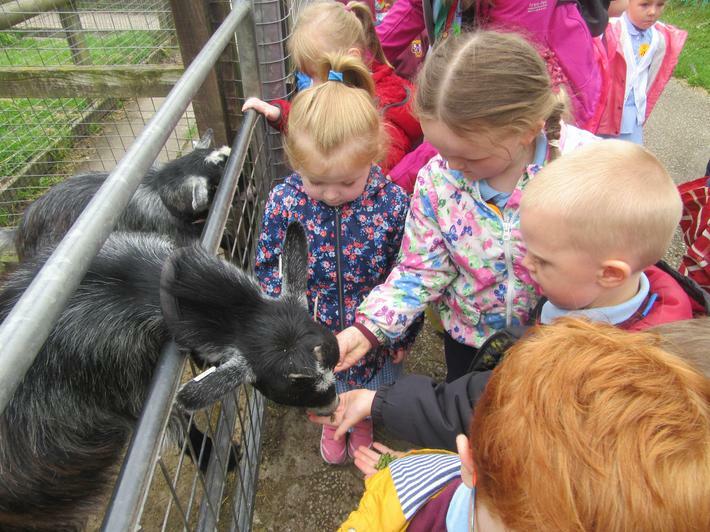 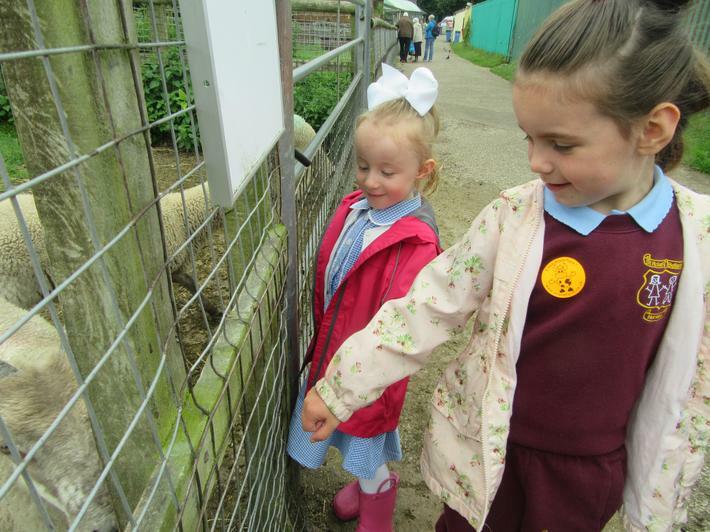 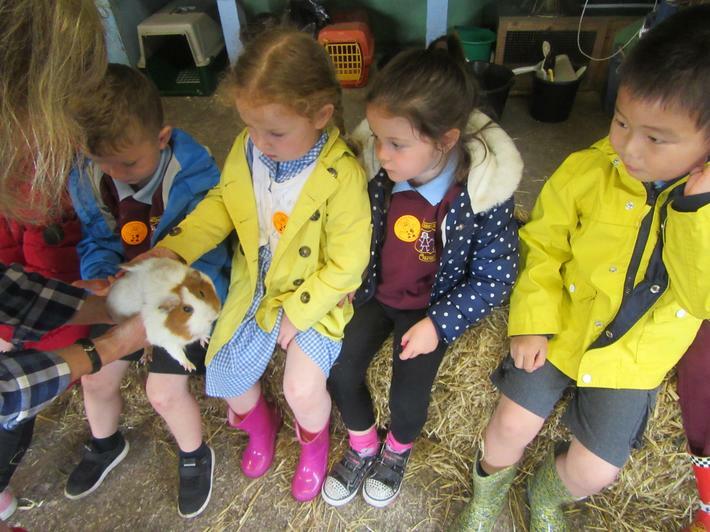 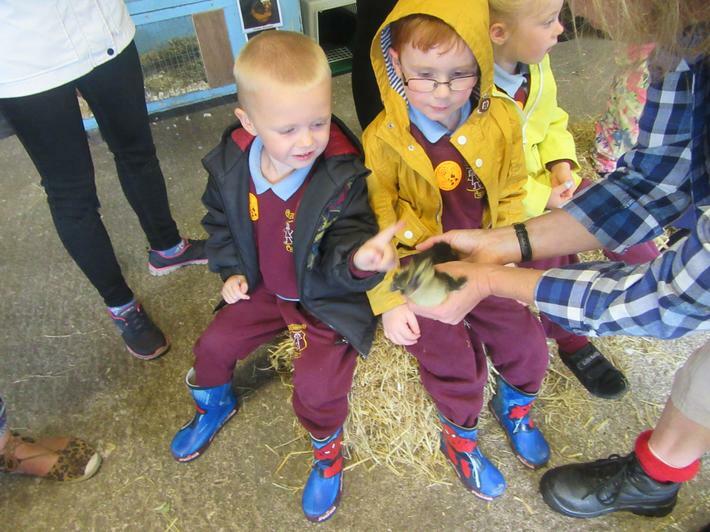 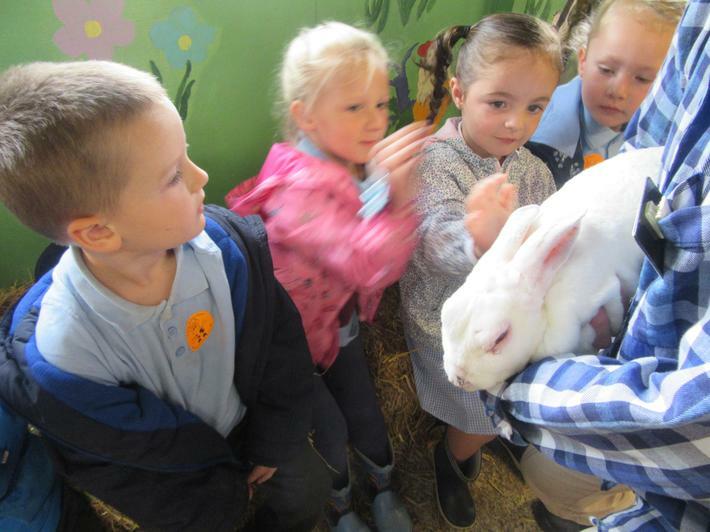 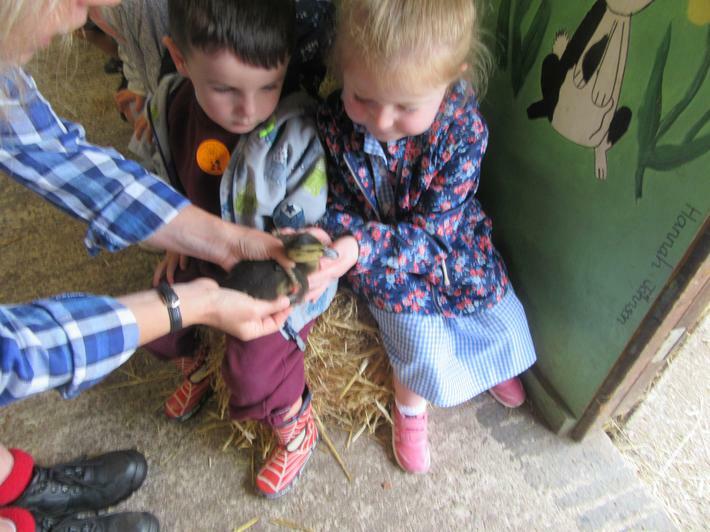 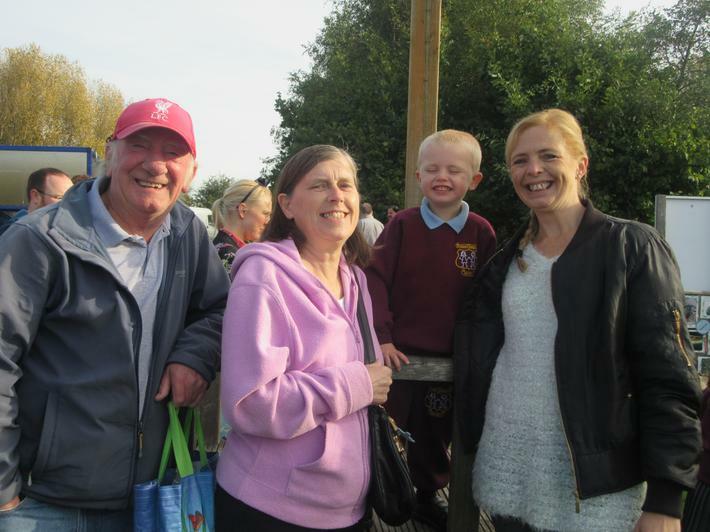 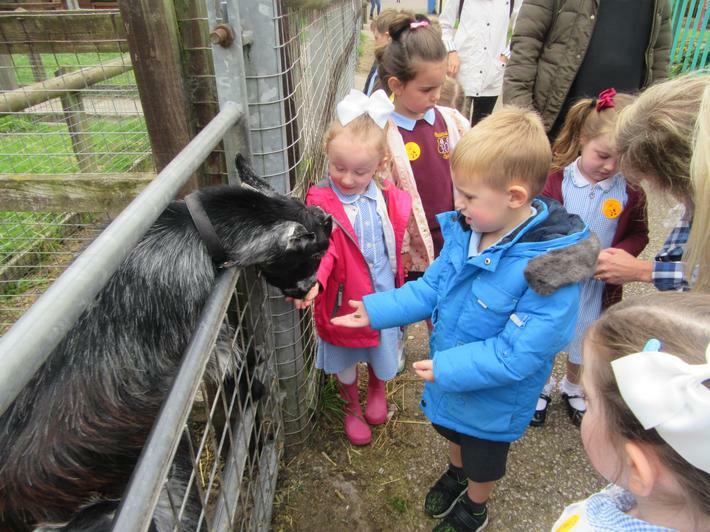 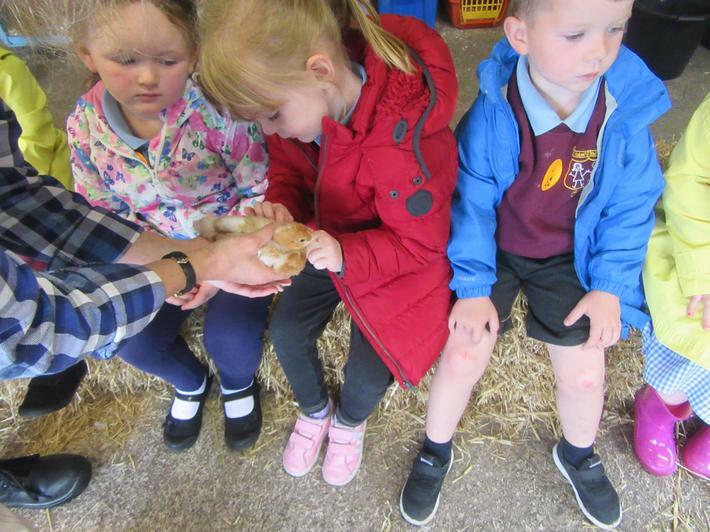 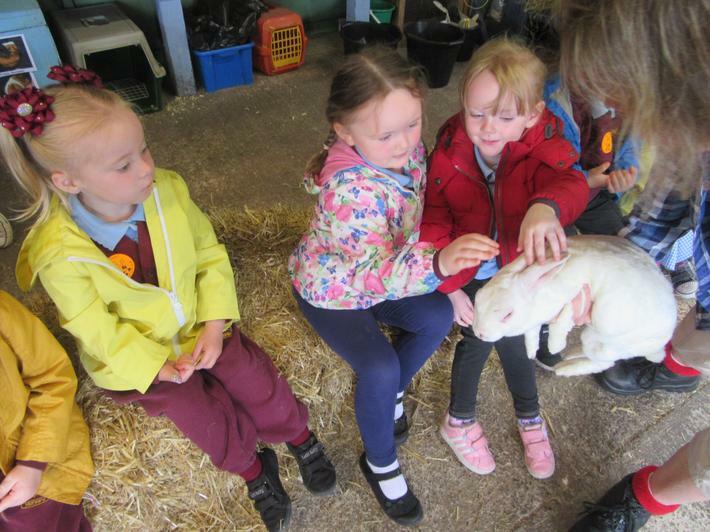 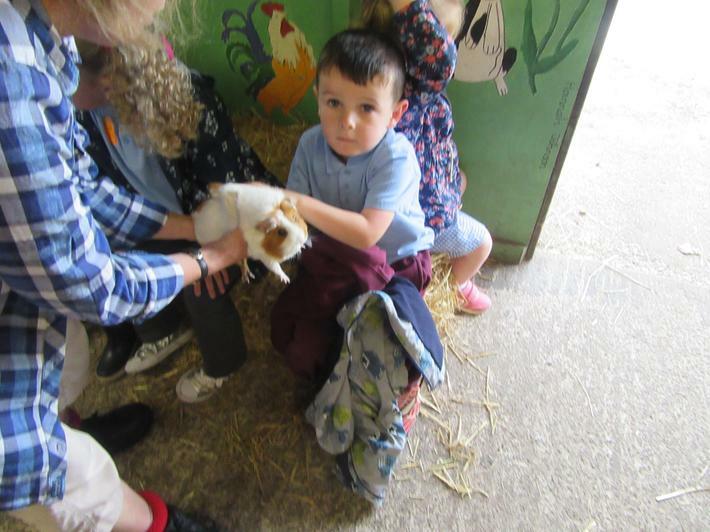 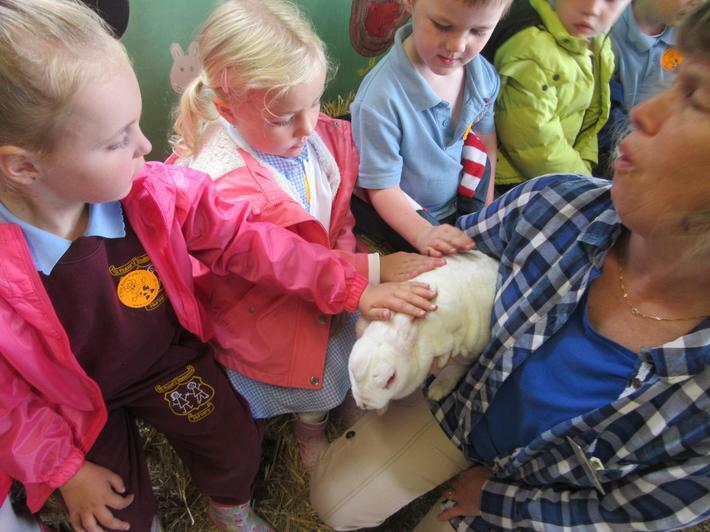 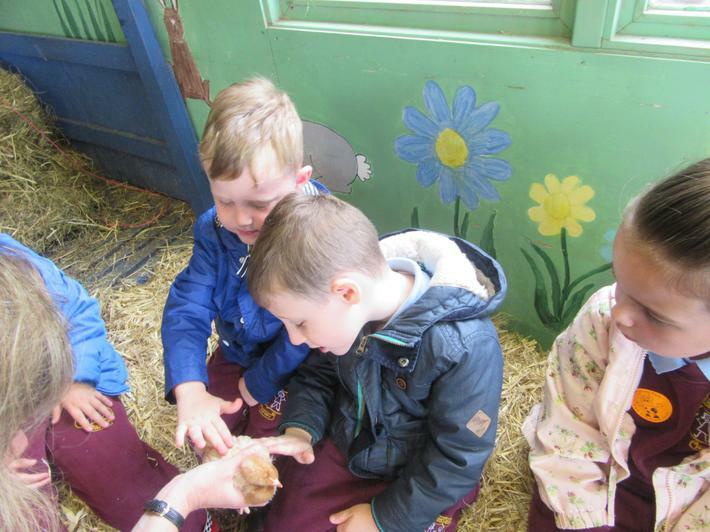 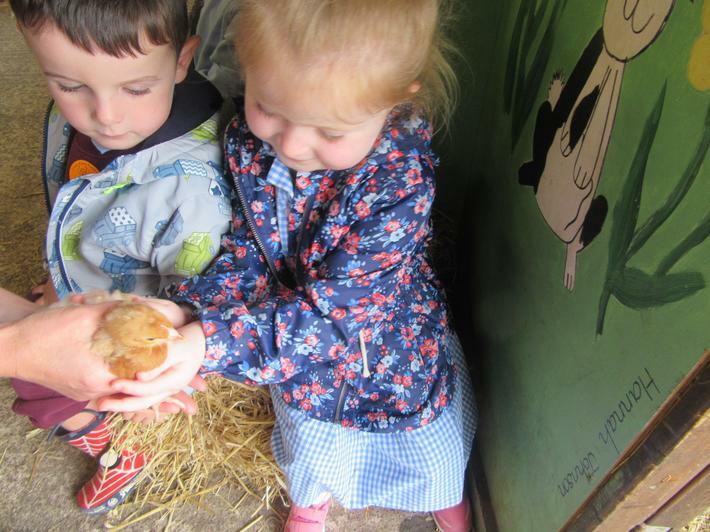 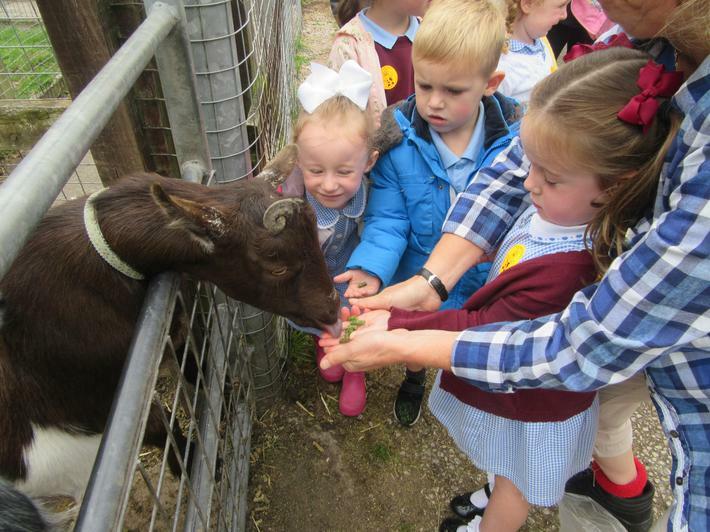 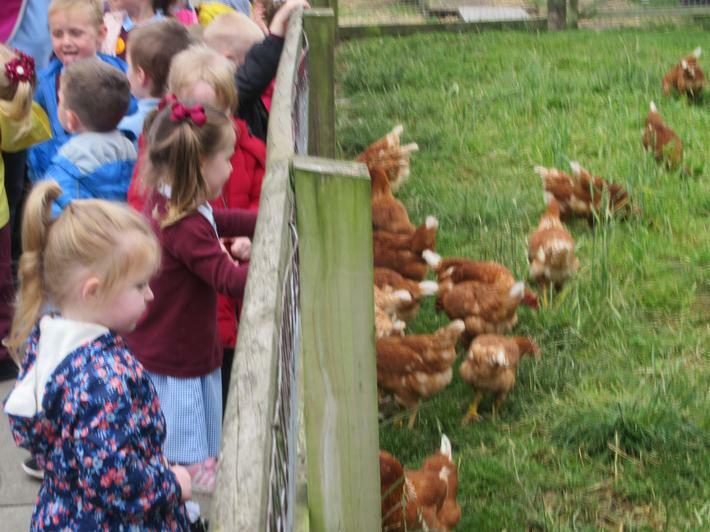 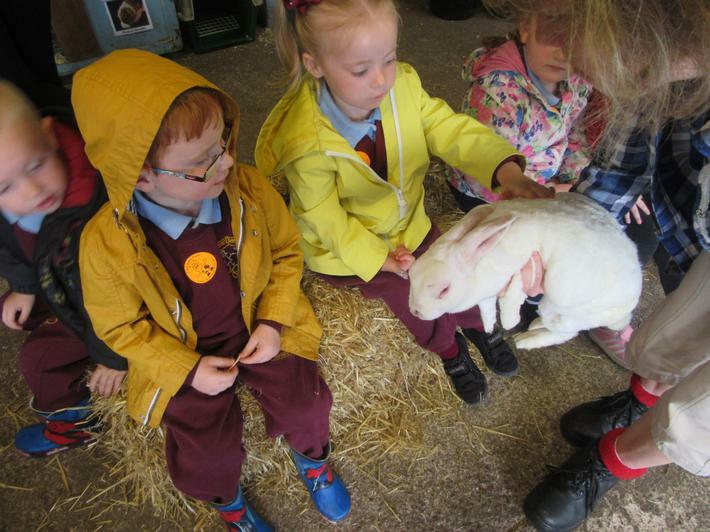 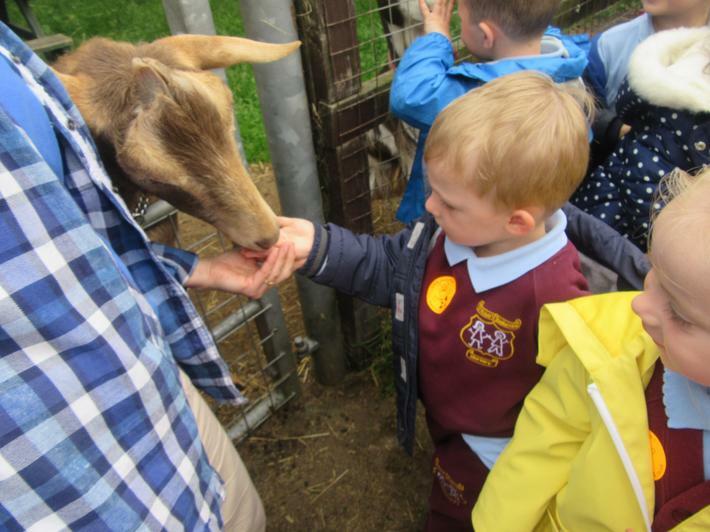 We had a fabulous time at Acorn Farm. 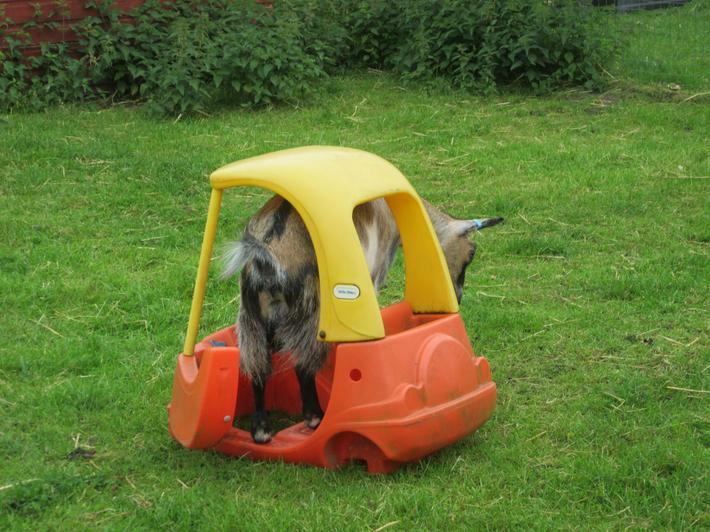 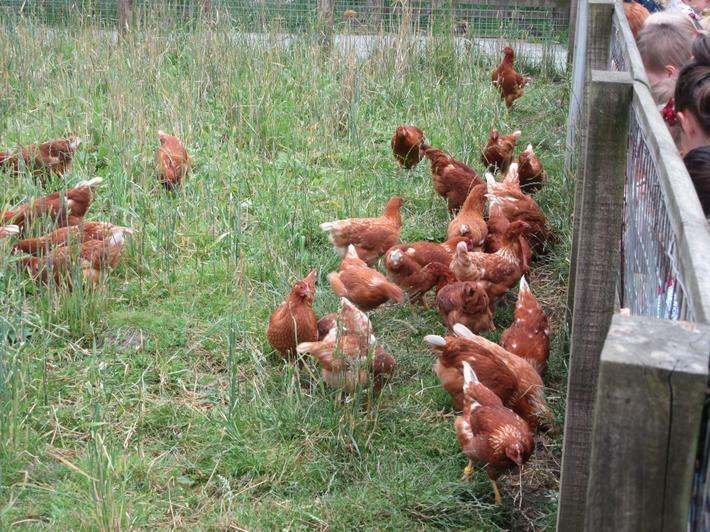 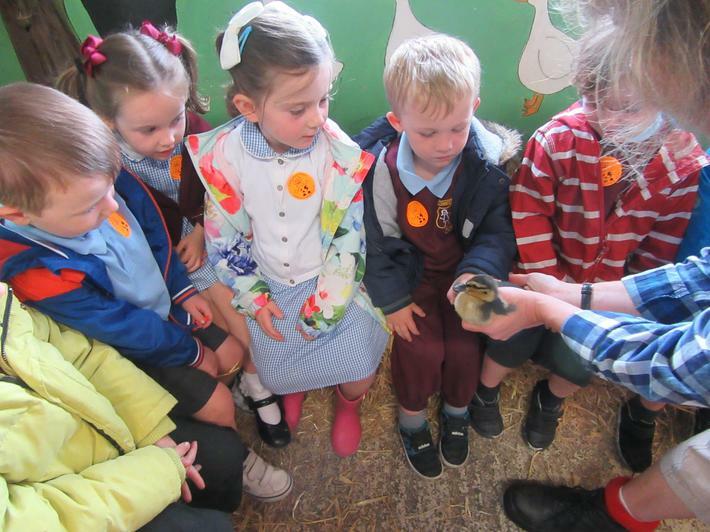 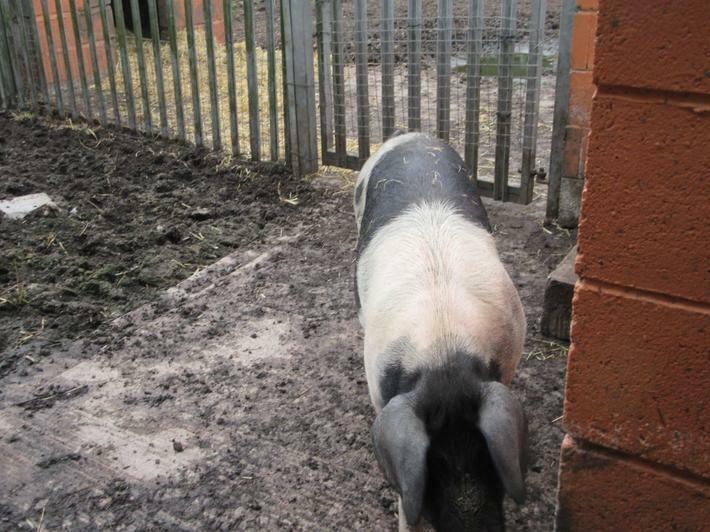 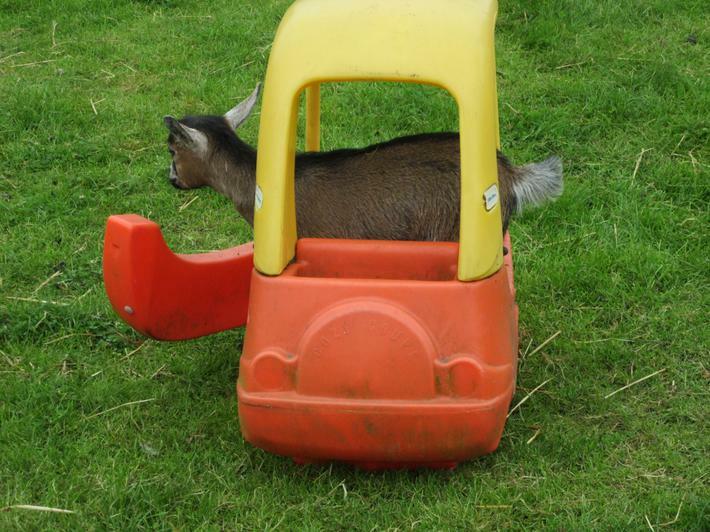 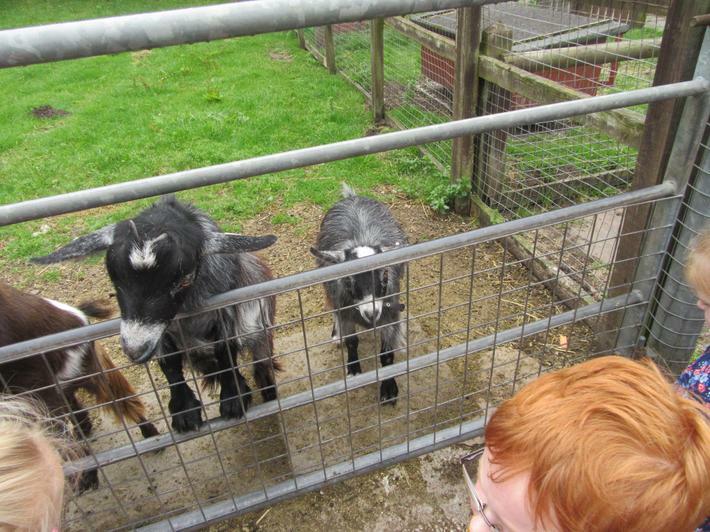 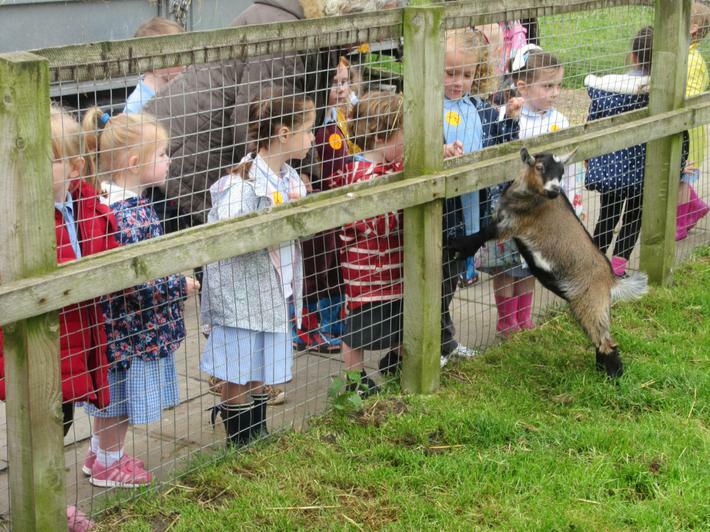 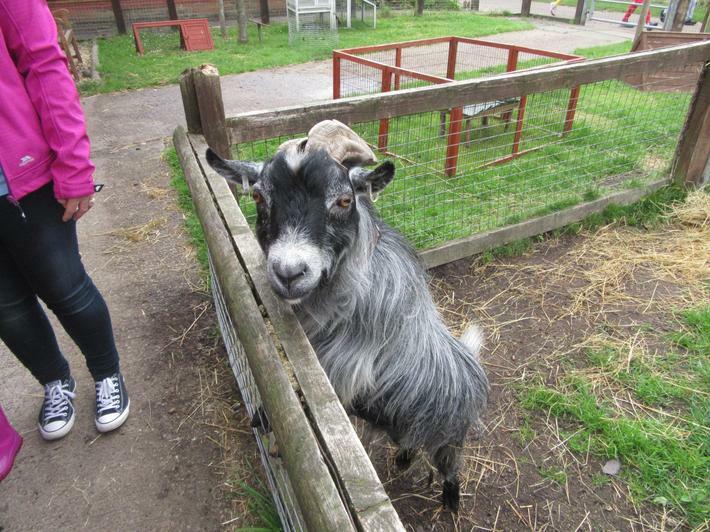 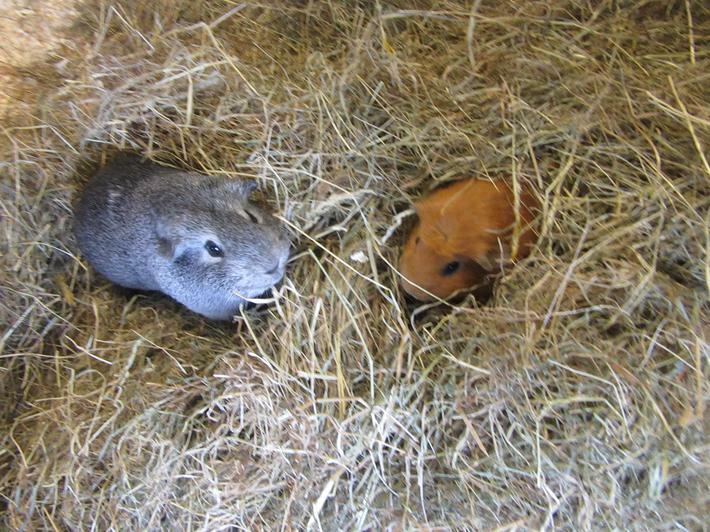 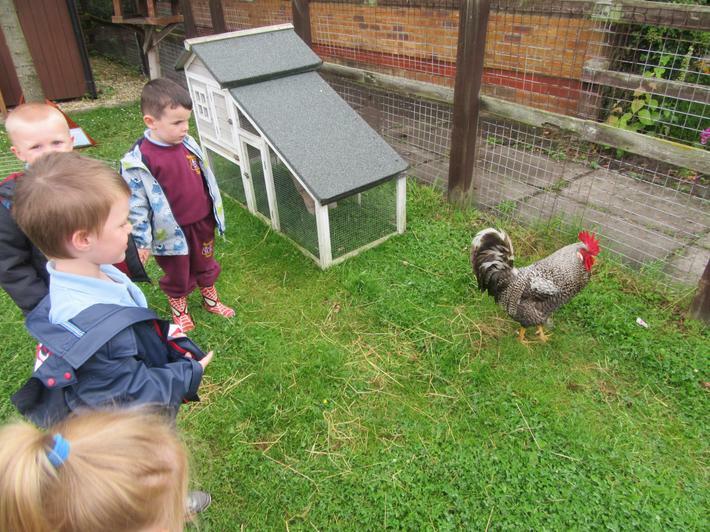 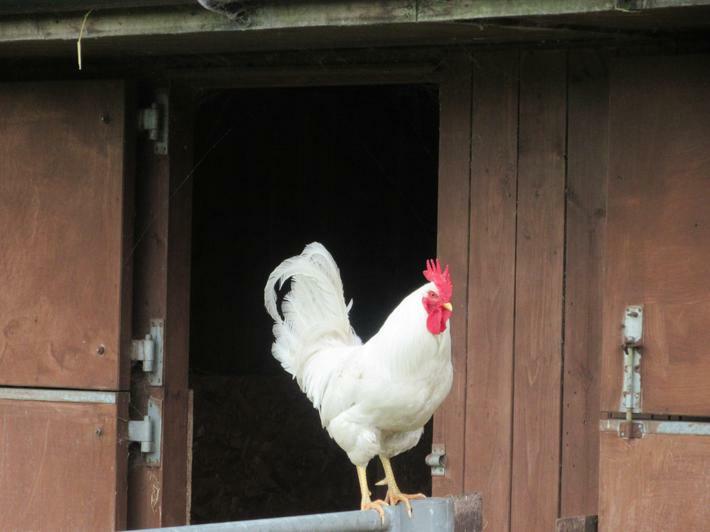 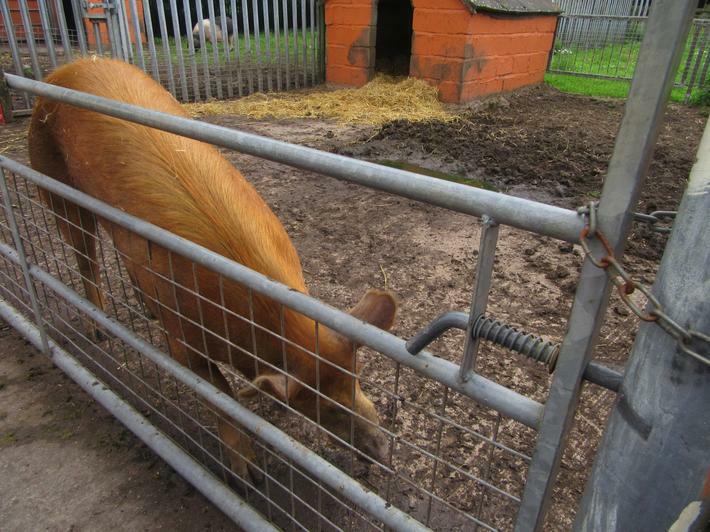 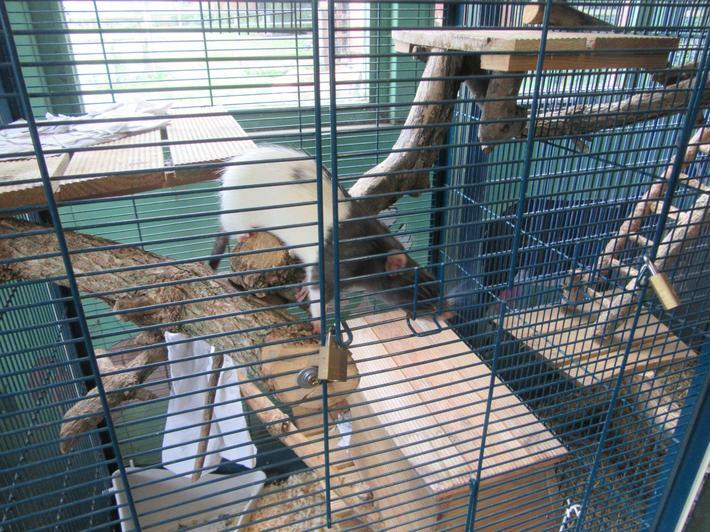 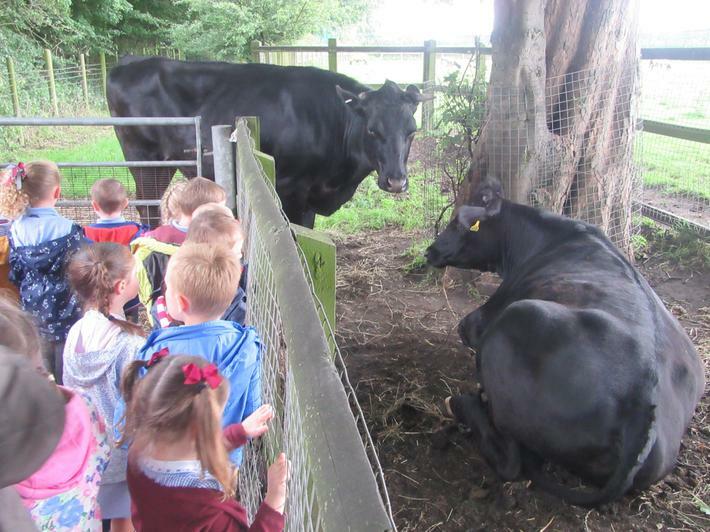 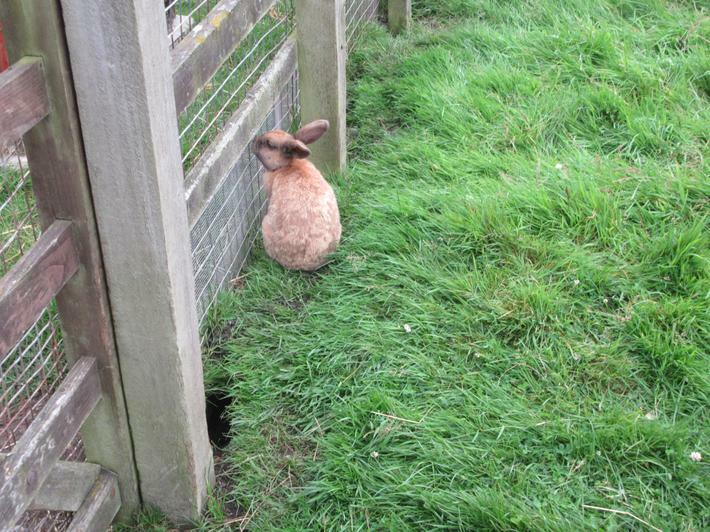 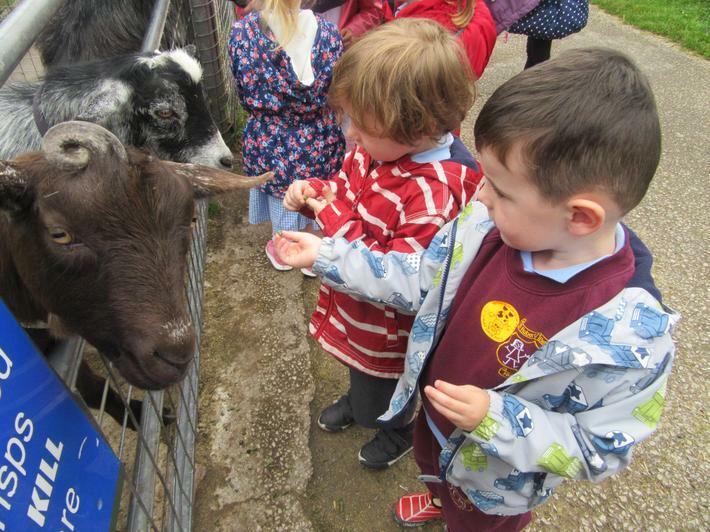 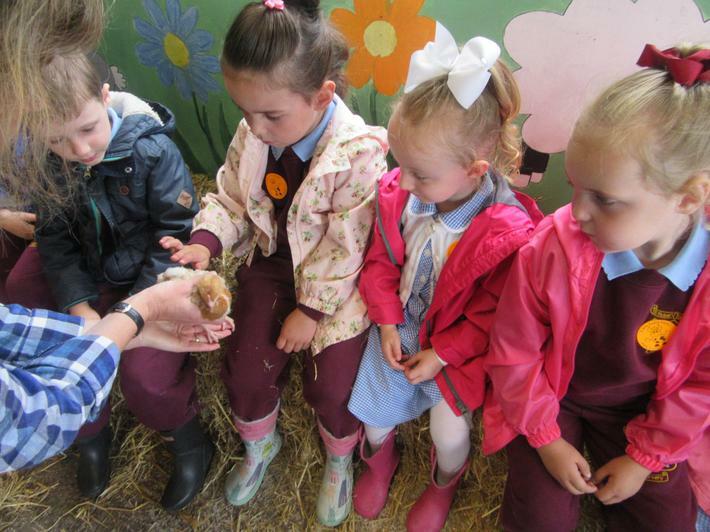 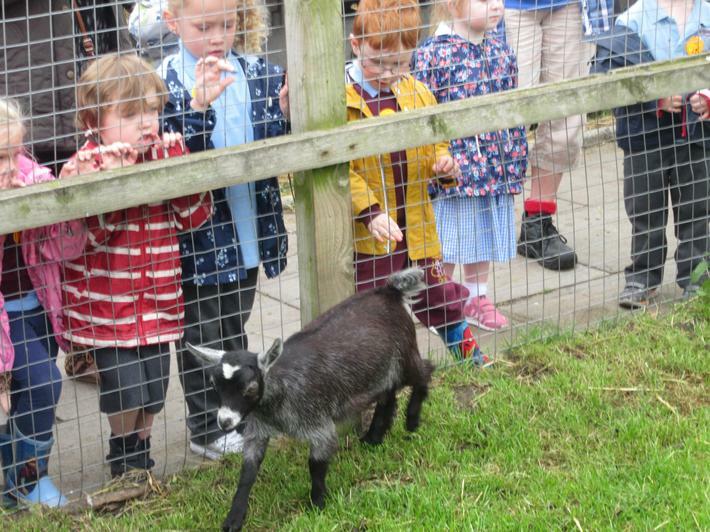 We saw chickens, goats, pygmy goats, rabbits, guinea pigs, rats, pigs, cows, horses and cows! 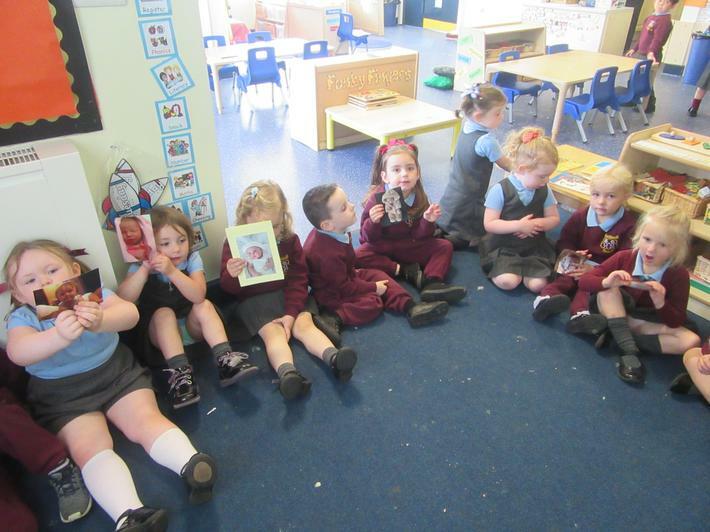 We even had time for a lolly ice! 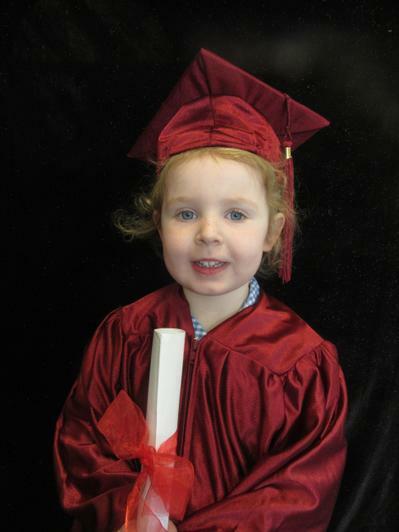 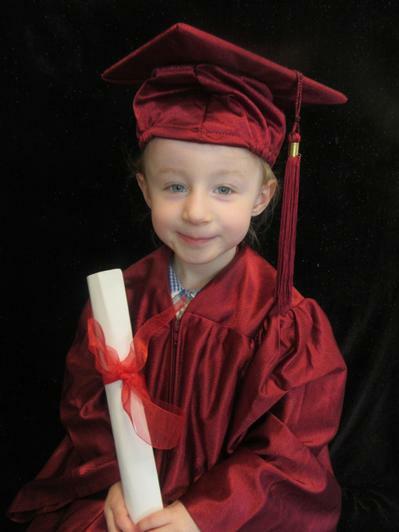 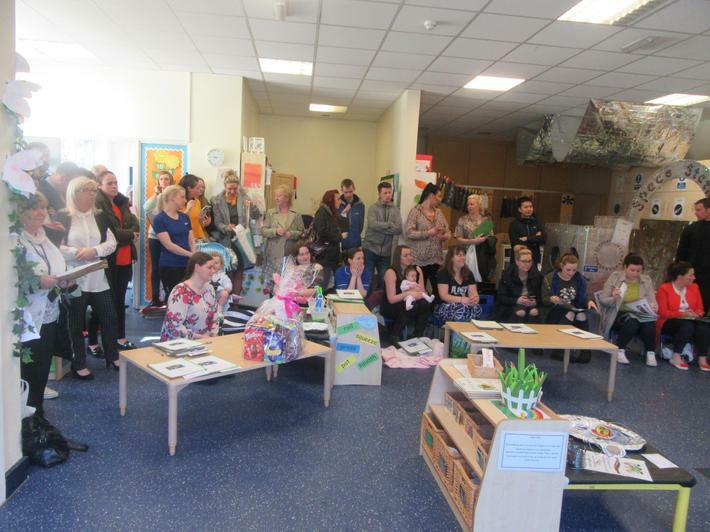 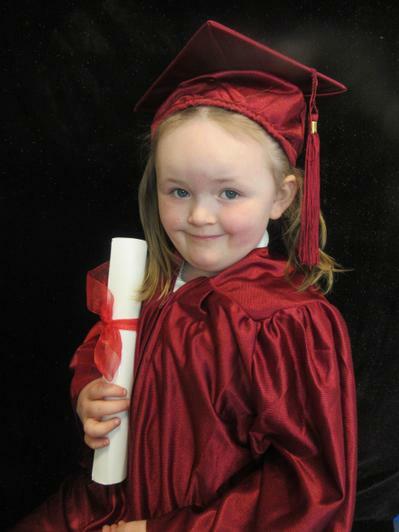 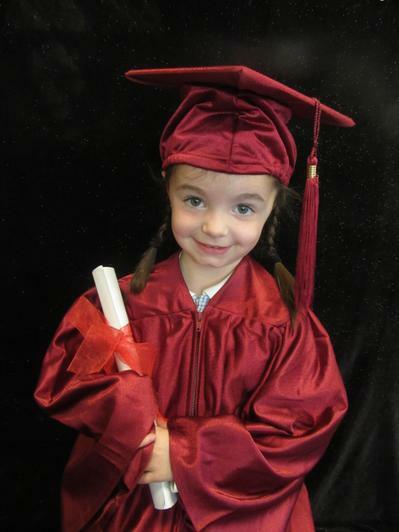 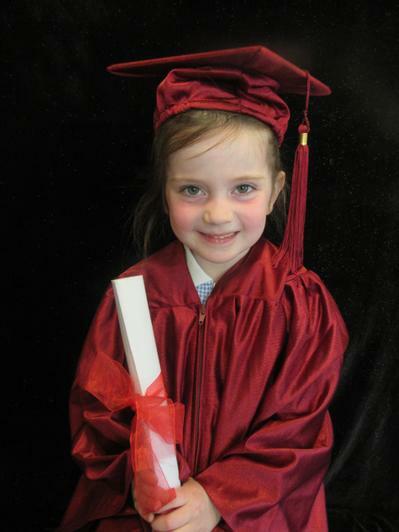 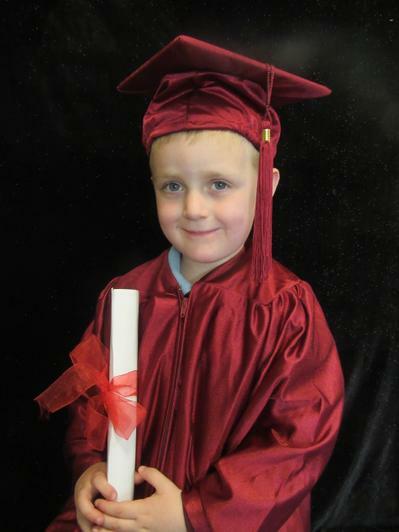 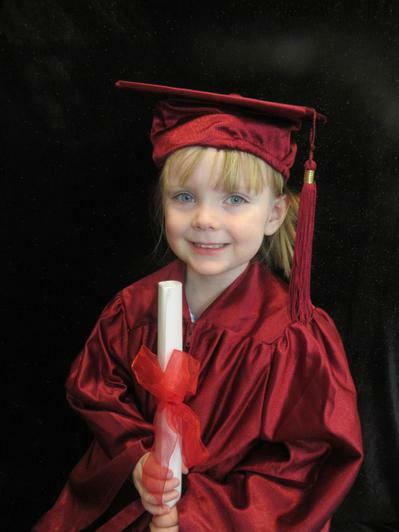 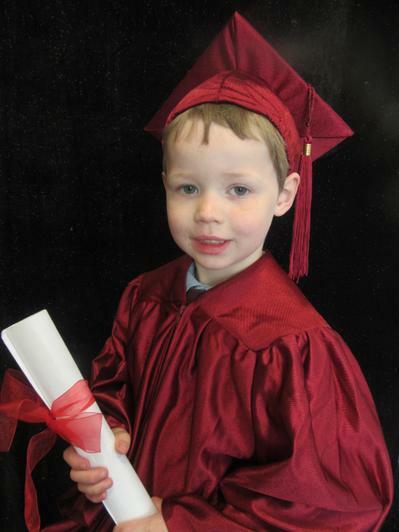 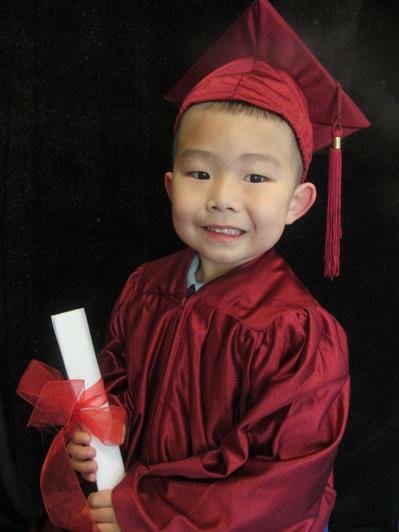 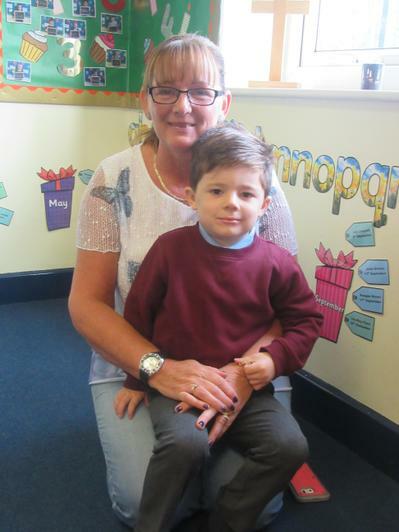 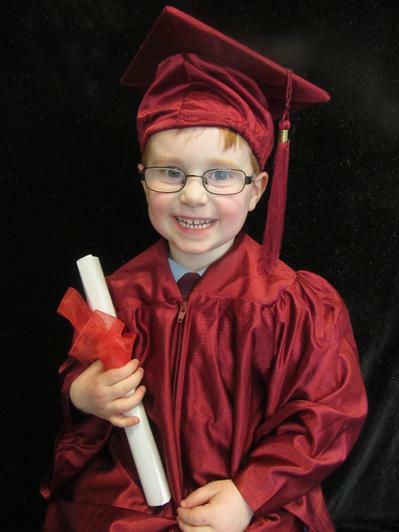 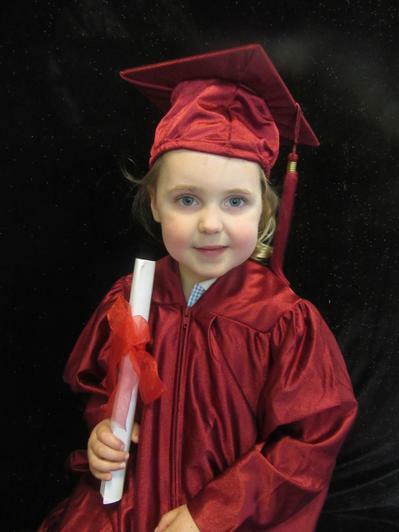 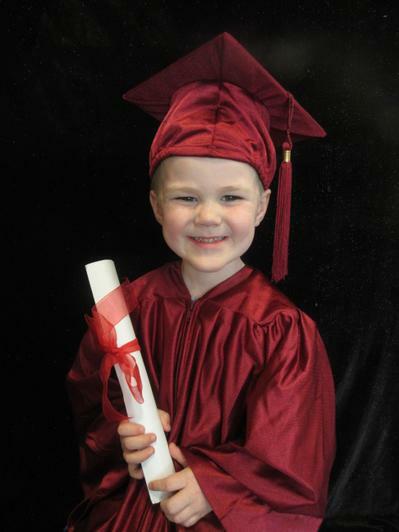 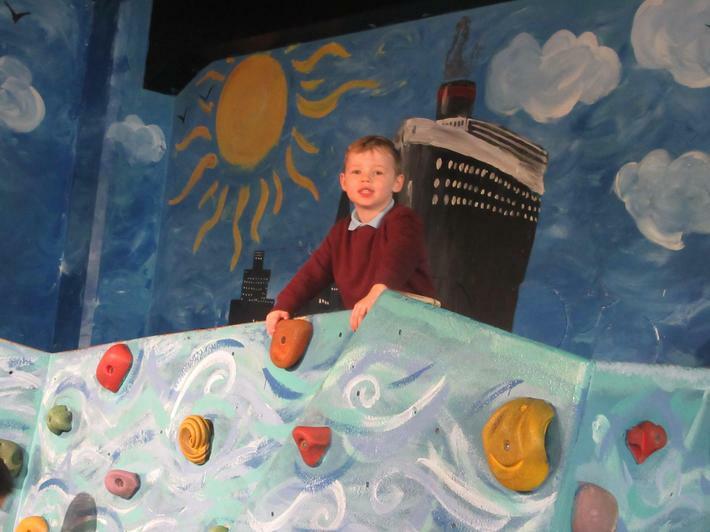 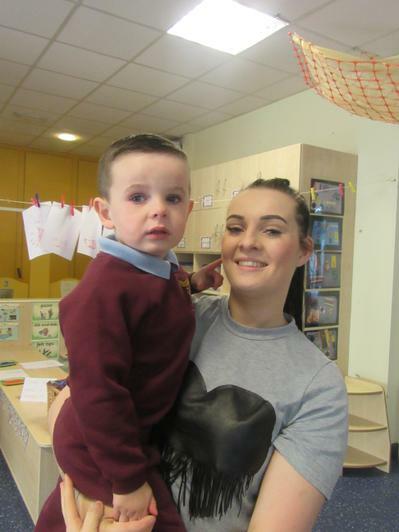 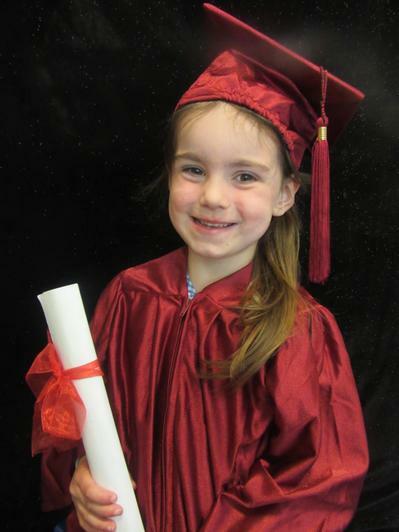 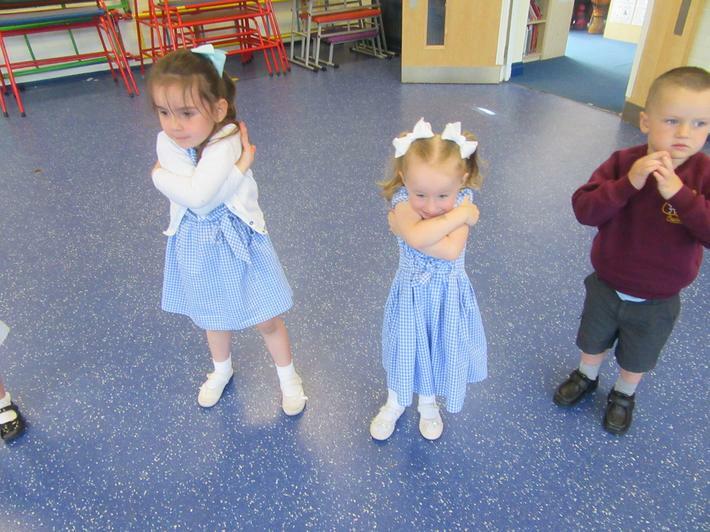 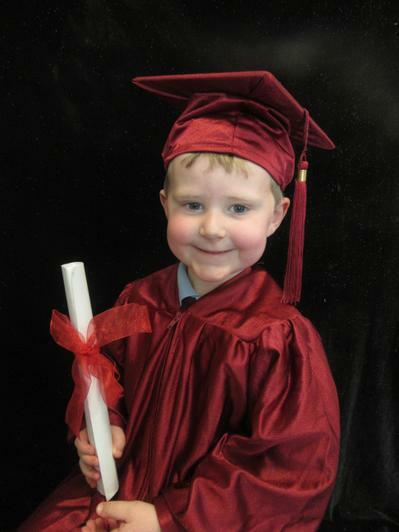 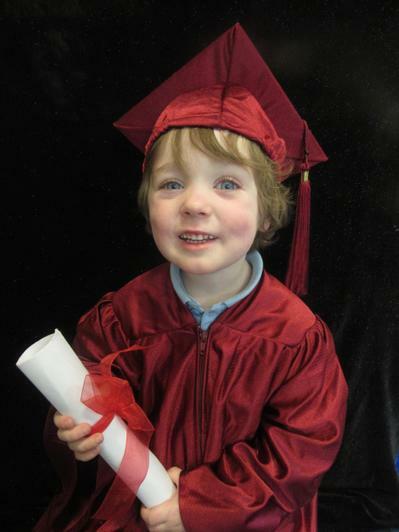 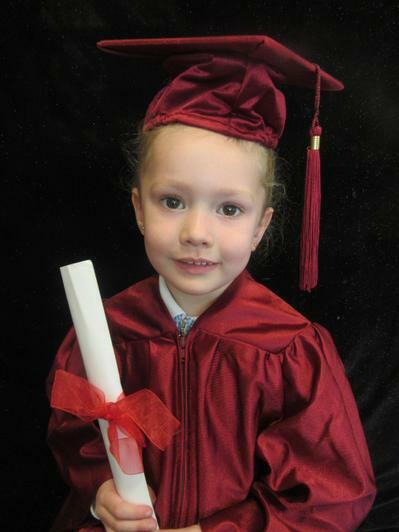 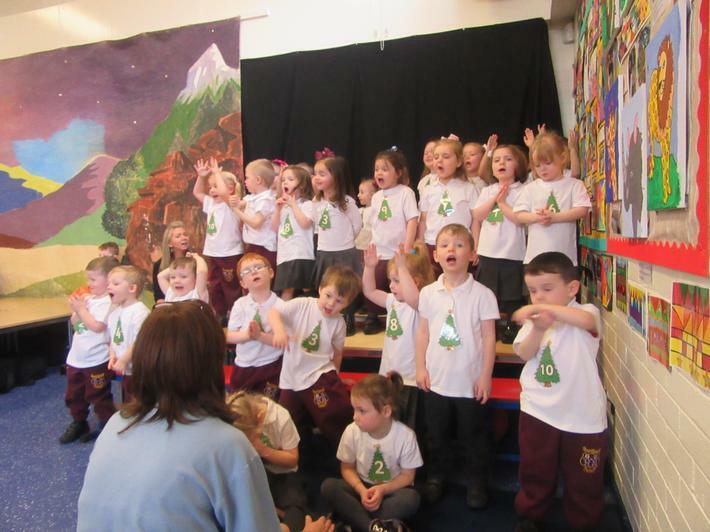 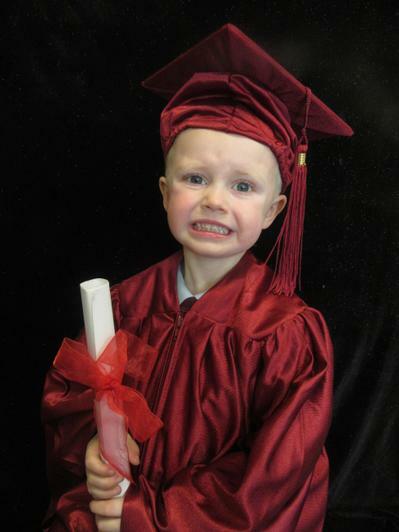 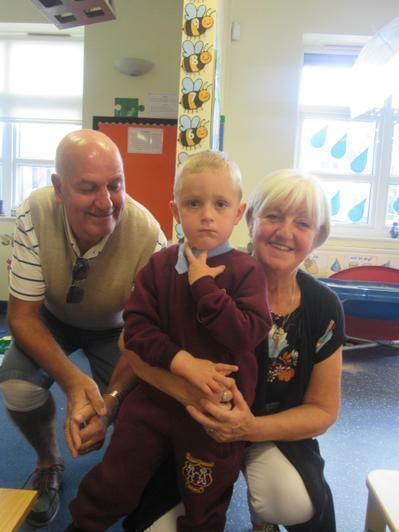 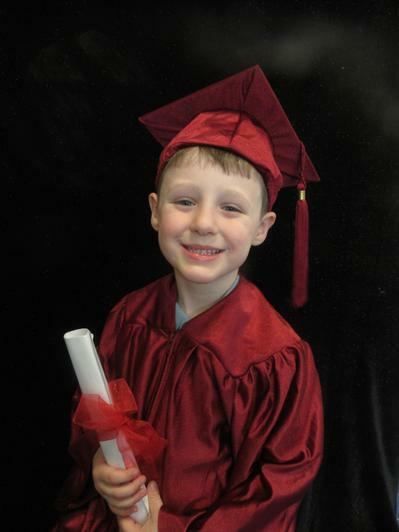 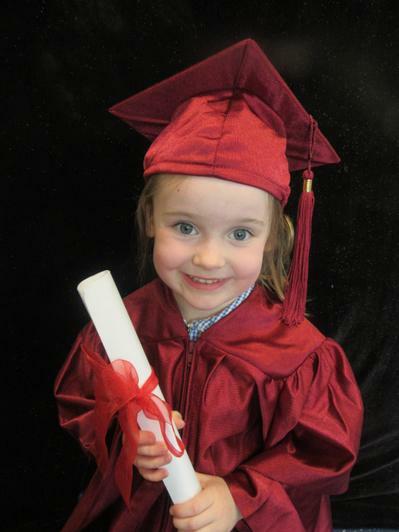 Please enjoy our presentation of Nursery's graduation photos! 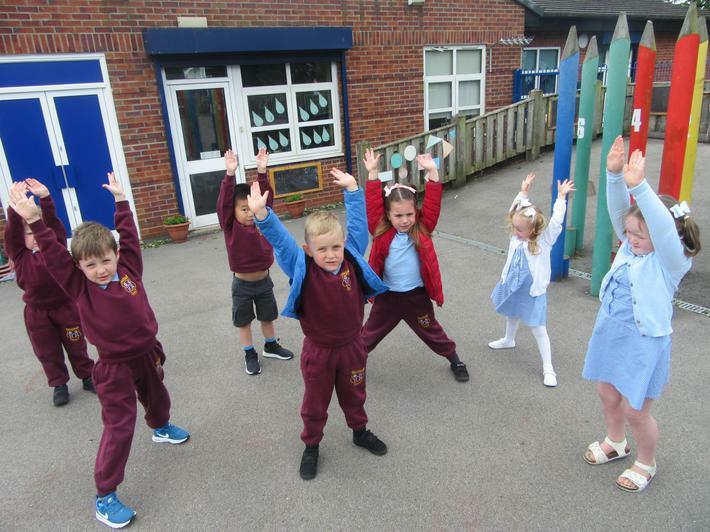 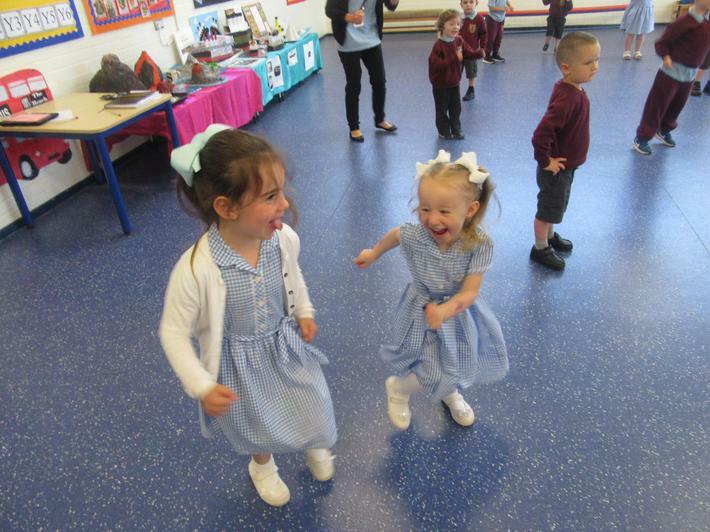 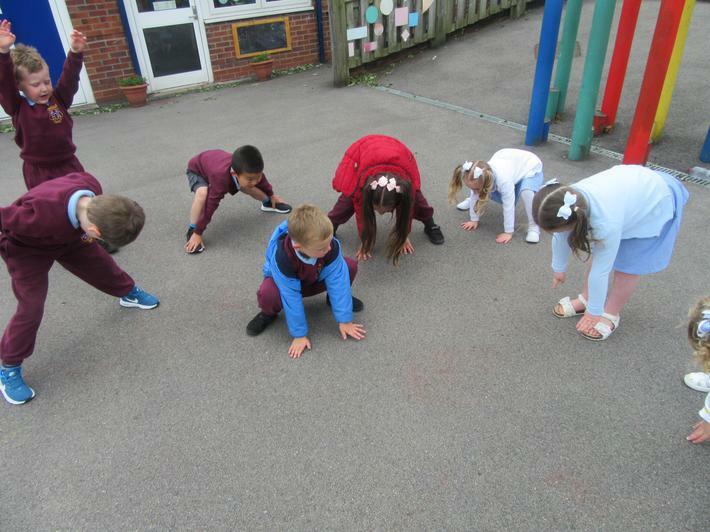 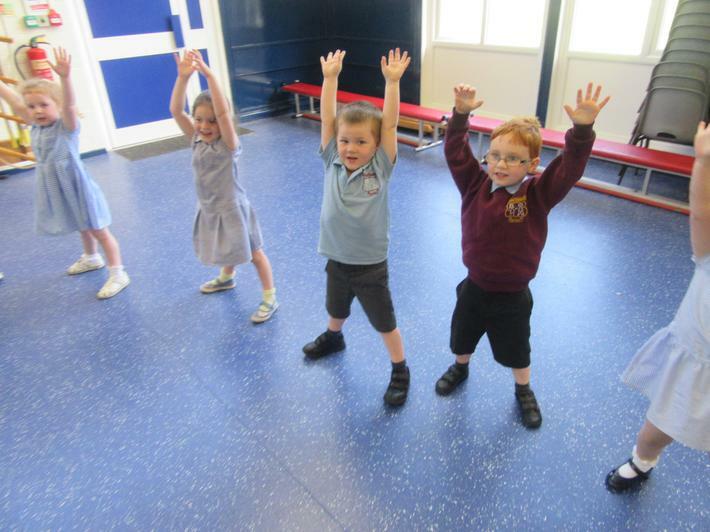 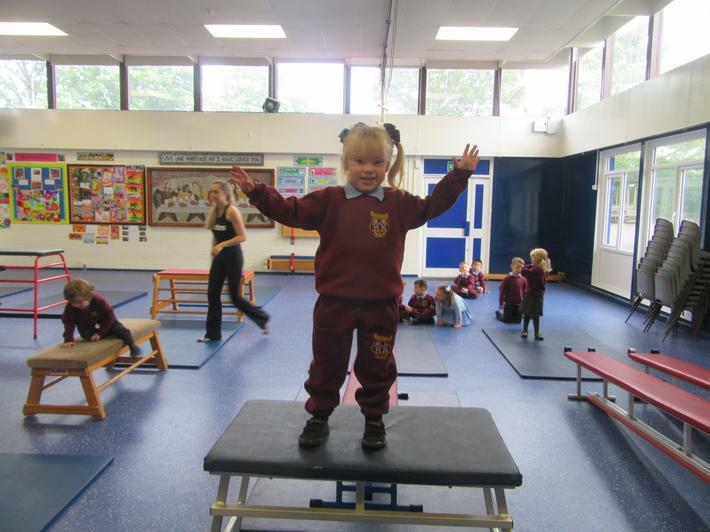 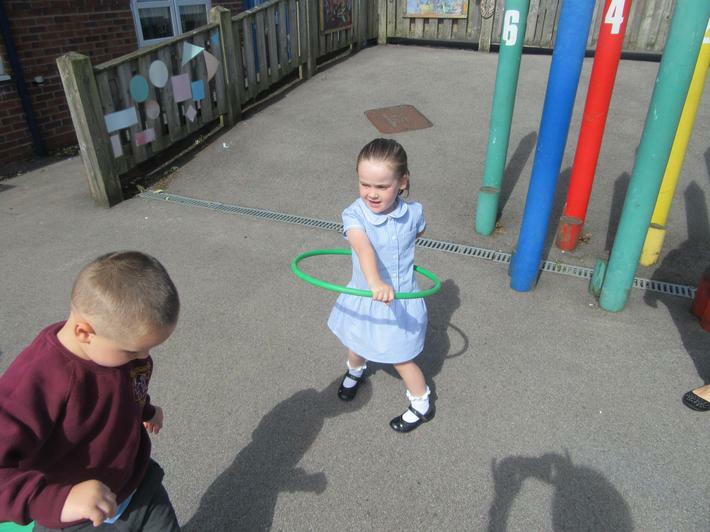 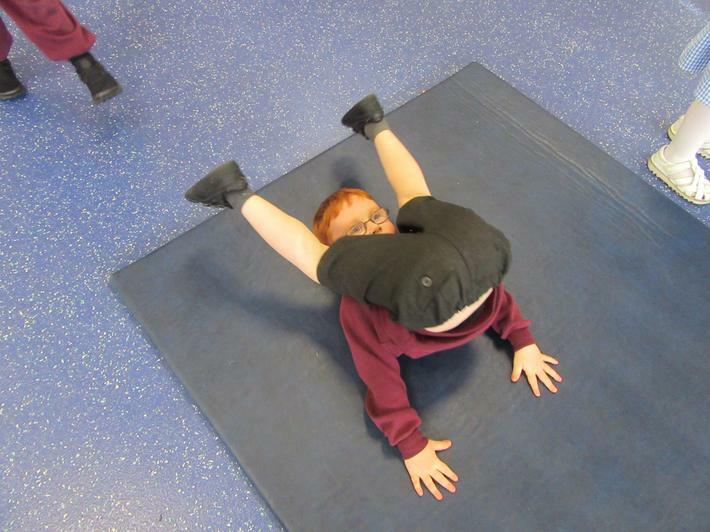 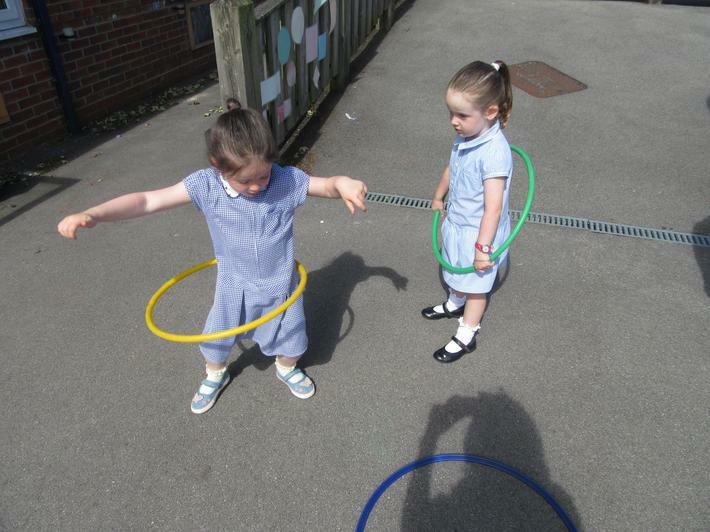 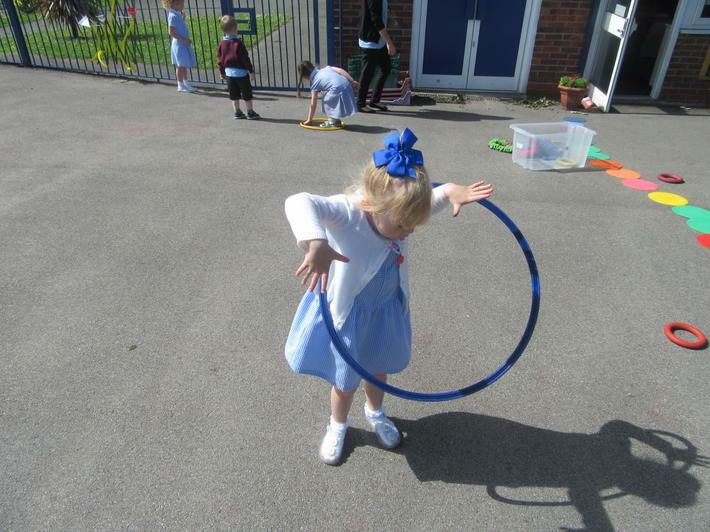 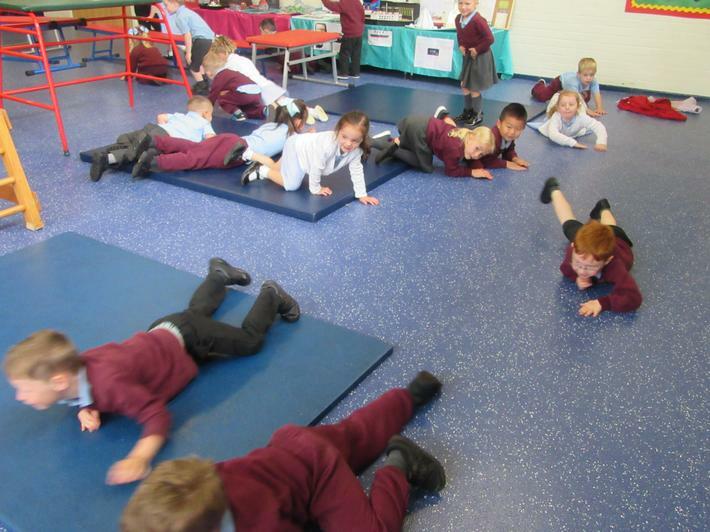 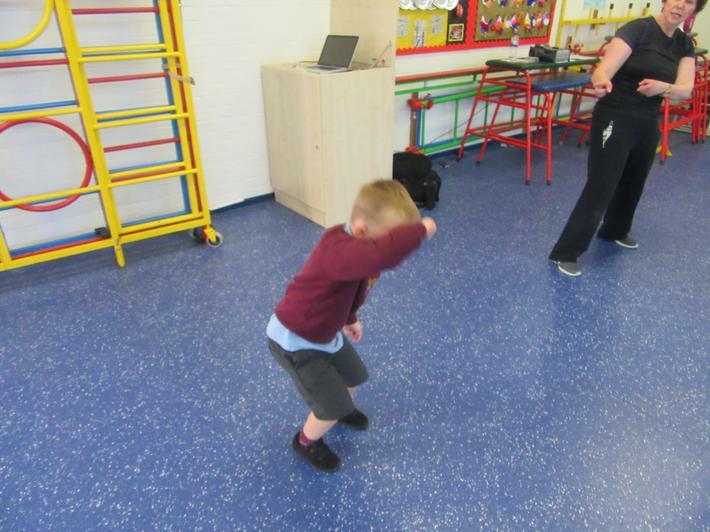 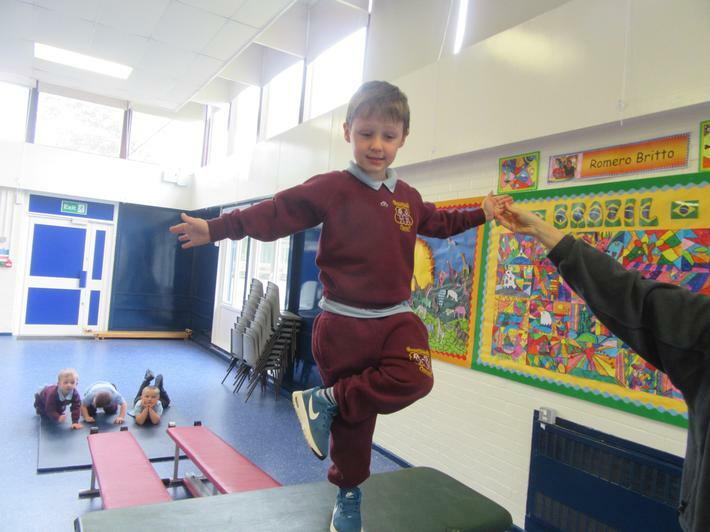 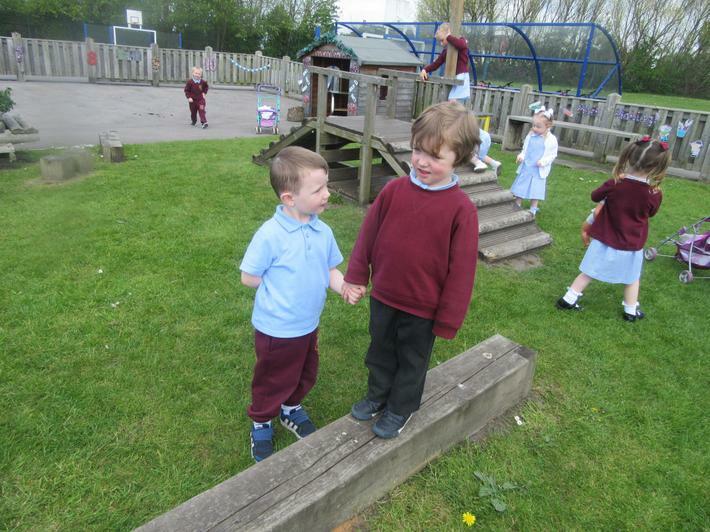 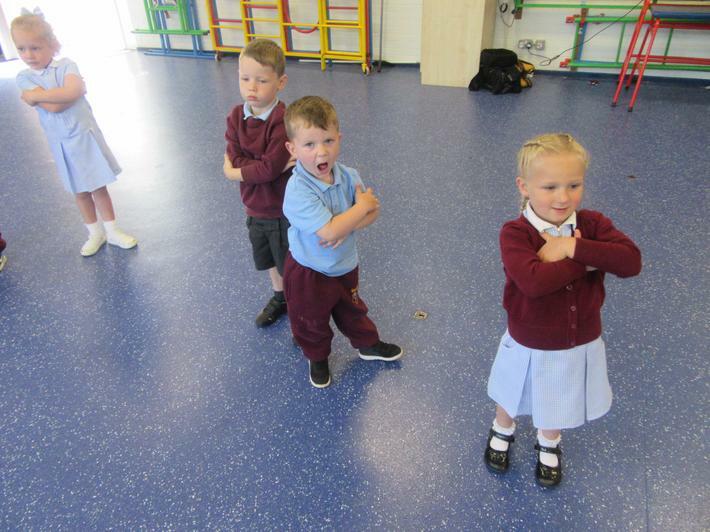 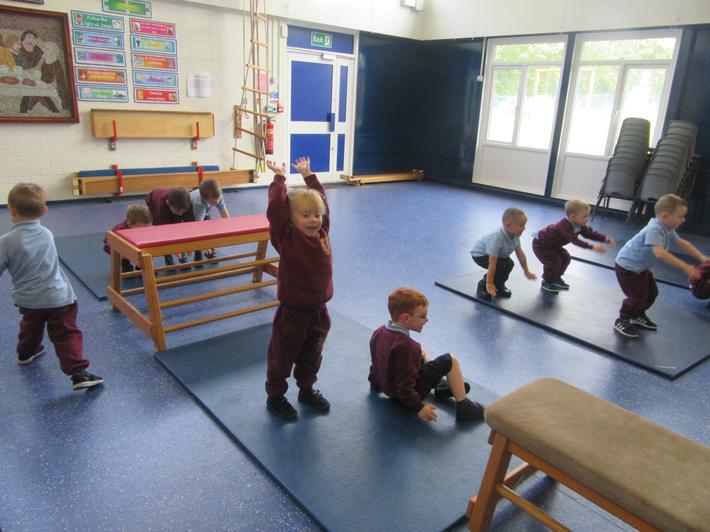 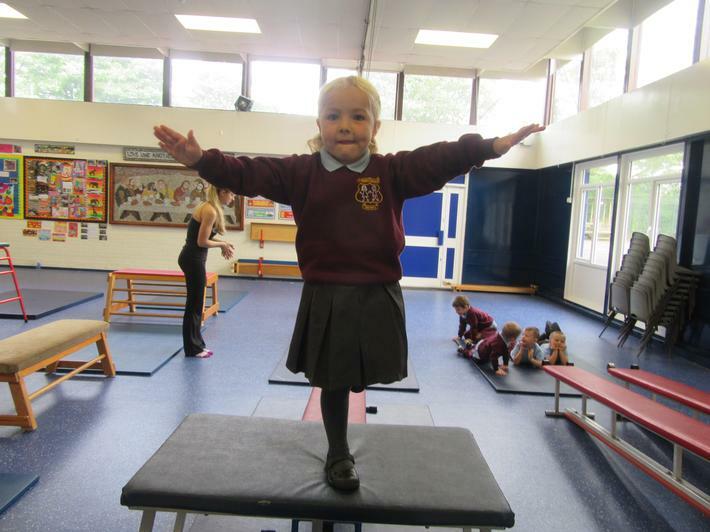 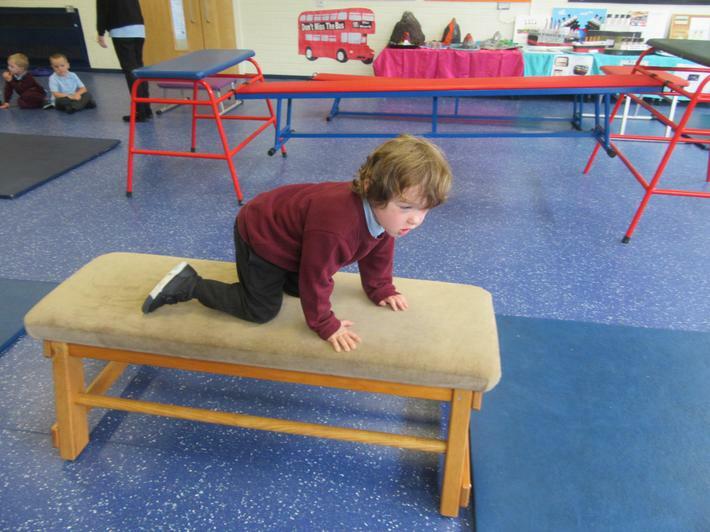 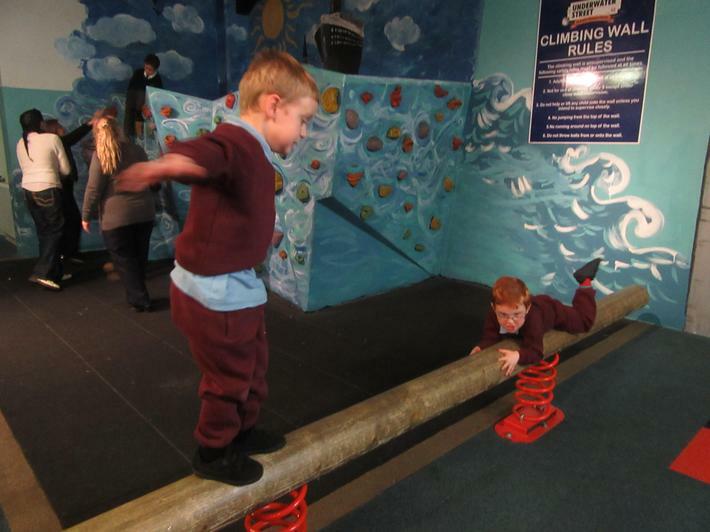 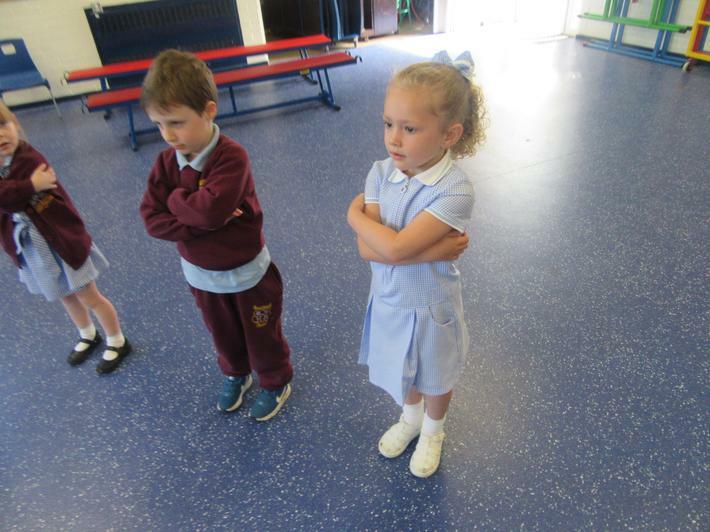 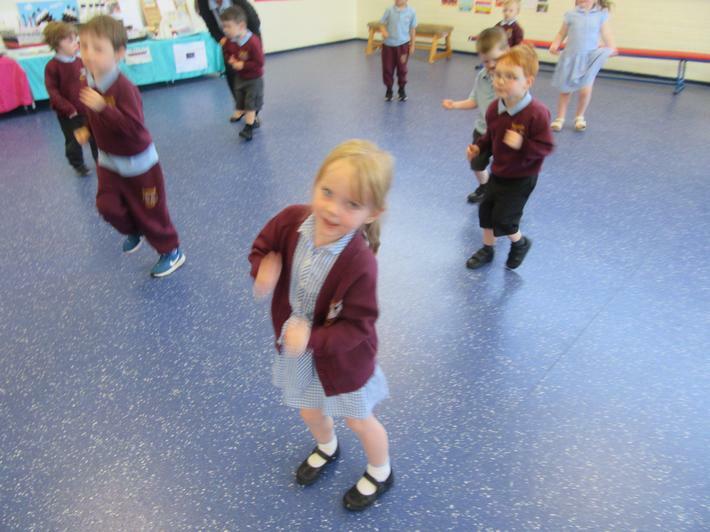 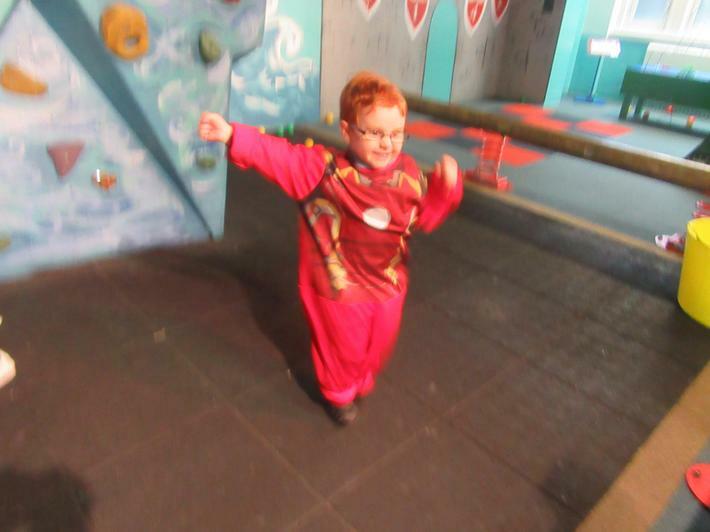 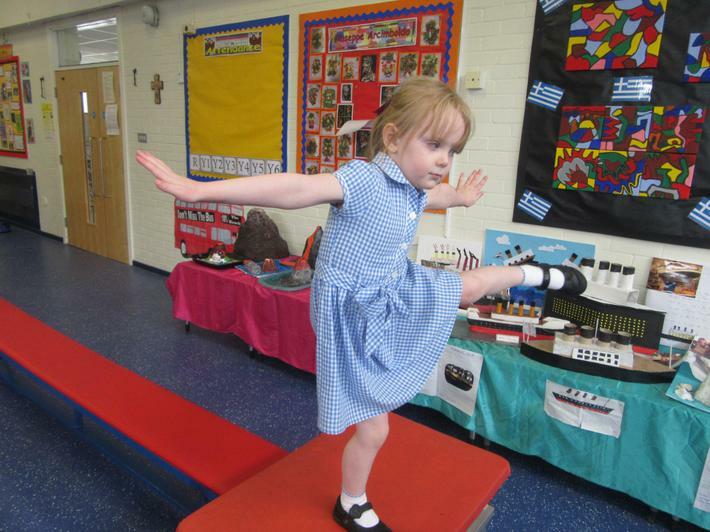 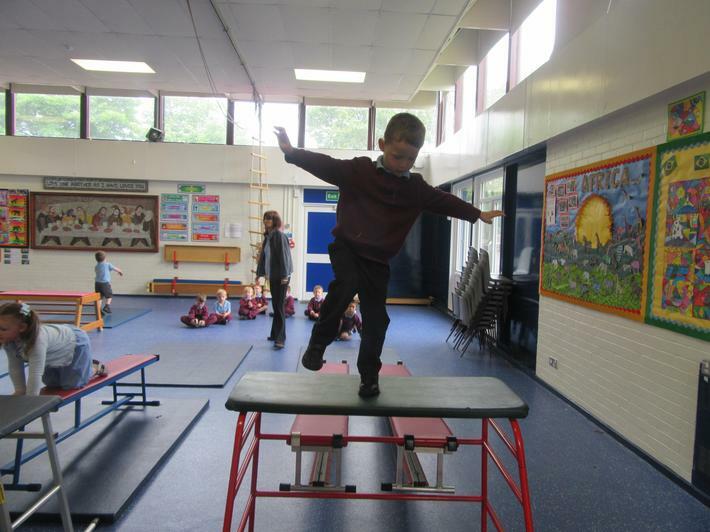 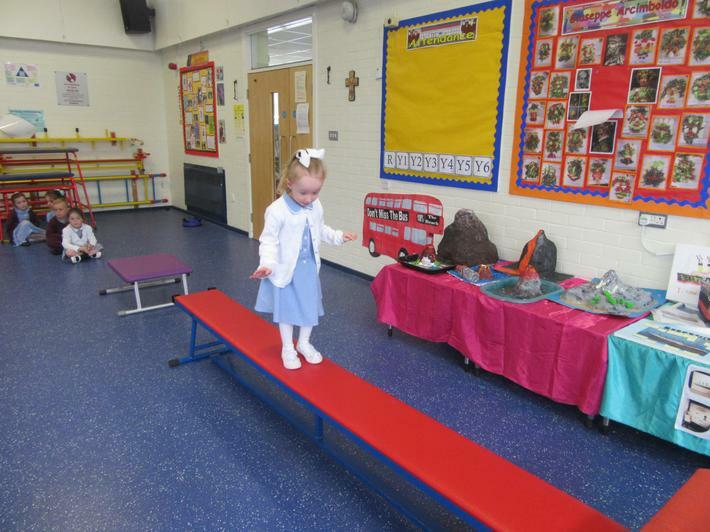 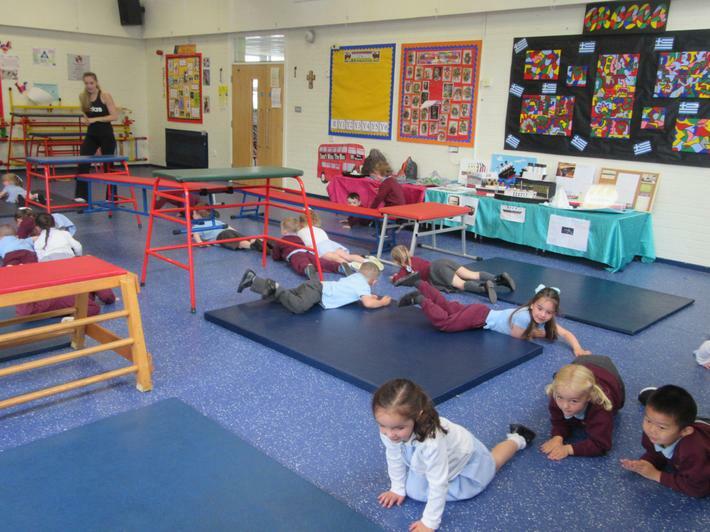 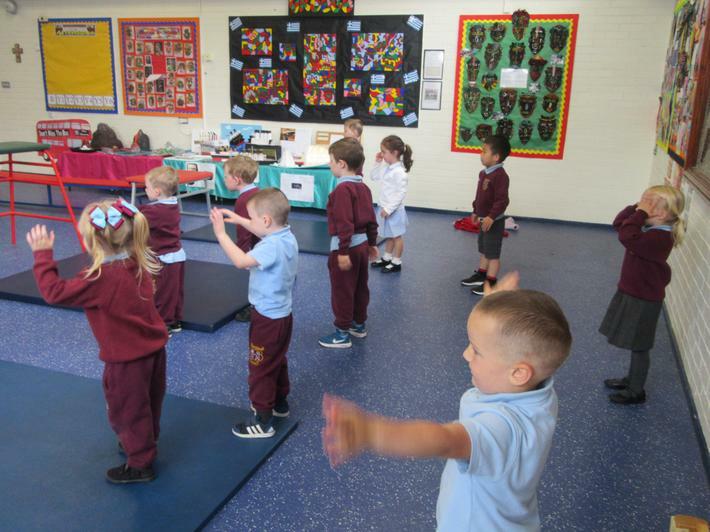 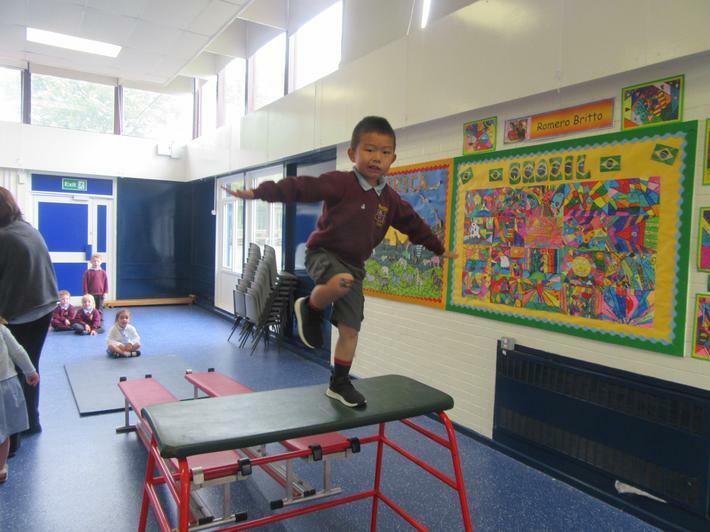 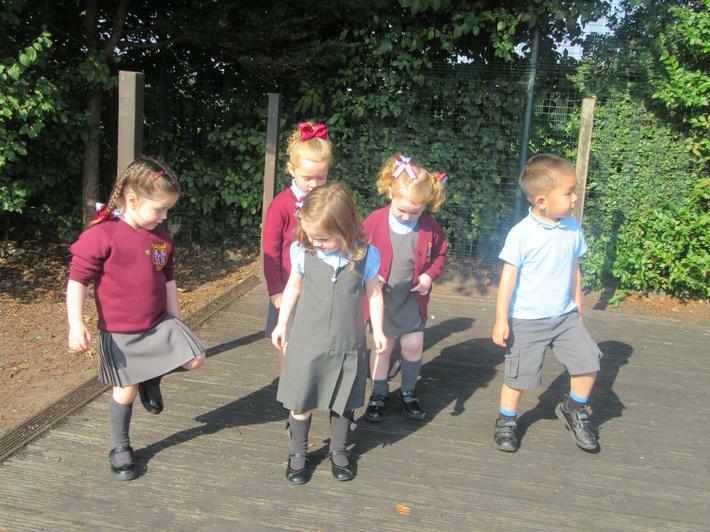 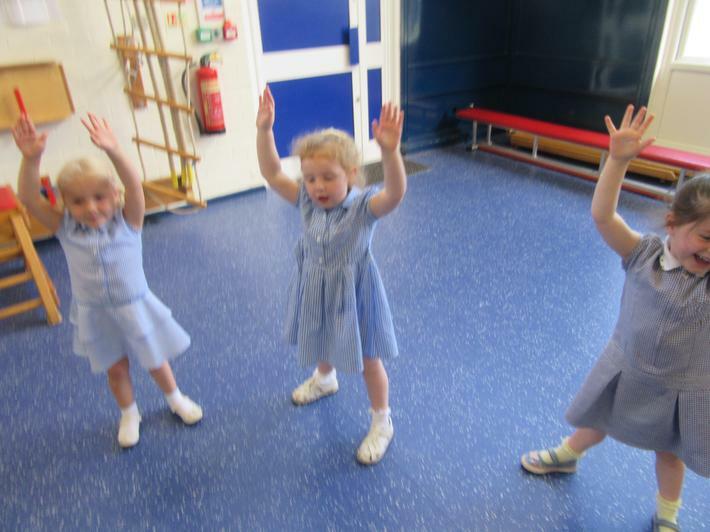 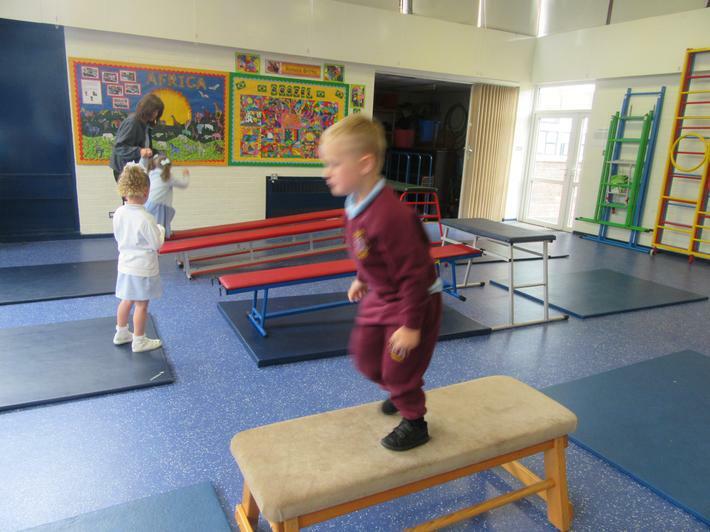 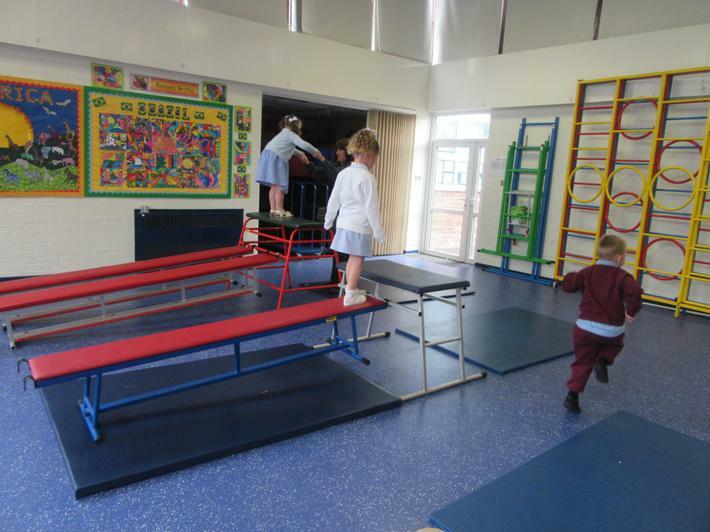 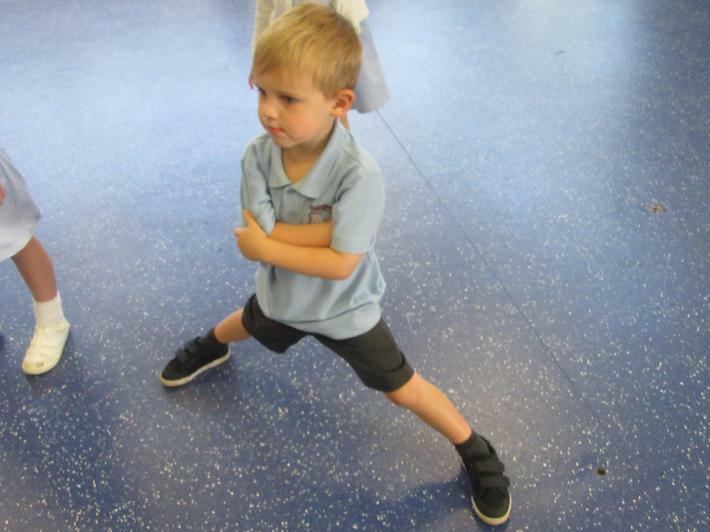 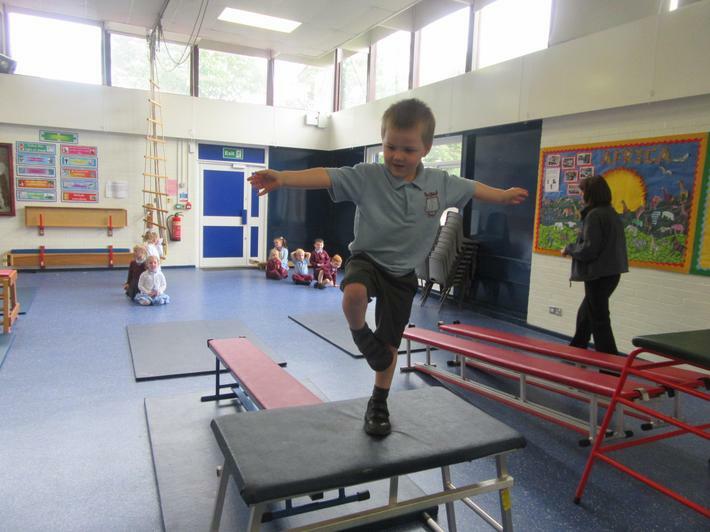 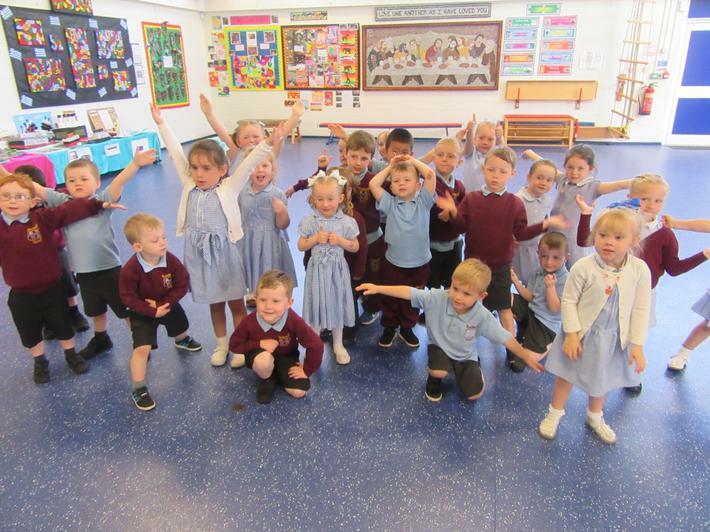 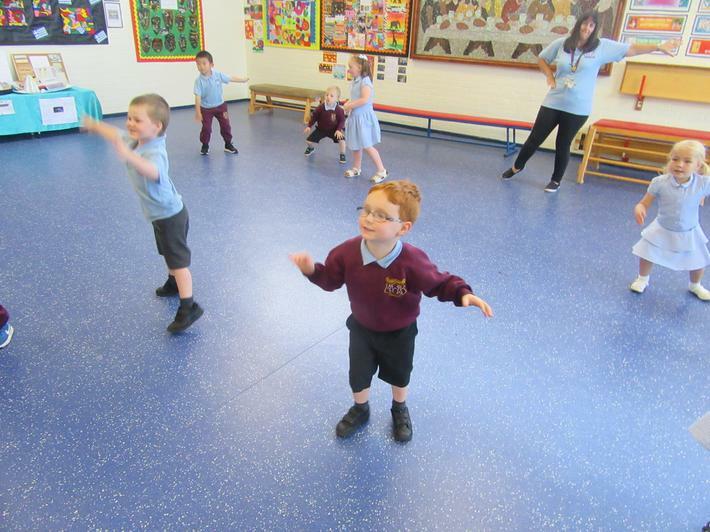 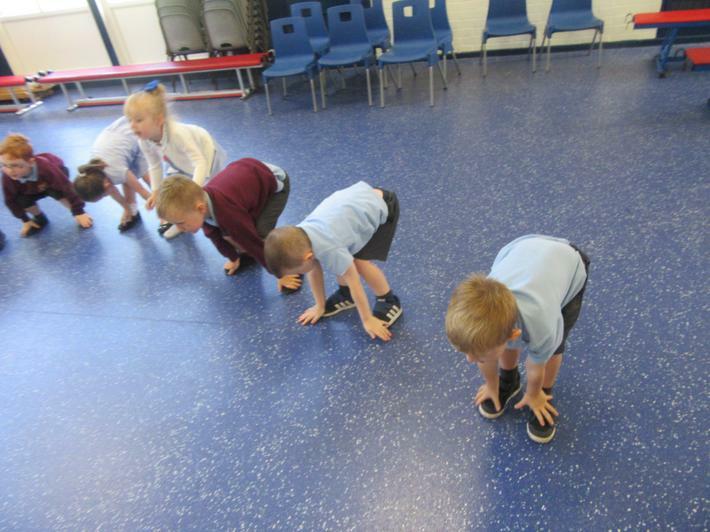 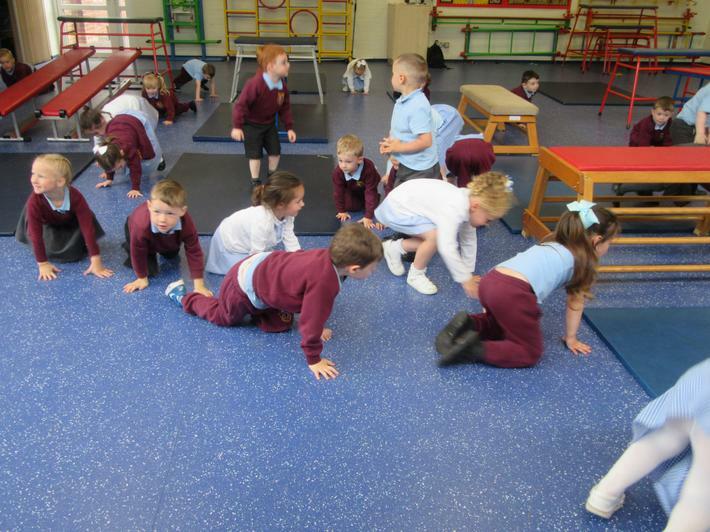 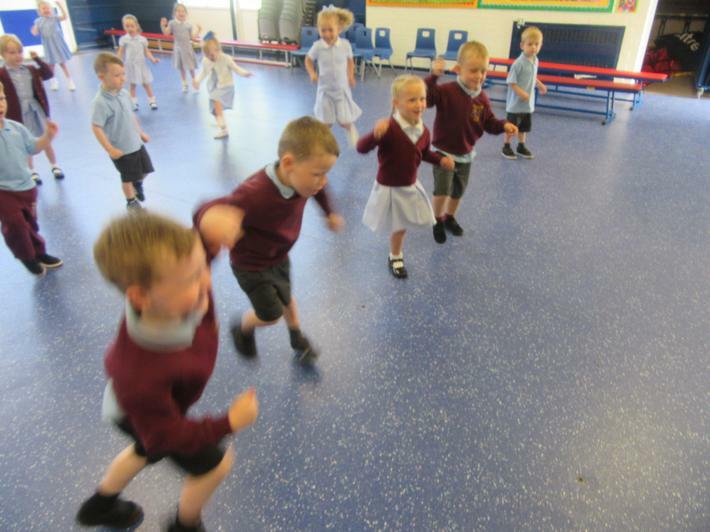 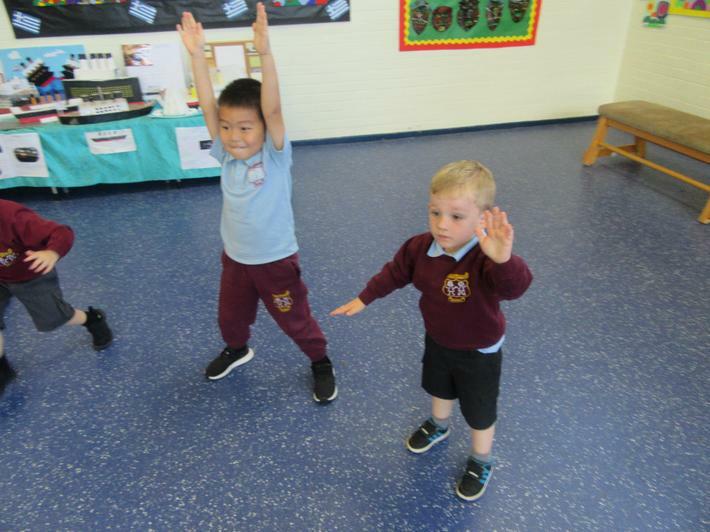 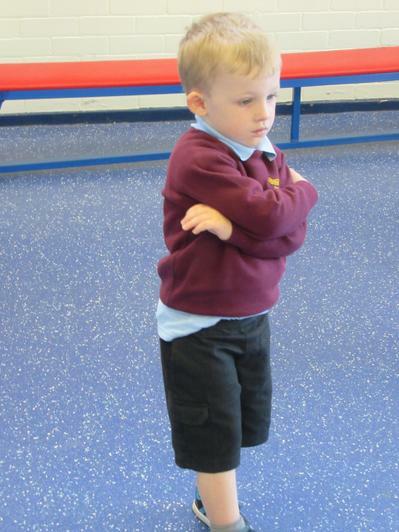 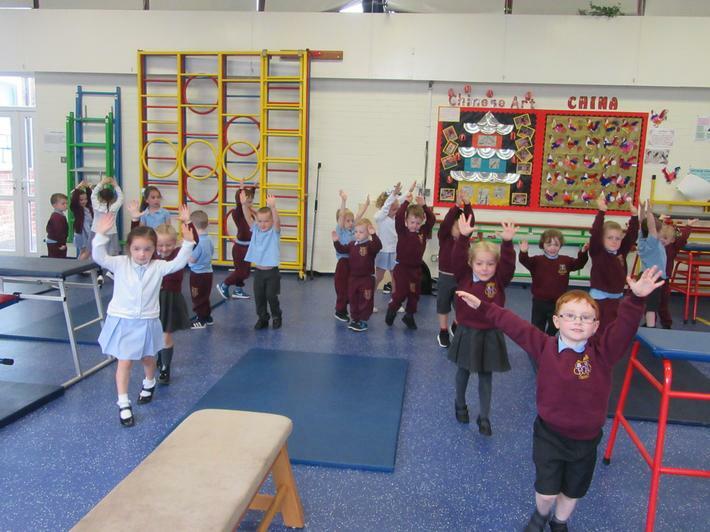 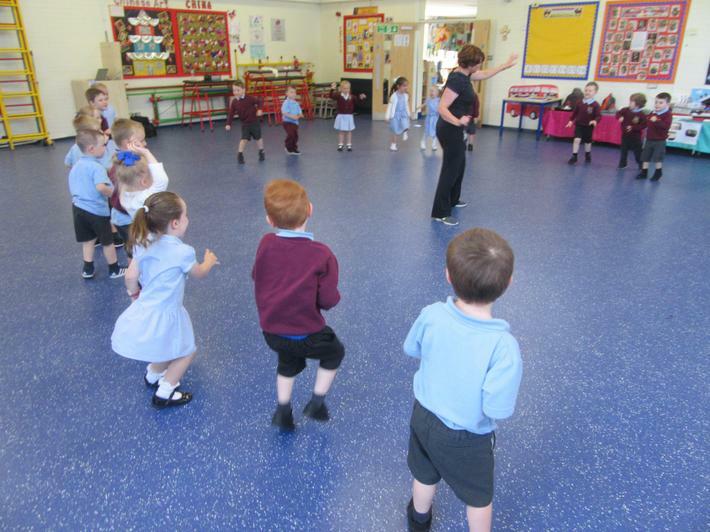 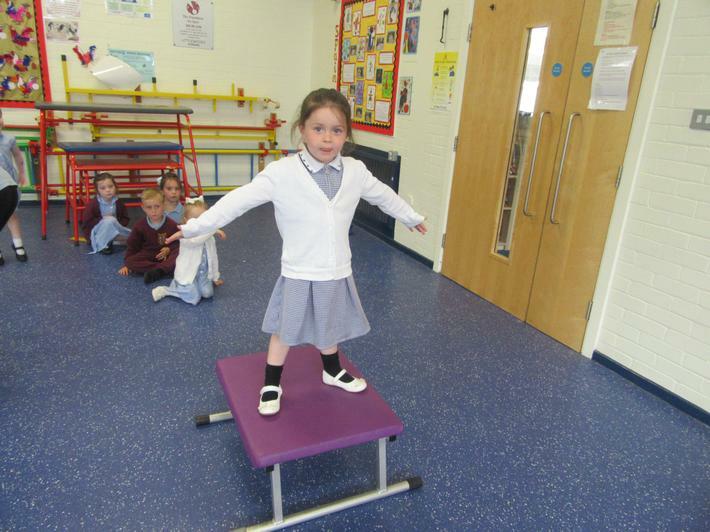 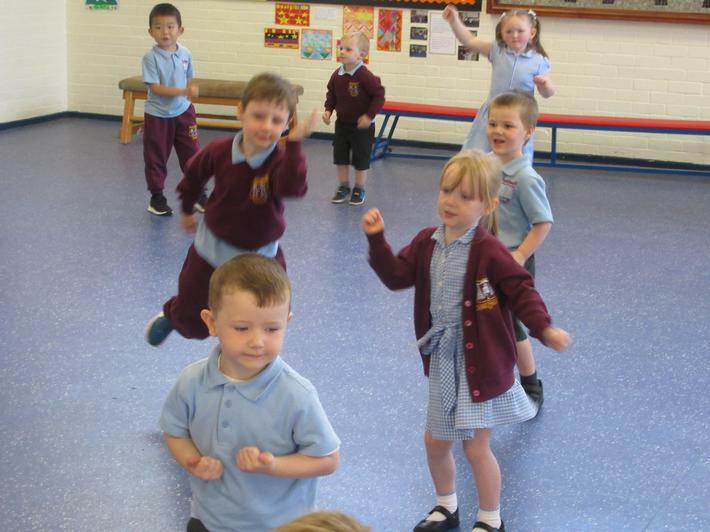 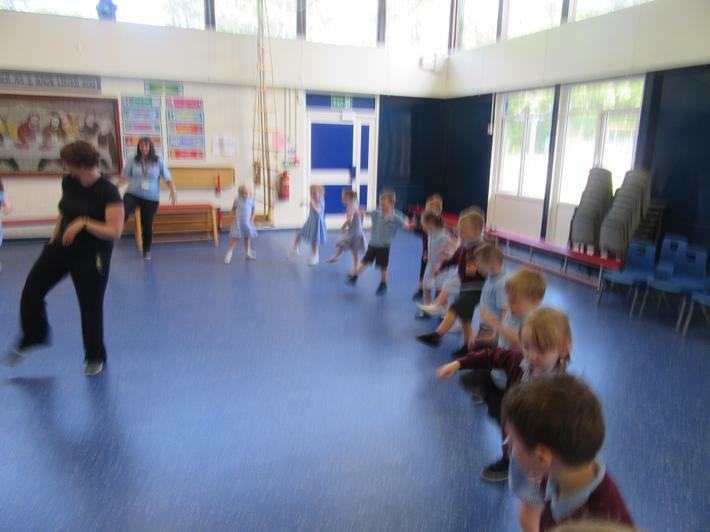 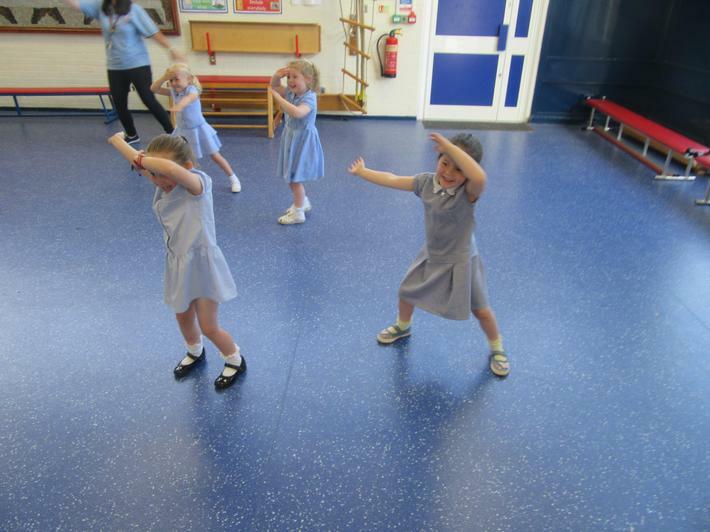 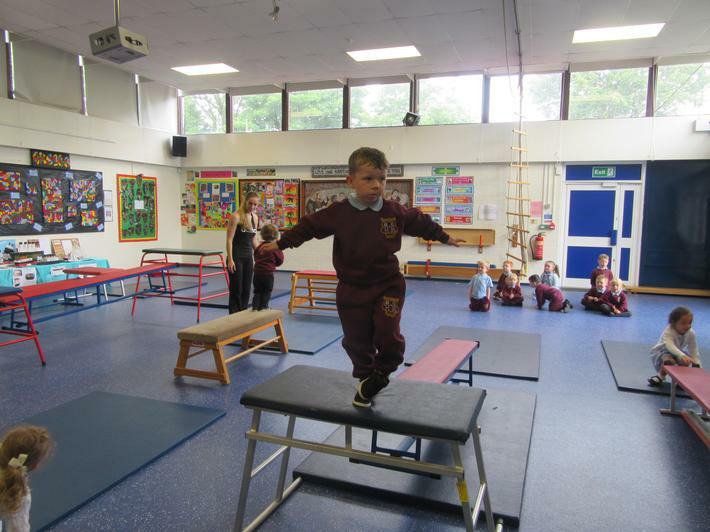 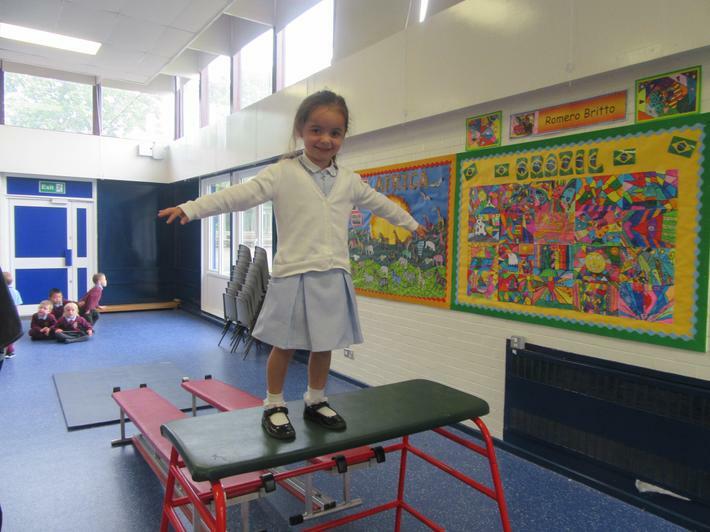 During our Healthy and Active Weeks we took part in Gymnastics, Dance and daily exercises. 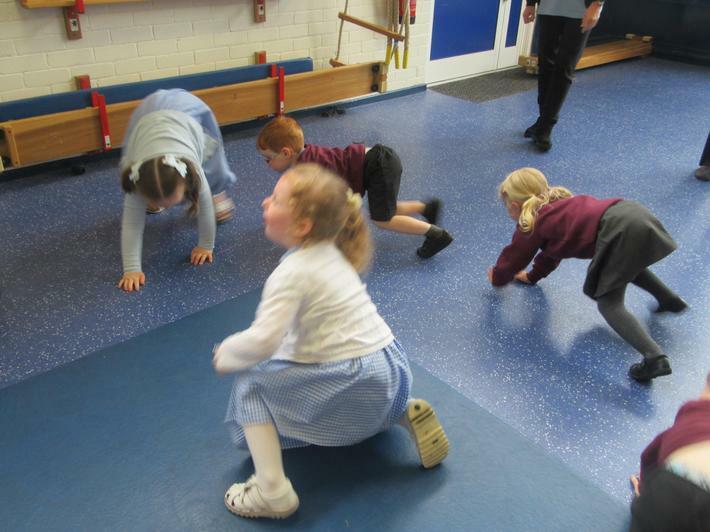 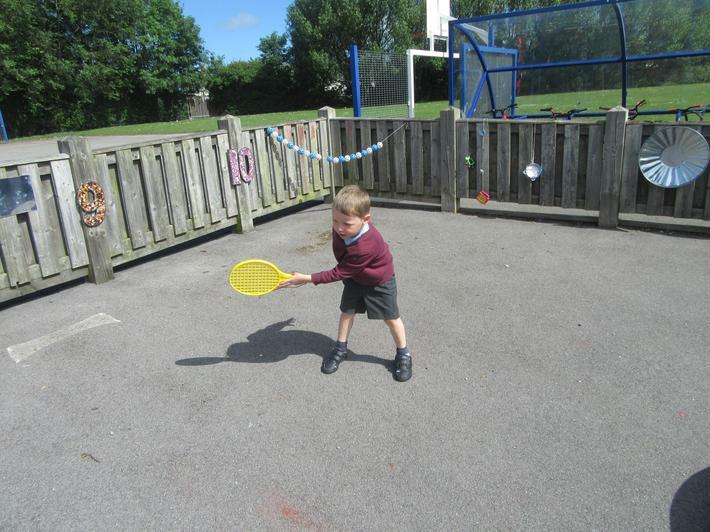 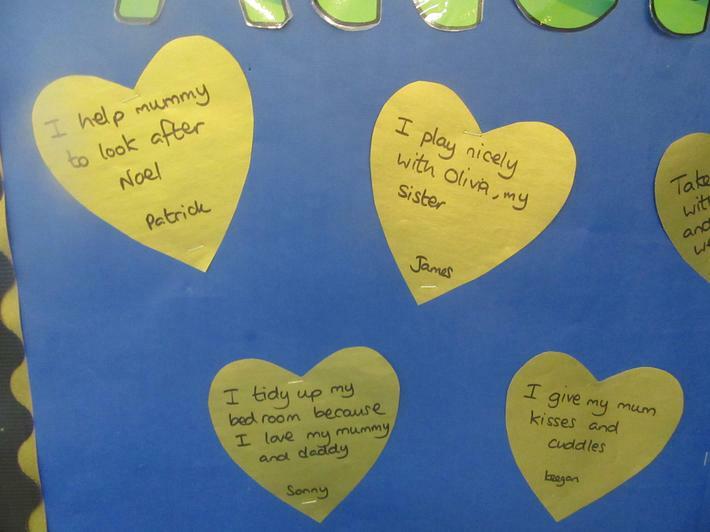 We also found out about what else we need to do to stay fit and healthy. 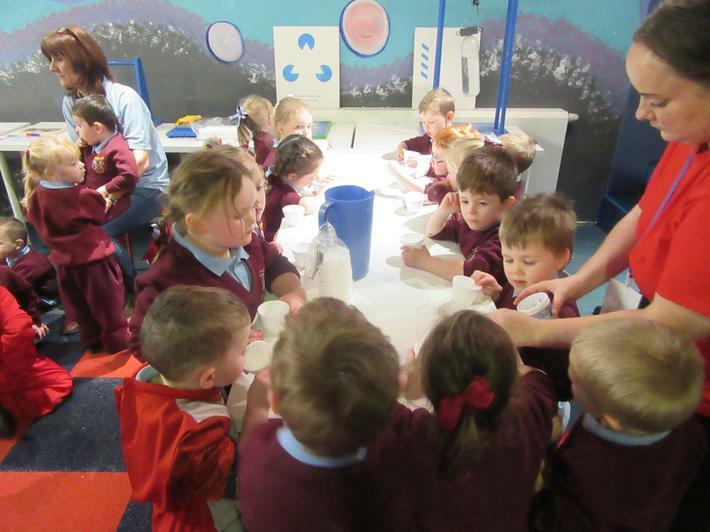 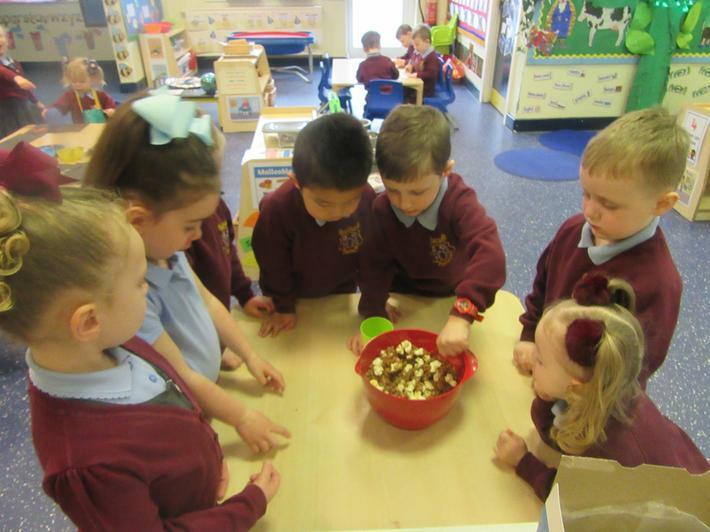 We know the importance of washing our hands, looking after our teeth and eating a variety of food. 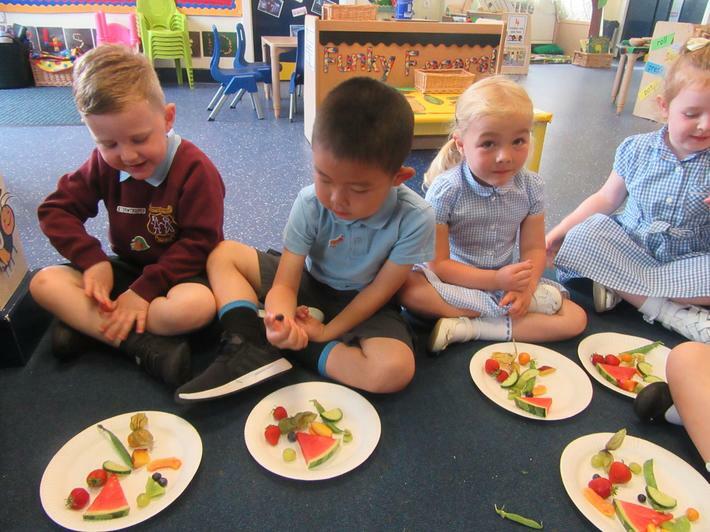 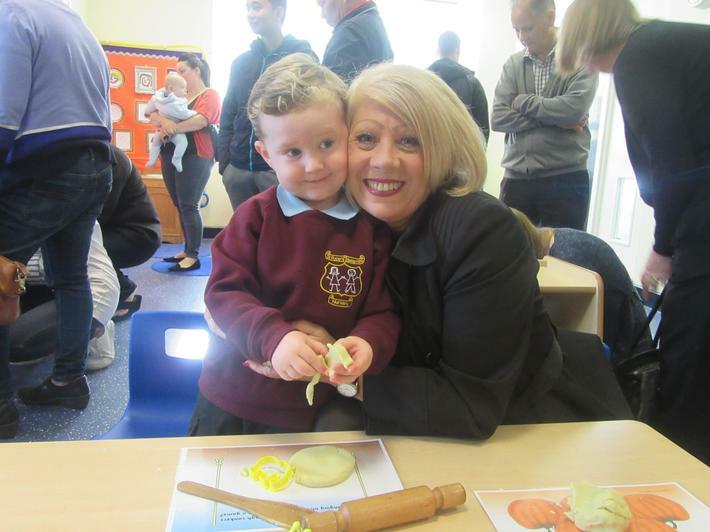 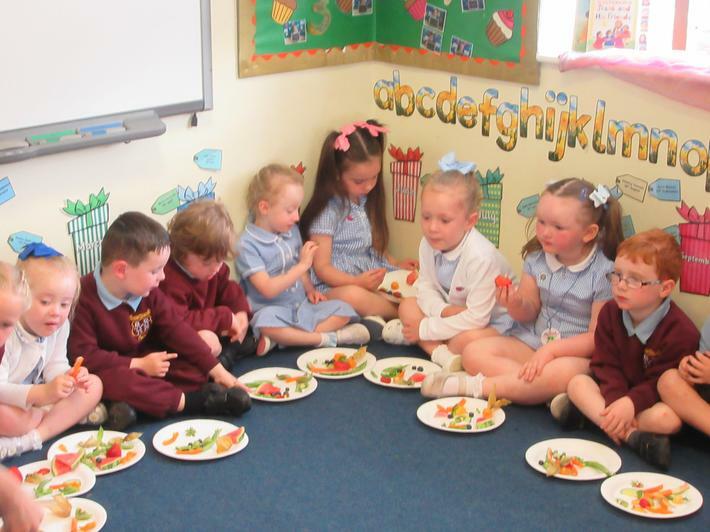 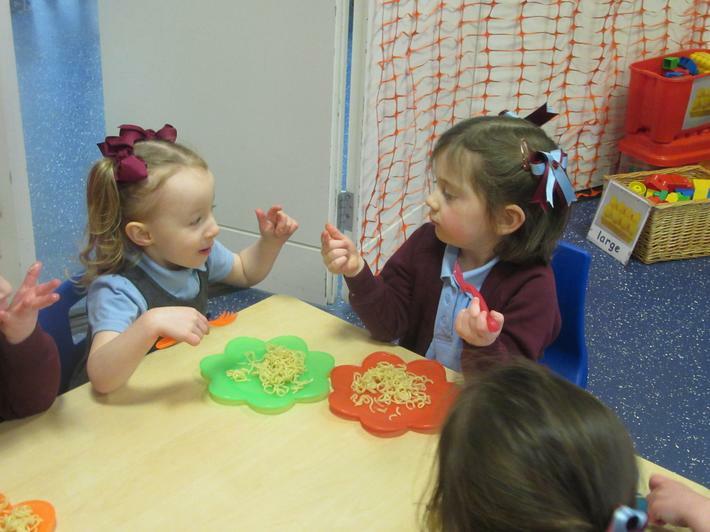 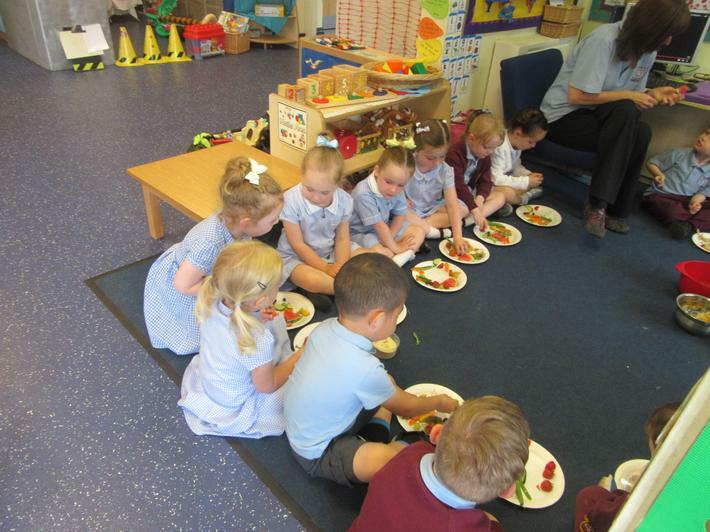 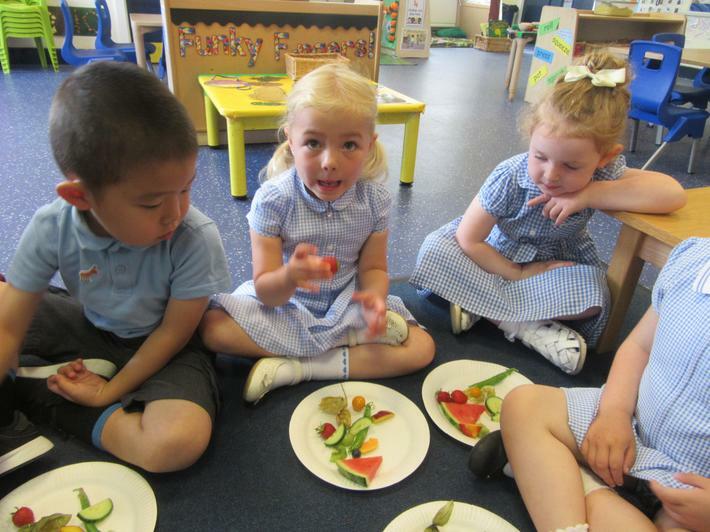 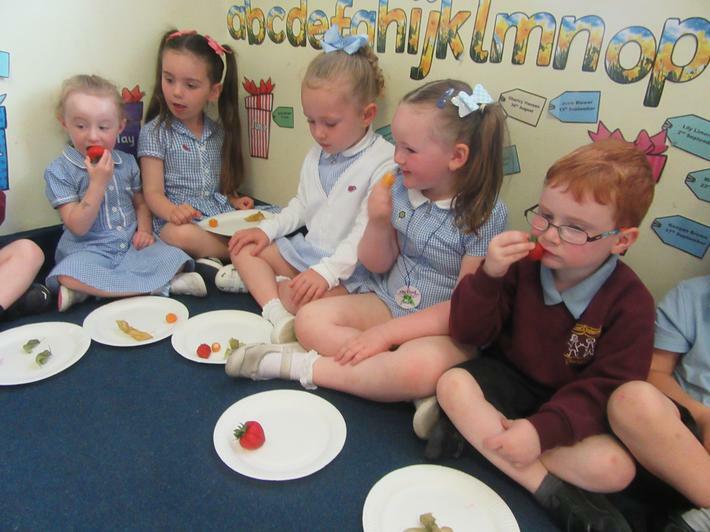 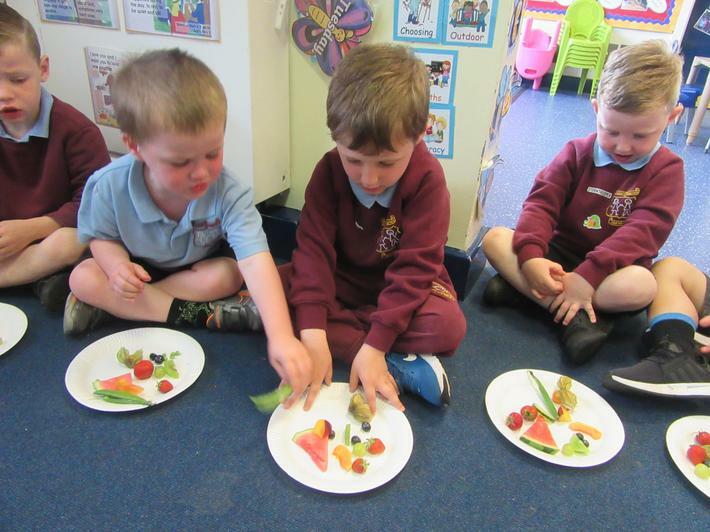 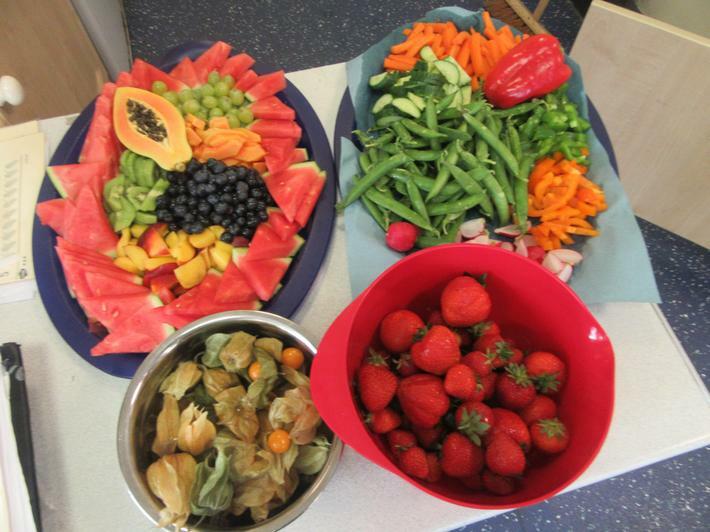 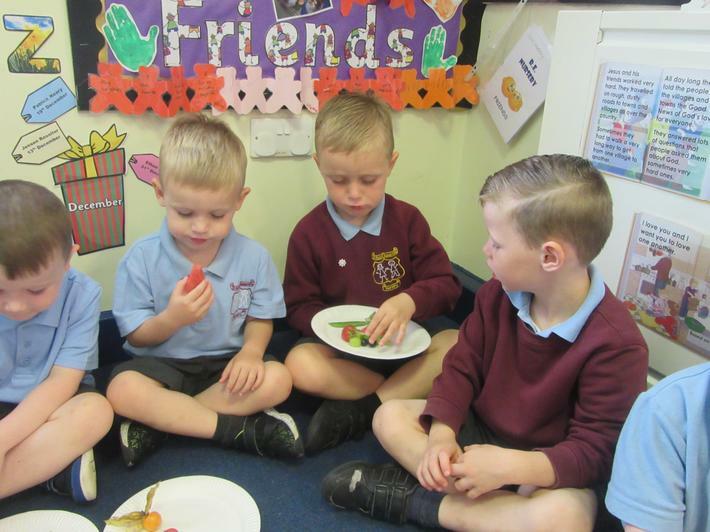 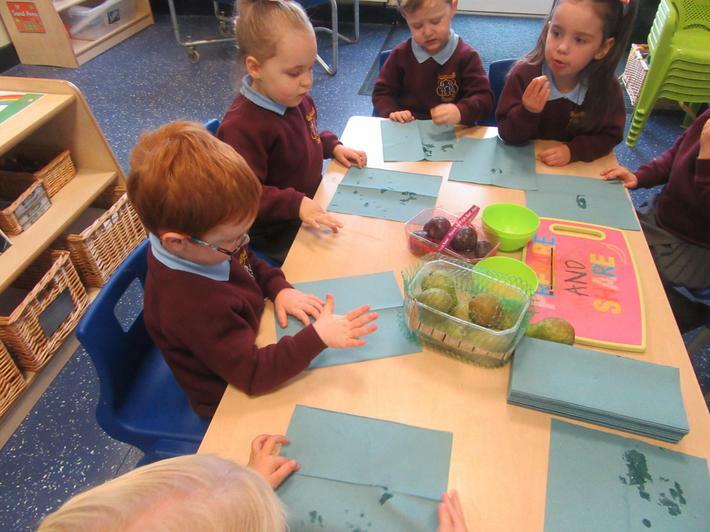 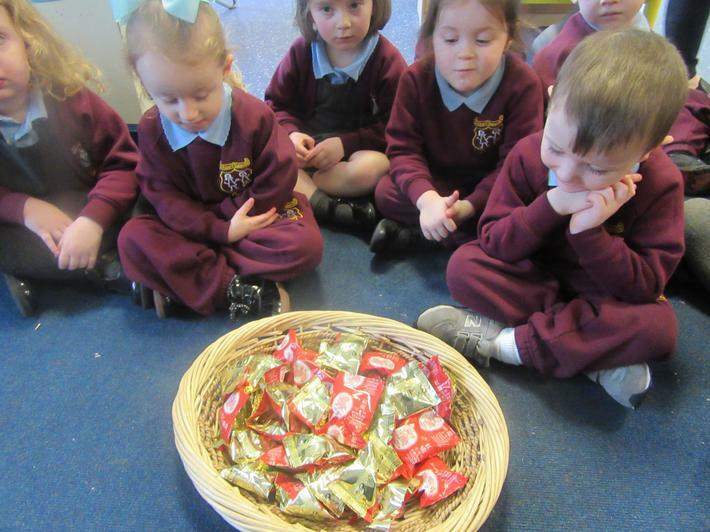 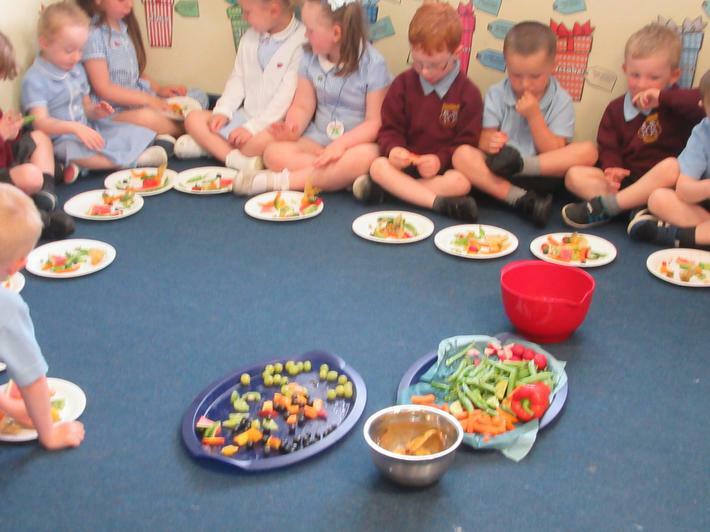 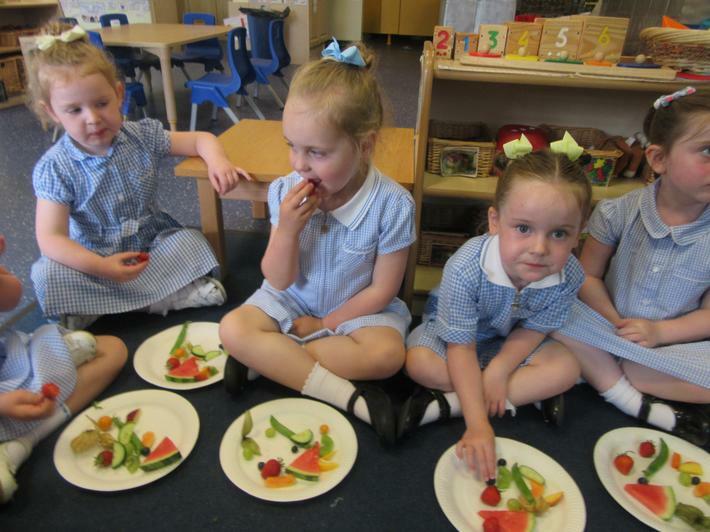 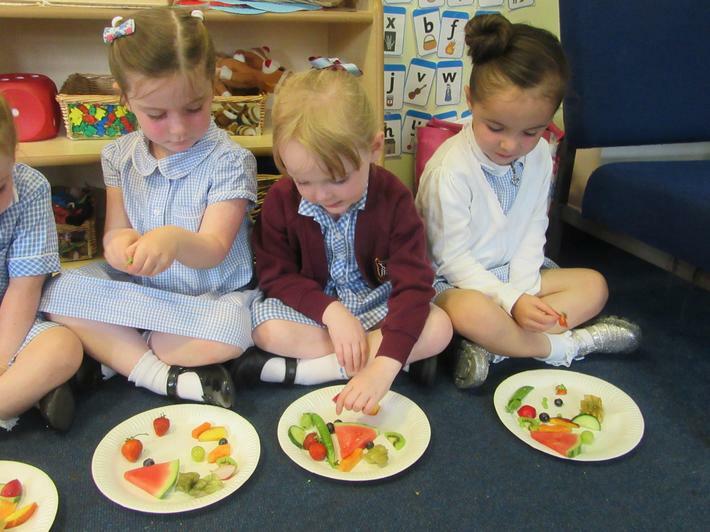 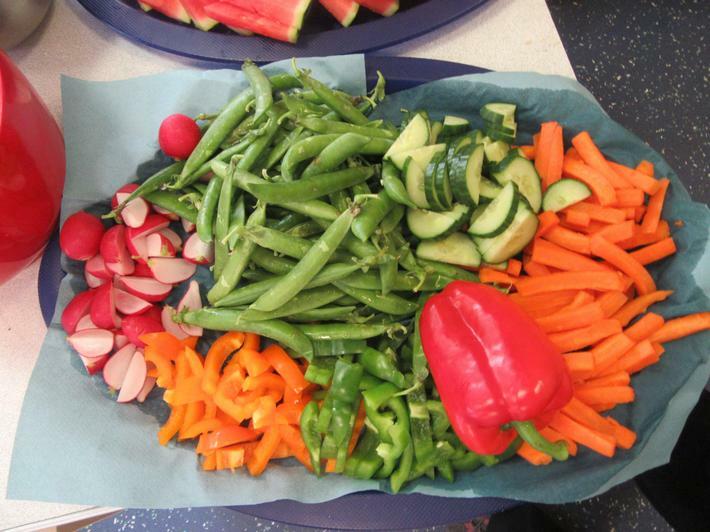 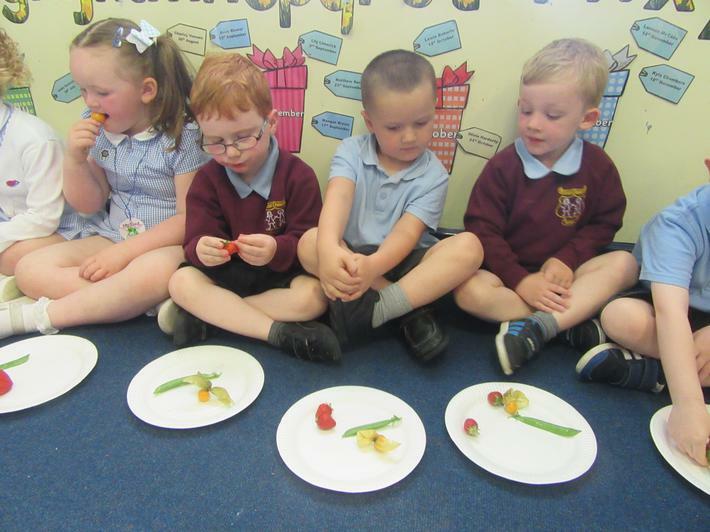 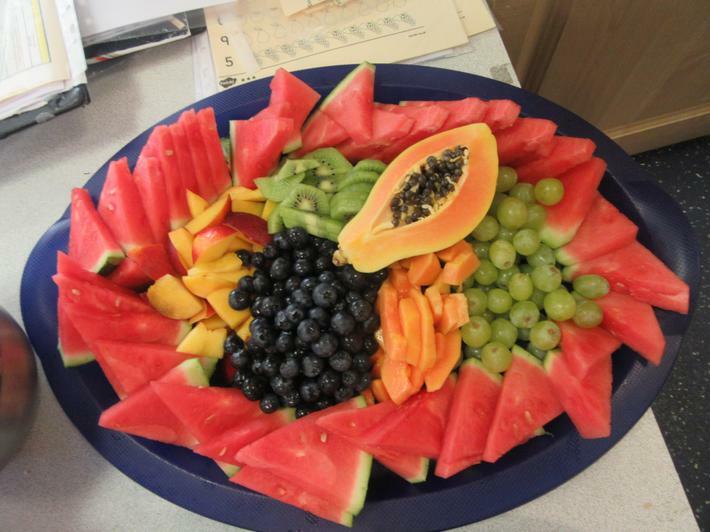 We had a delicious food tasting lesson and ate different fruit and vegetables - some were crunchy, some were soft, some we peeled and some we washed - even if we weren't sure we still tried them! 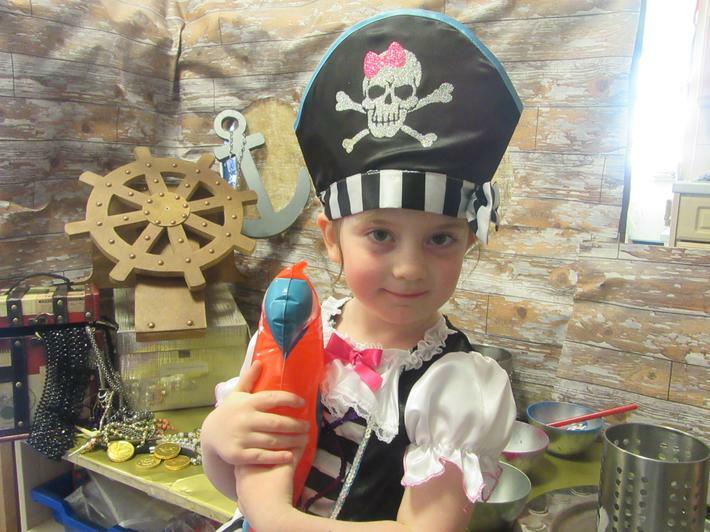 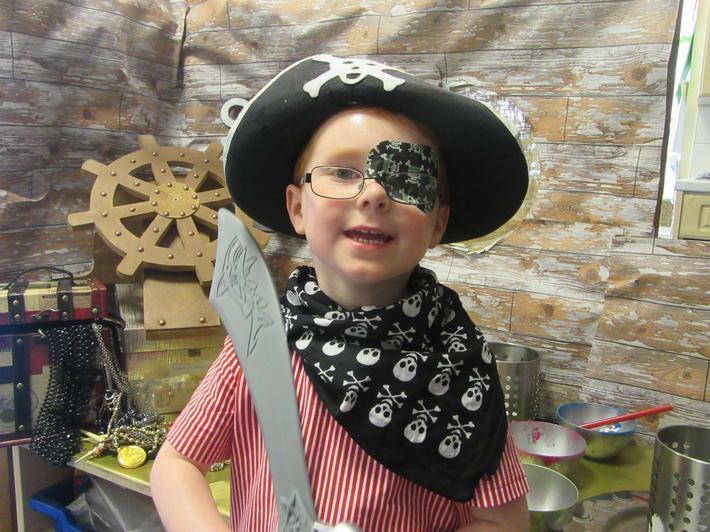 Shiver me timbers....it's Pirate Day! 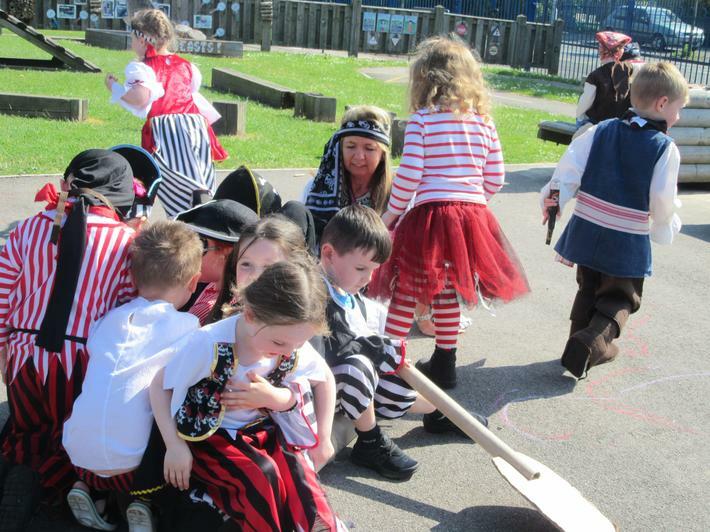 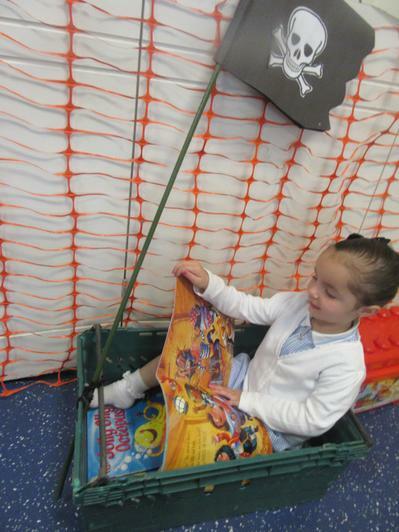 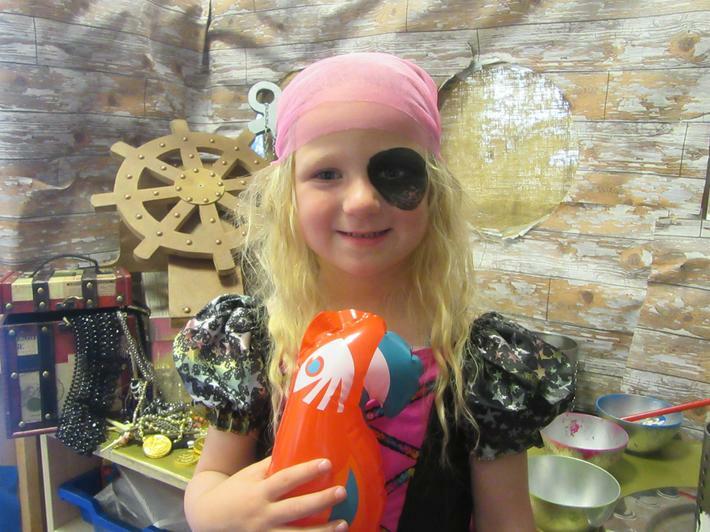 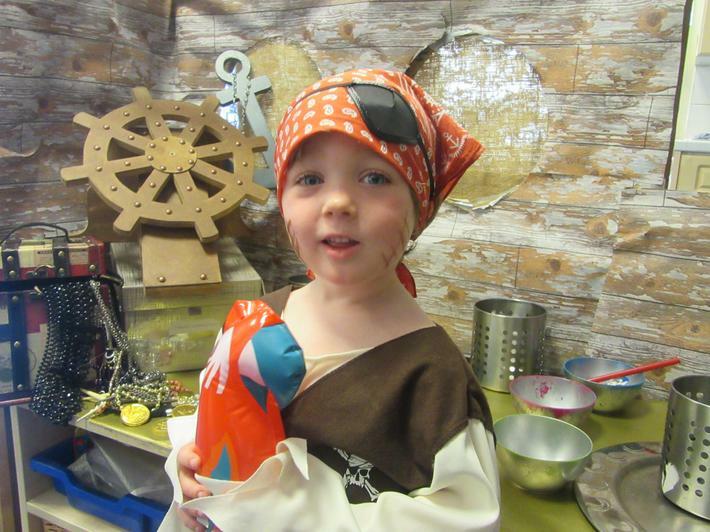 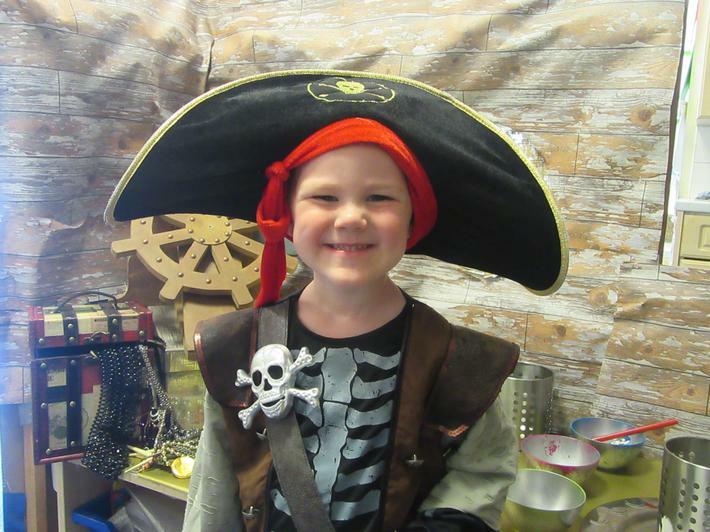 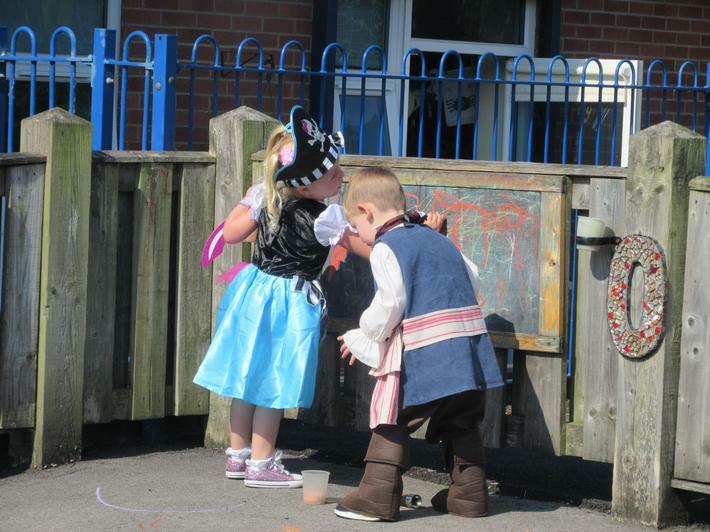 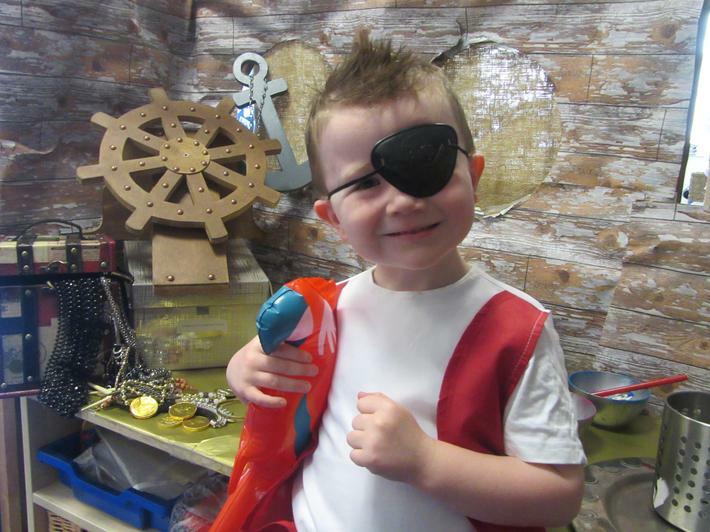 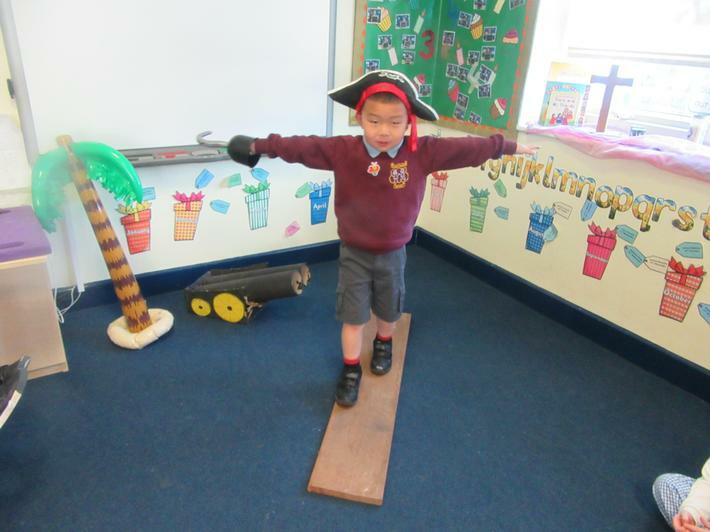 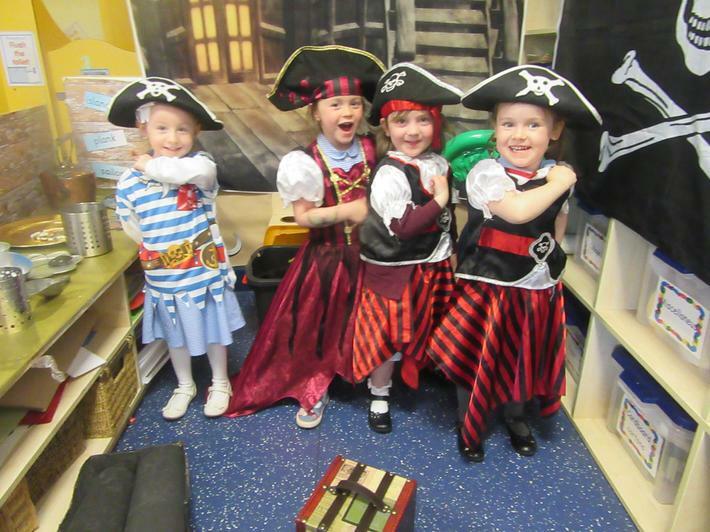 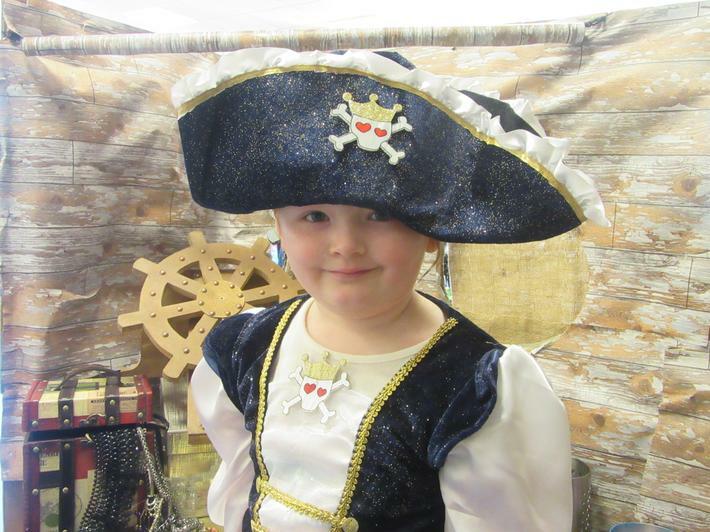 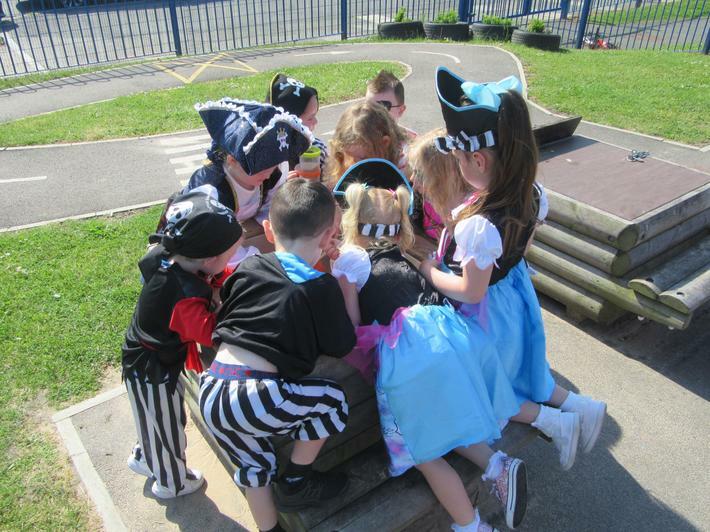 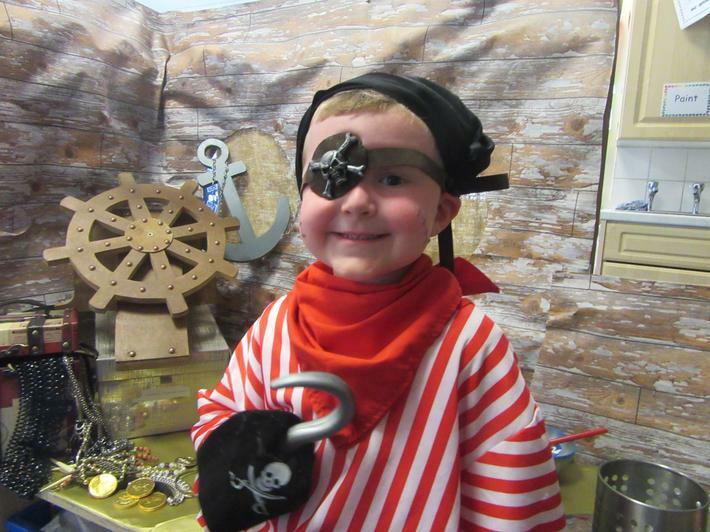 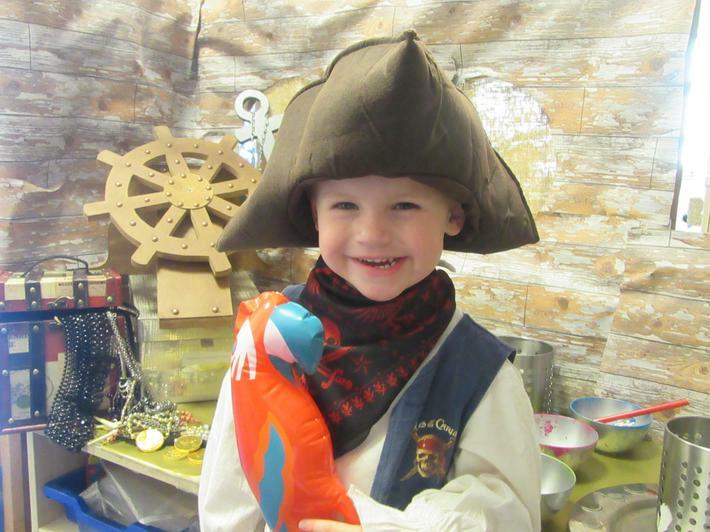 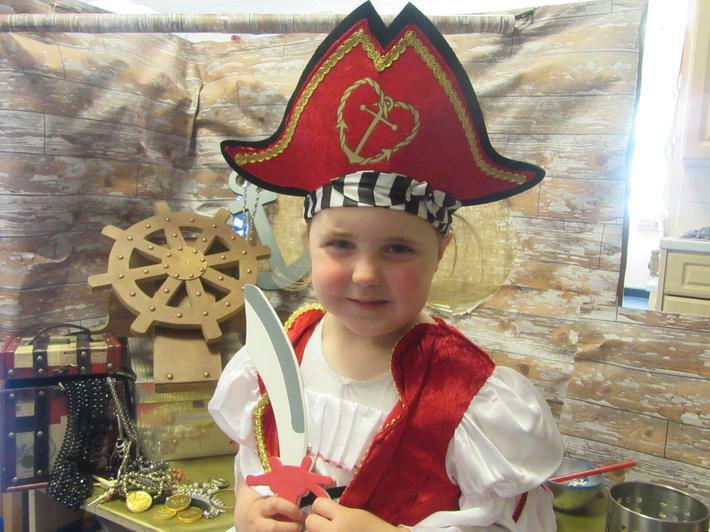 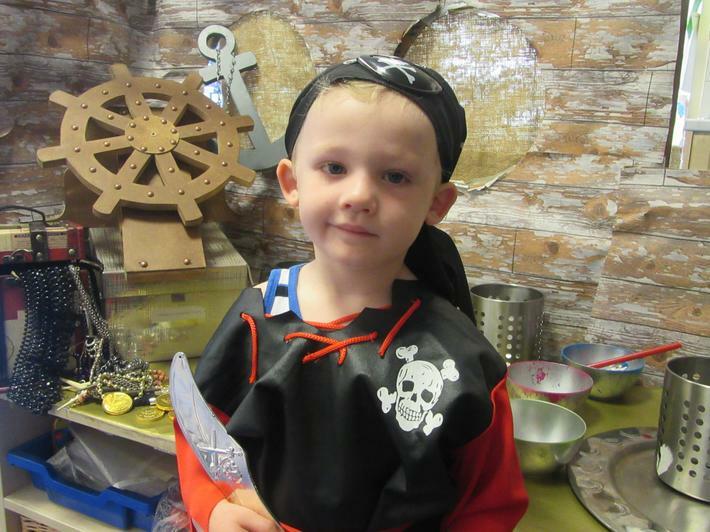 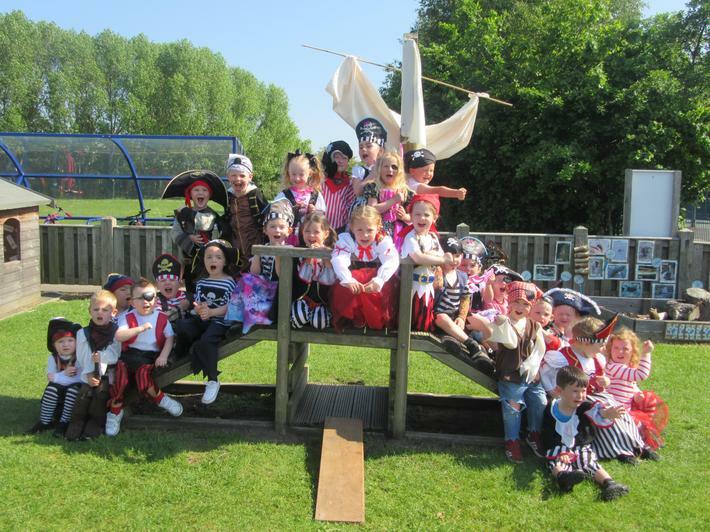 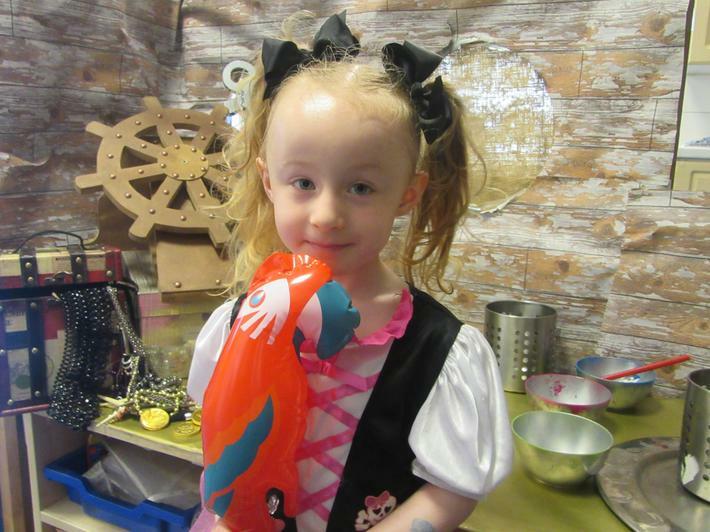 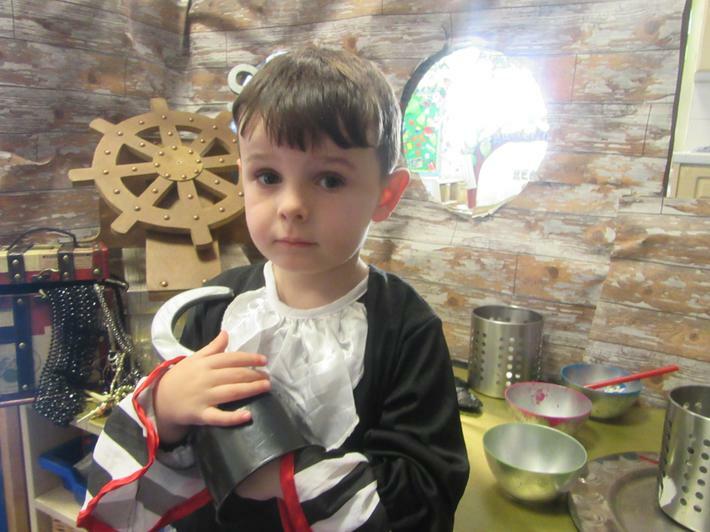 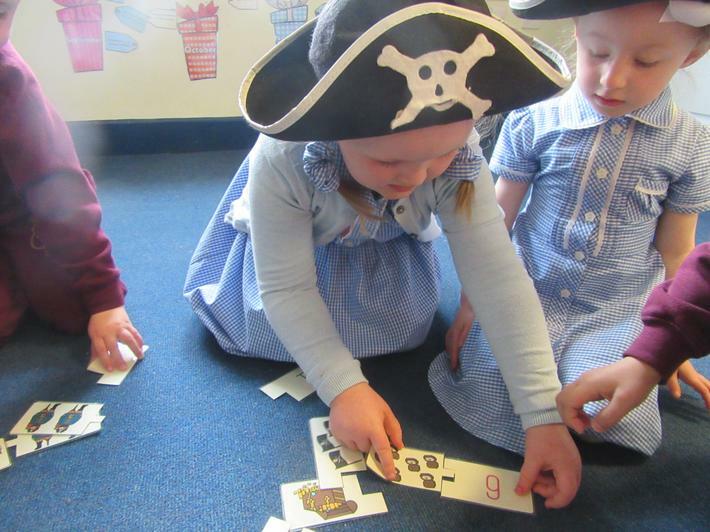 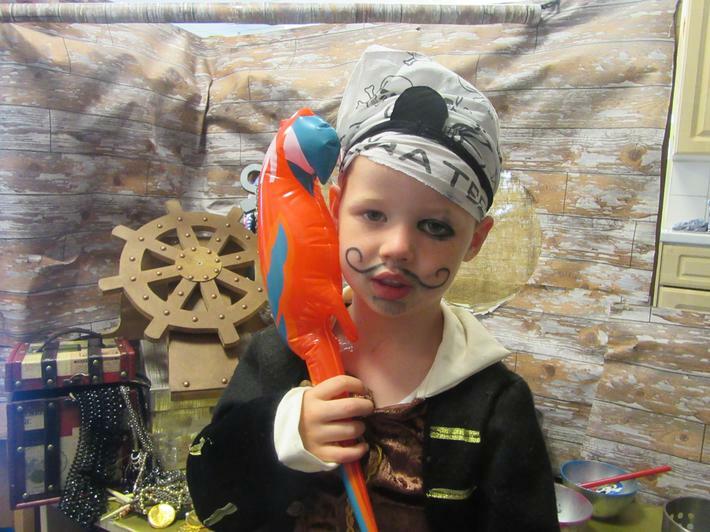 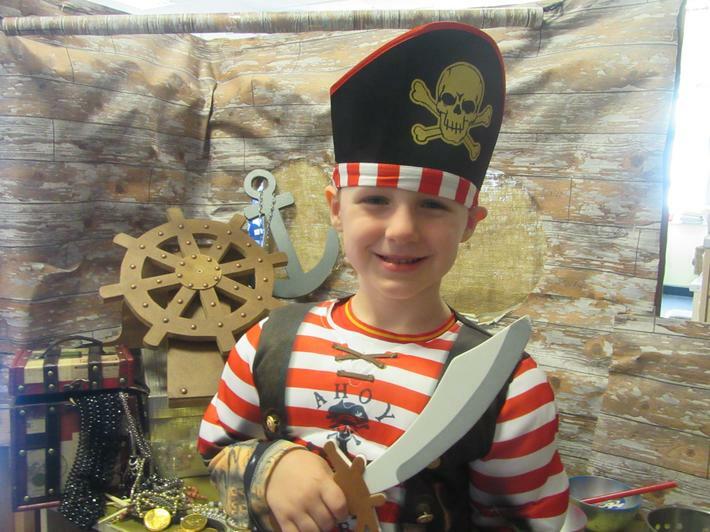 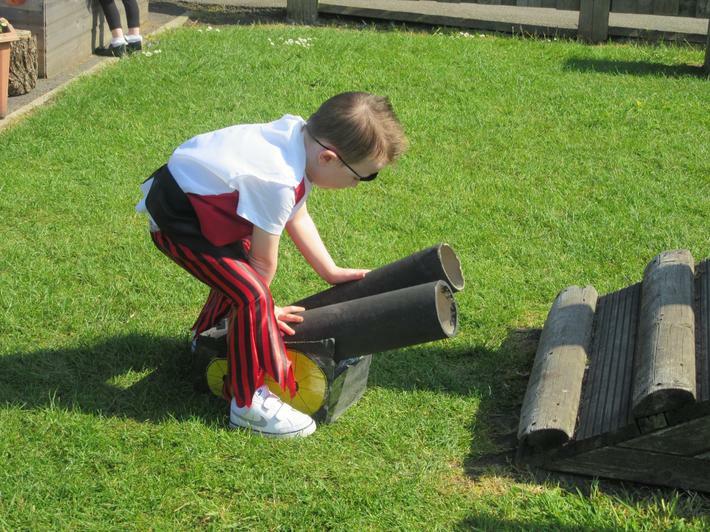 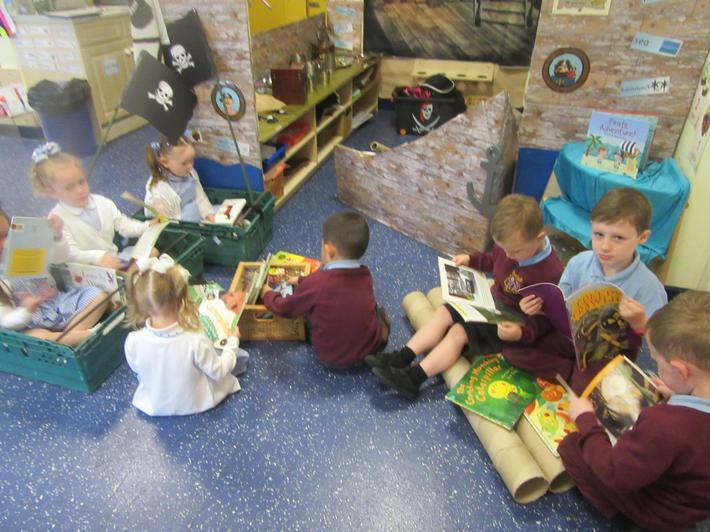 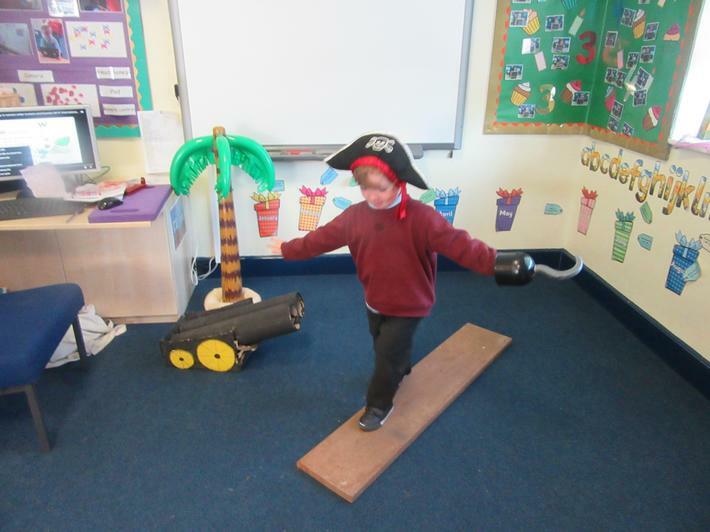 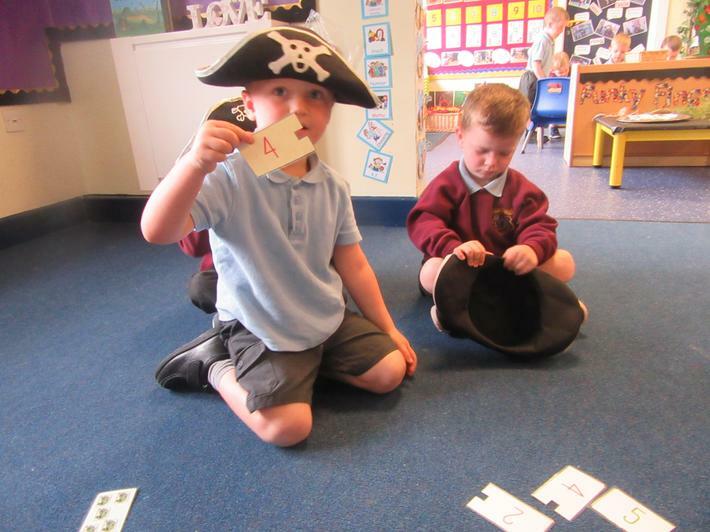 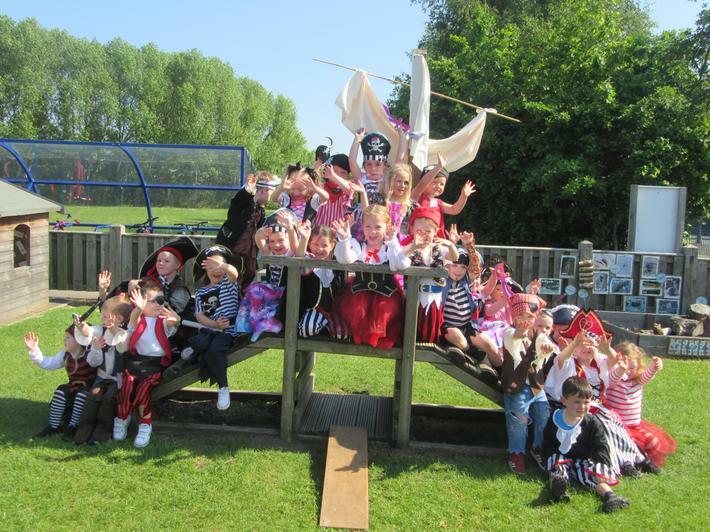 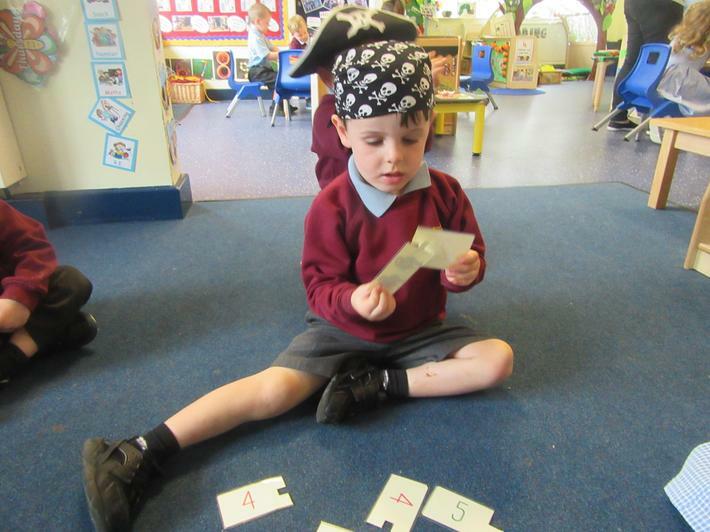 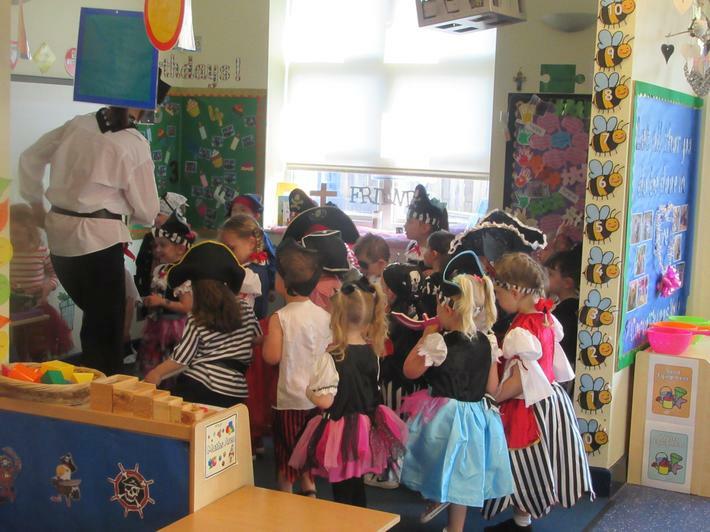 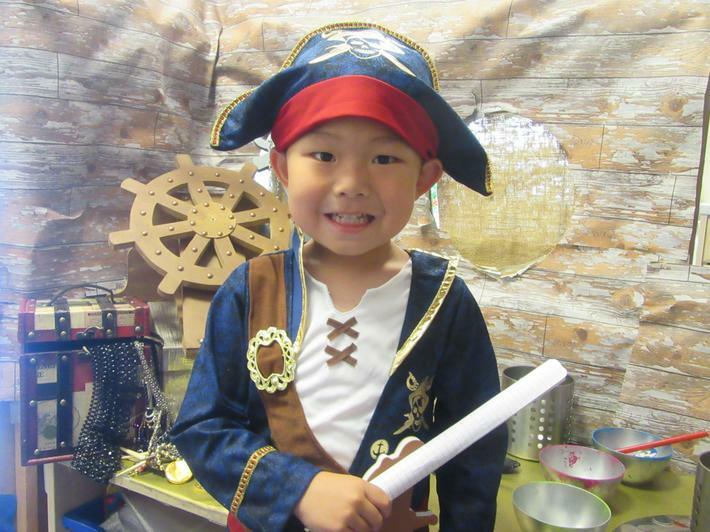 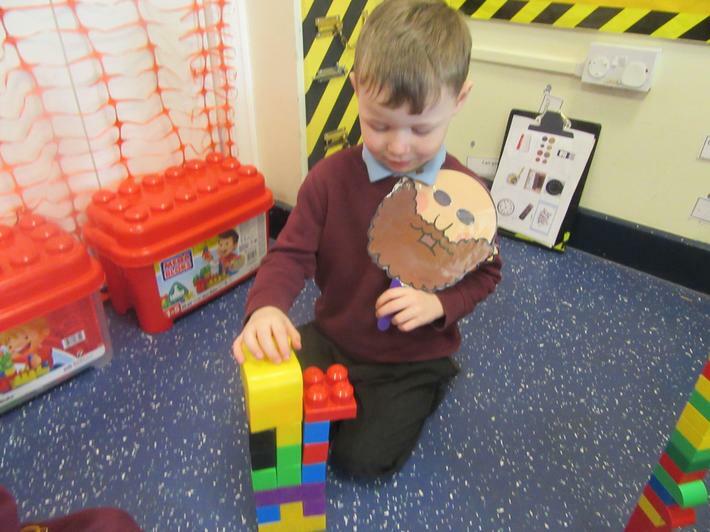 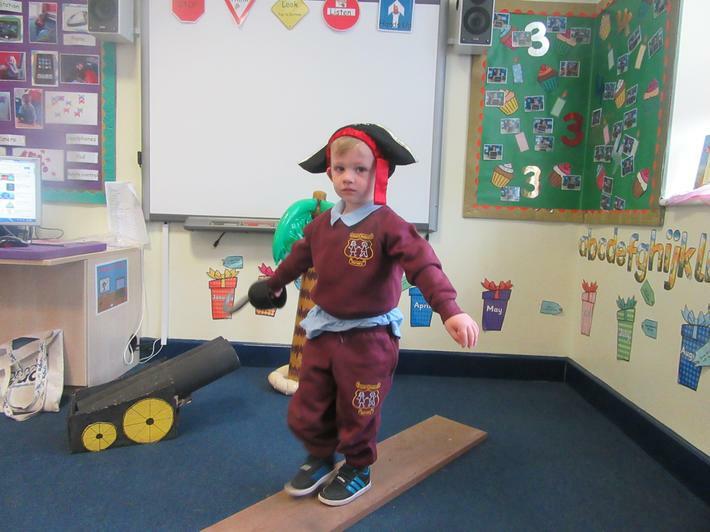 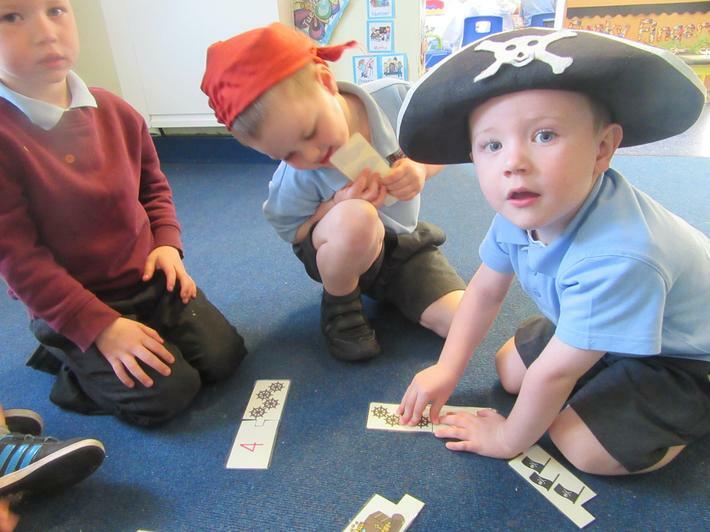 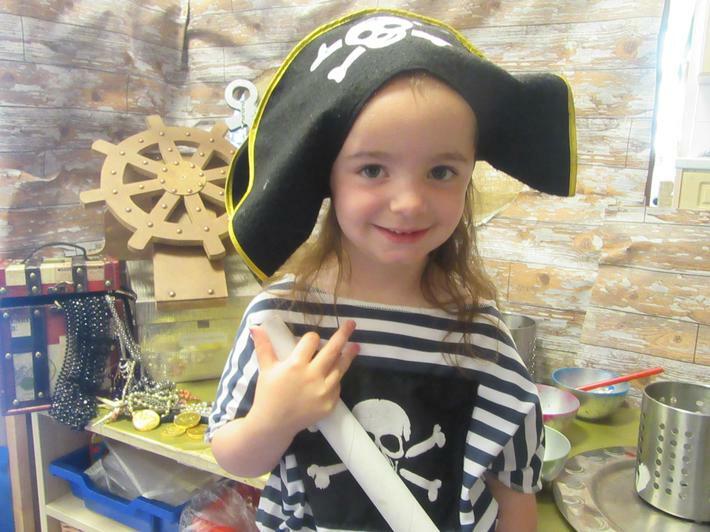 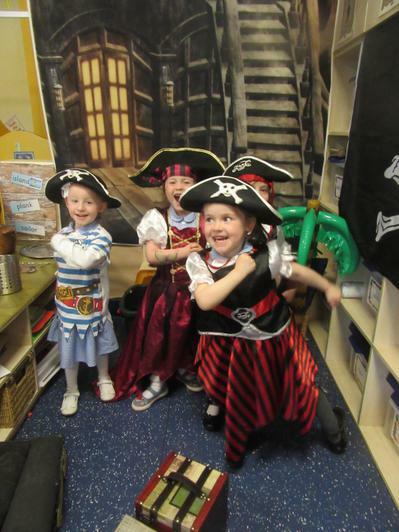 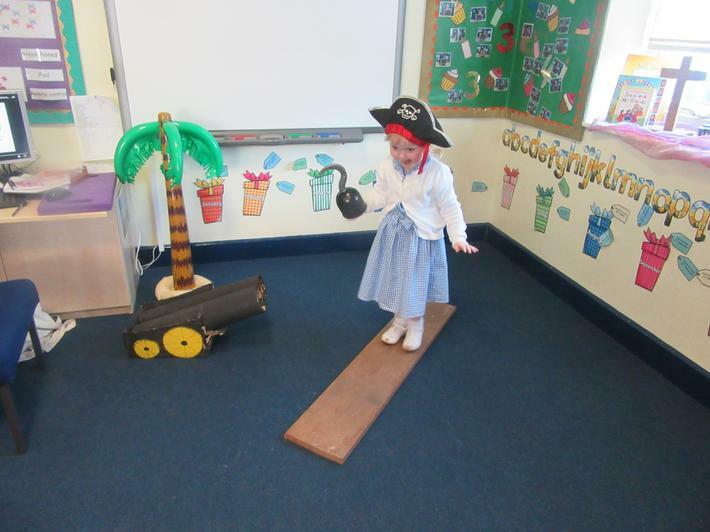 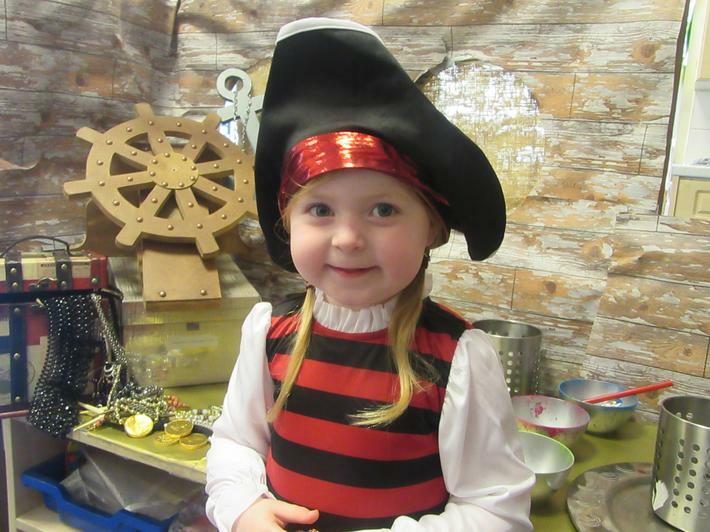 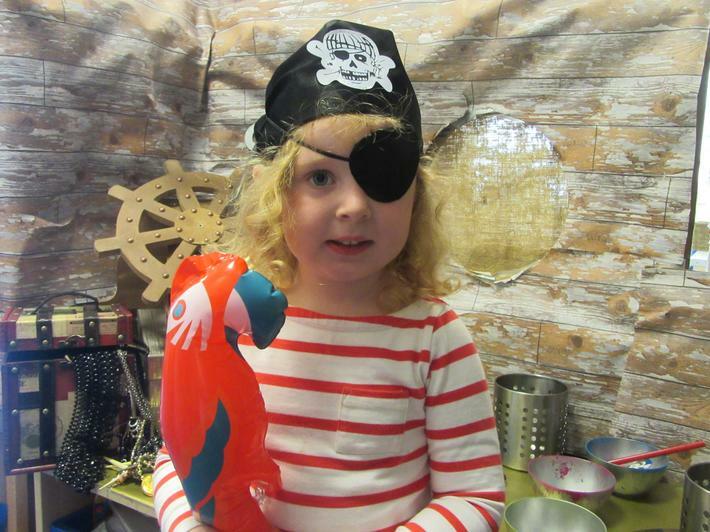 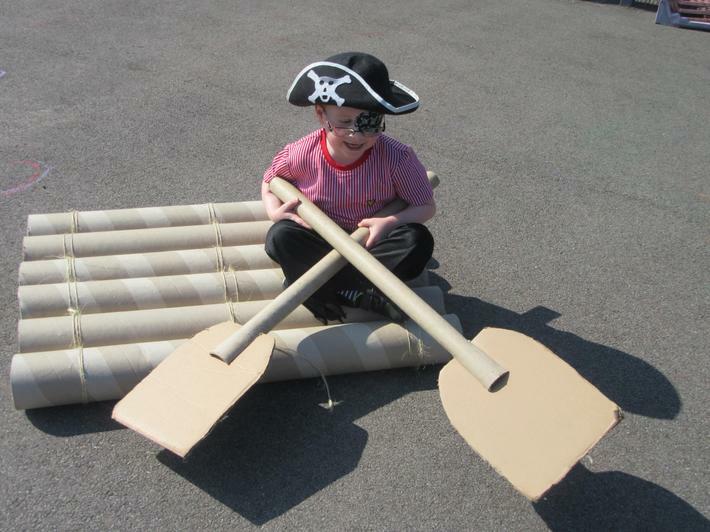 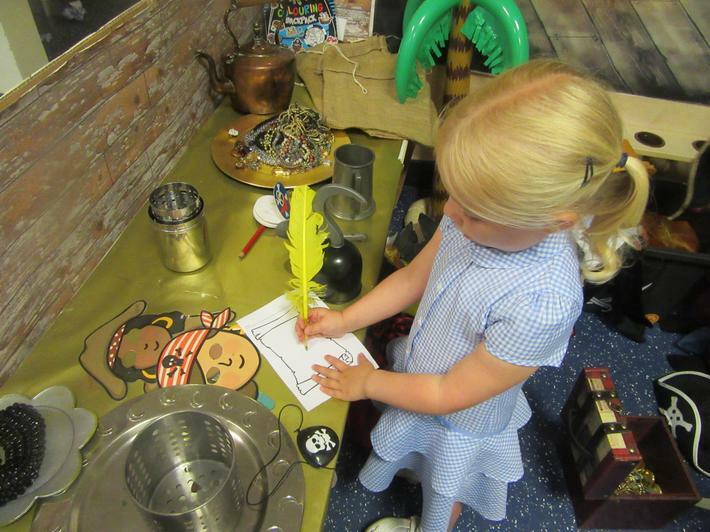 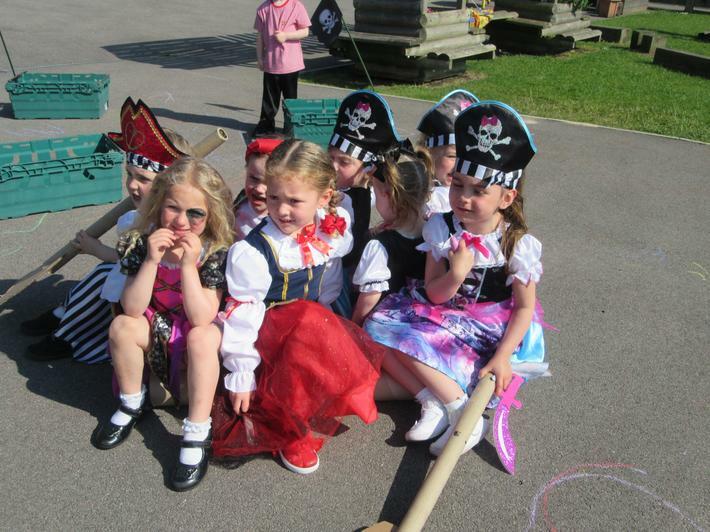 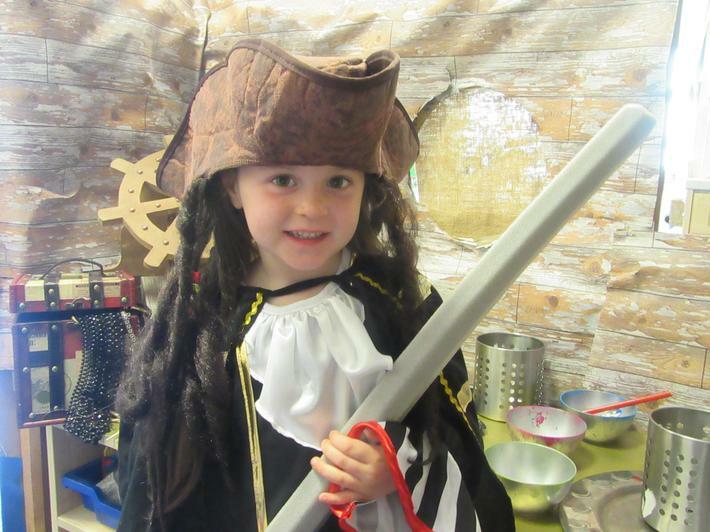 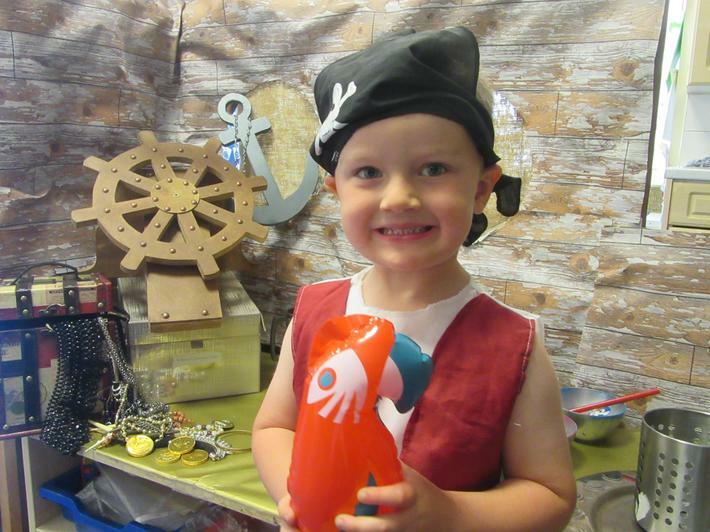 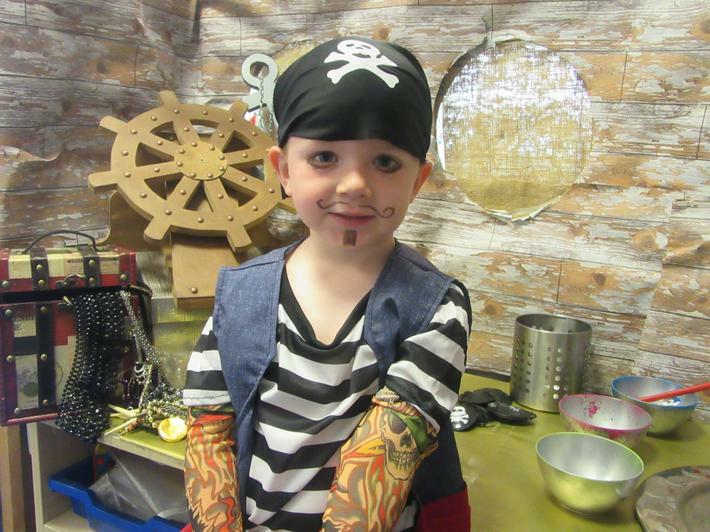 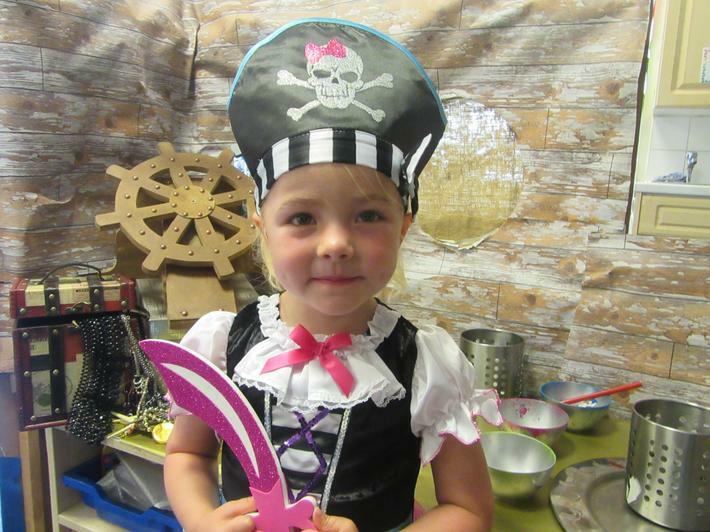 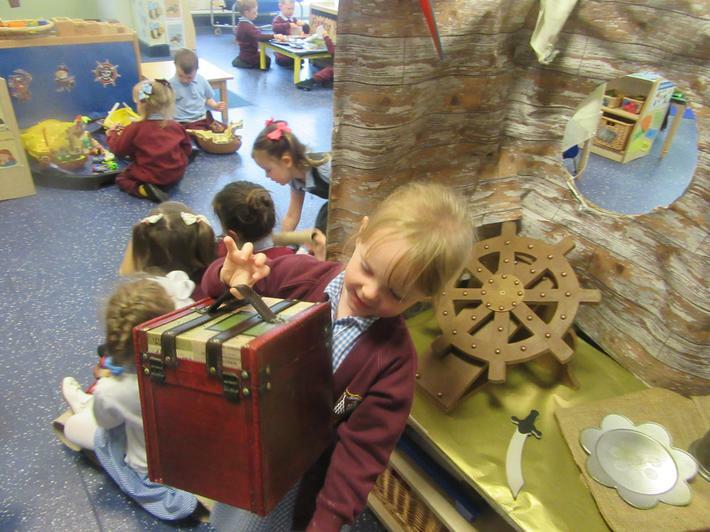 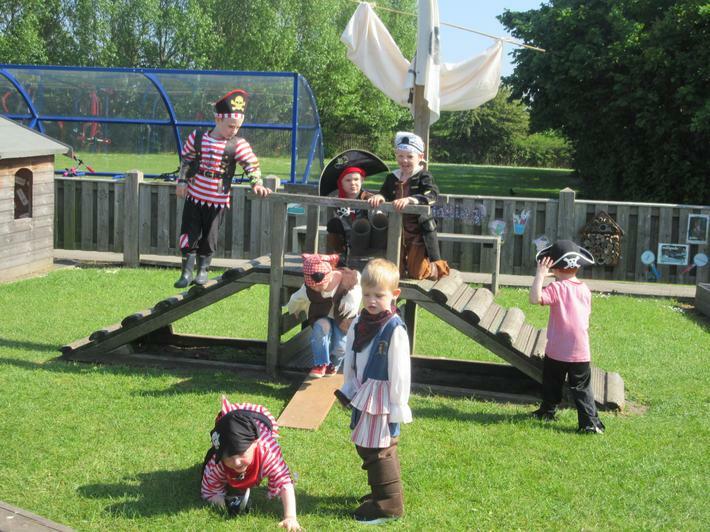 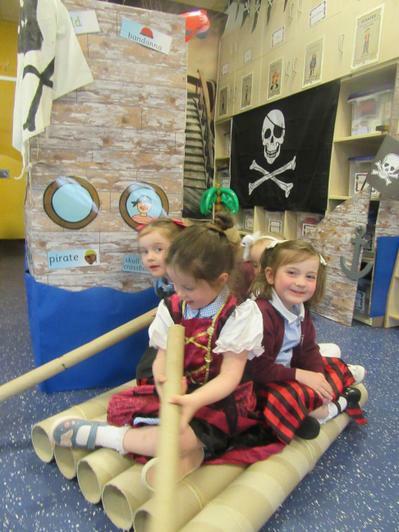 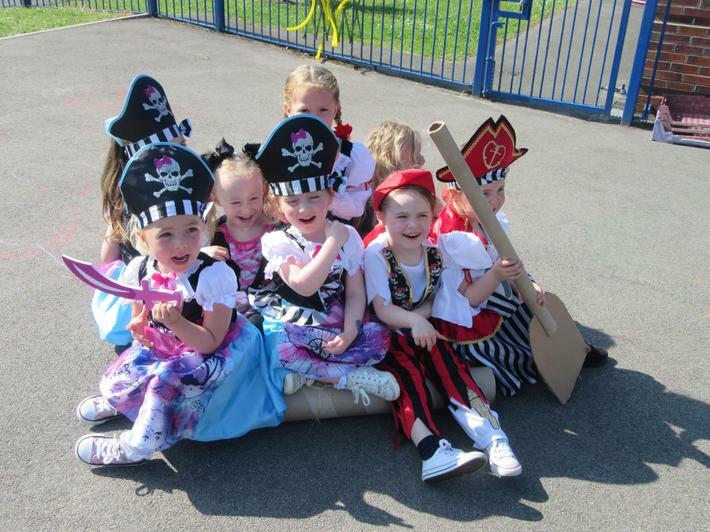 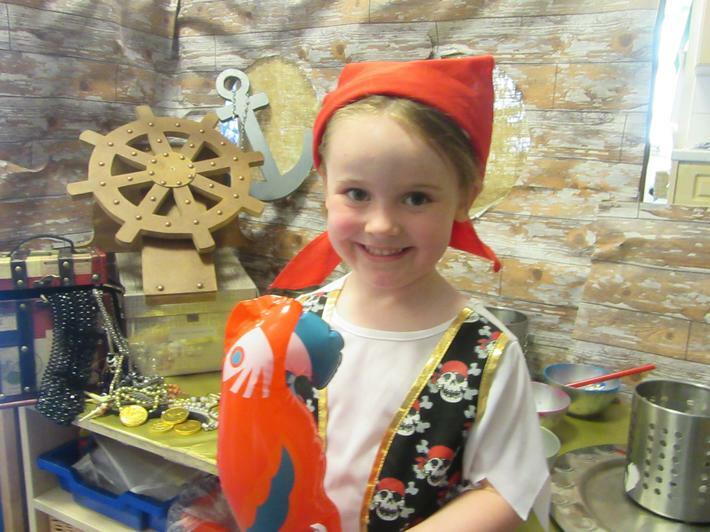 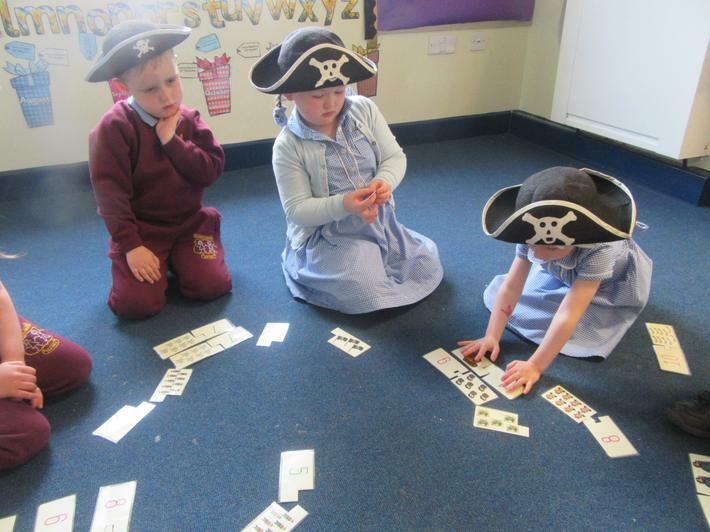 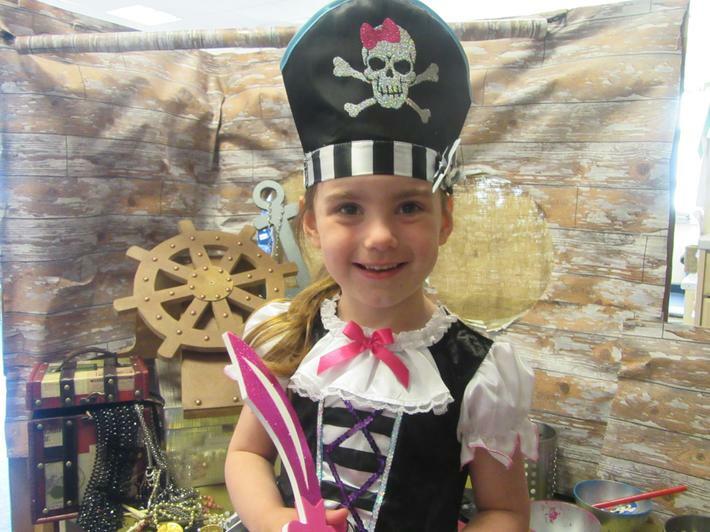 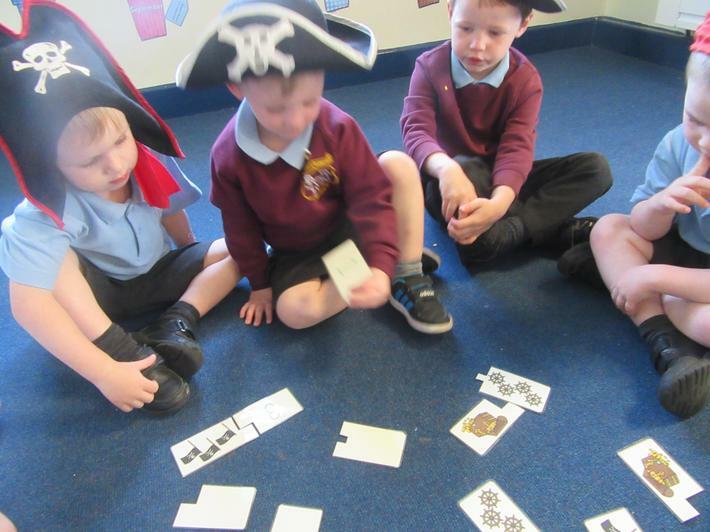 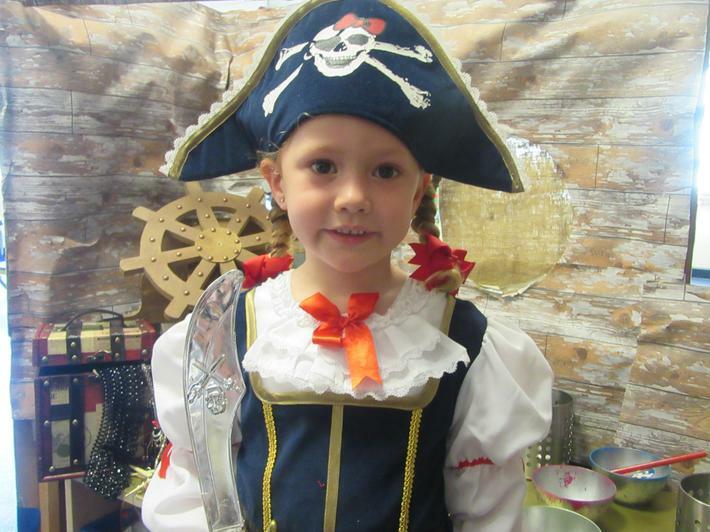 We had so much fun on Pirate Day and throughout our topic on Pirates. 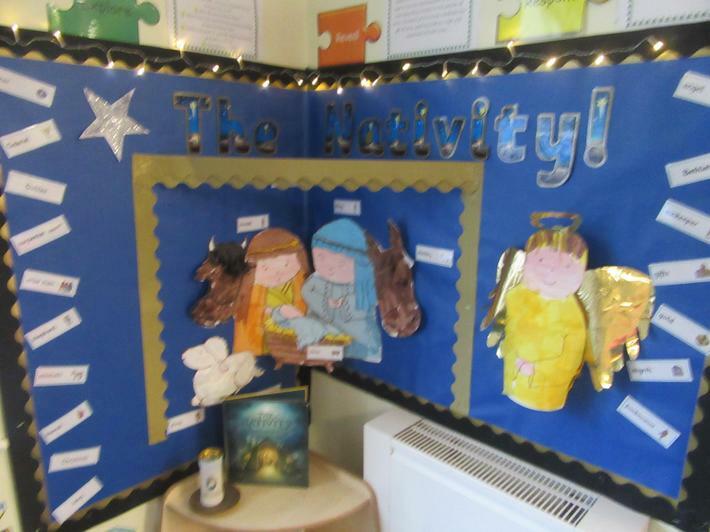 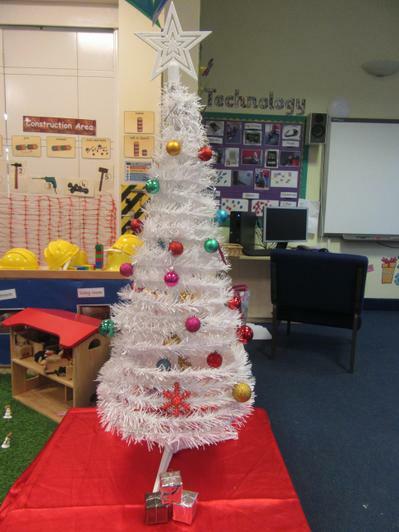 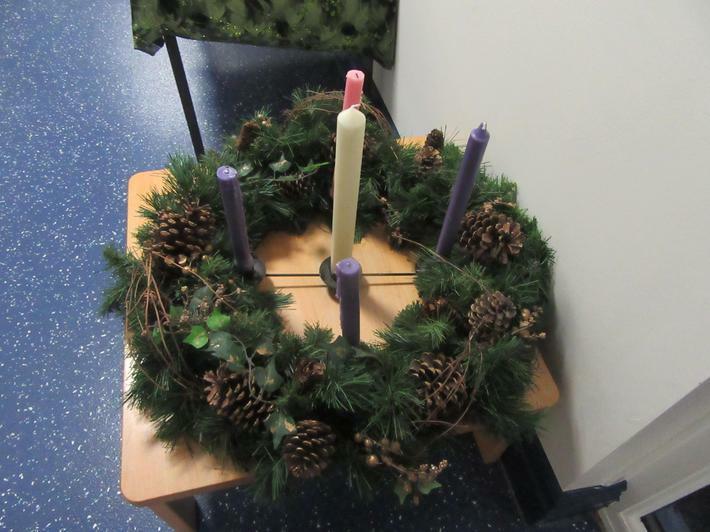 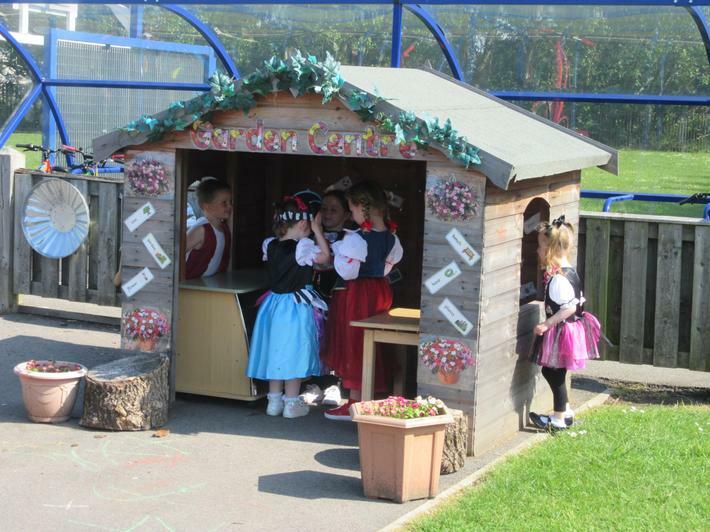 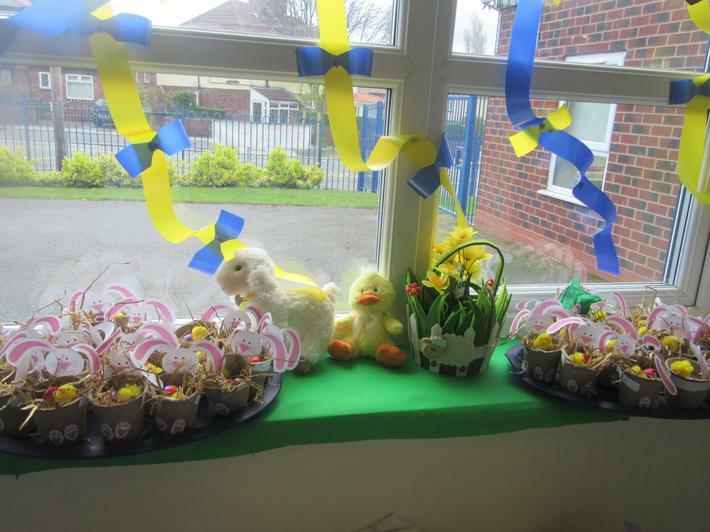 Thank you for all your efforts, the children looked brilliant! 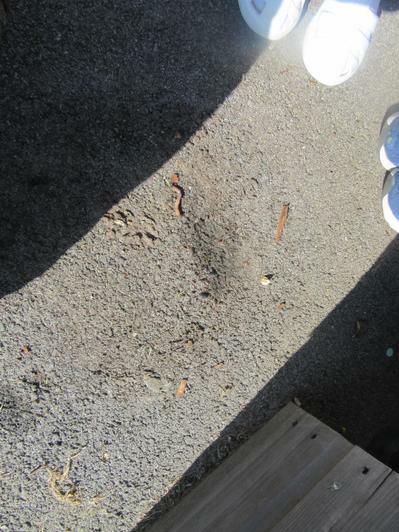 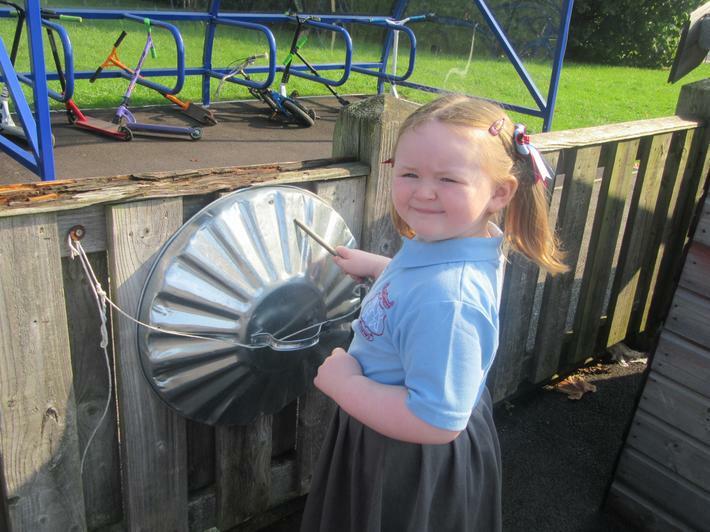 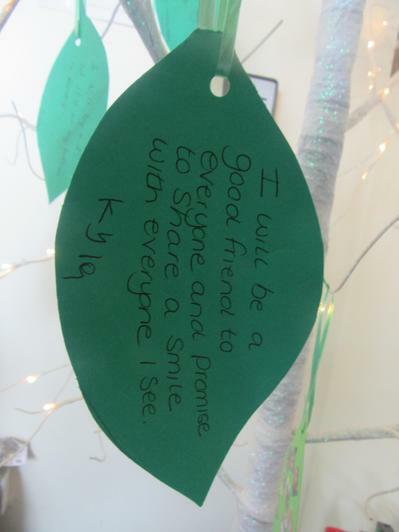 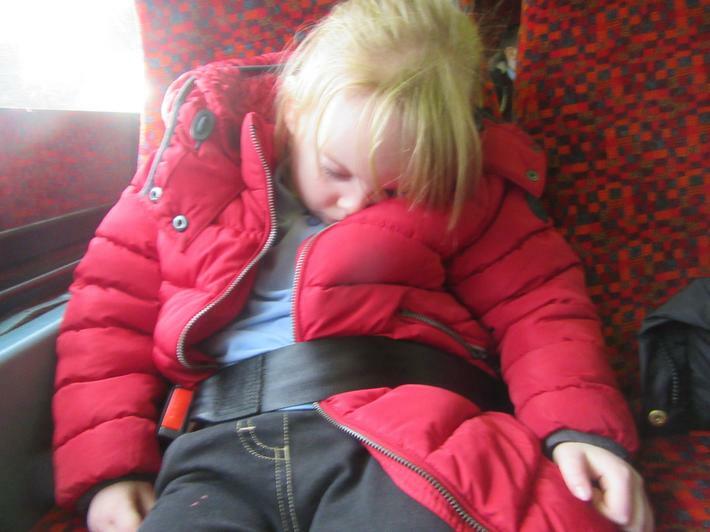 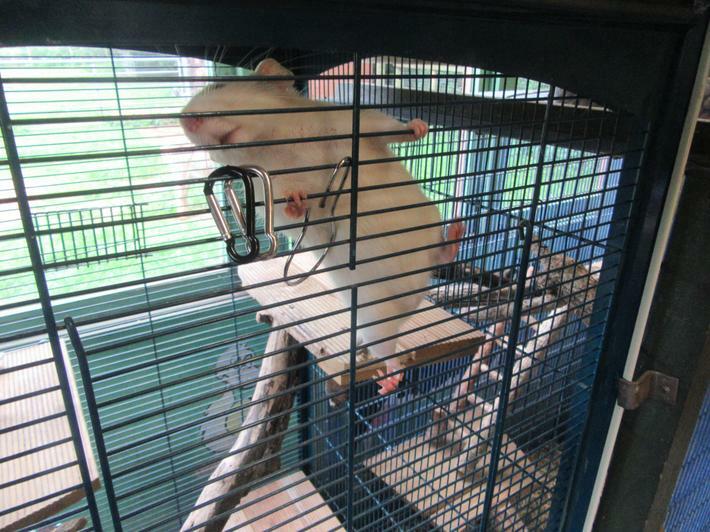 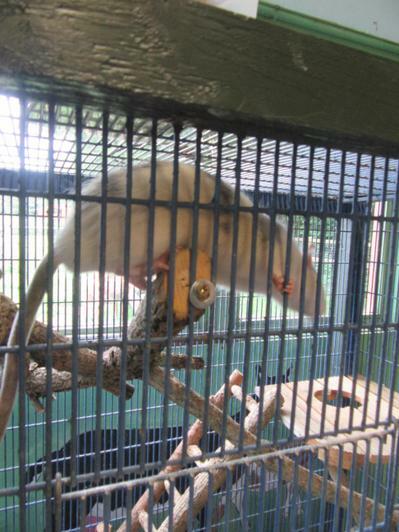 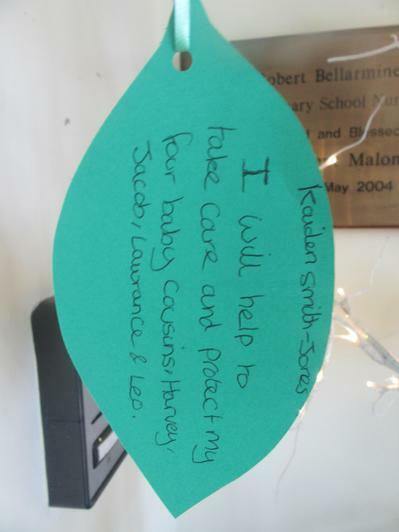 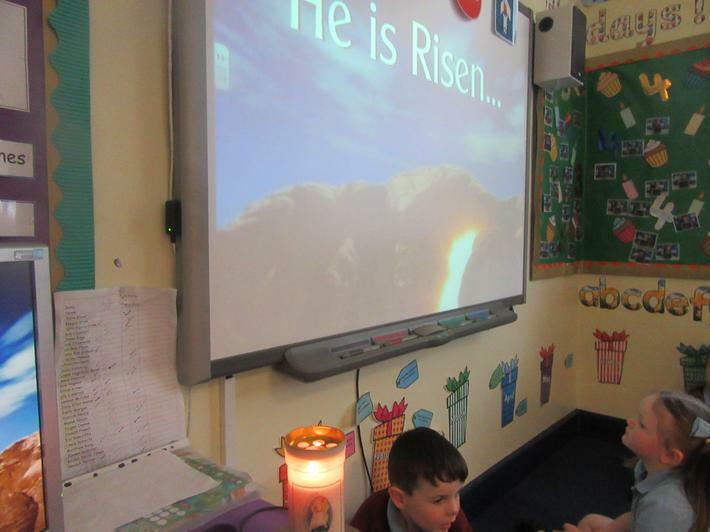 Please enjoy our photographs taken throughout the topic. 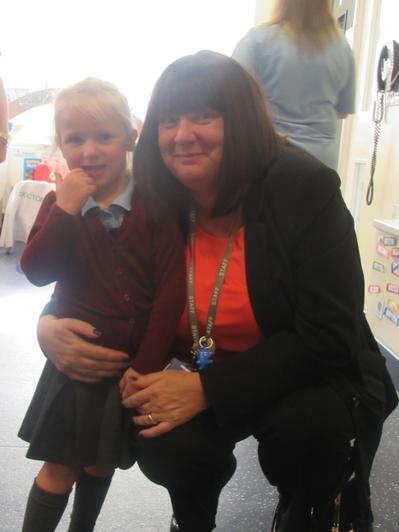 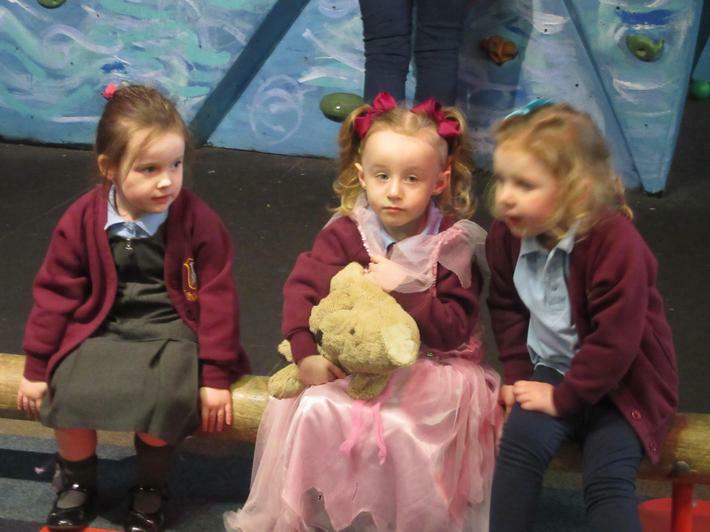 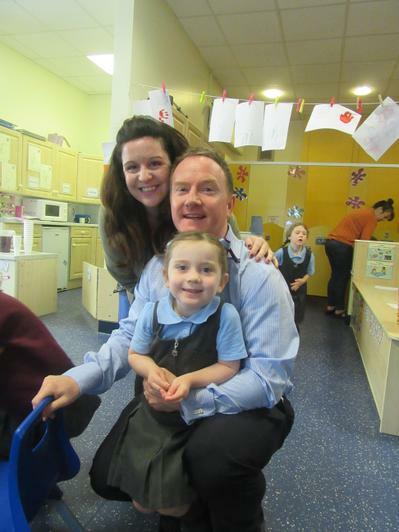 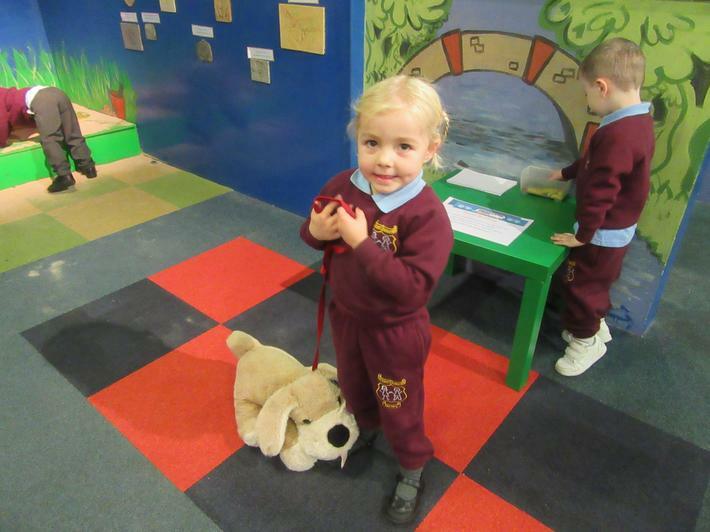 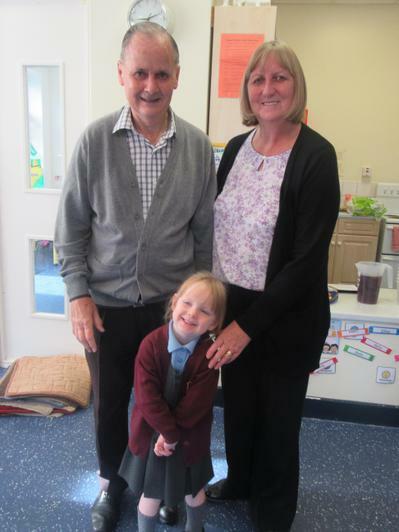 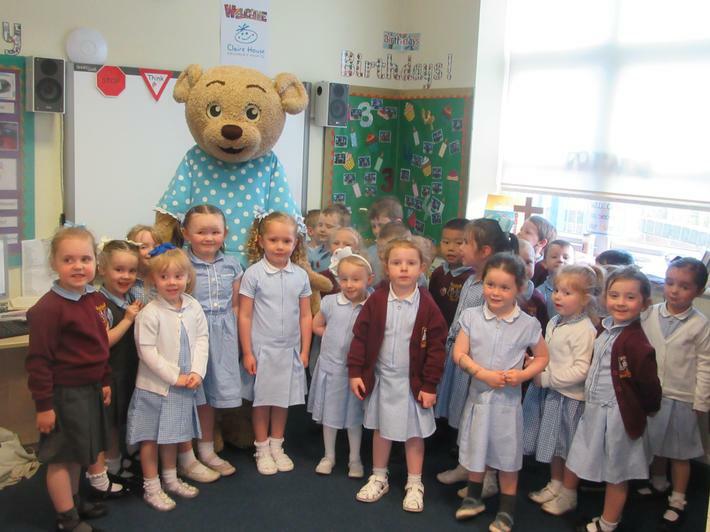 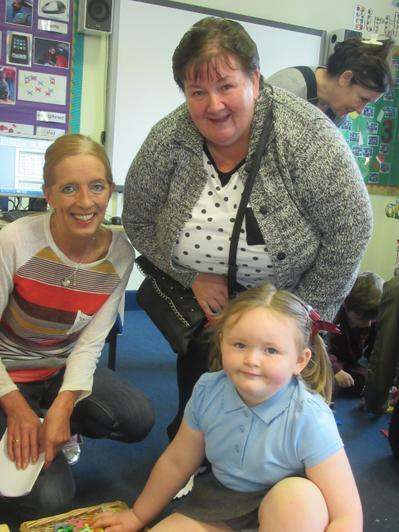 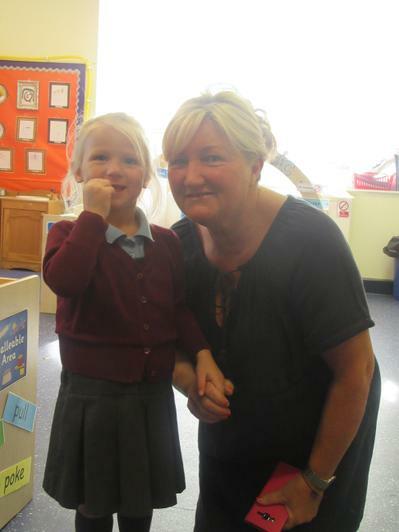 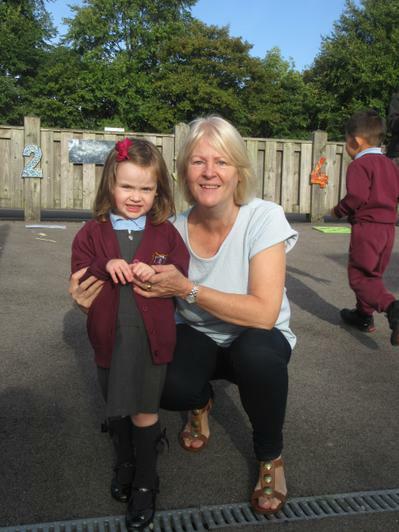 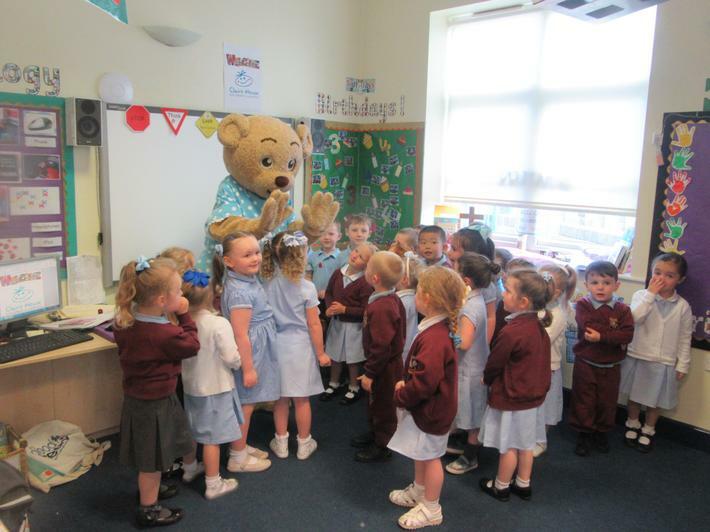 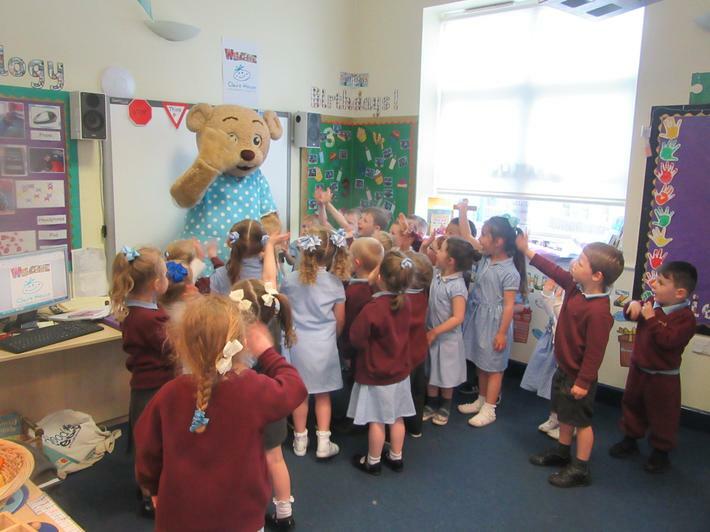 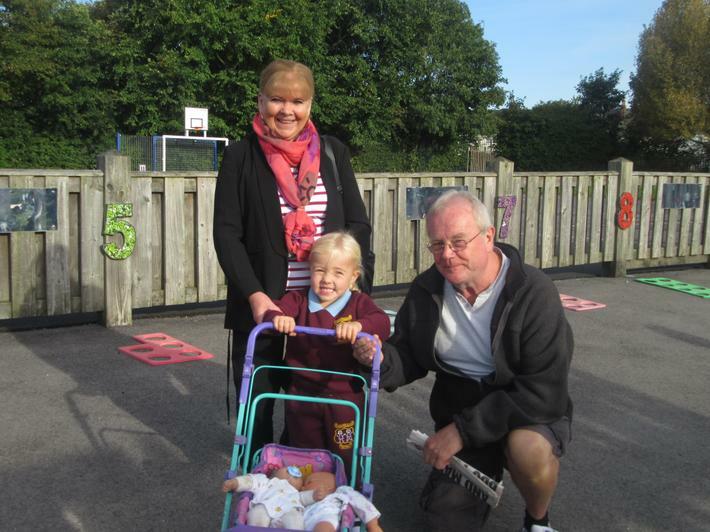 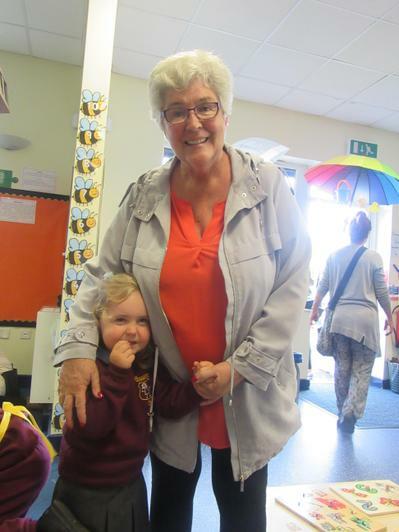 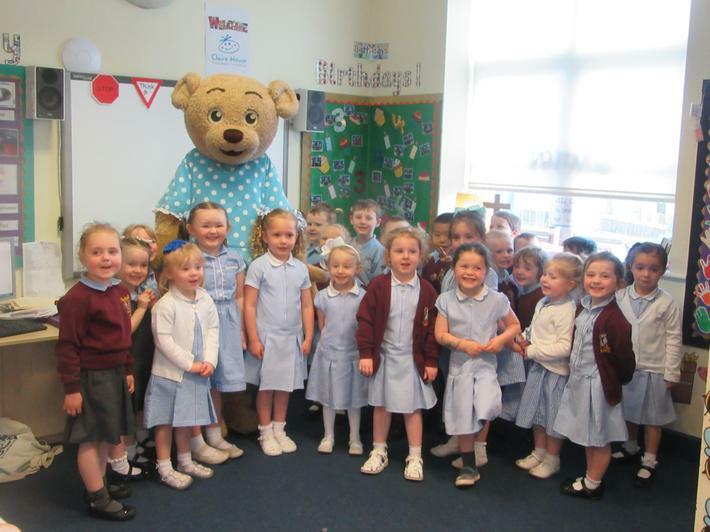 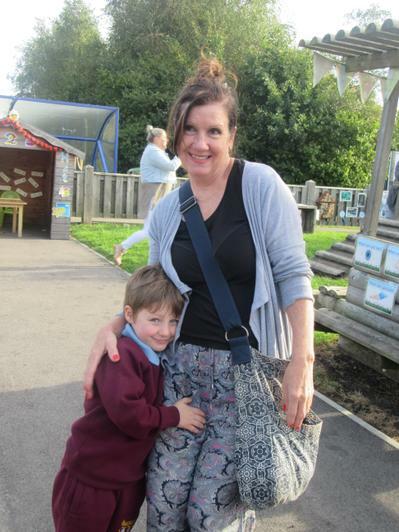 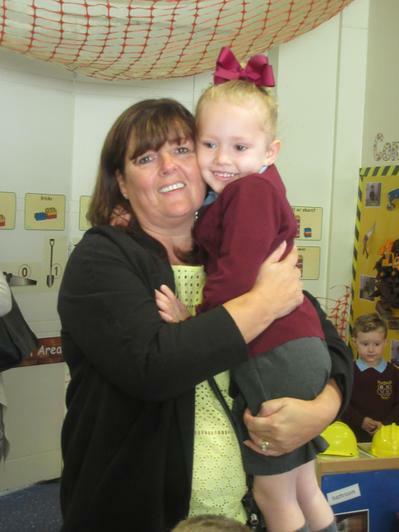 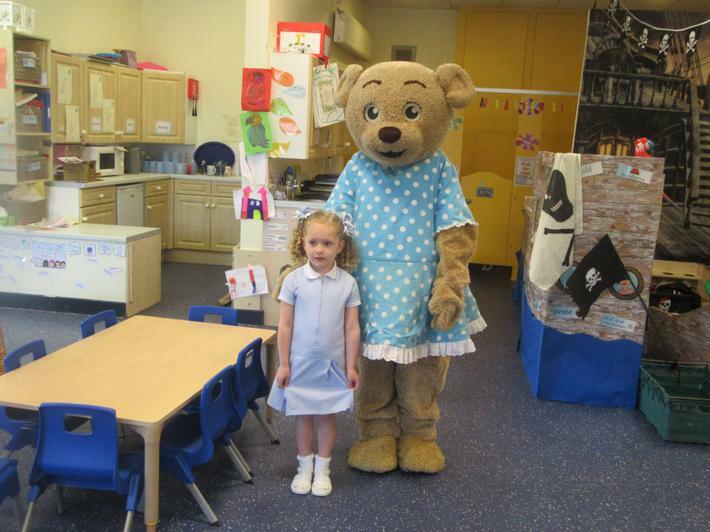 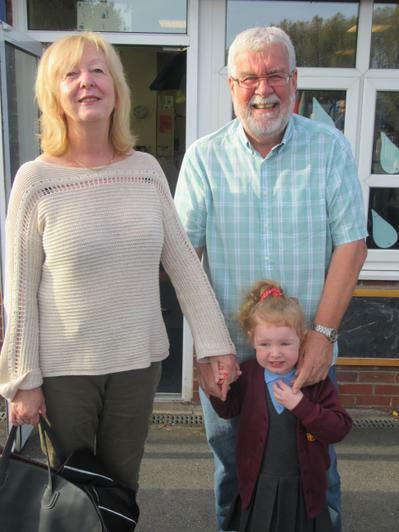 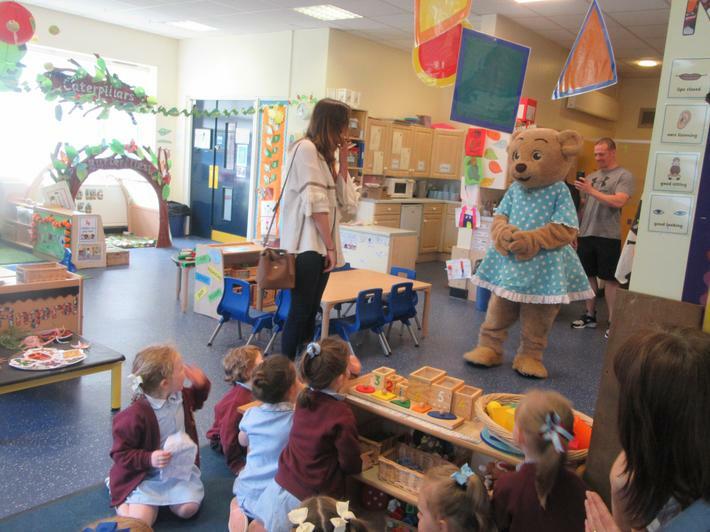 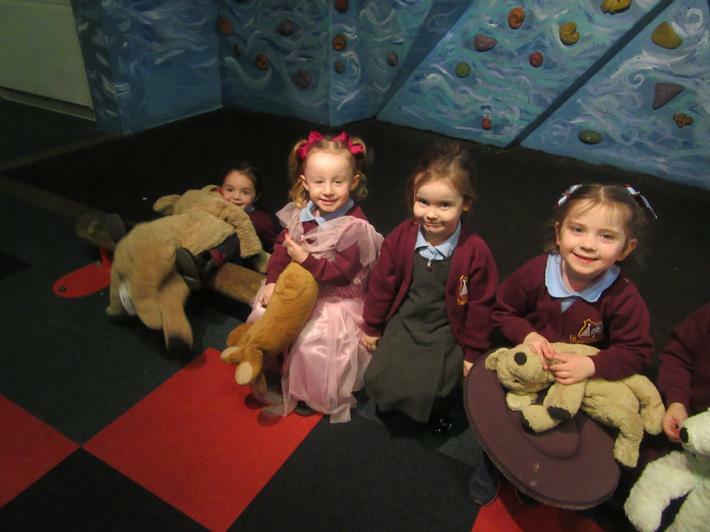 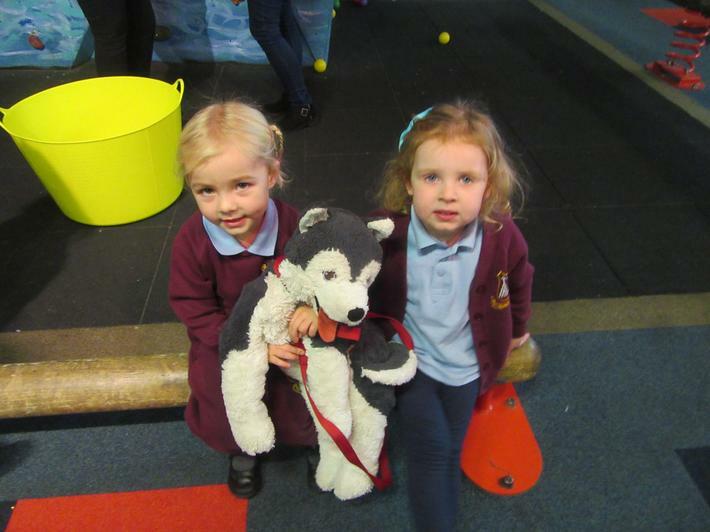 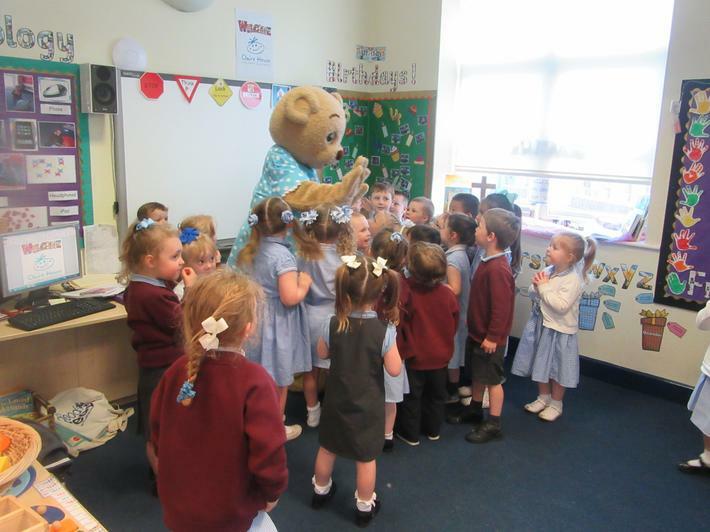 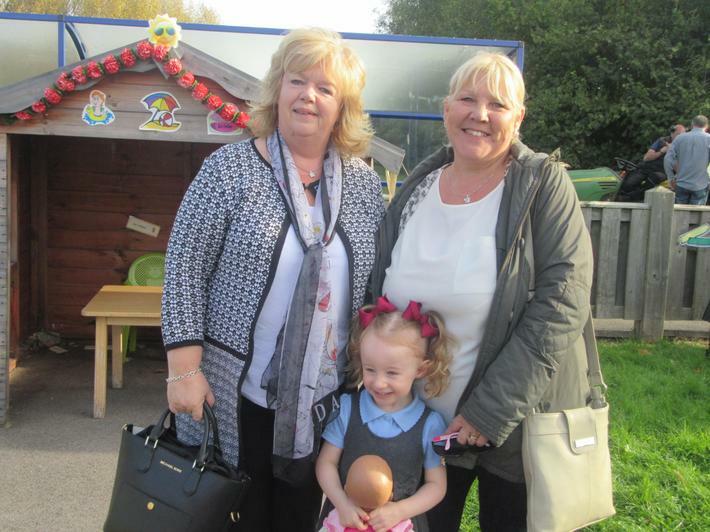 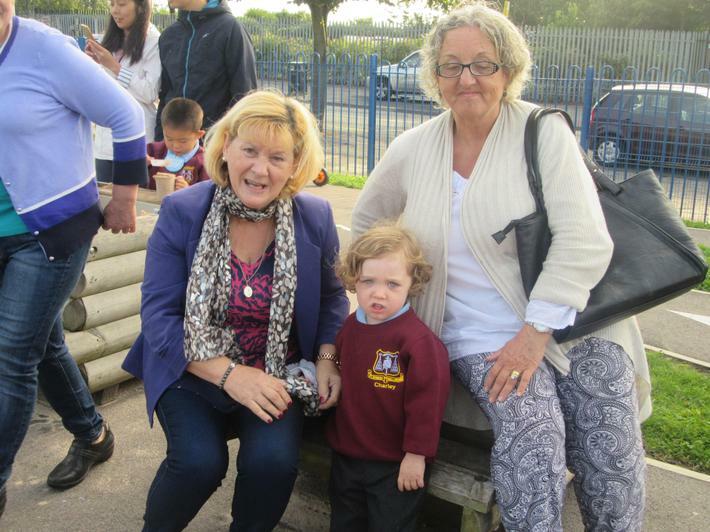 We had a special visitor to our nursery... Claire Bear from Claire House (Children' Hospice). 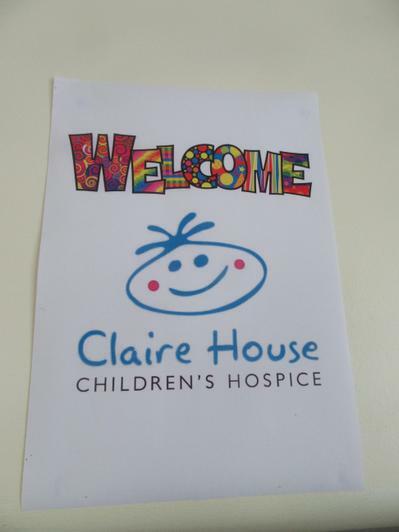 Kyla ran 1K finishing in 8 minutes and 45 seconds to raise funds for Claire House. 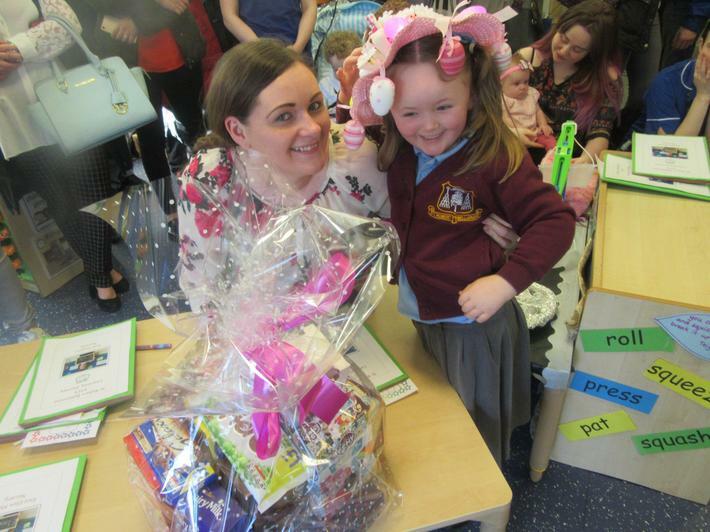 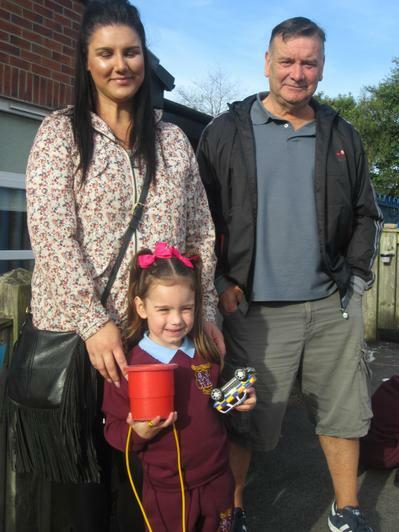 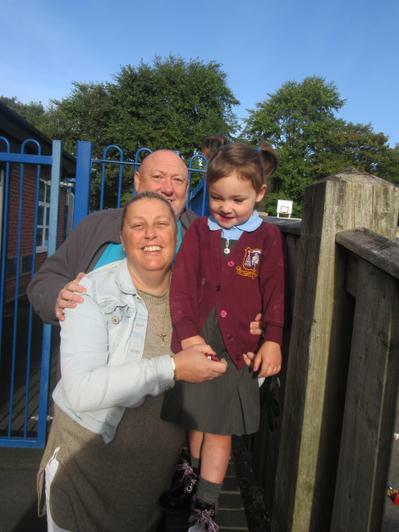 She raised over £500!!! 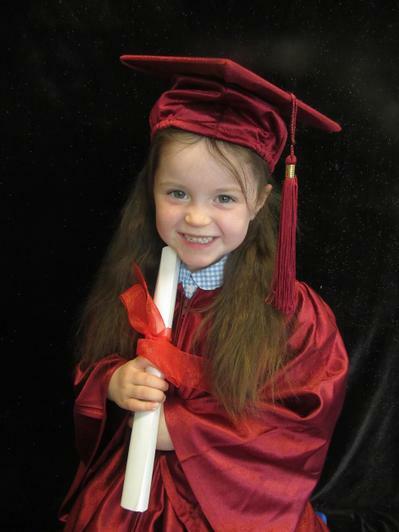 We are so very proud of her. 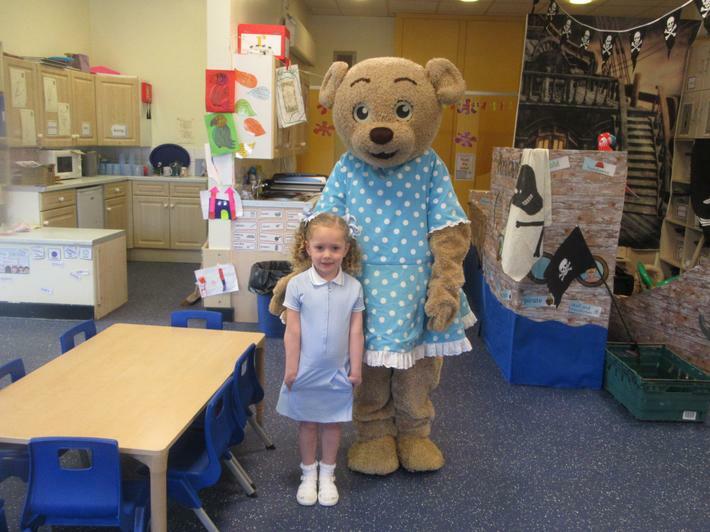 Claire Bear came to congratulate Kyla for her hard work. 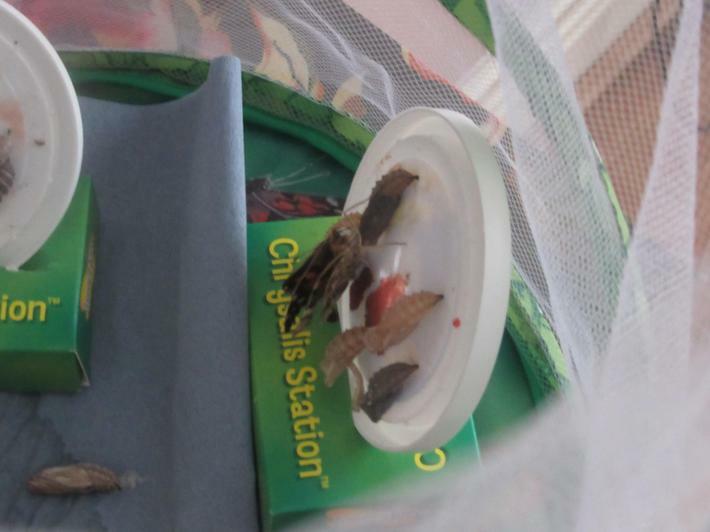 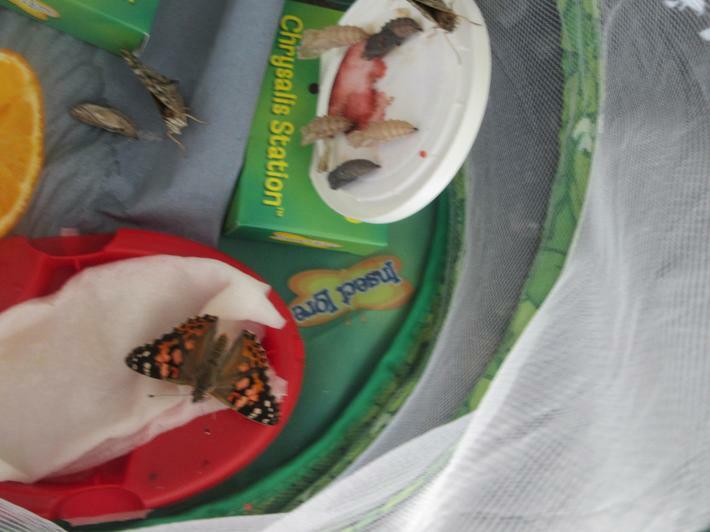 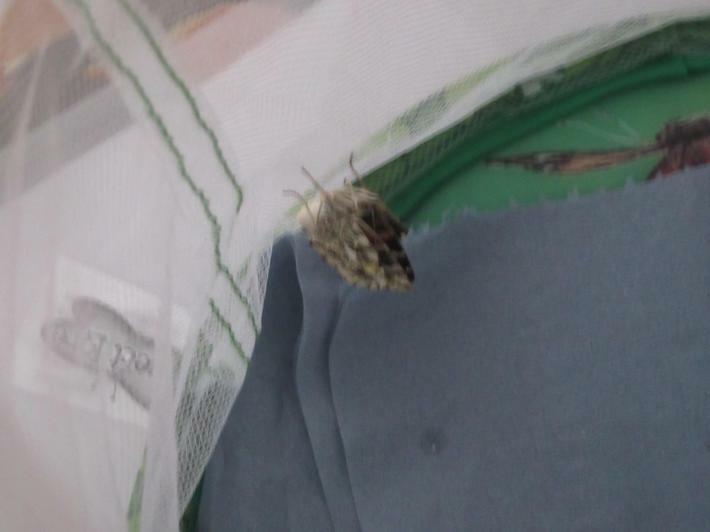 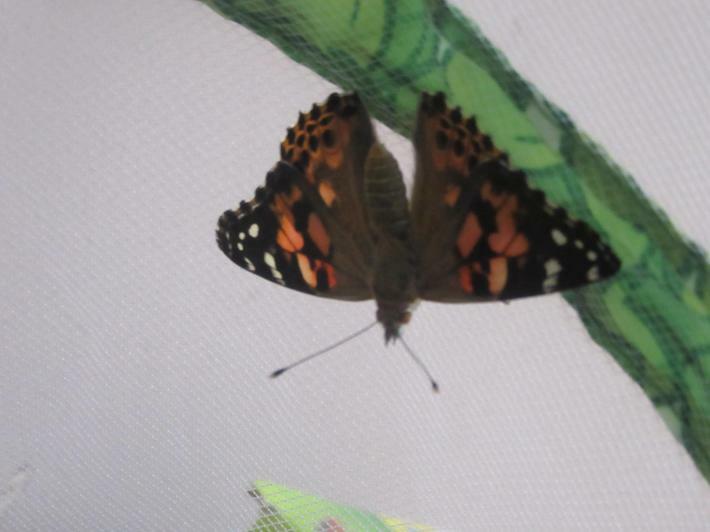 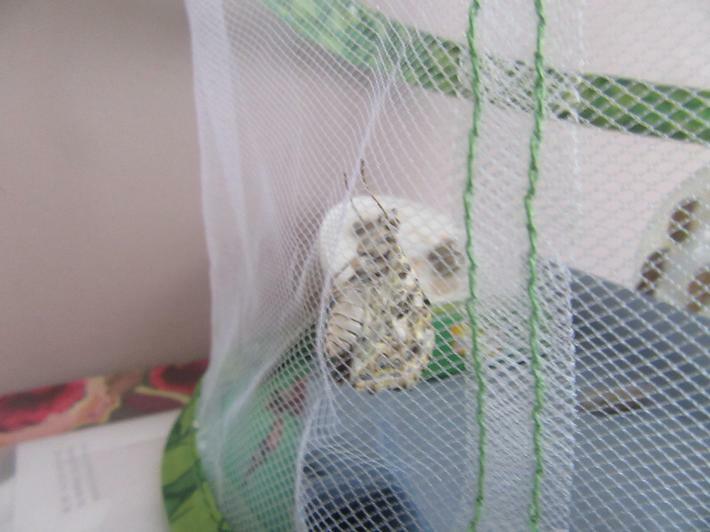 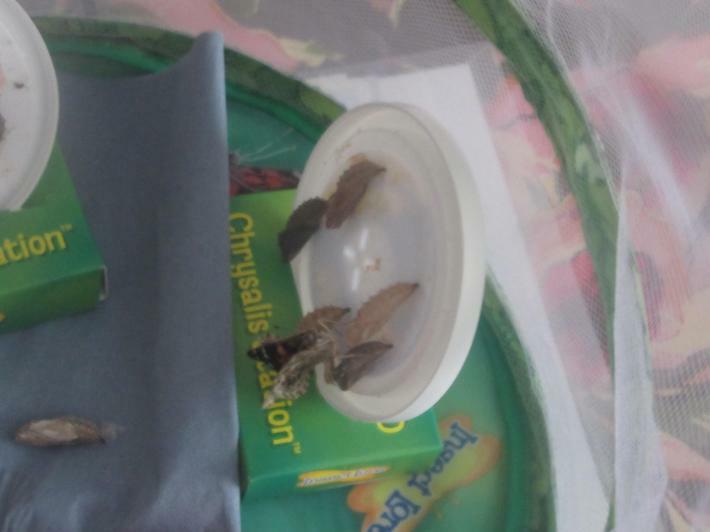 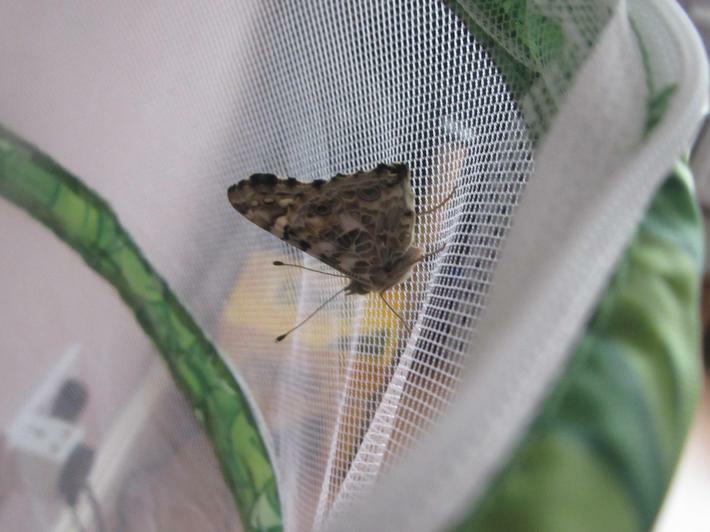 Butterflies - our butterflies left their cocoons and spread their wings to dry out....when they were ready we took them outside to let them start on a new adventure! 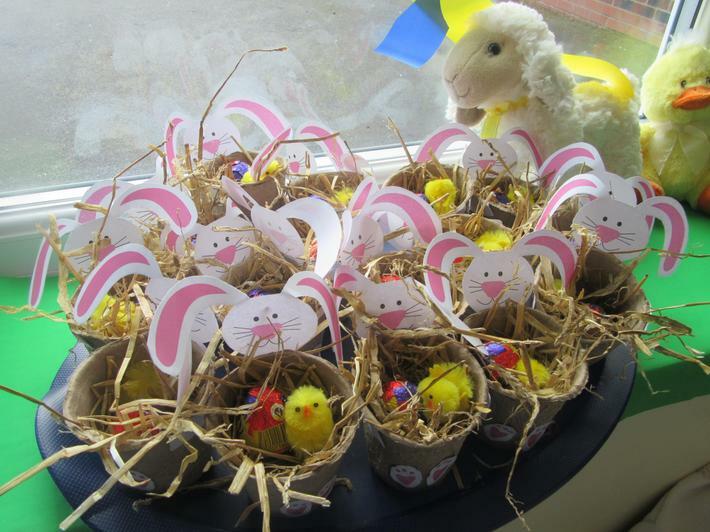 Easter:- Wishing you all a lovely Easter! 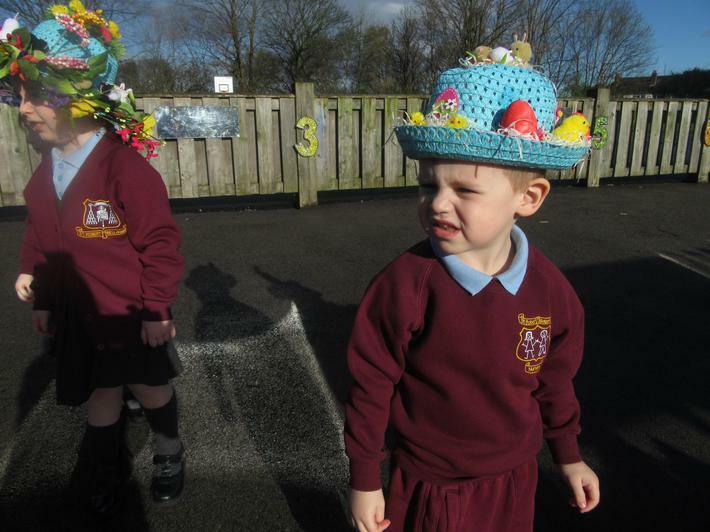 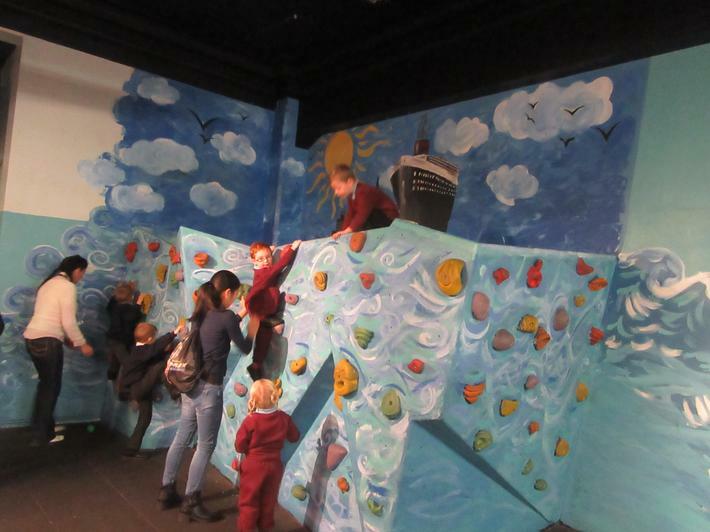 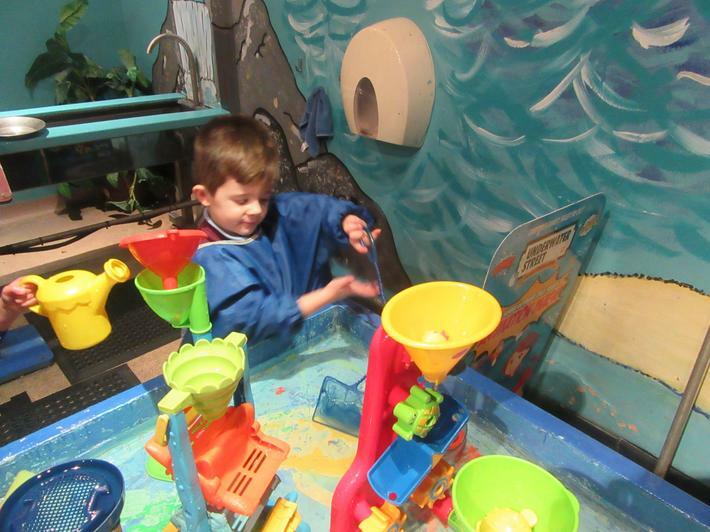 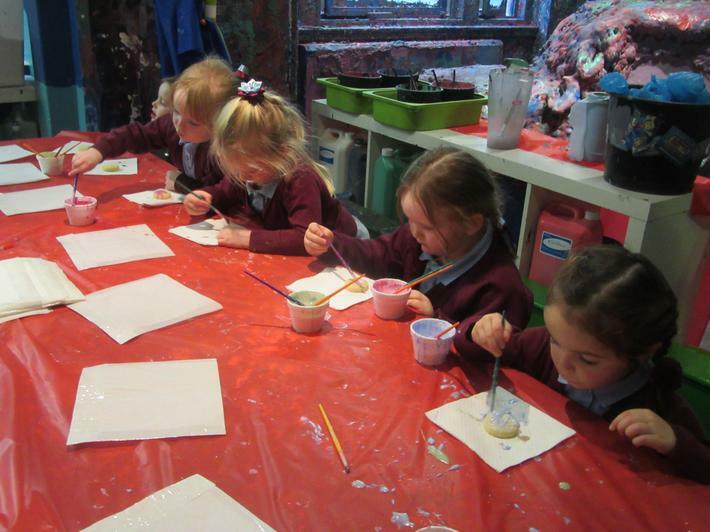 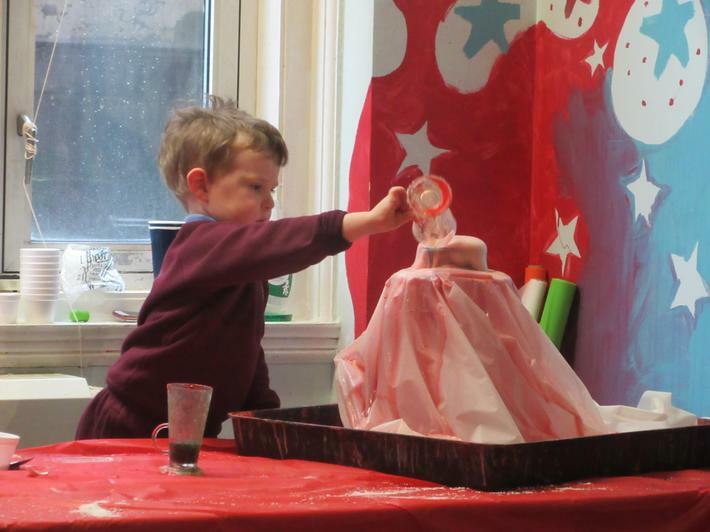 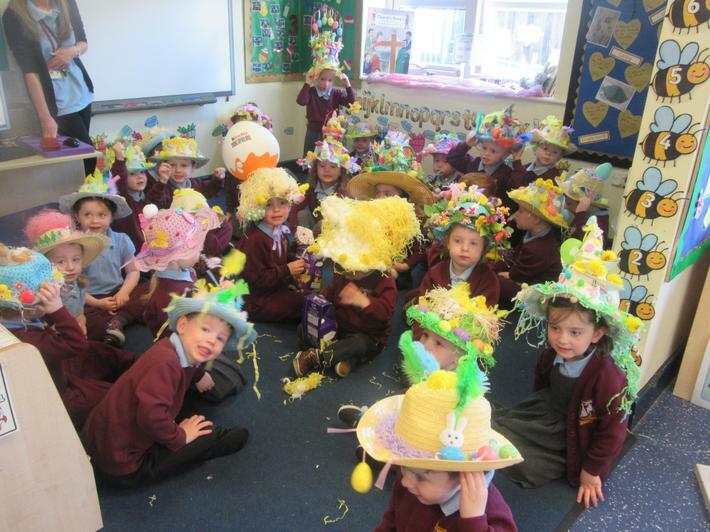 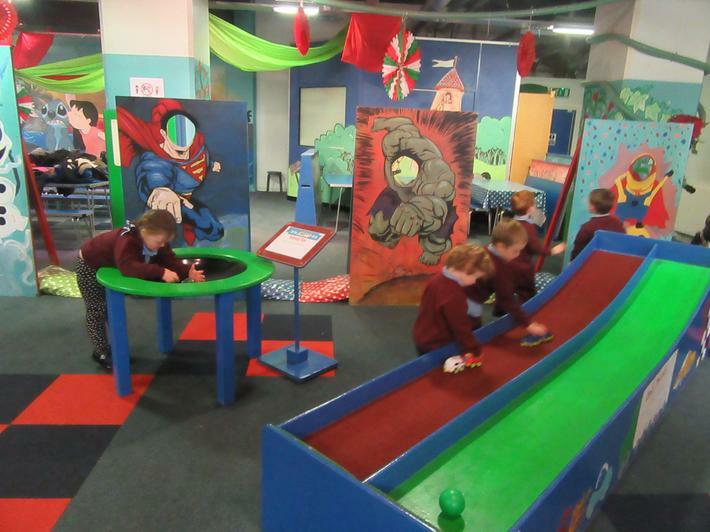 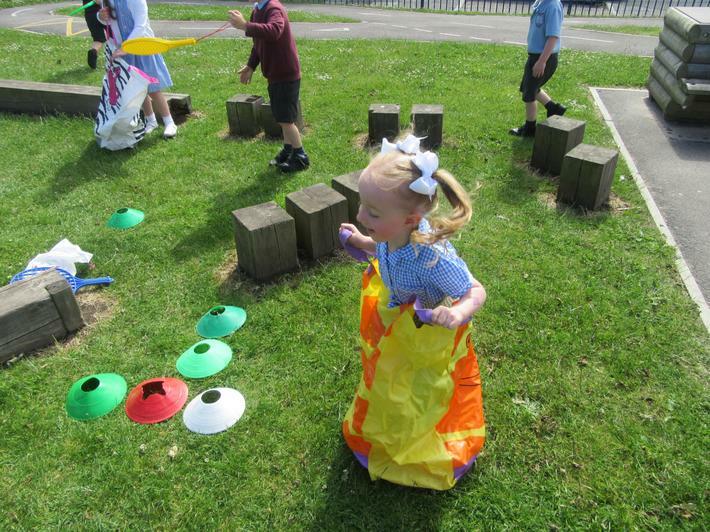 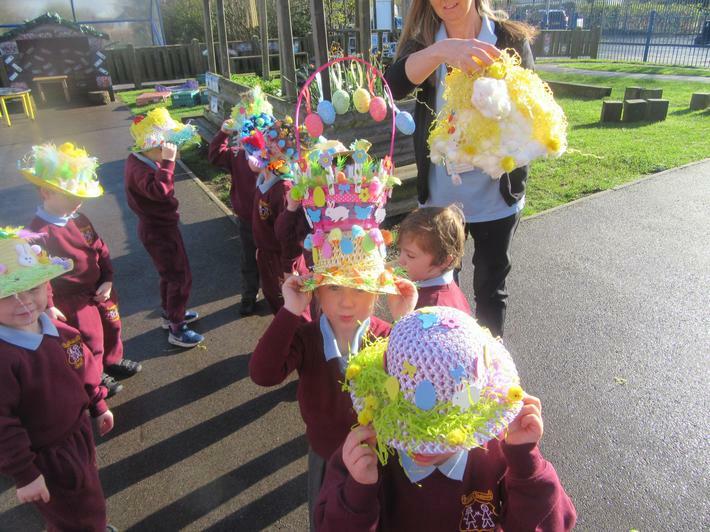 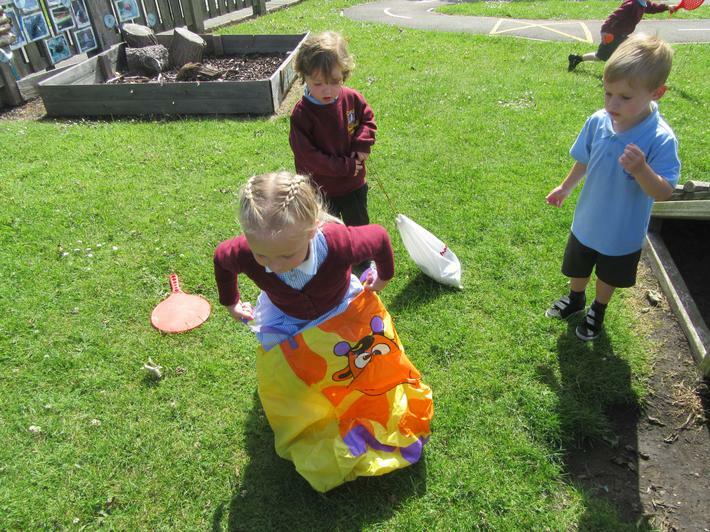 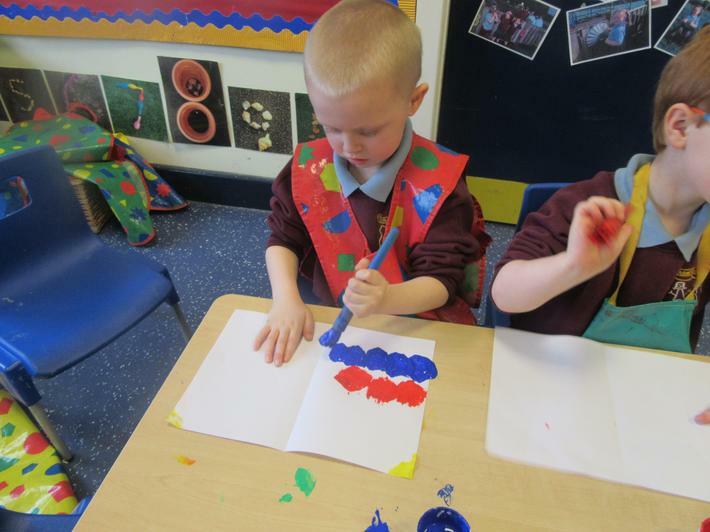 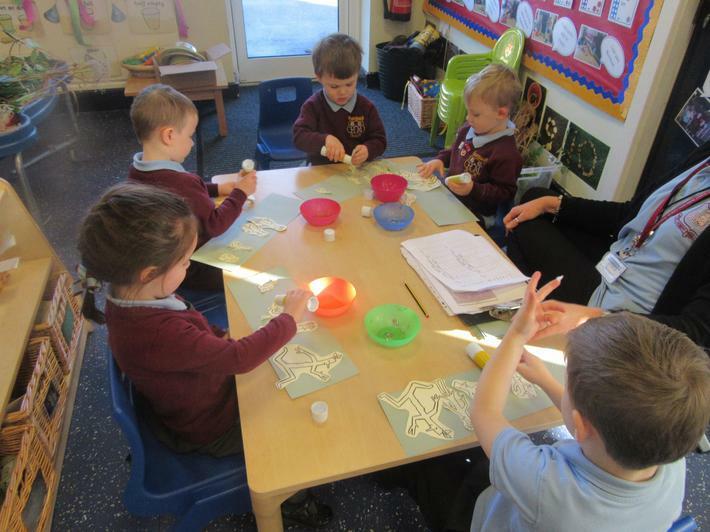 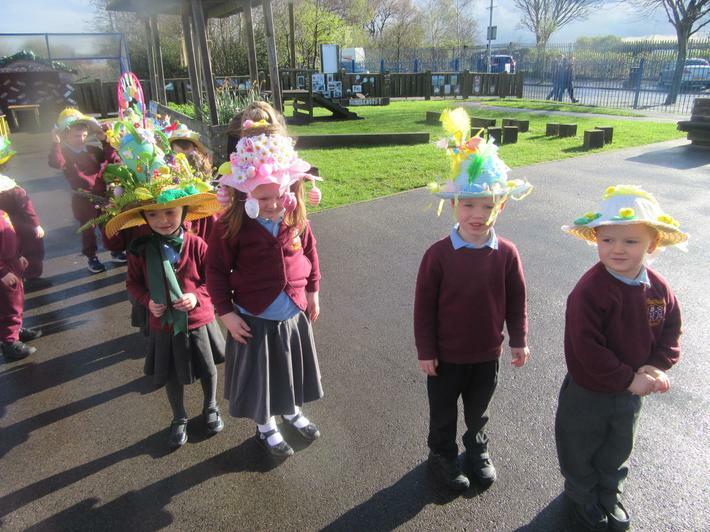 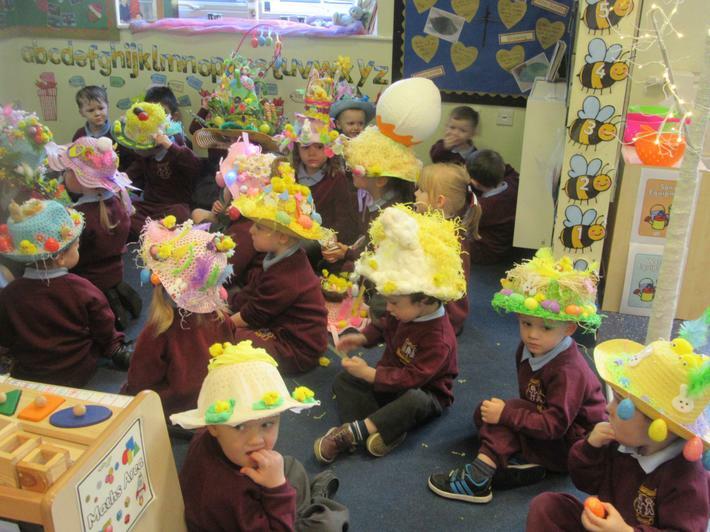 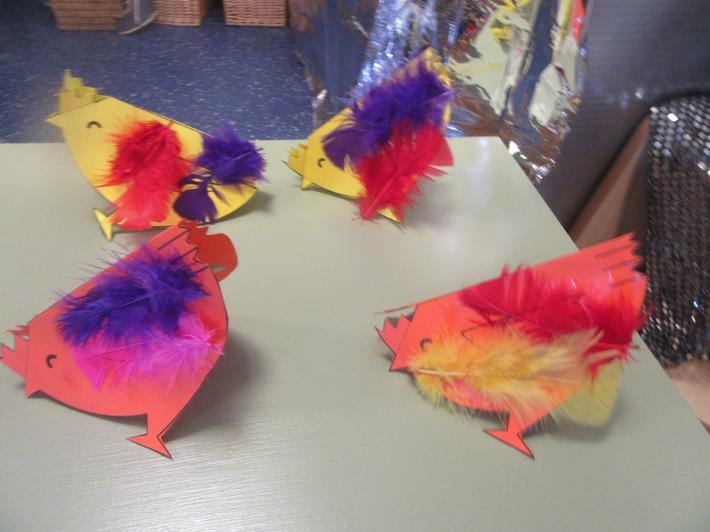 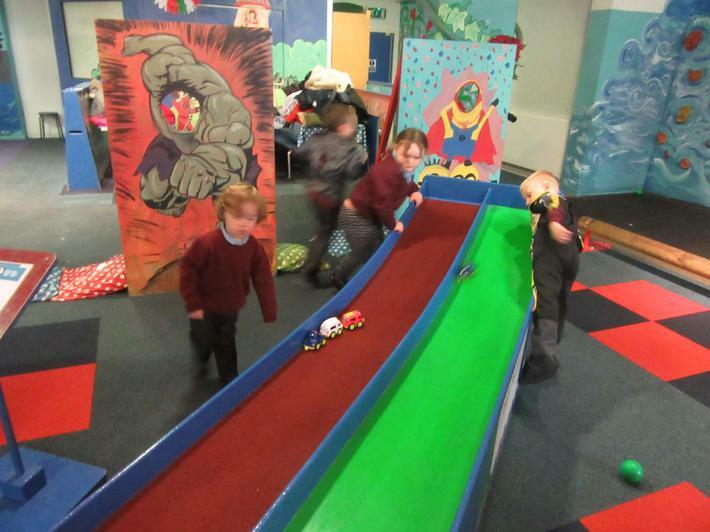 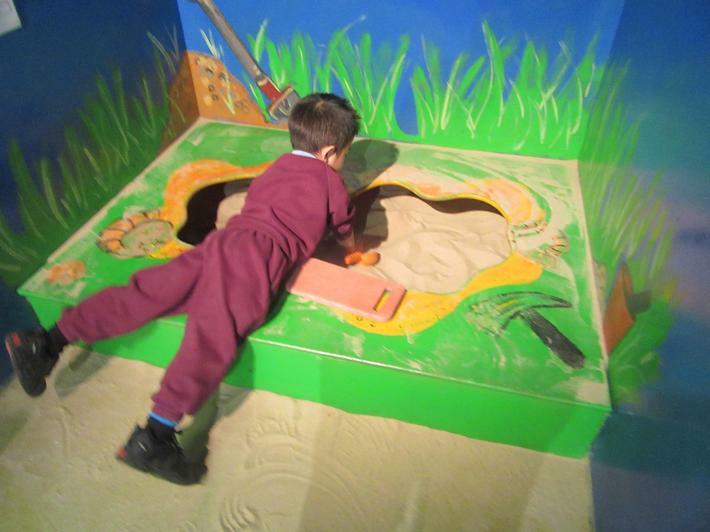 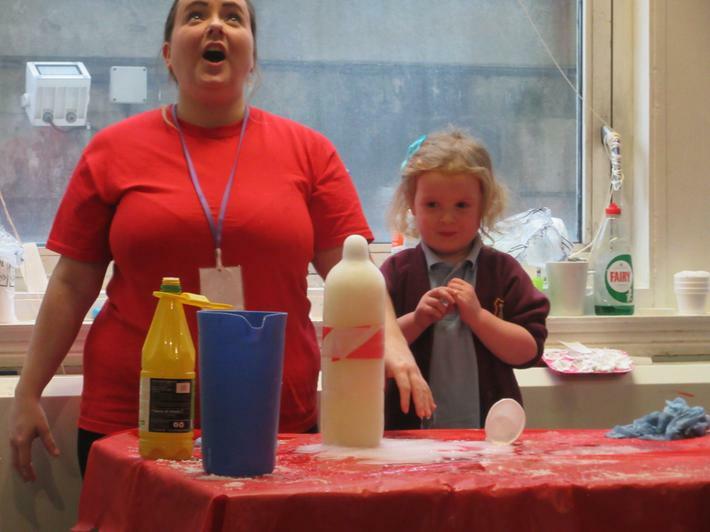 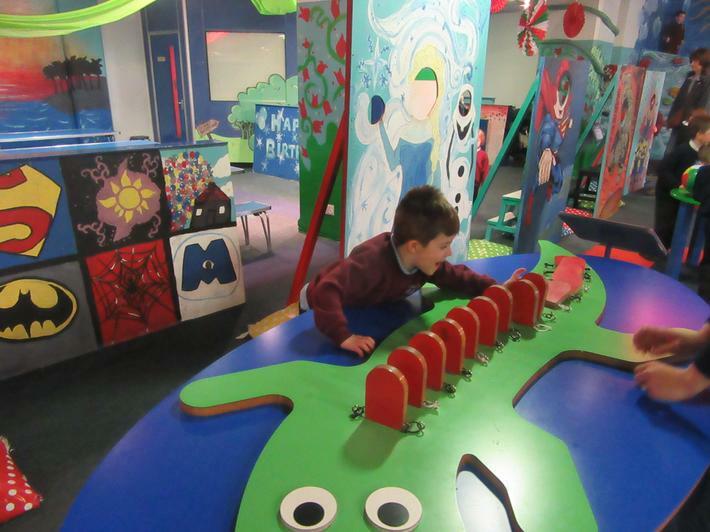 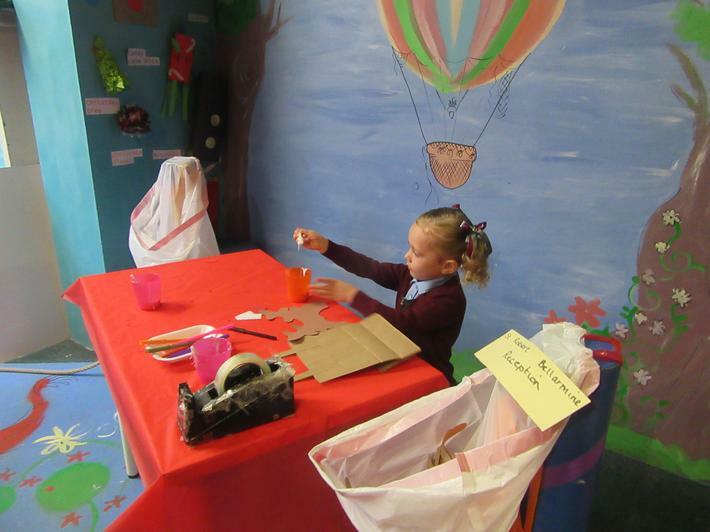 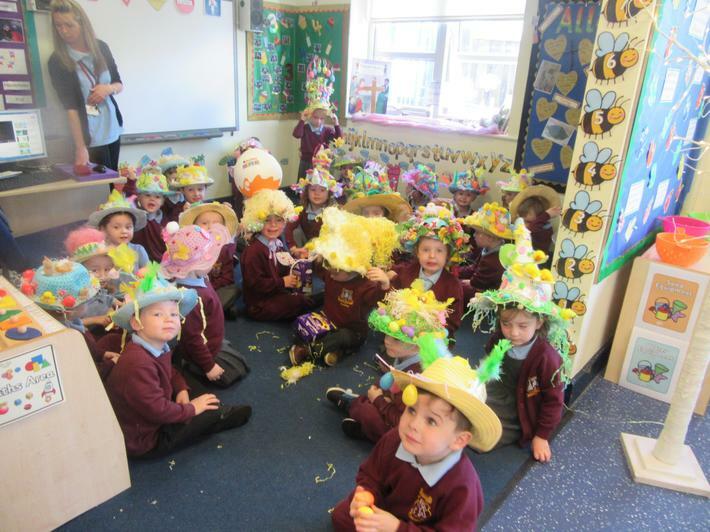 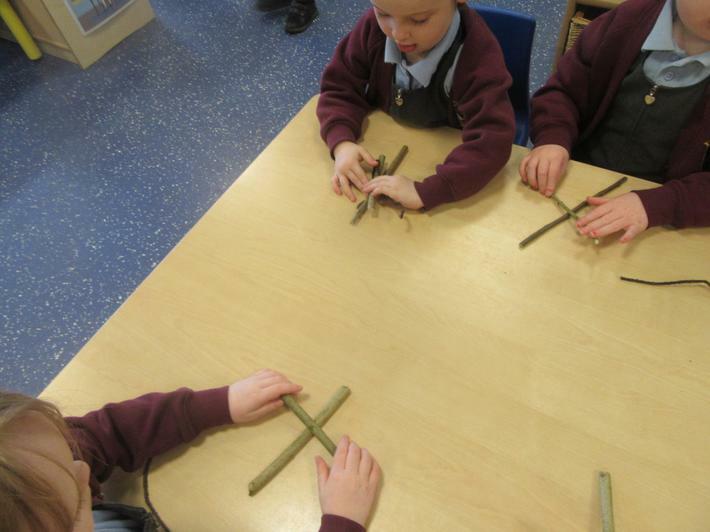 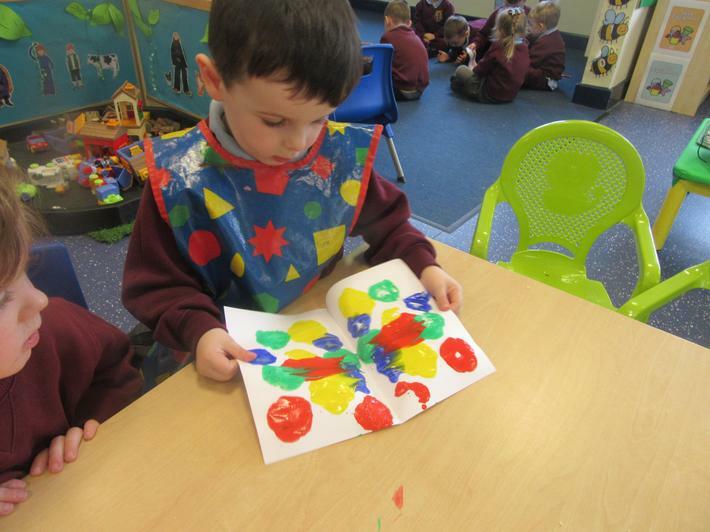 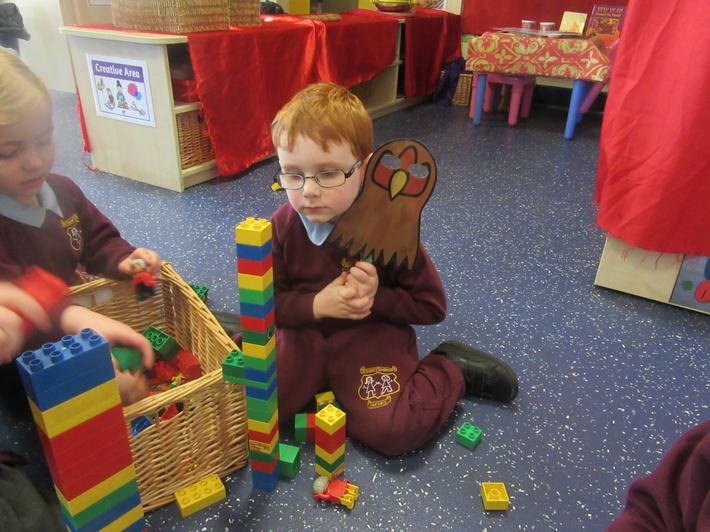 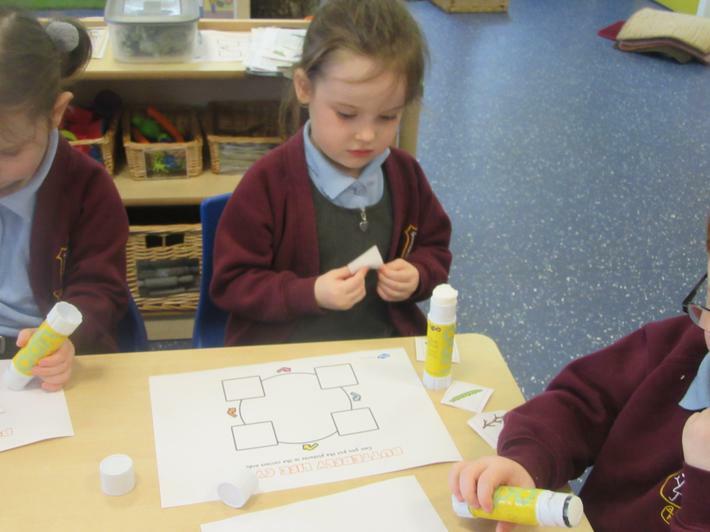 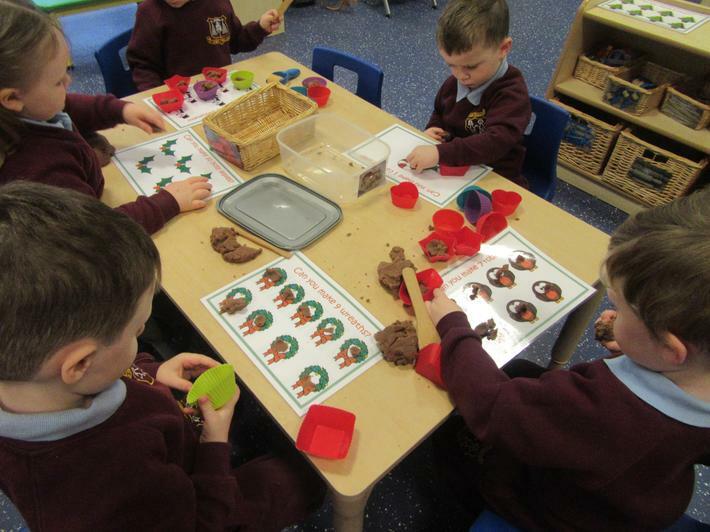 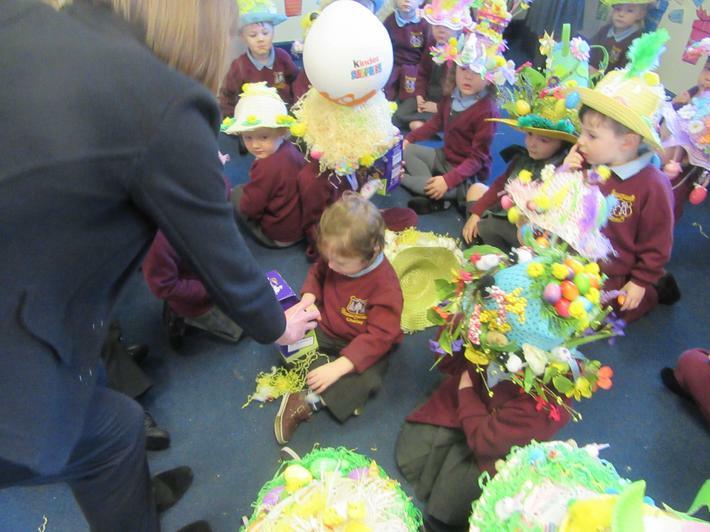 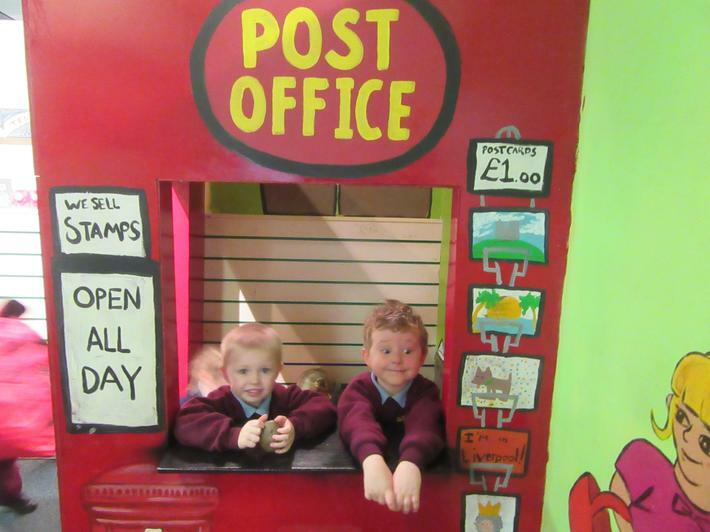 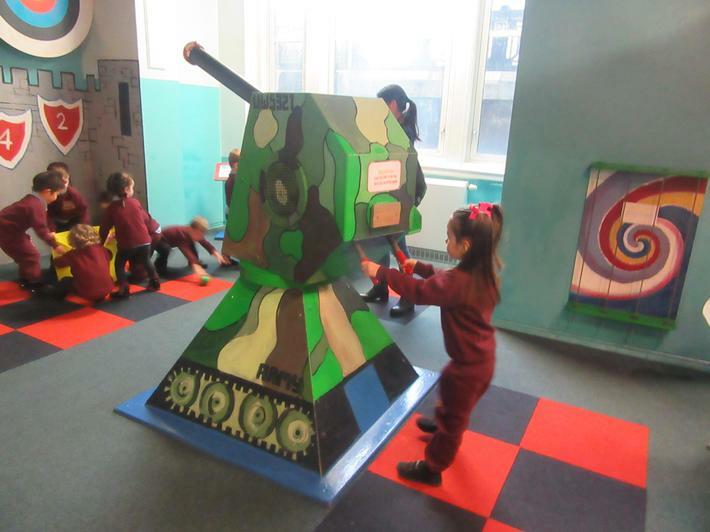 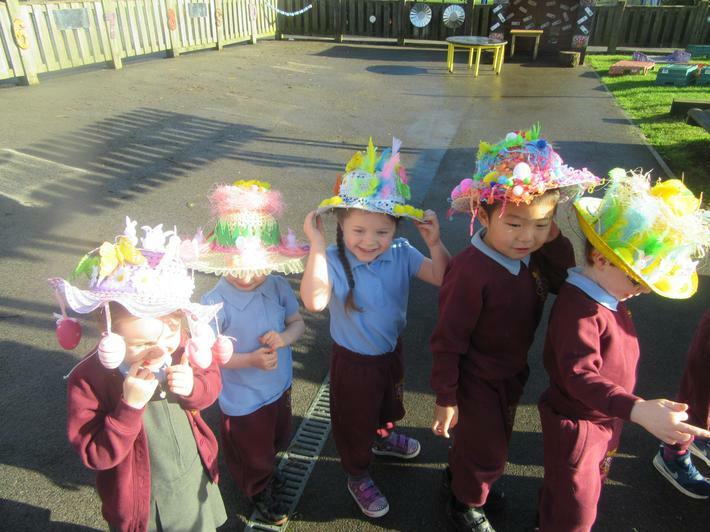 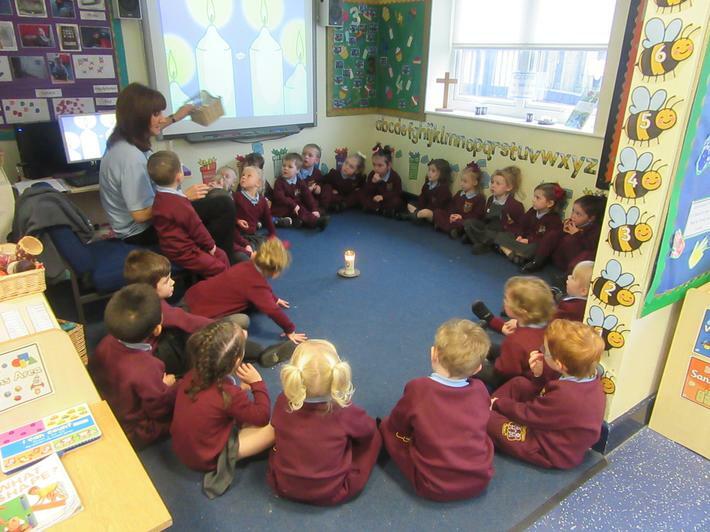 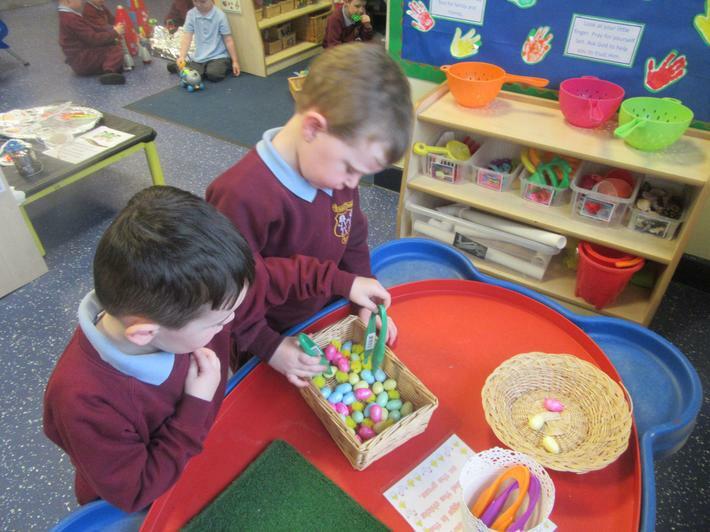 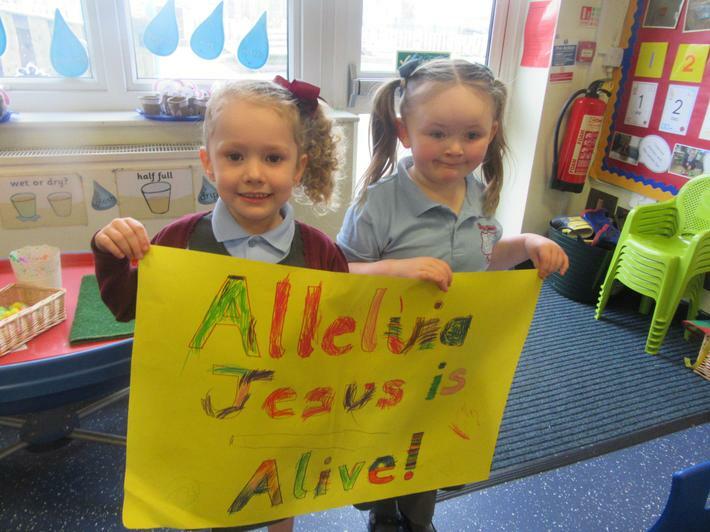 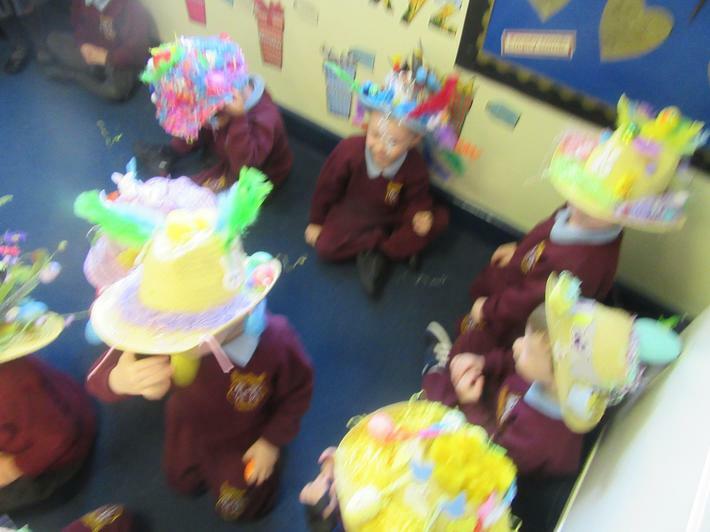 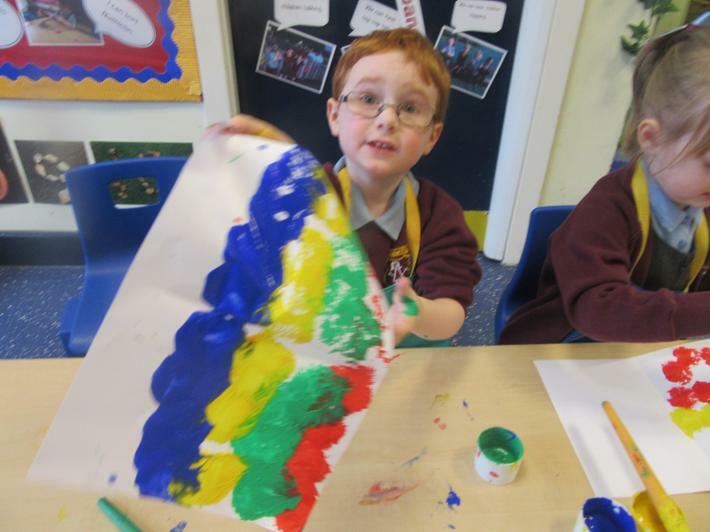 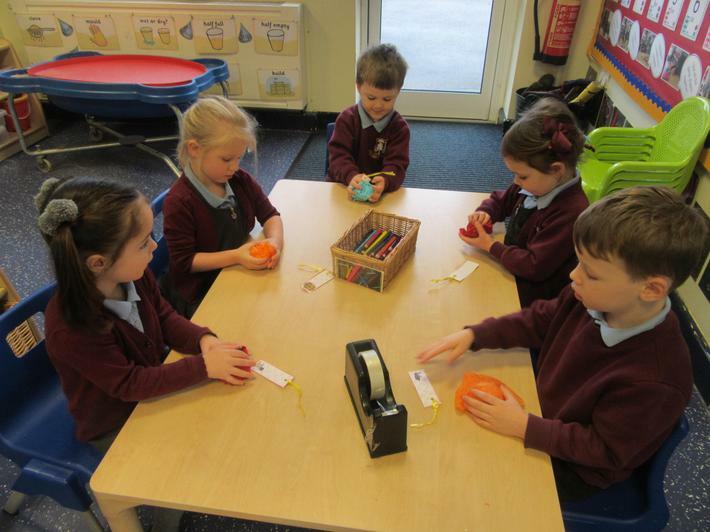 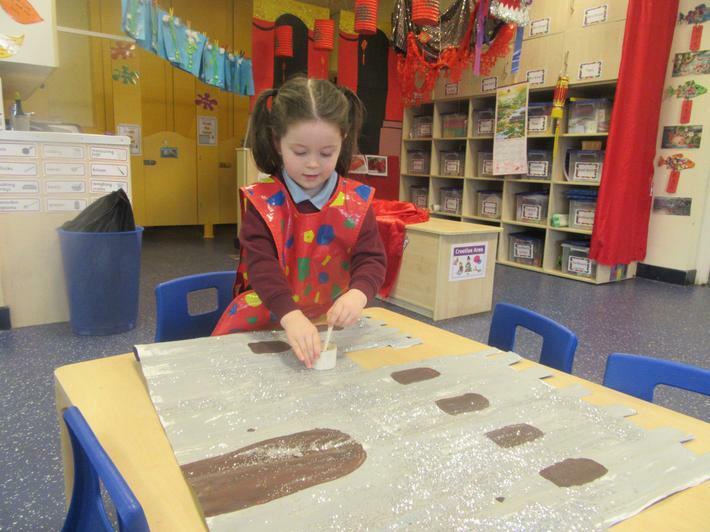 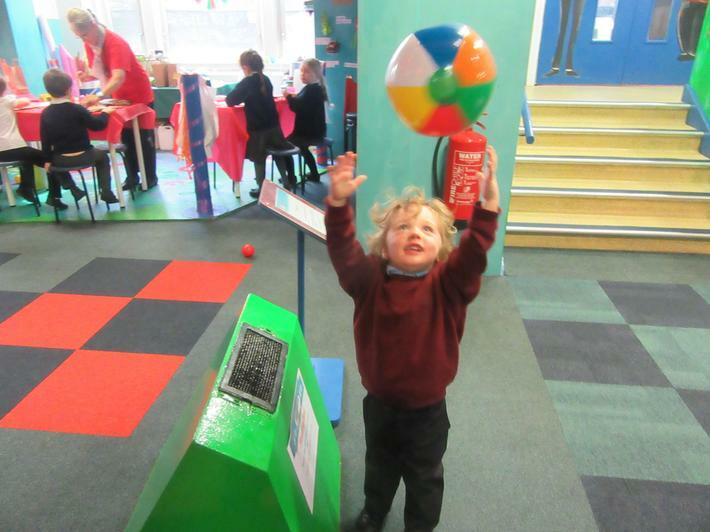 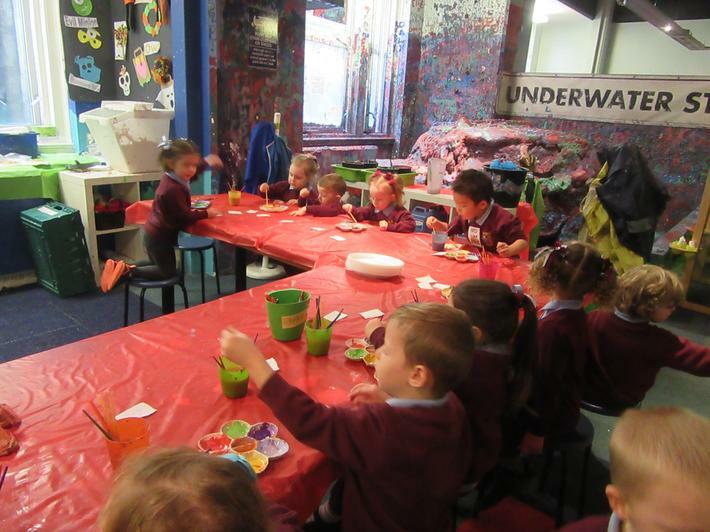 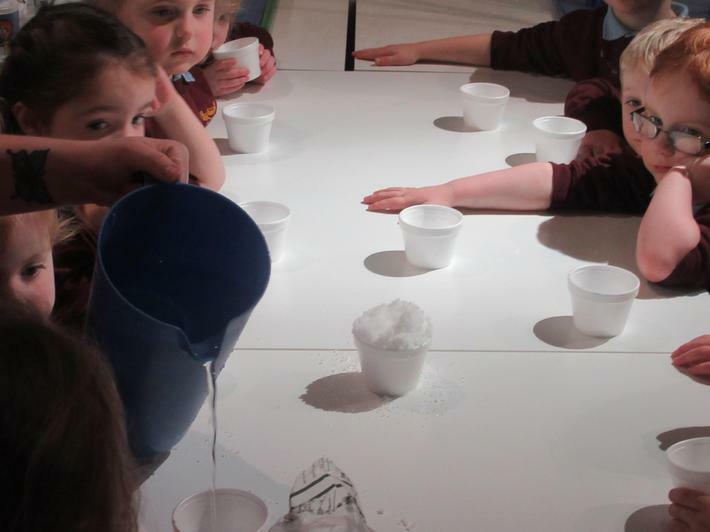 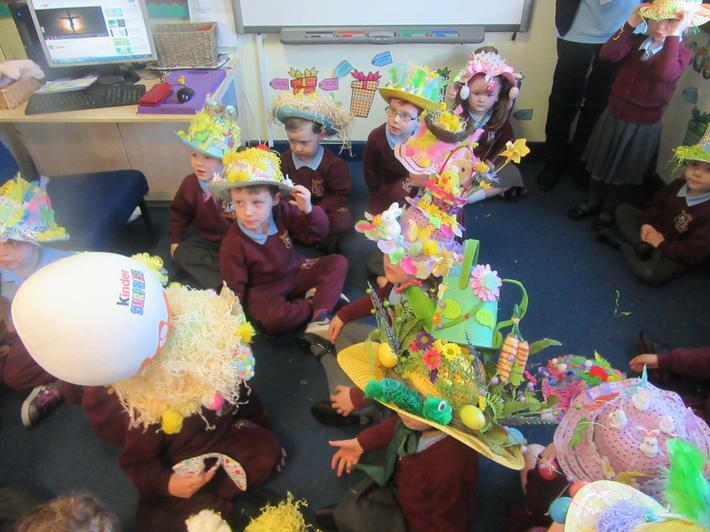 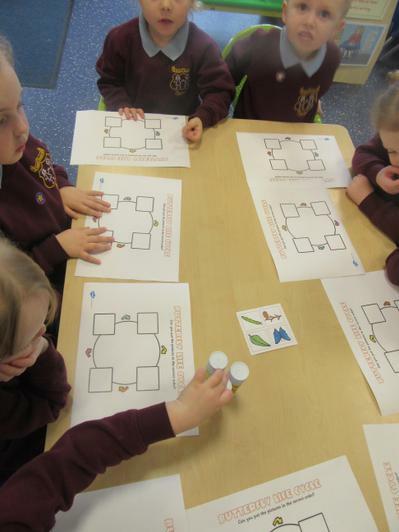 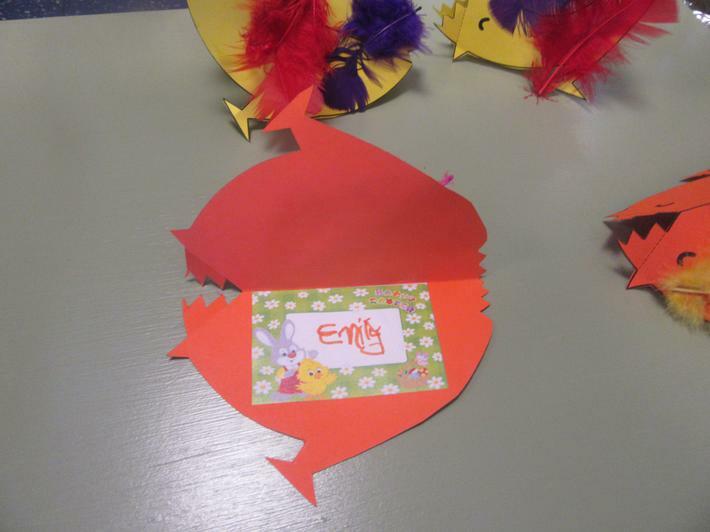 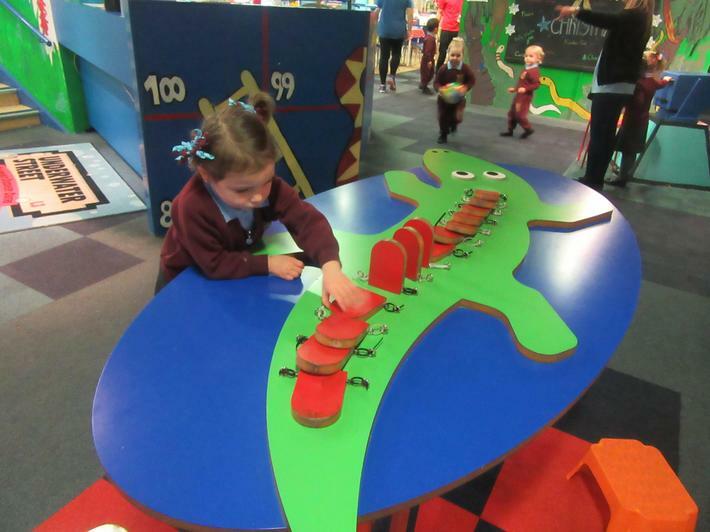 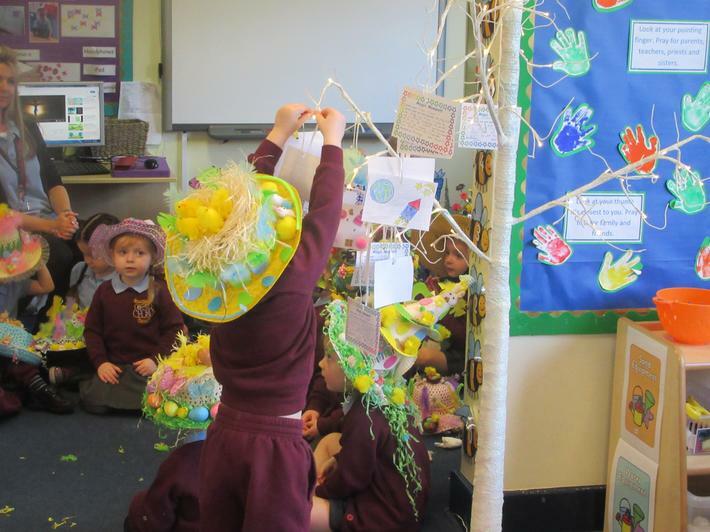 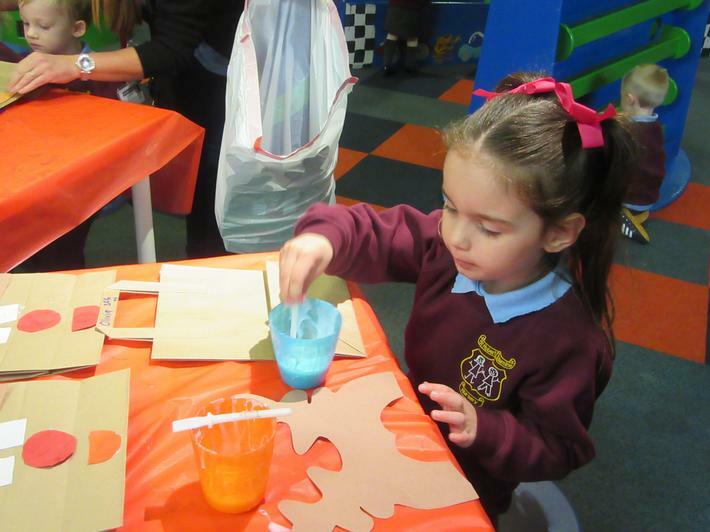 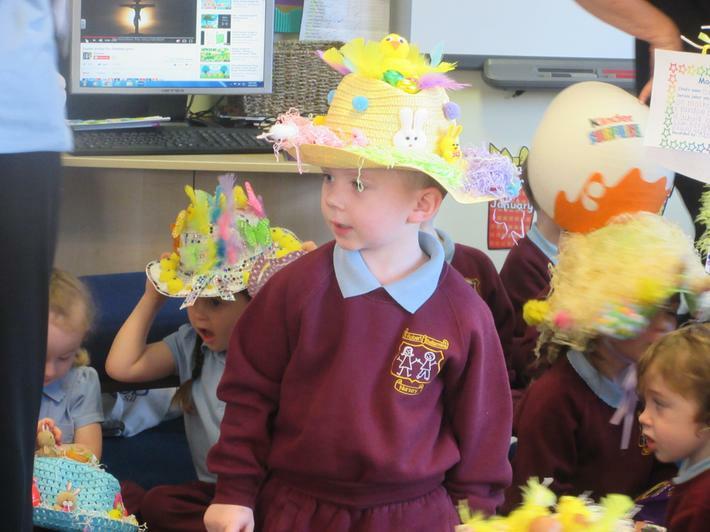 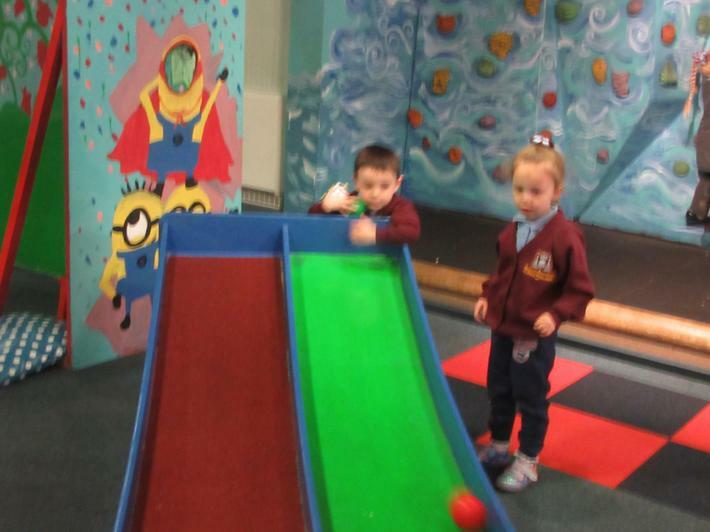 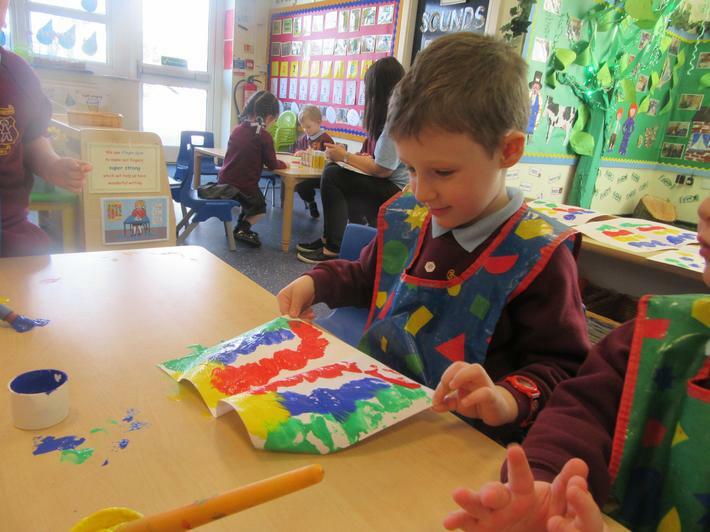 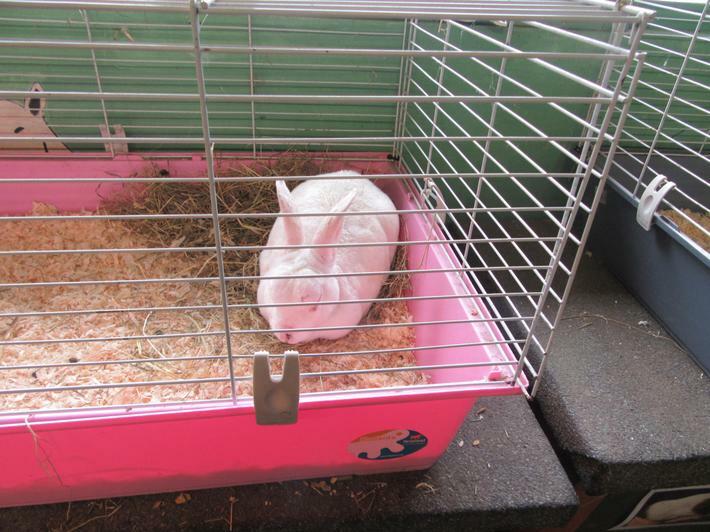 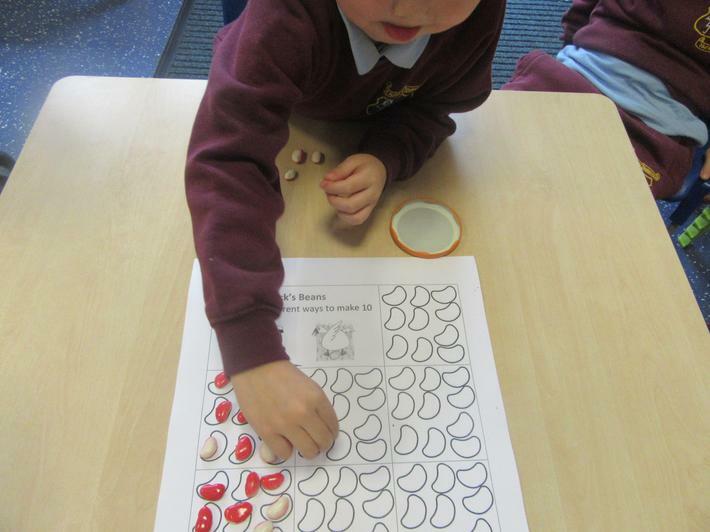 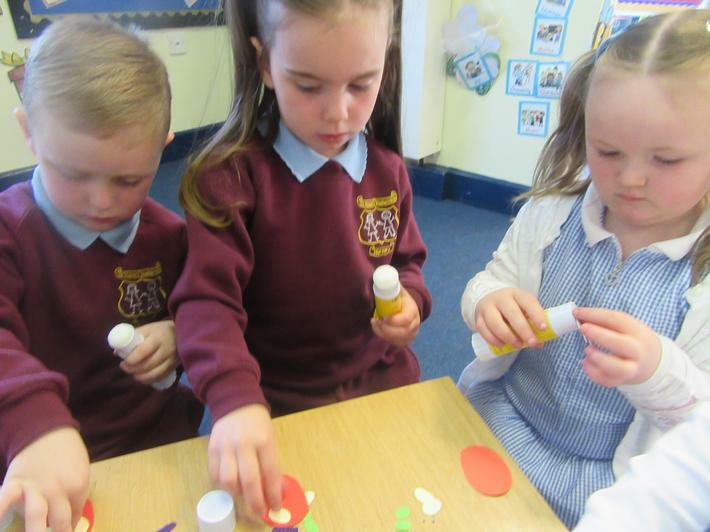 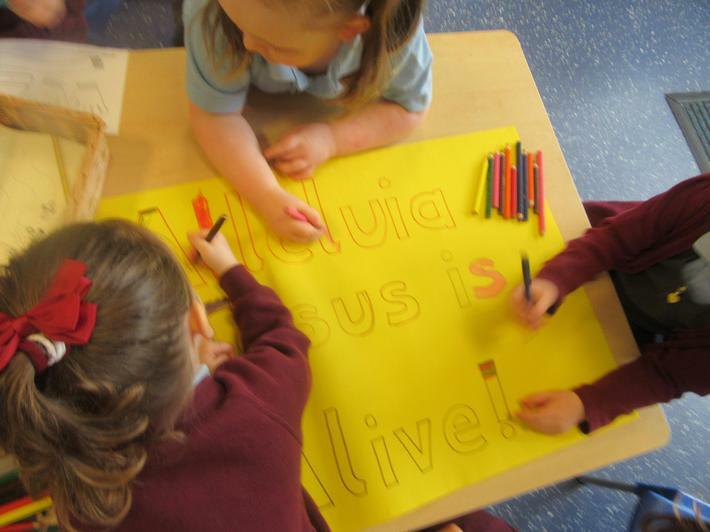 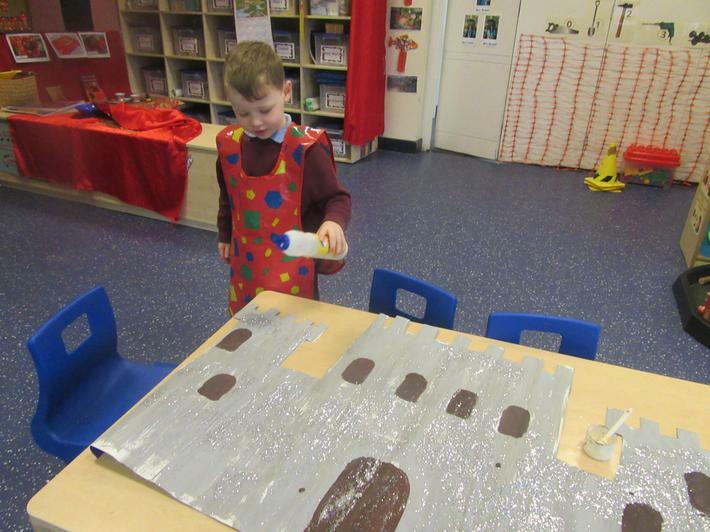 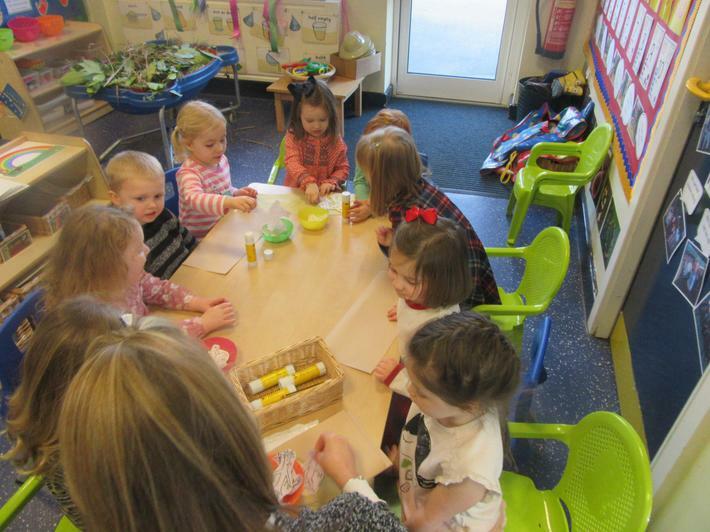 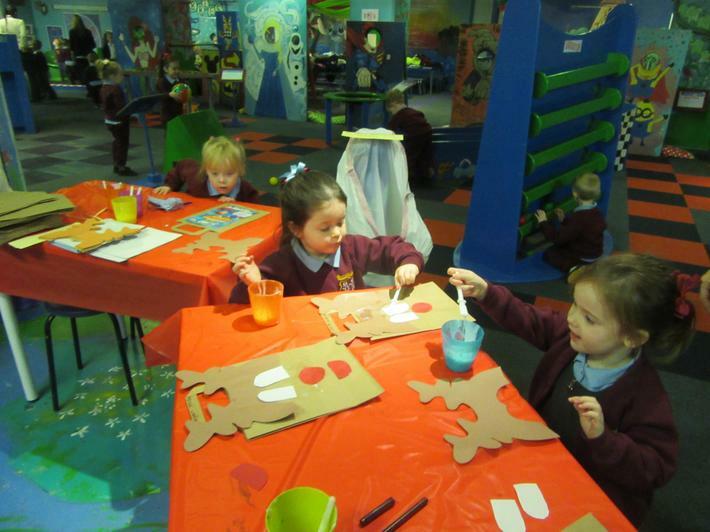 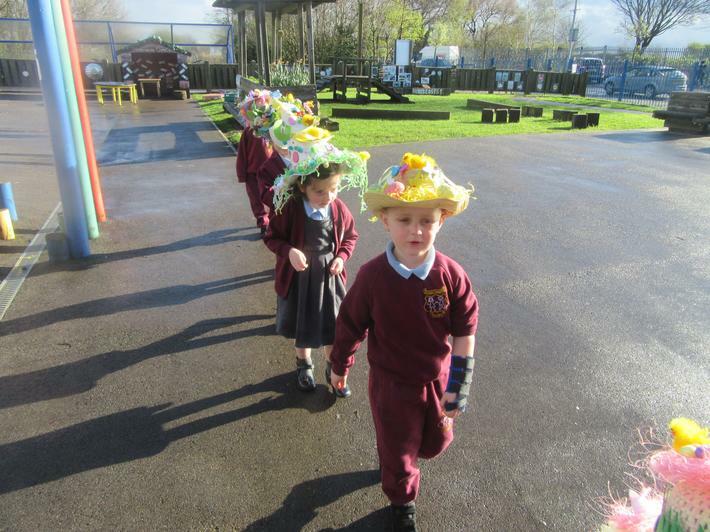 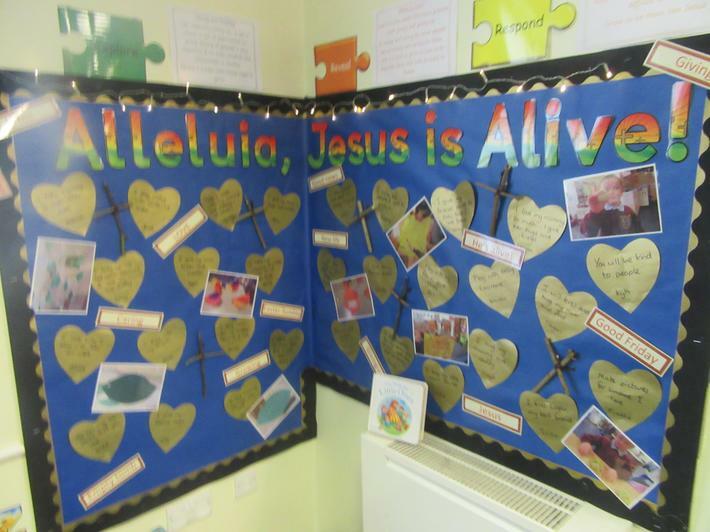 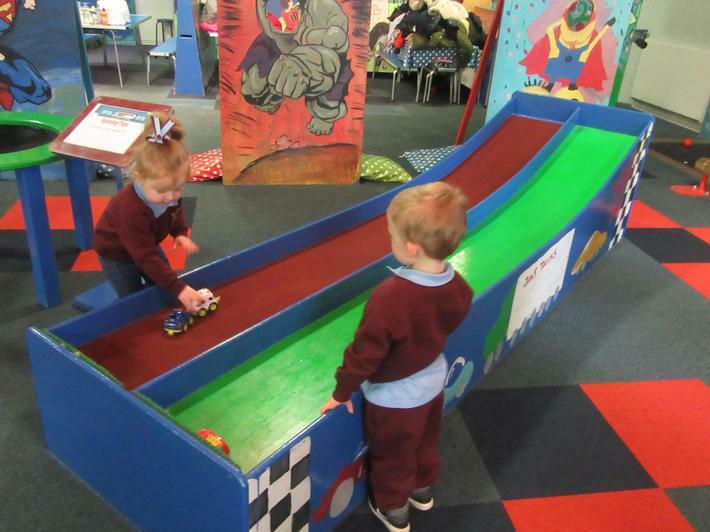 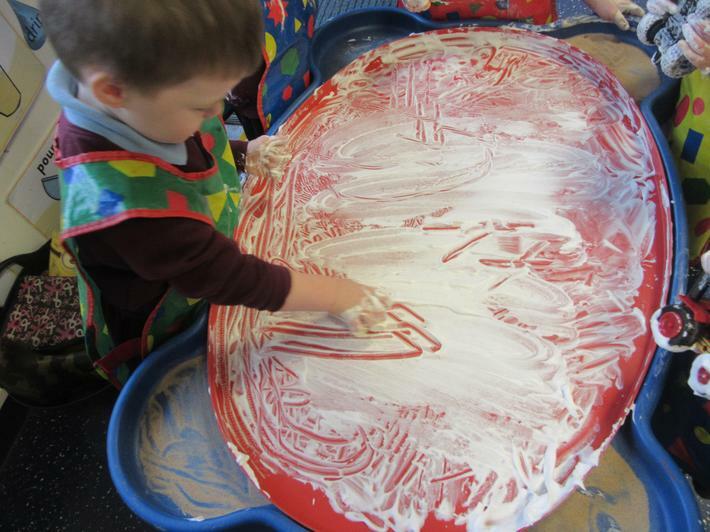 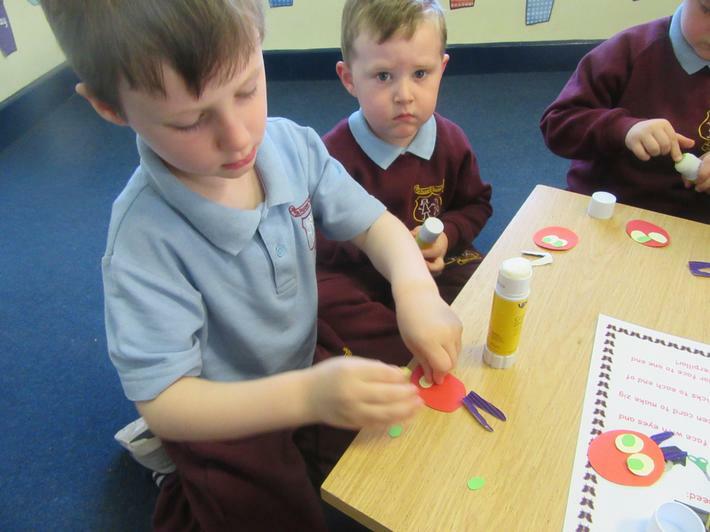 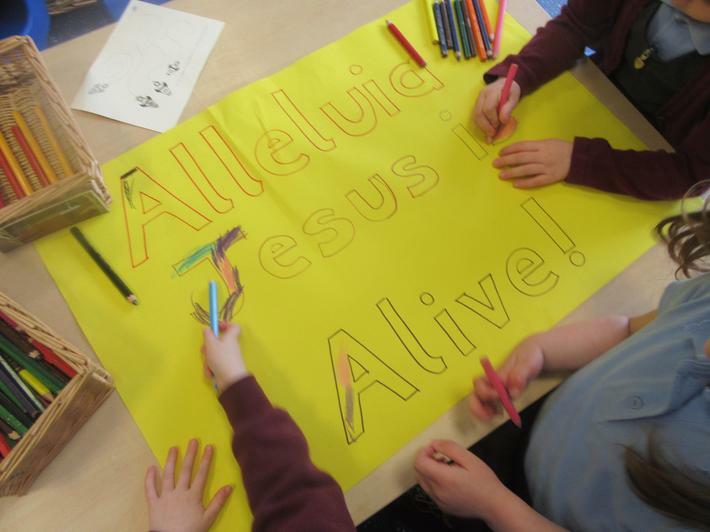 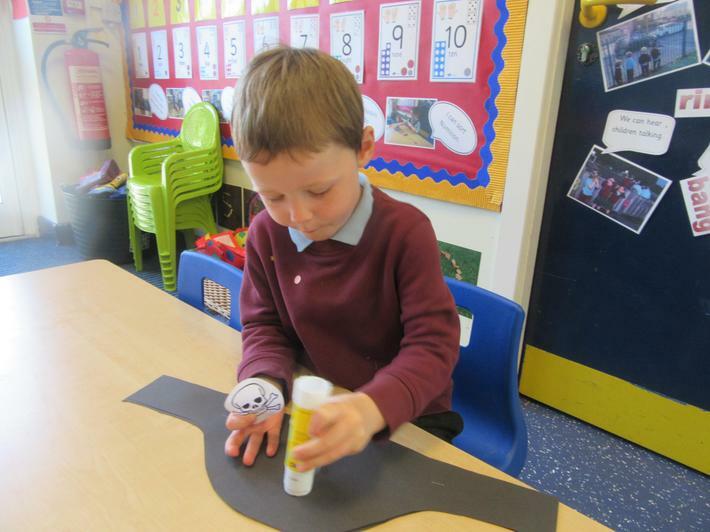 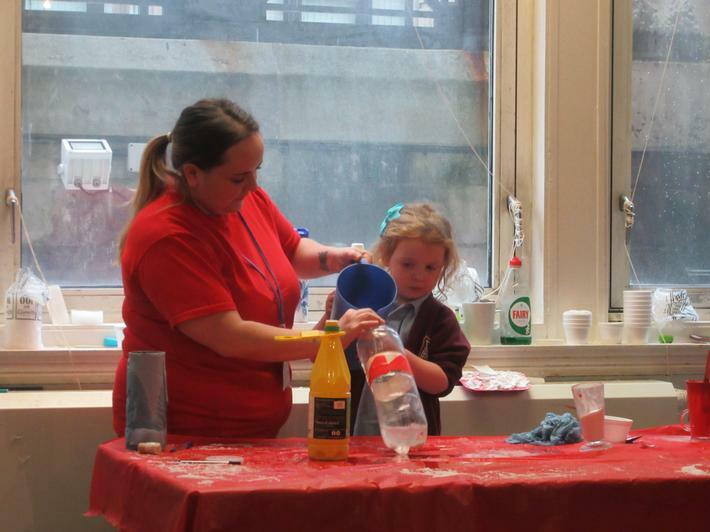 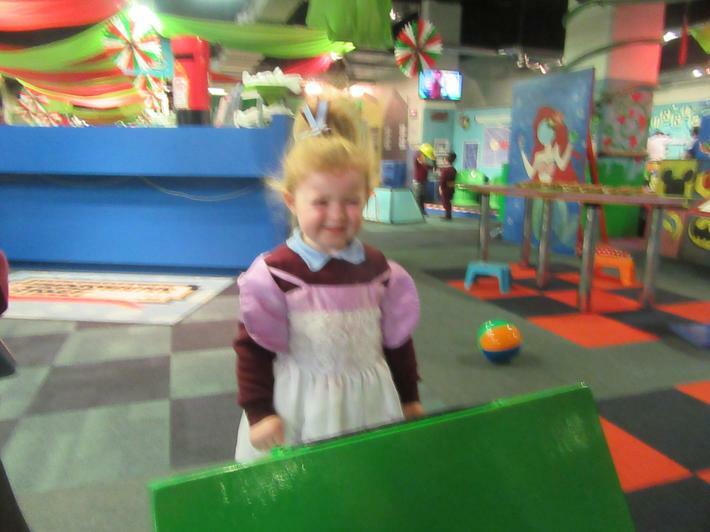 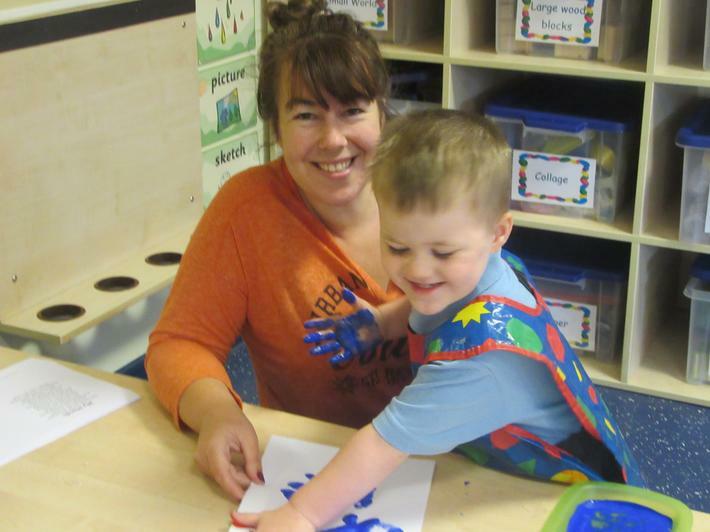 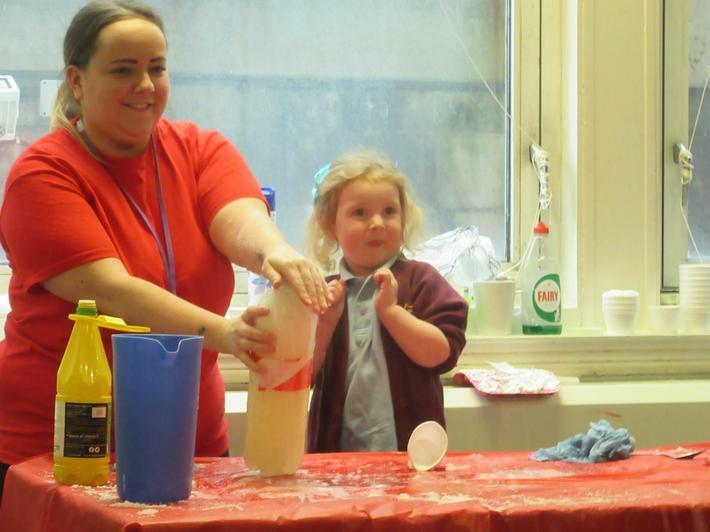 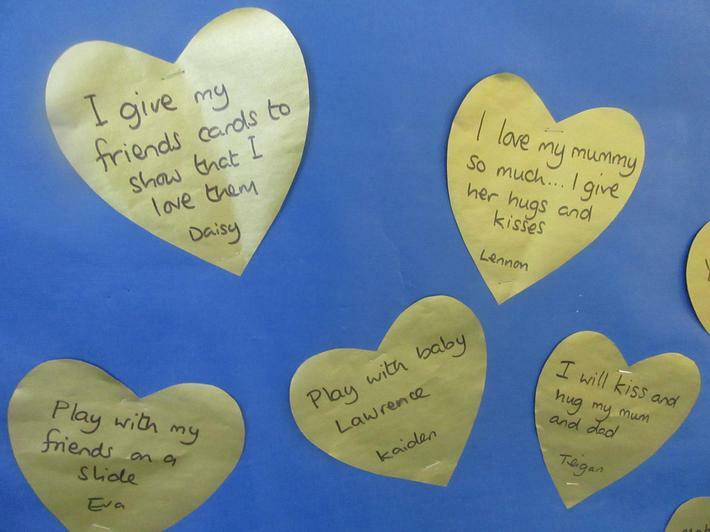 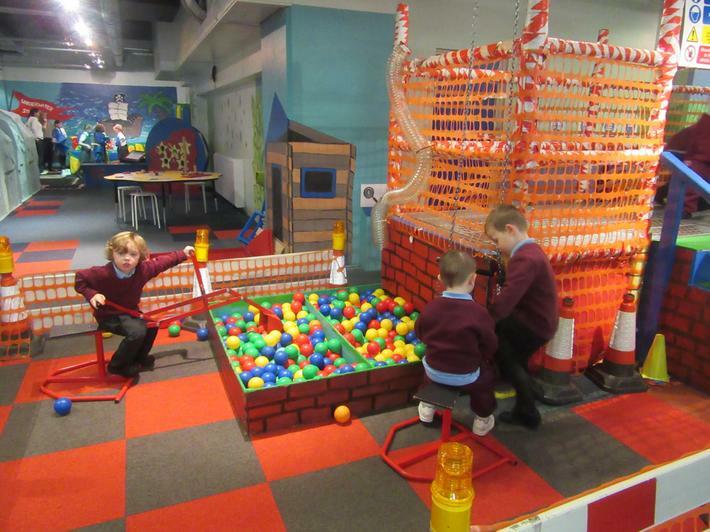 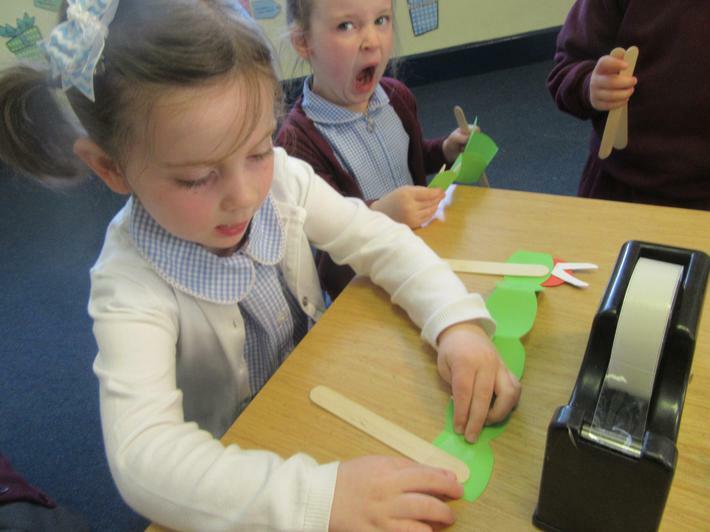 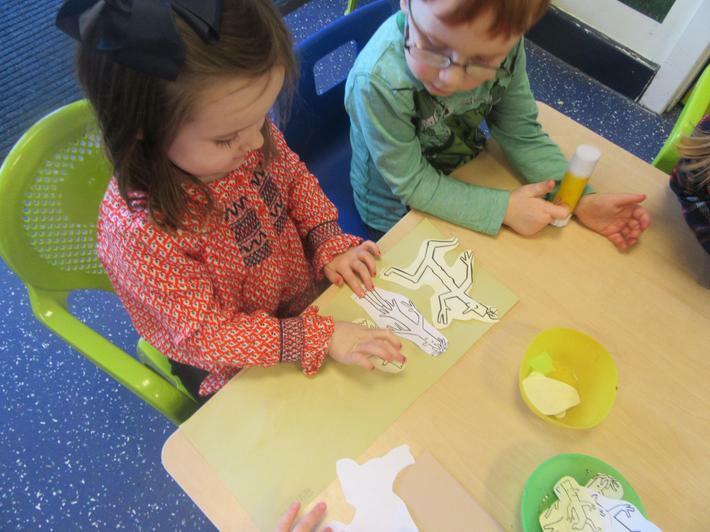 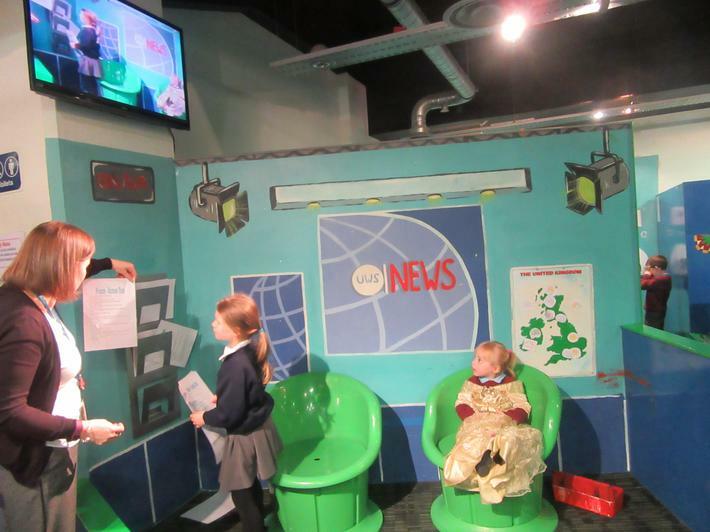 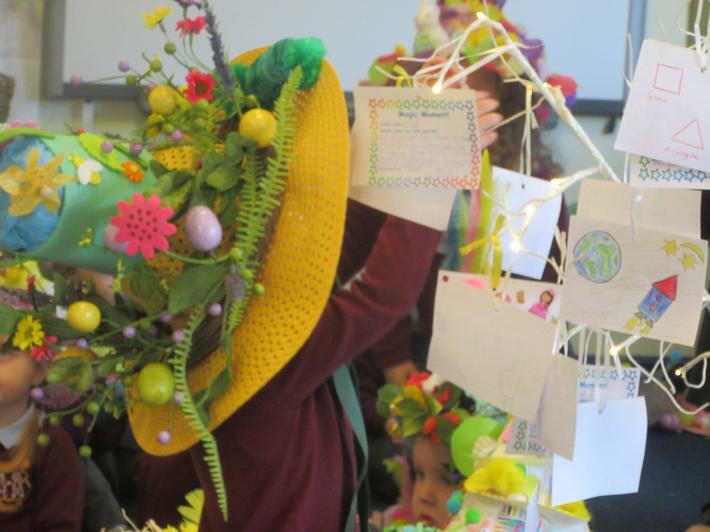 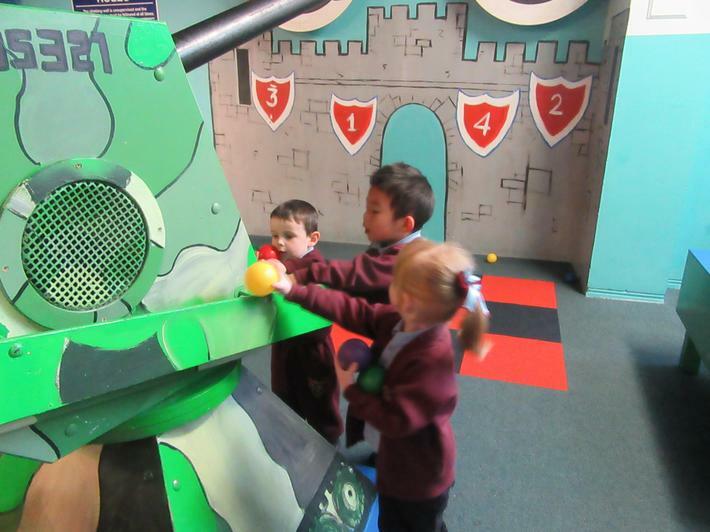 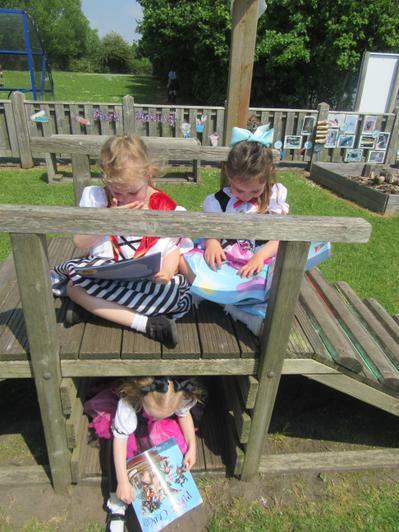 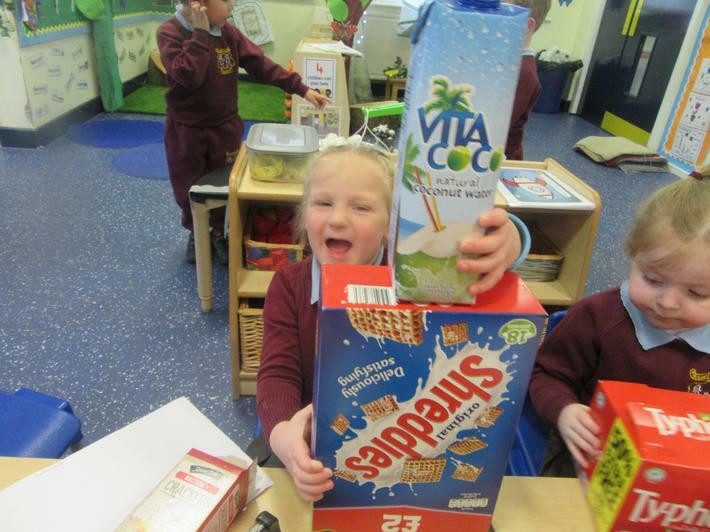 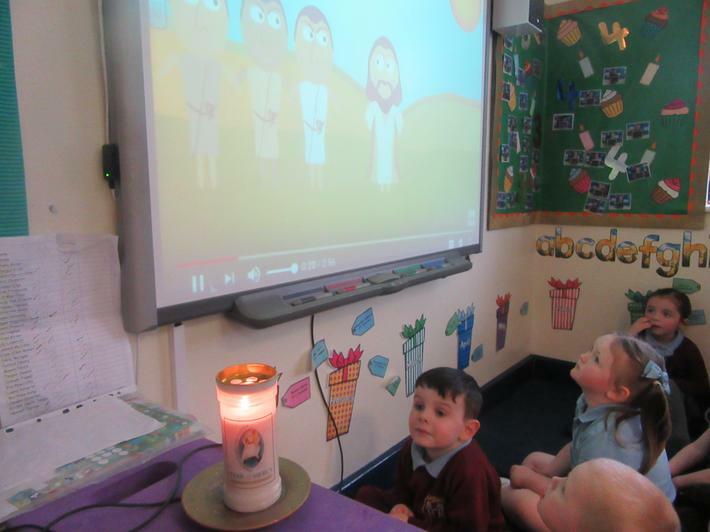 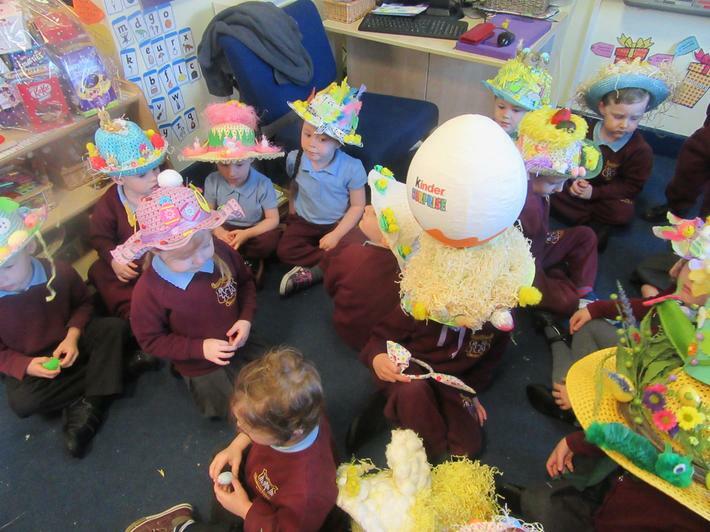 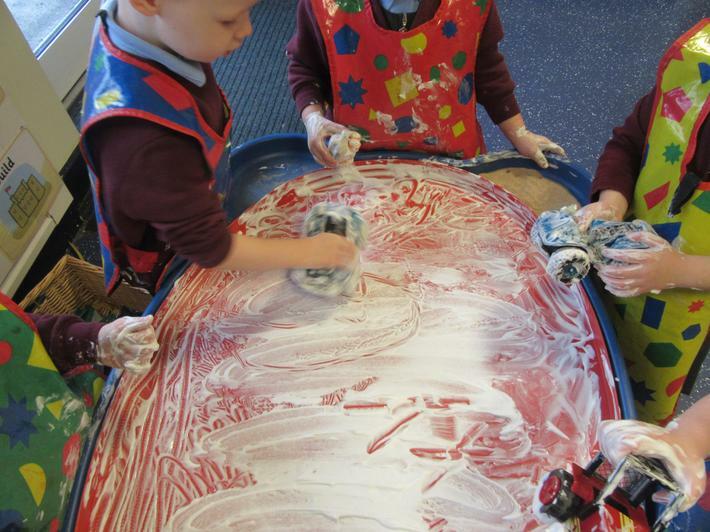 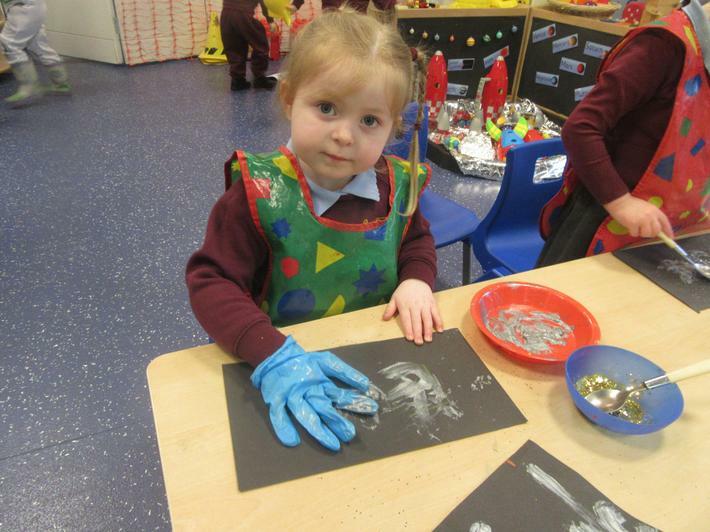 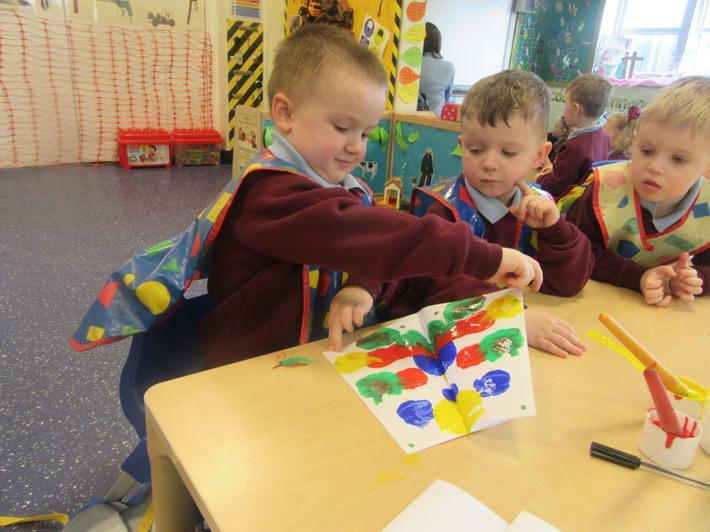 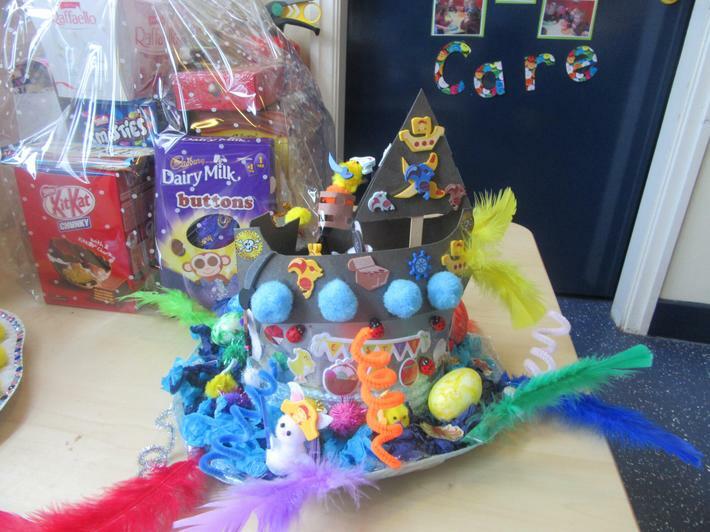 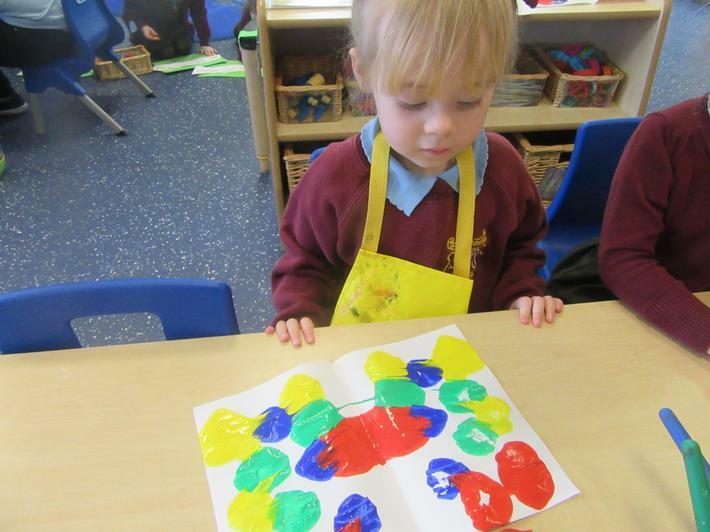 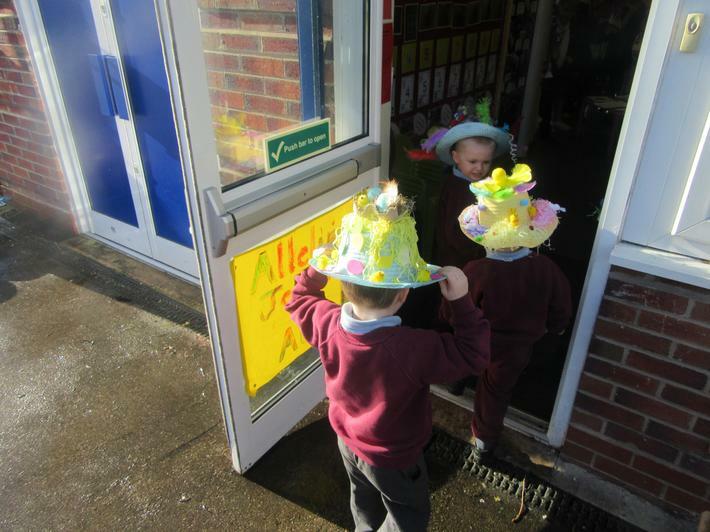 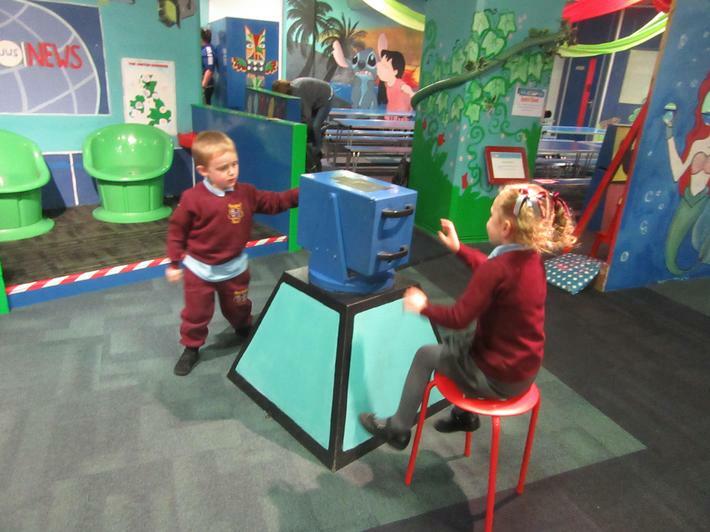 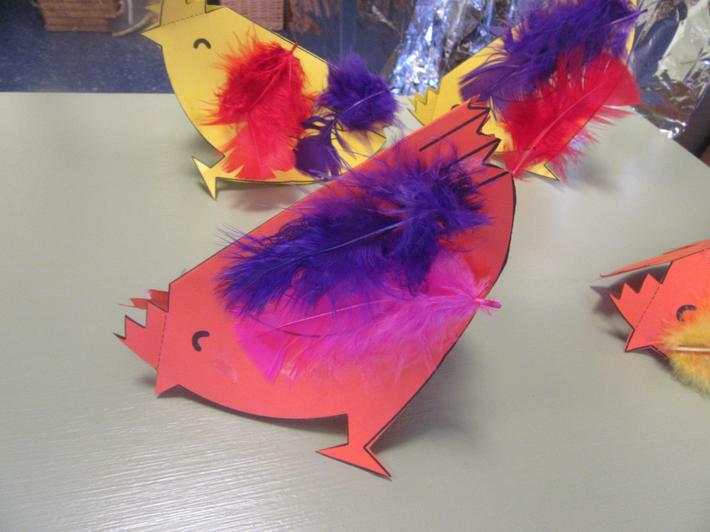 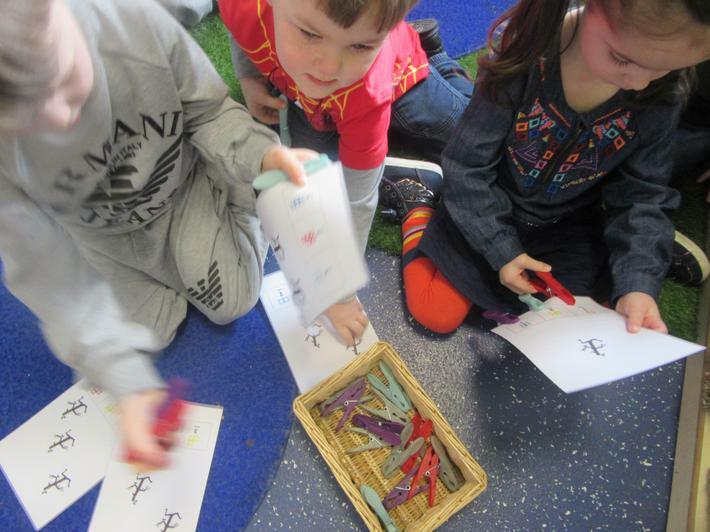 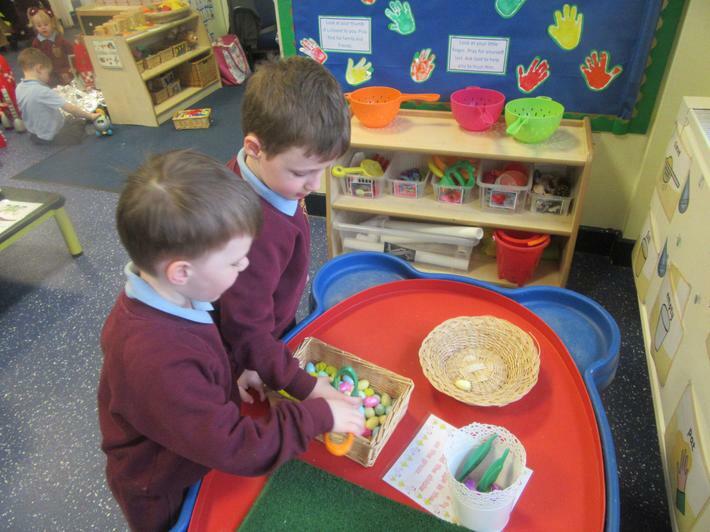 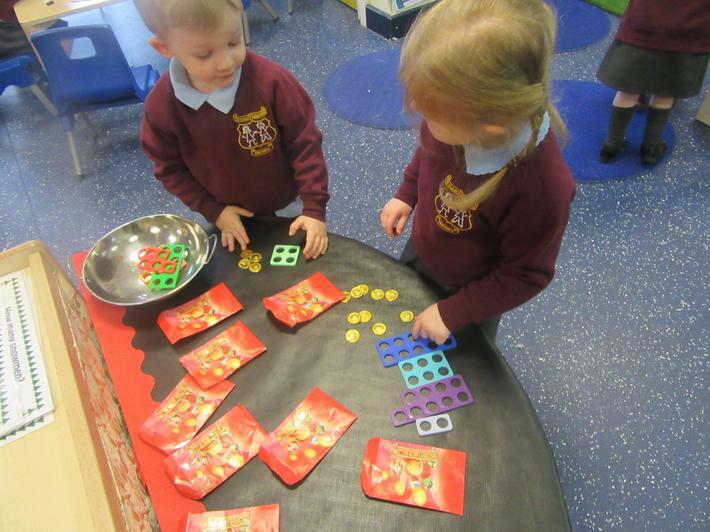 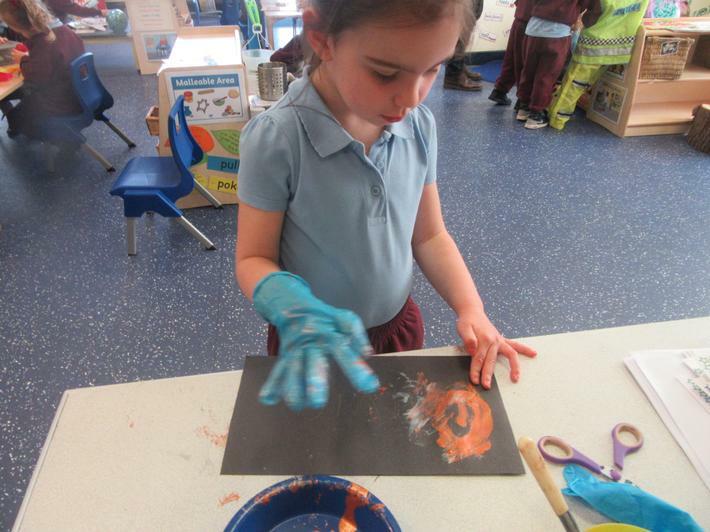 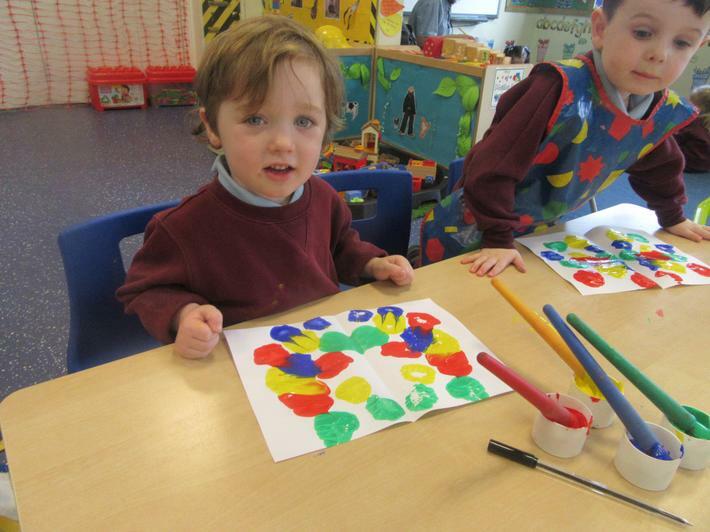 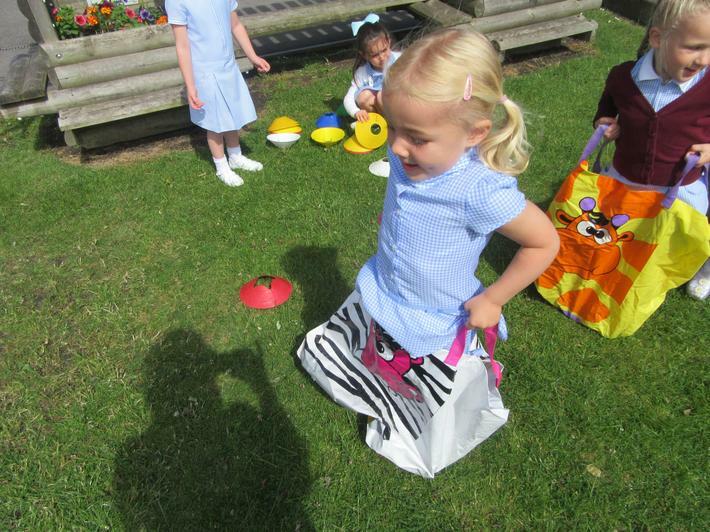 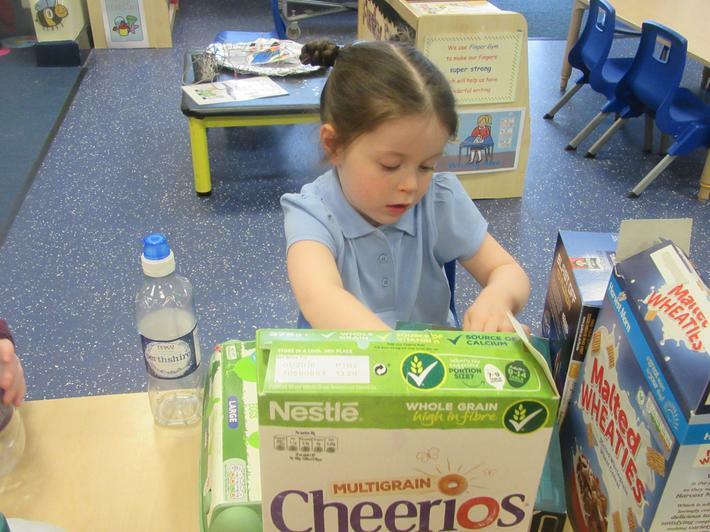 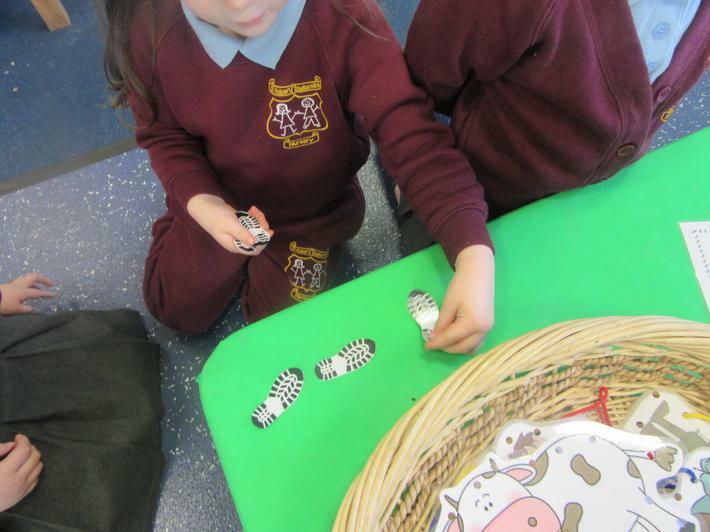 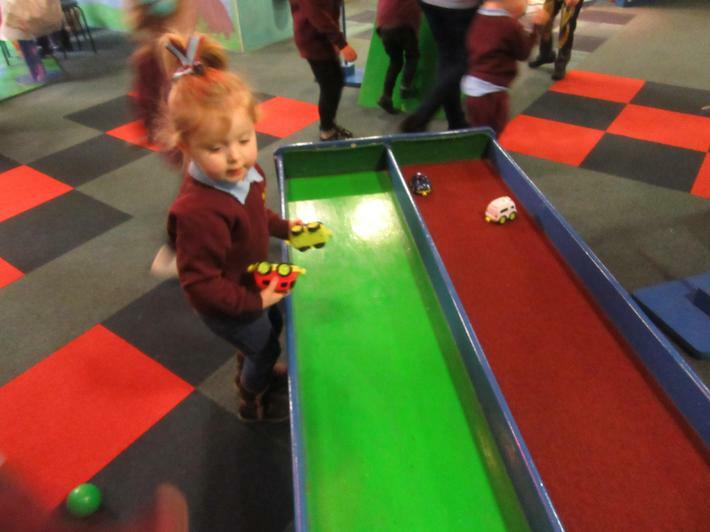 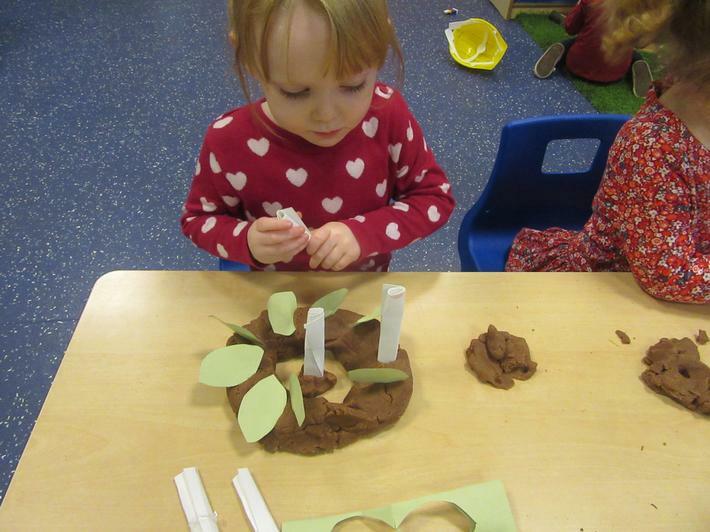 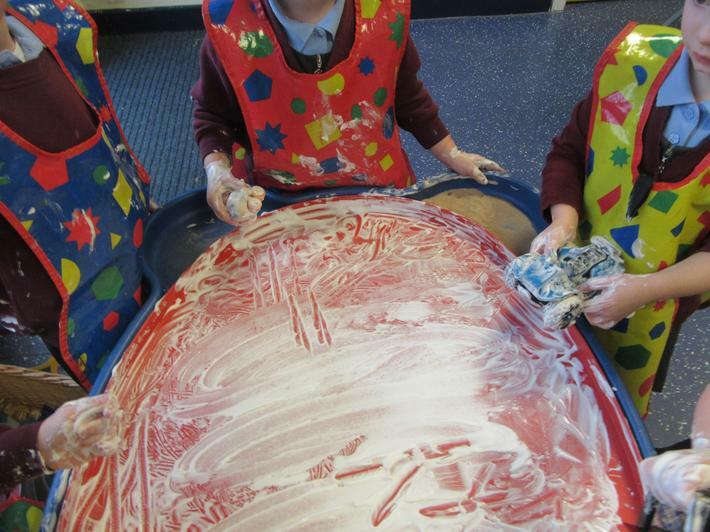 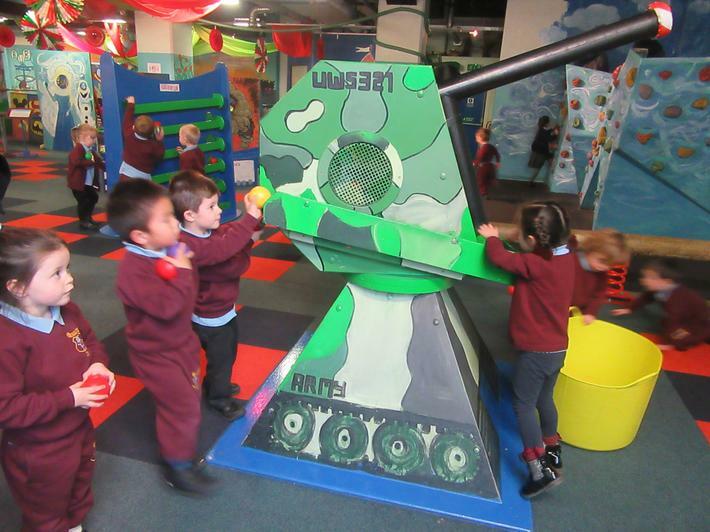 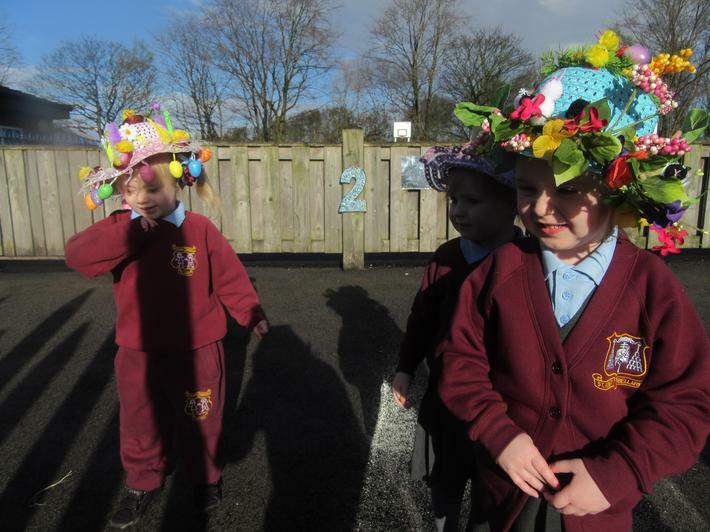 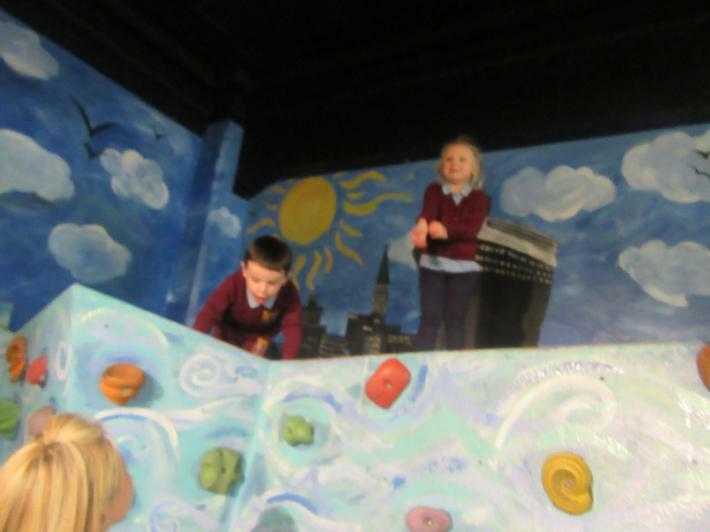 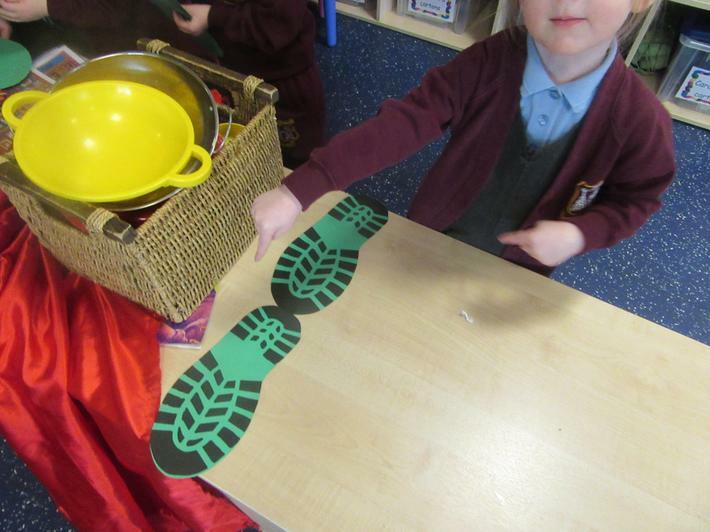 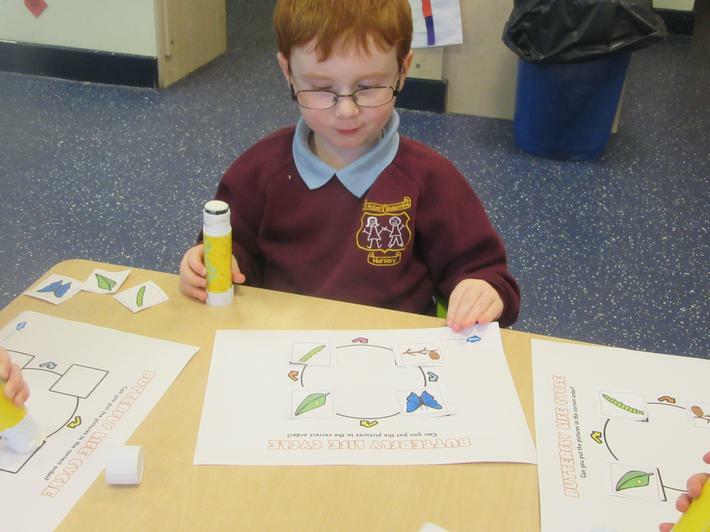 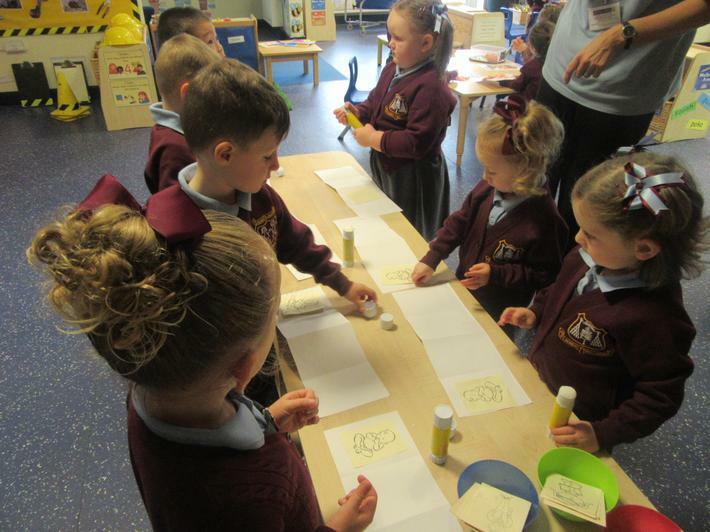 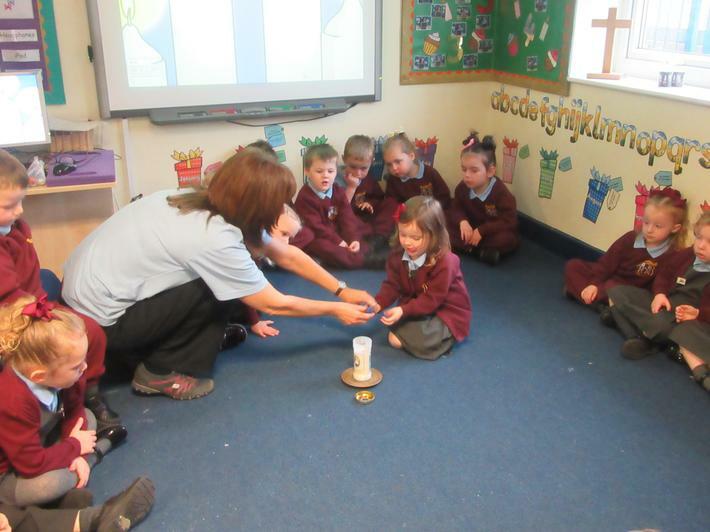 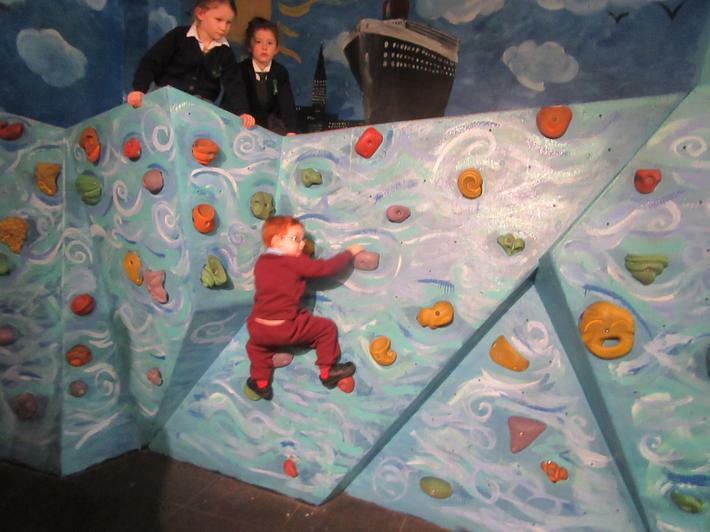 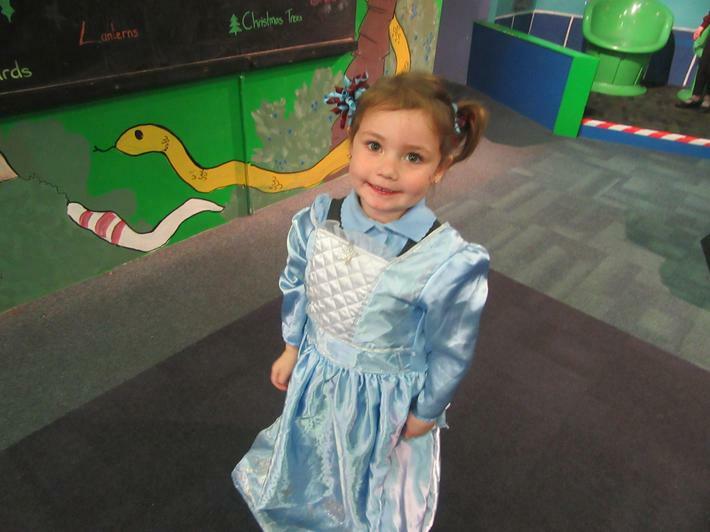 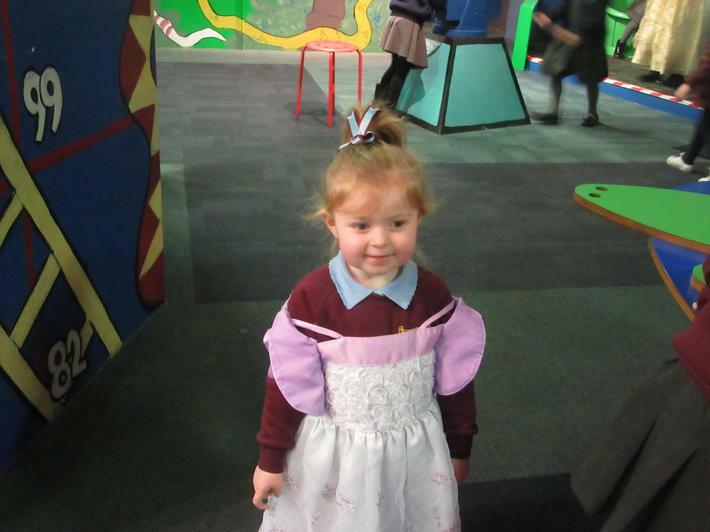 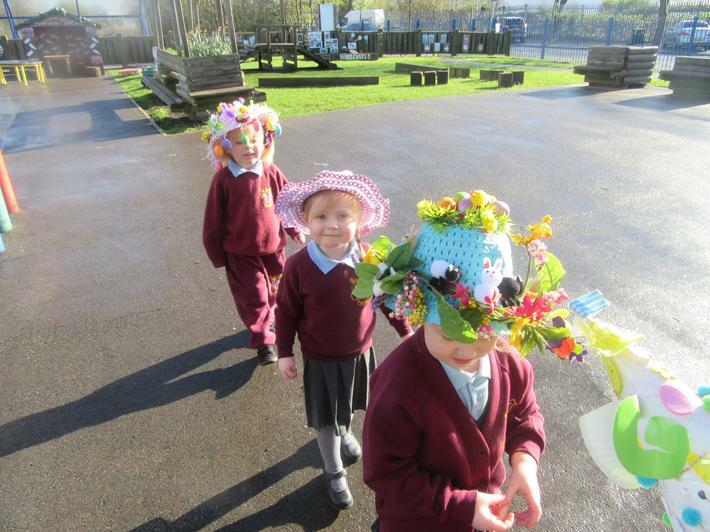 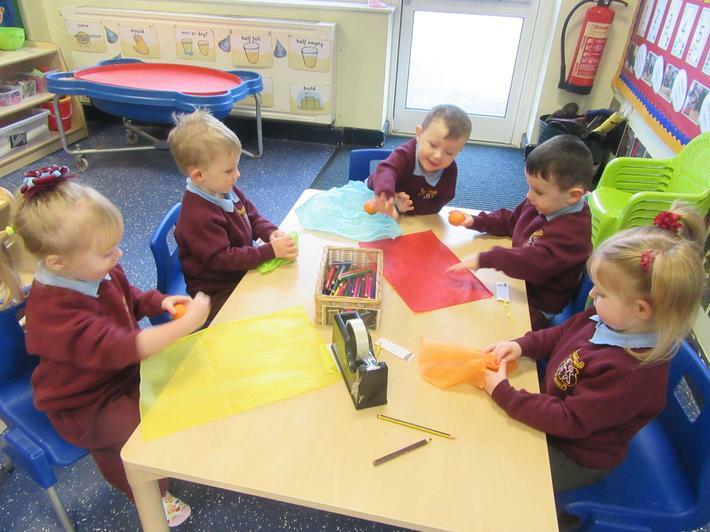 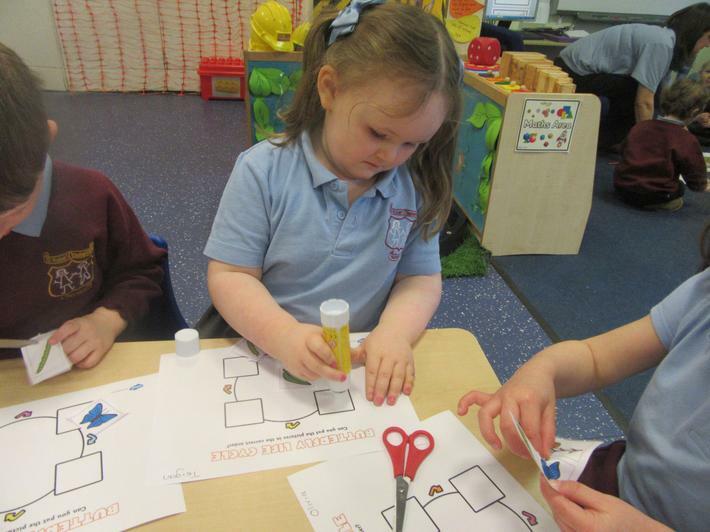 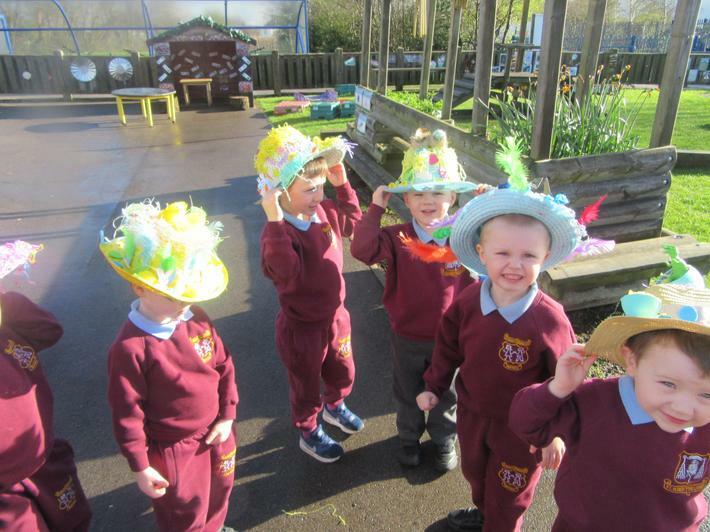 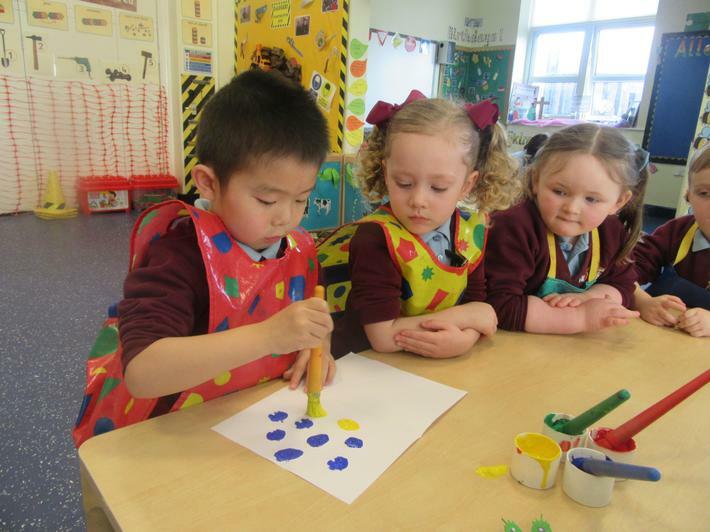 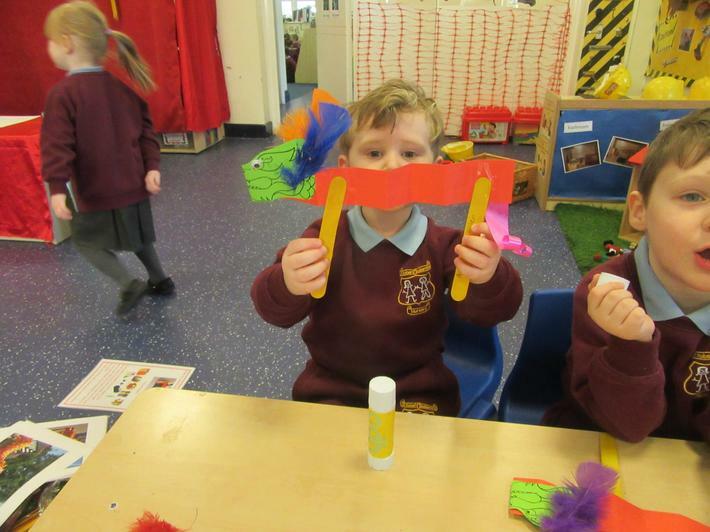 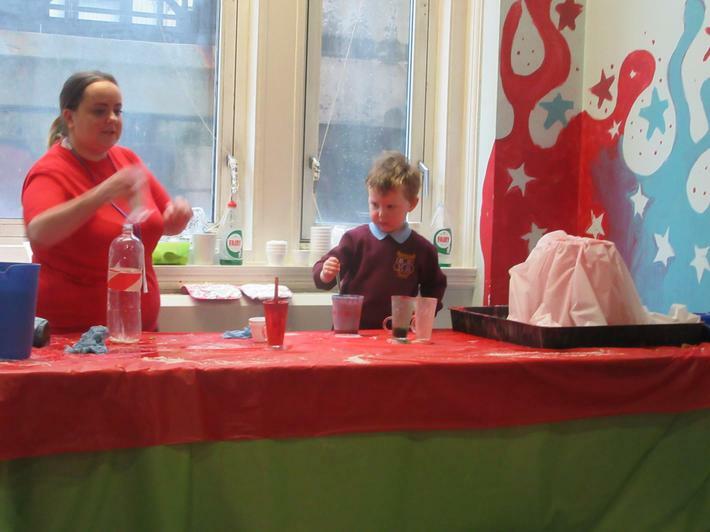 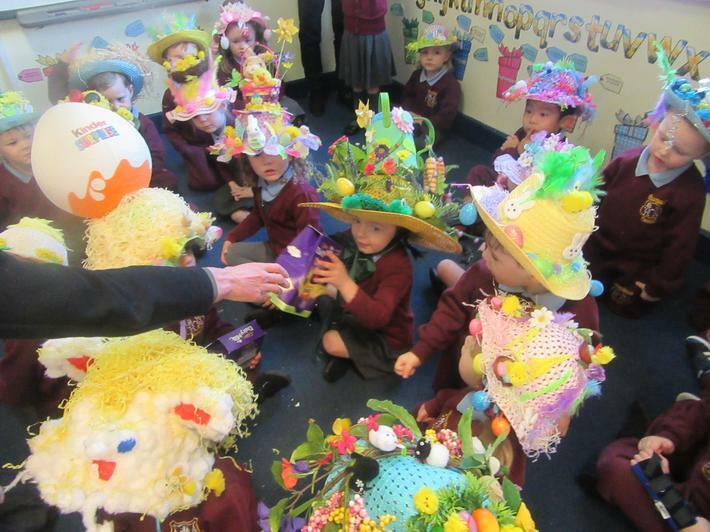 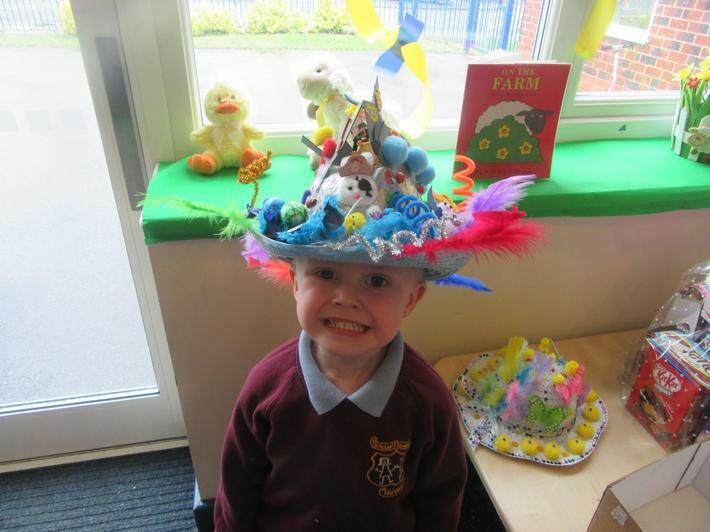 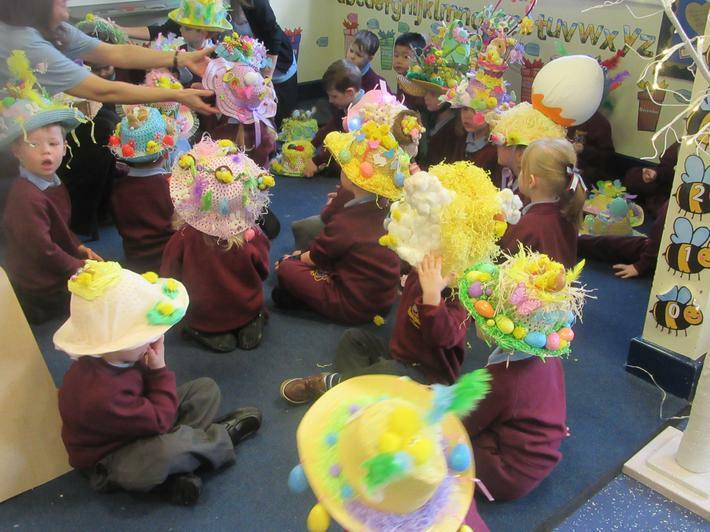 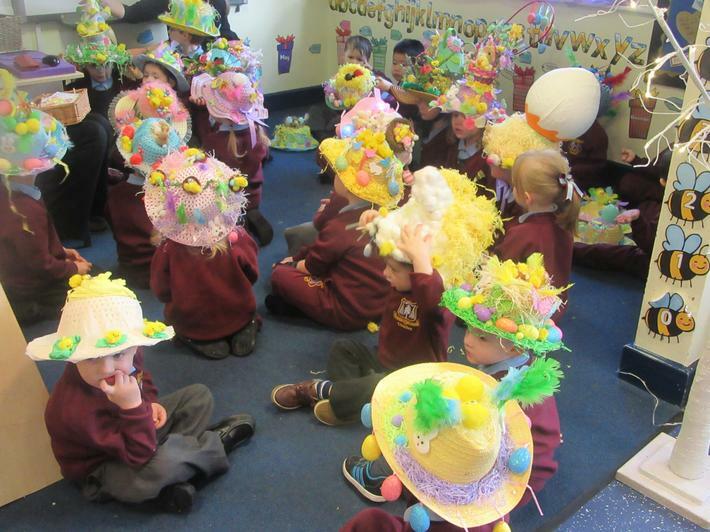 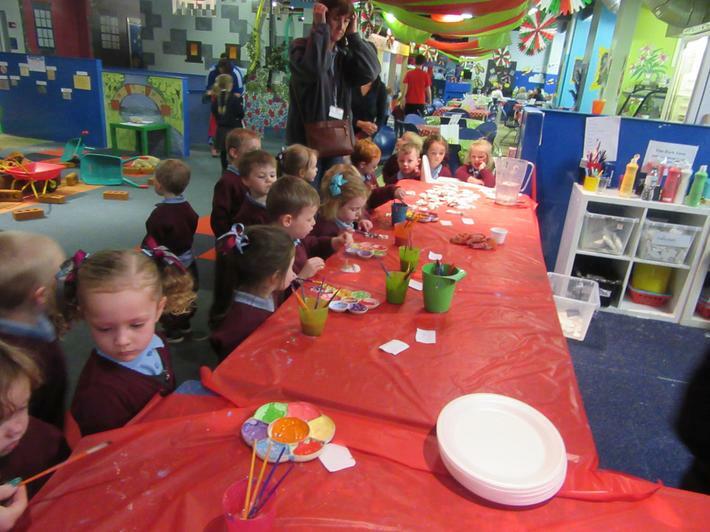 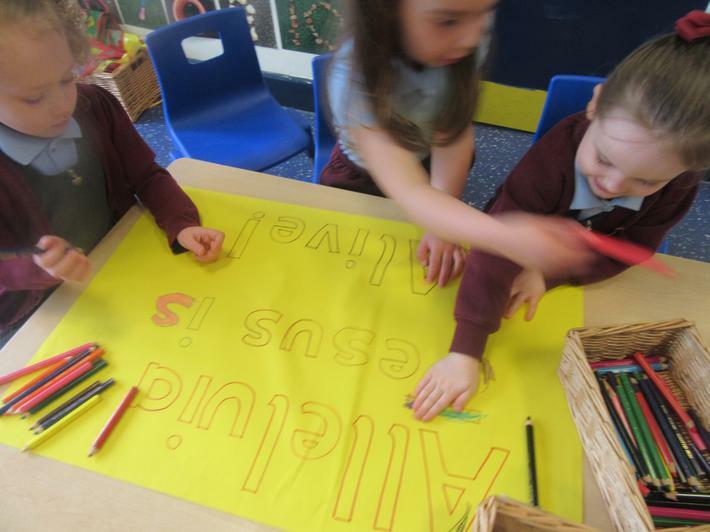 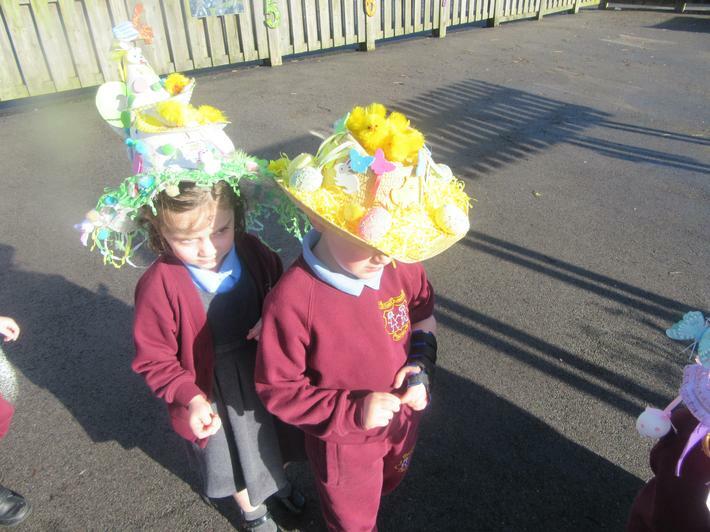 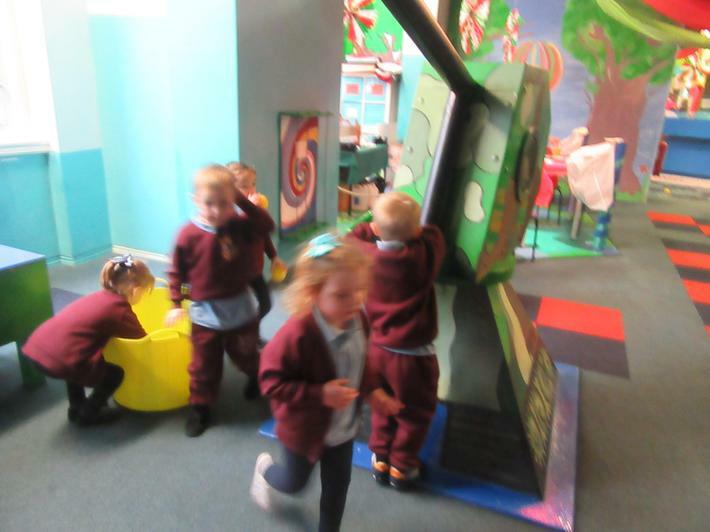 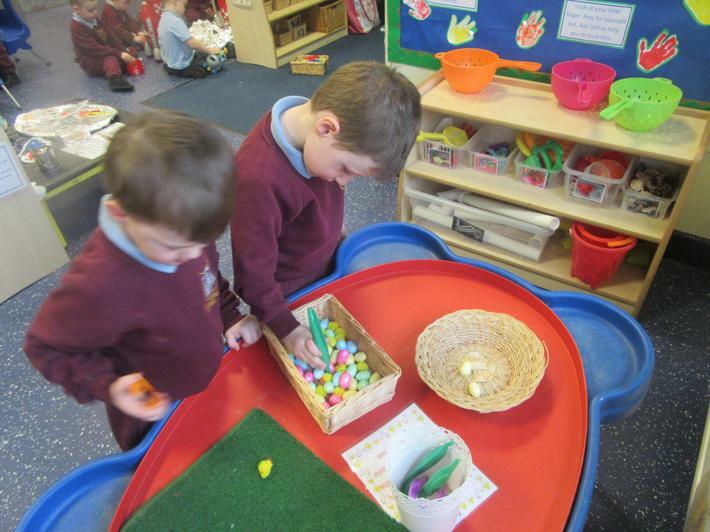 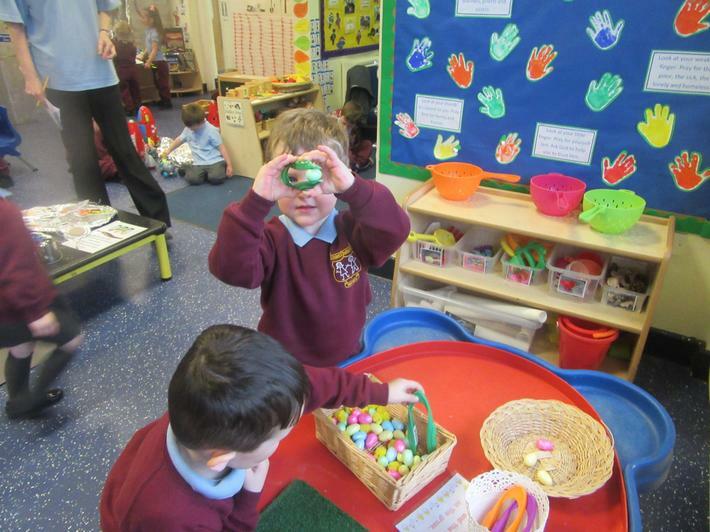 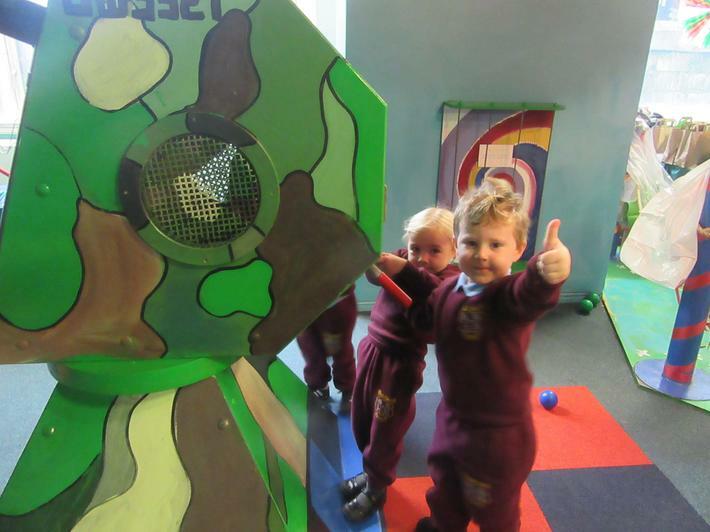 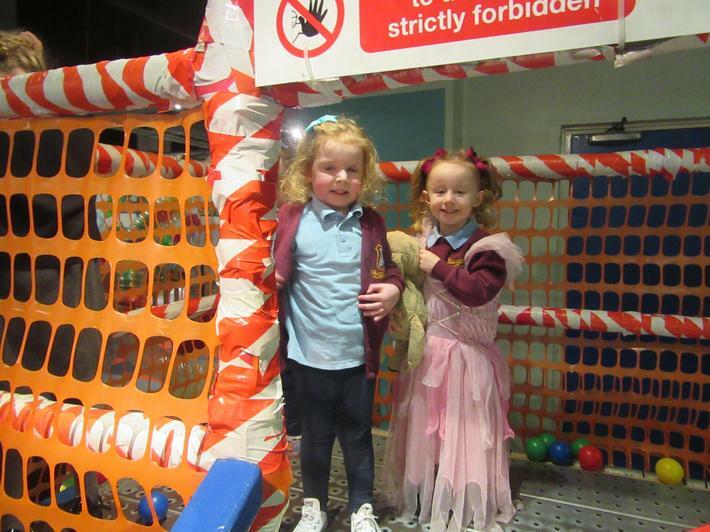 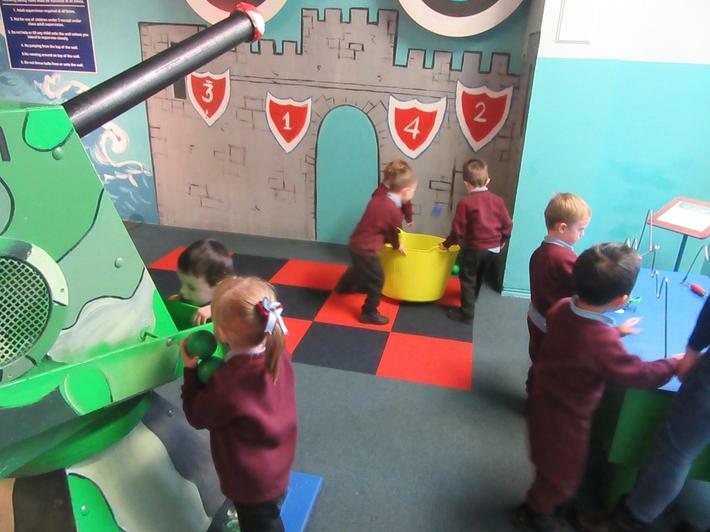 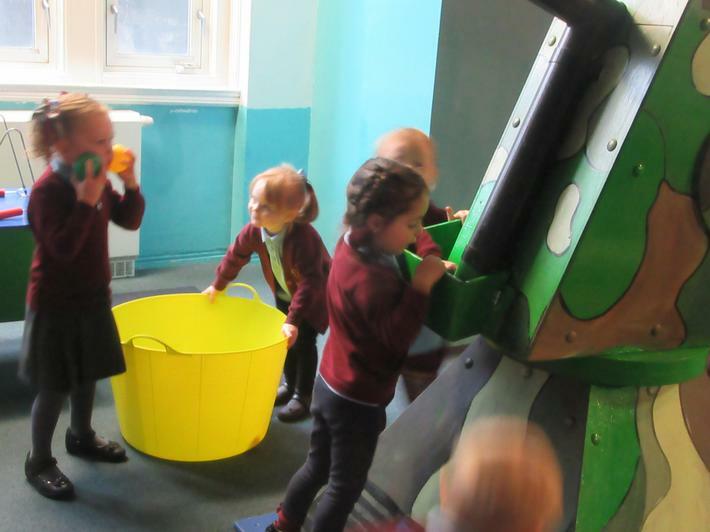 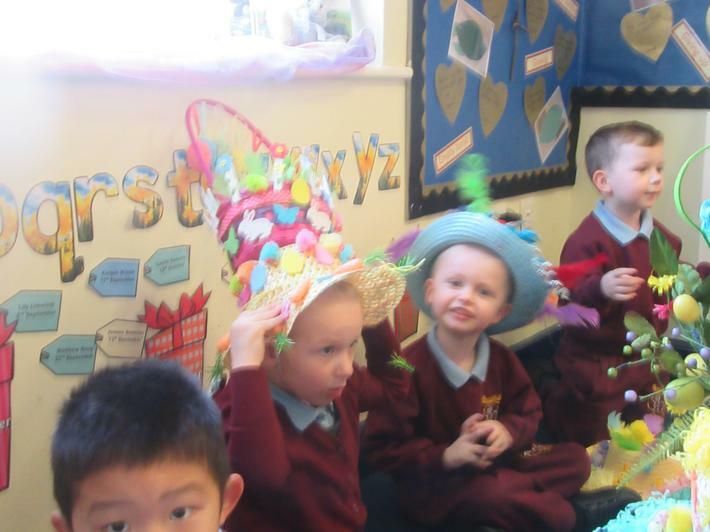 We have been getting ready for Easter and have engaged in lots of themed activities! 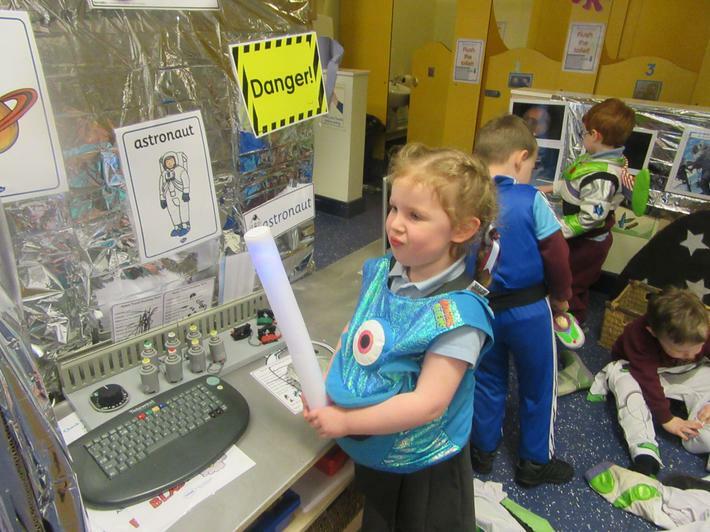 SPACE:- This half term's theme was space. 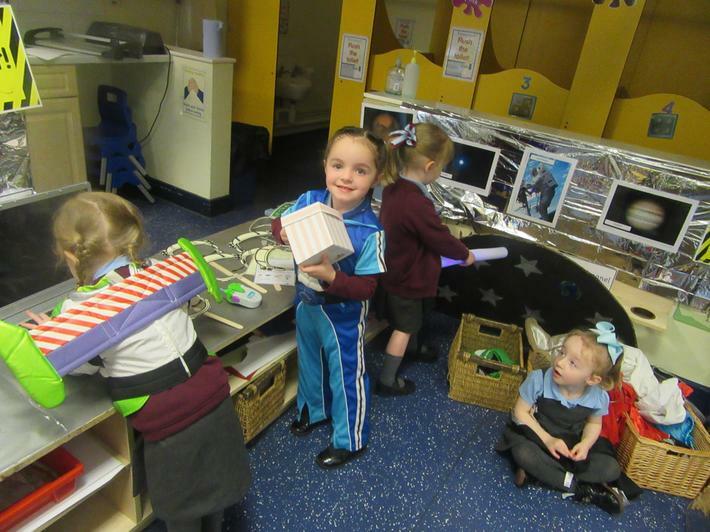 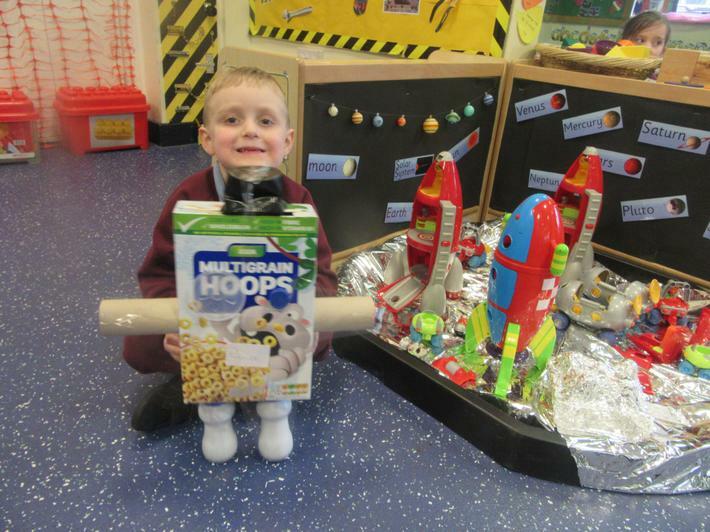 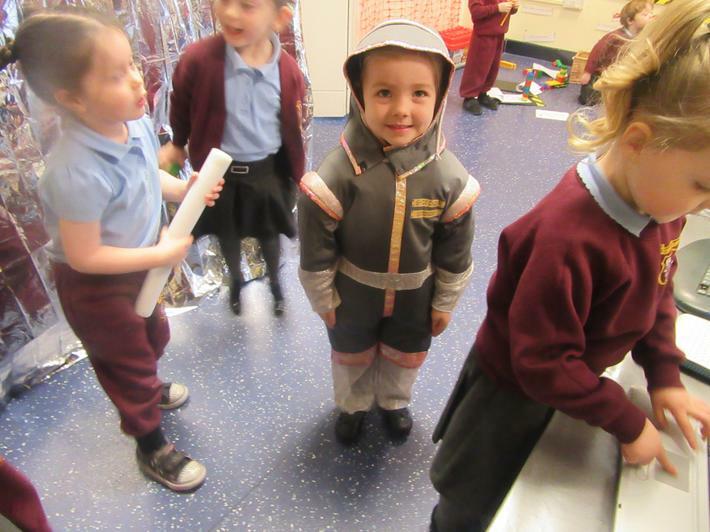 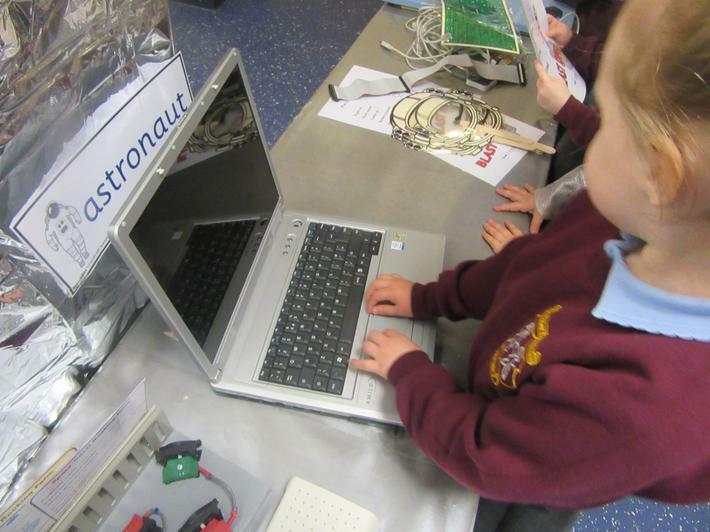 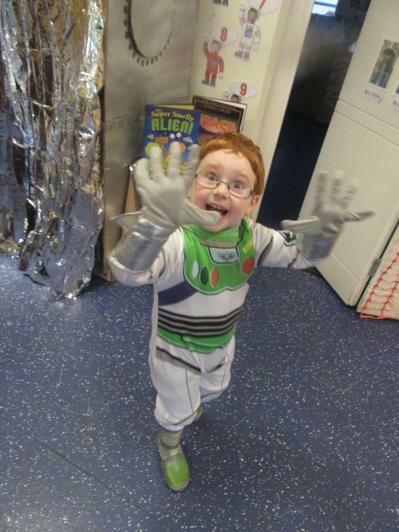 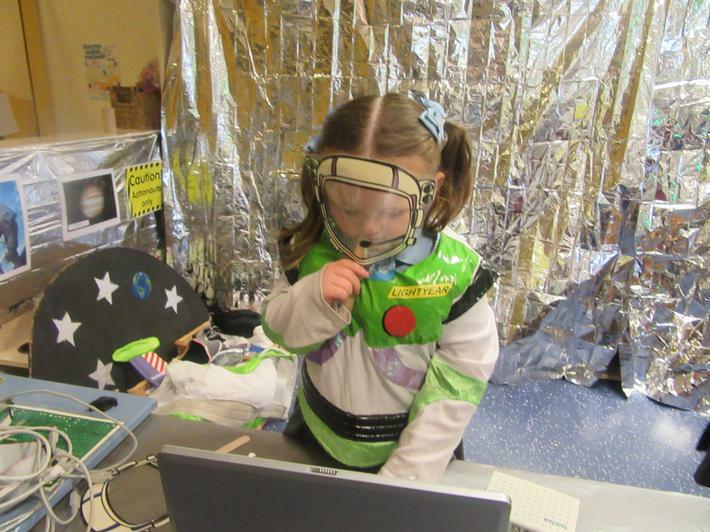 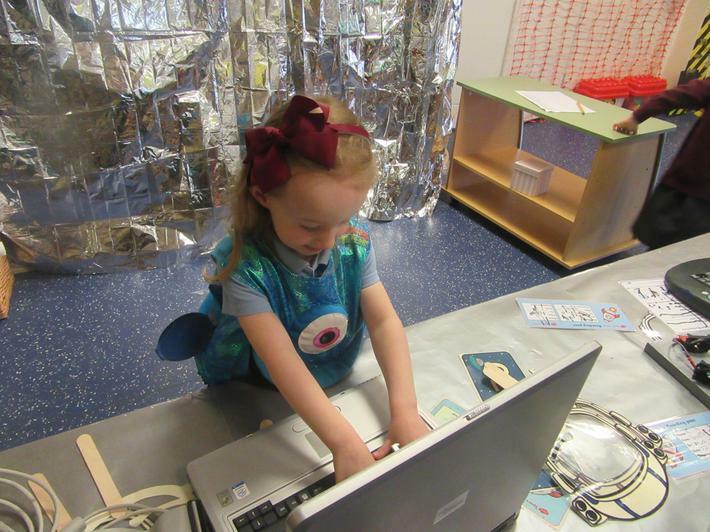 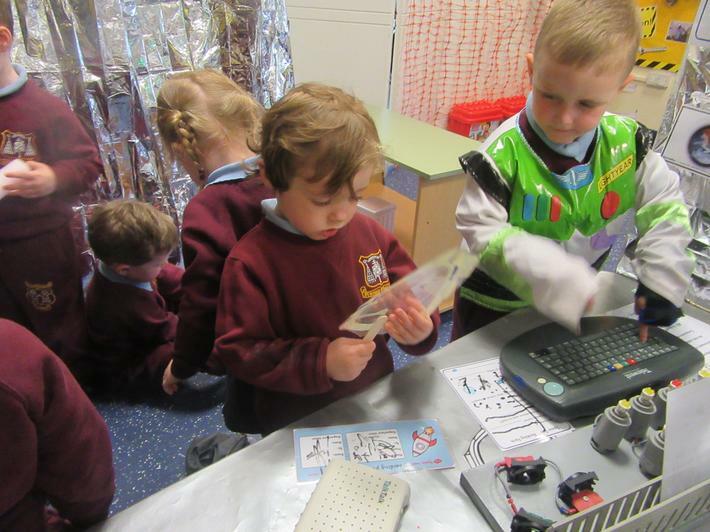 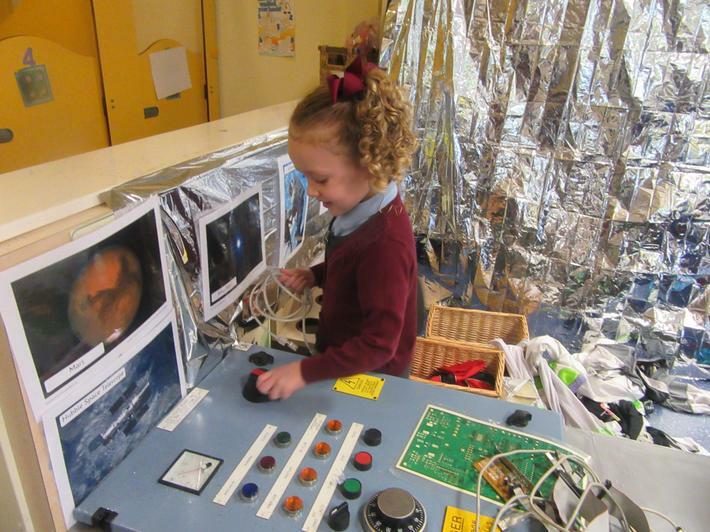 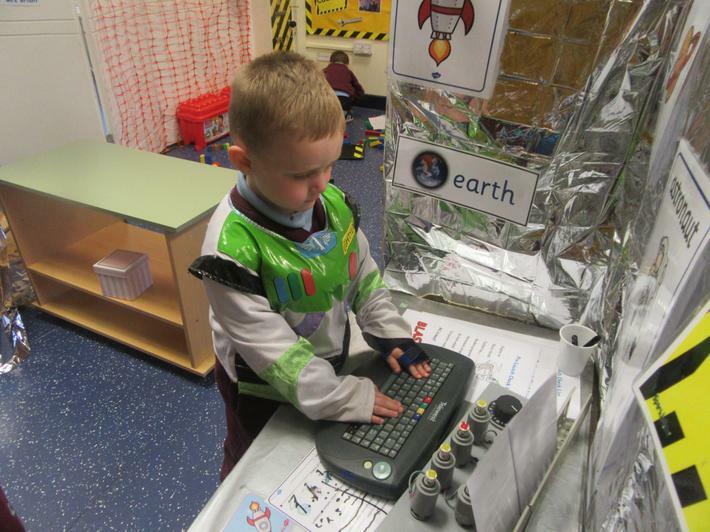 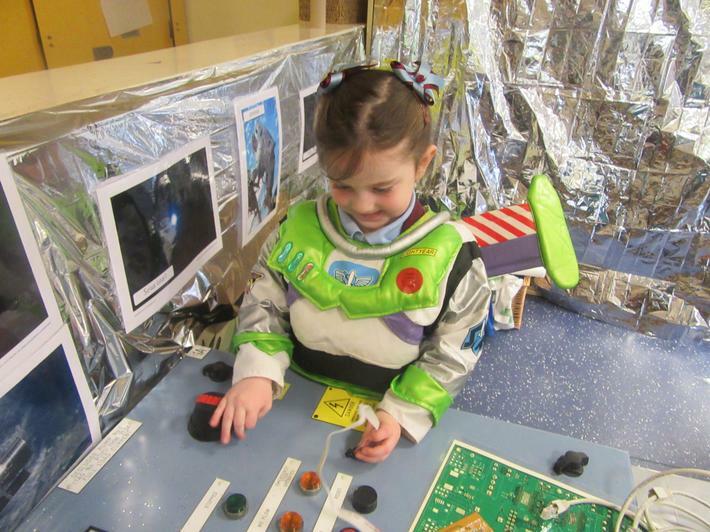 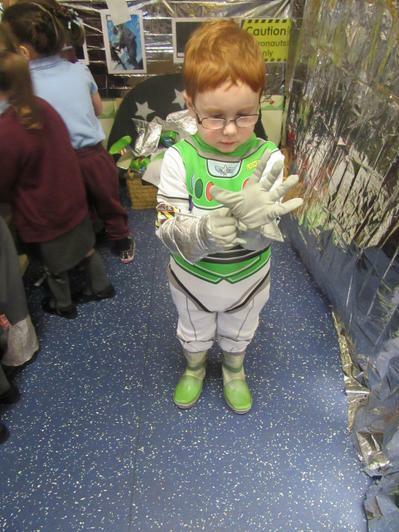 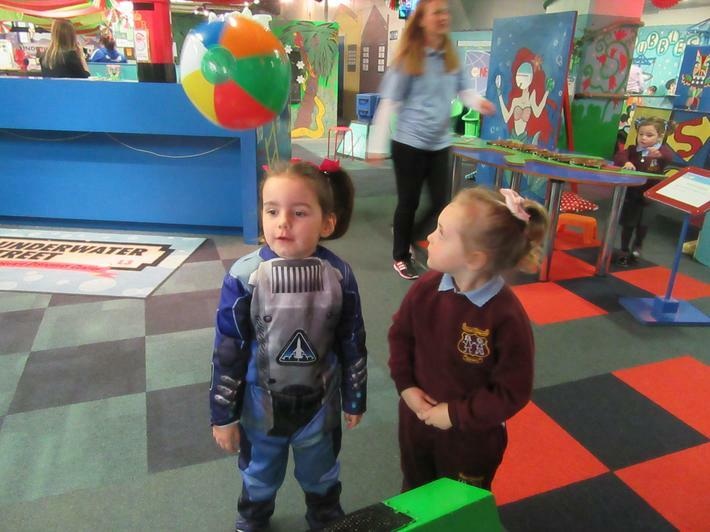 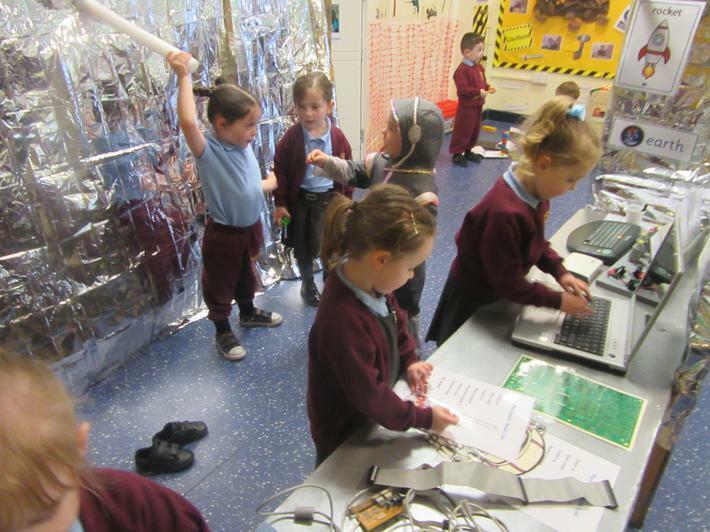 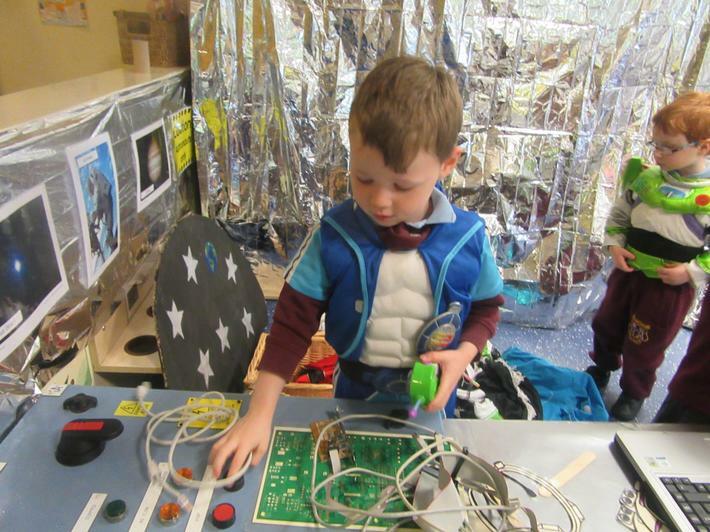 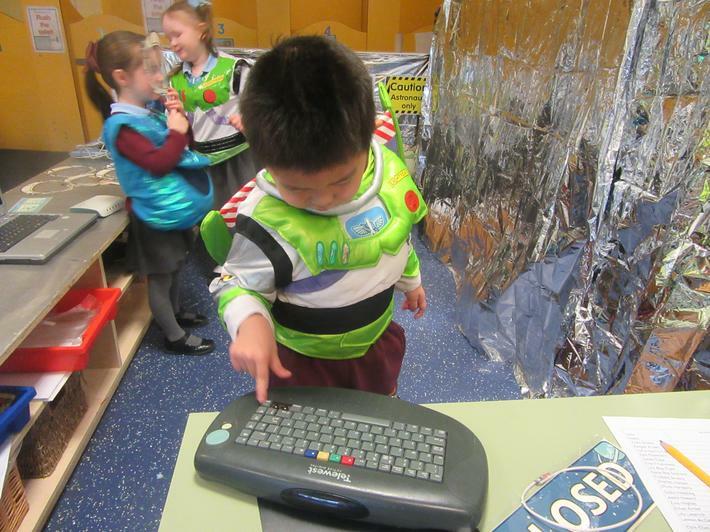 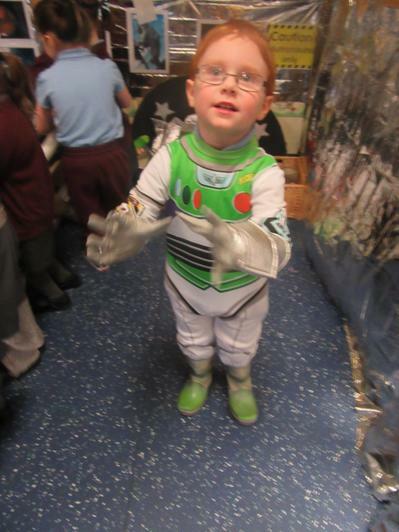 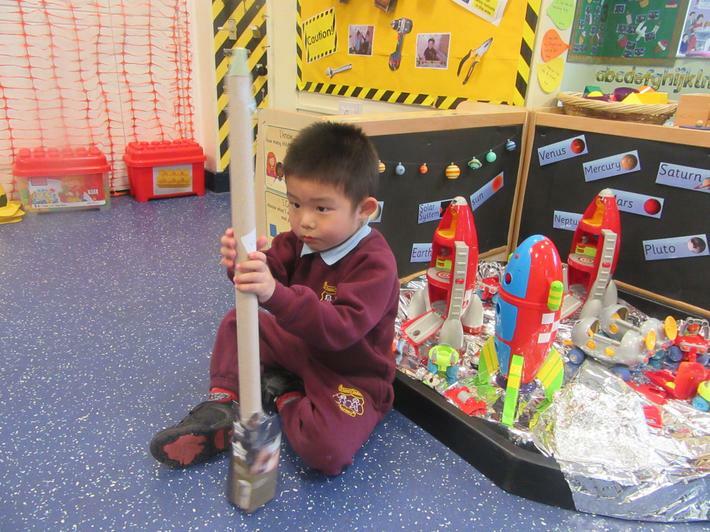 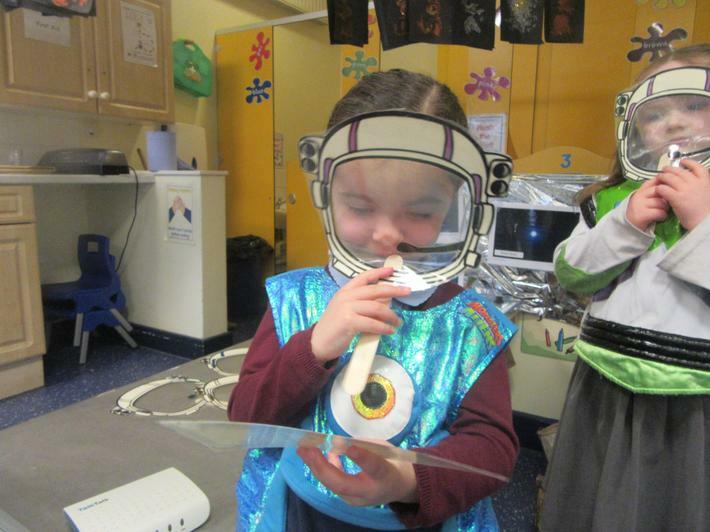 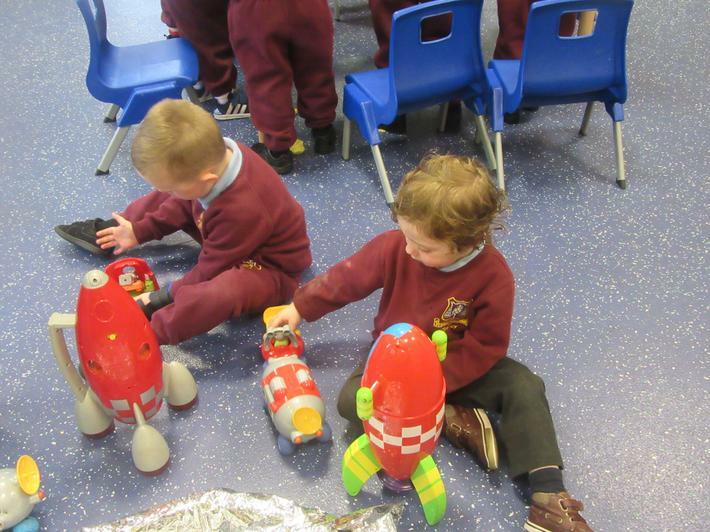 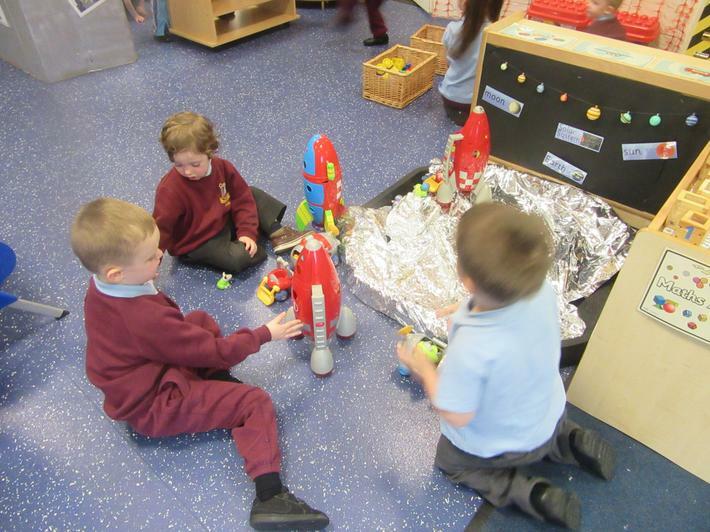 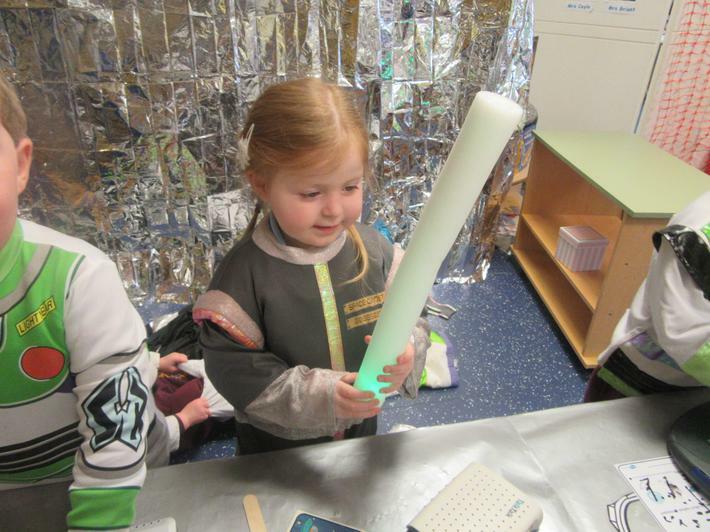 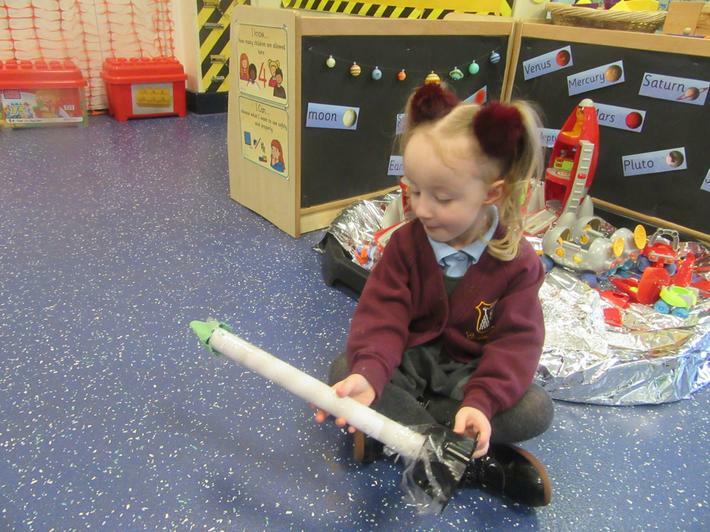 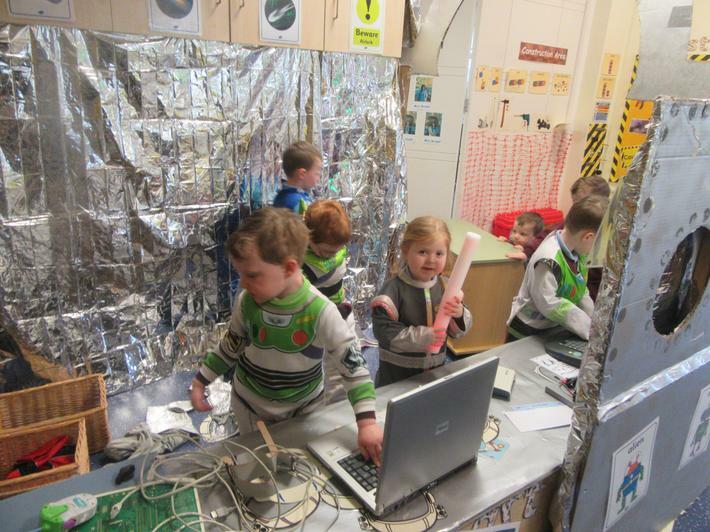 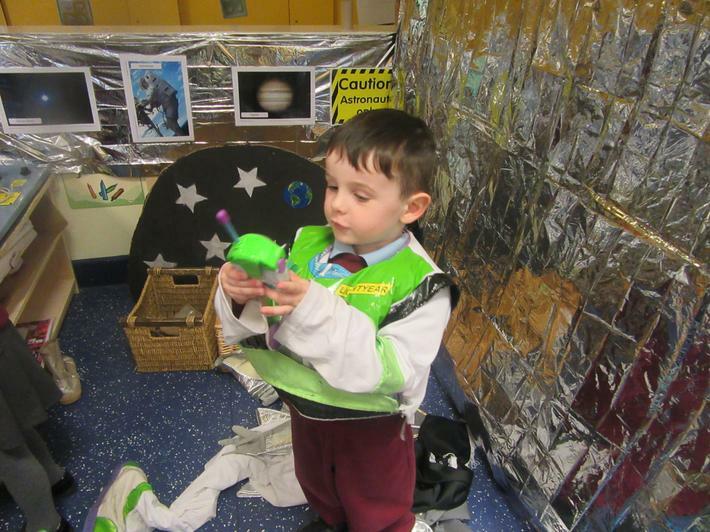 We enjoyed role play, making astronauts, small world, making chocolate moon cakes, writing our names like an alien, using 3D boxes to make robots and rockets......and lots more! 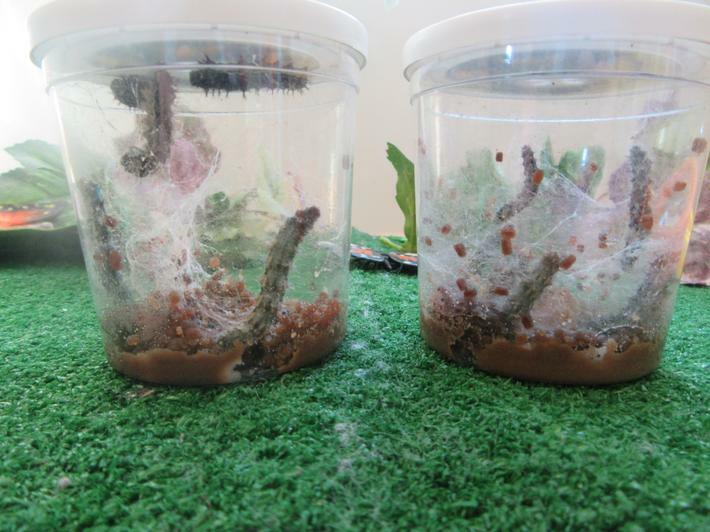 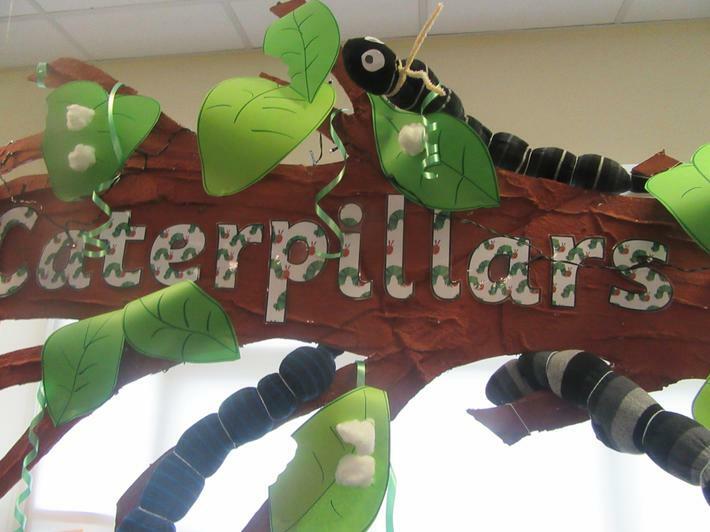 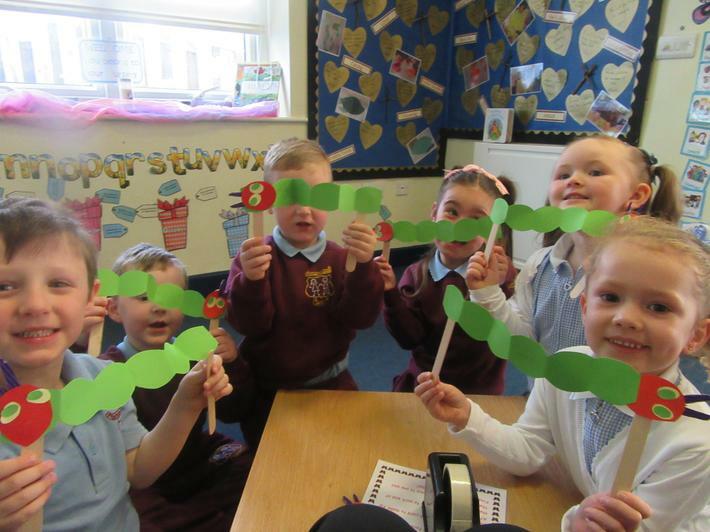 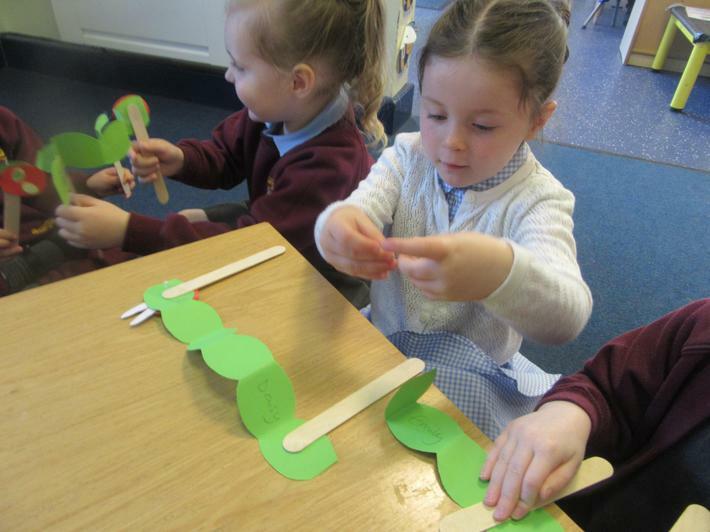 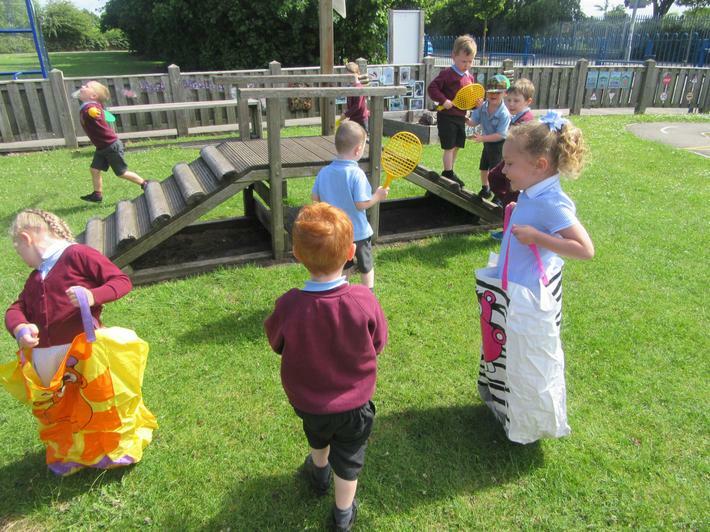 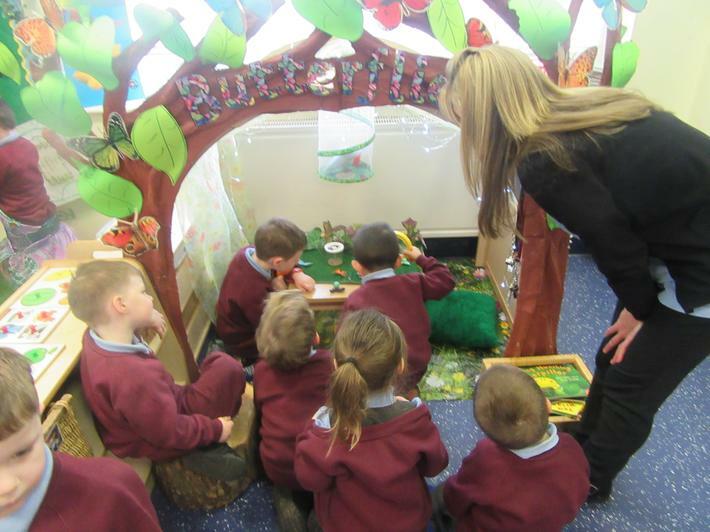 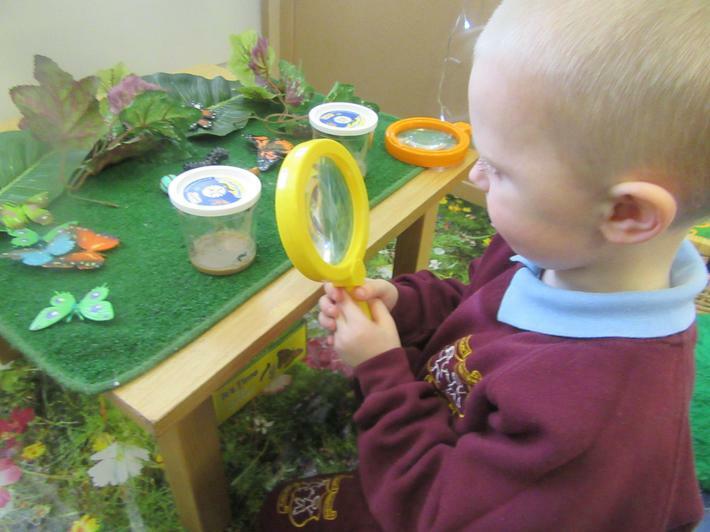 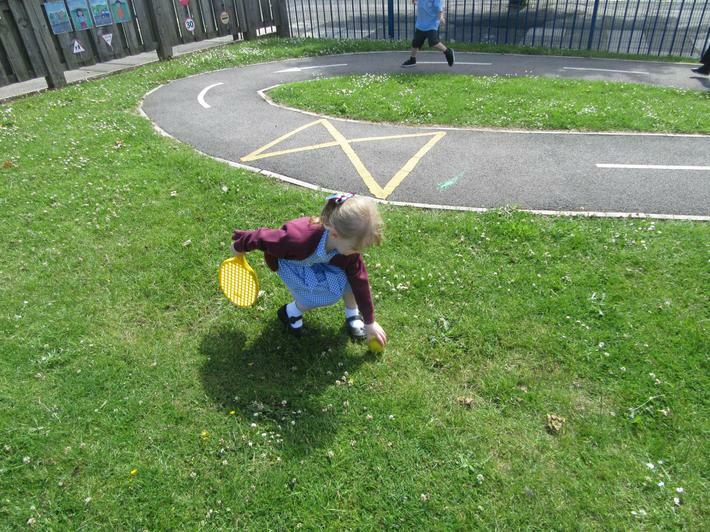 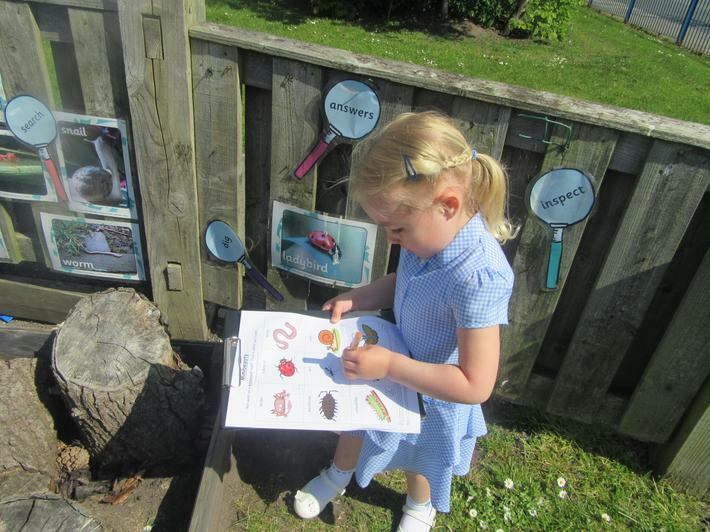 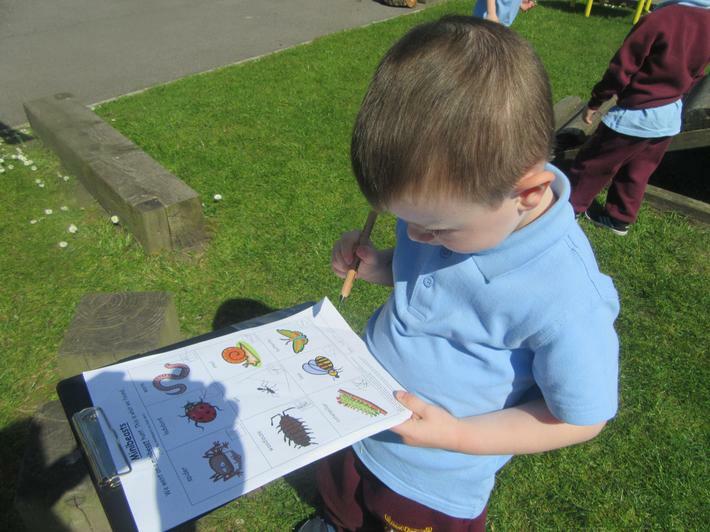 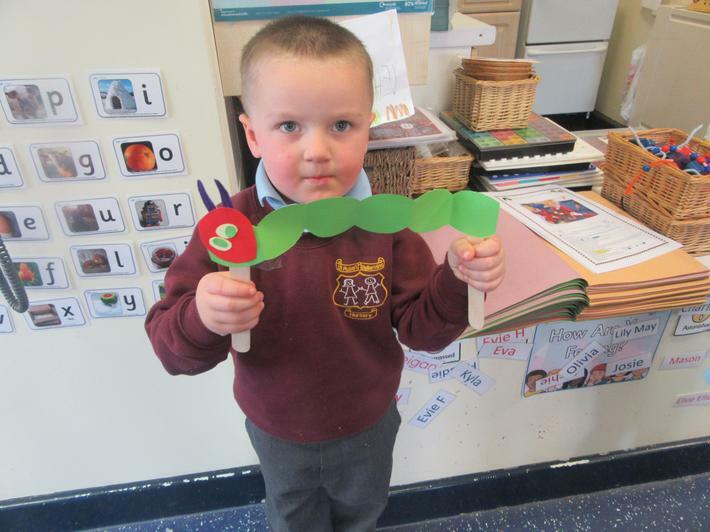 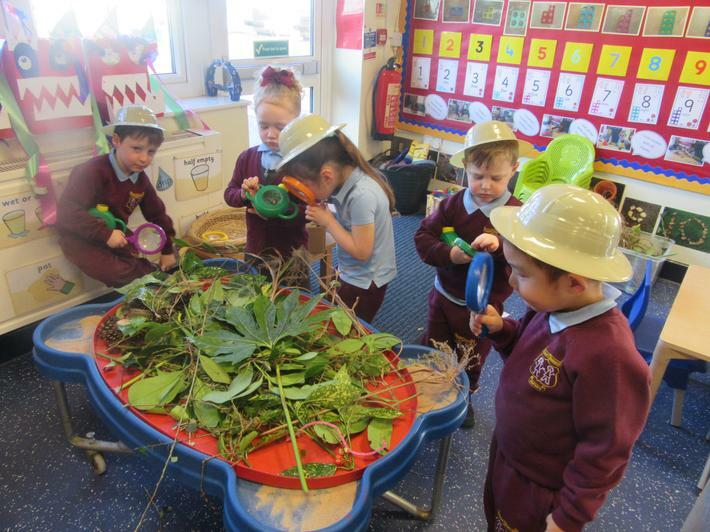 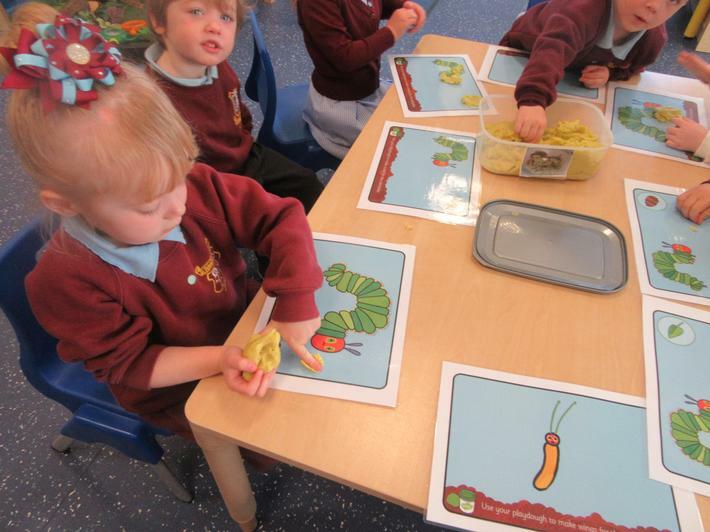 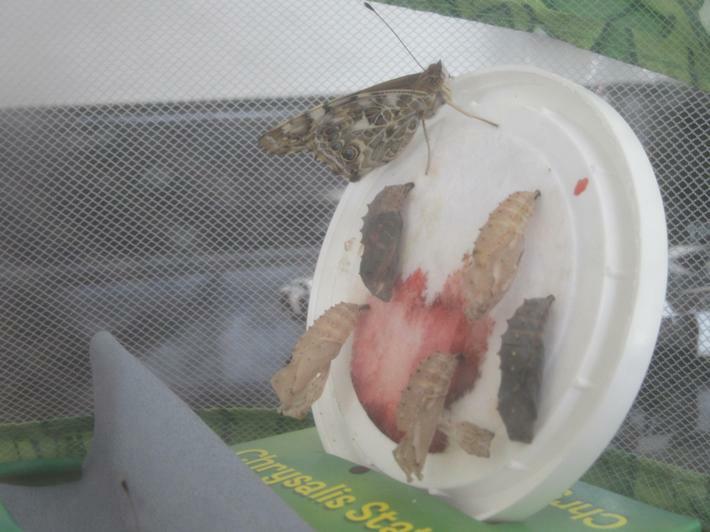 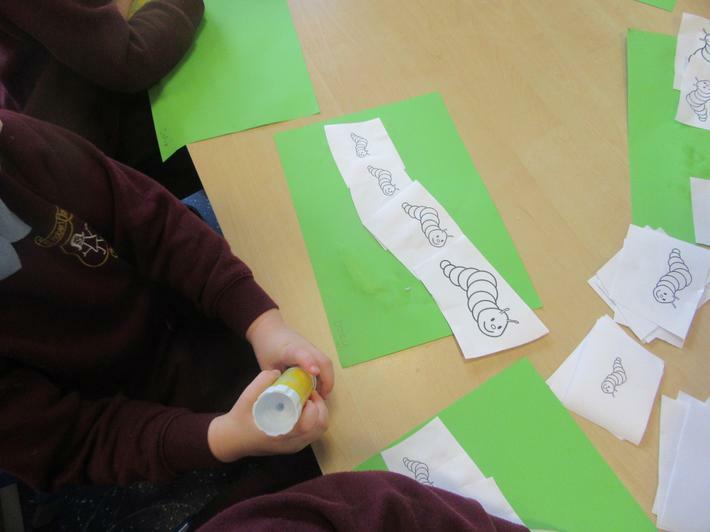 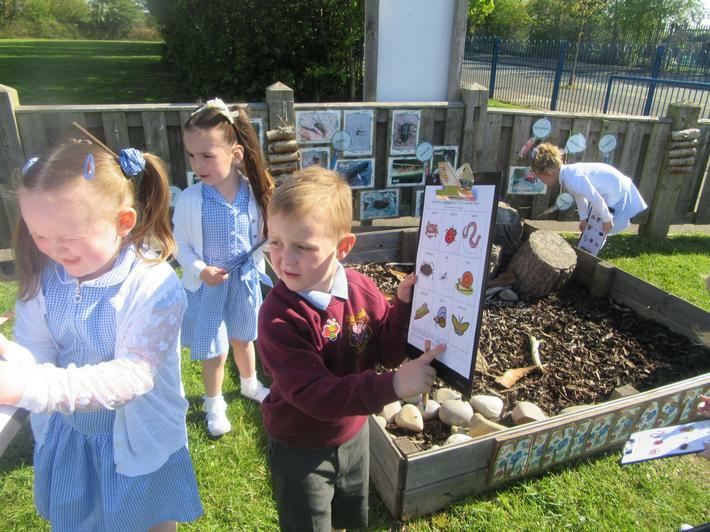 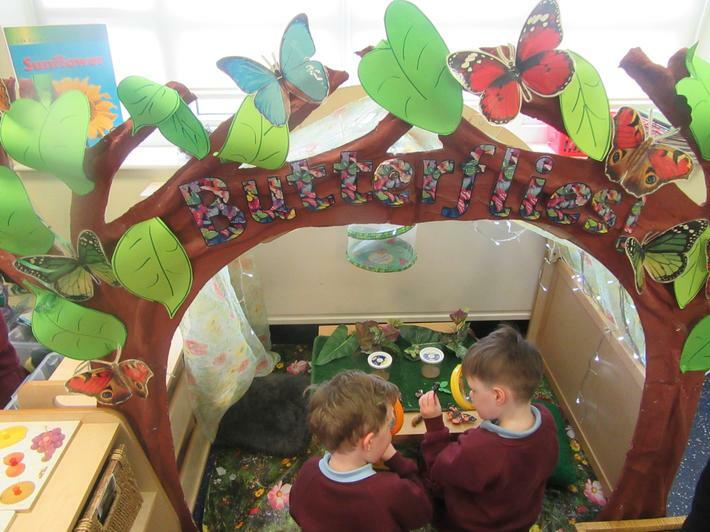 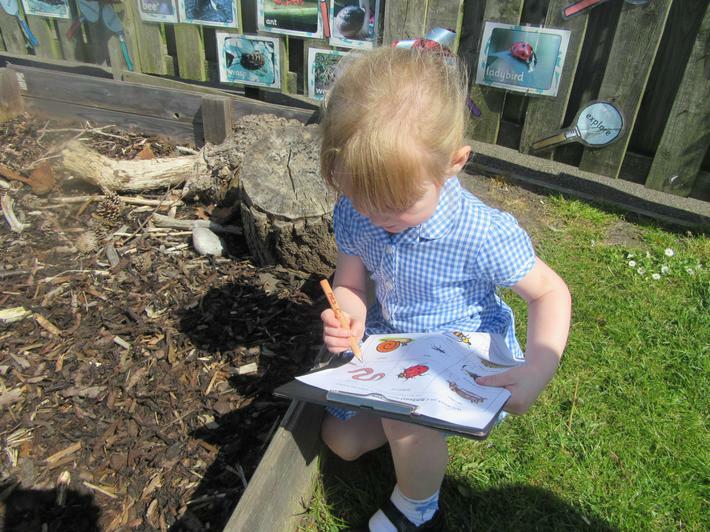 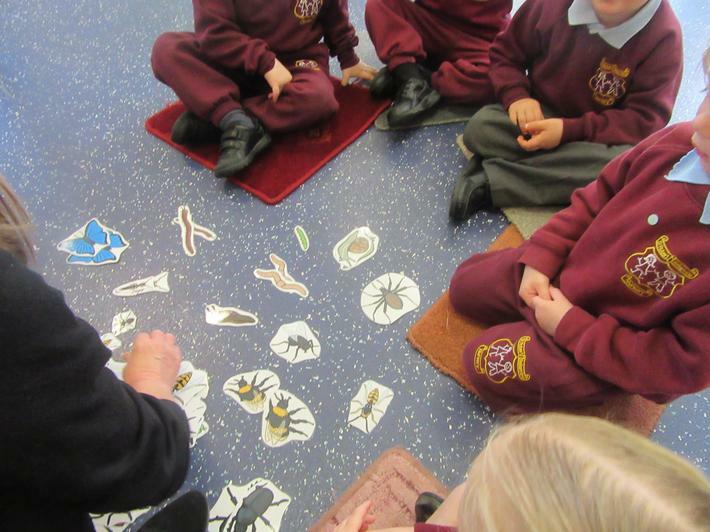 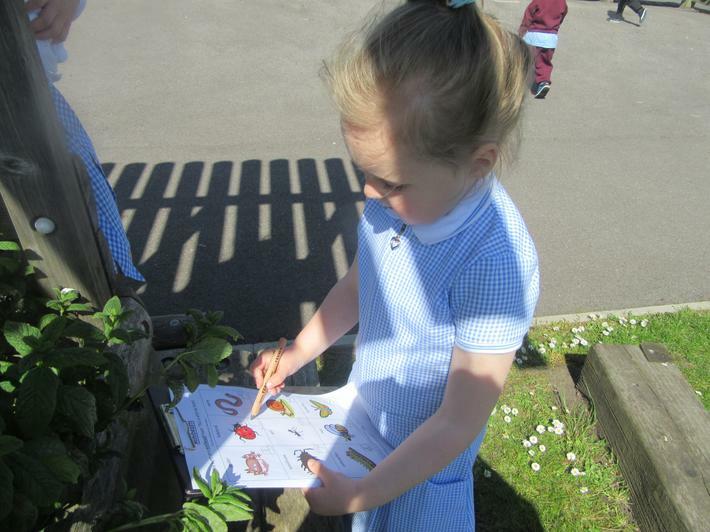 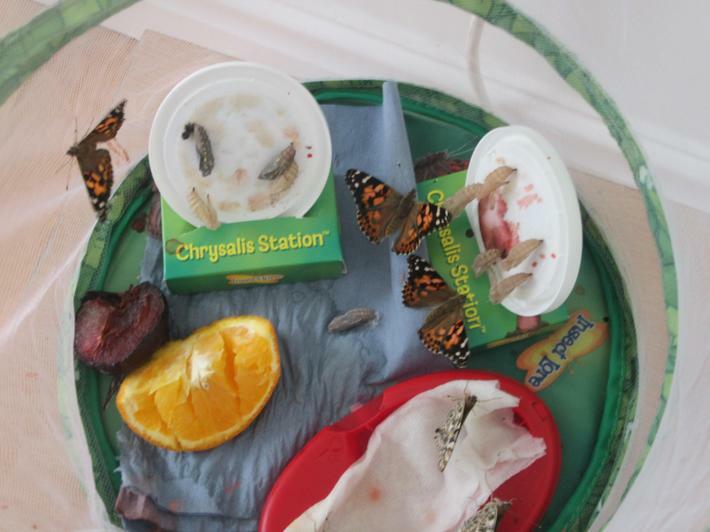 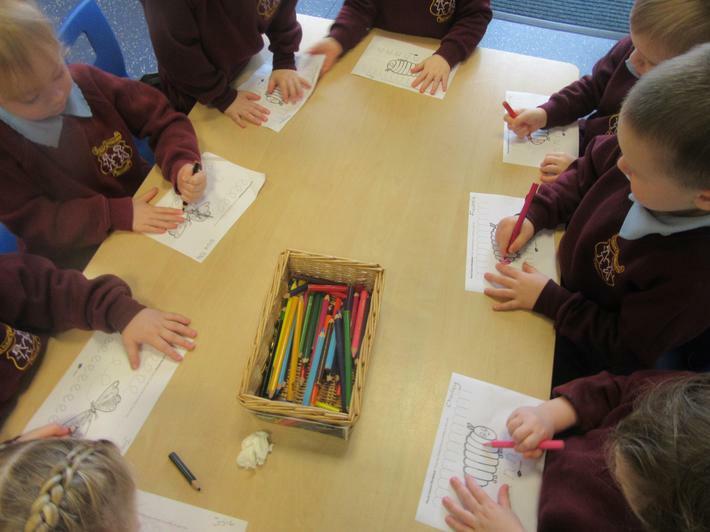 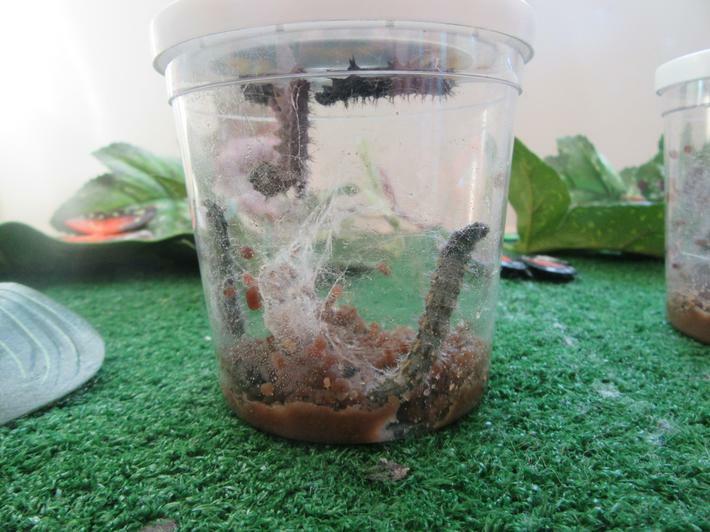 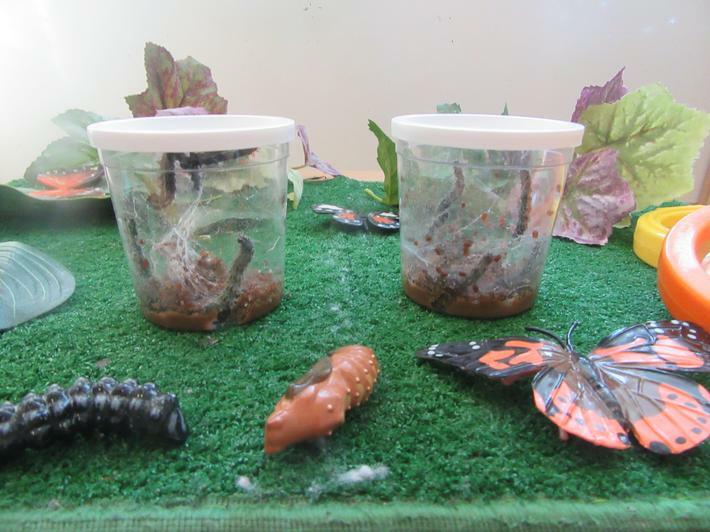 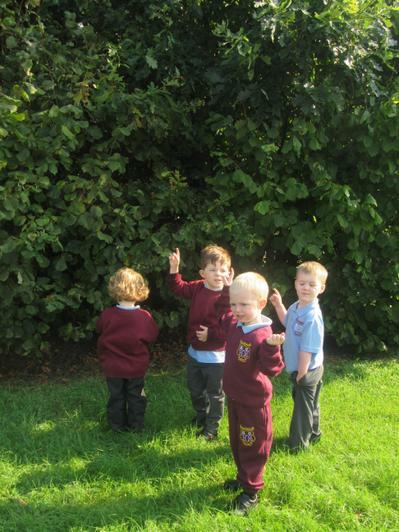 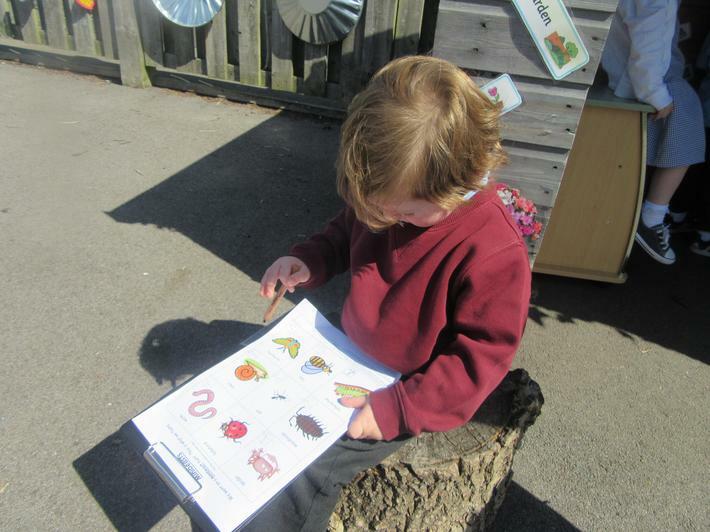 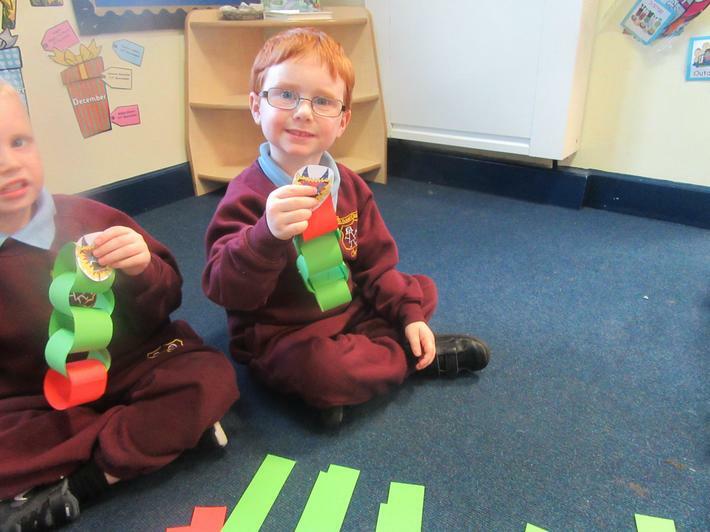 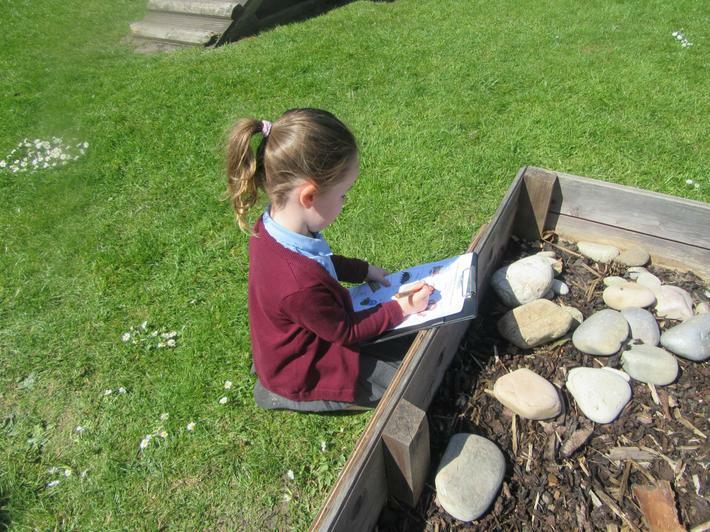 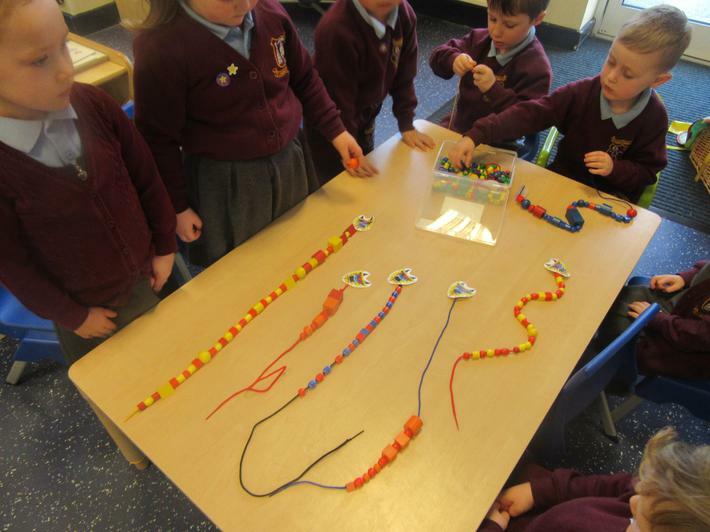 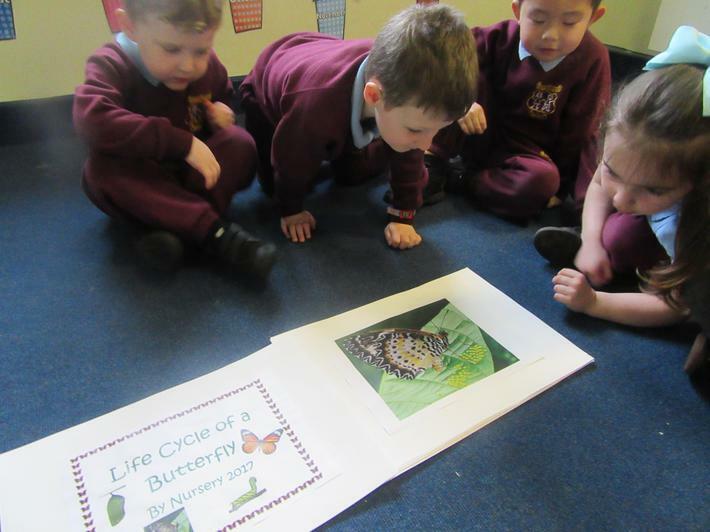 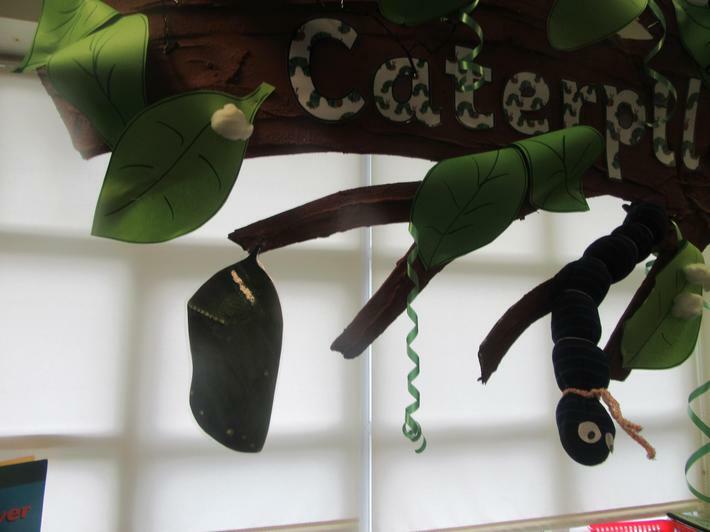 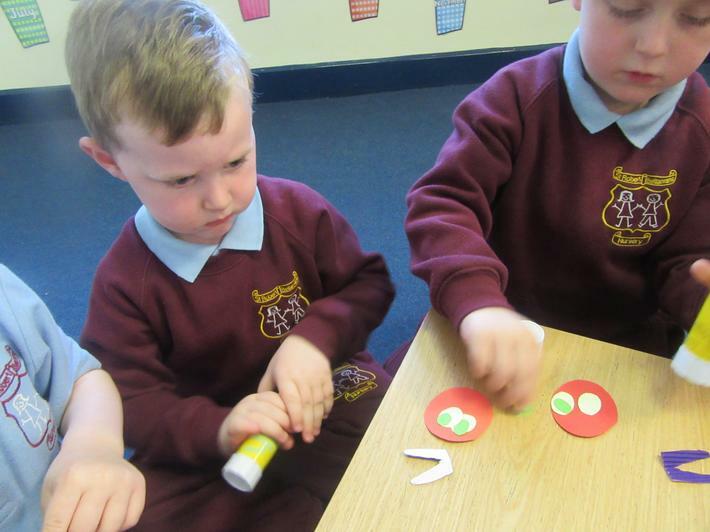 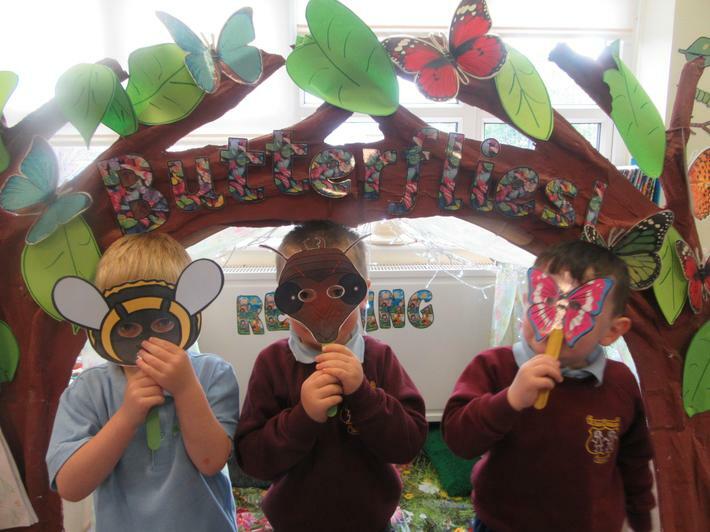 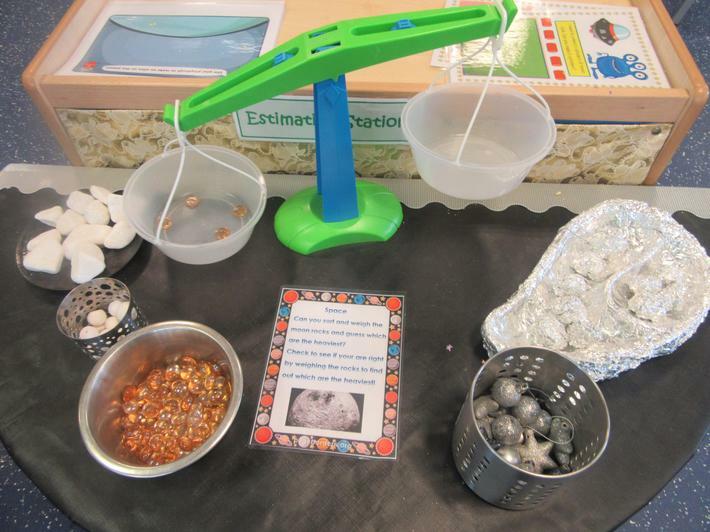 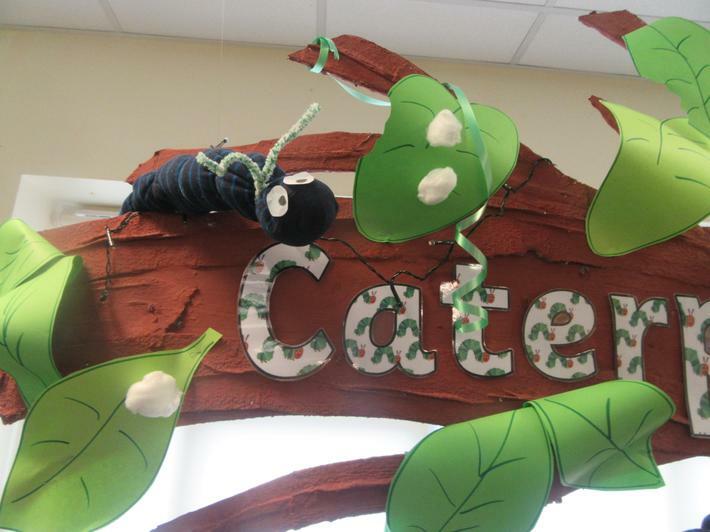 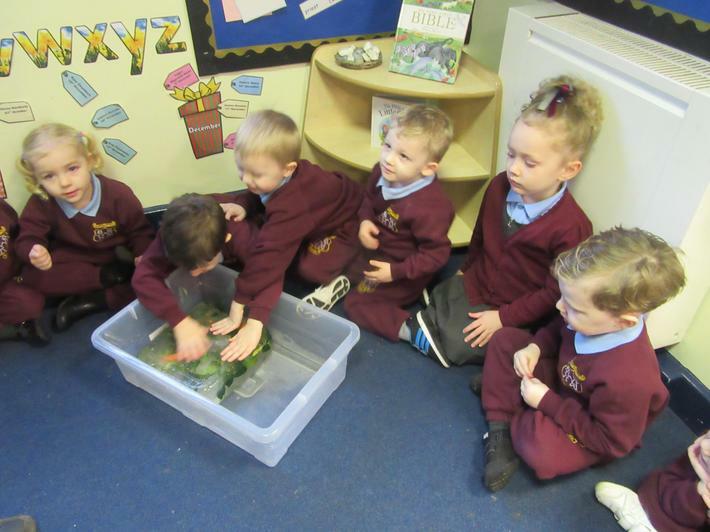 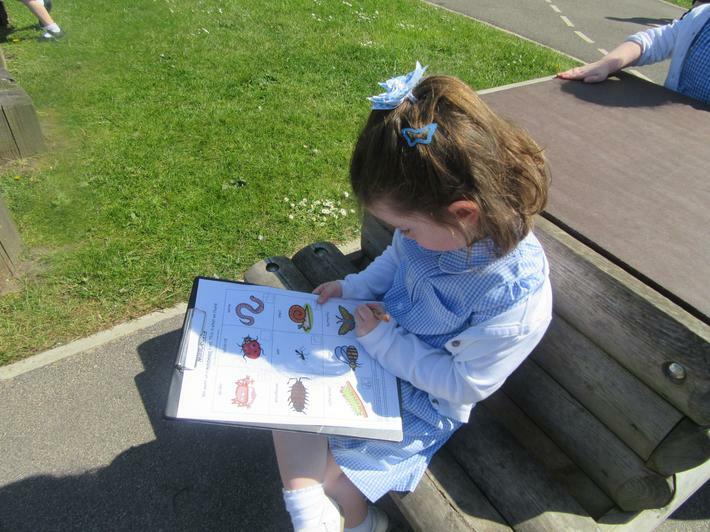 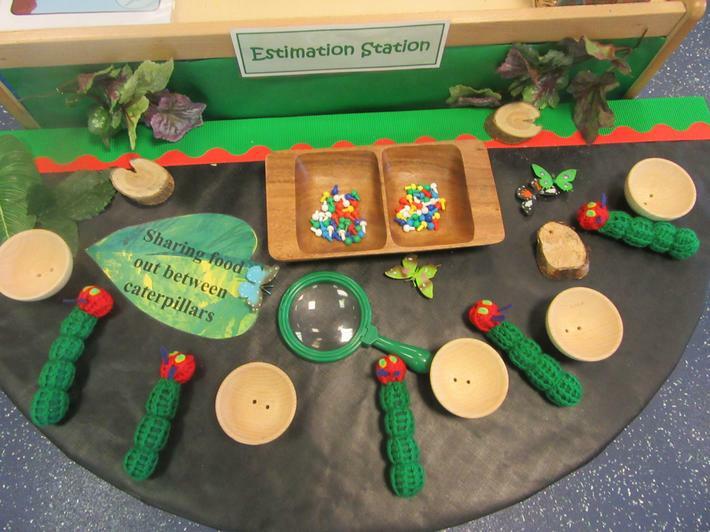 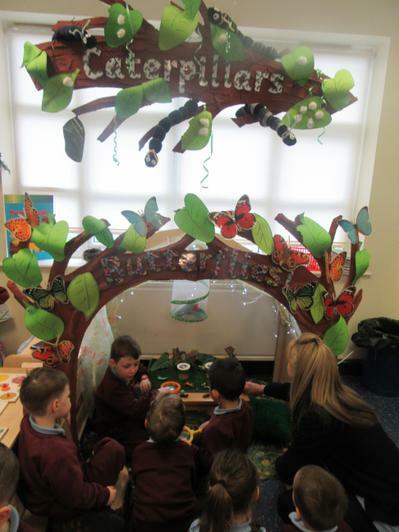 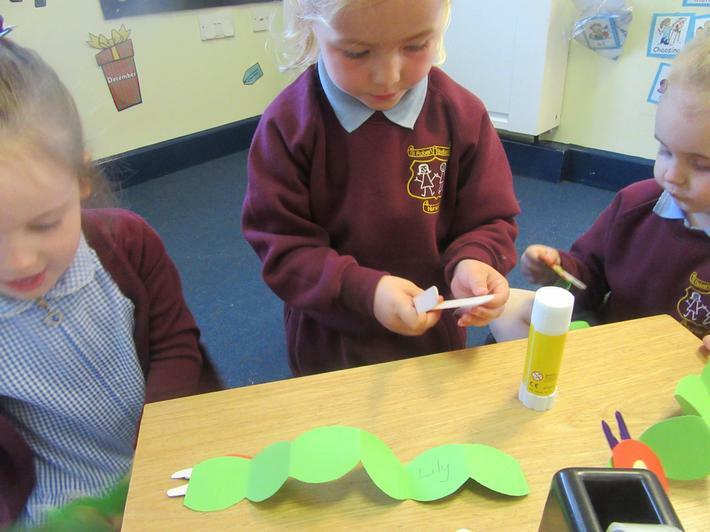 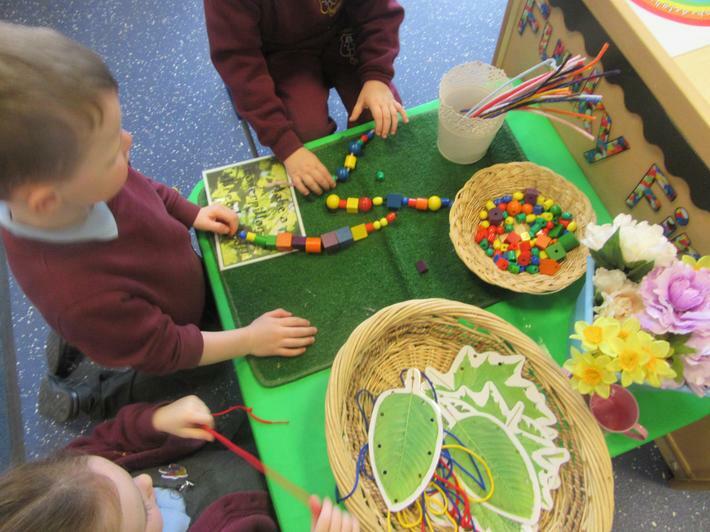 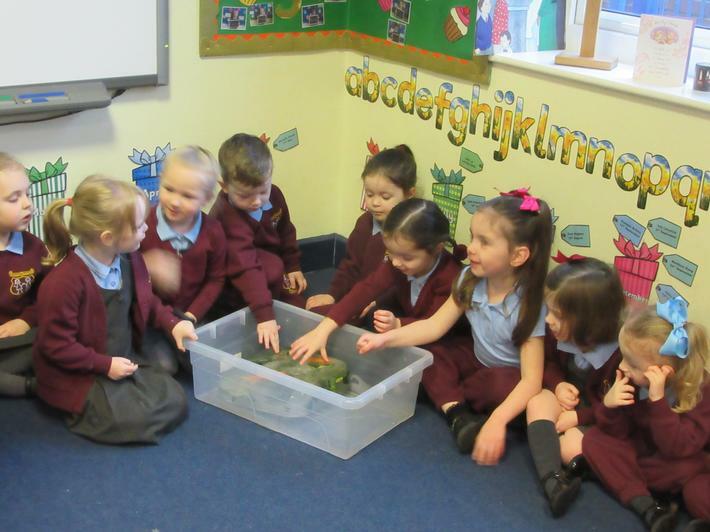 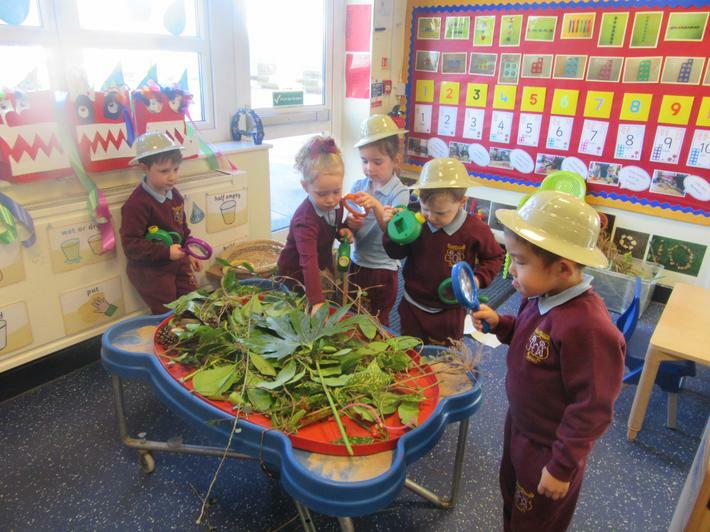 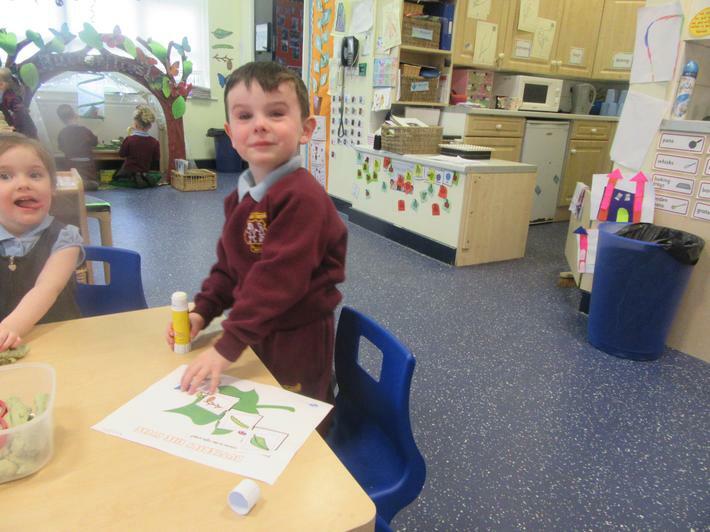 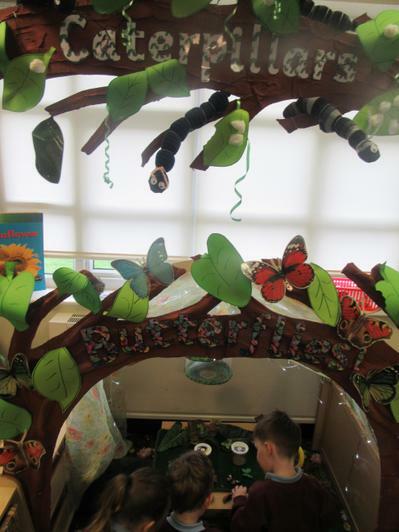 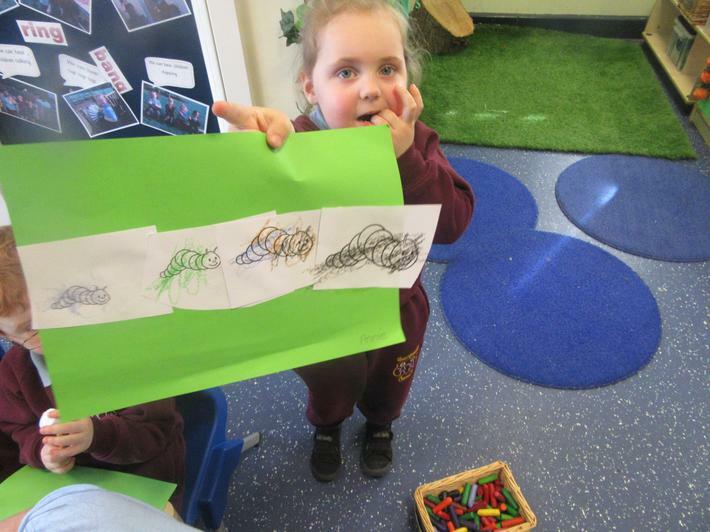 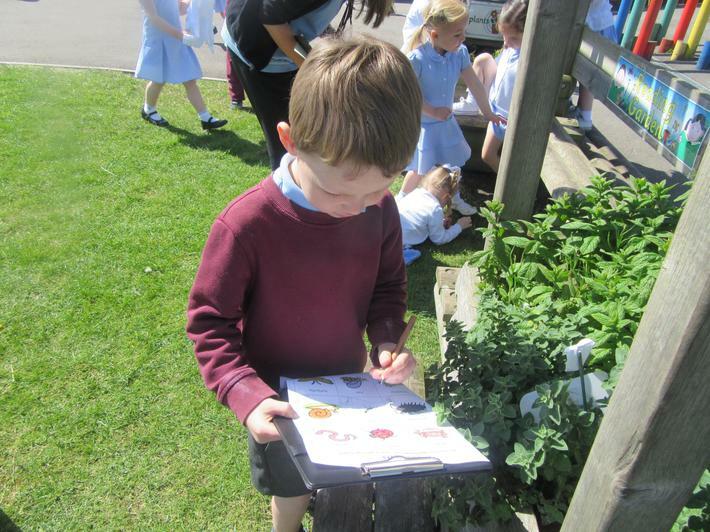 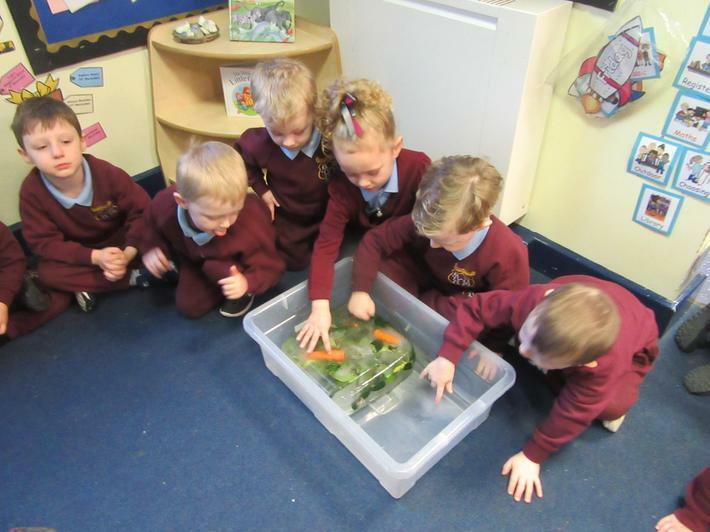 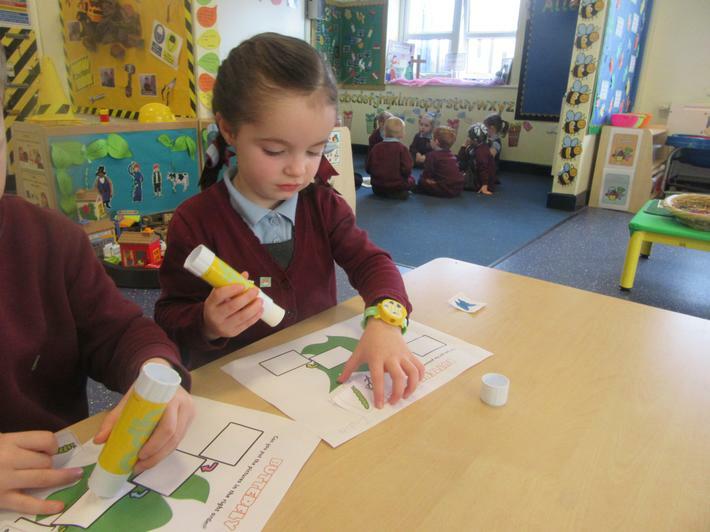 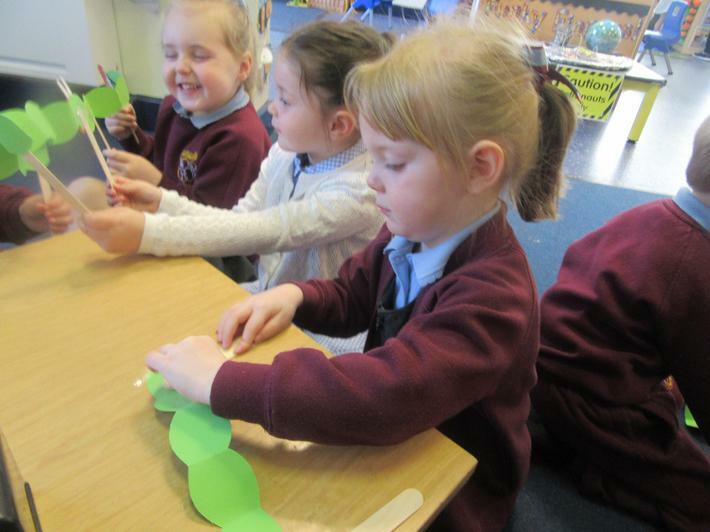 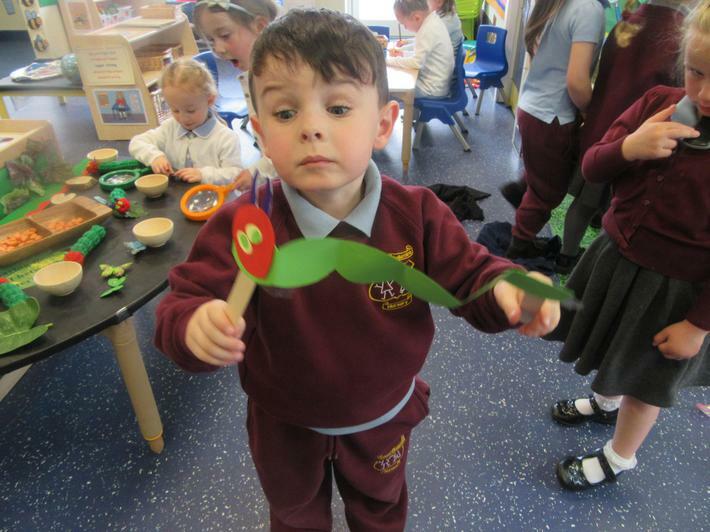 We have been learning about caterpillars and butterflies. 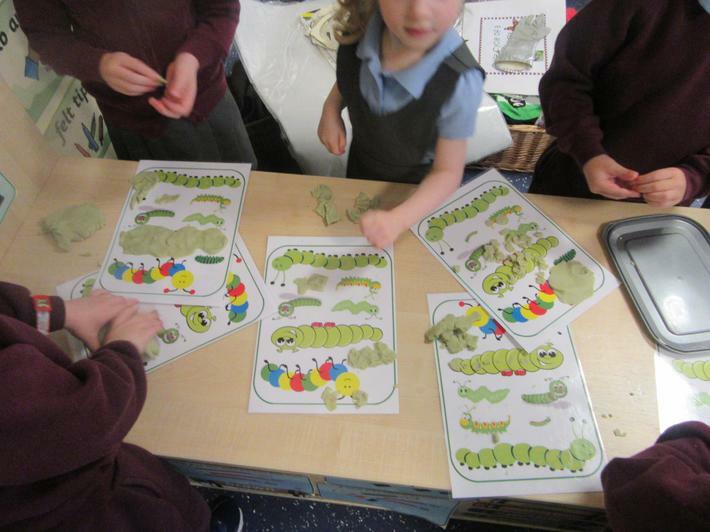 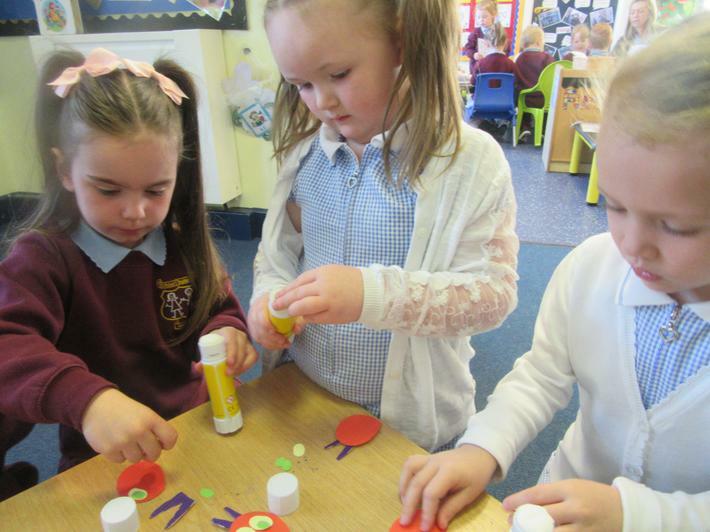 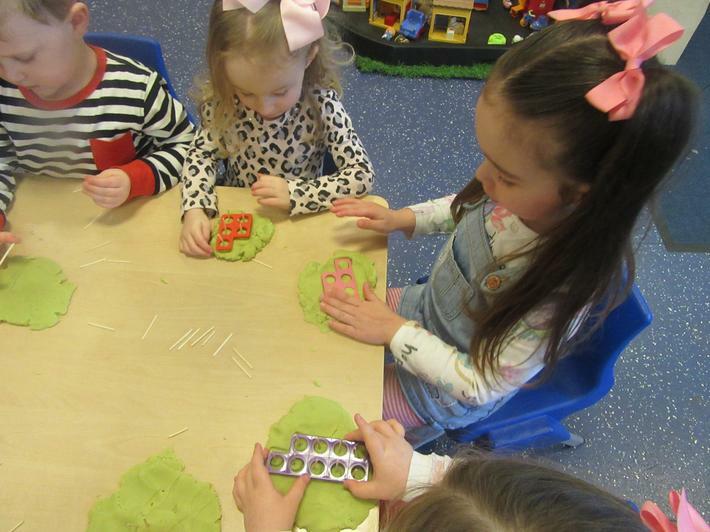 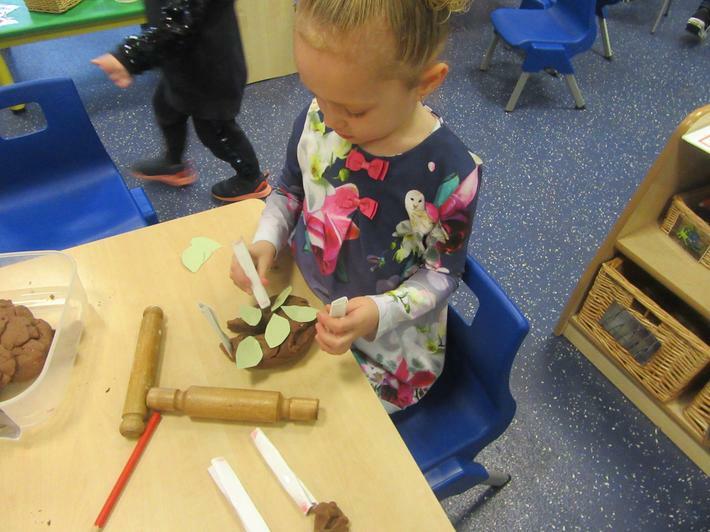 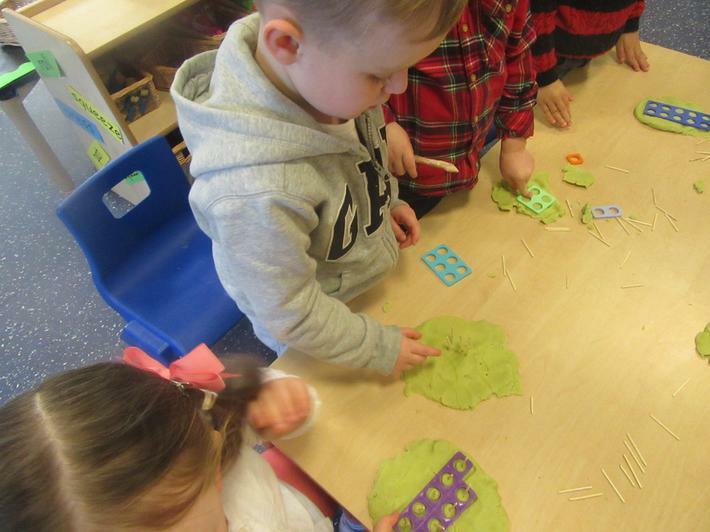 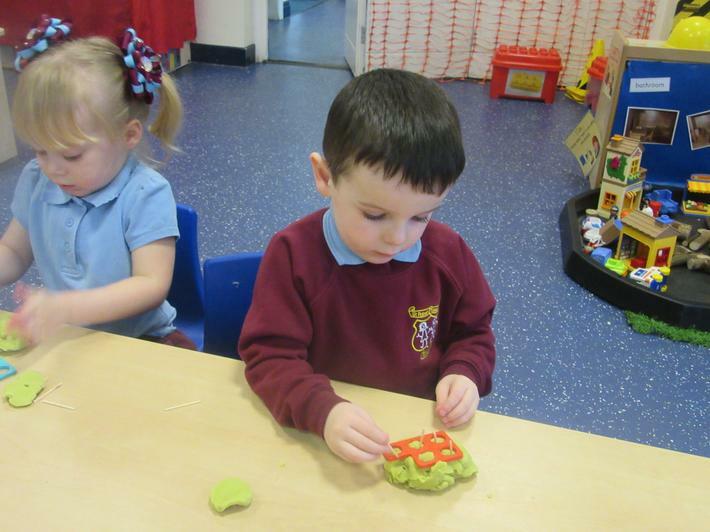 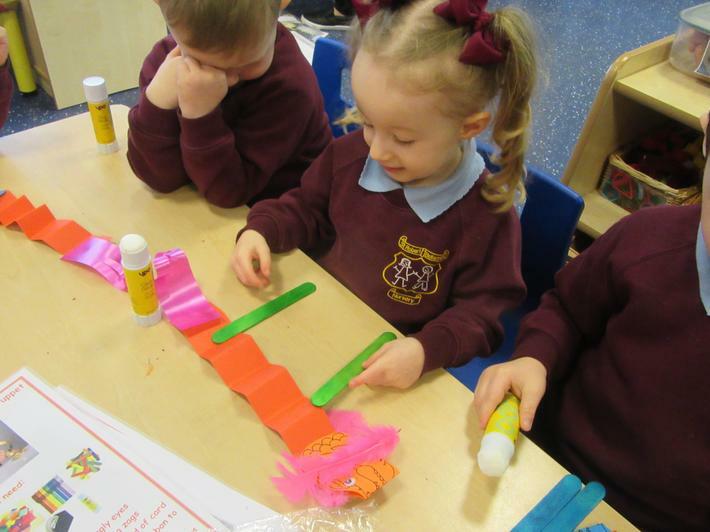 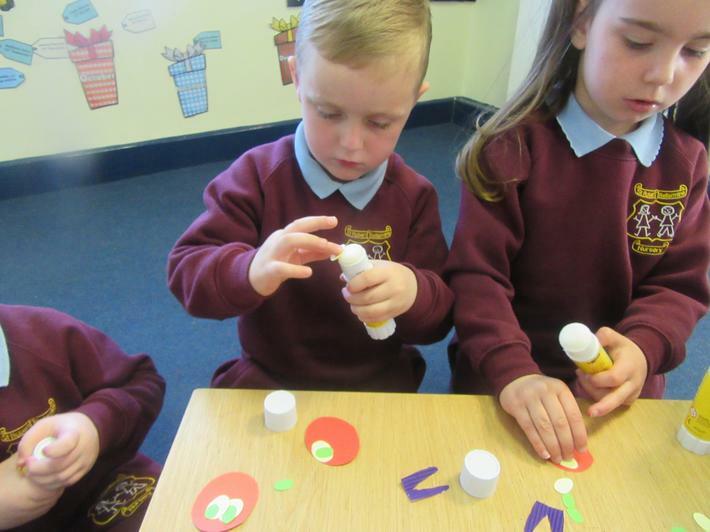 We learnt about the Life Cycle of a Butterfly; painted symmetrical butterflies; continued a caterpillar patter using different colours; put caterpillars in order according to size;made caterpillars of different lengths using play dough; and made a Life Cycle Book. 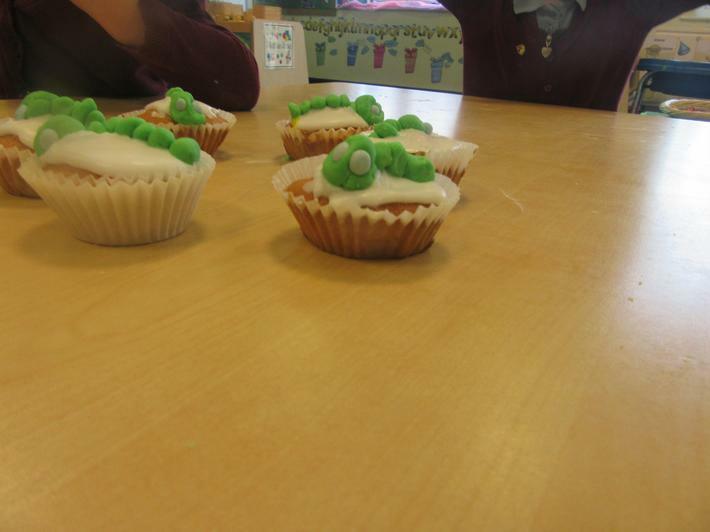 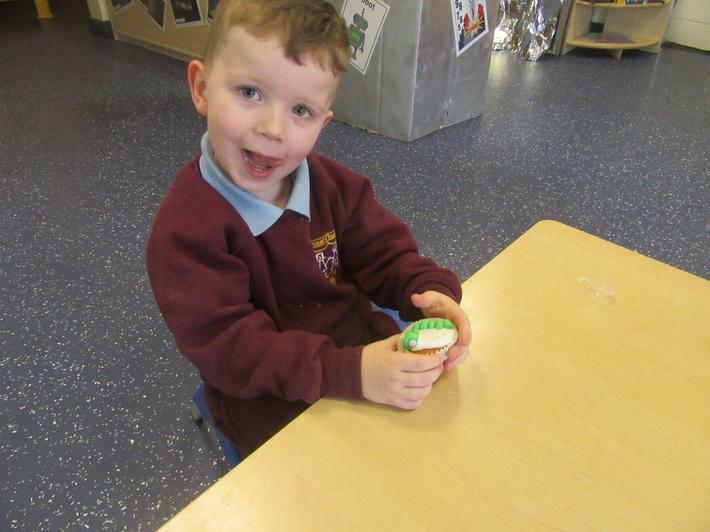 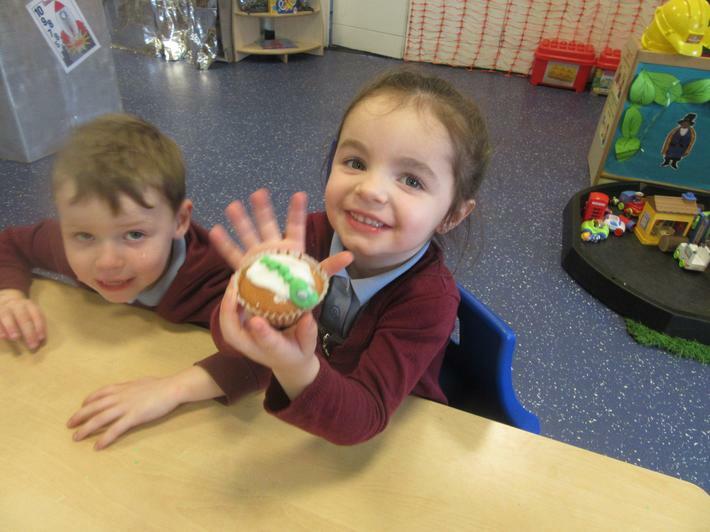 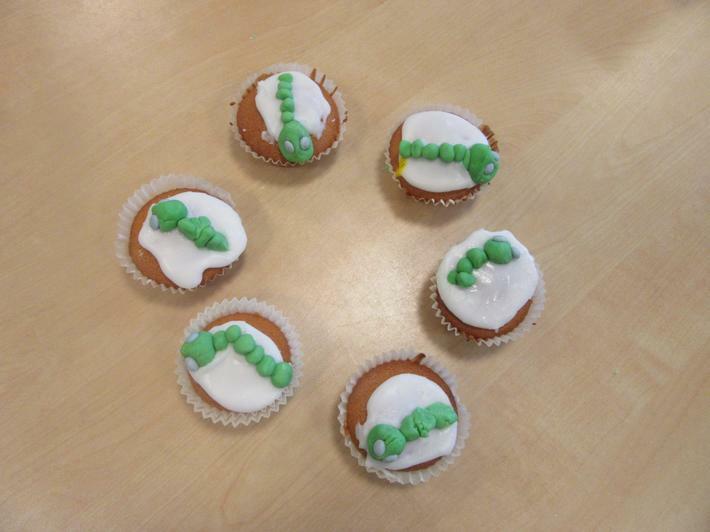 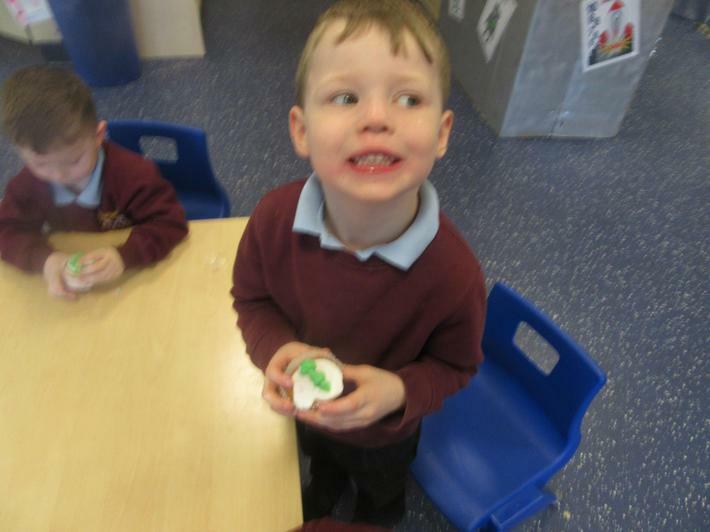 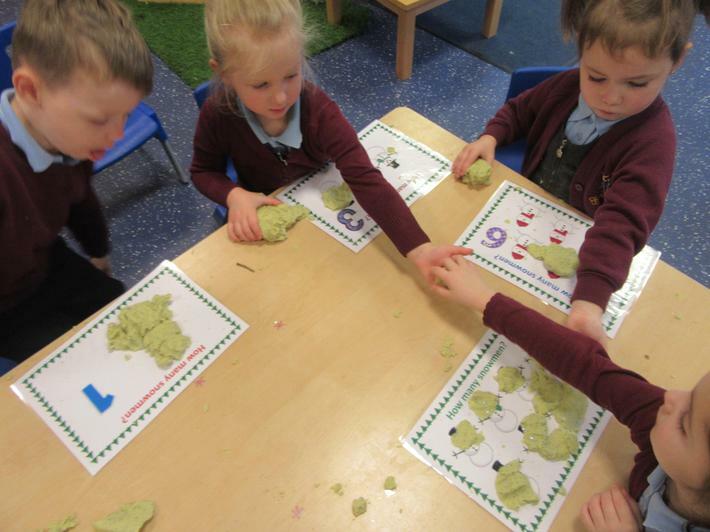 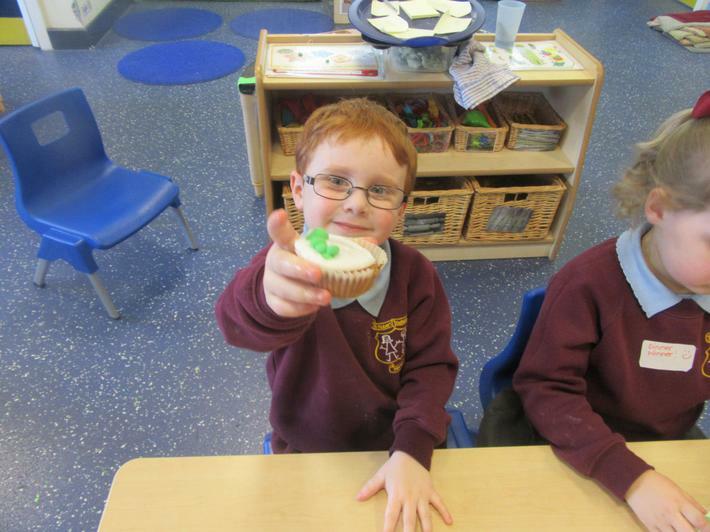 In Wrap Around Care we made caterpillar cup cakes. 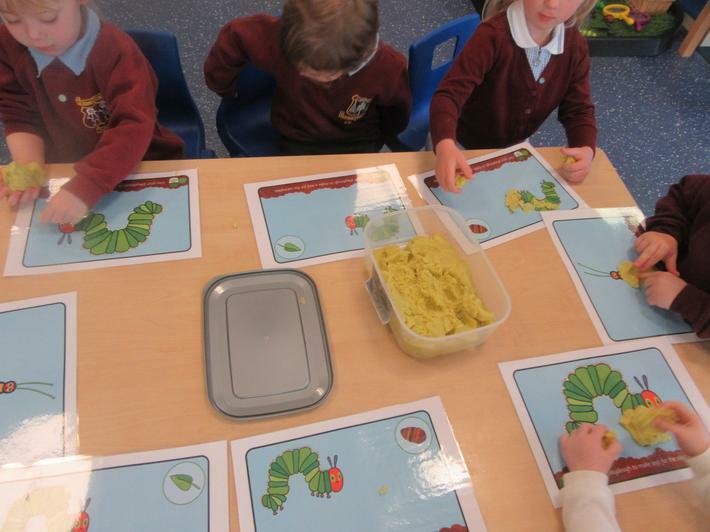 We have been watching the caterpillars grow - they were tiny to begin with but are now big and fat, it won't be long until they spin their cocoons! 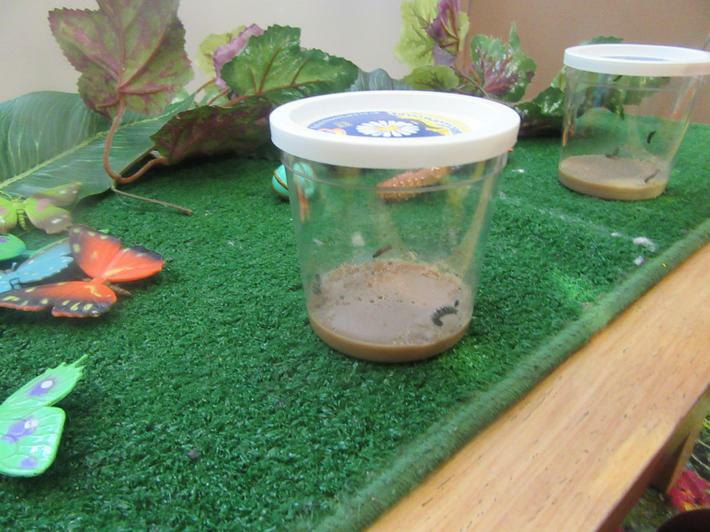 We can't wait until they turn in to butterflies and we can let them go to find their own leaves to lay eggs on. 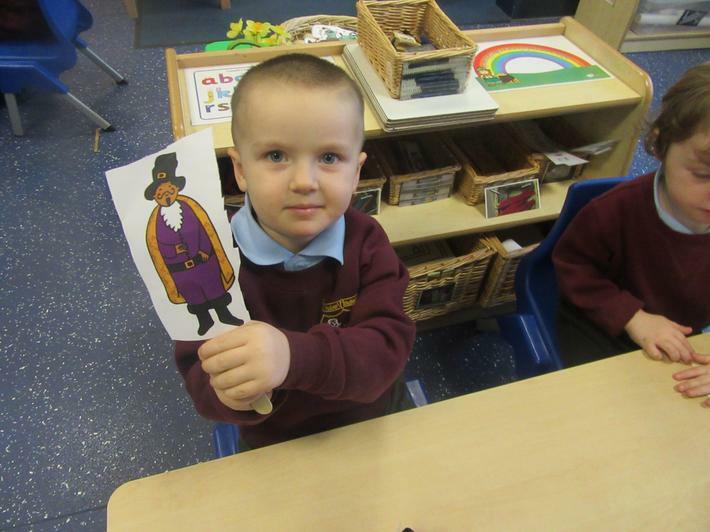 We really have enjoyed the story of Jack and the Beanstalk, we listened to , and watched, lots of different versions... we even wrote our own Jack and the Beanstalk story! 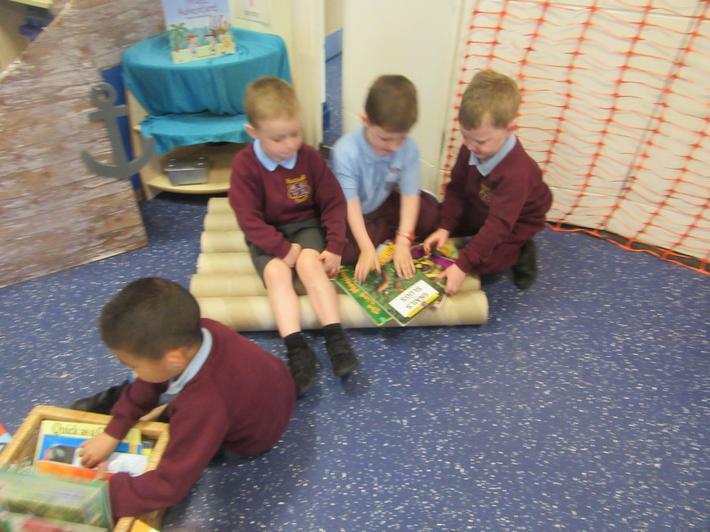 We took part in lots of different activities during our topic; we built castles; measured objects using Jack's and the Giant's footprints; ordered beanstalks according to size; continued the pattern using beans; sequenced the story; painted characters and things from the story for display; listened to each other making silly voices whilst our eyes were covered (to see if we could guess who);and lots more! 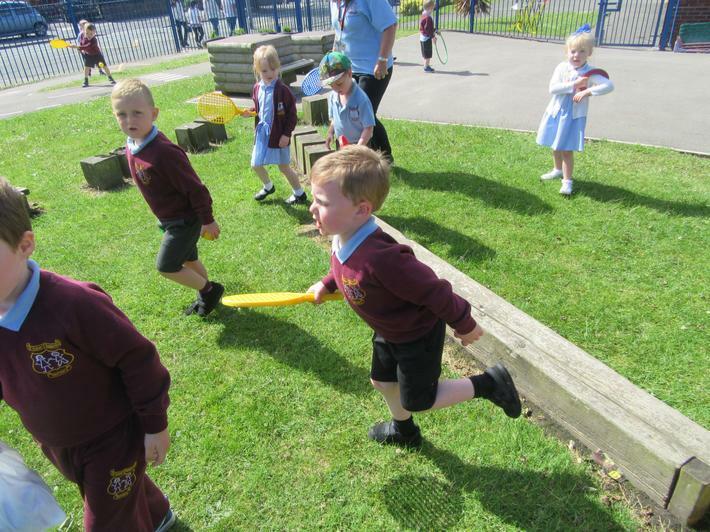 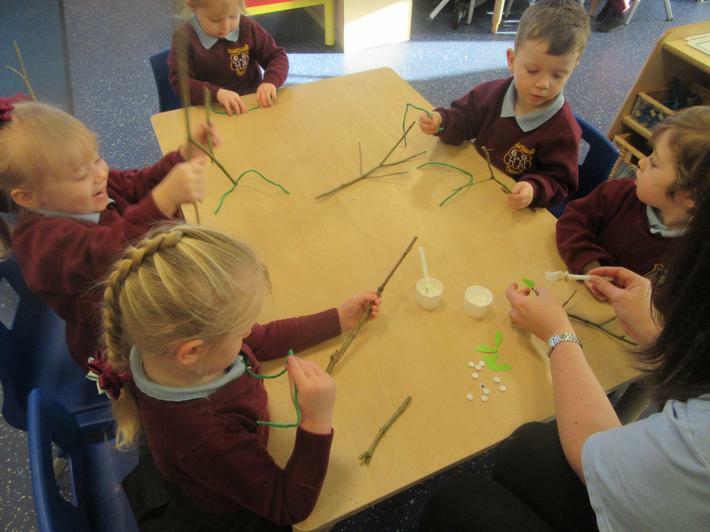 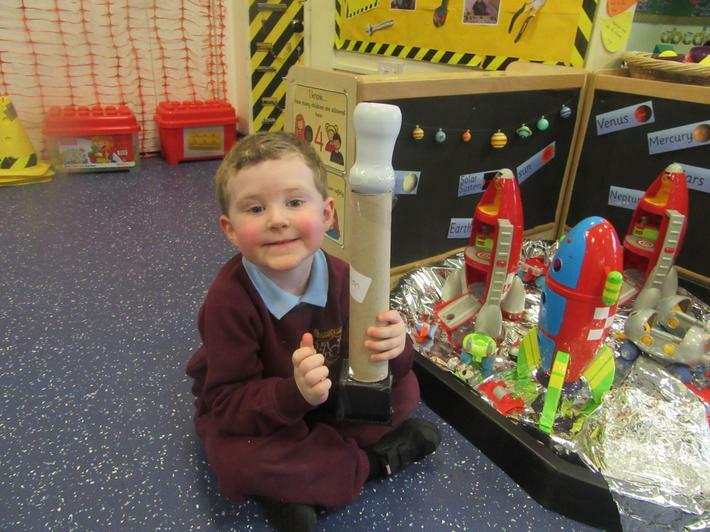 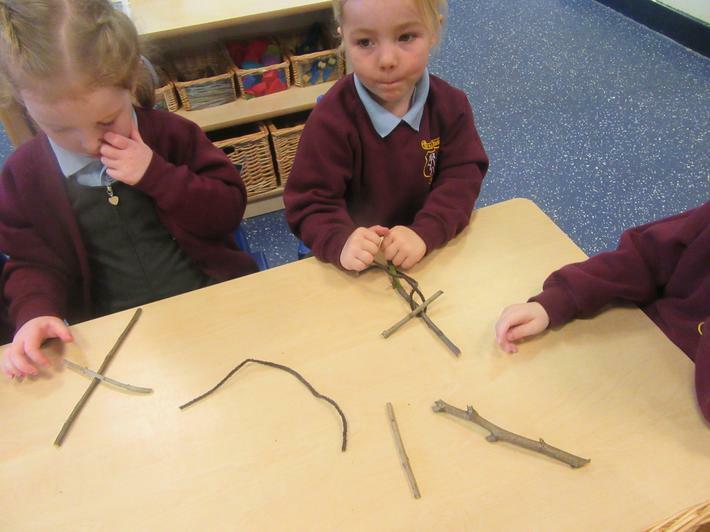 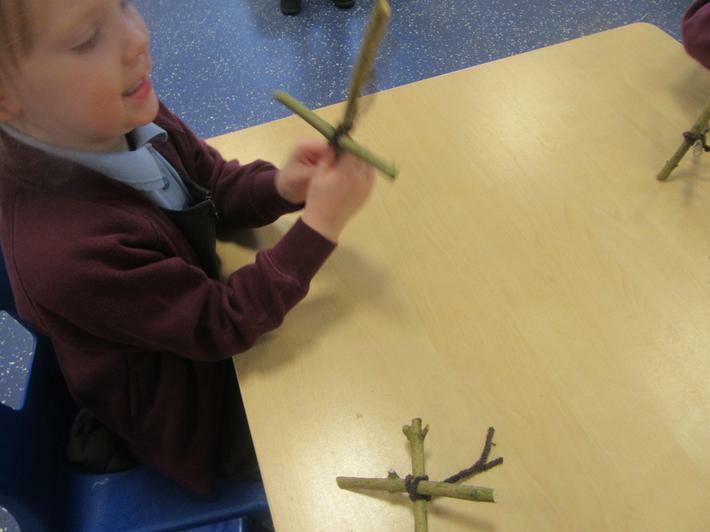 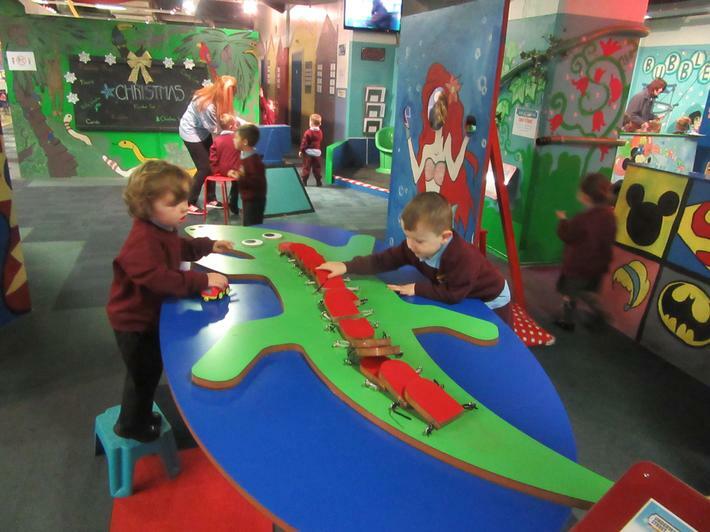 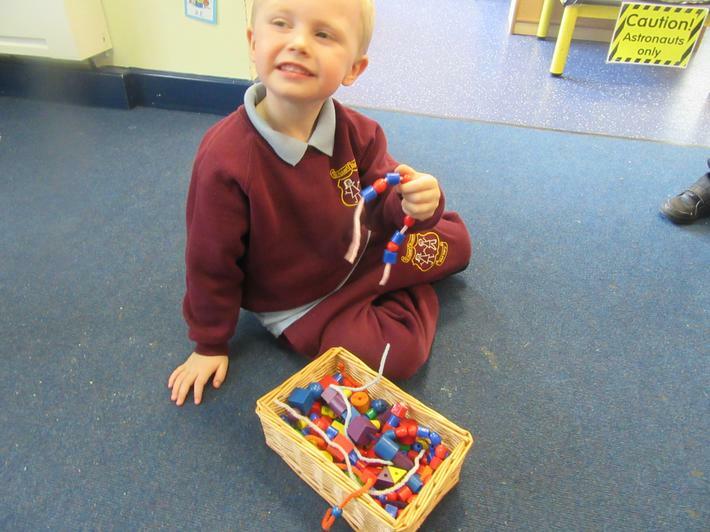 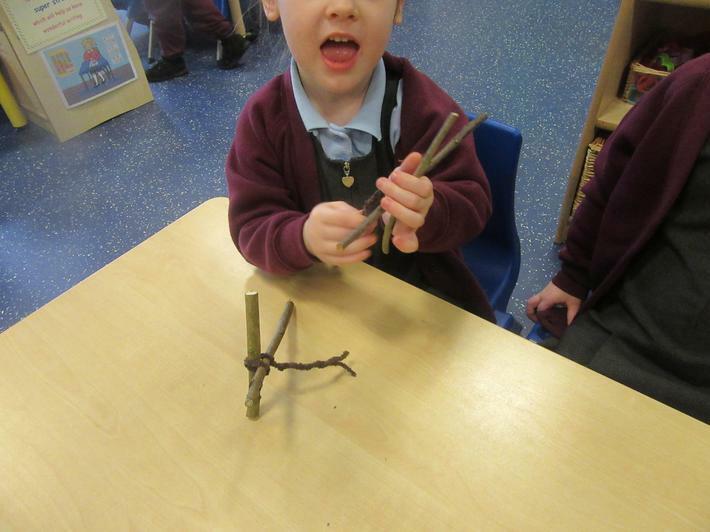 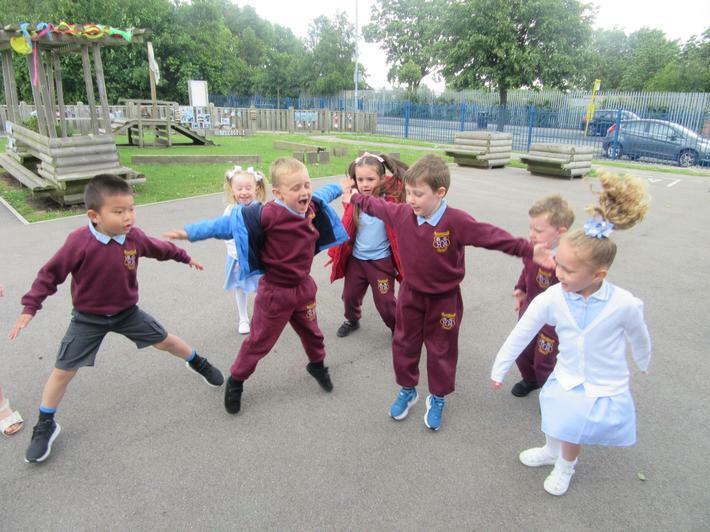 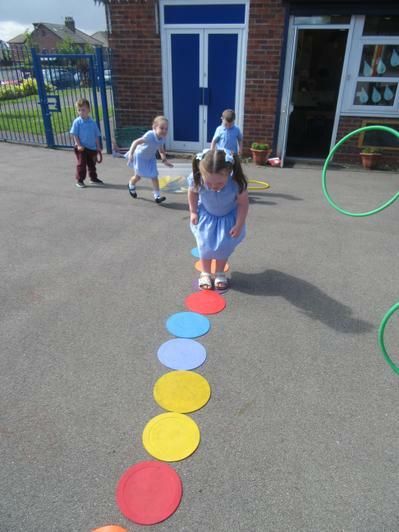 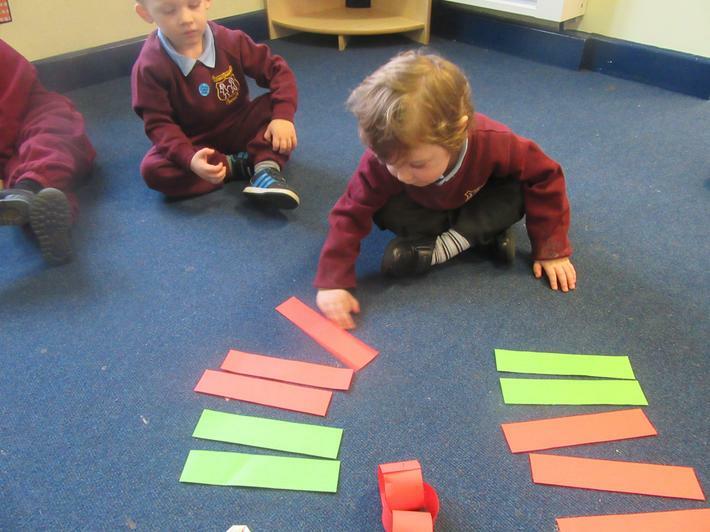 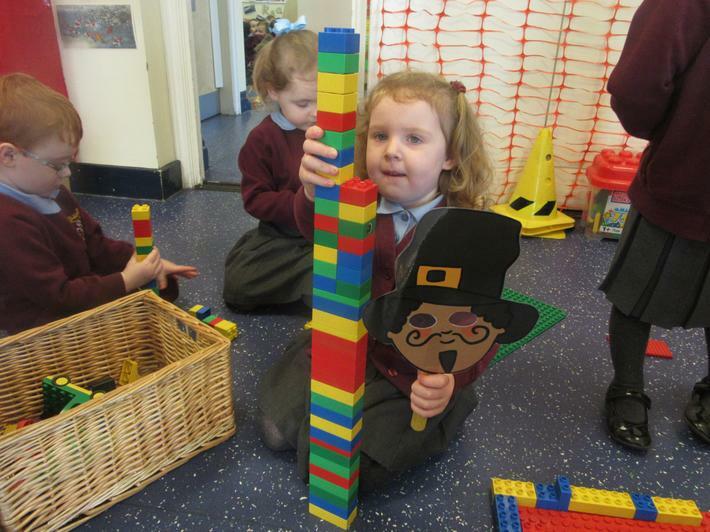 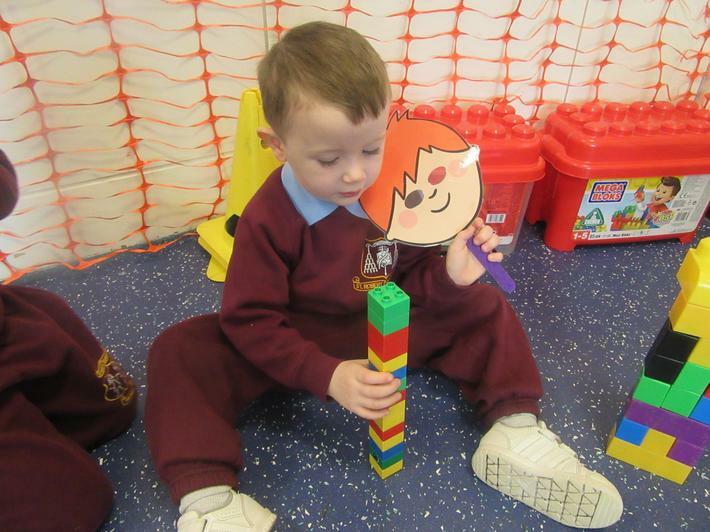 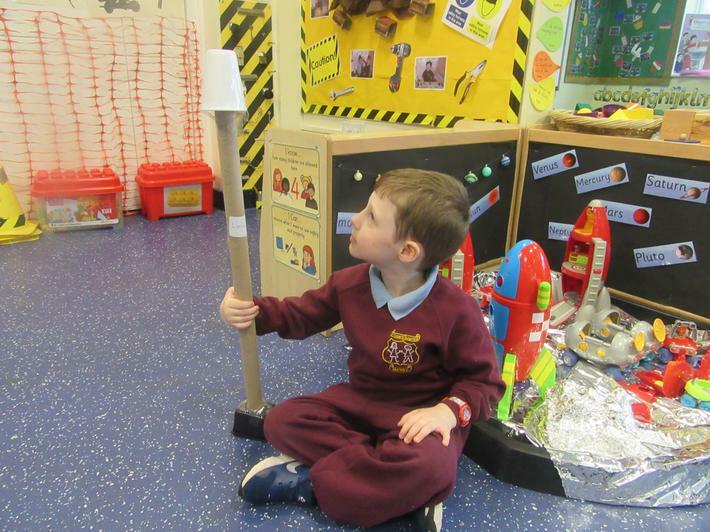 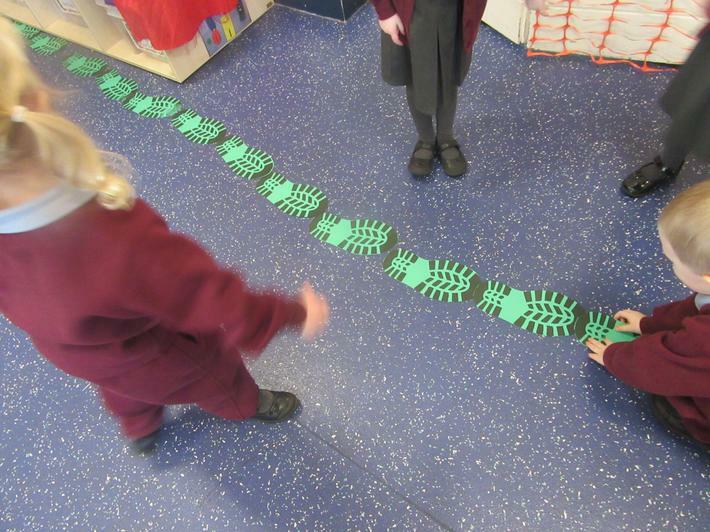 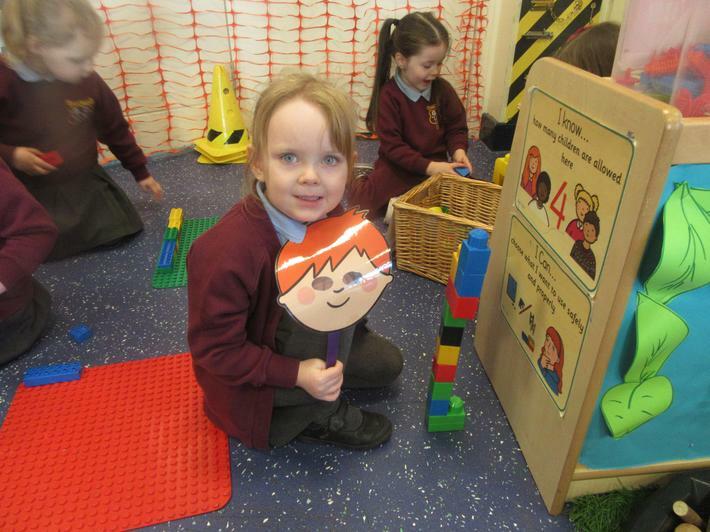 We have all had great fun with our 'stick man' topic! 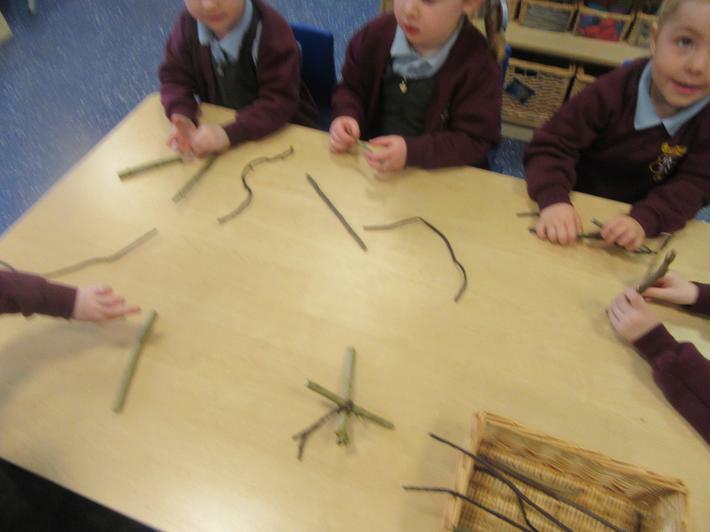 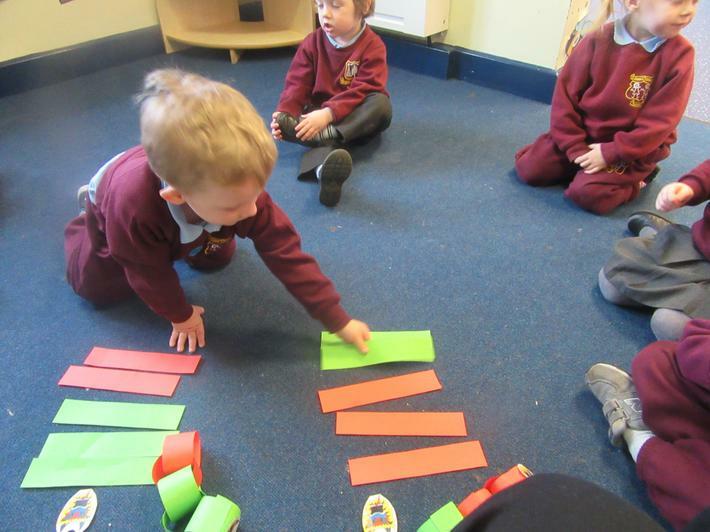 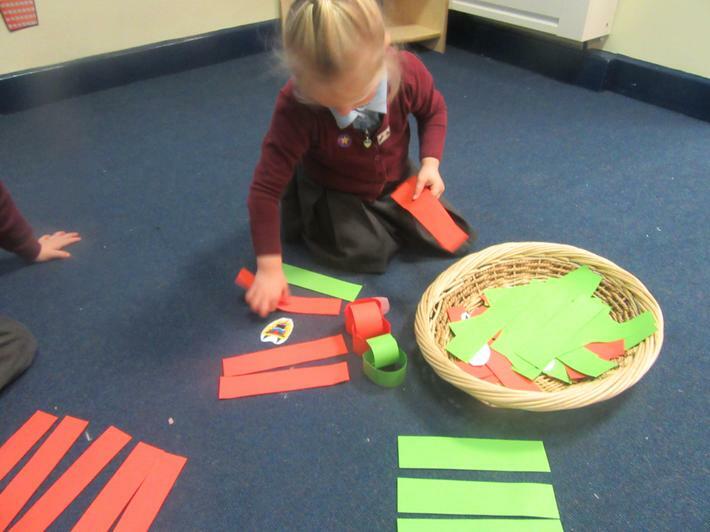 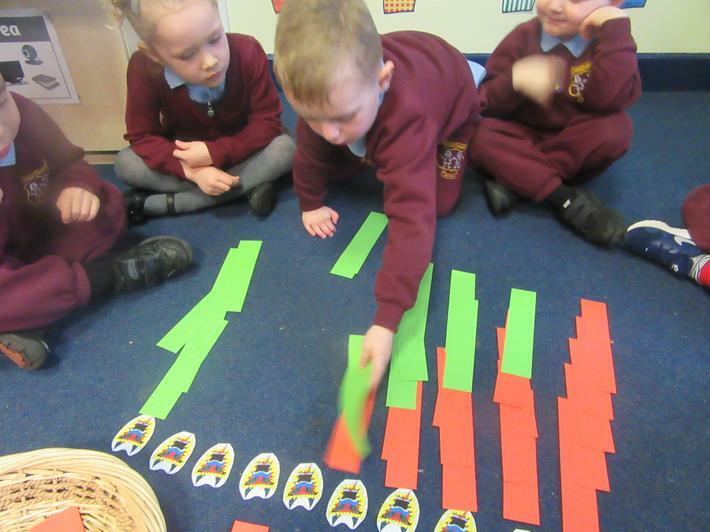 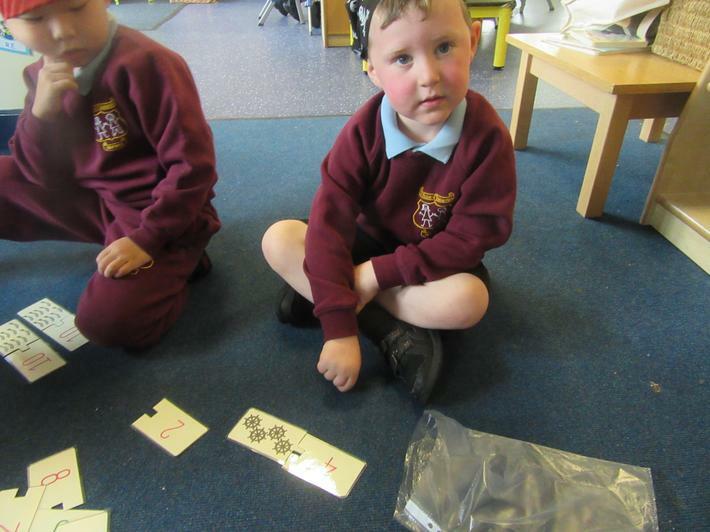 We have ordered, compared, sorted and counted stick men. 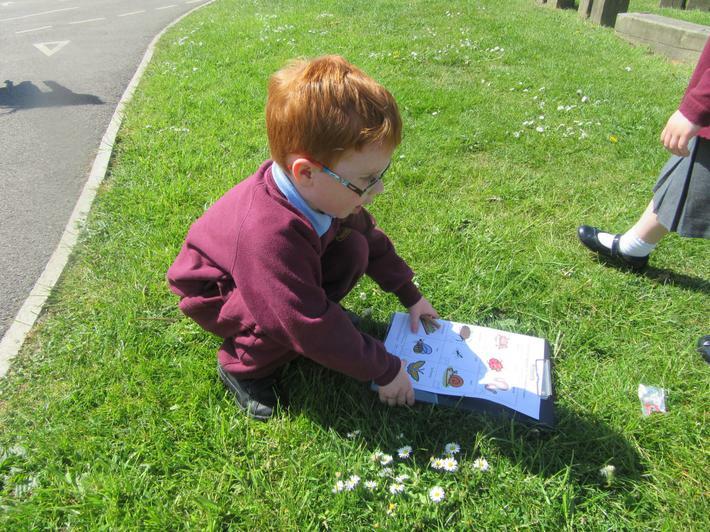 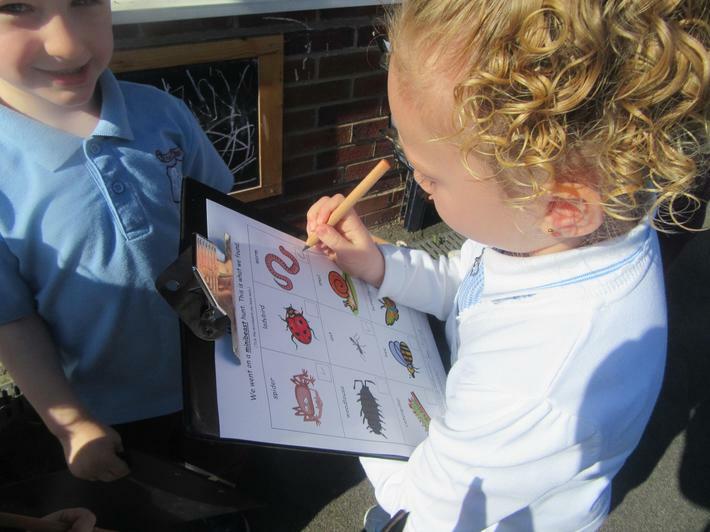 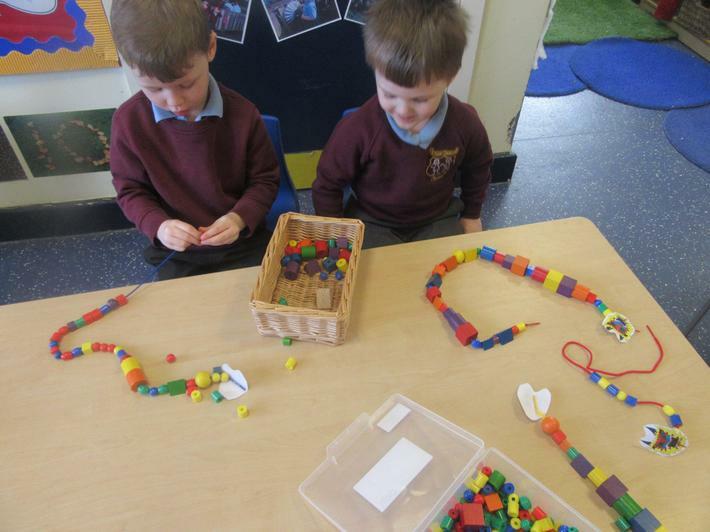 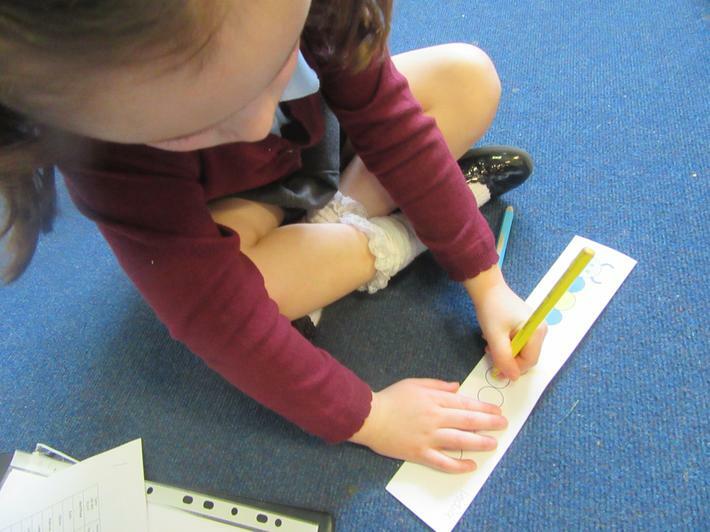 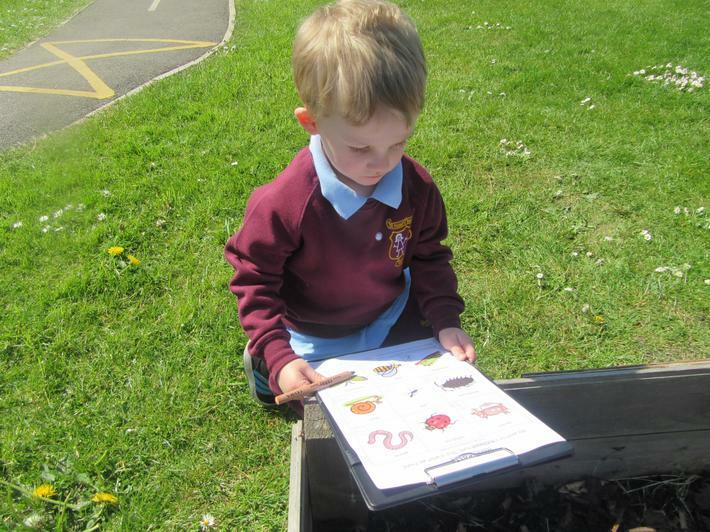 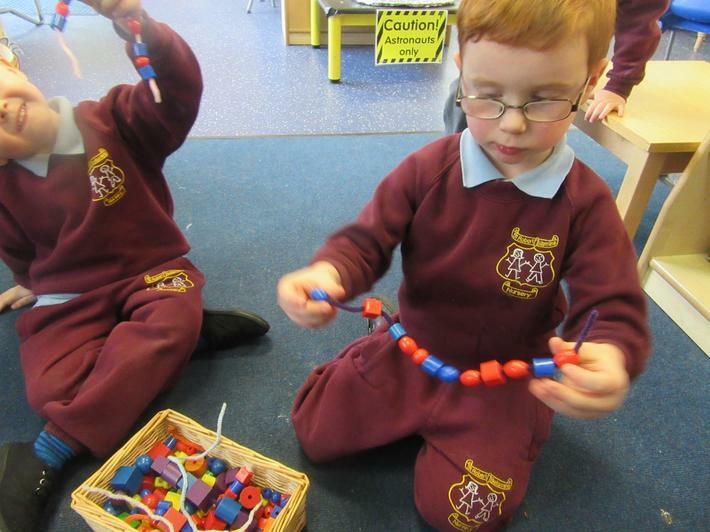 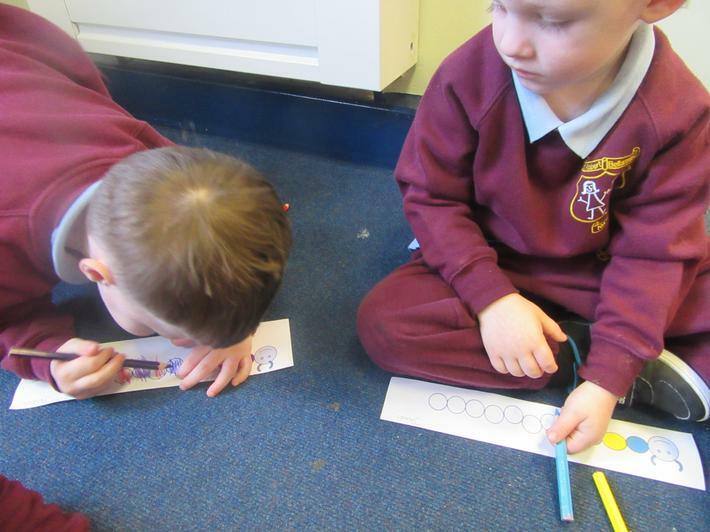 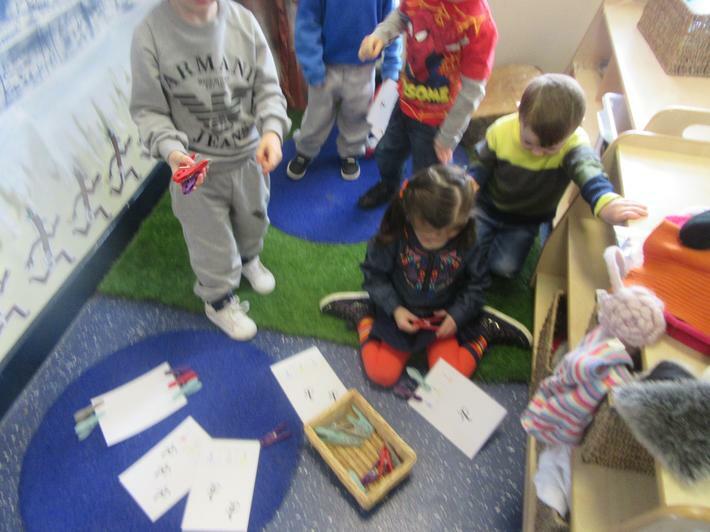 We have matched numicon with stick men and have even talked about his feelings: happy and sad.We investigated natural objects from his habitat using magnifying glasses so that we could look closely and even found some minibeasts. 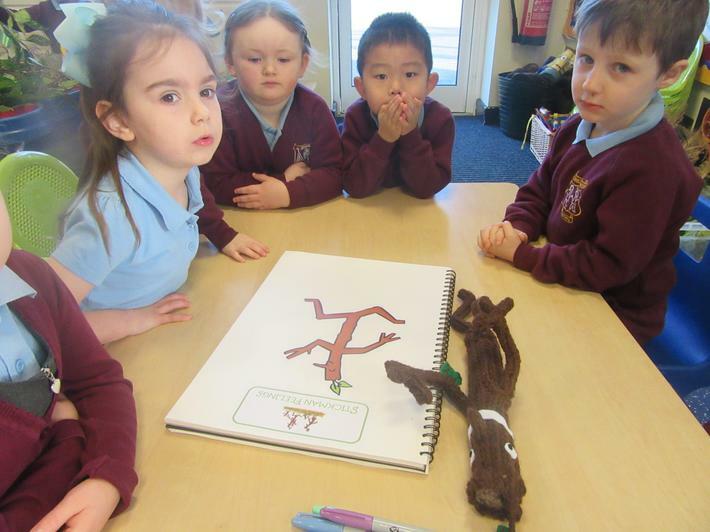 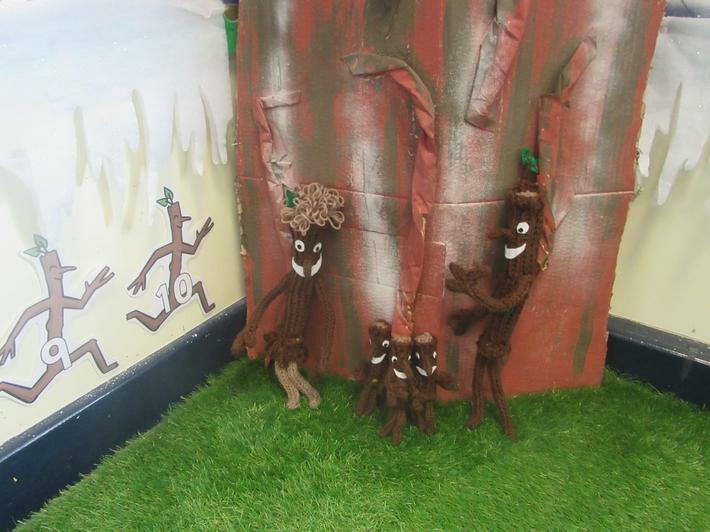 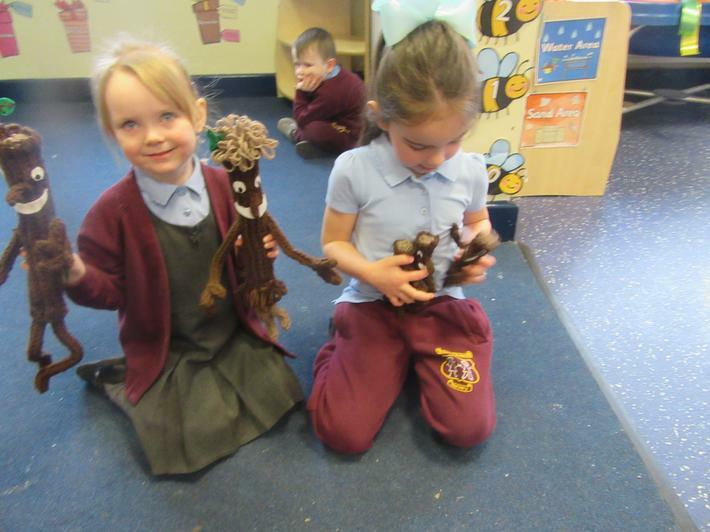 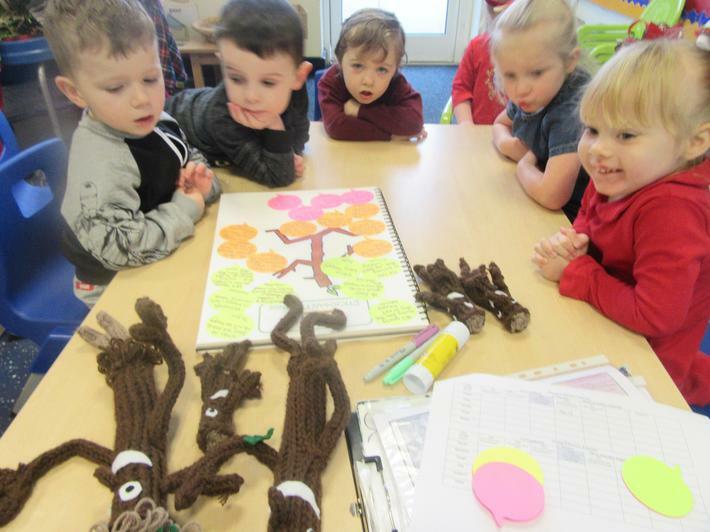 We have made some stick men of our own for our display and role played using stick men puppets to retell the story. 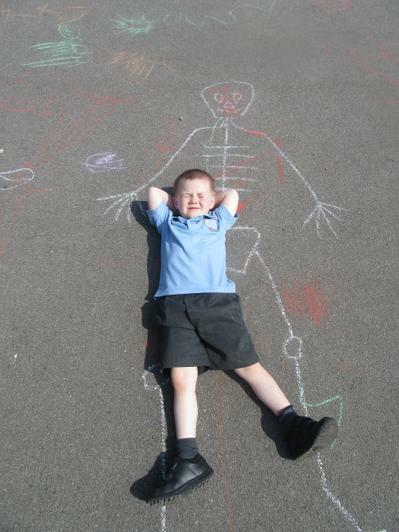 We've really enjoyed our 'stick man' topic!! 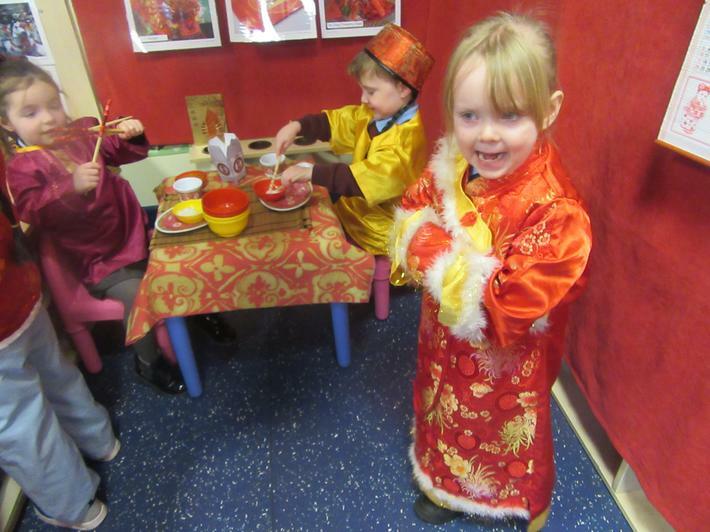 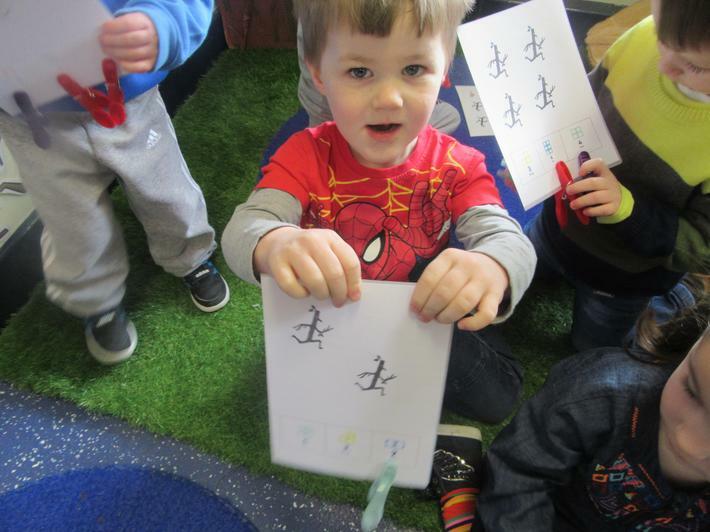 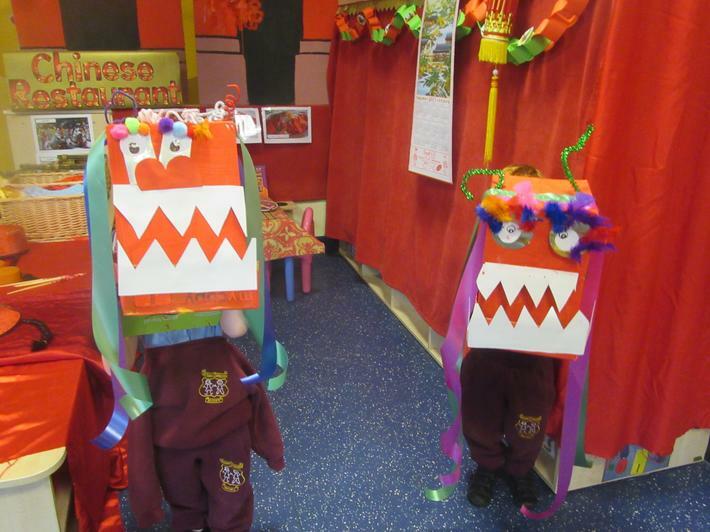 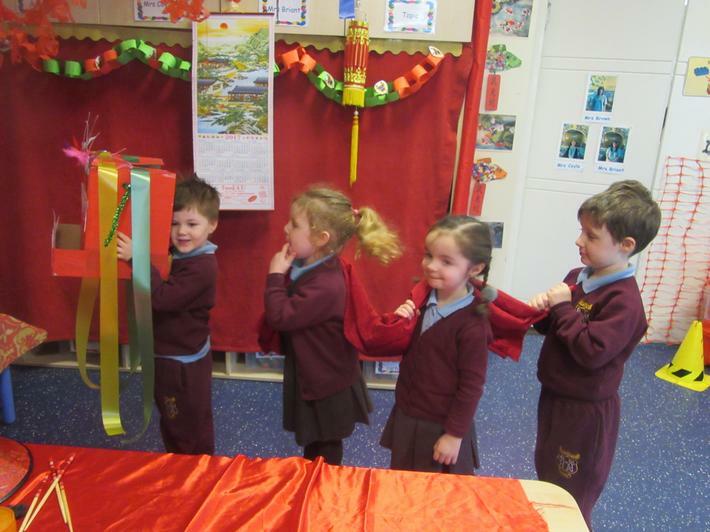 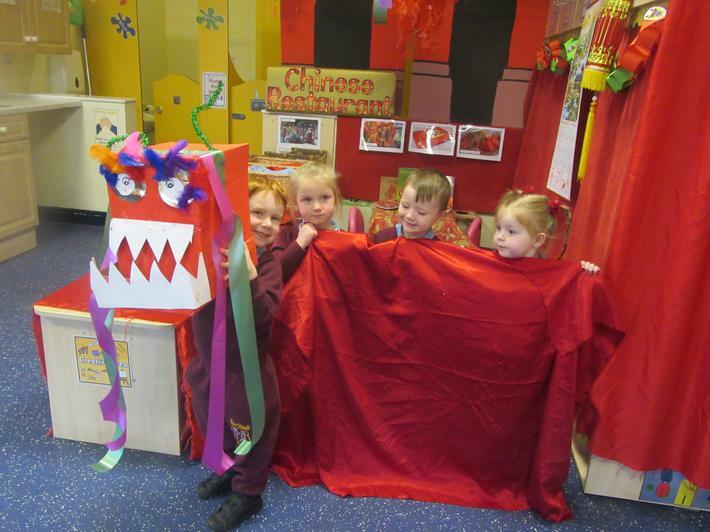 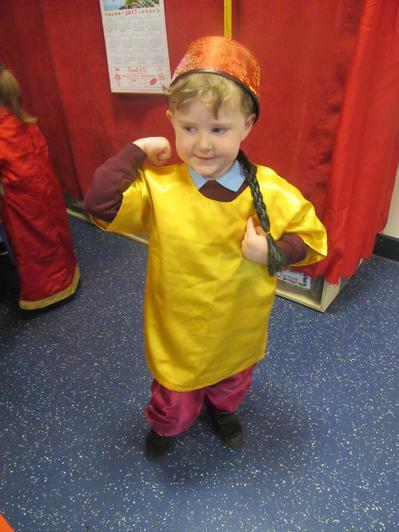 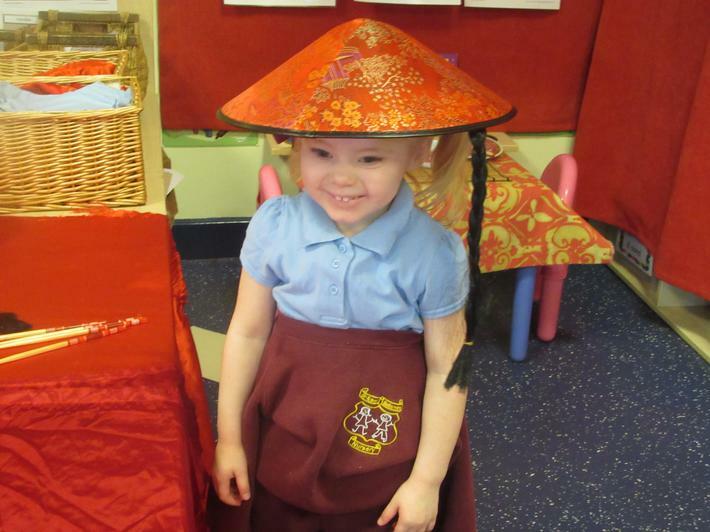 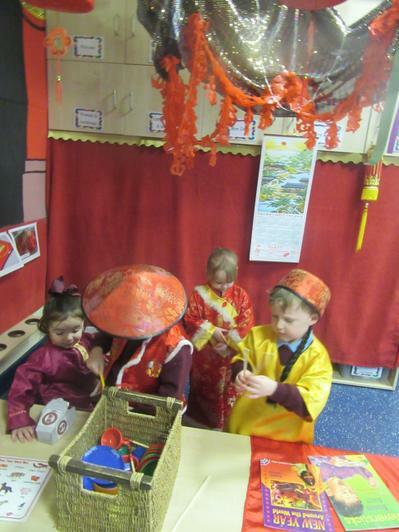 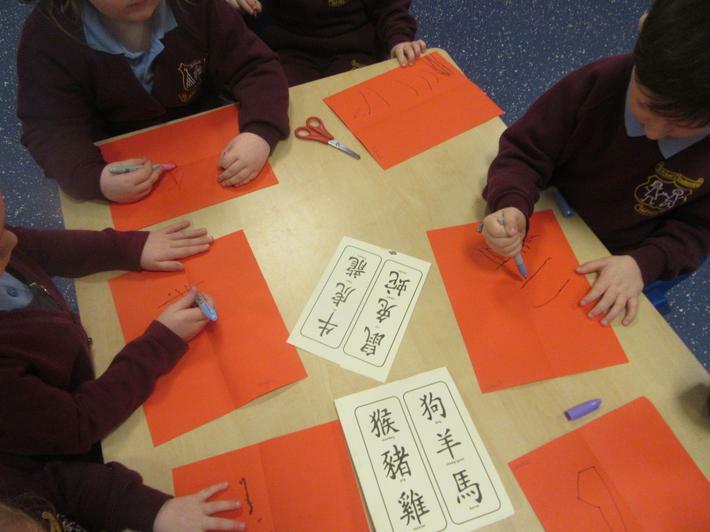 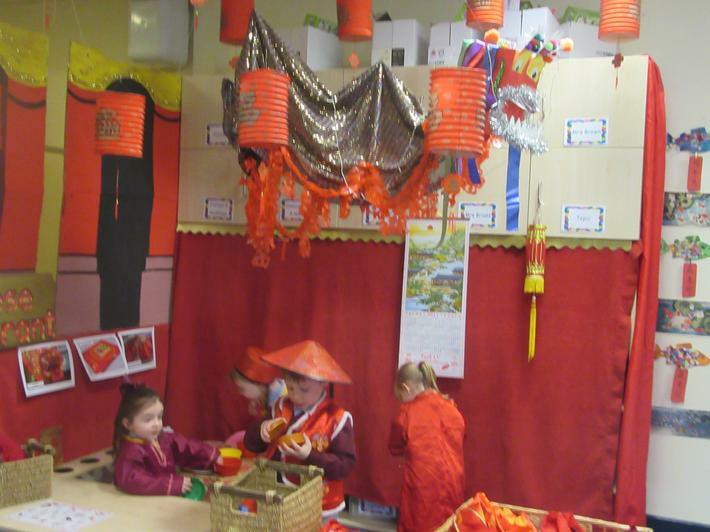 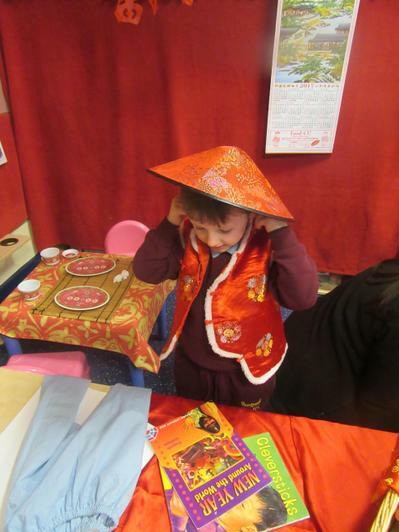 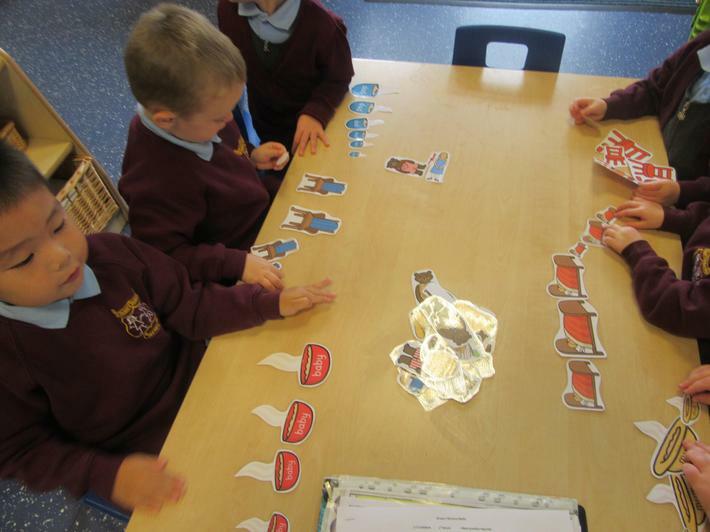 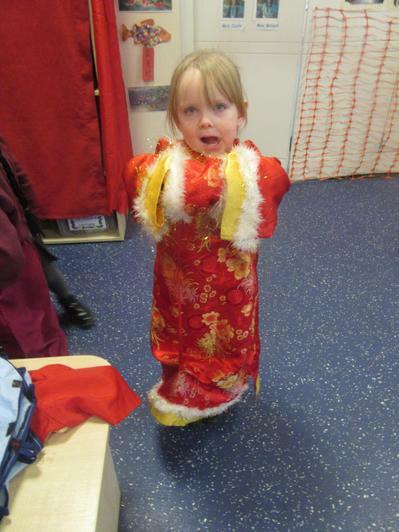 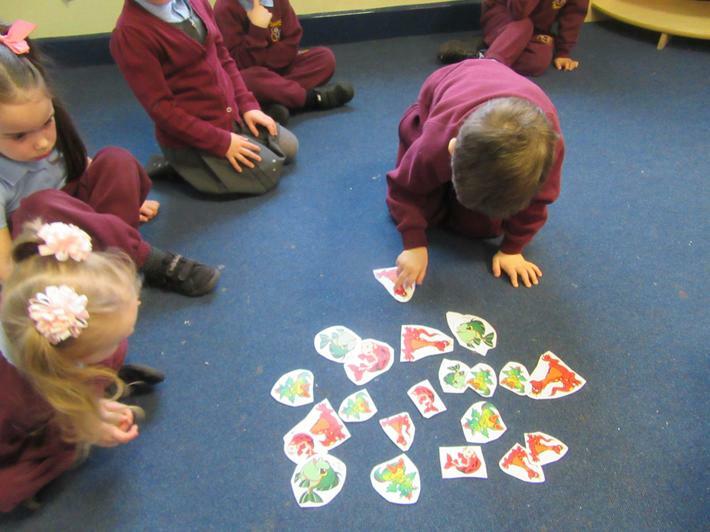 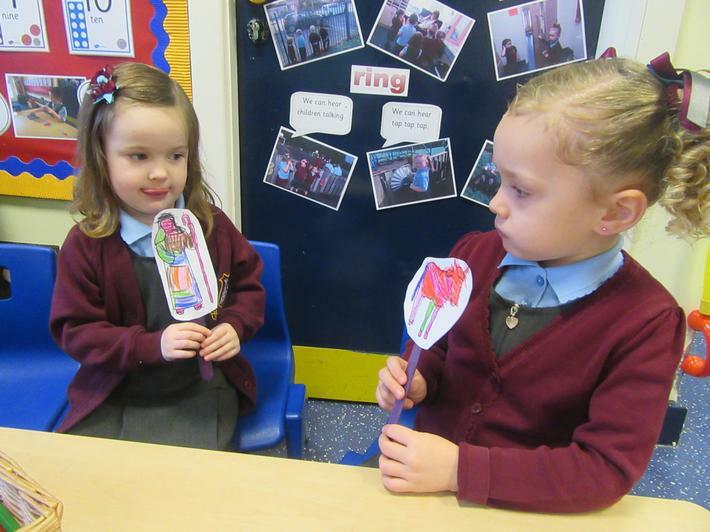 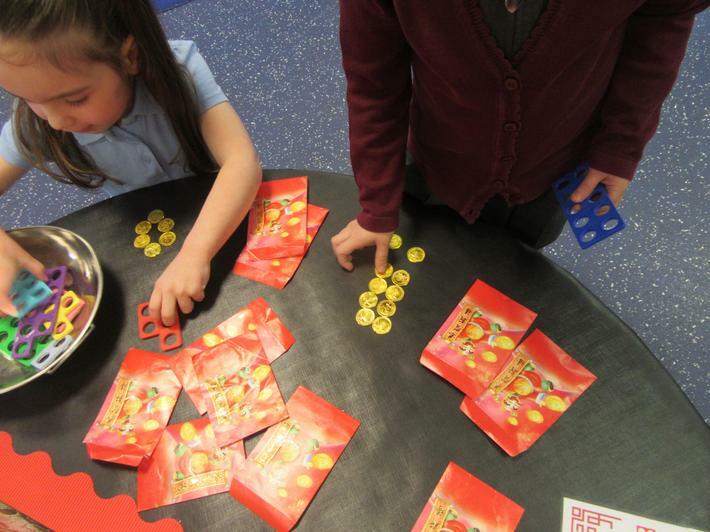 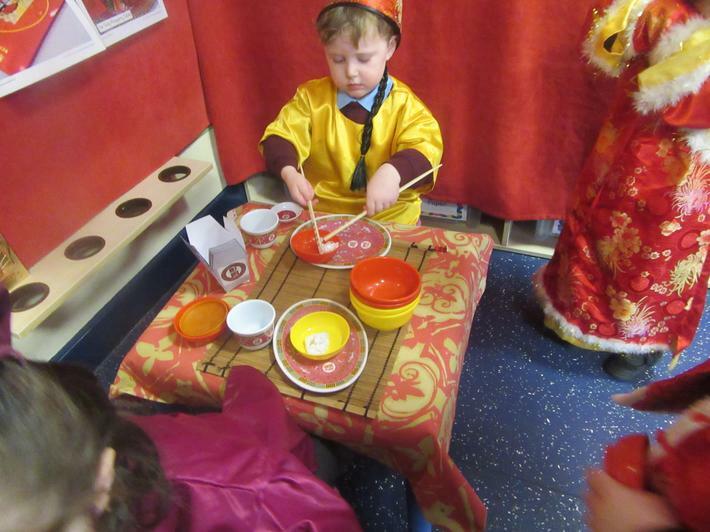 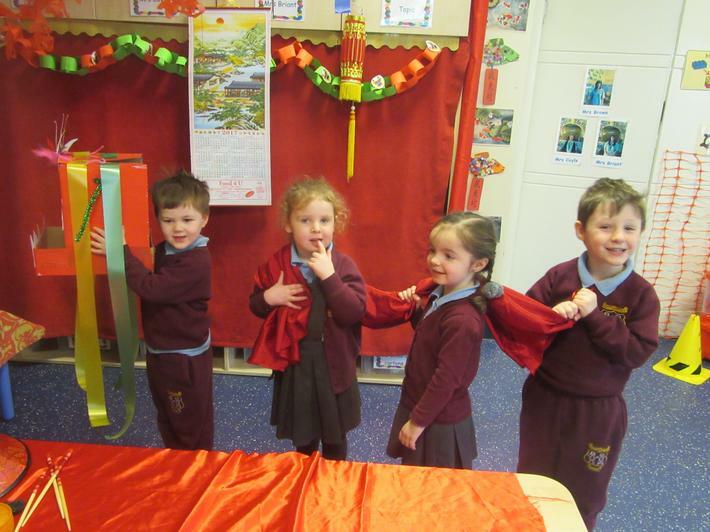 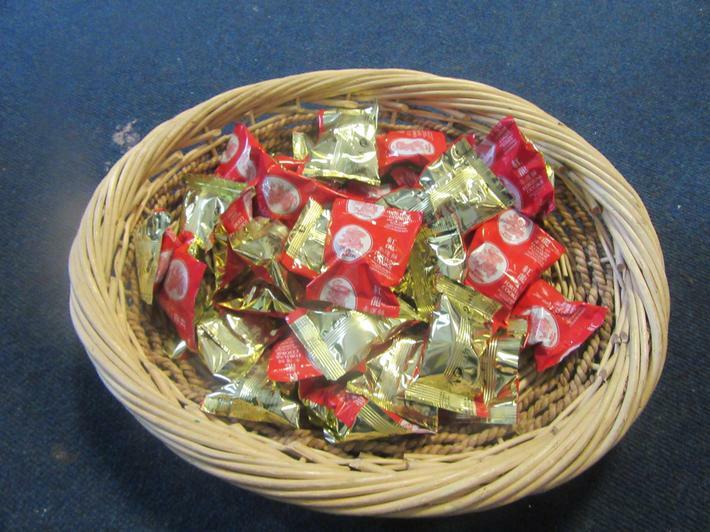 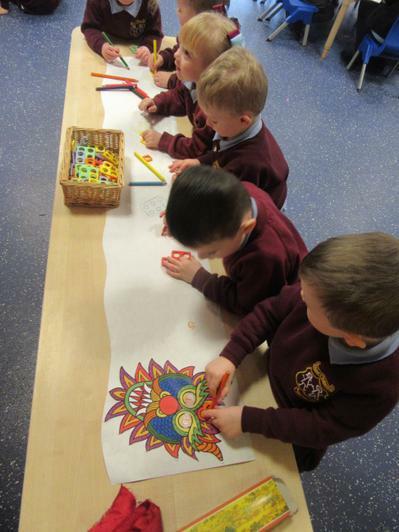 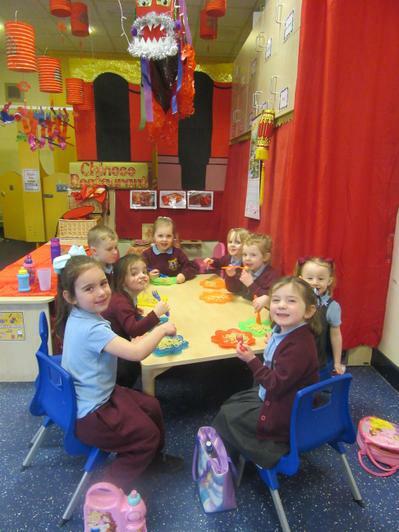 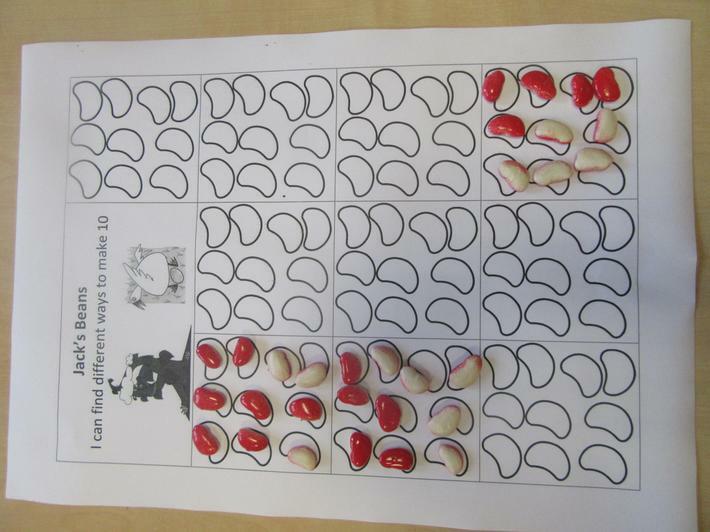 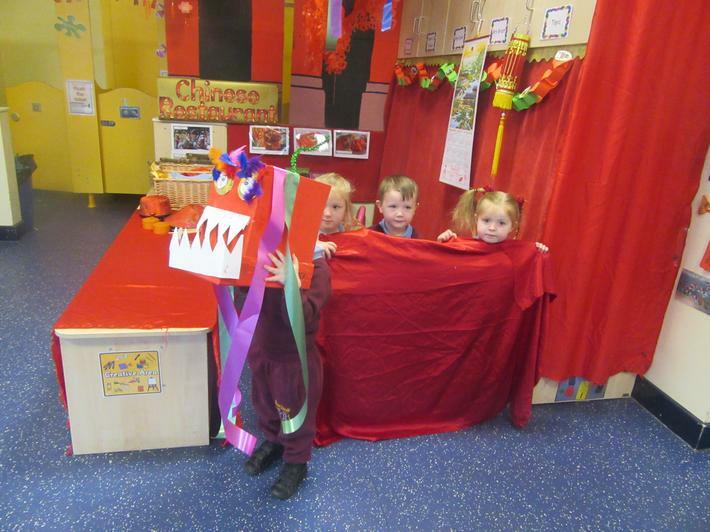 One of our topics this half term was Chinese New Year! 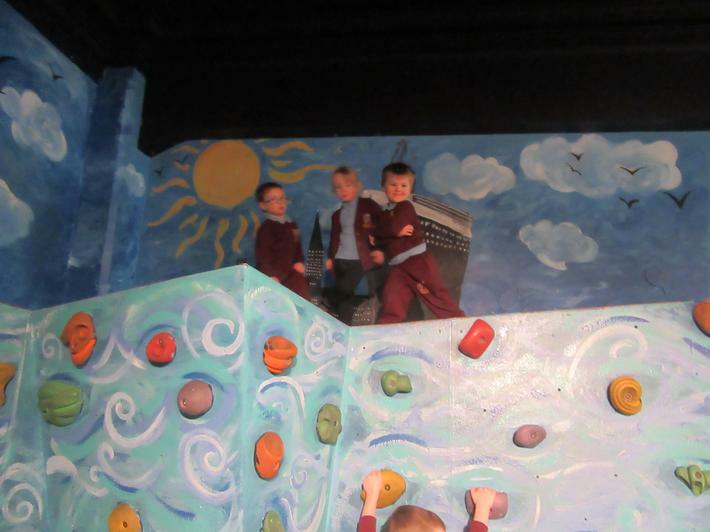 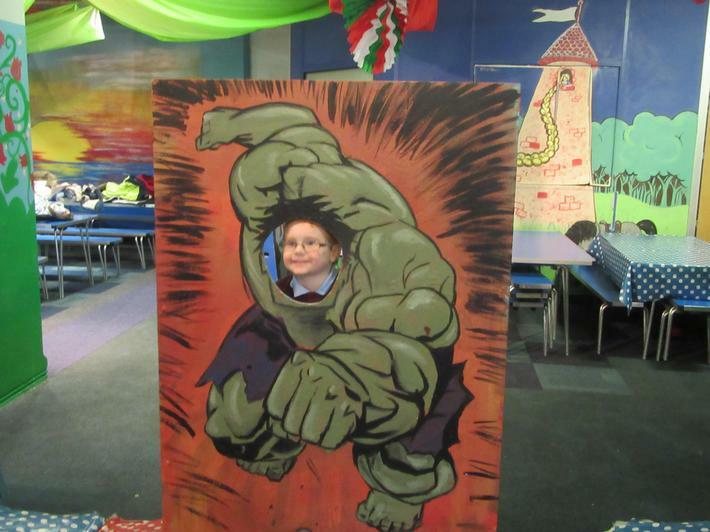 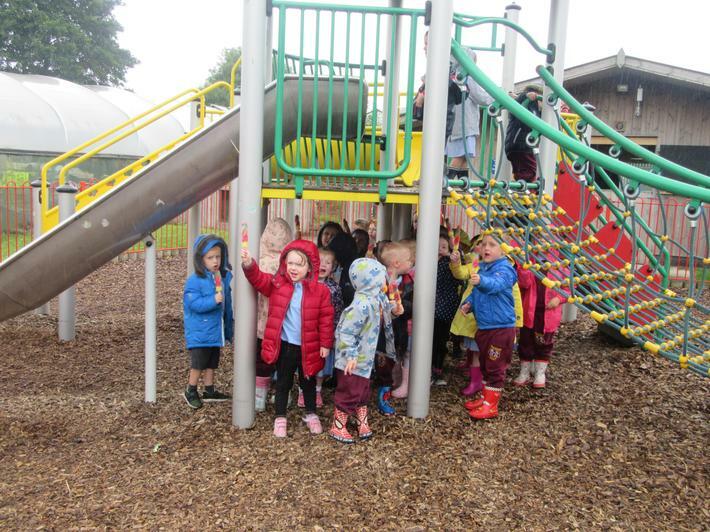 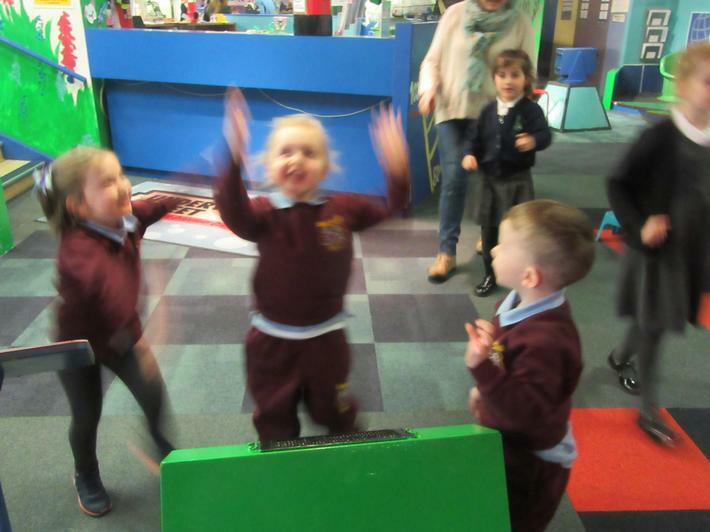 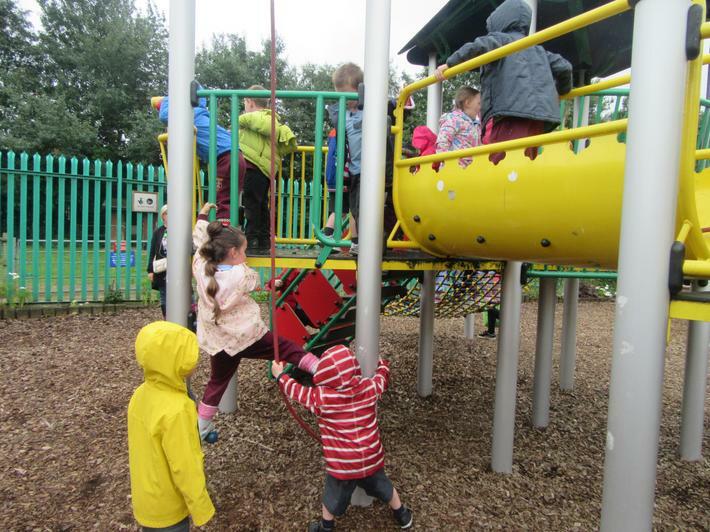 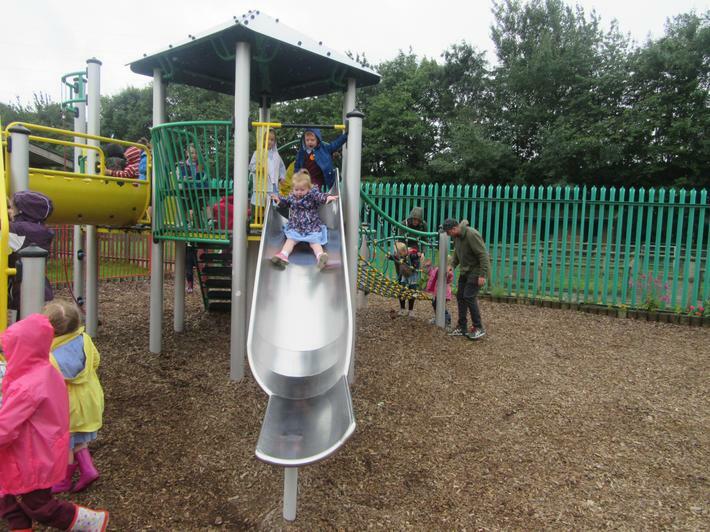 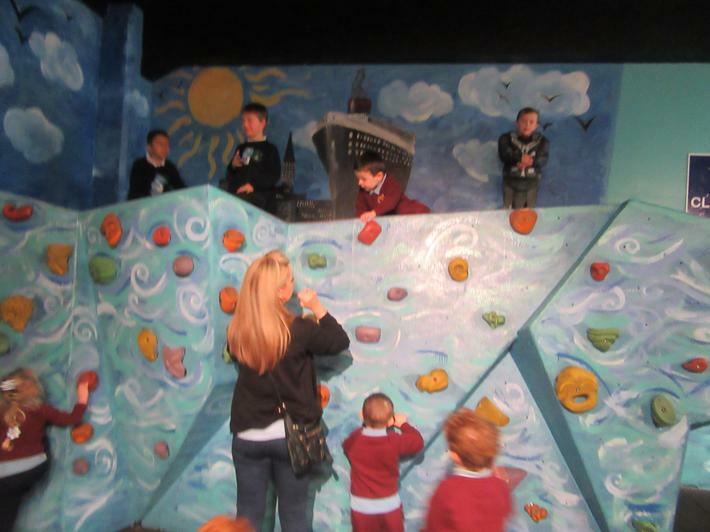 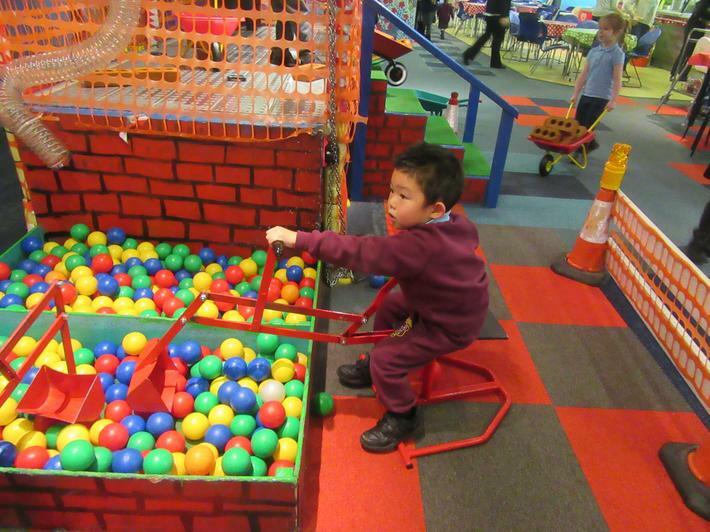 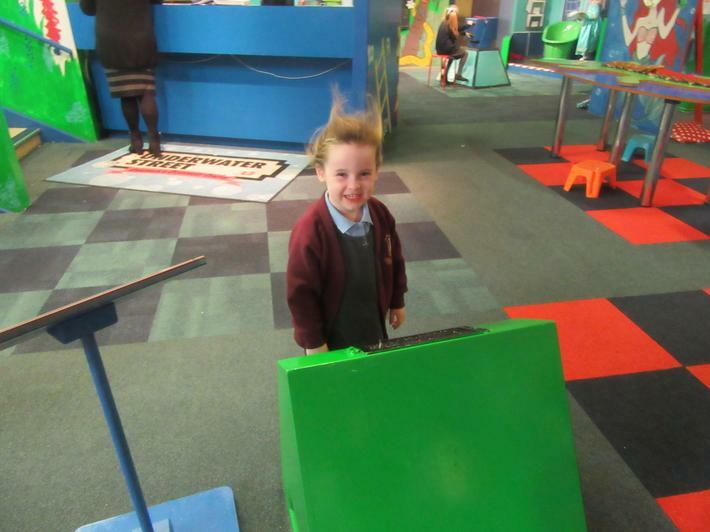 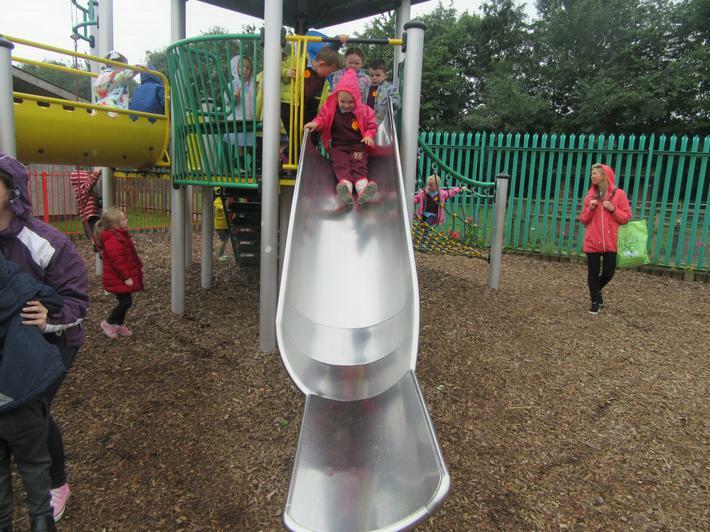 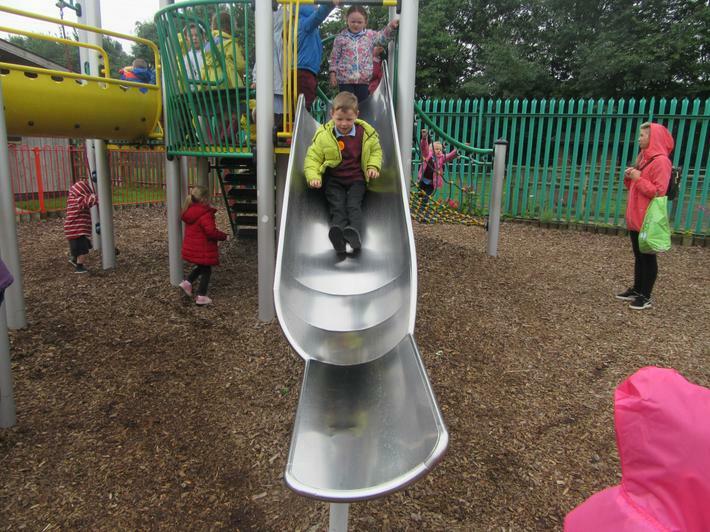 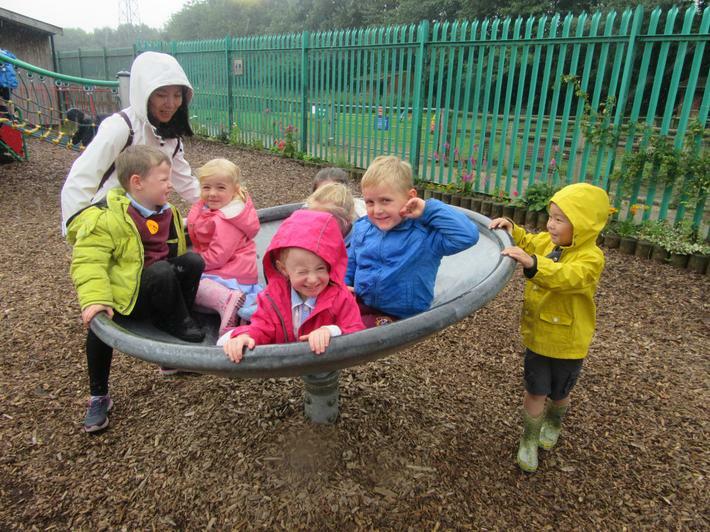 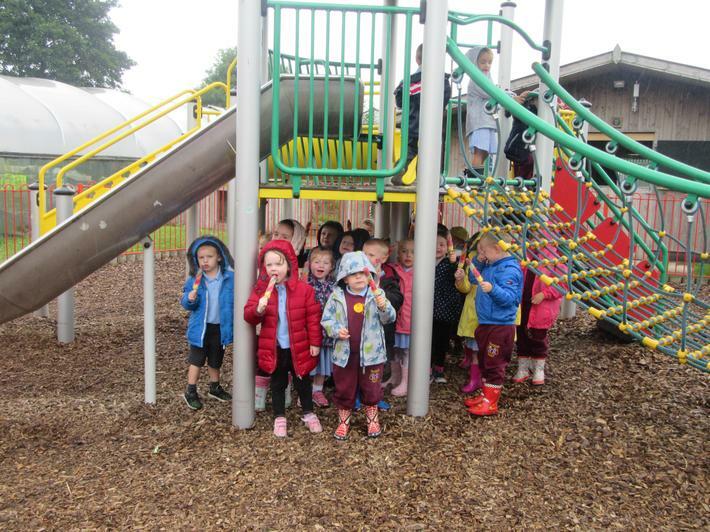 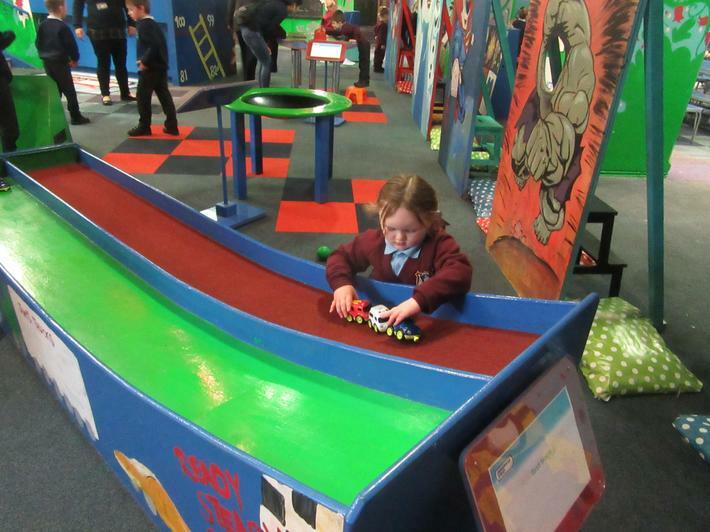 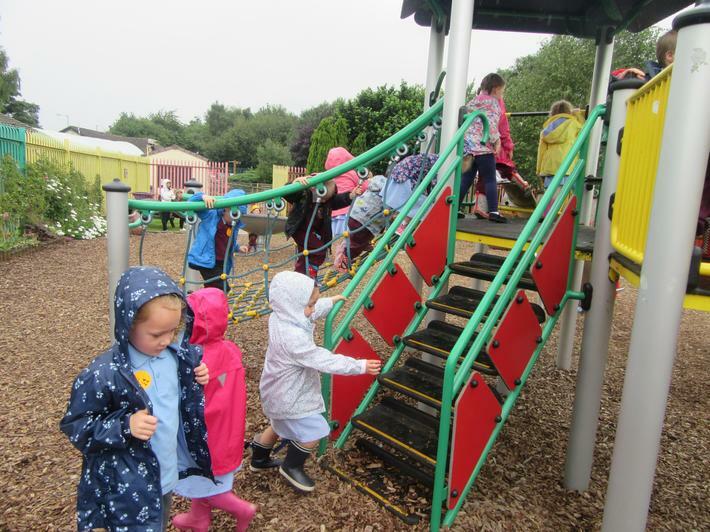 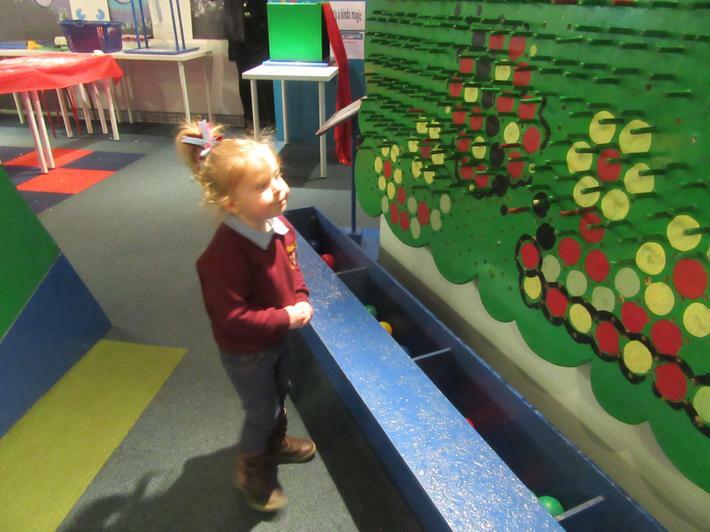 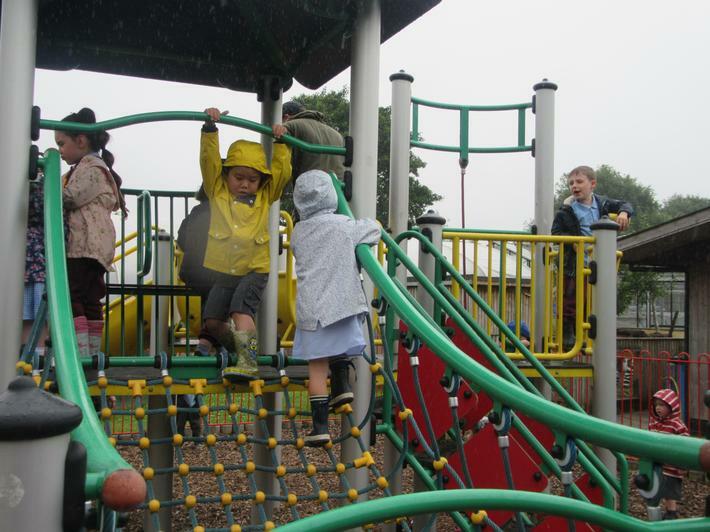 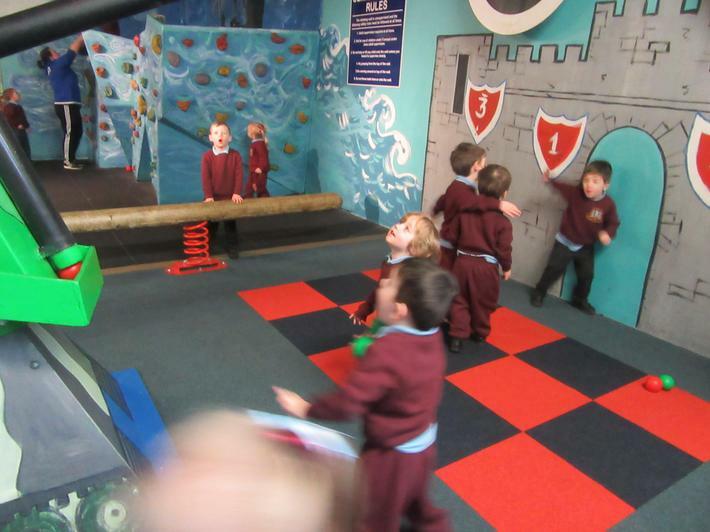 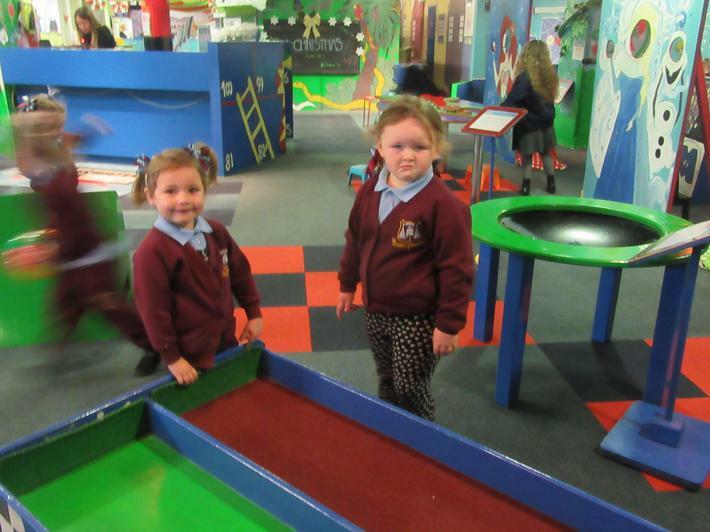 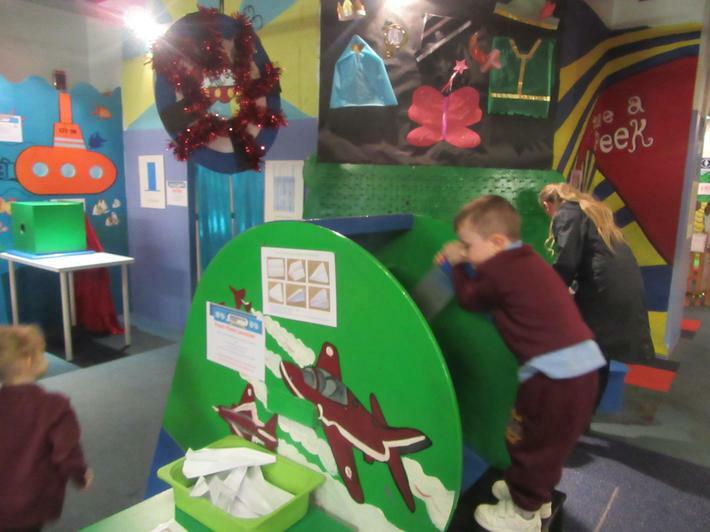 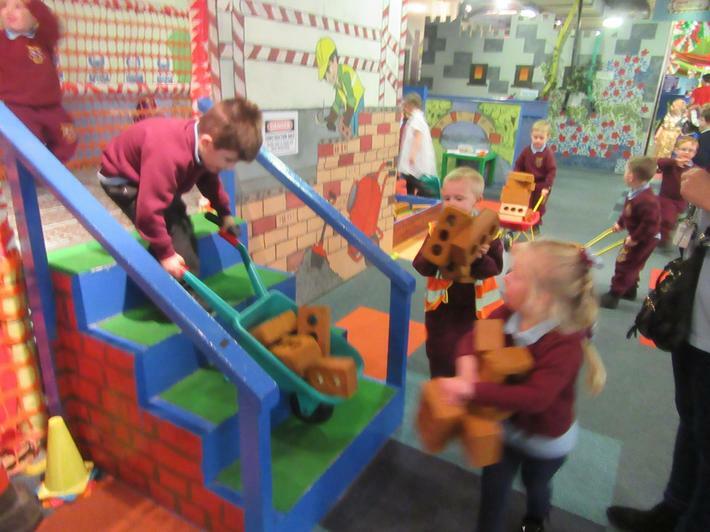 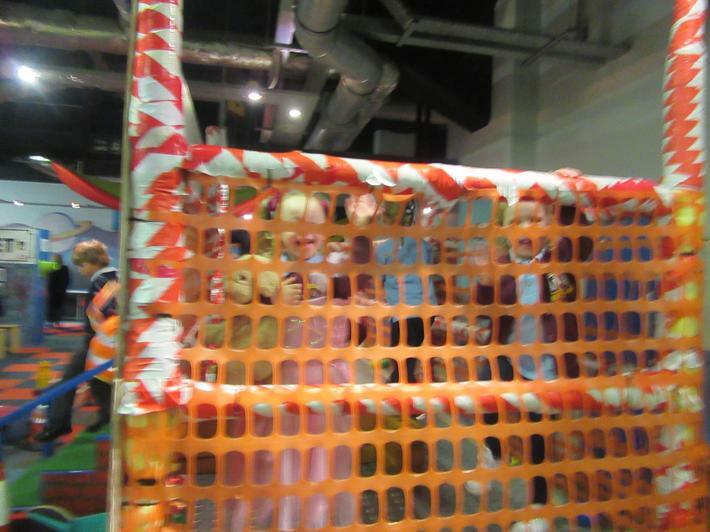 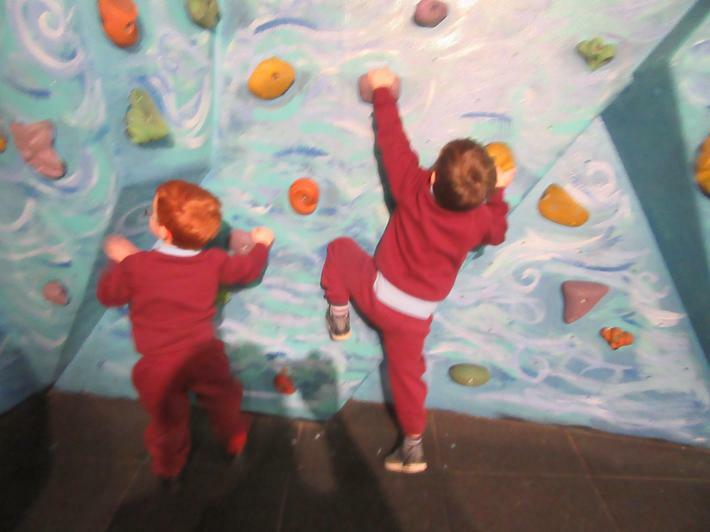 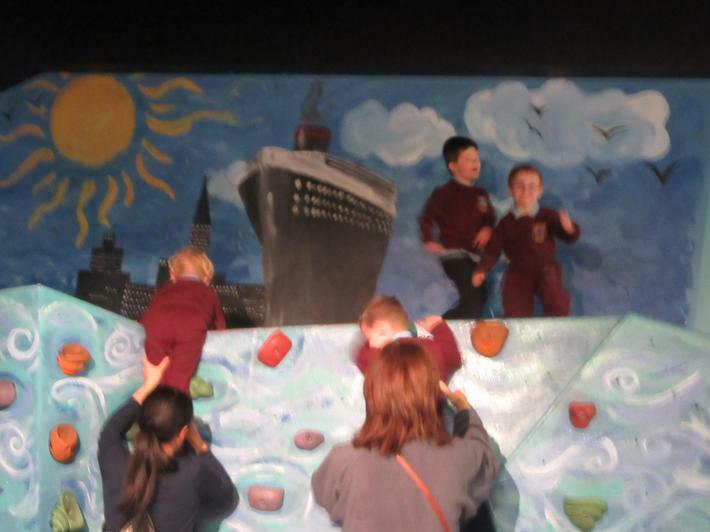 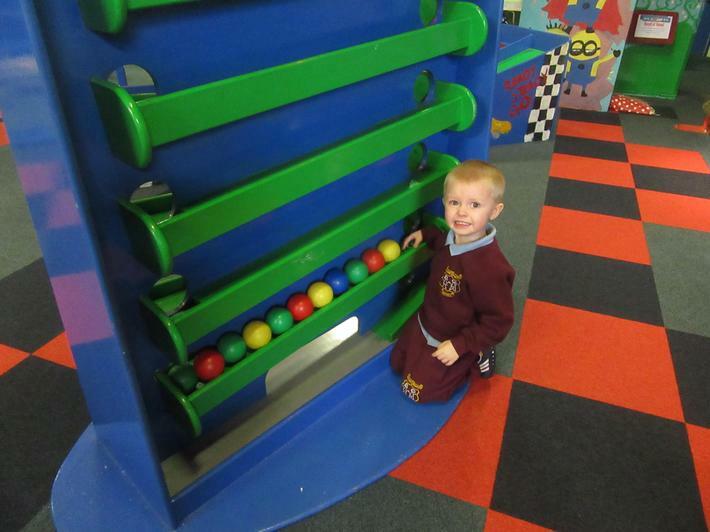 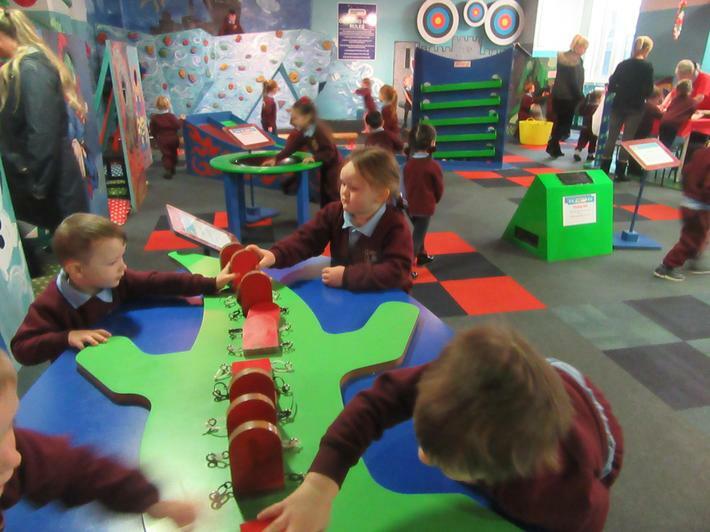 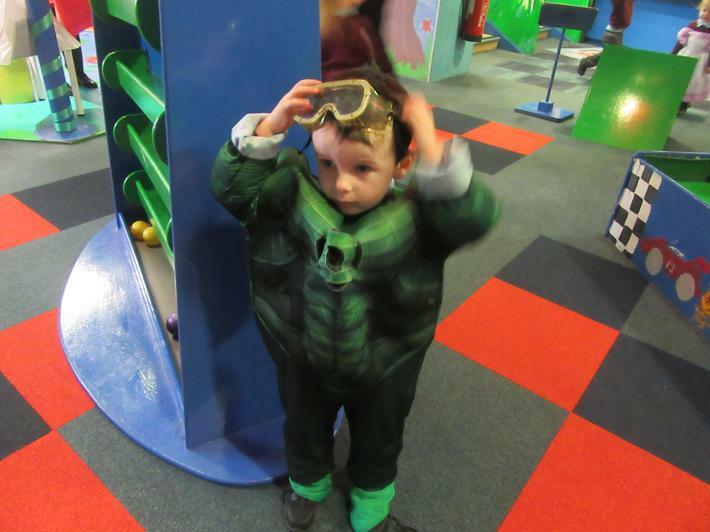 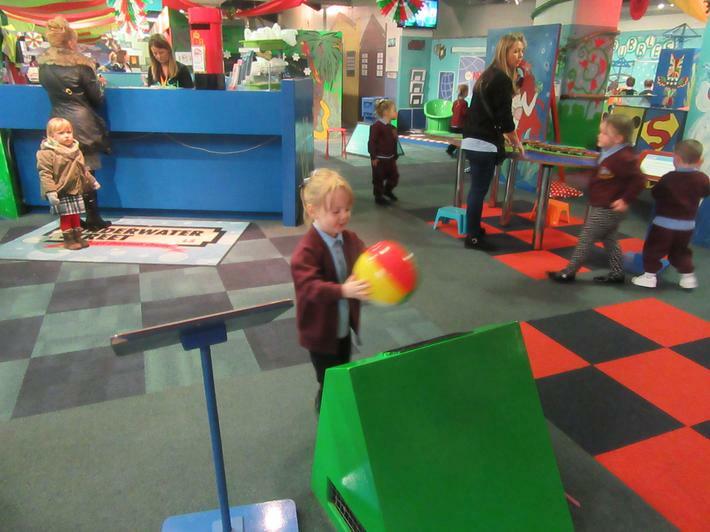 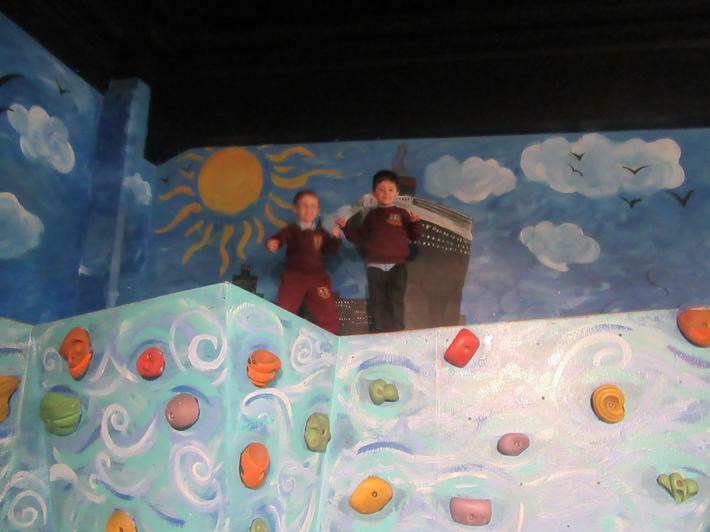 We took part in lots of different activities and we enjoyed them all!! 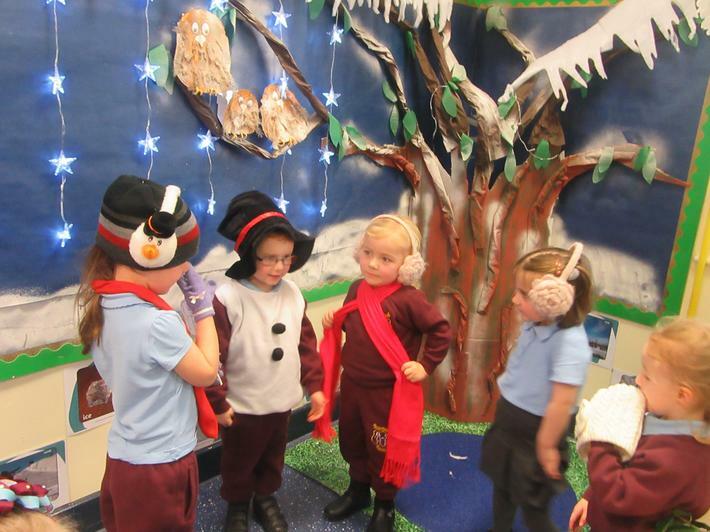 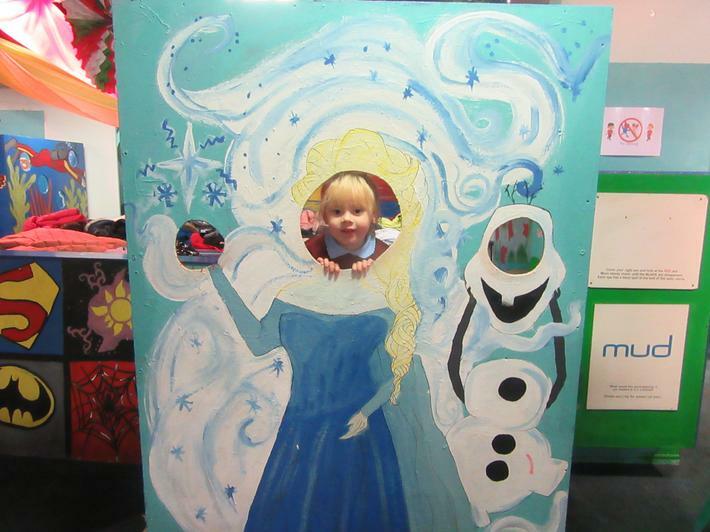 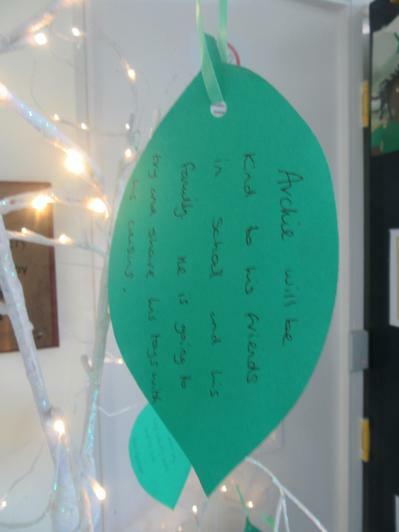 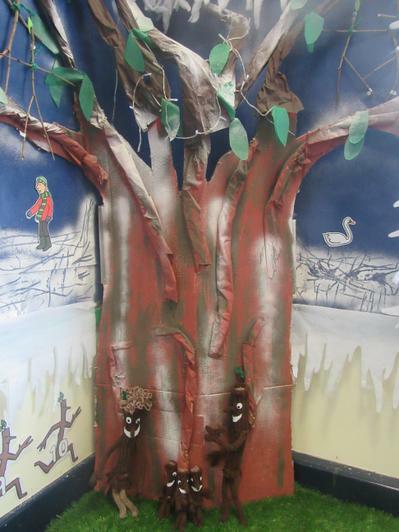 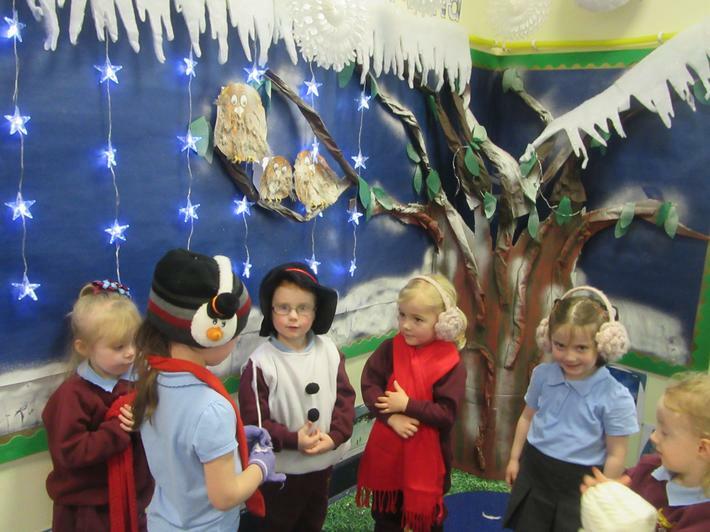 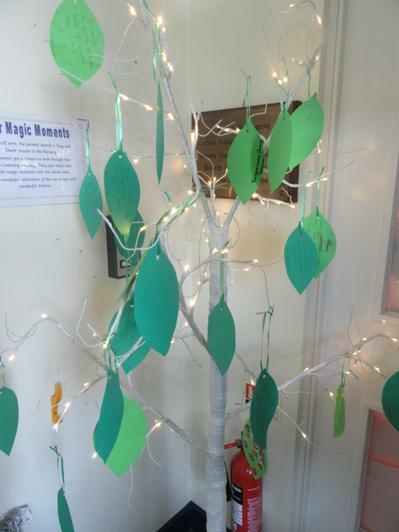 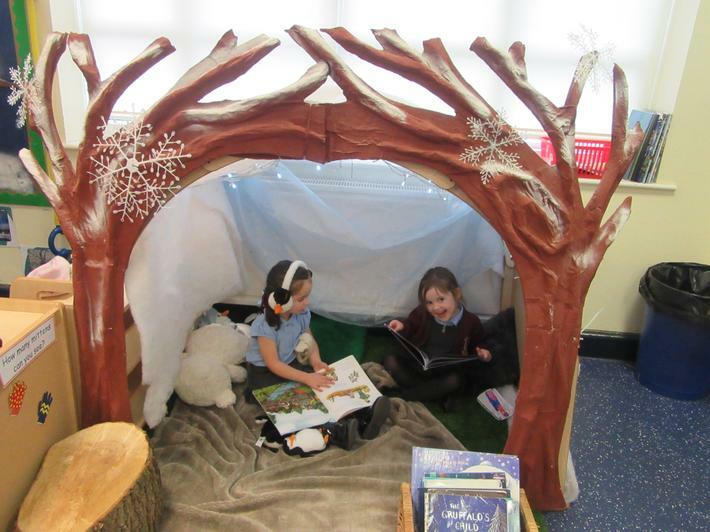 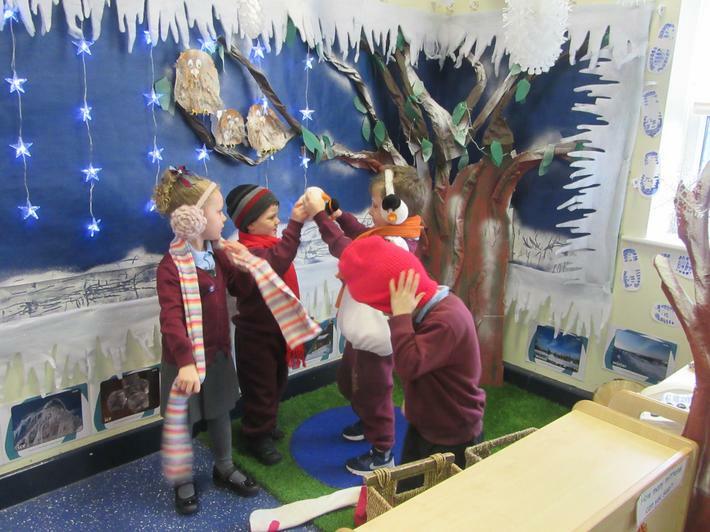 One our topics this half term is Winter Wonderland. 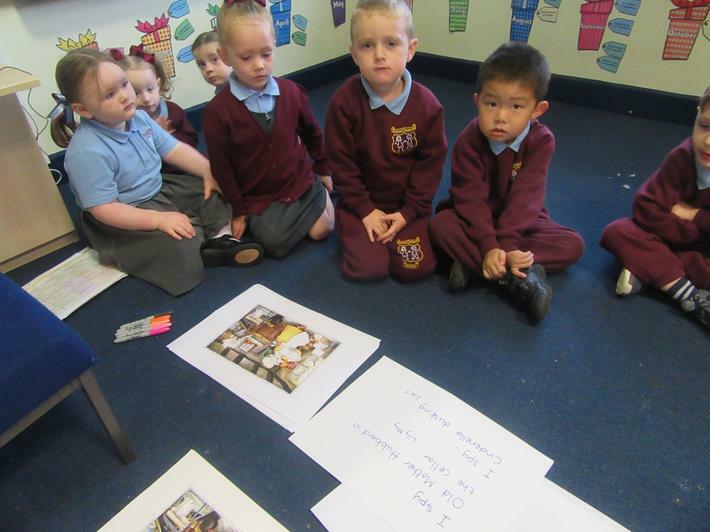 We found out lots of things that we didn't know and talked about the things we already knew! 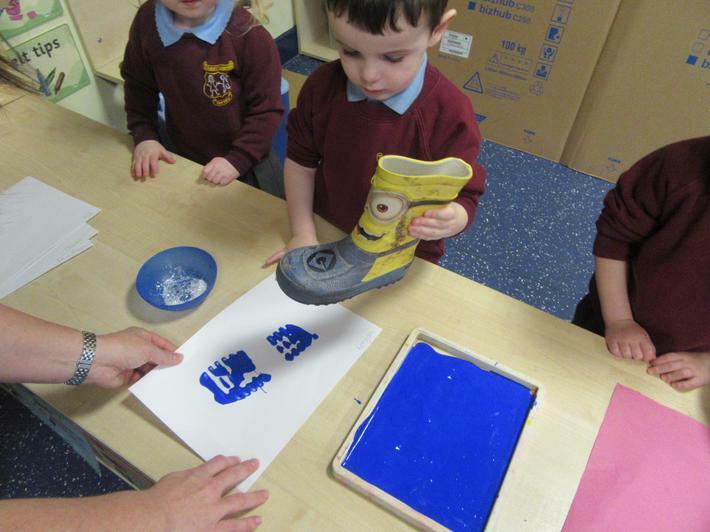 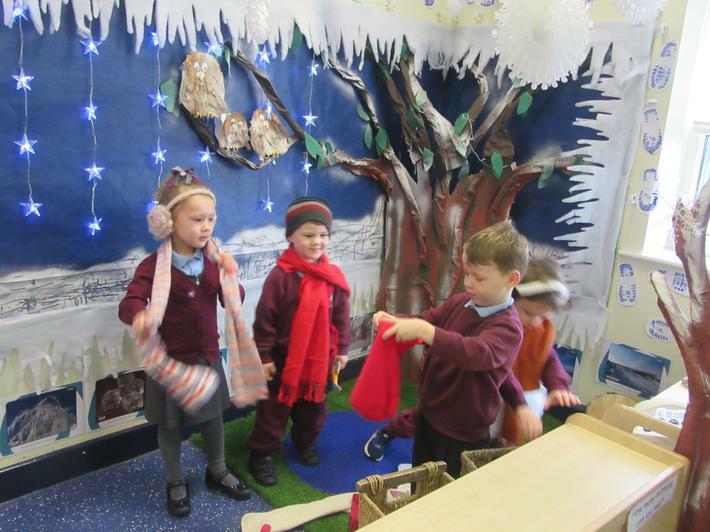 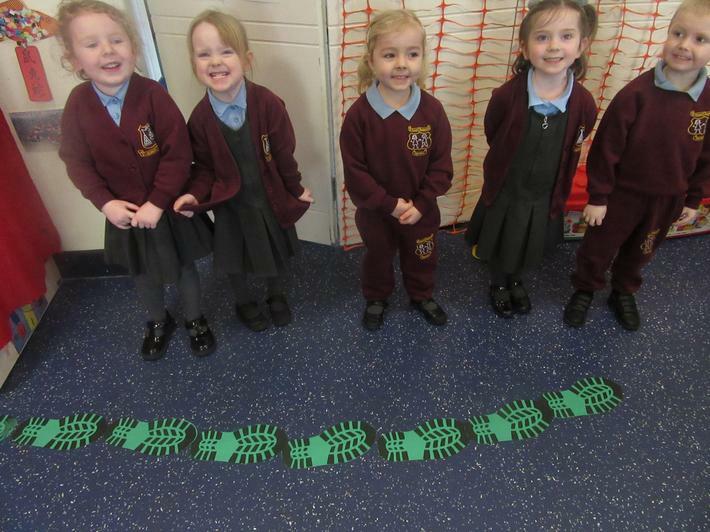 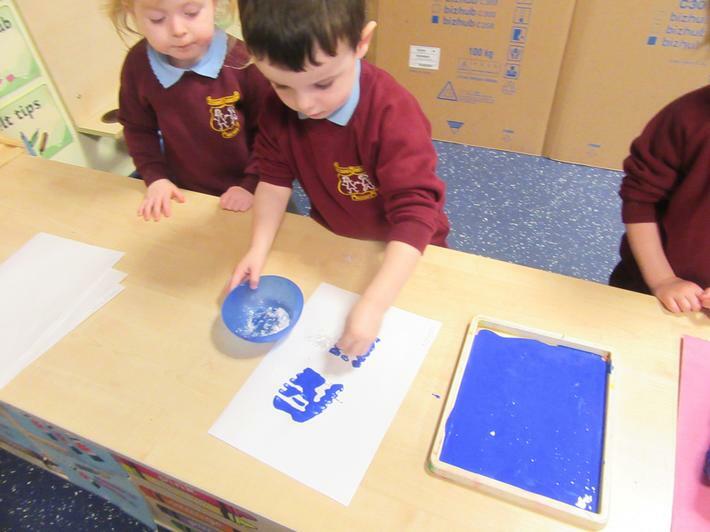 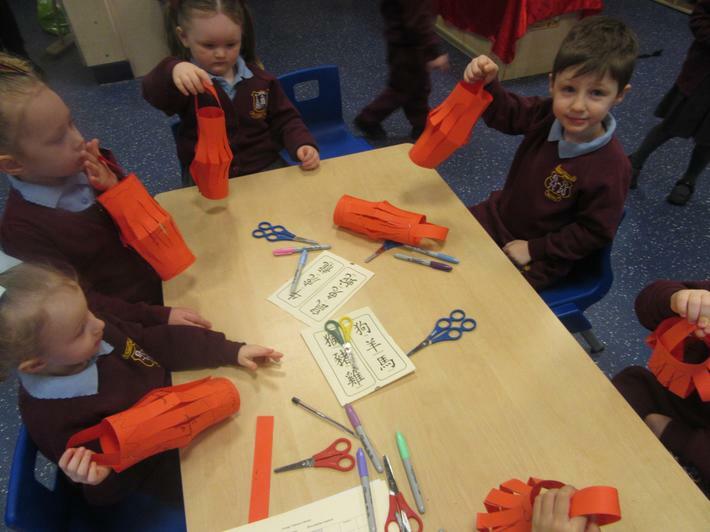 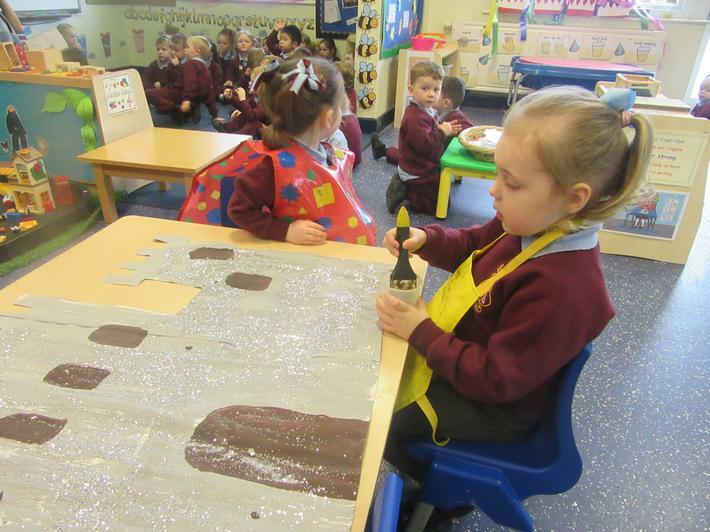 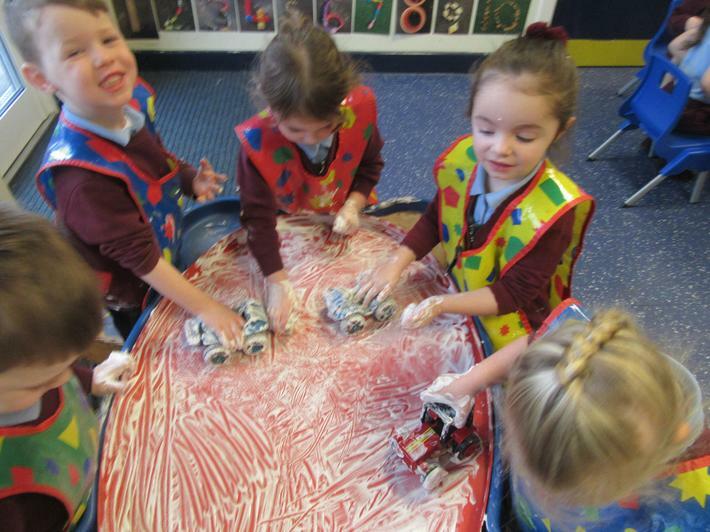 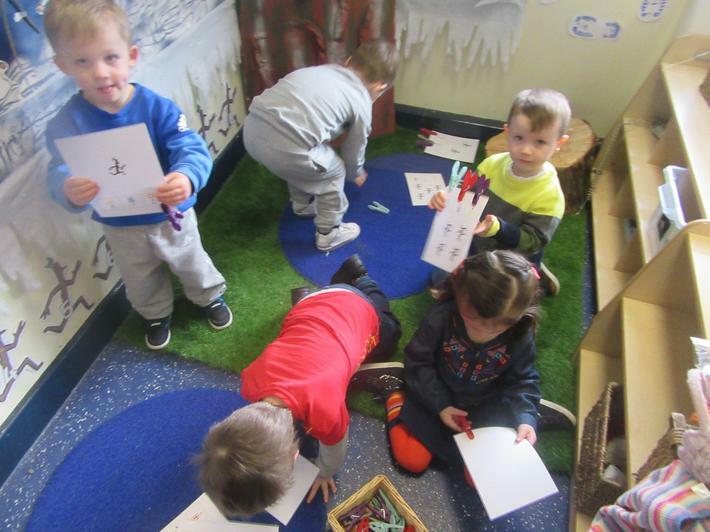 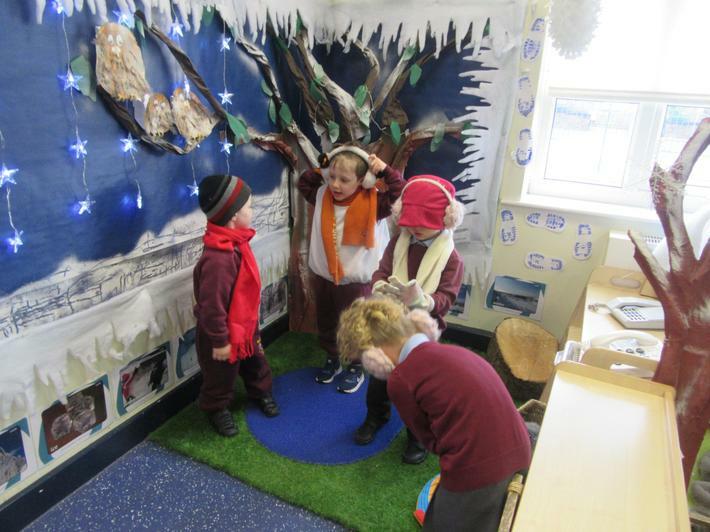 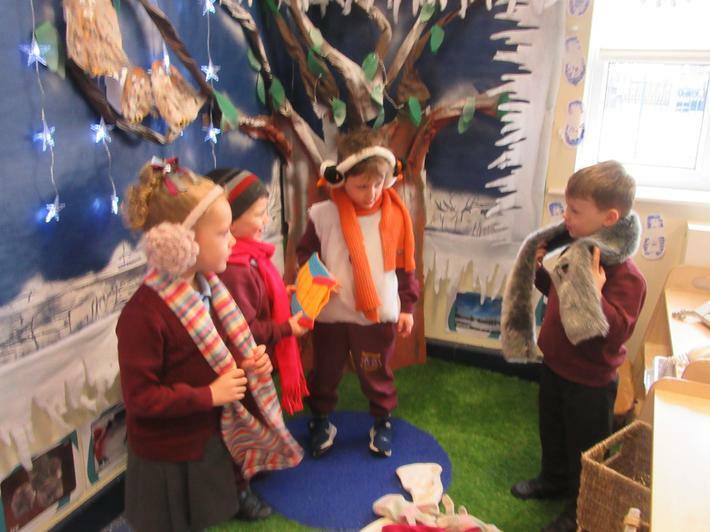 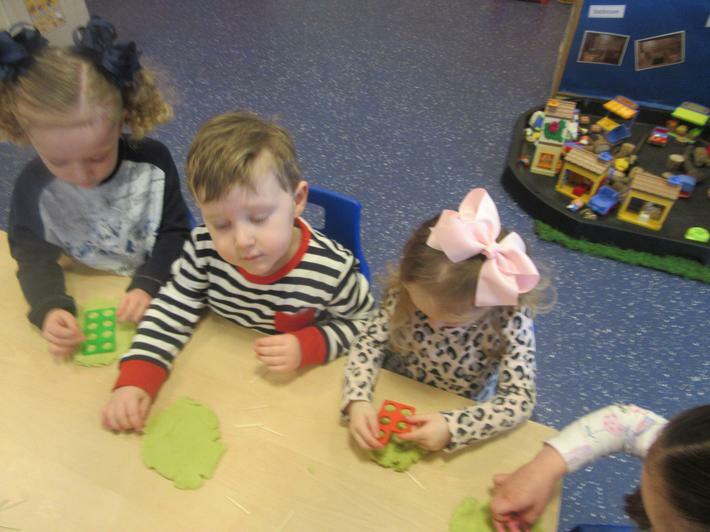 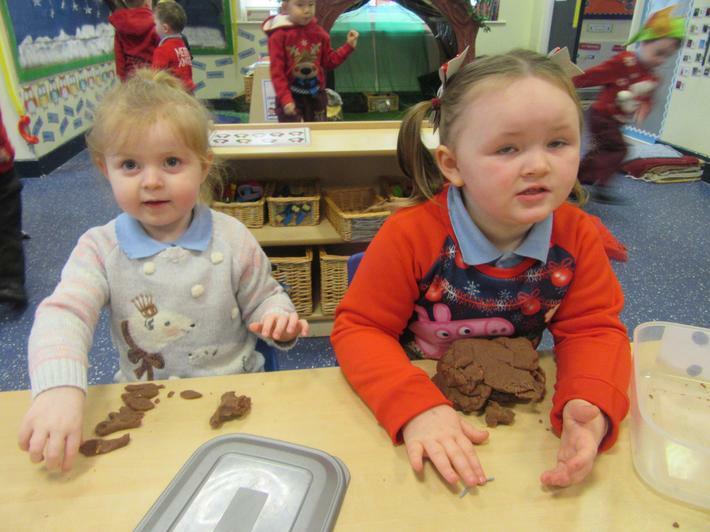 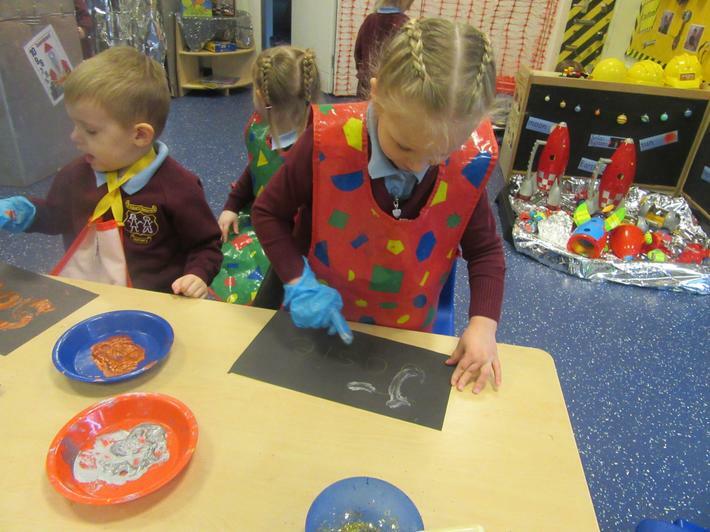 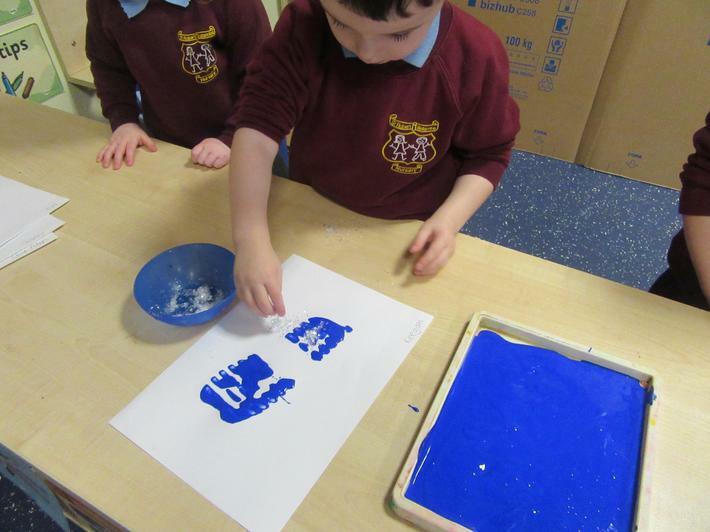 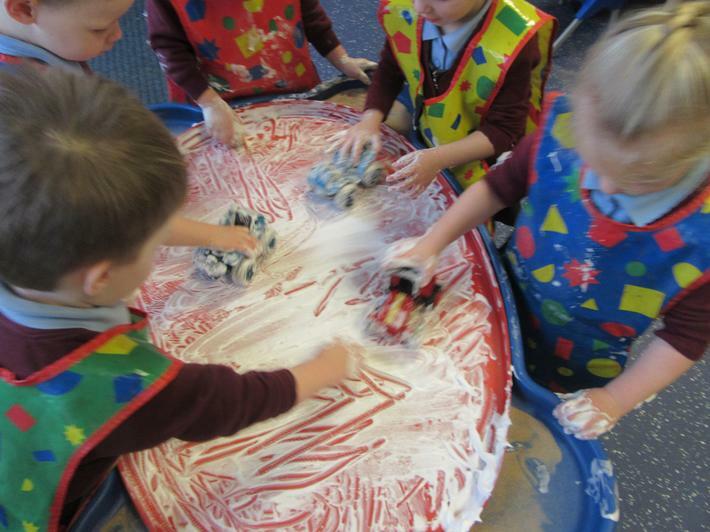 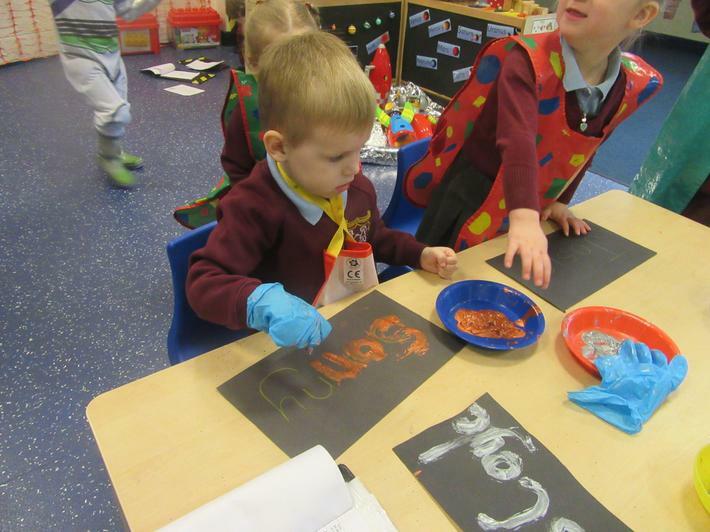 We made welly prints to represent footprints in the snow, played in pretend snow, talked about and looked at ice, compared and sorted winter objects, made tracks in the snow and dressed up for role play in our Winter Wonderland area. 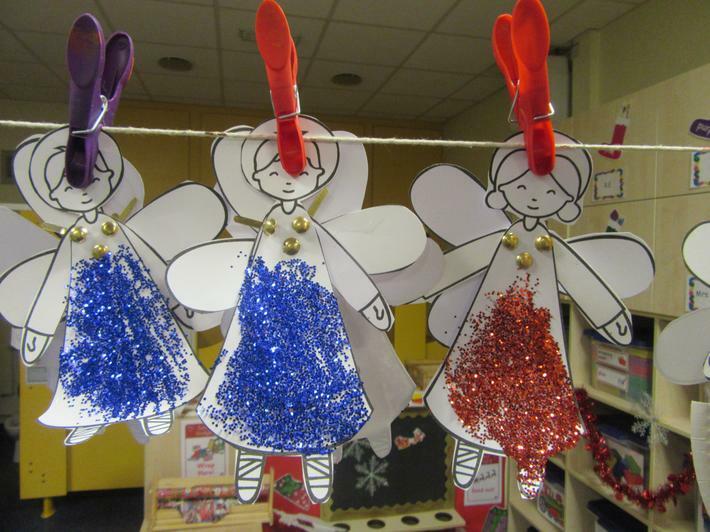 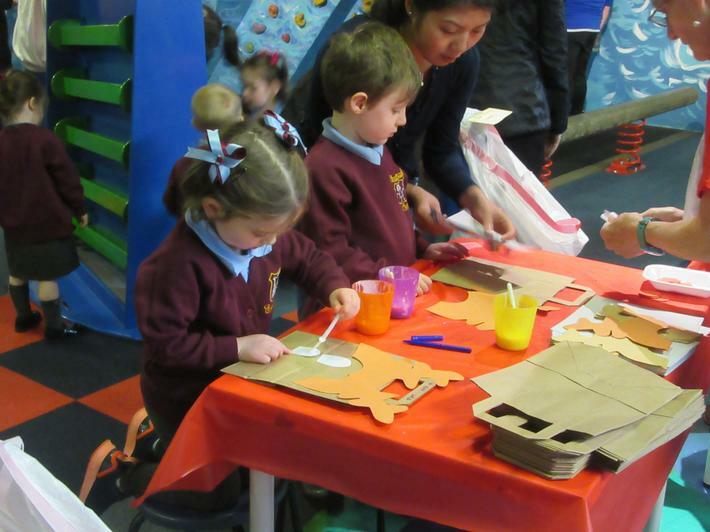 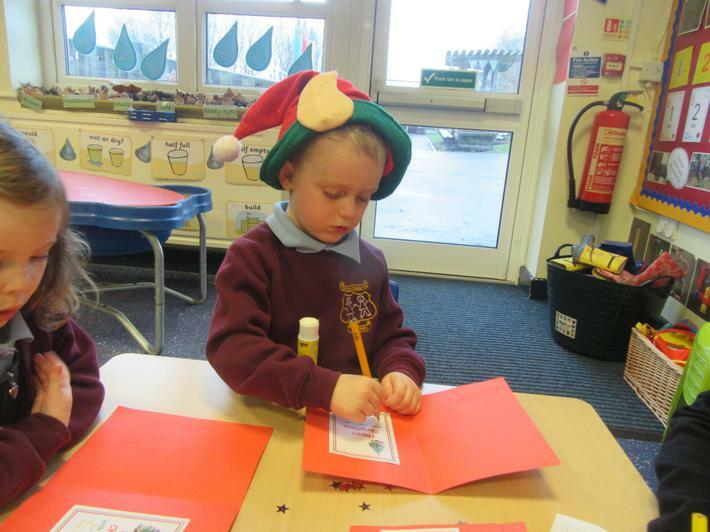 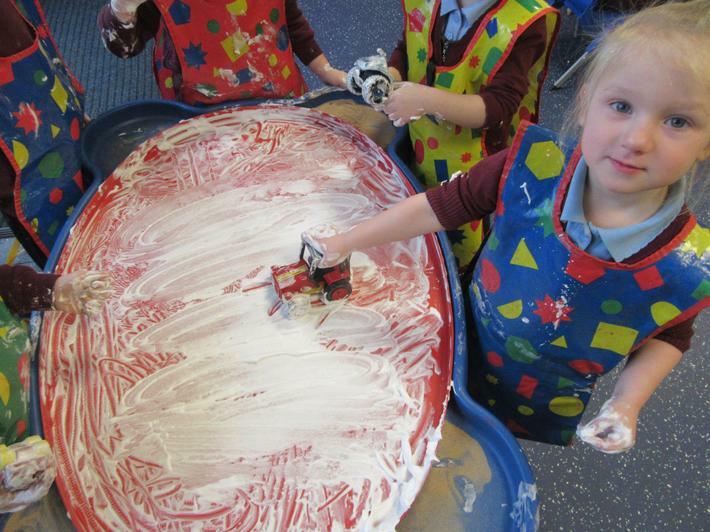 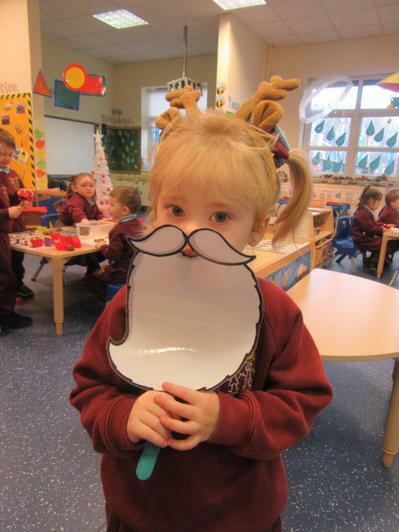 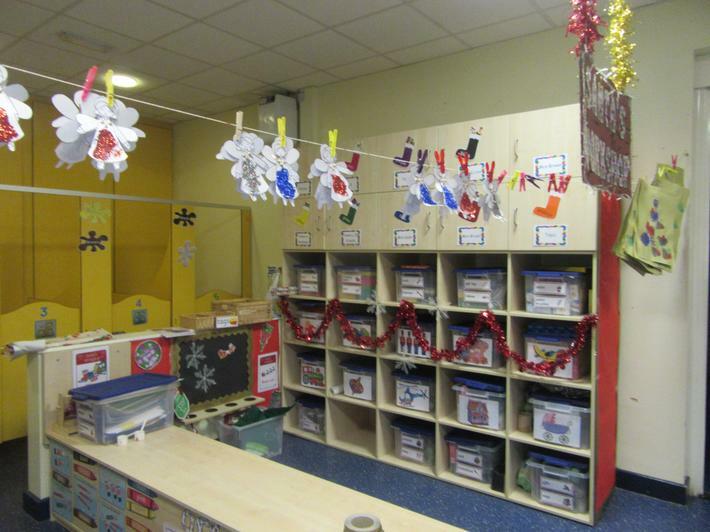 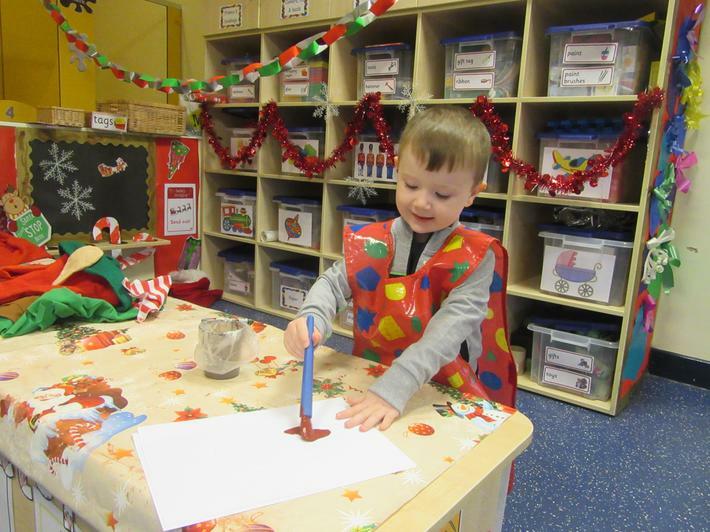 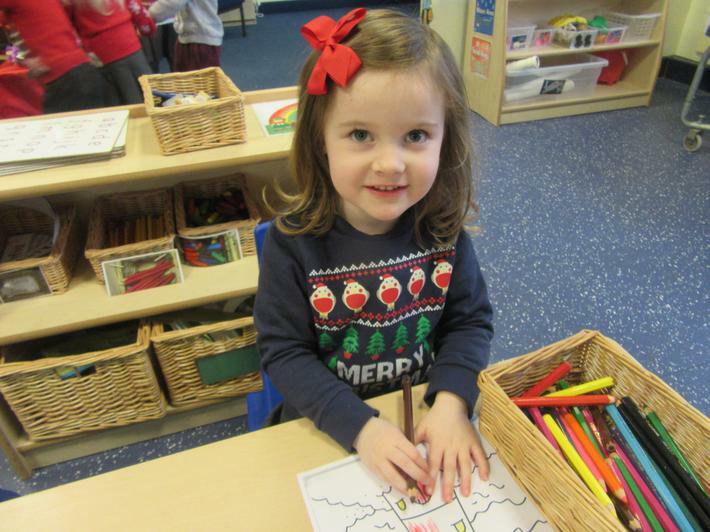 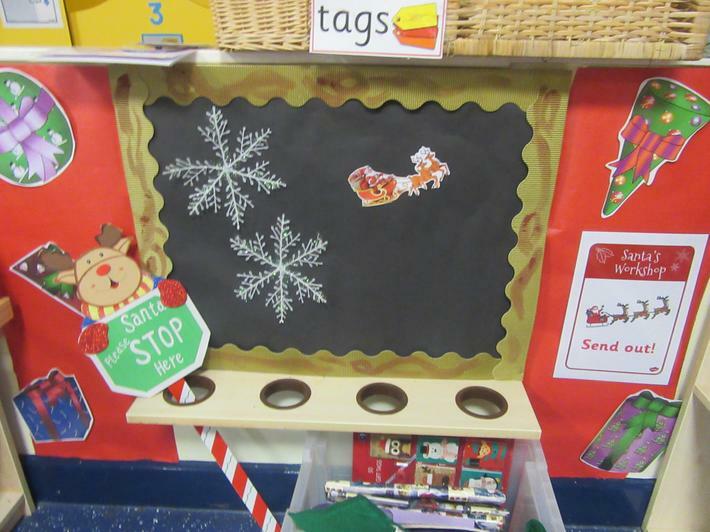 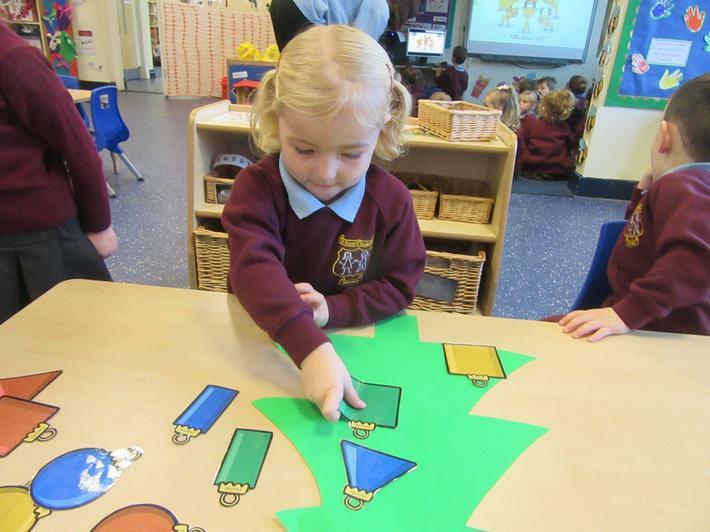 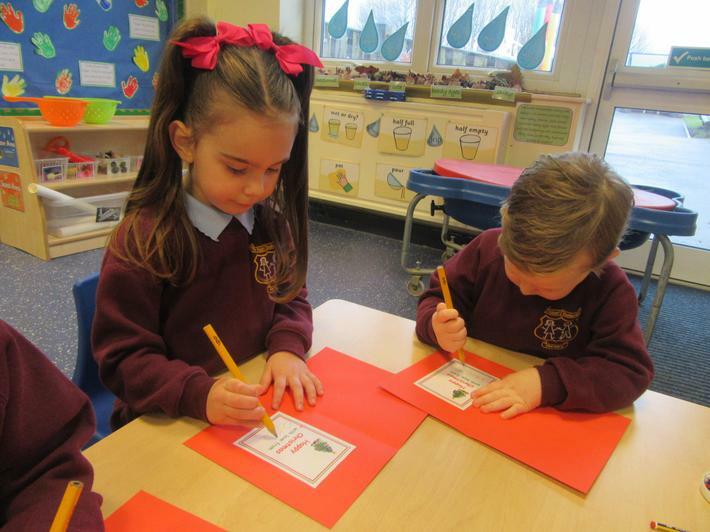 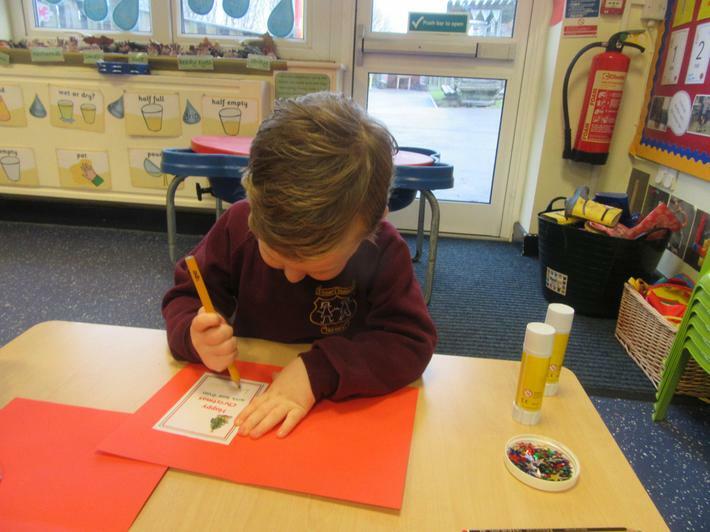 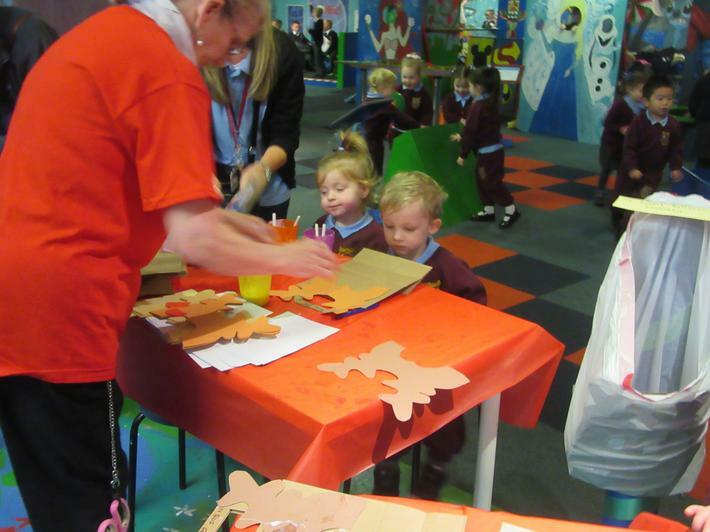 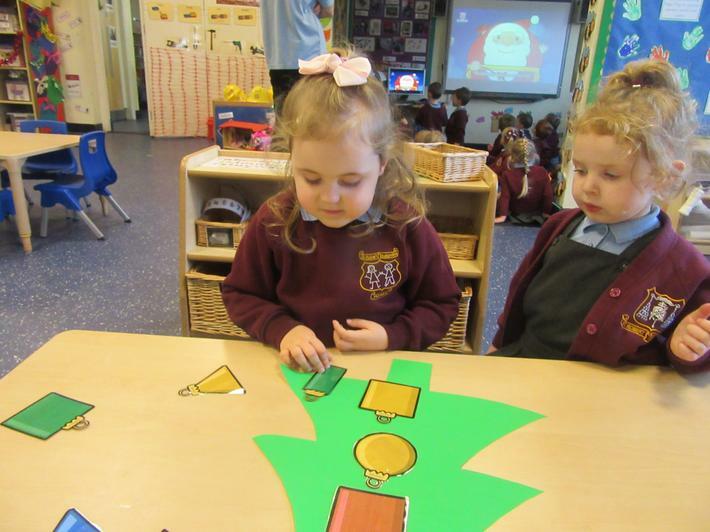 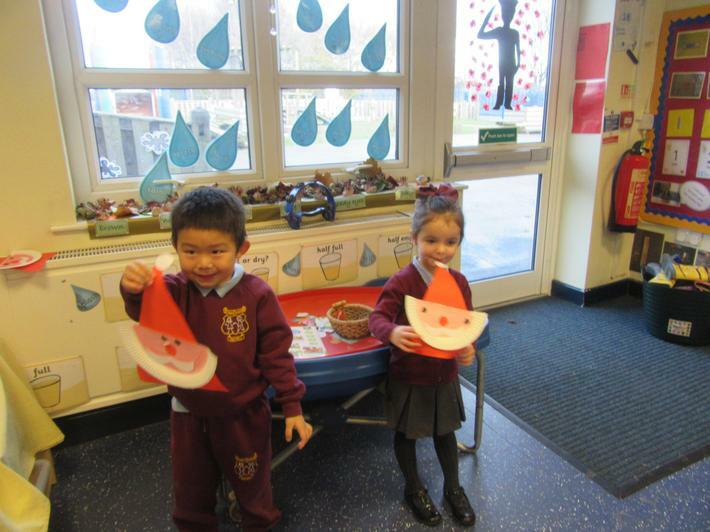 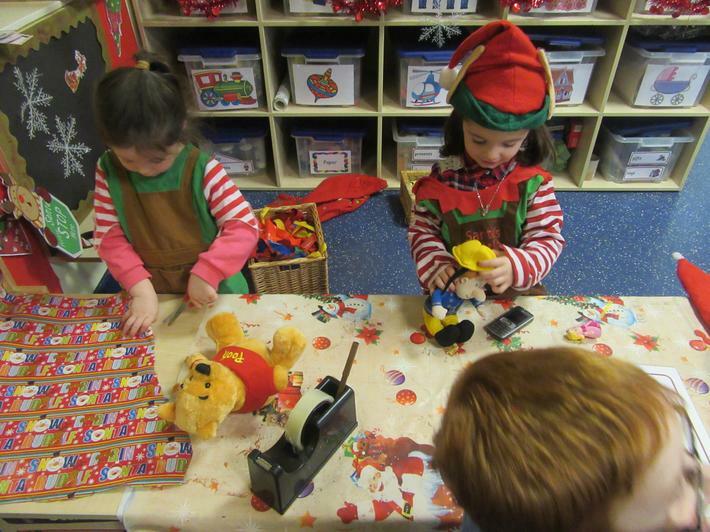 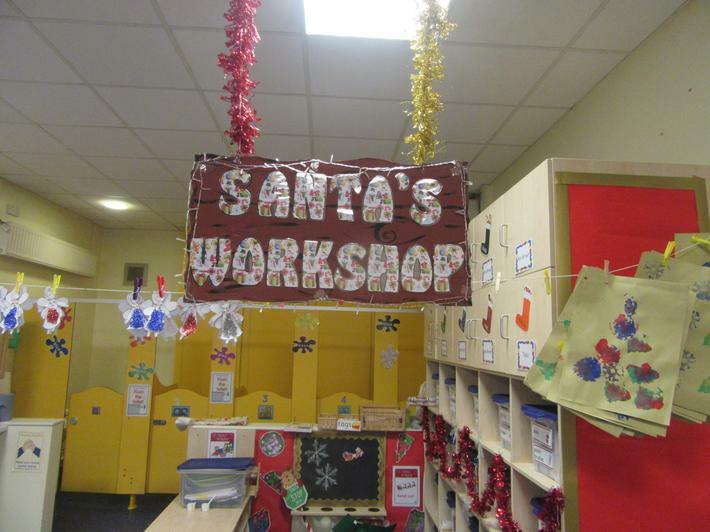 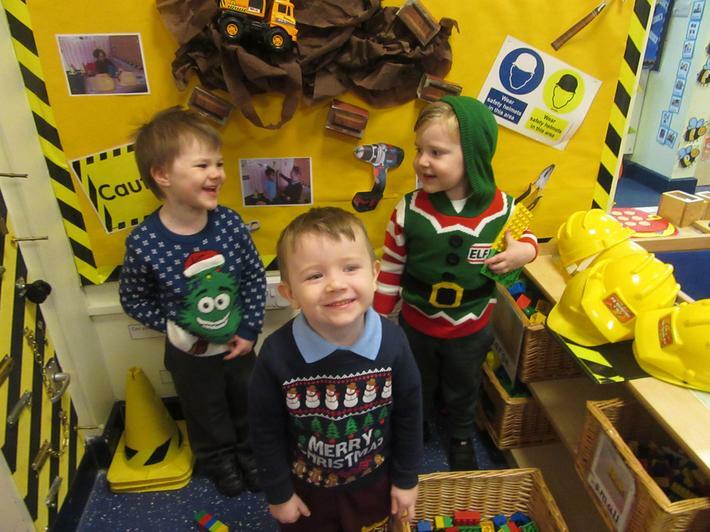 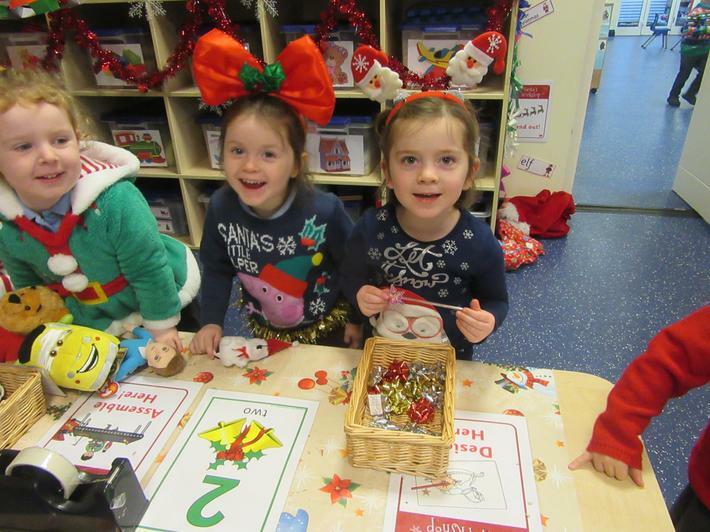 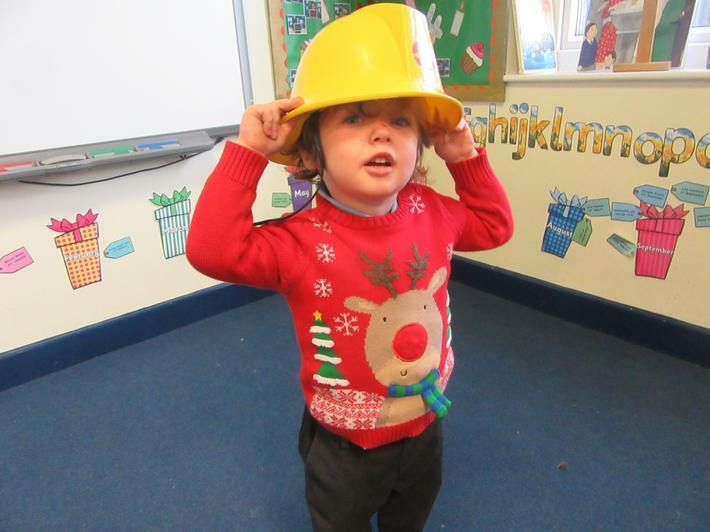 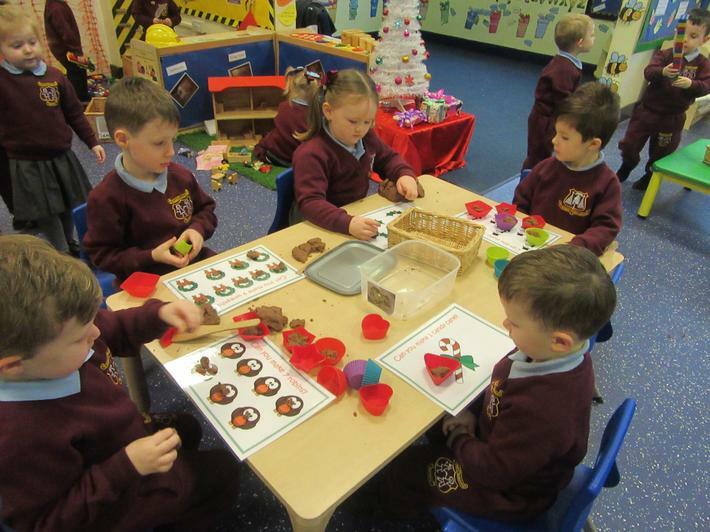 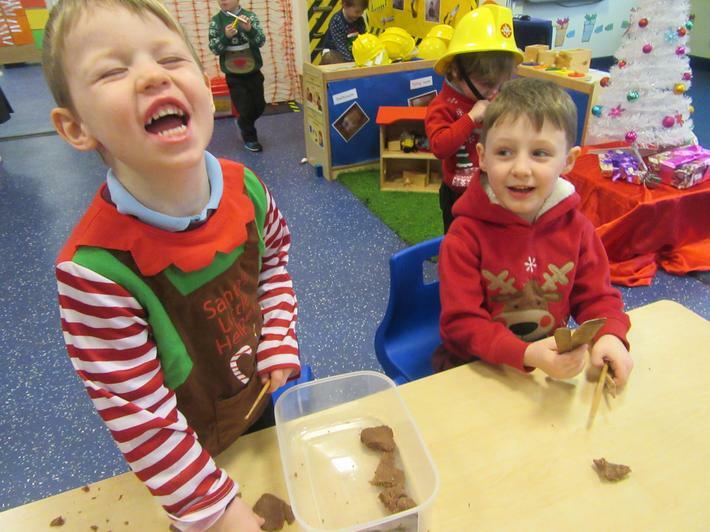 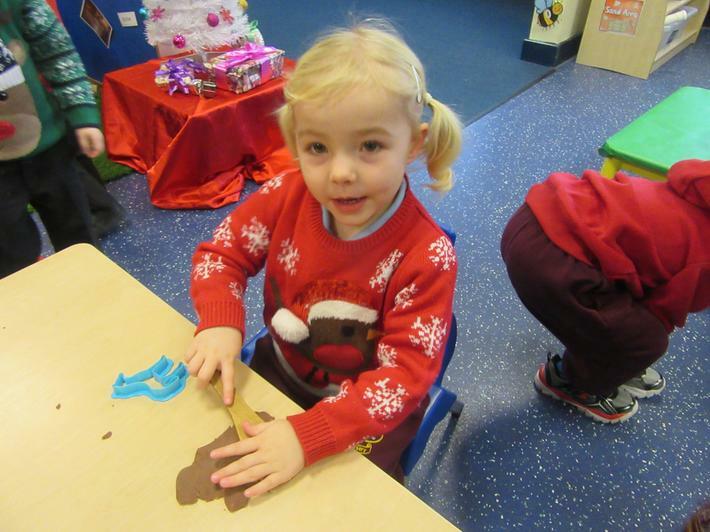 Look at all the Christmas activities we have enjoyed in Nursery!! 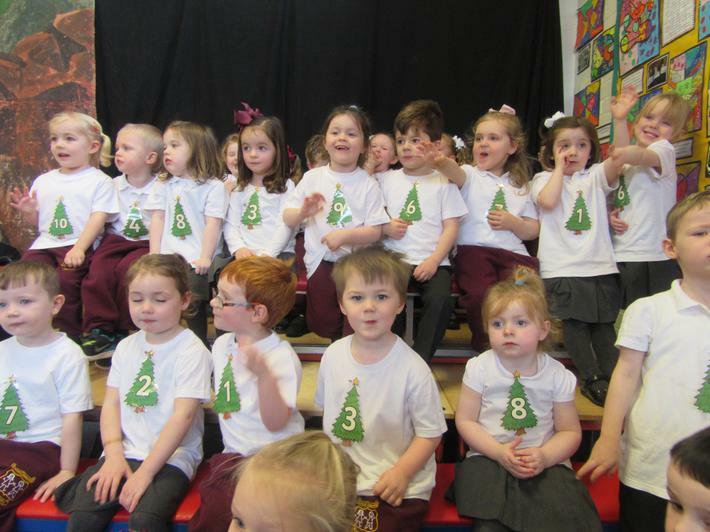 We would like to wish all our families and friends a merry Christmas and a very happy and healthy New Year!! 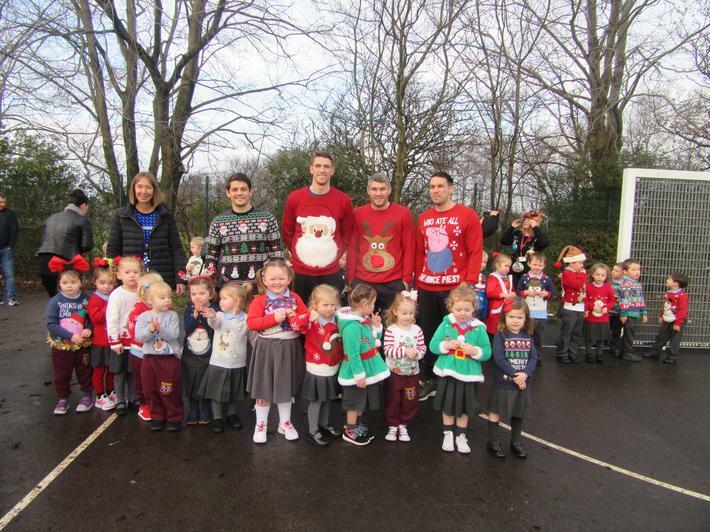 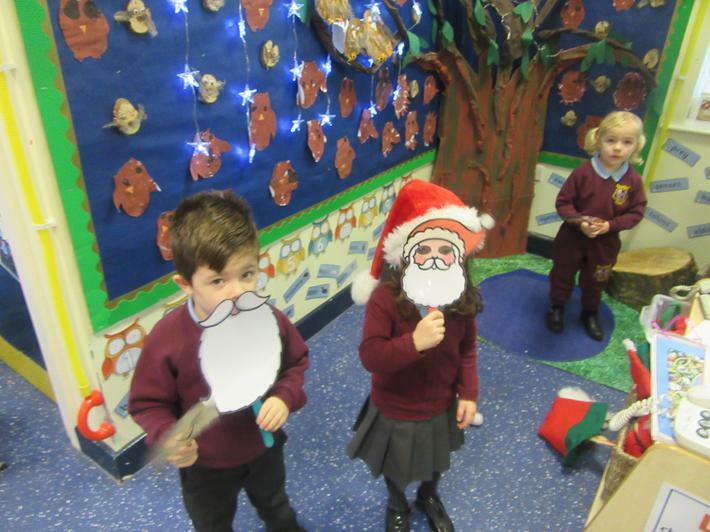 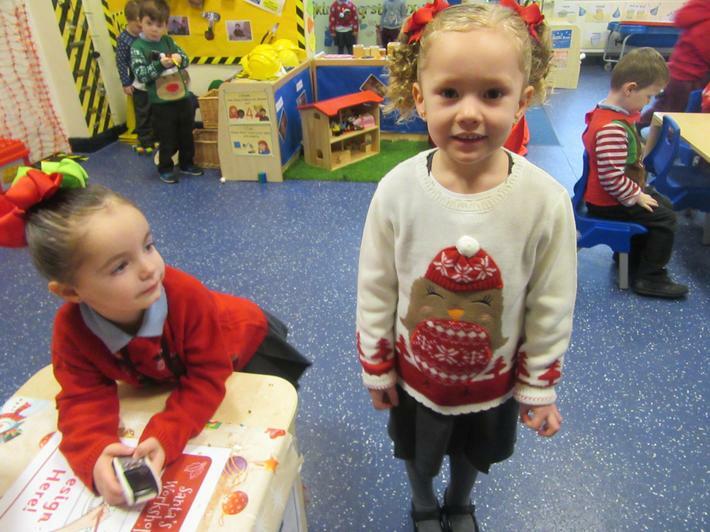 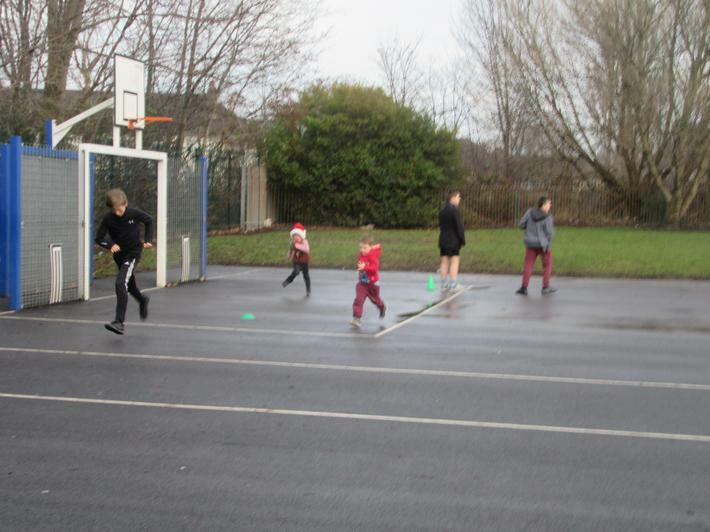 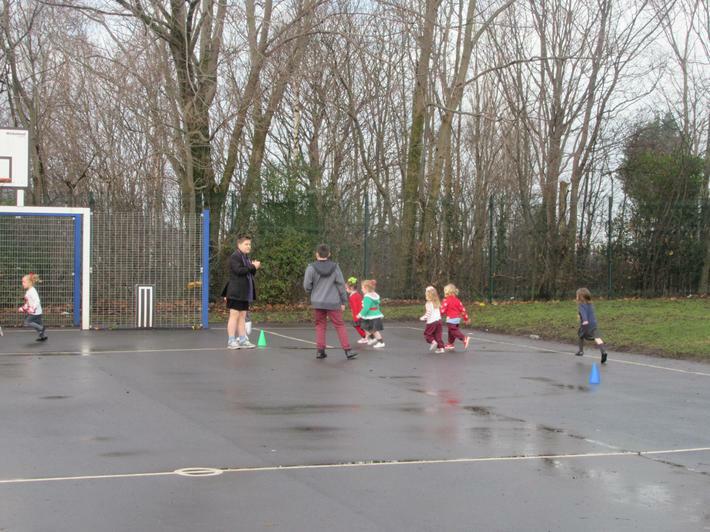 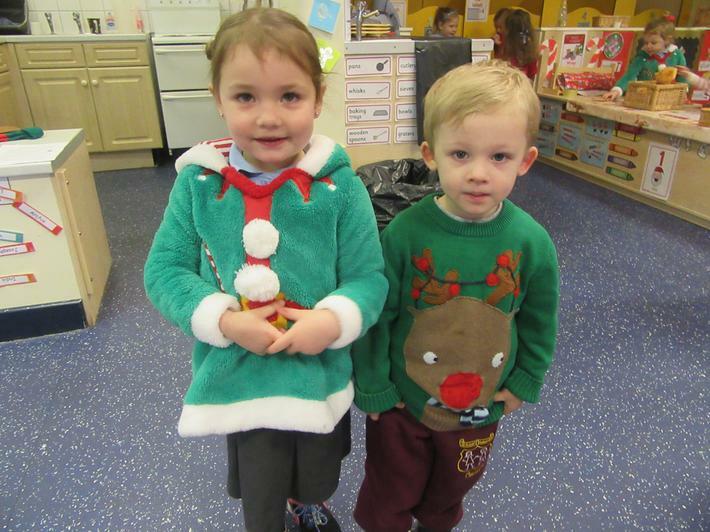 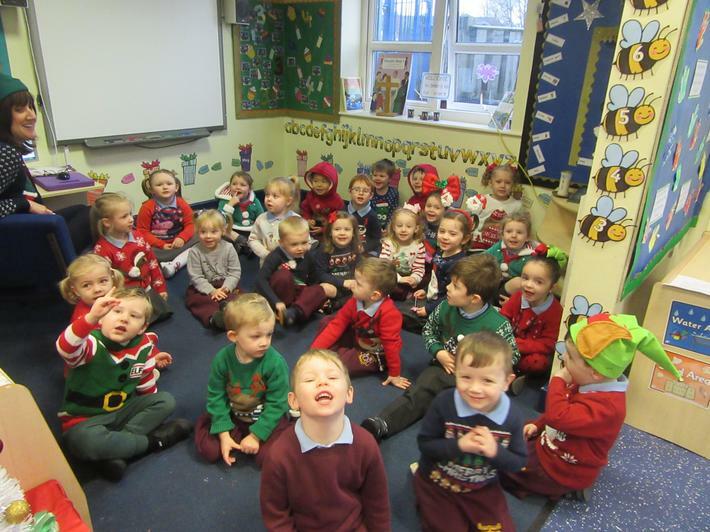 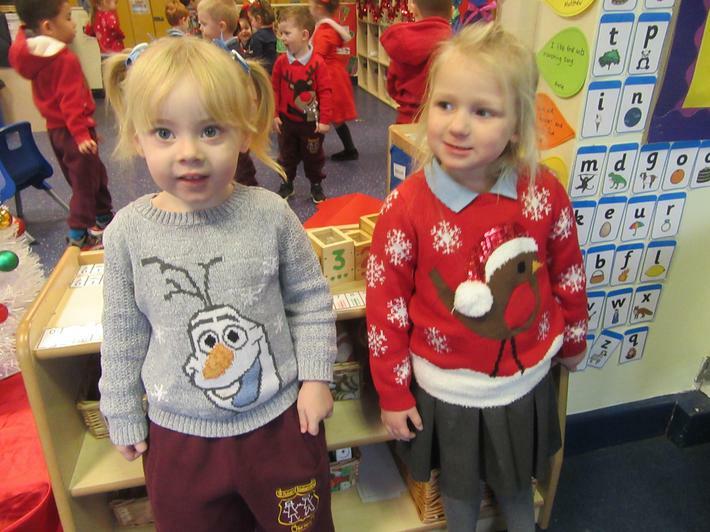 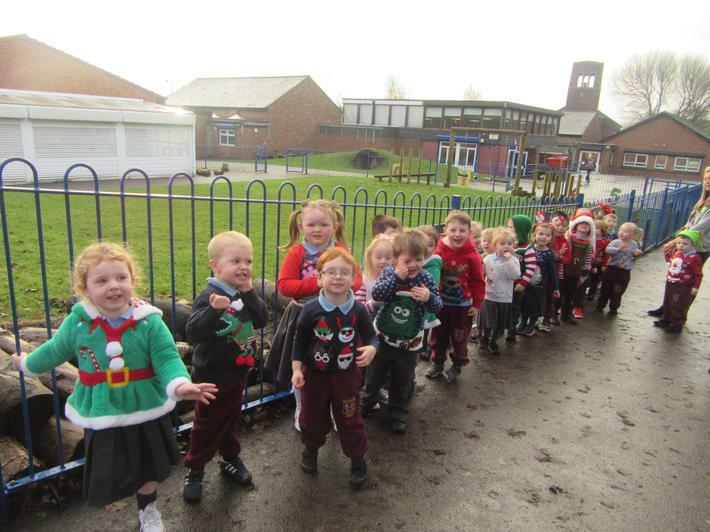 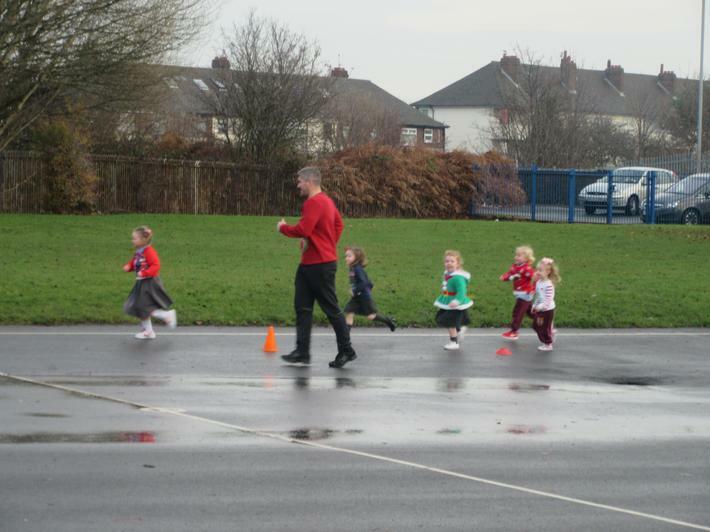 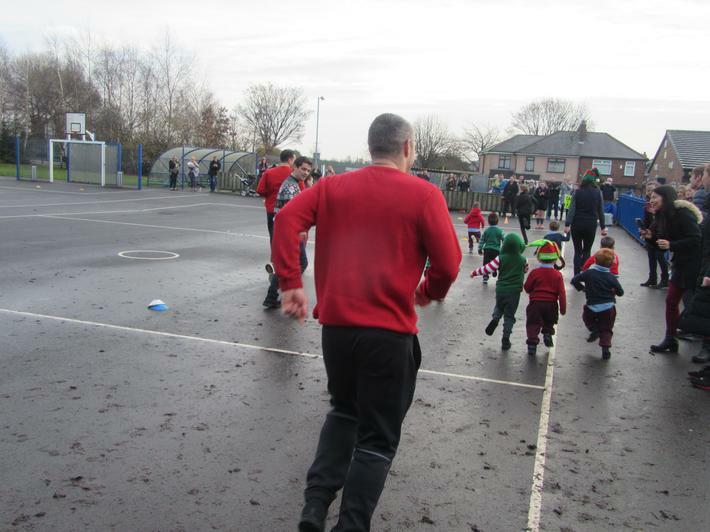 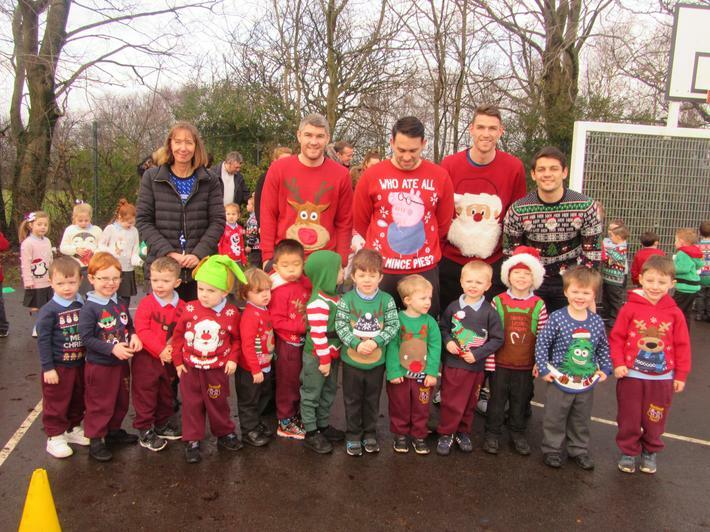 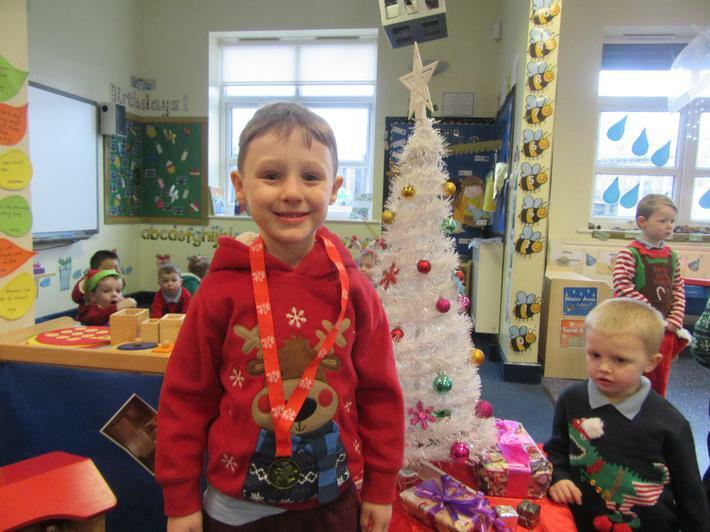 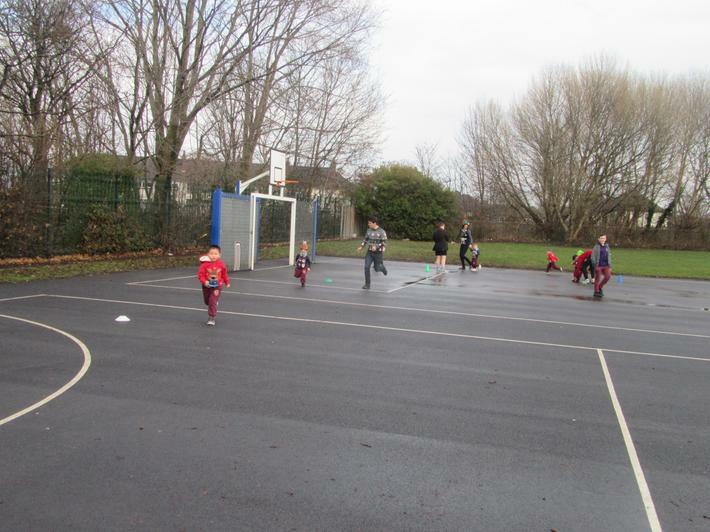 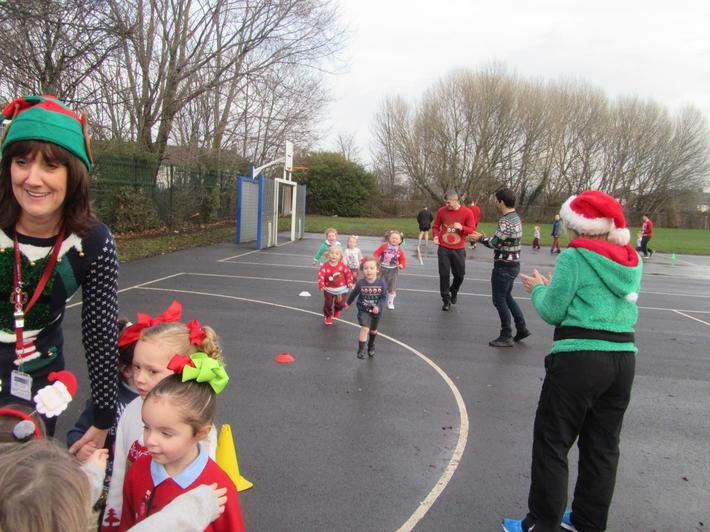 Santa Dash and Christmas Jumper Day - We thoroughly enjoyed our Santa dash. 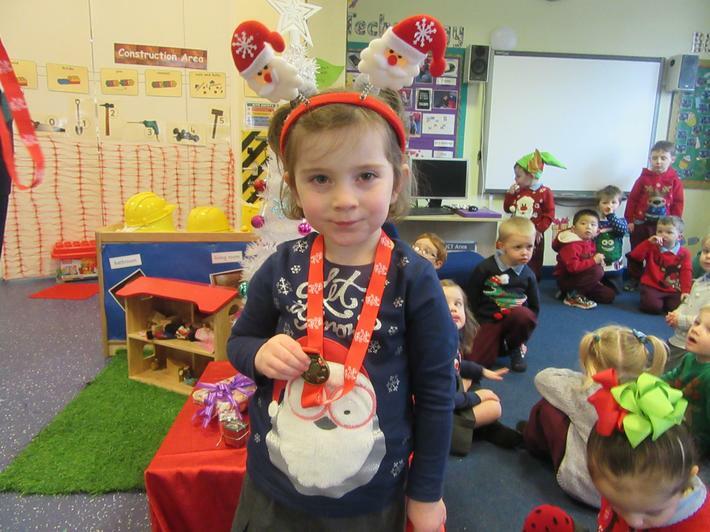 Each year group took part and the 1st placed girls and boys were awarded a Santa dash medal. 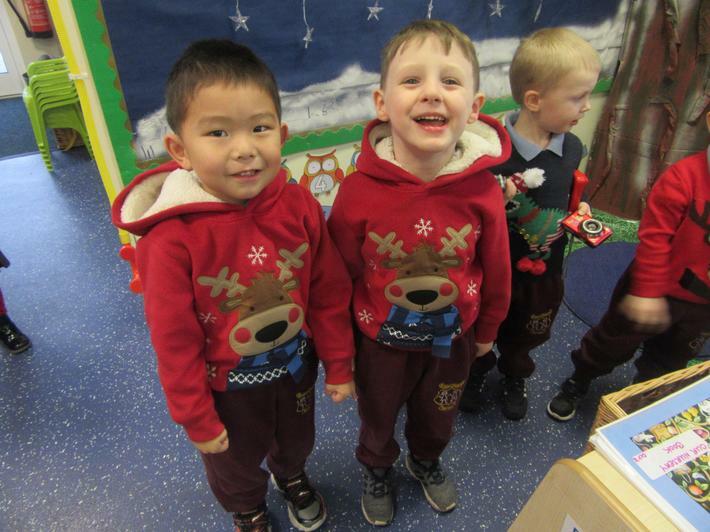 The Smith brothers very kindly opened each race and joined in wearing their Christmas jumpers! 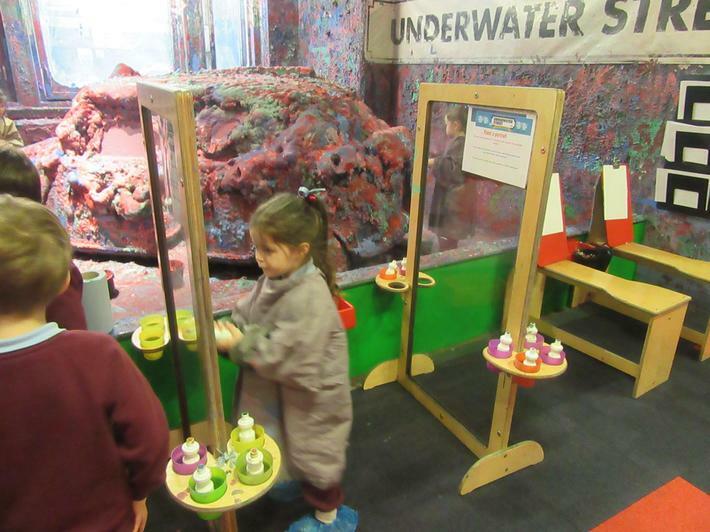 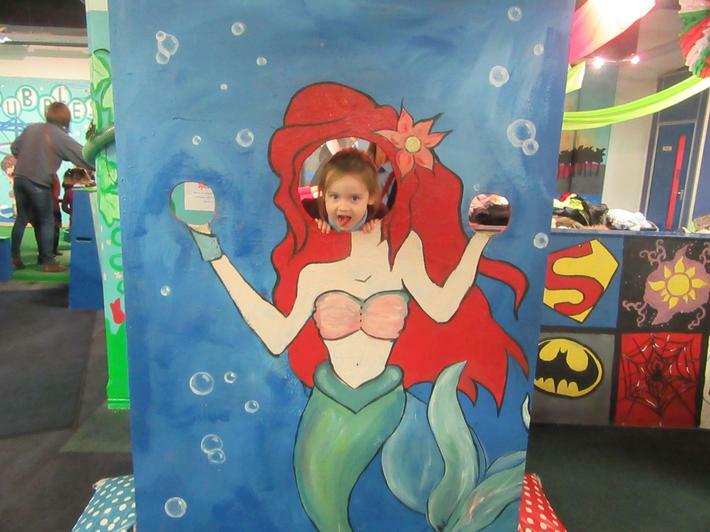 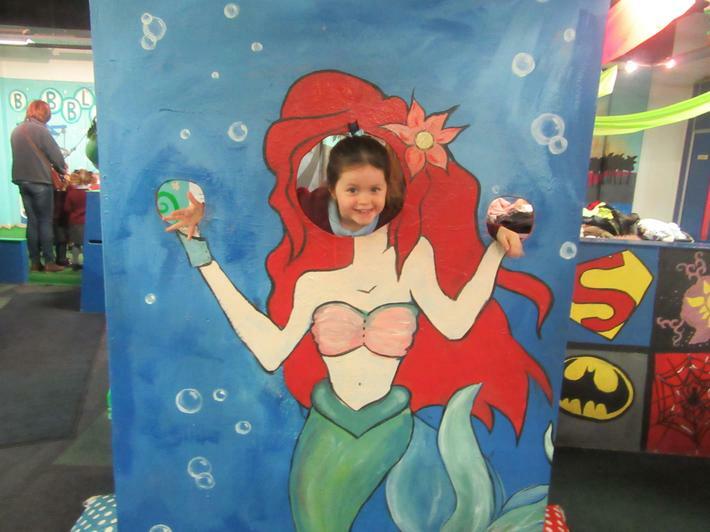 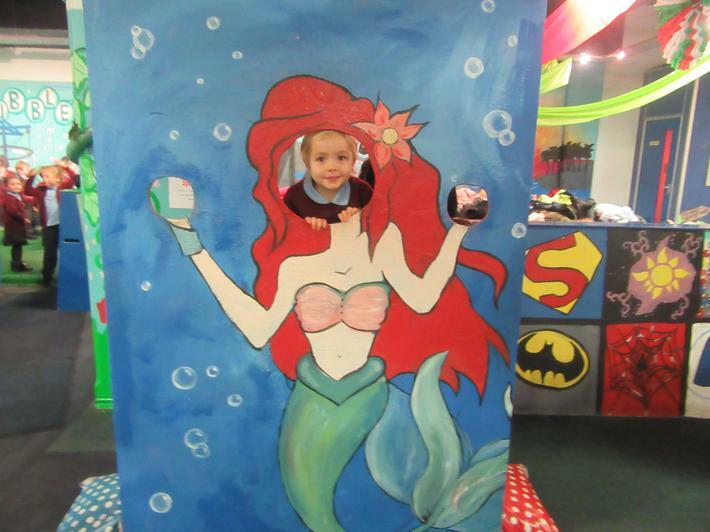 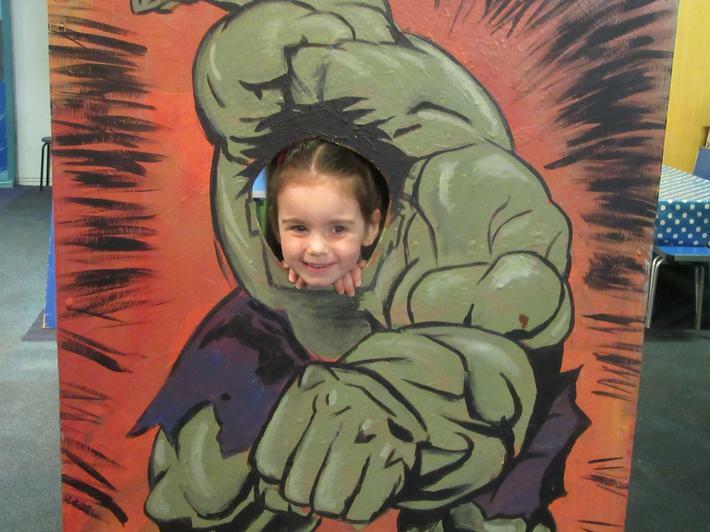 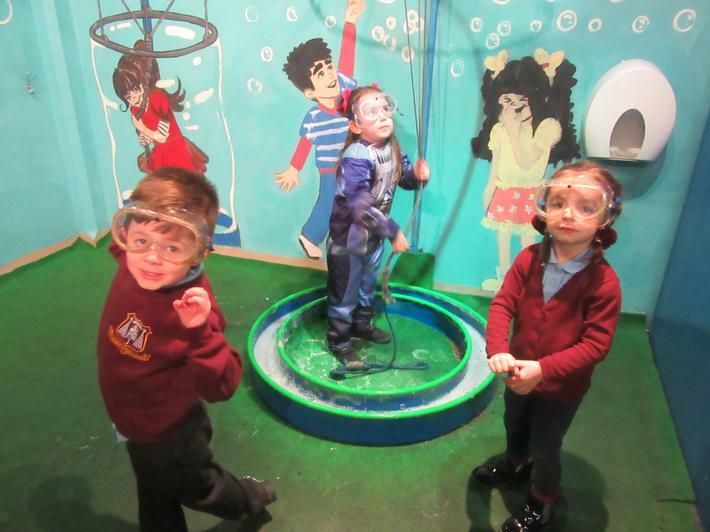 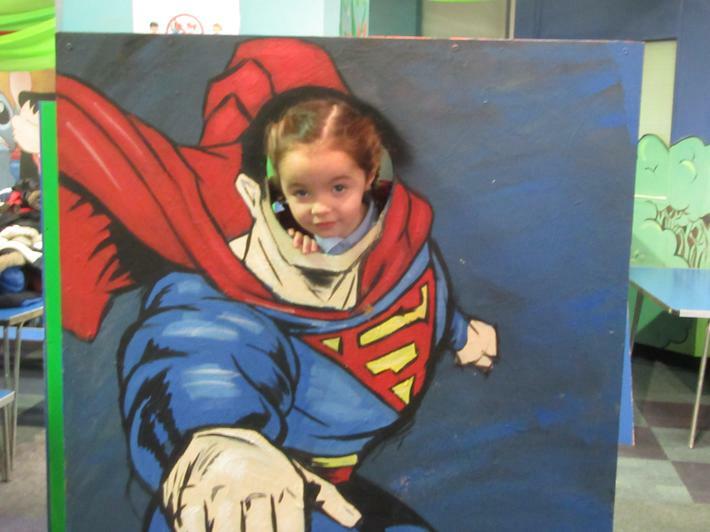 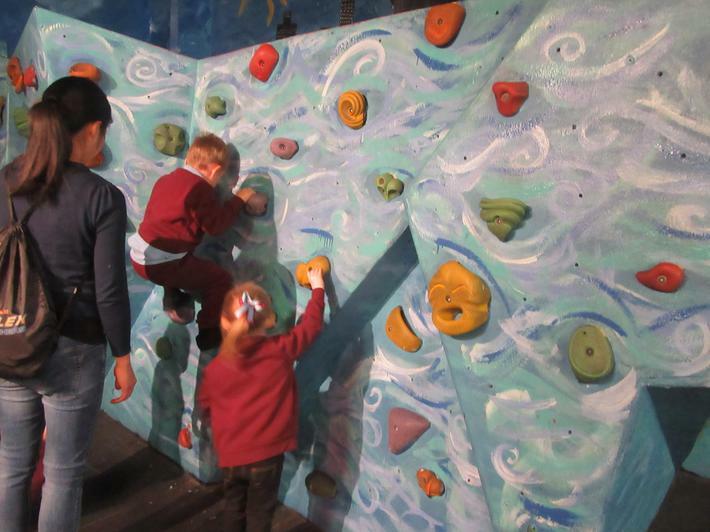 Look what an amazing day we had at Underwater Street! 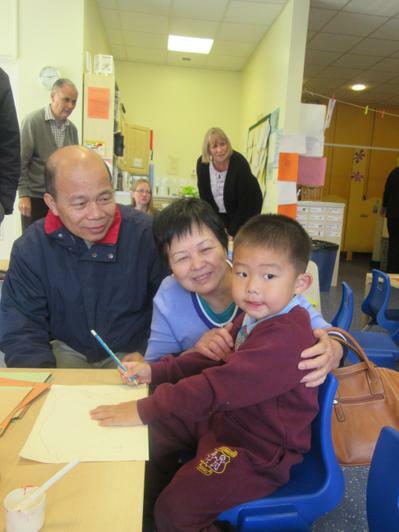 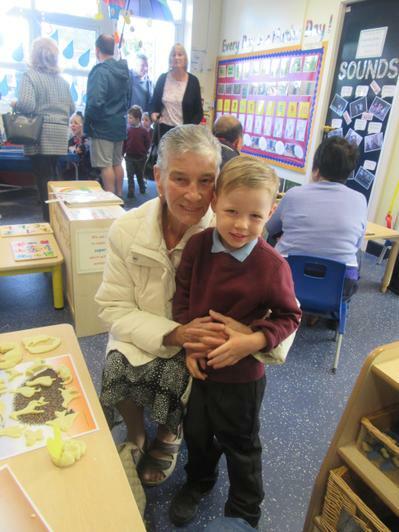 We had a special day to celebrate our grandparents. 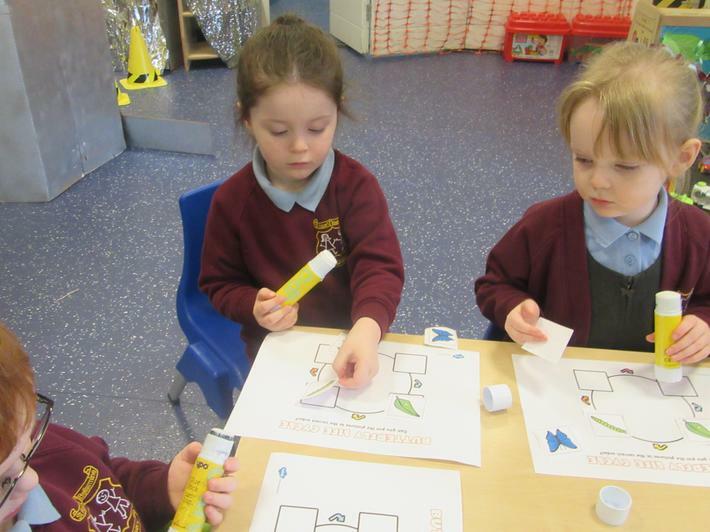 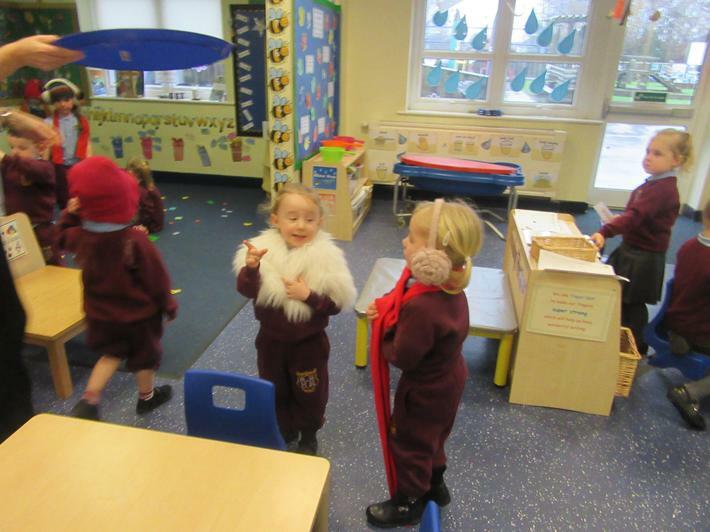 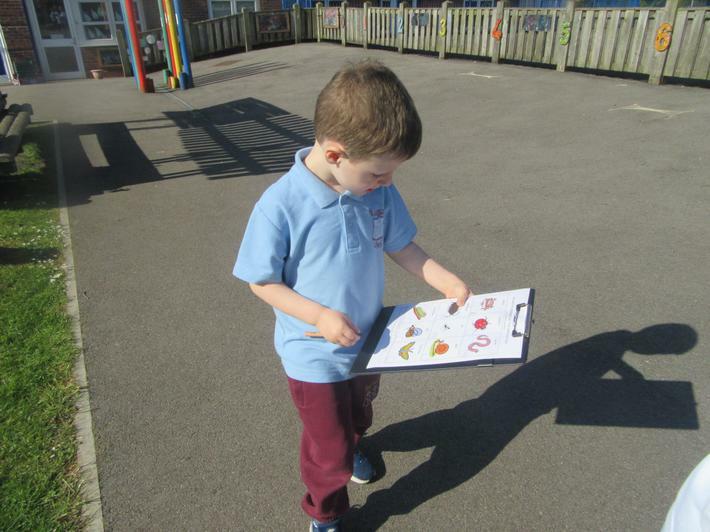 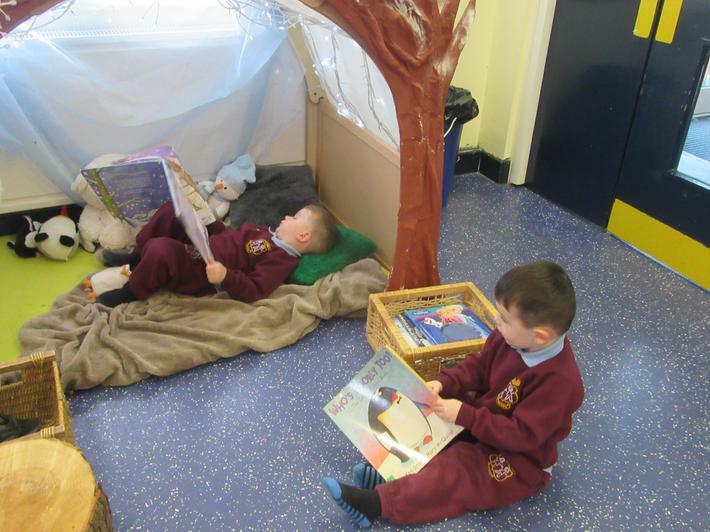 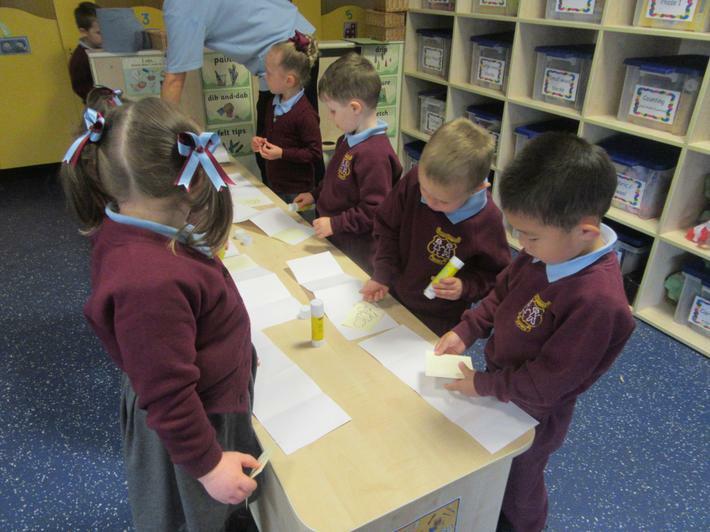 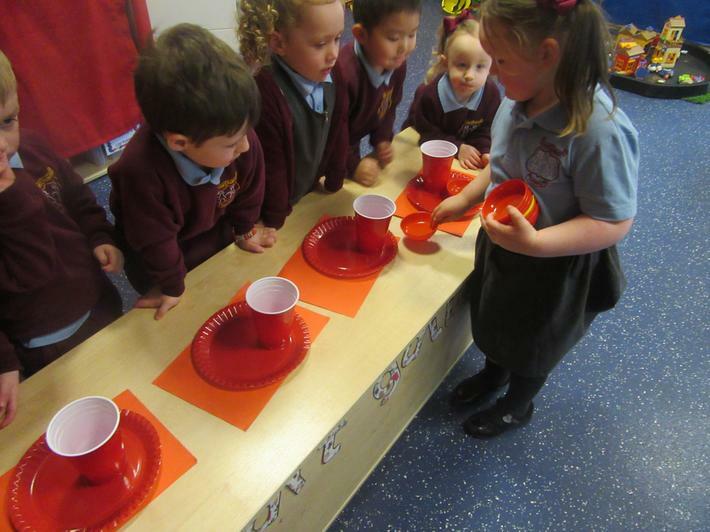 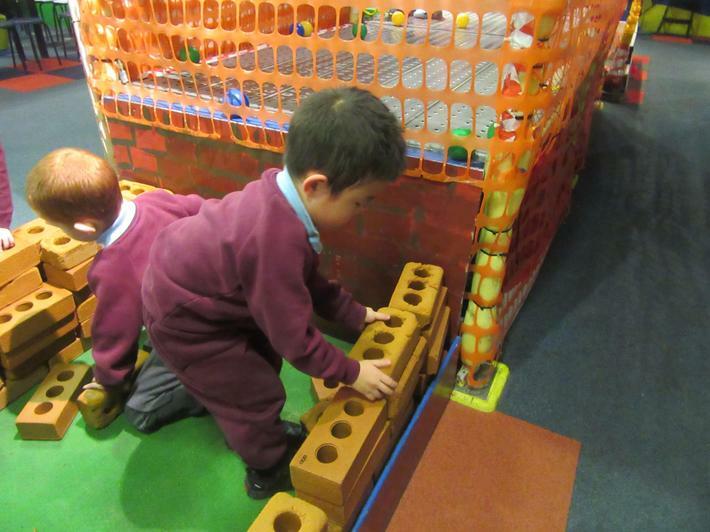 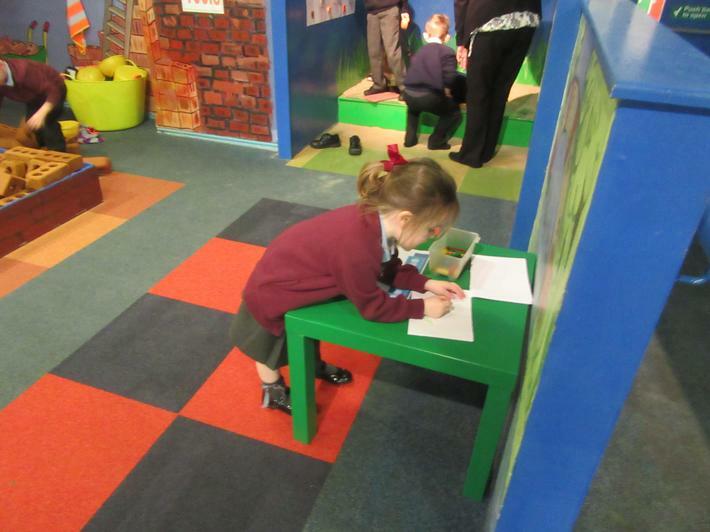 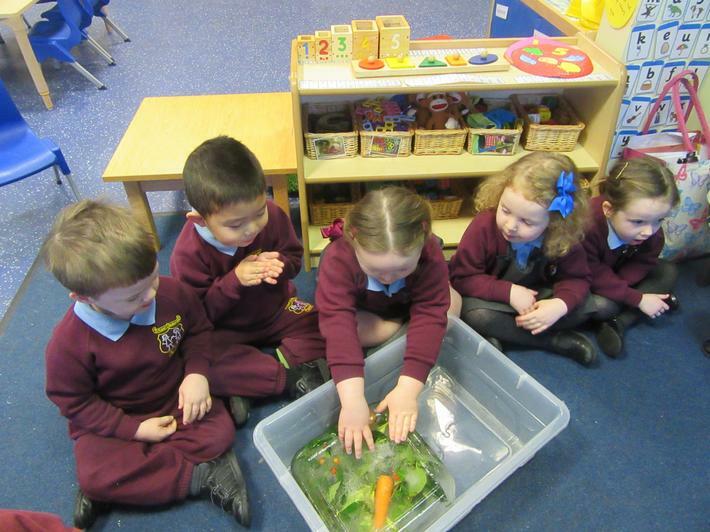 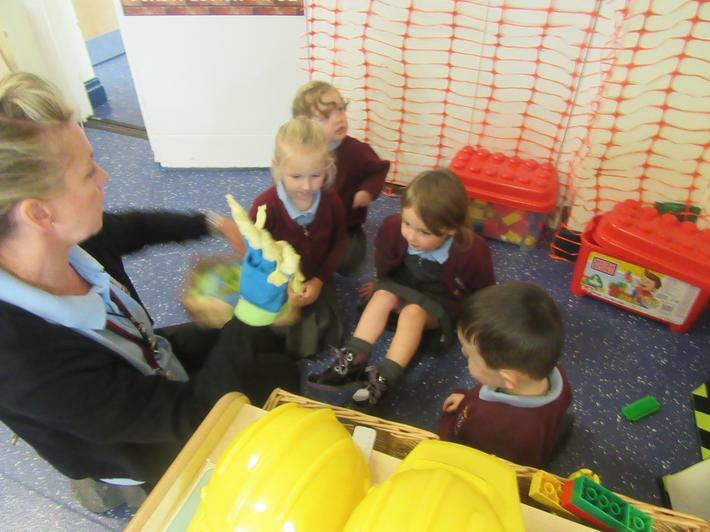 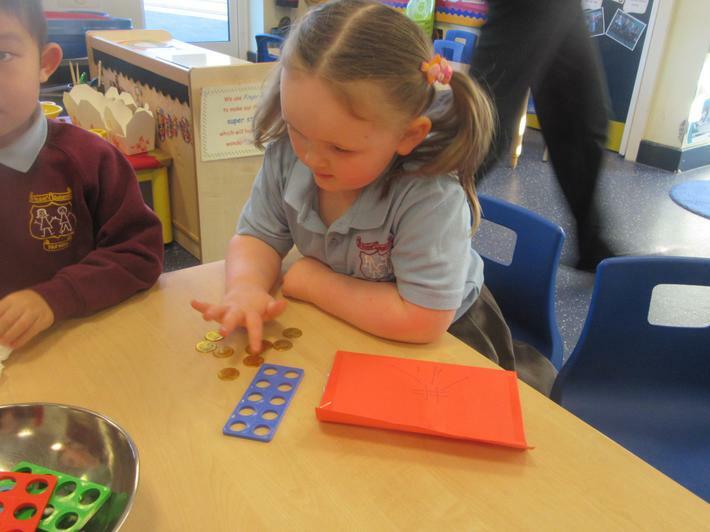 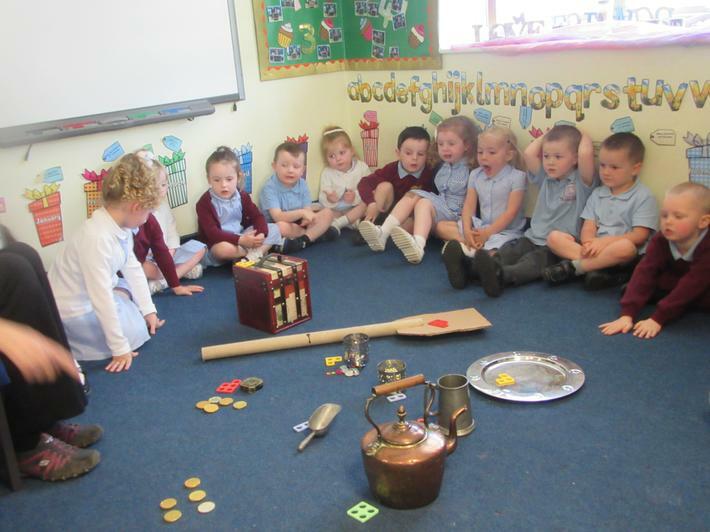 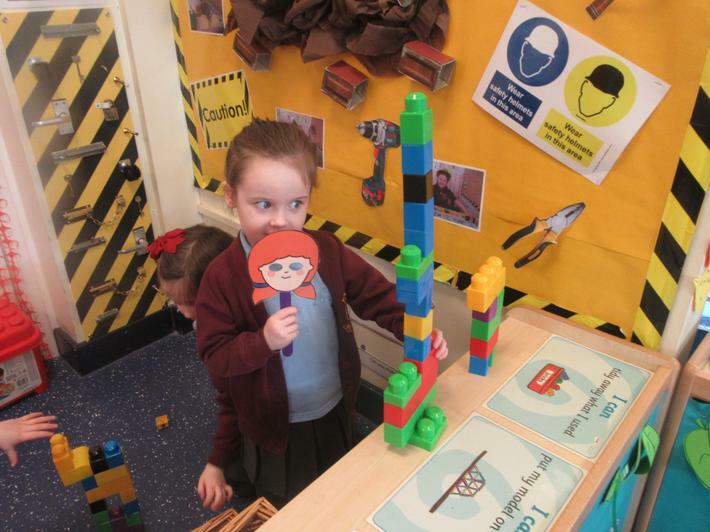 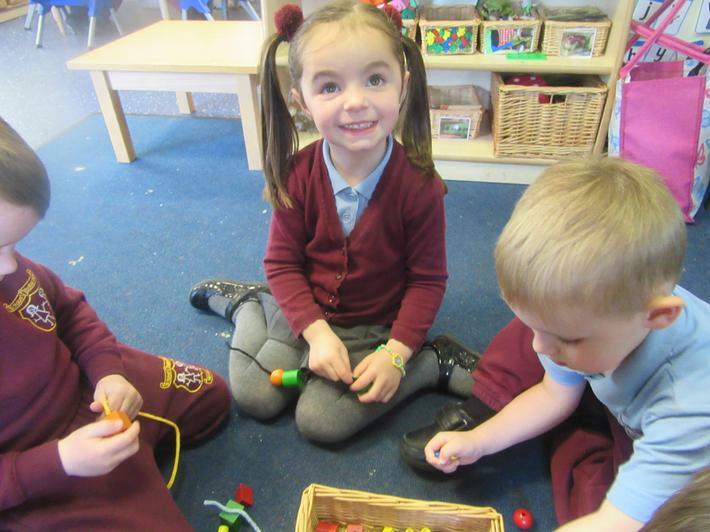 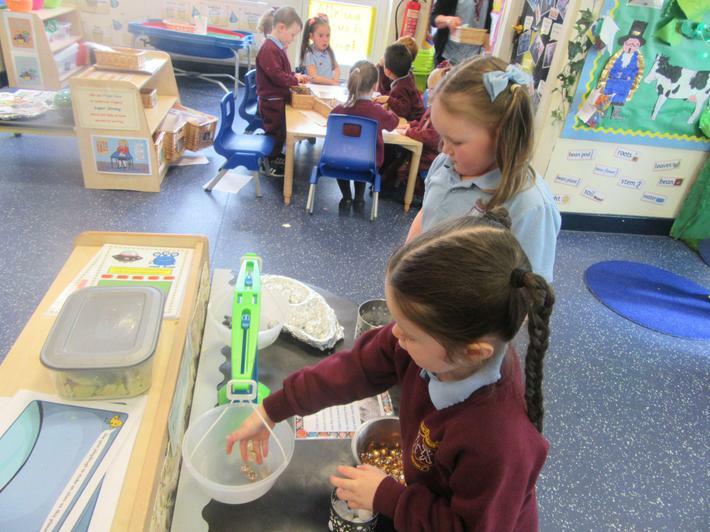 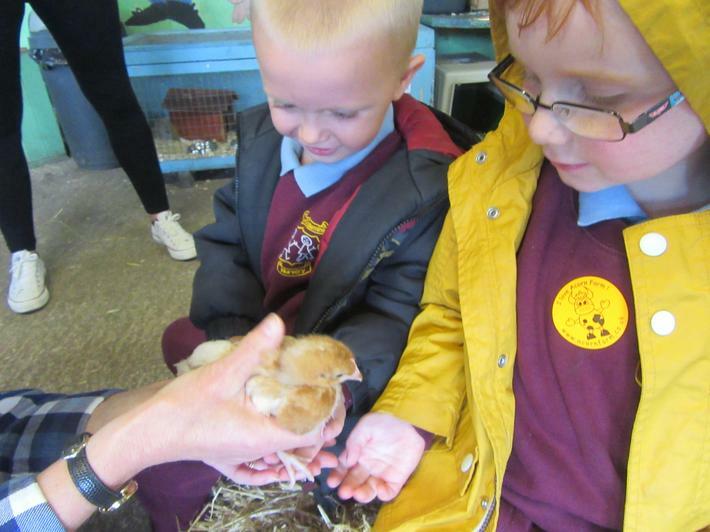 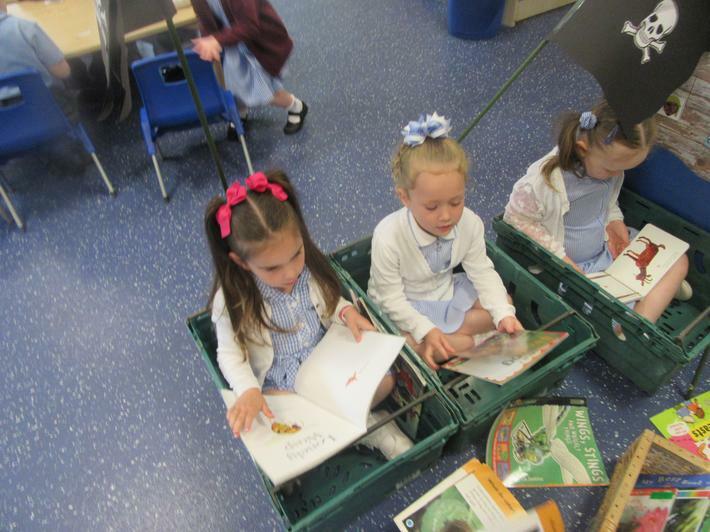 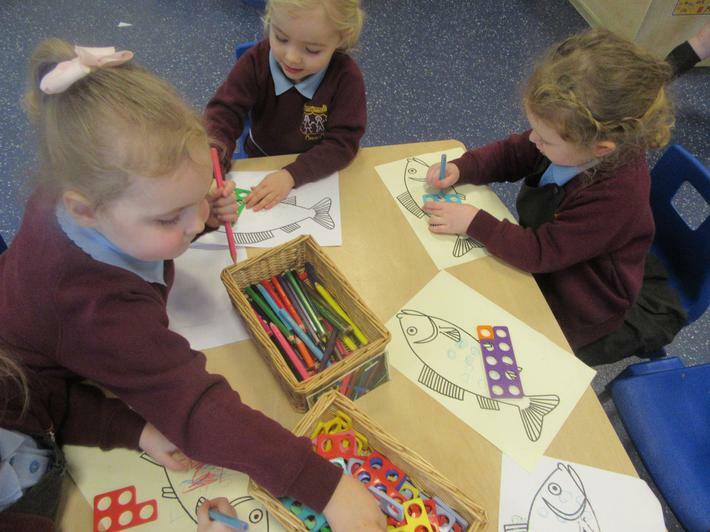 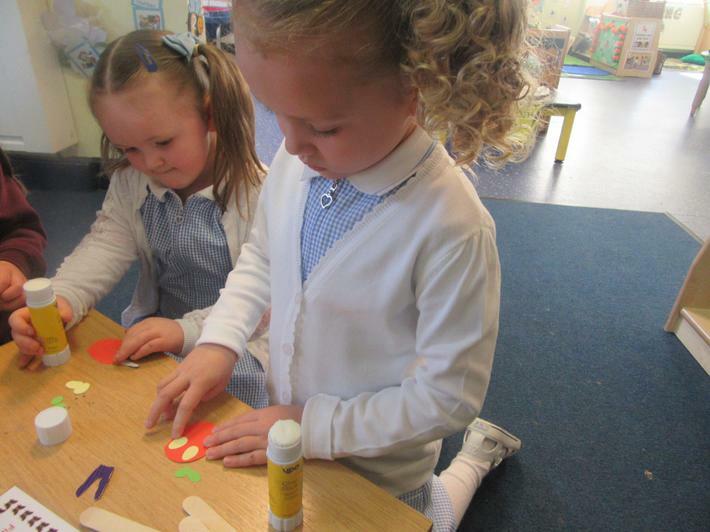 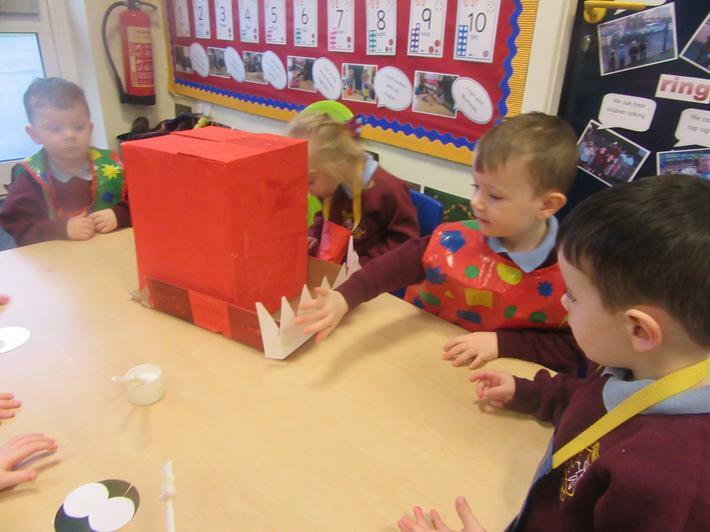 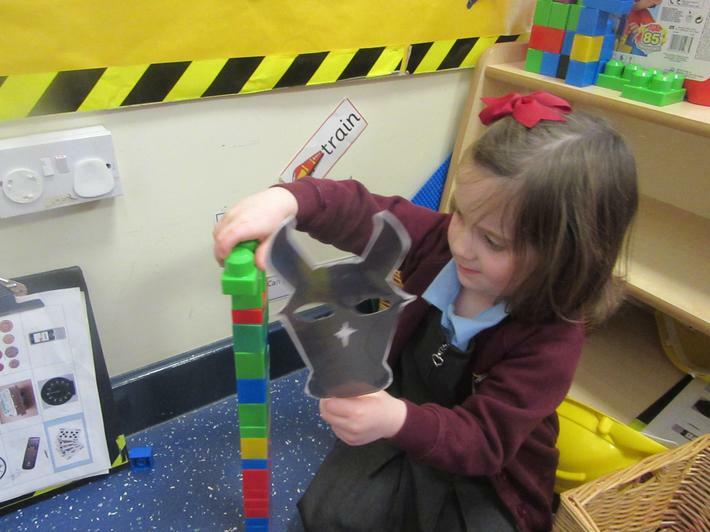 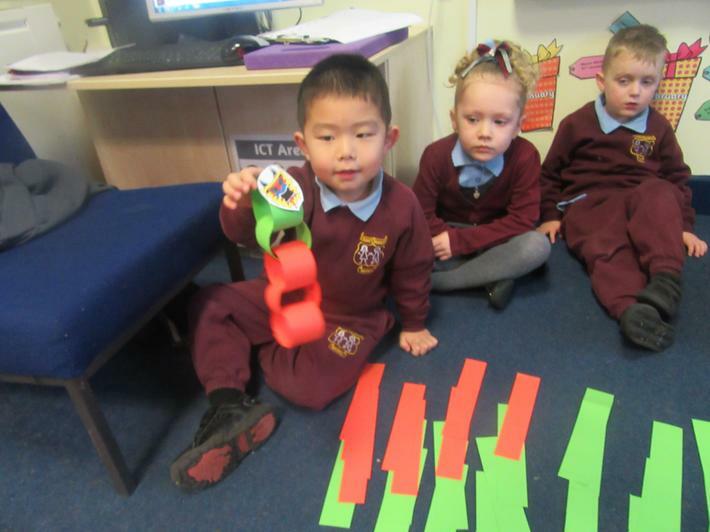 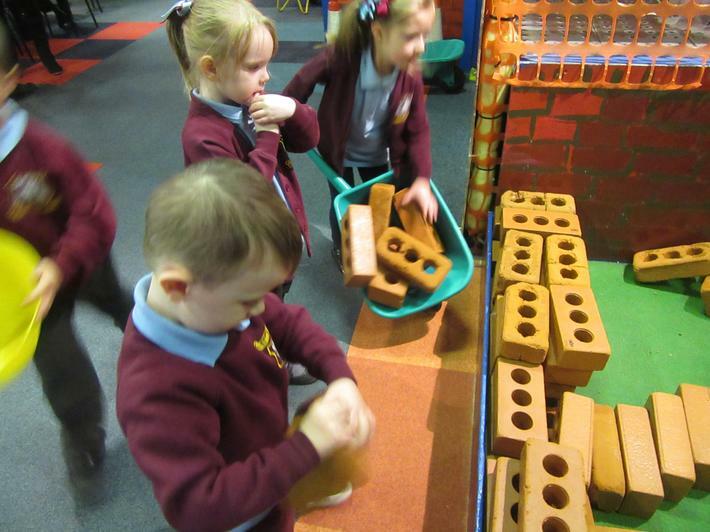 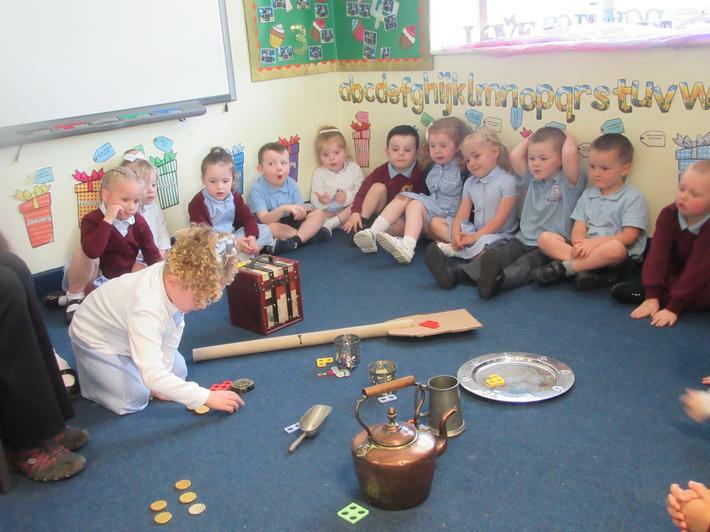 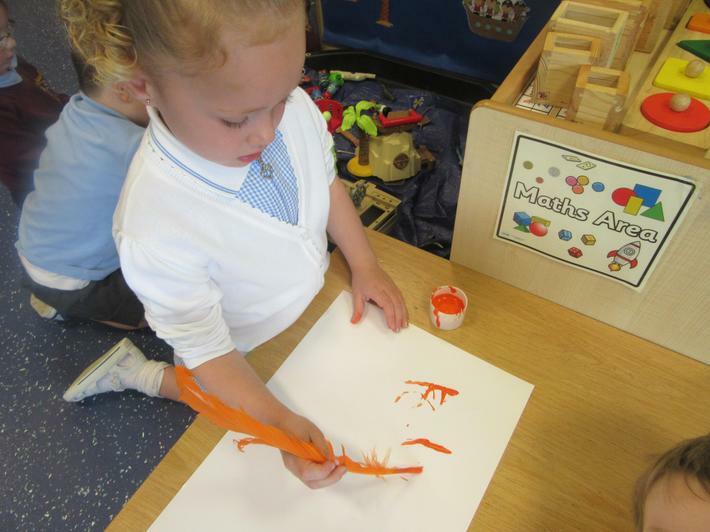 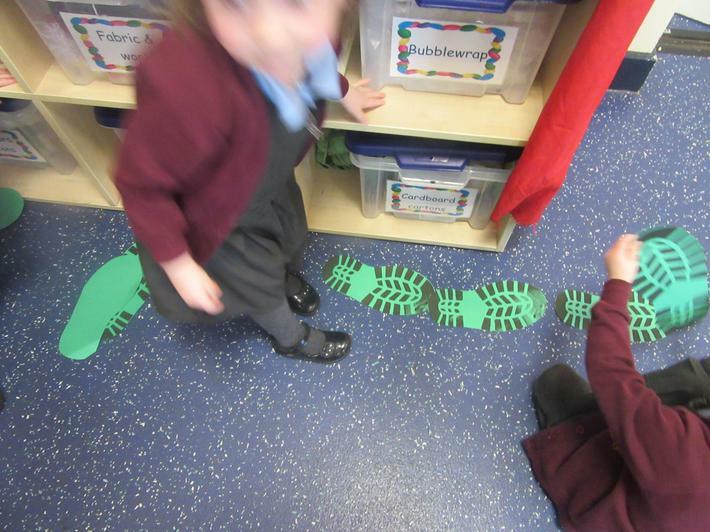 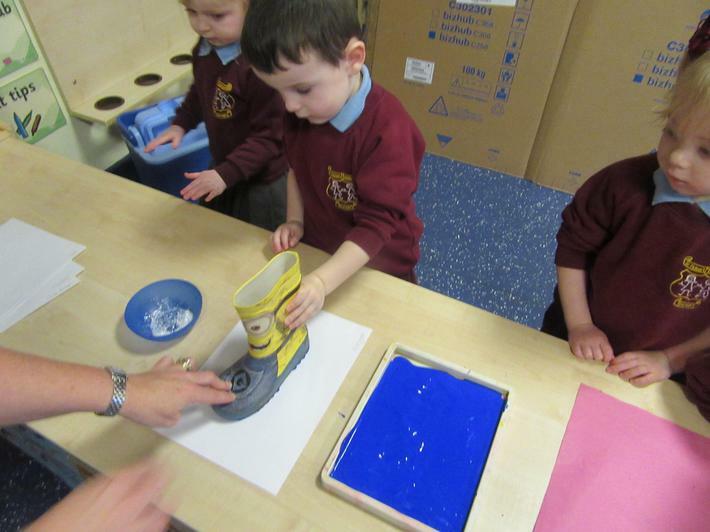 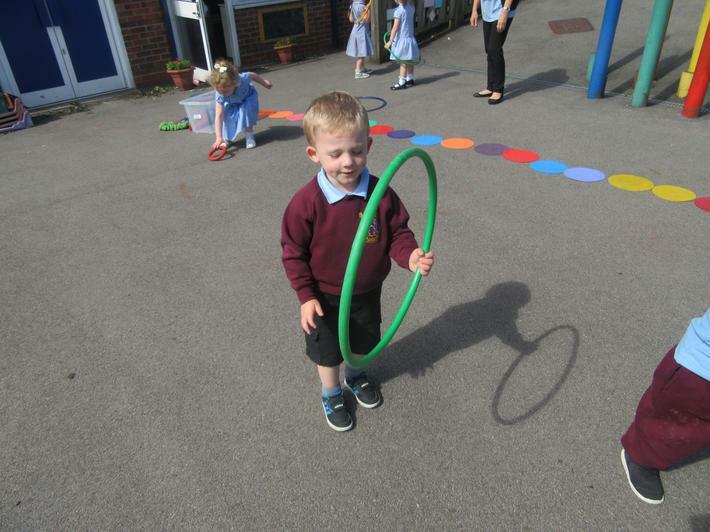 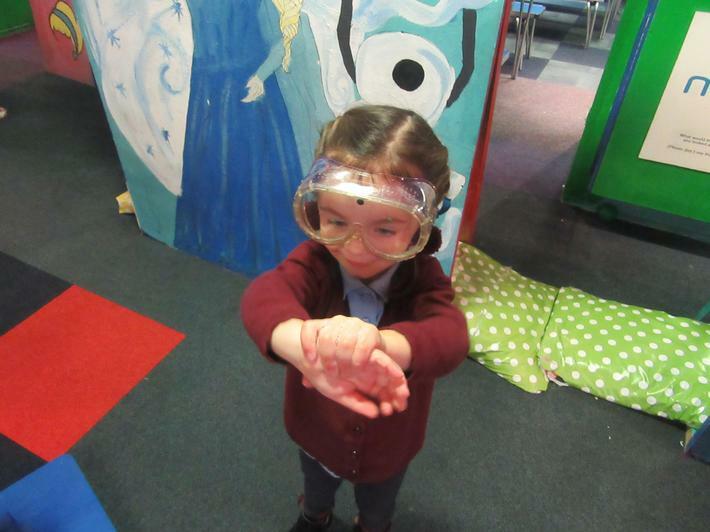 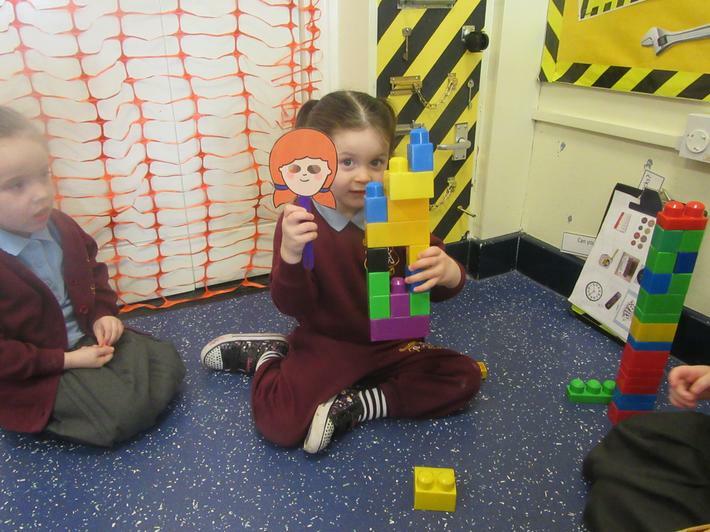 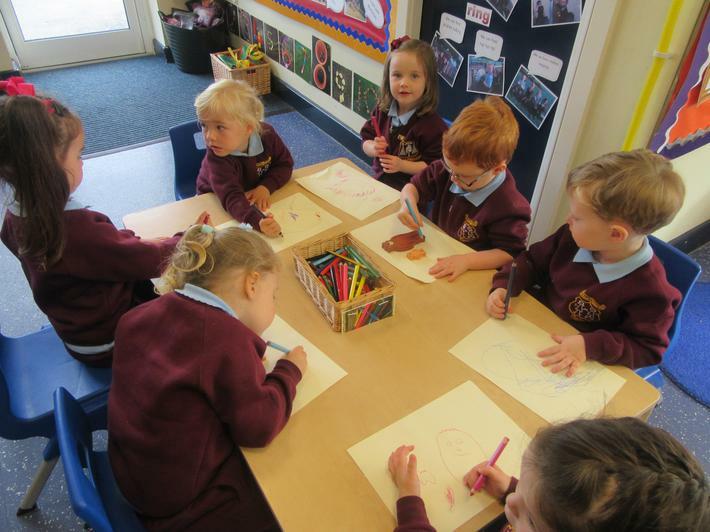 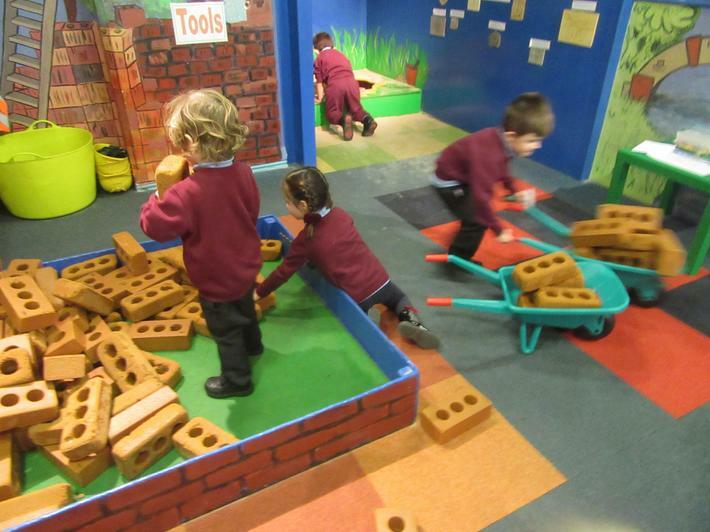 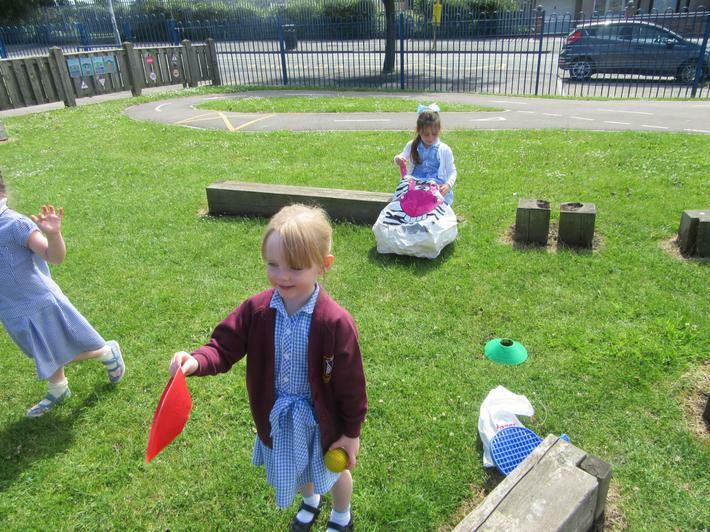 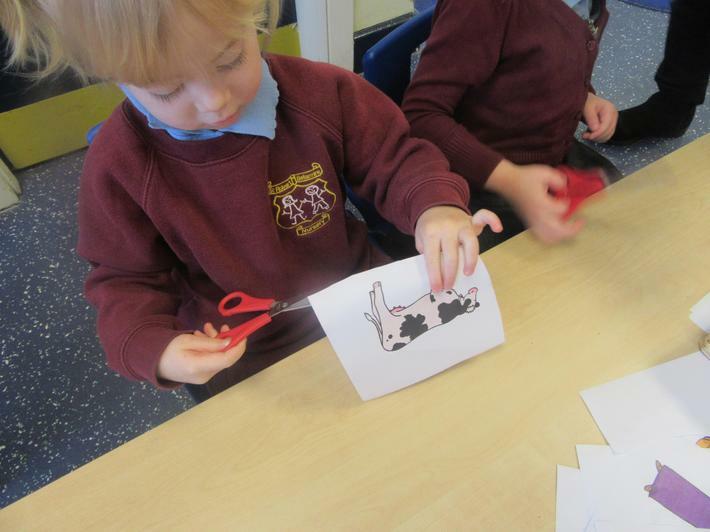 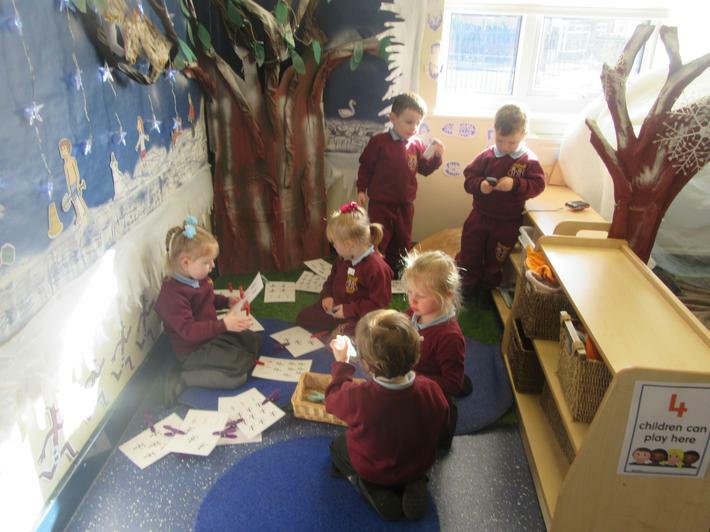 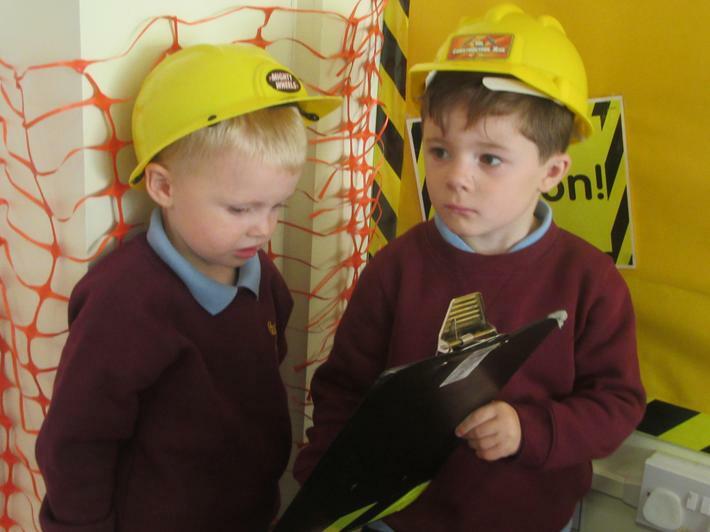 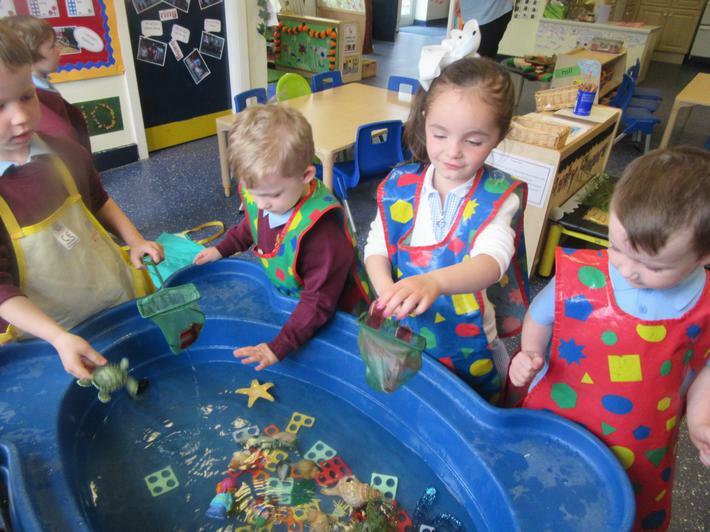 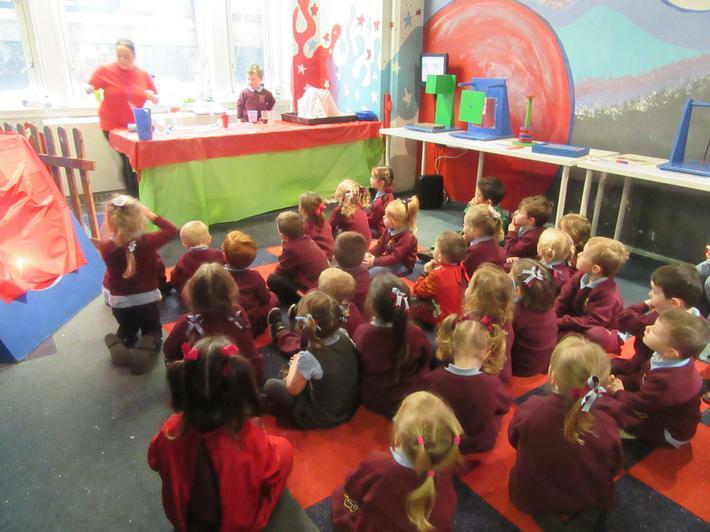 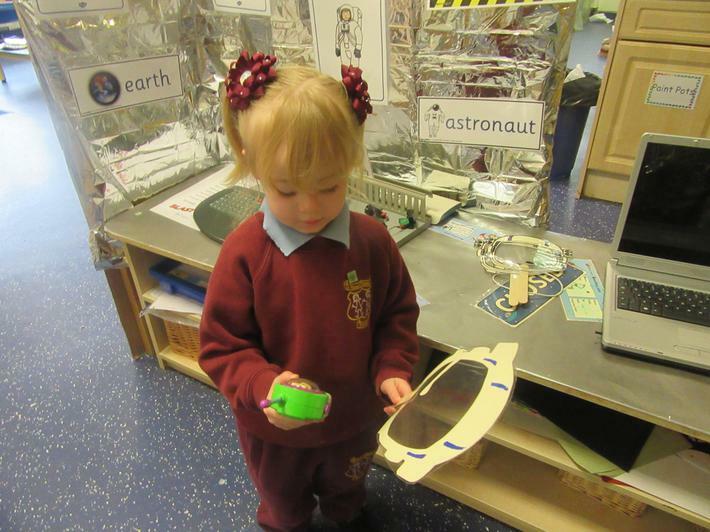 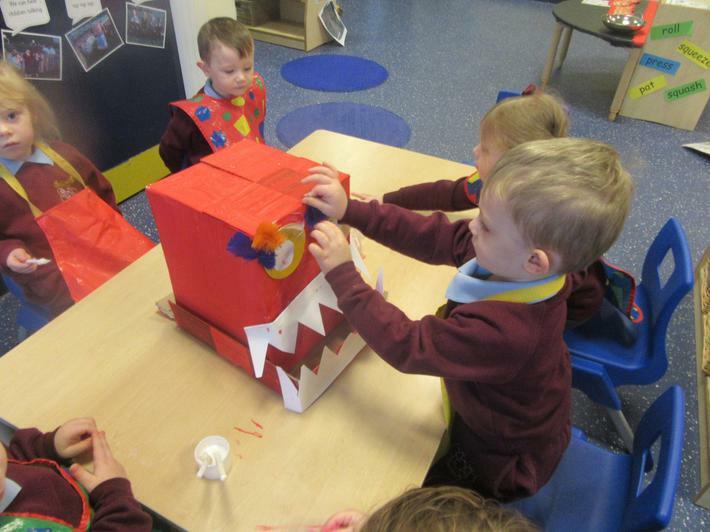 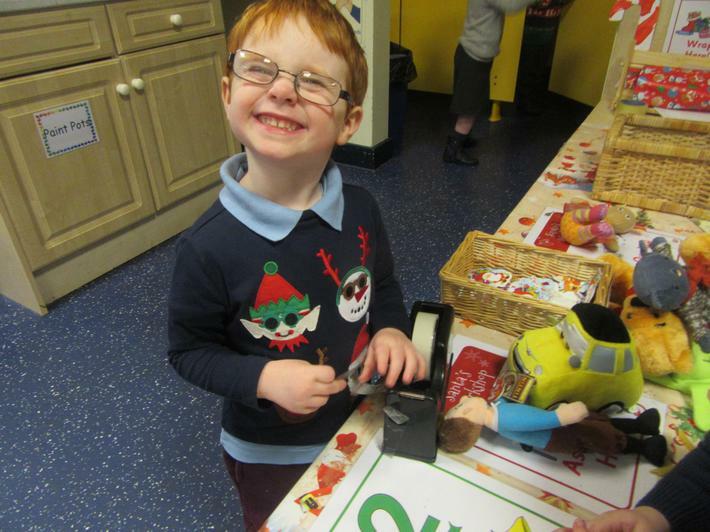 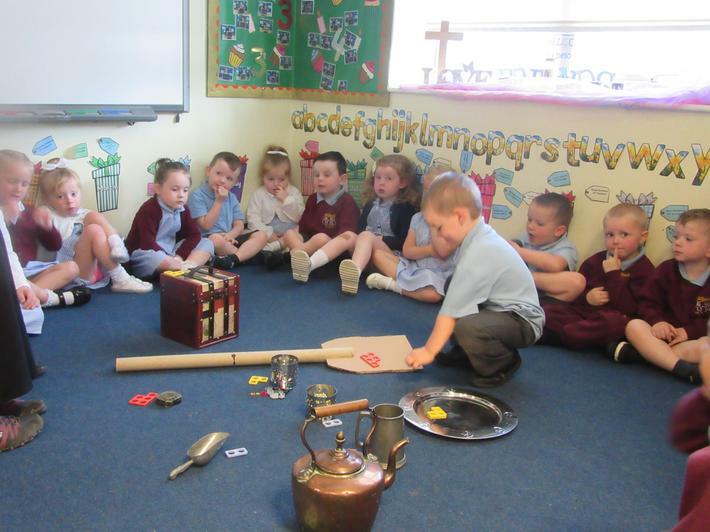 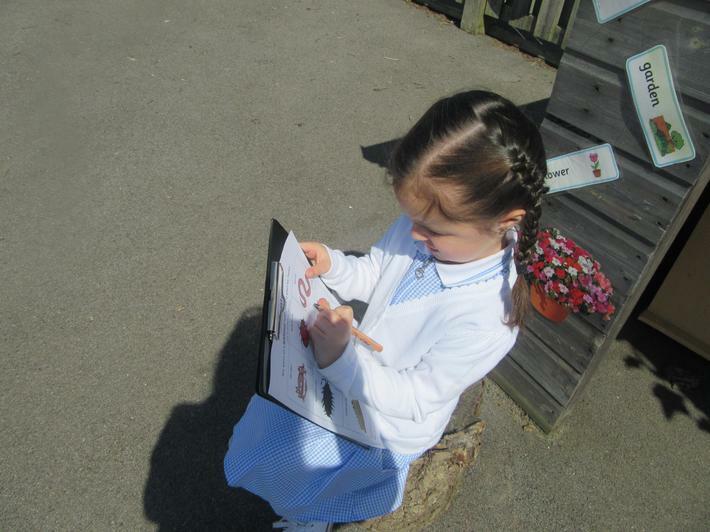 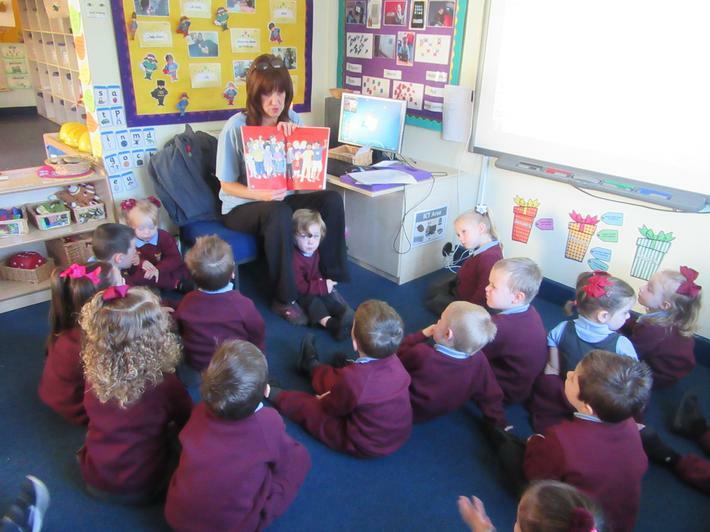 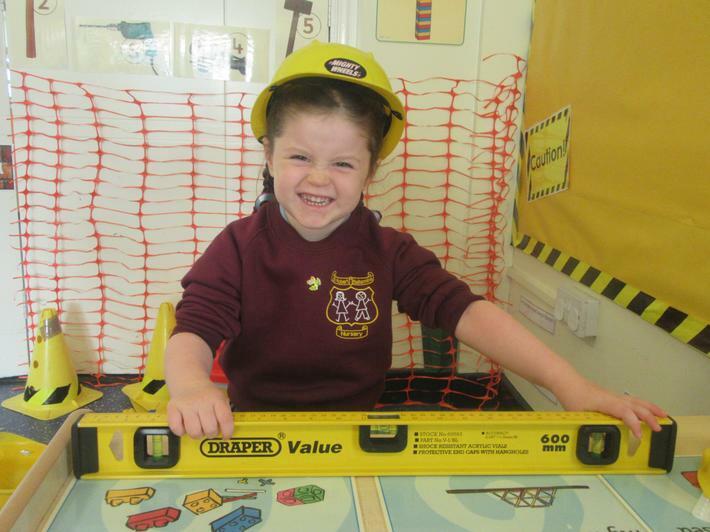 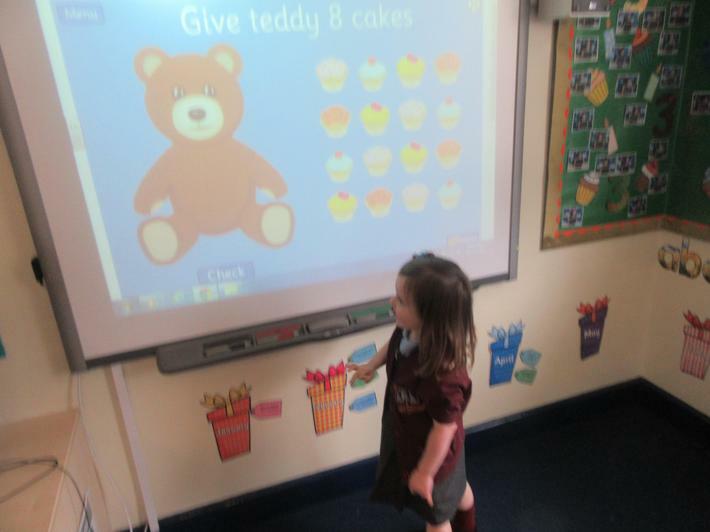 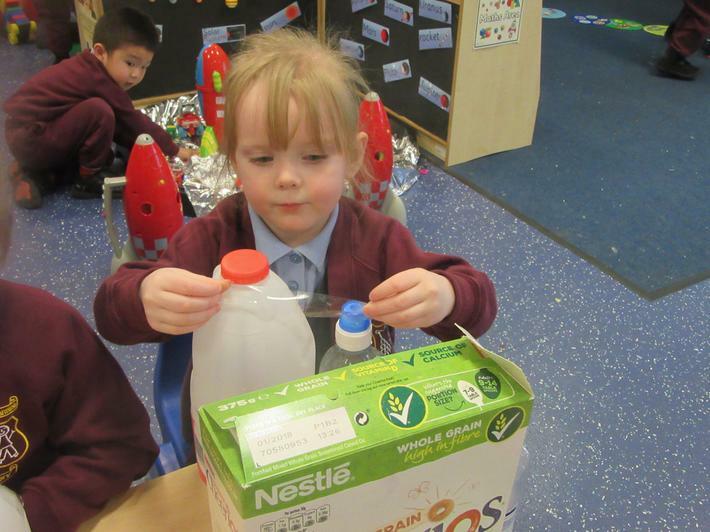 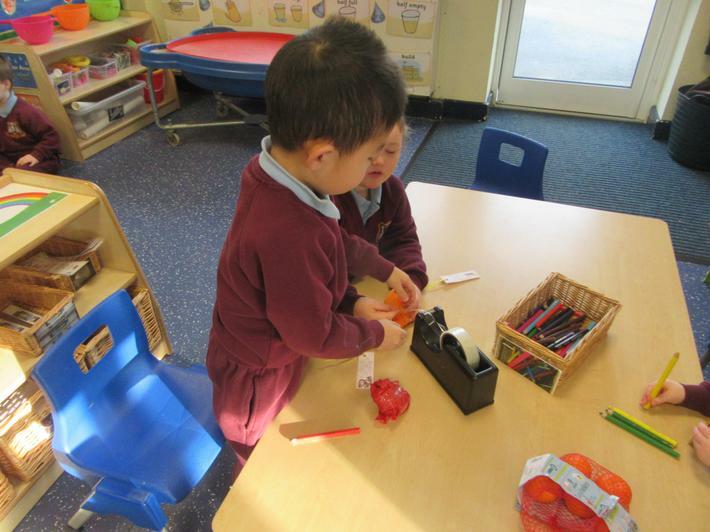 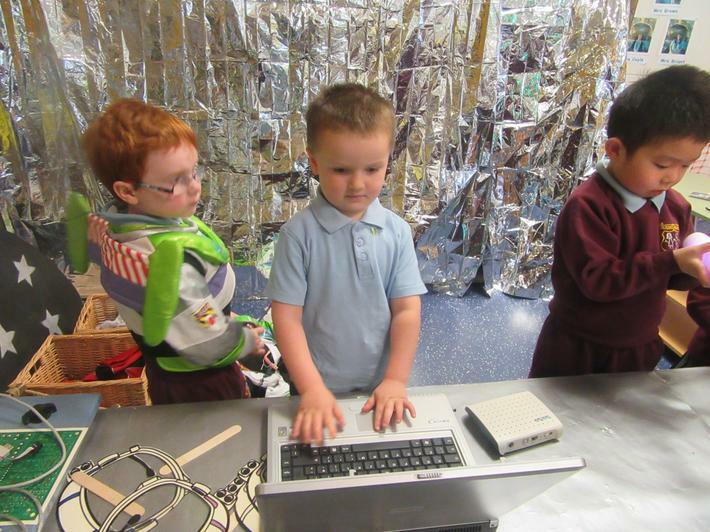 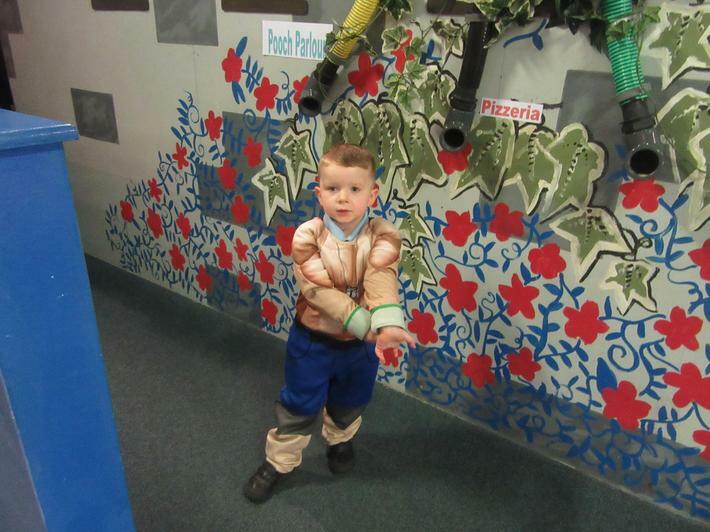 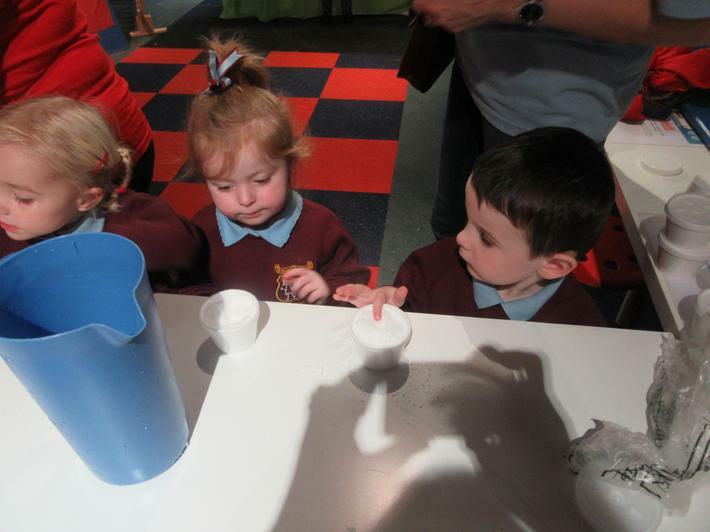 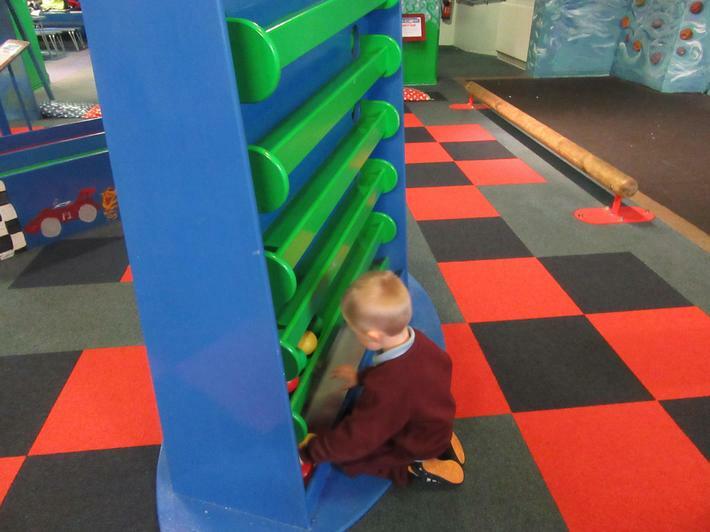 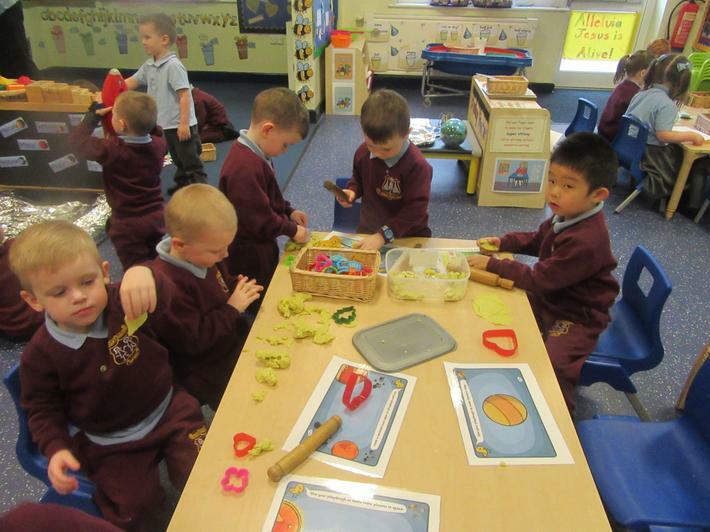 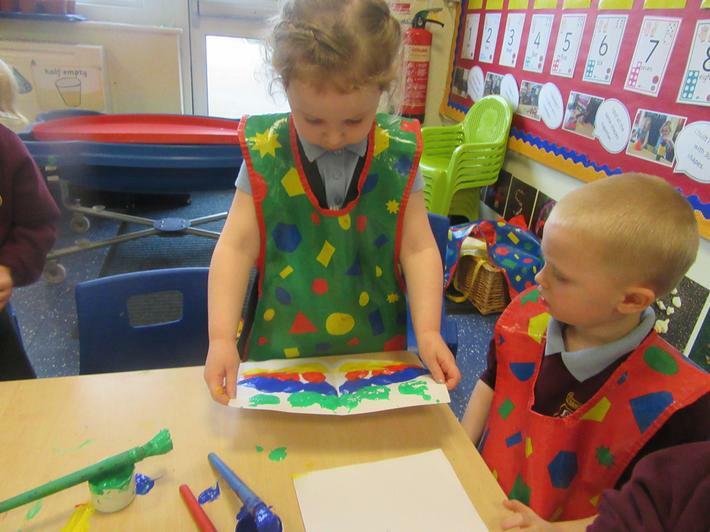 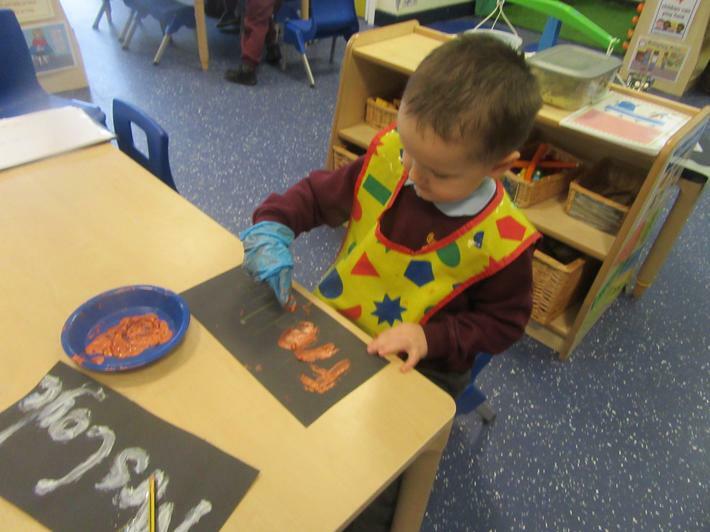 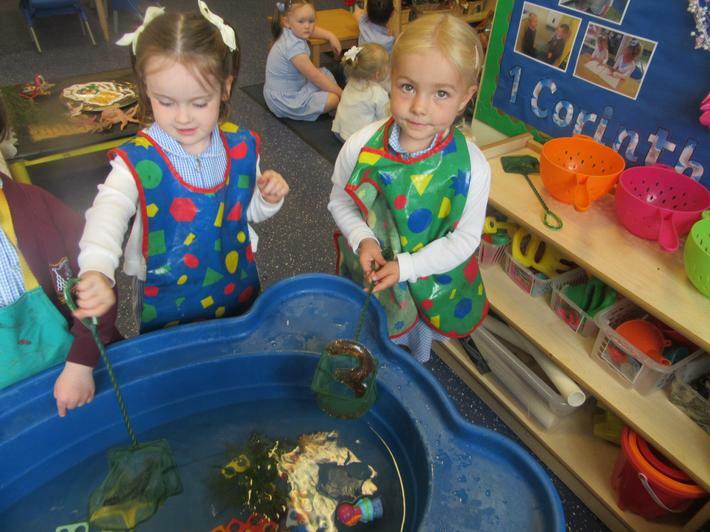 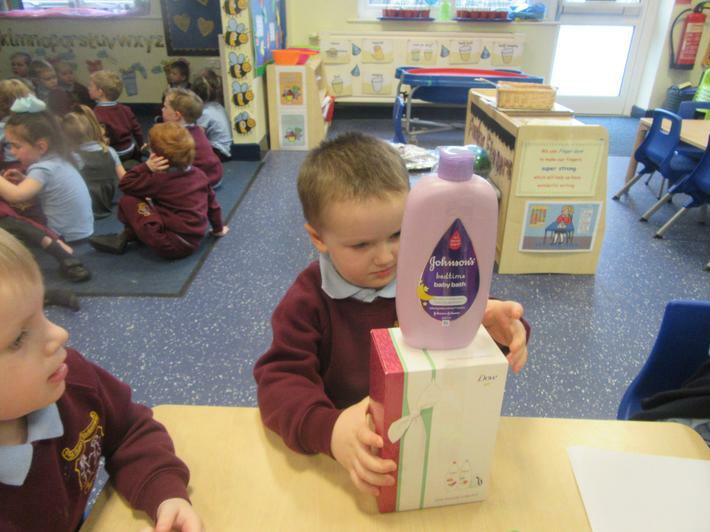 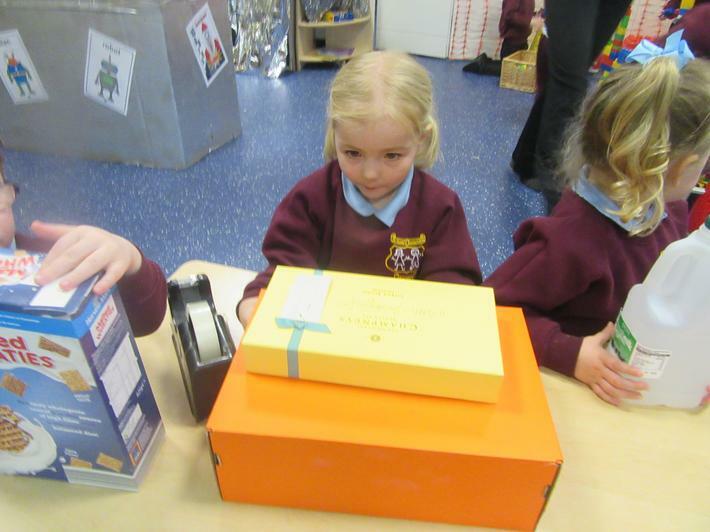 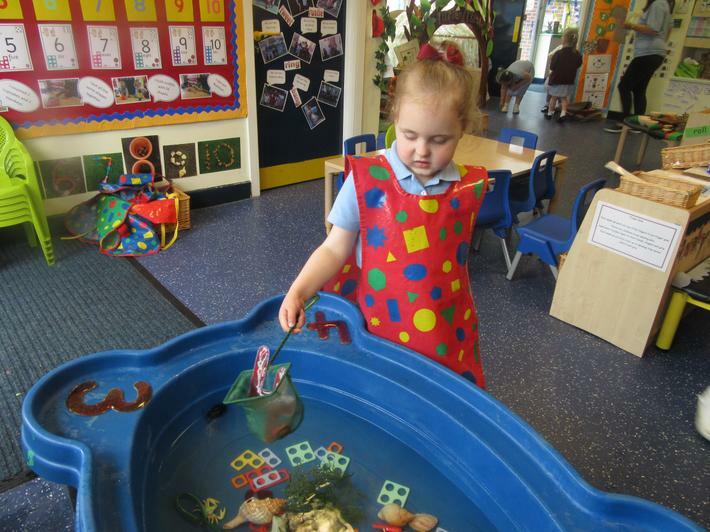 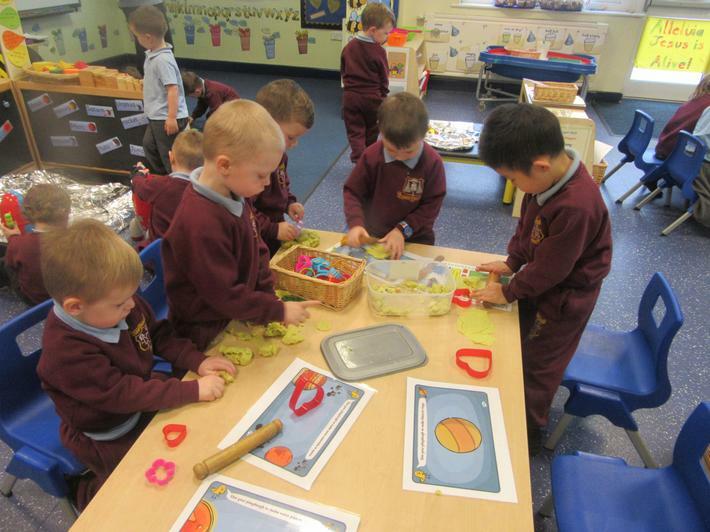 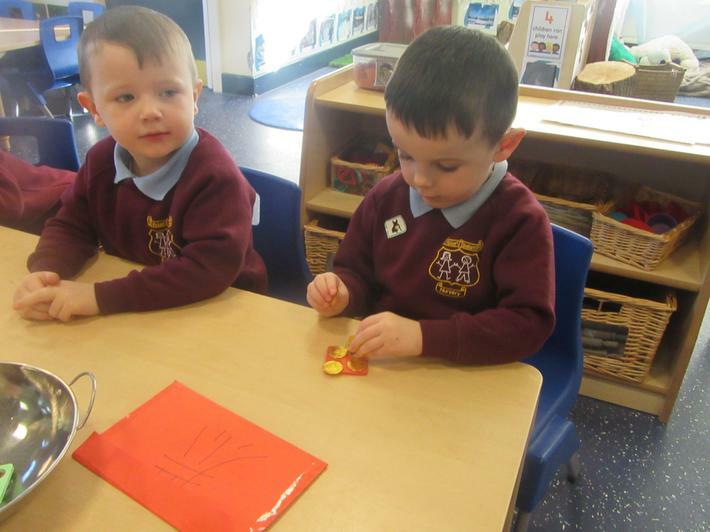 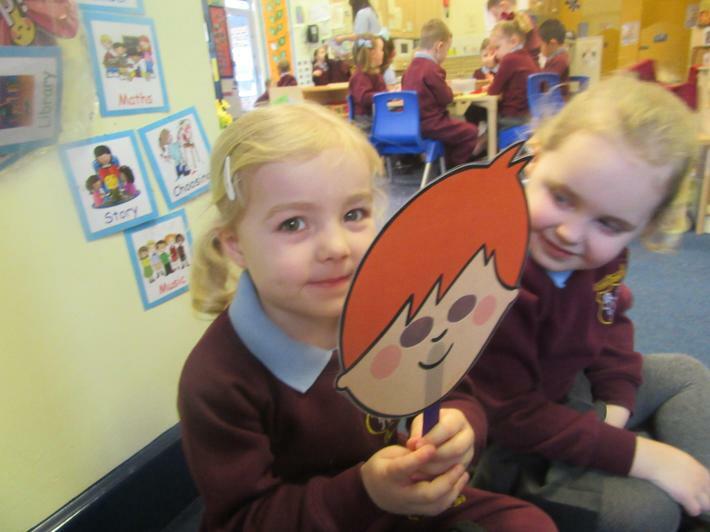 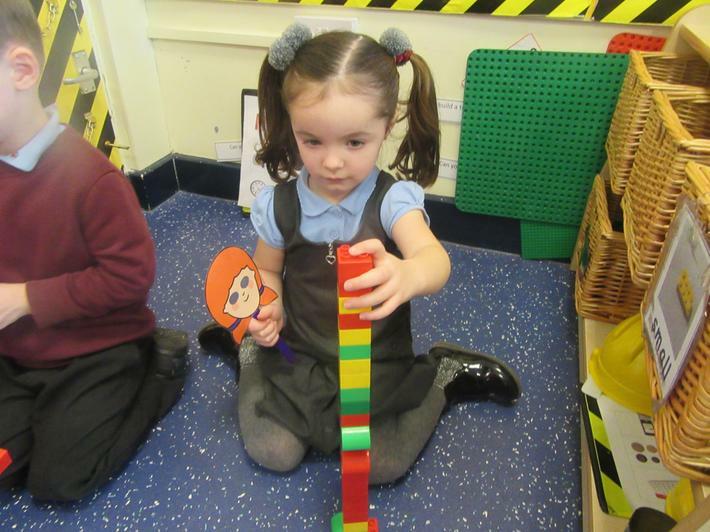 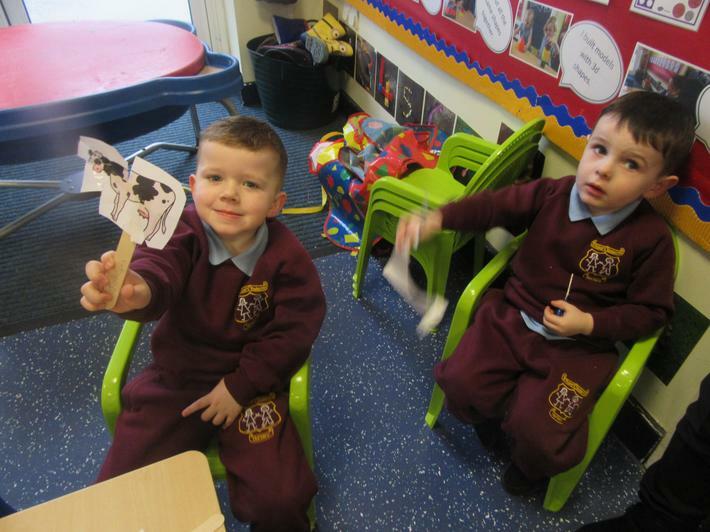 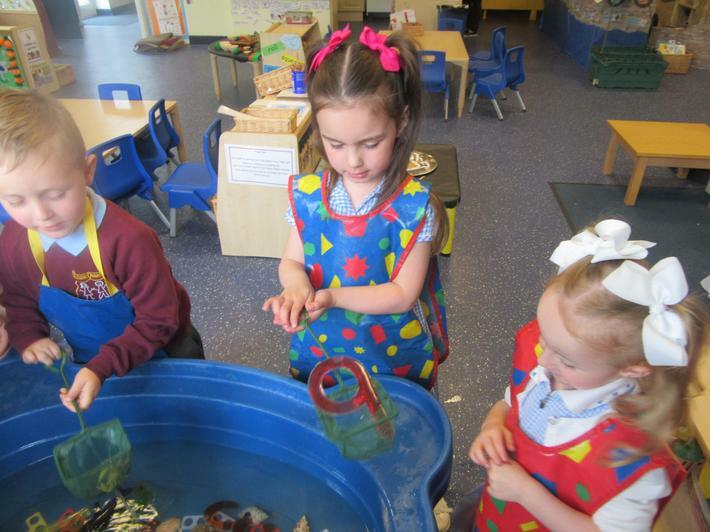 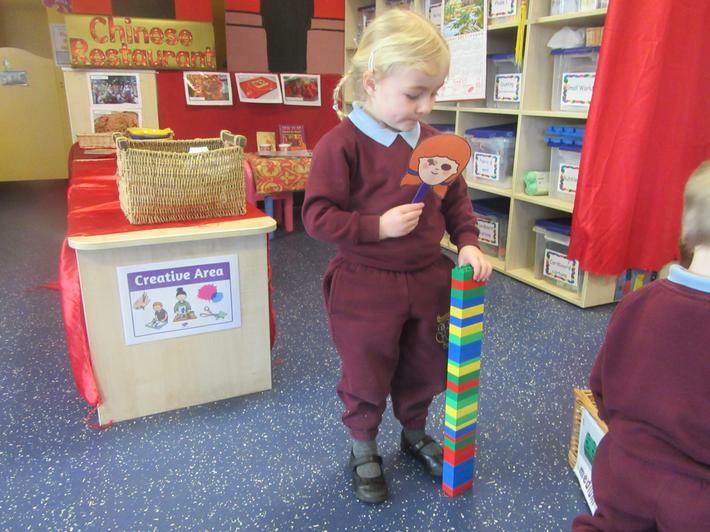 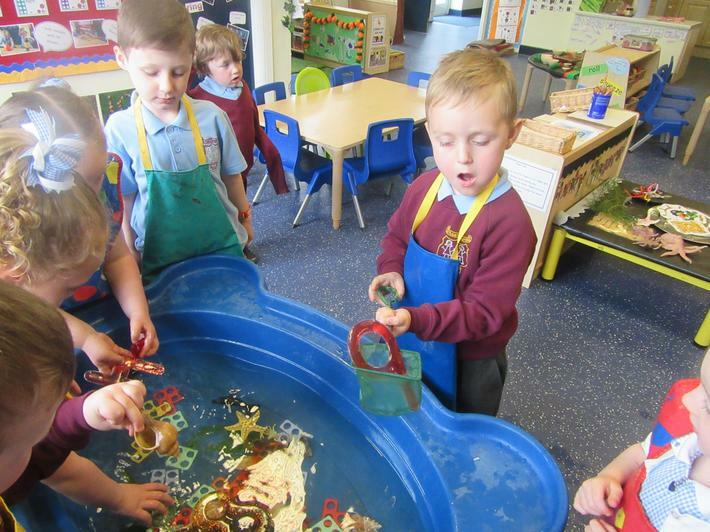 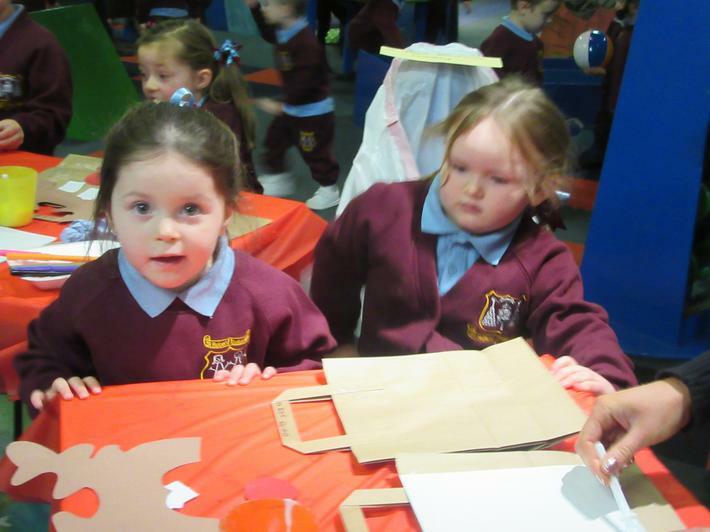 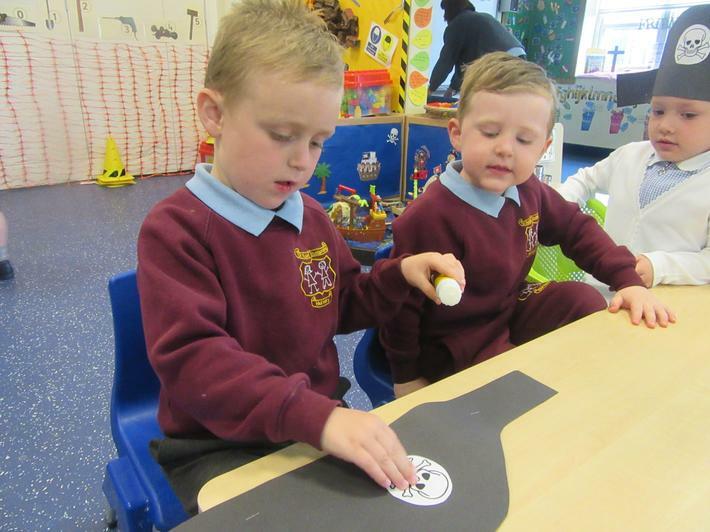 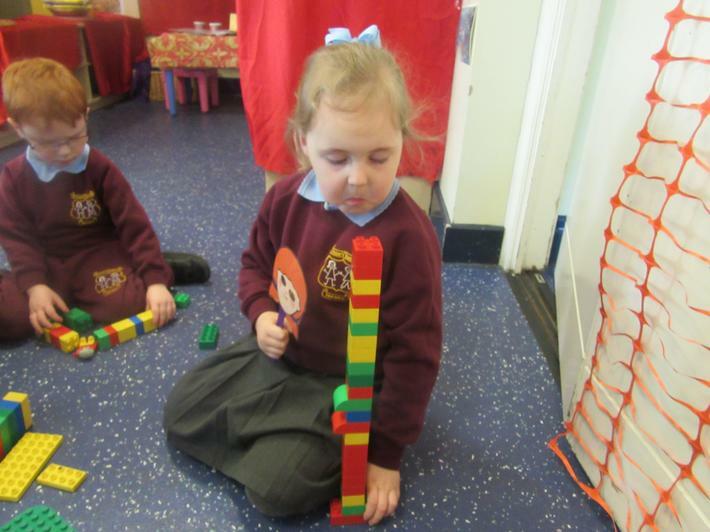 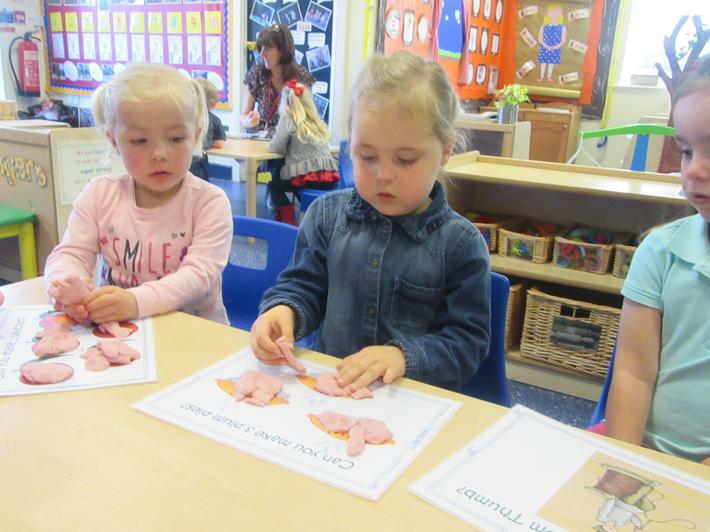 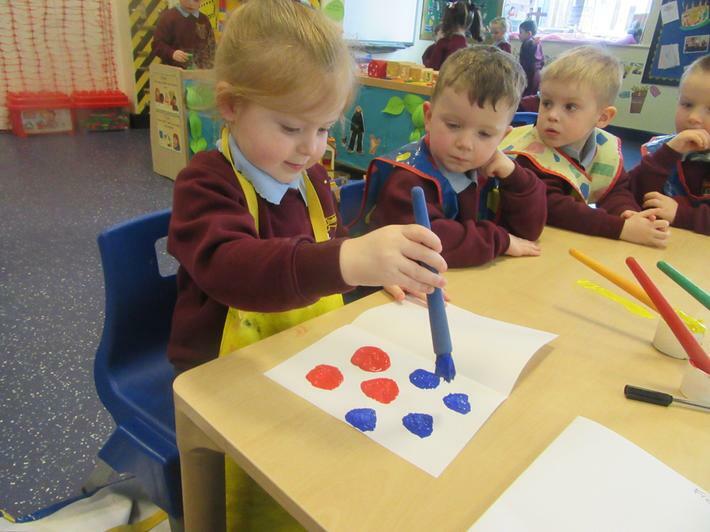 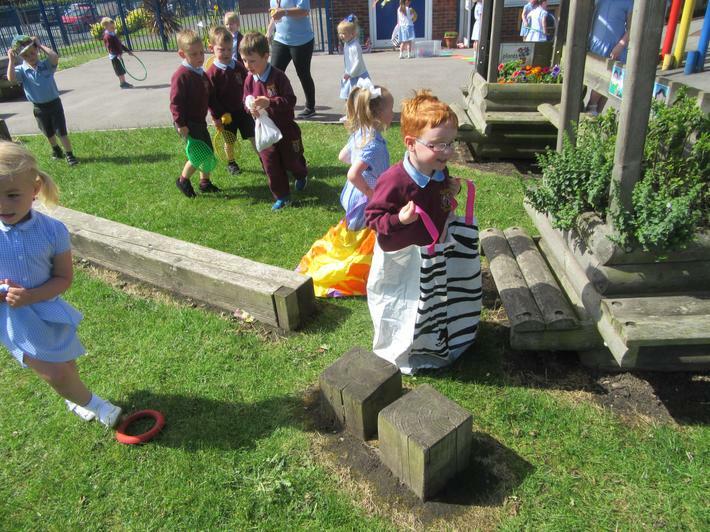 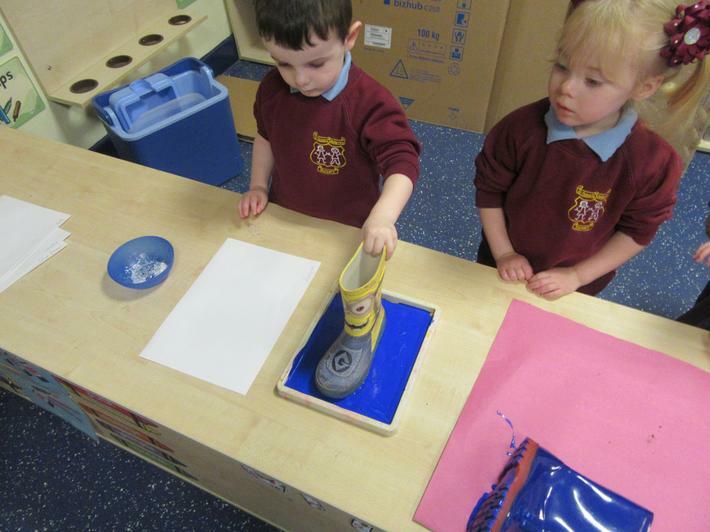 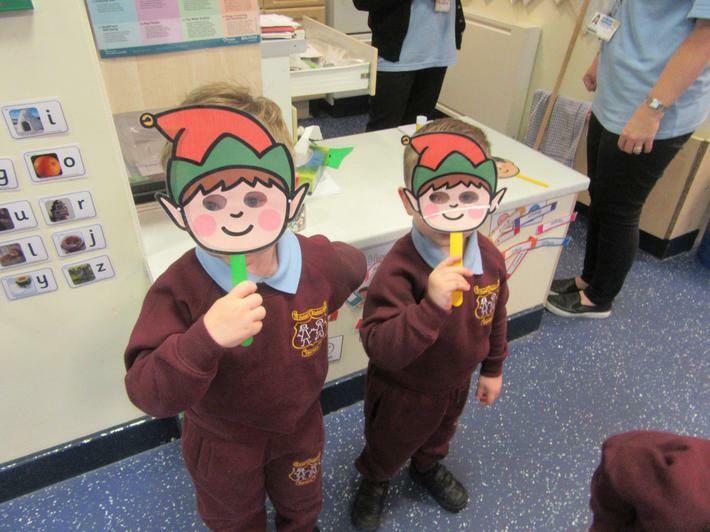 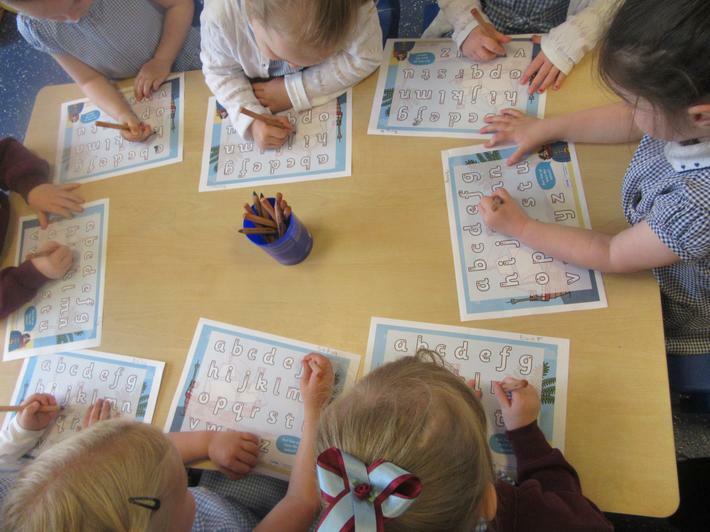 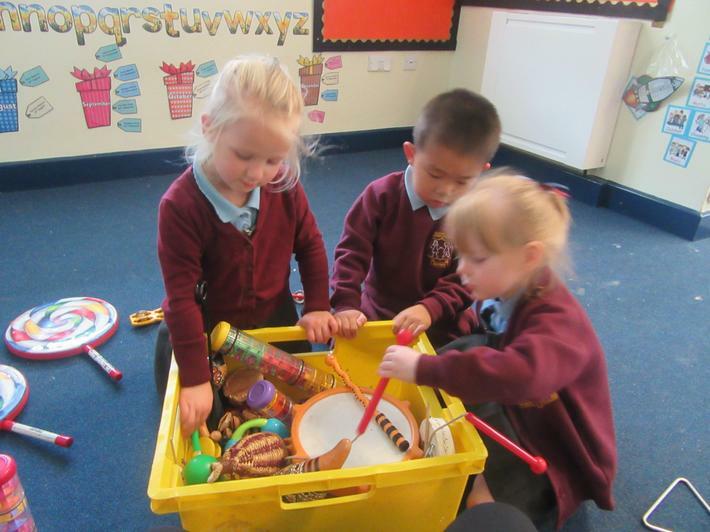 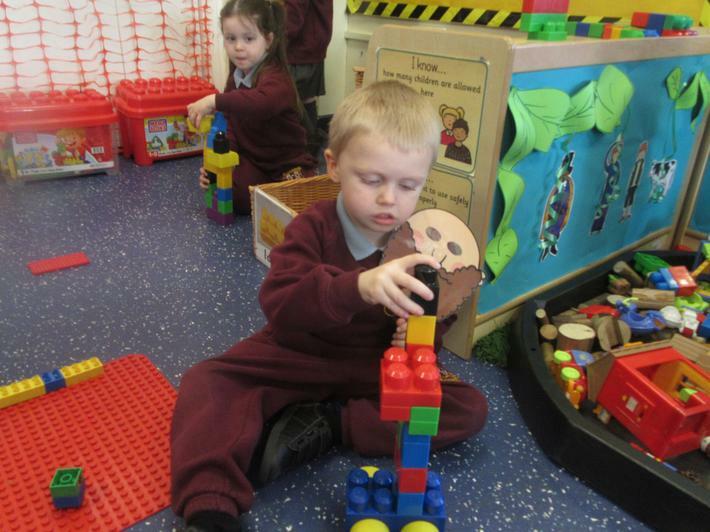 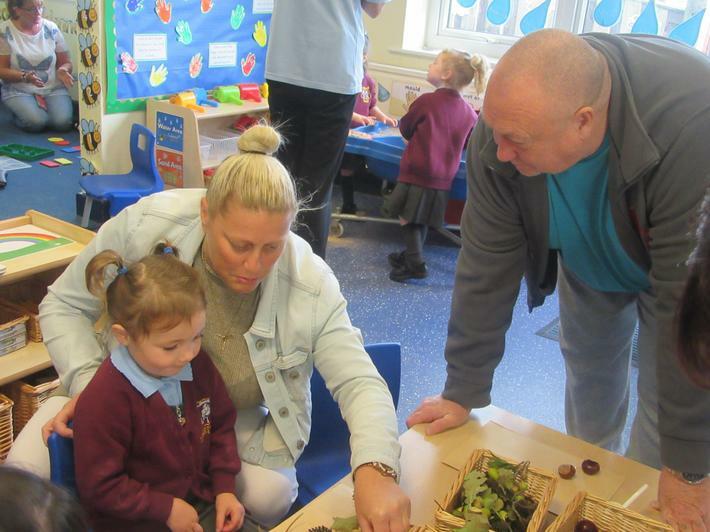 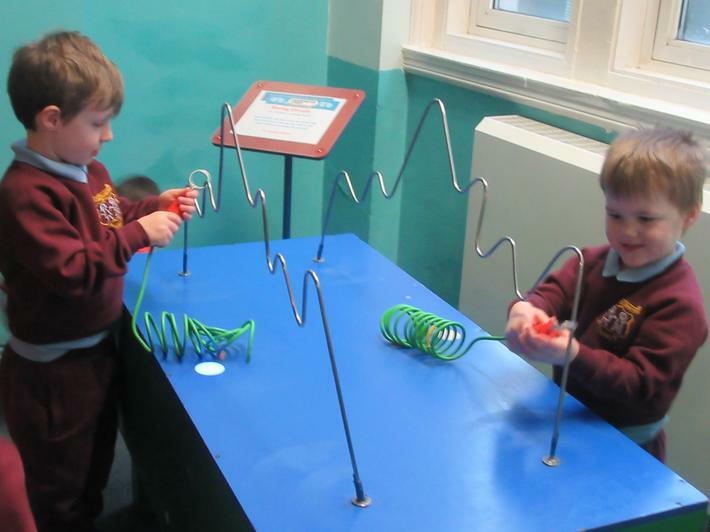 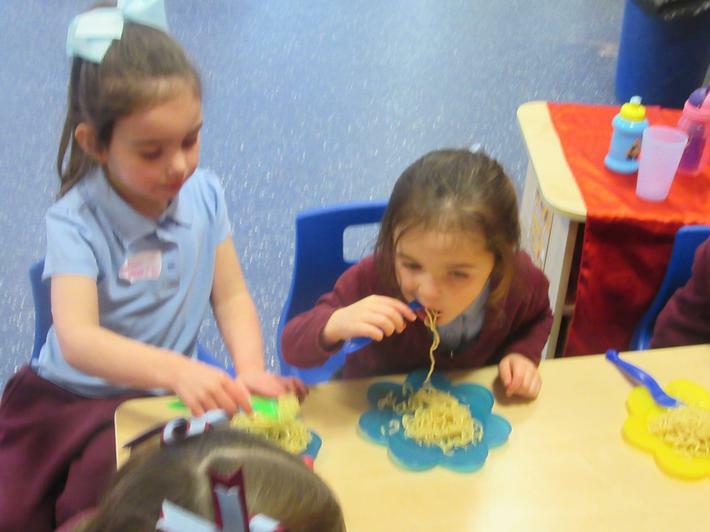 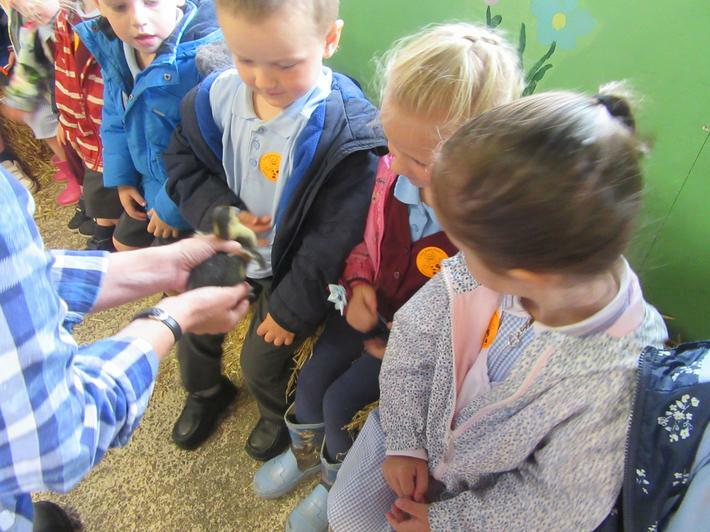 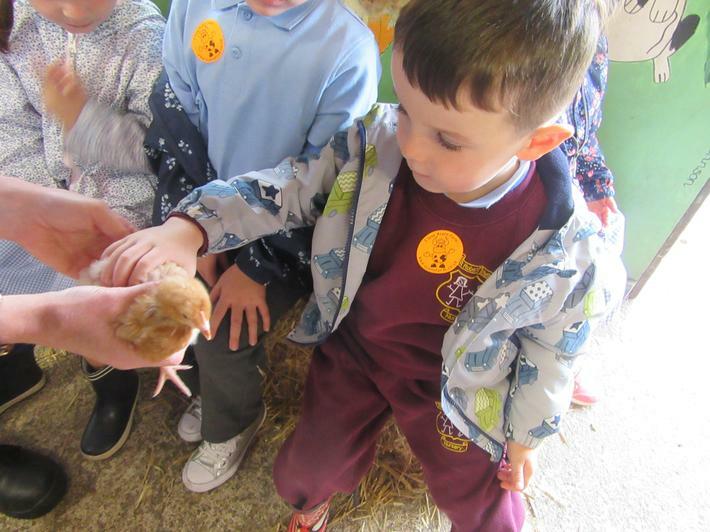 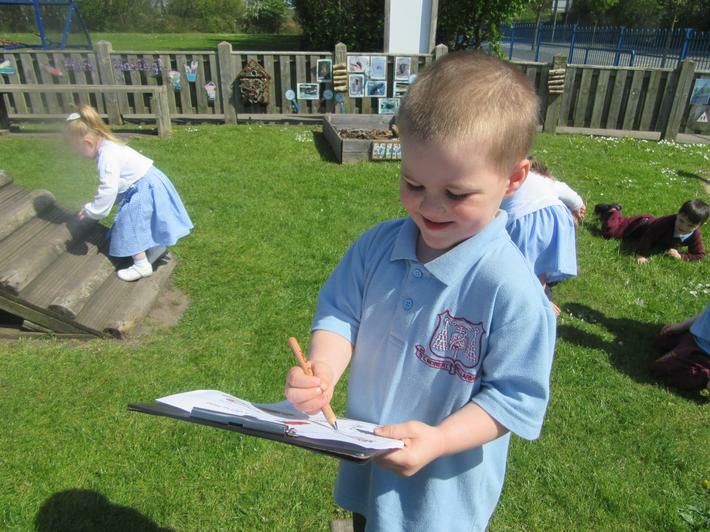 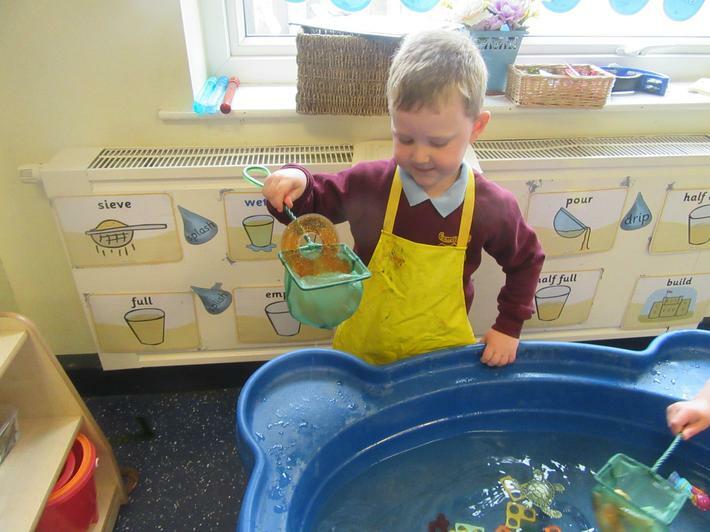 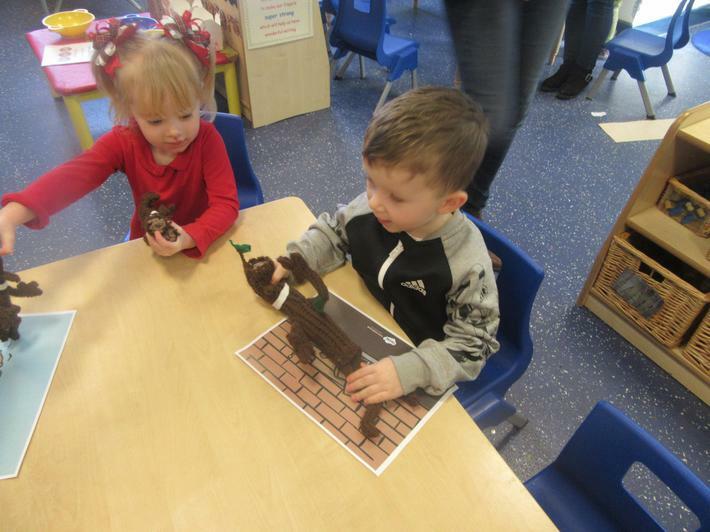 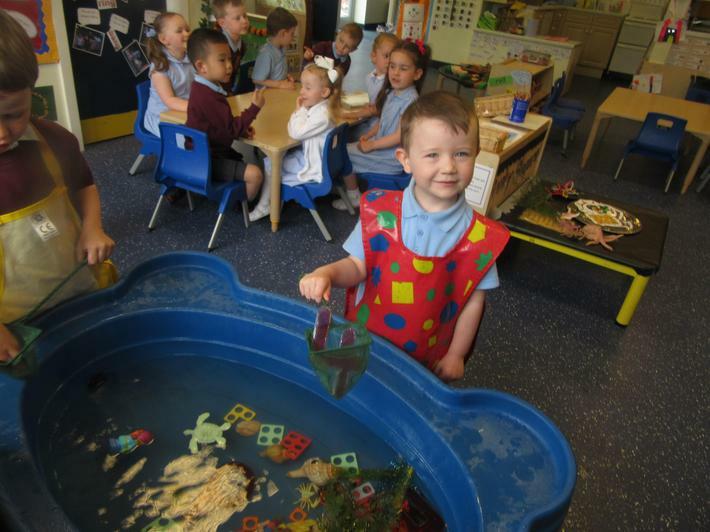 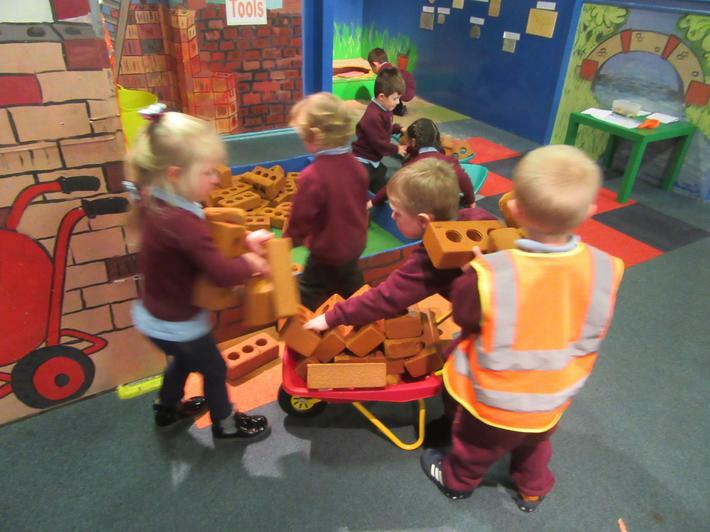 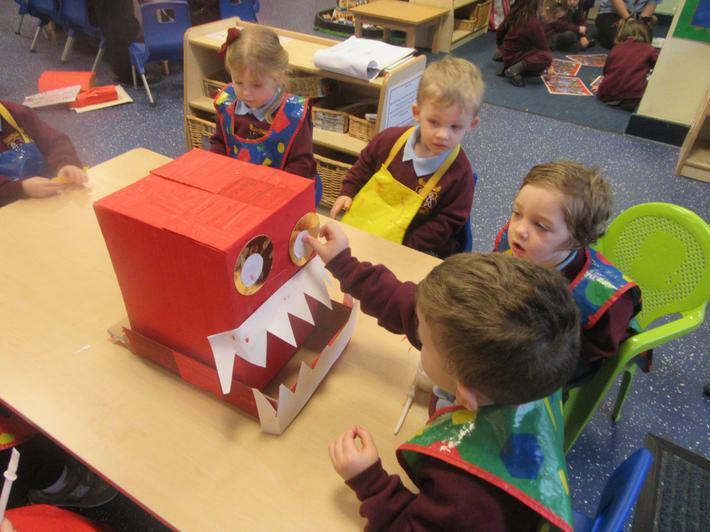 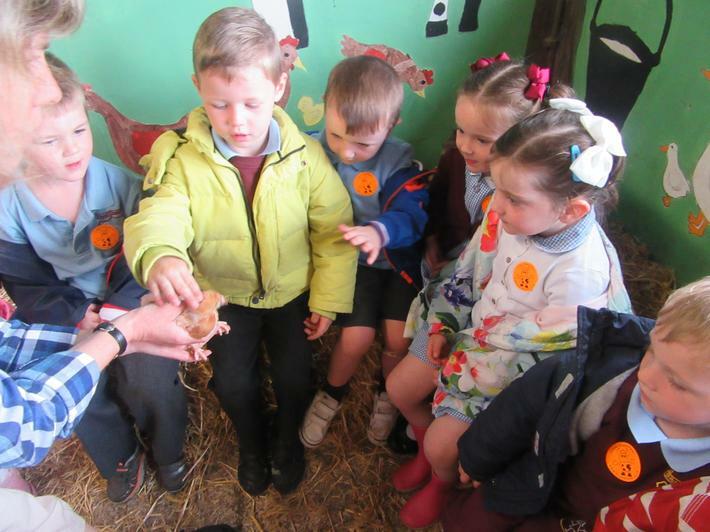 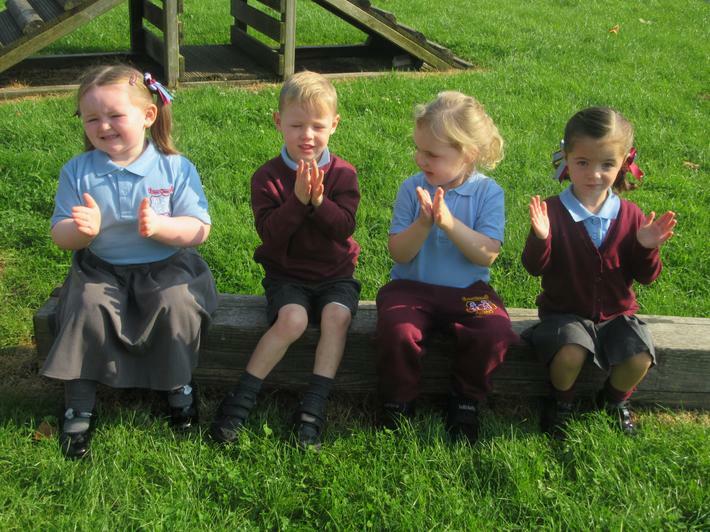 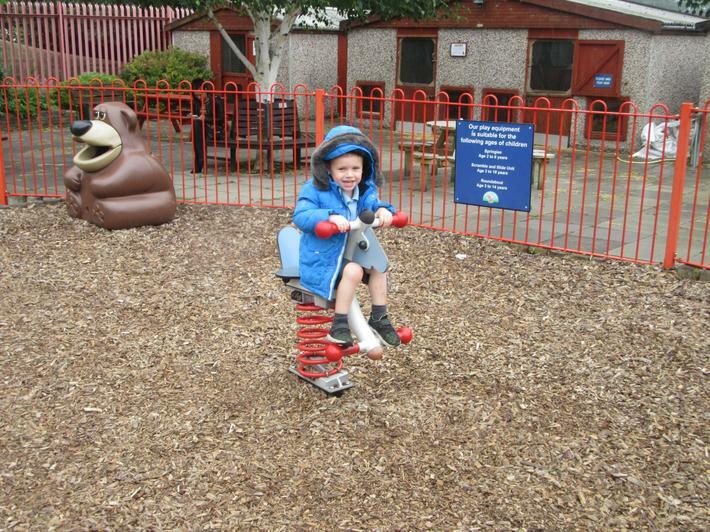 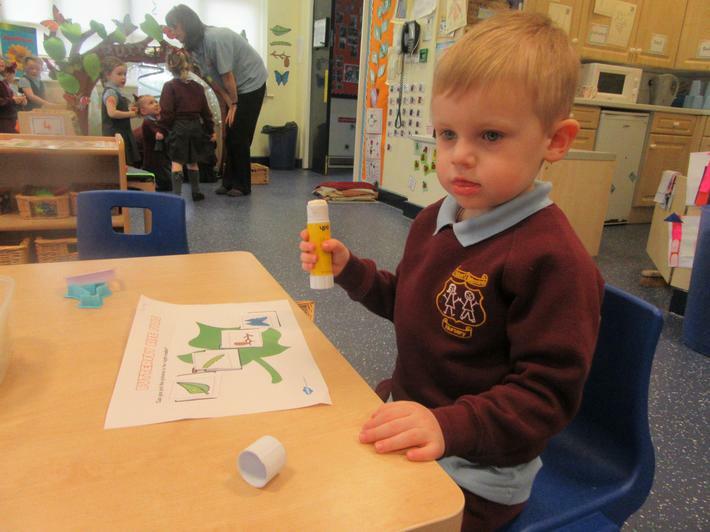 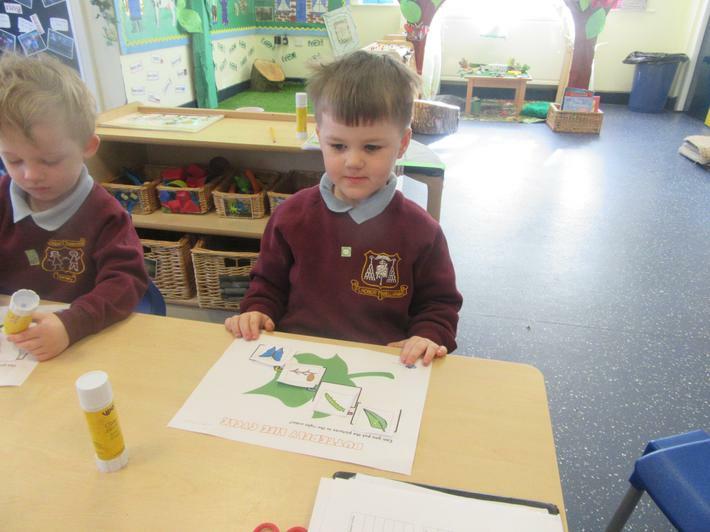 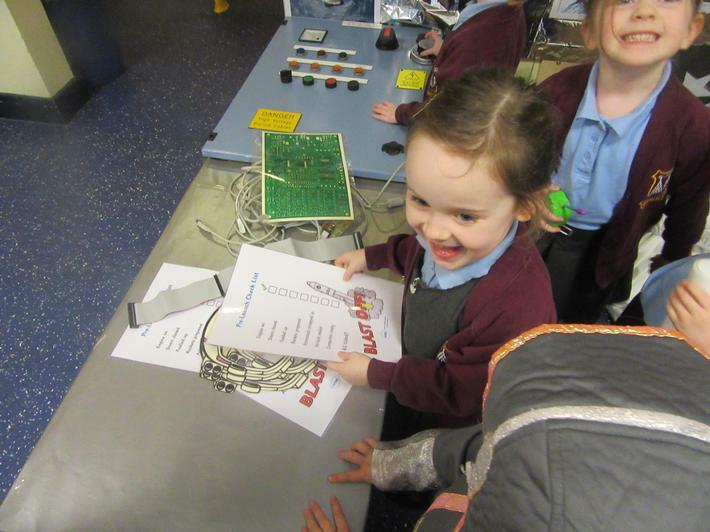 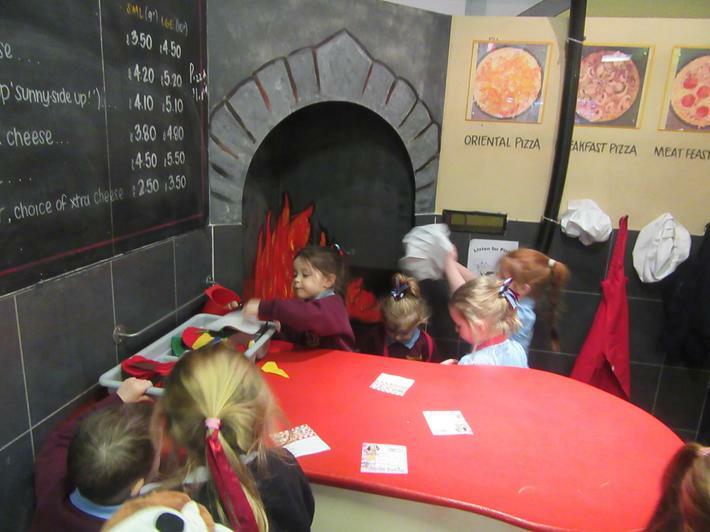 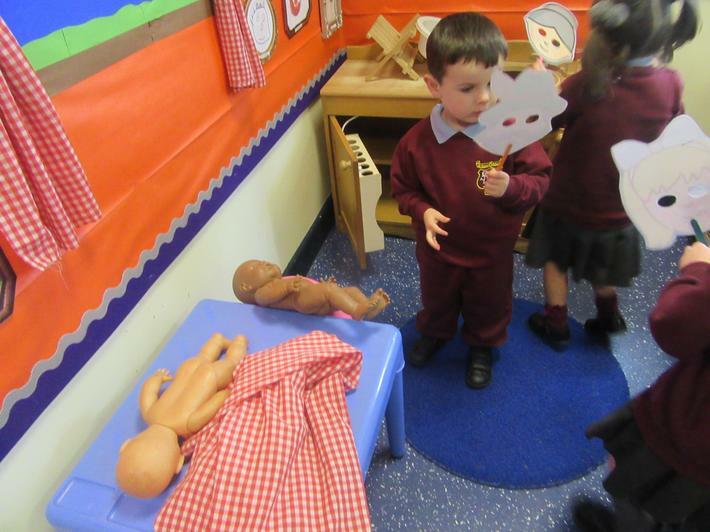 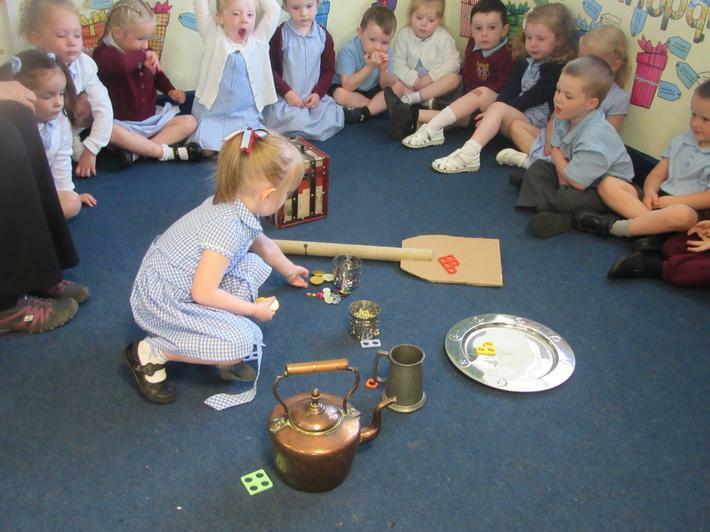 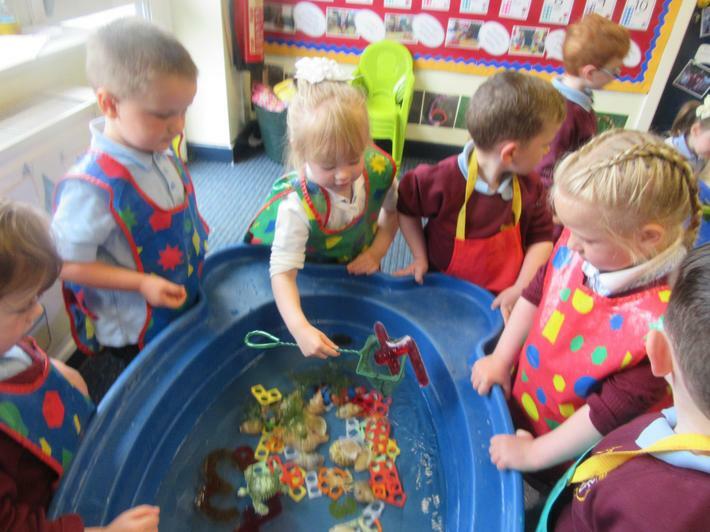 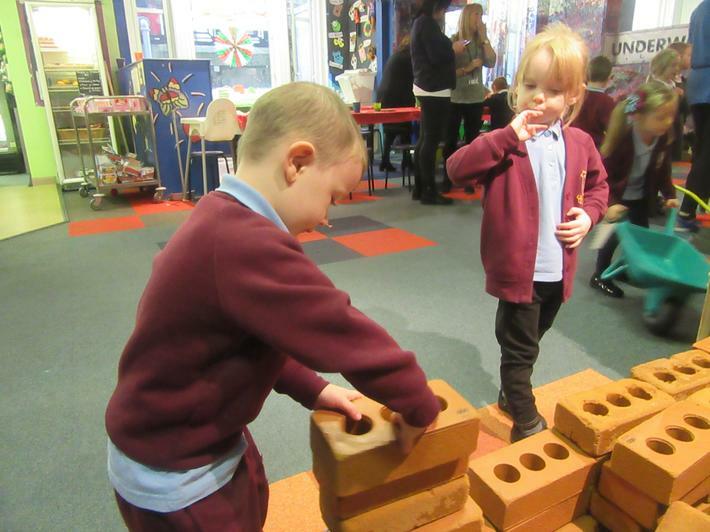 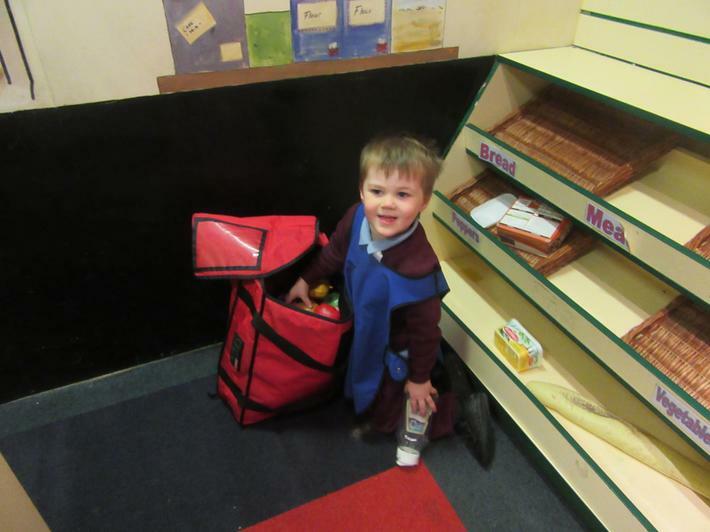 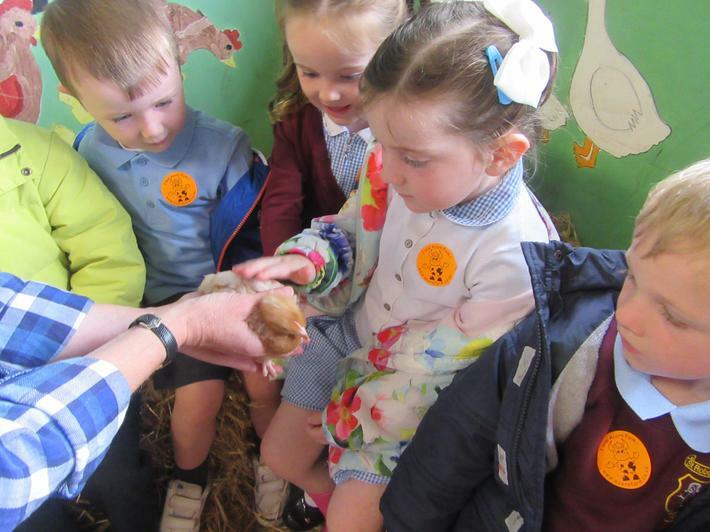 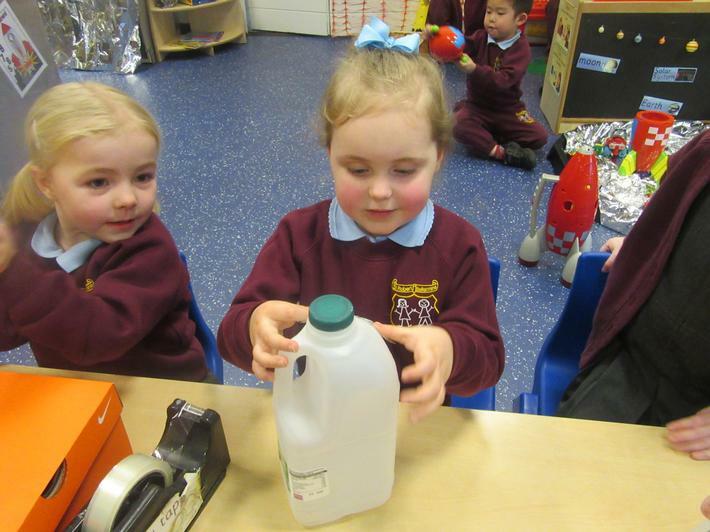 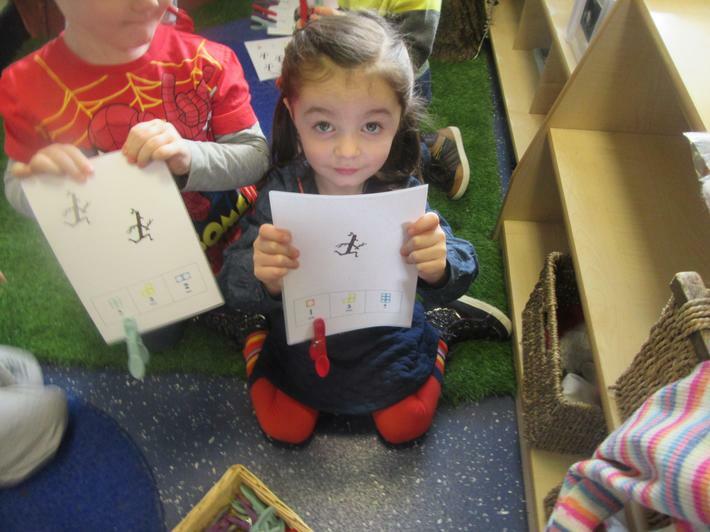 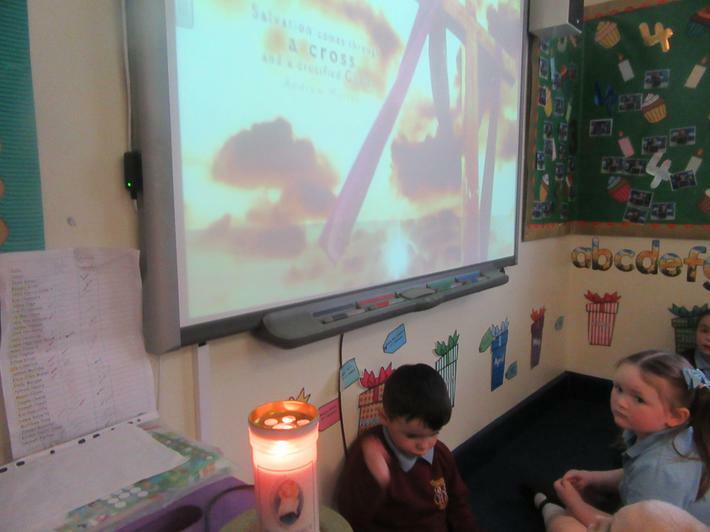 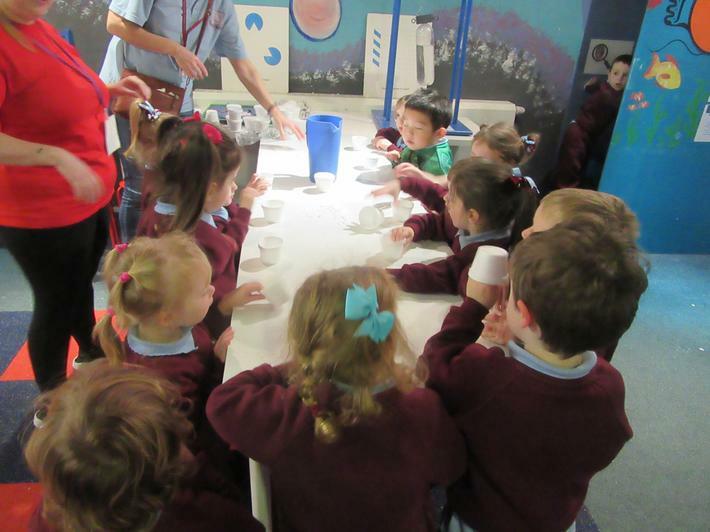 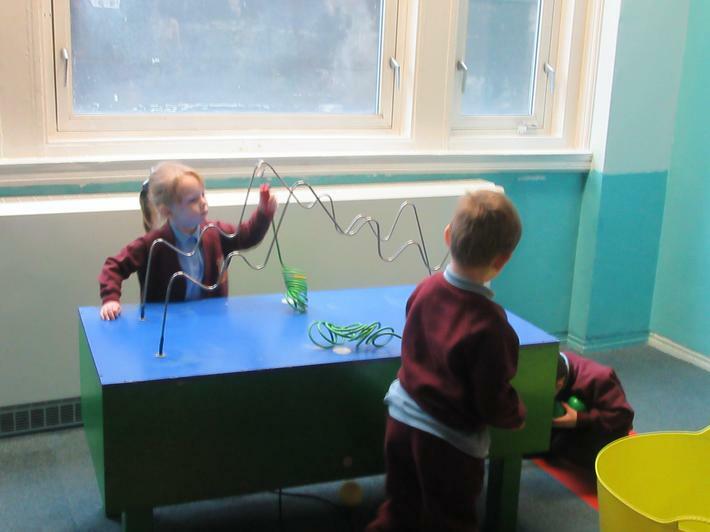 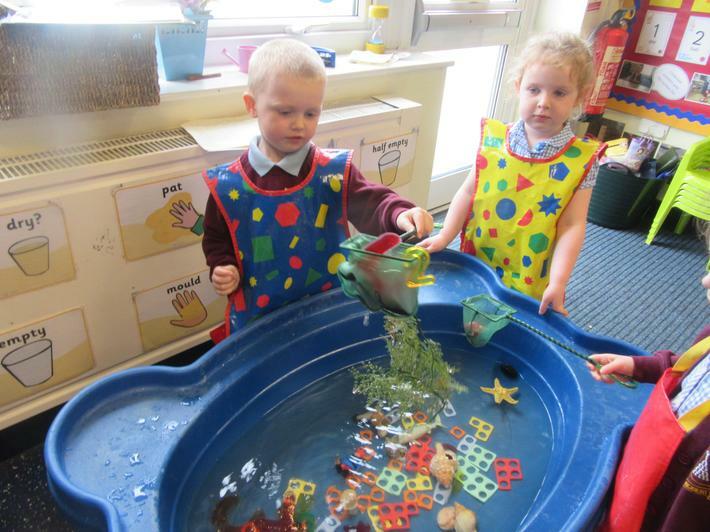 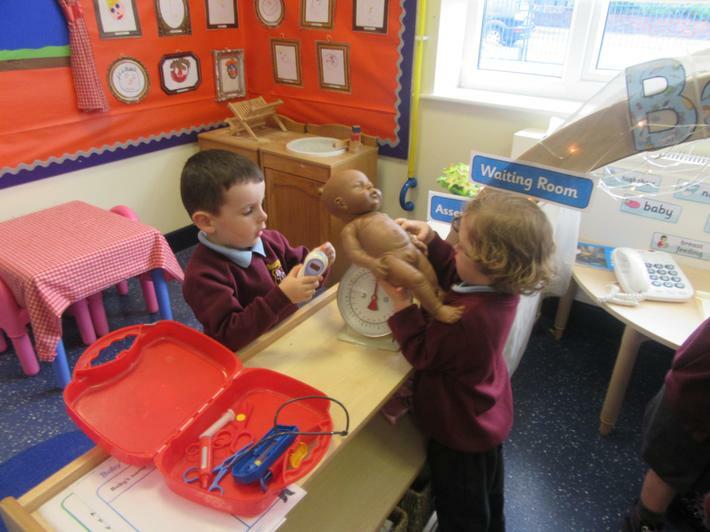 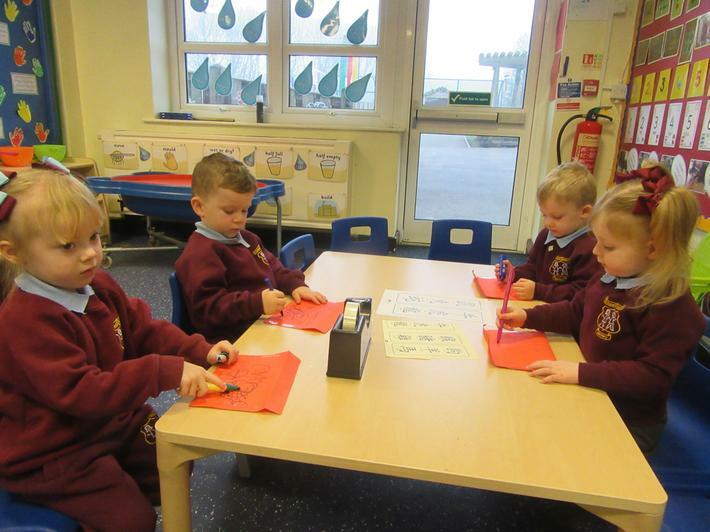 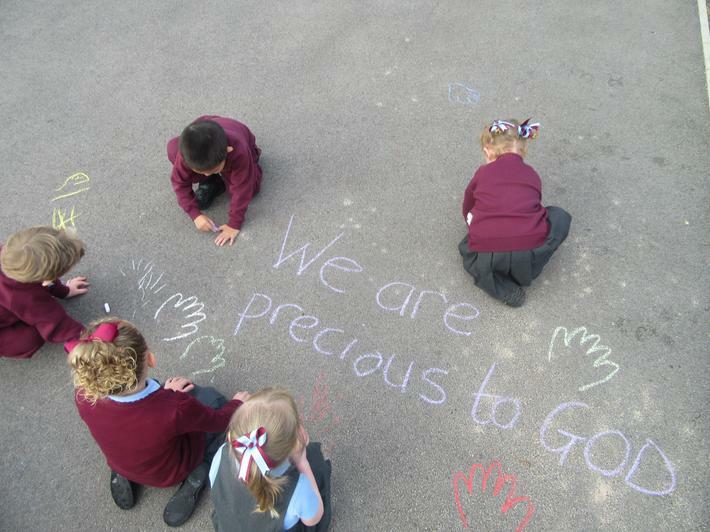 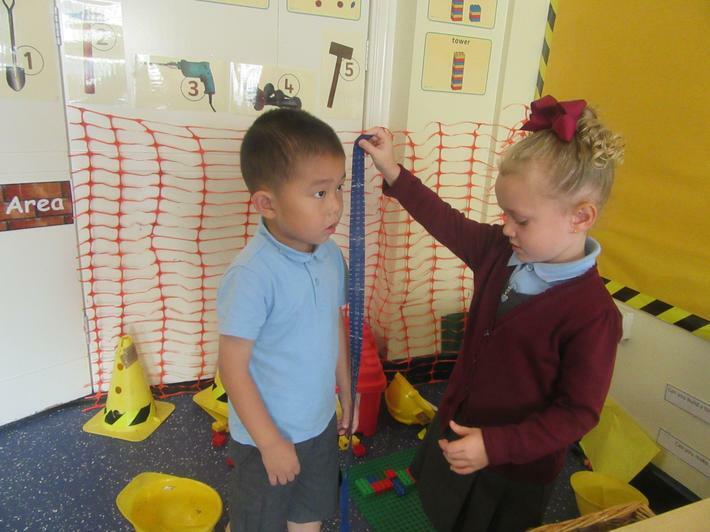 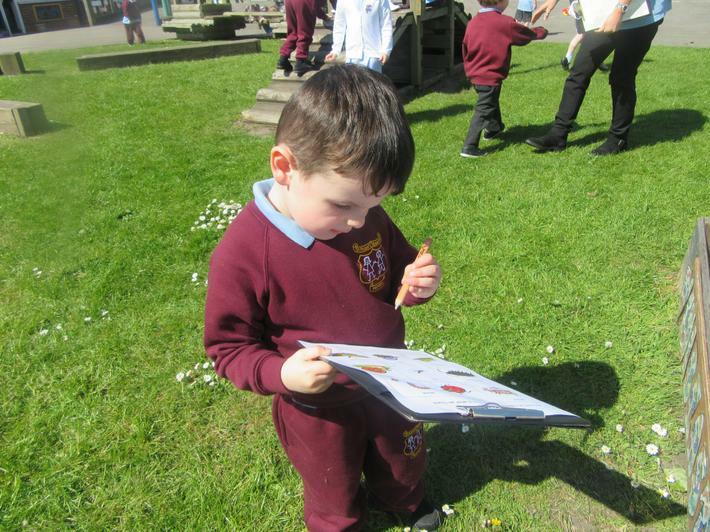 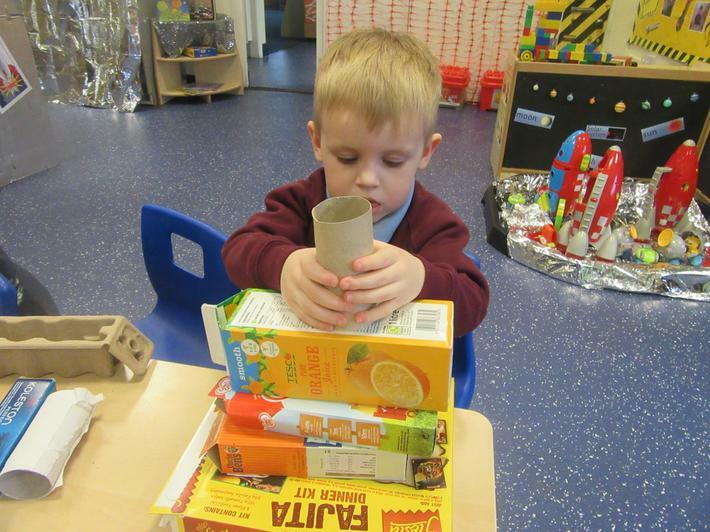 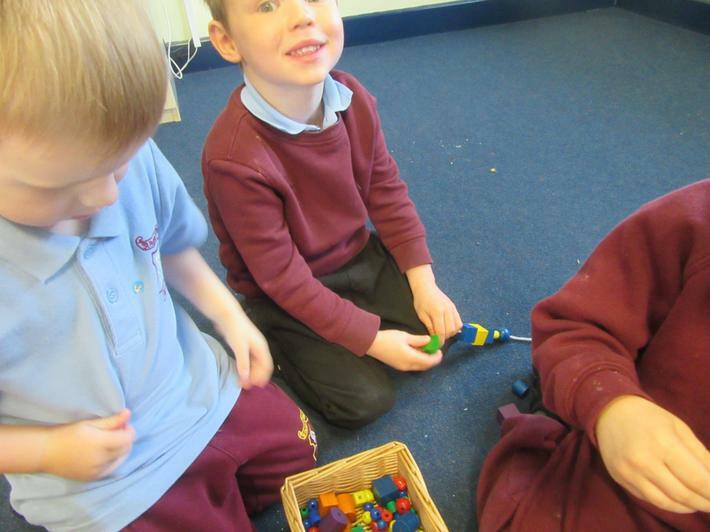 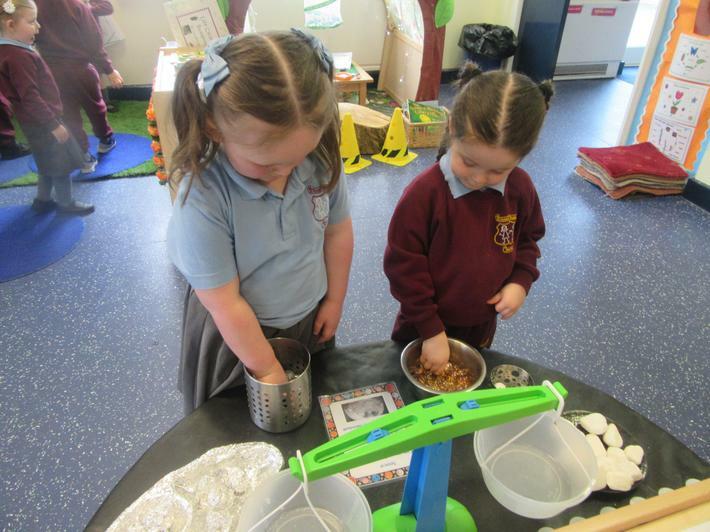 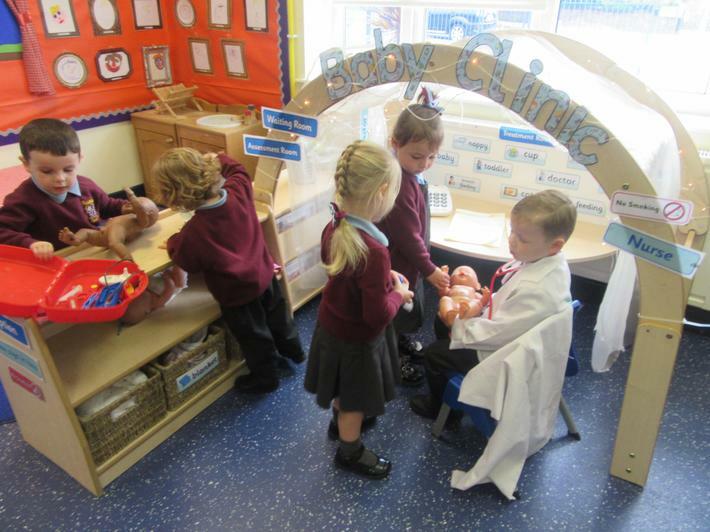 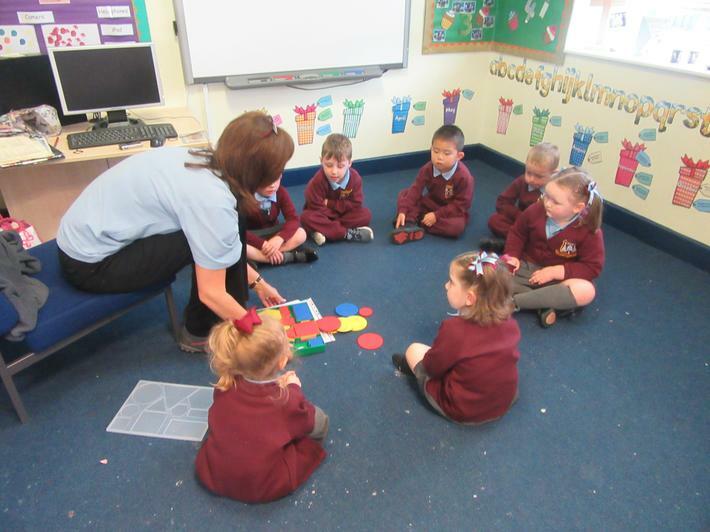 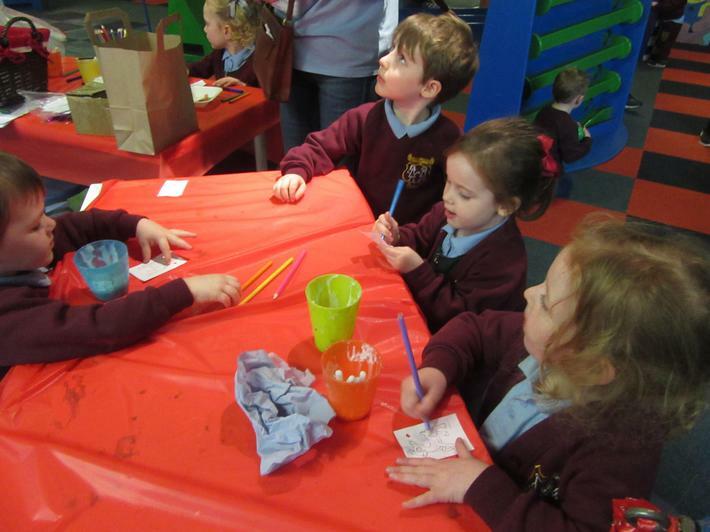 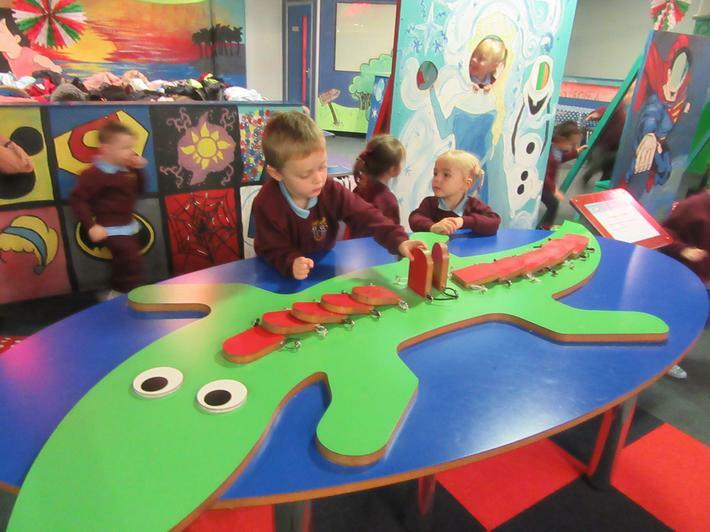 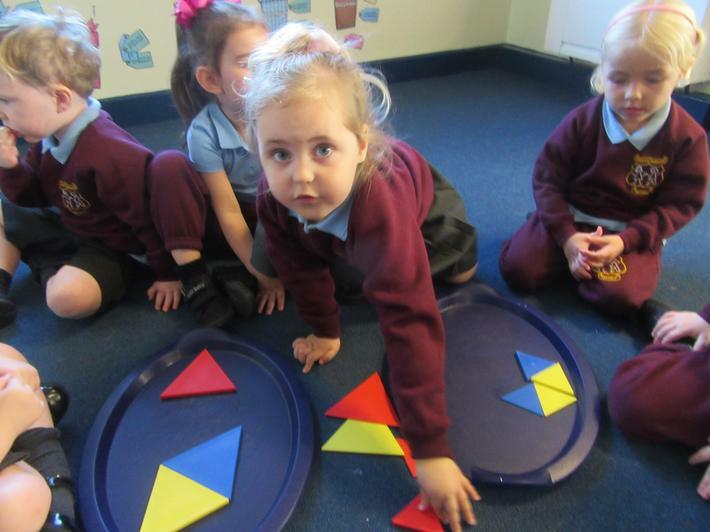 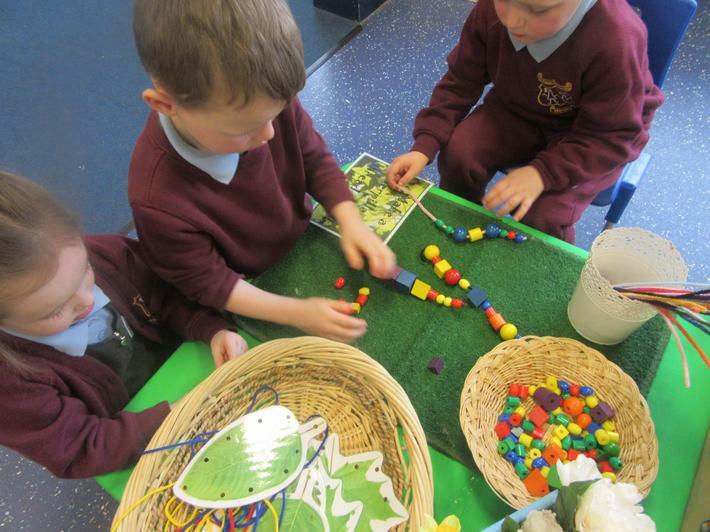 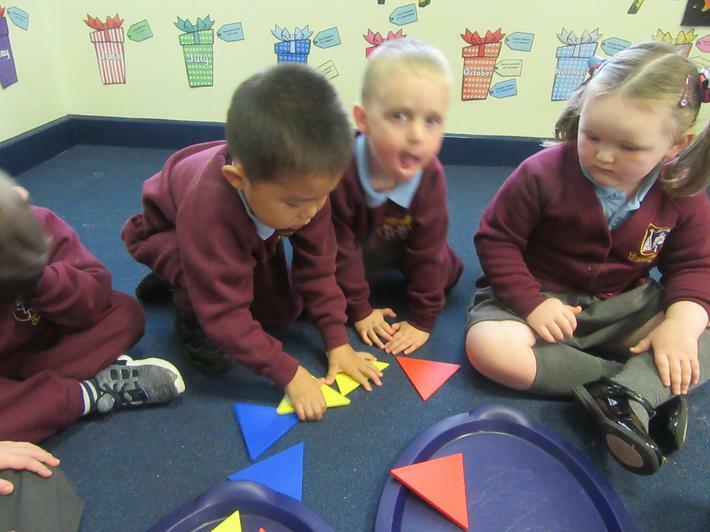 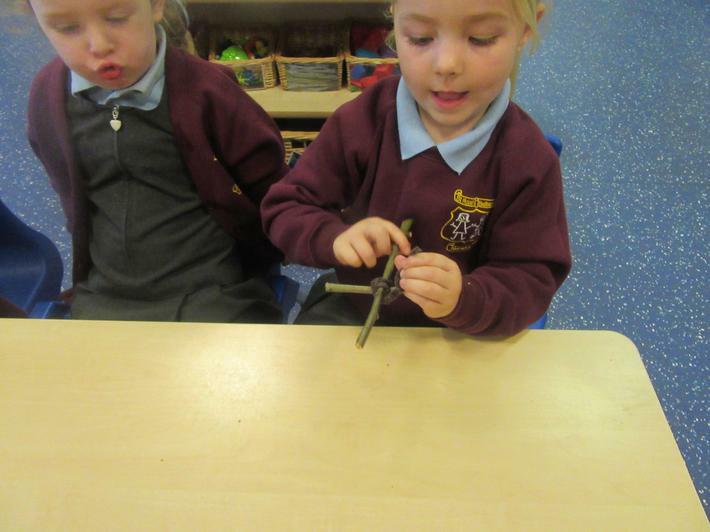 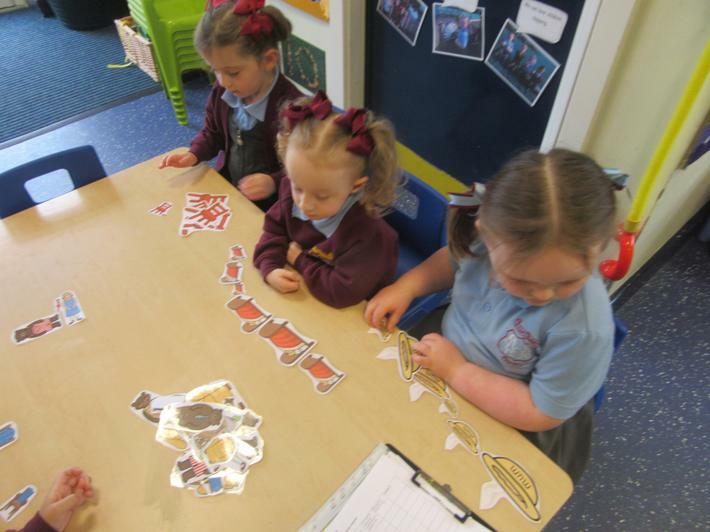 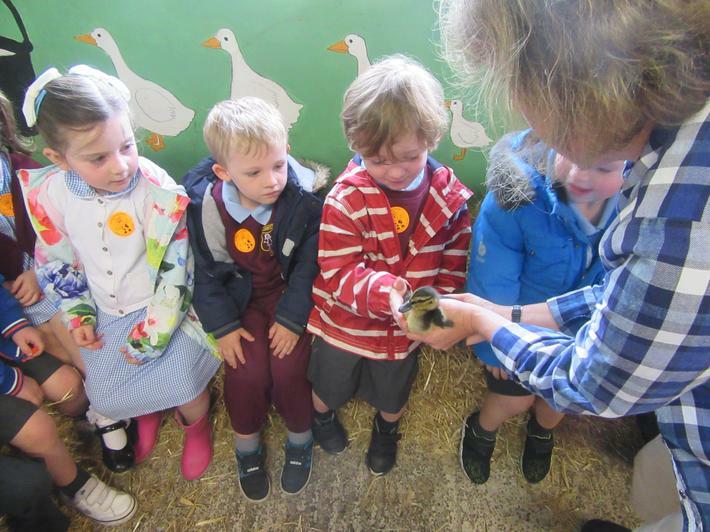 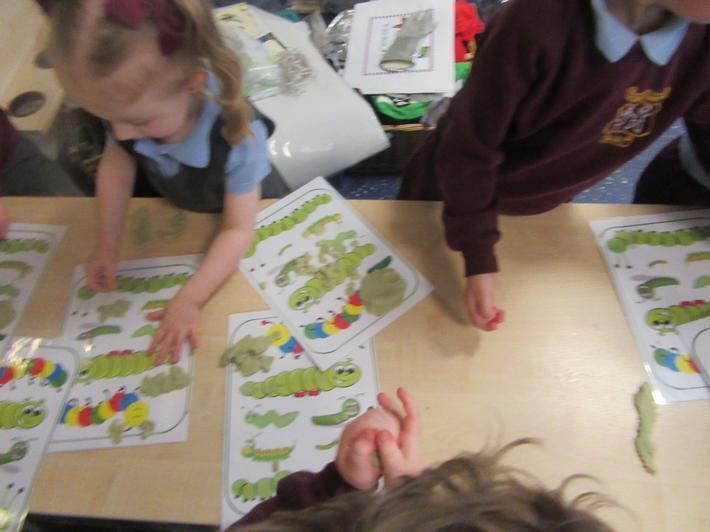 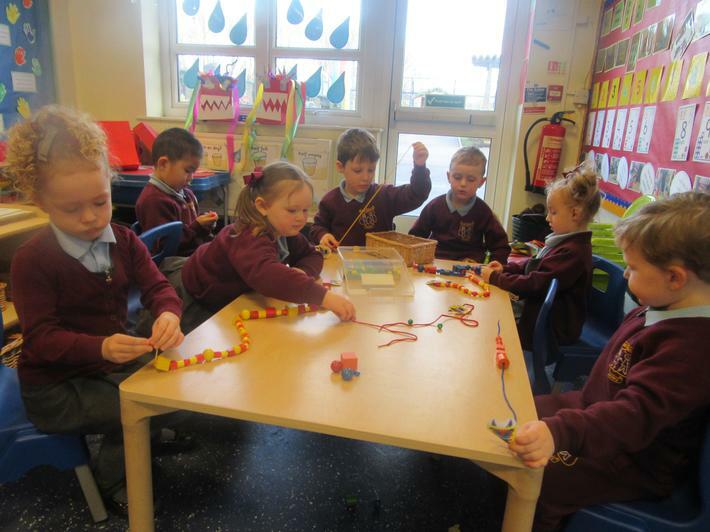 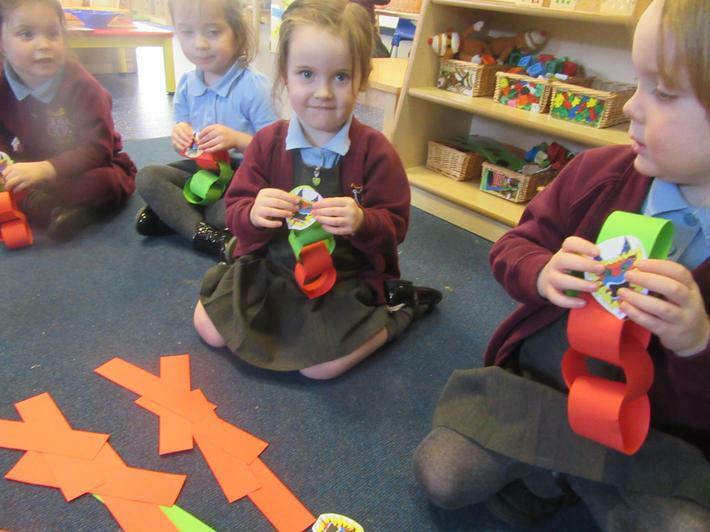 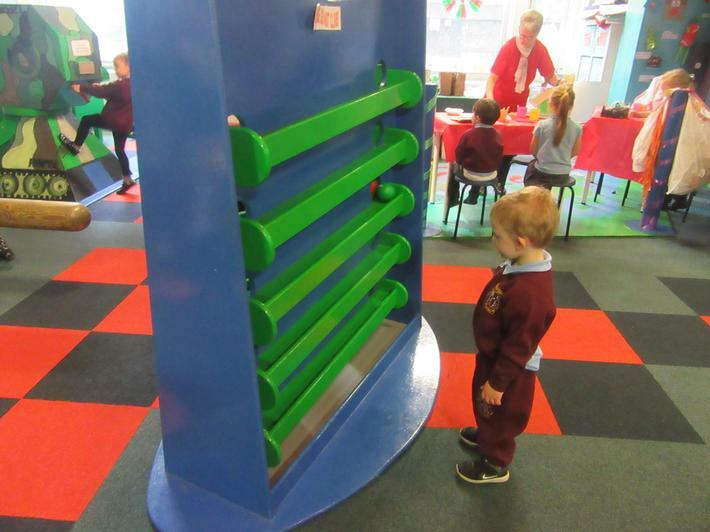 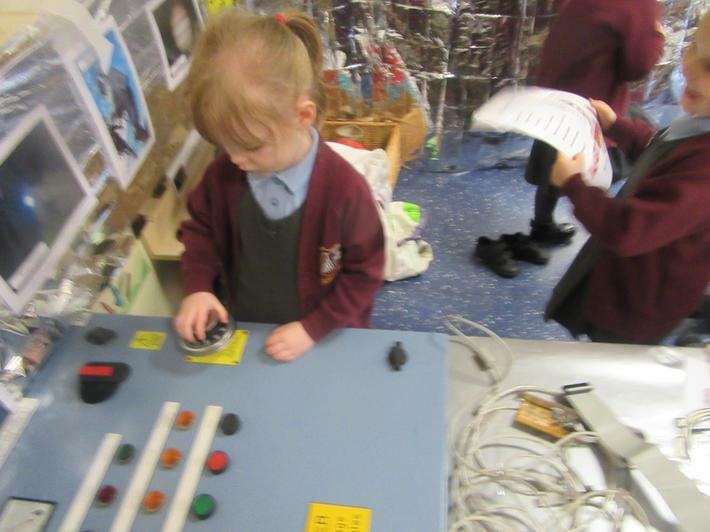 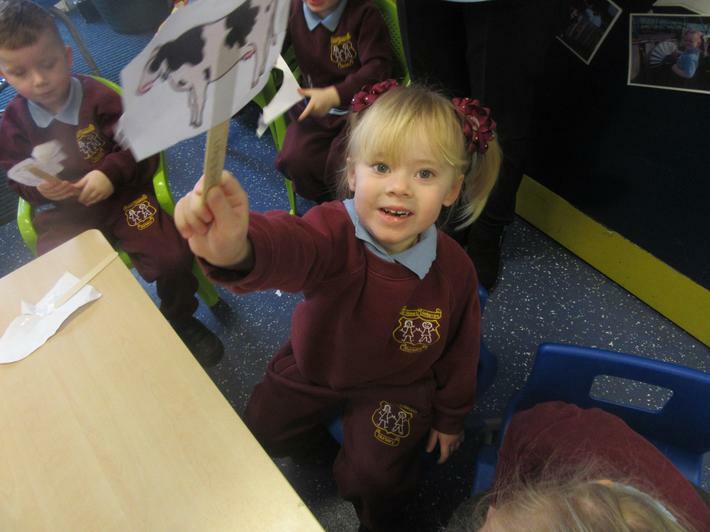 We were able to show them all the things we do in nursery.